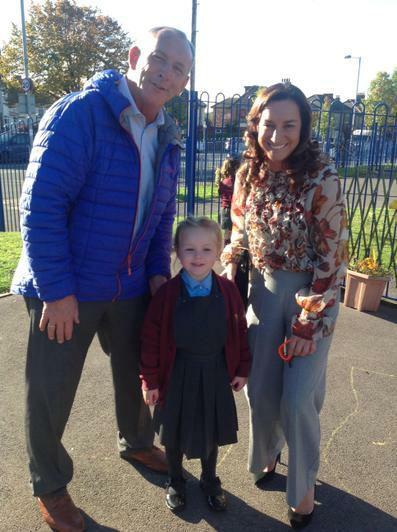 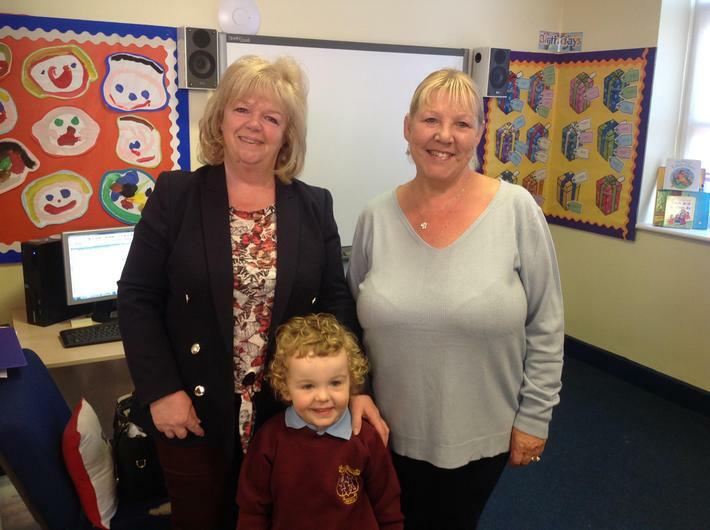 Miss Jones, Mrs Coyle and Mrs Briant welcome you to our website! 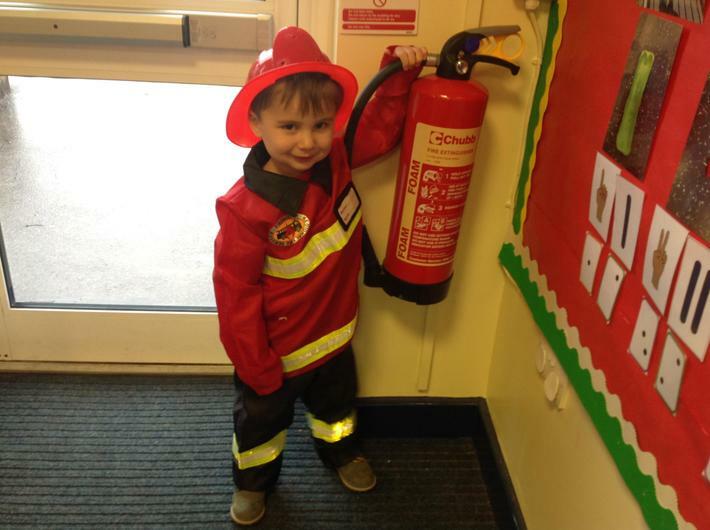 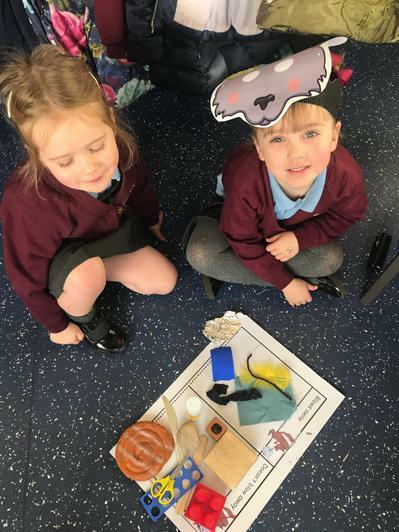 We will be adding lots of information and pictures throughout the year to share many of our exciting activities, special events and ‘wow’ moments of learning. 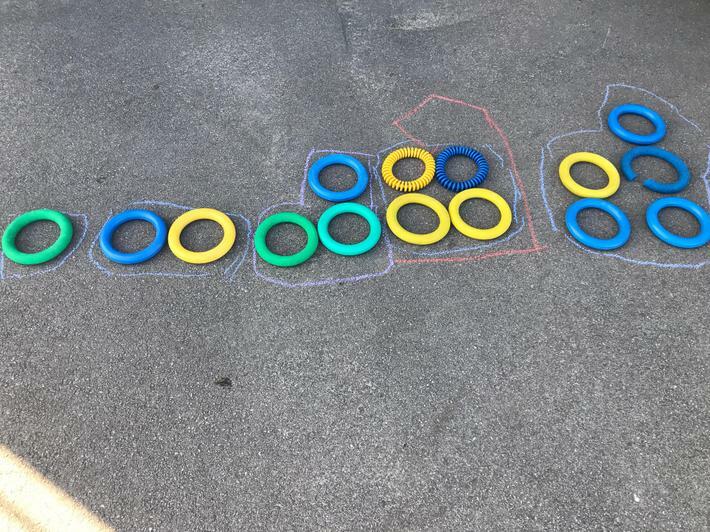 School starts with registration at 8:55am, please try to be prompt! 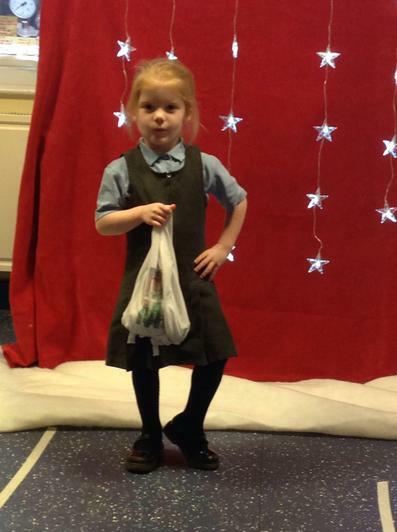 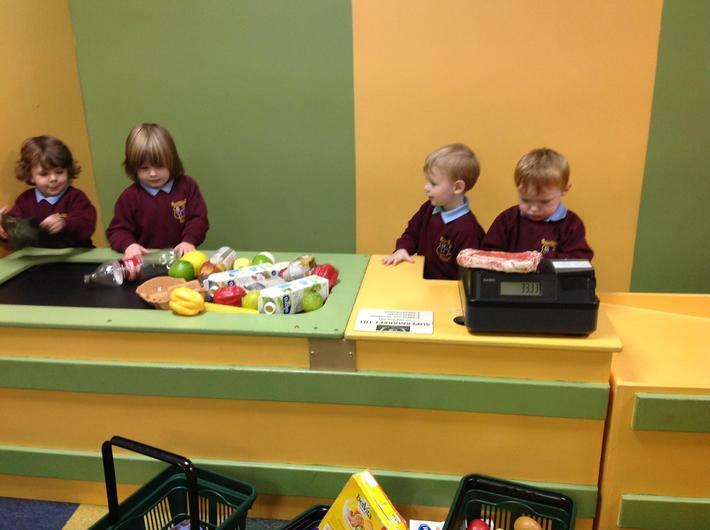 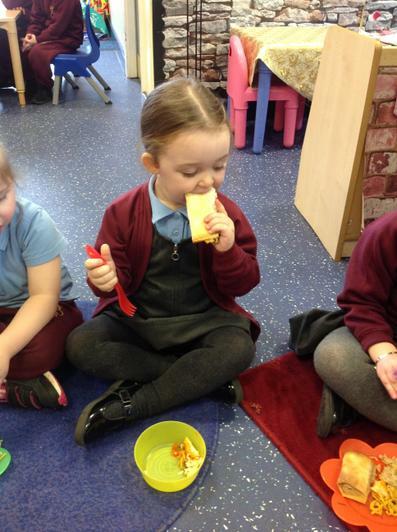 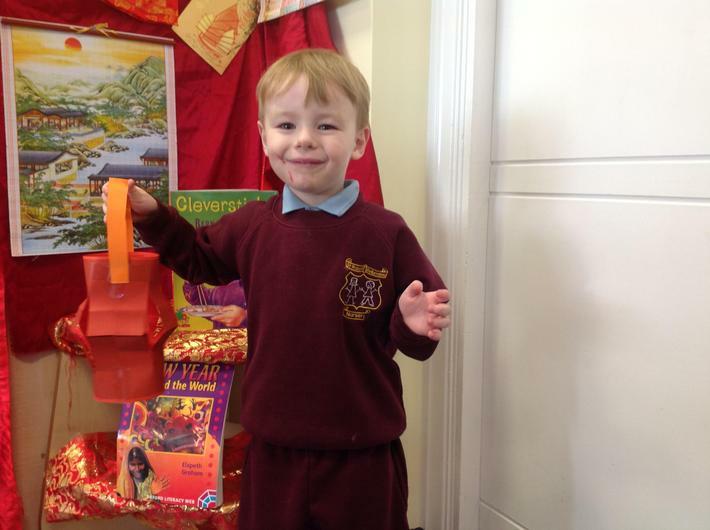 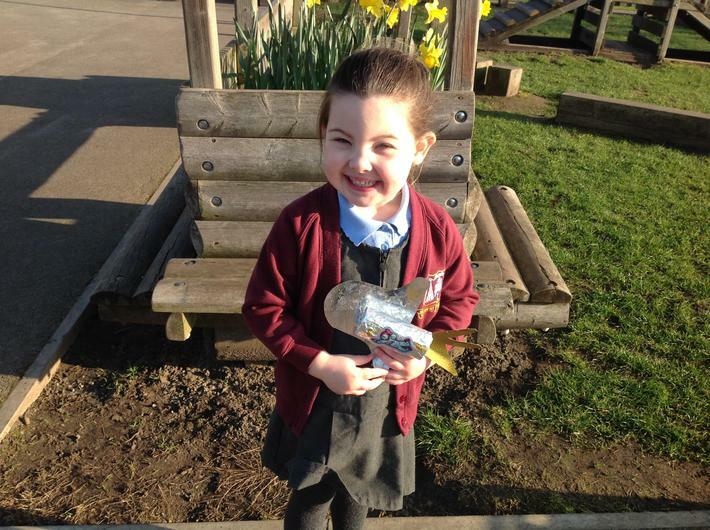 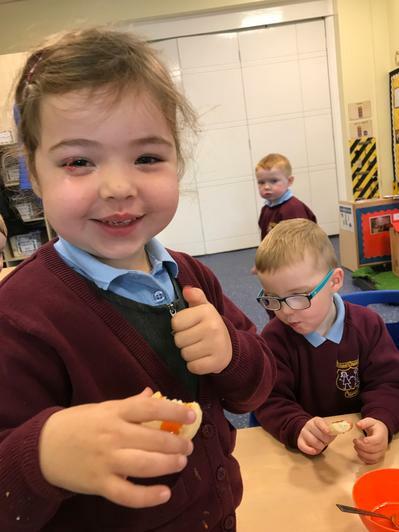 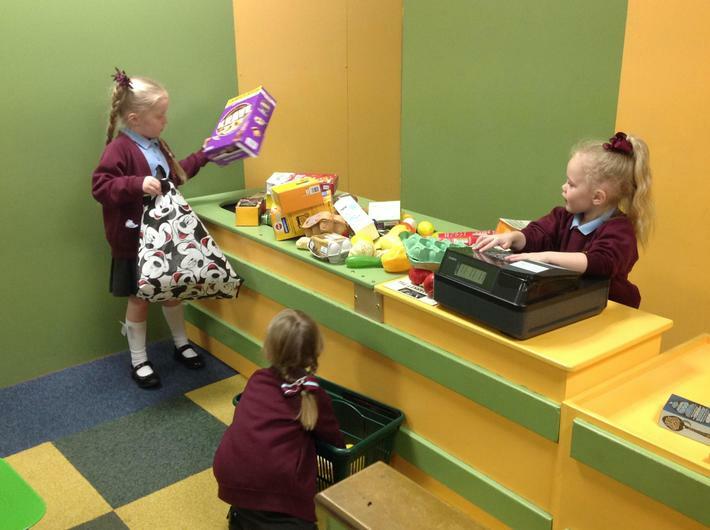 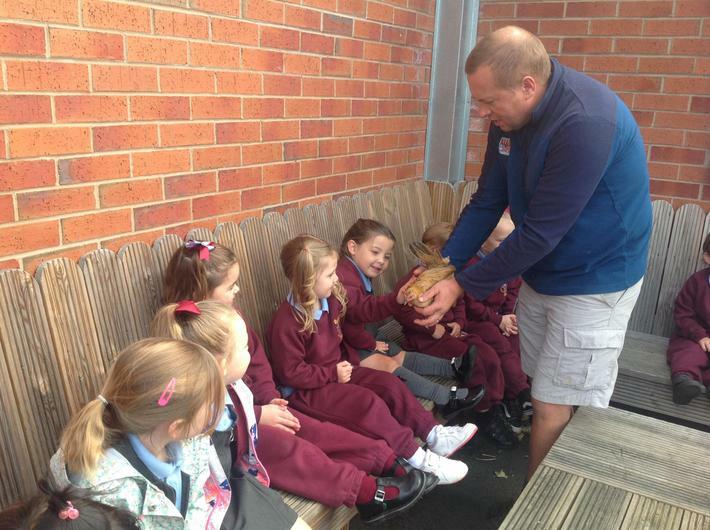 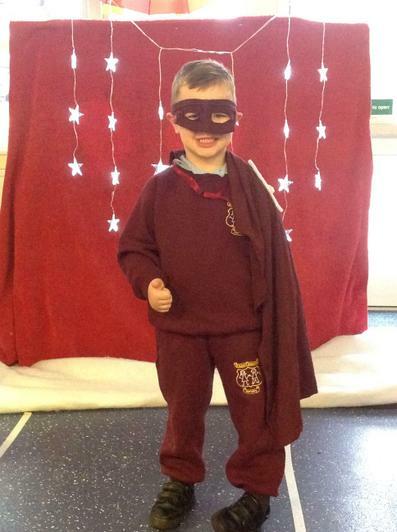 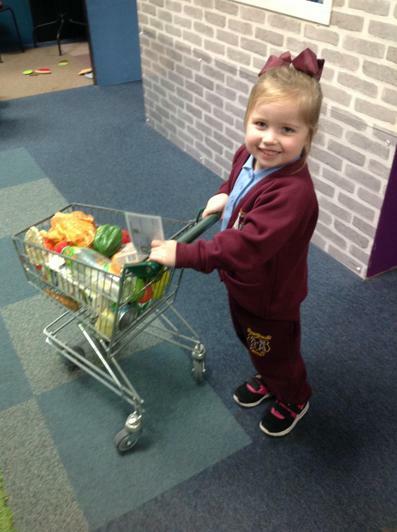 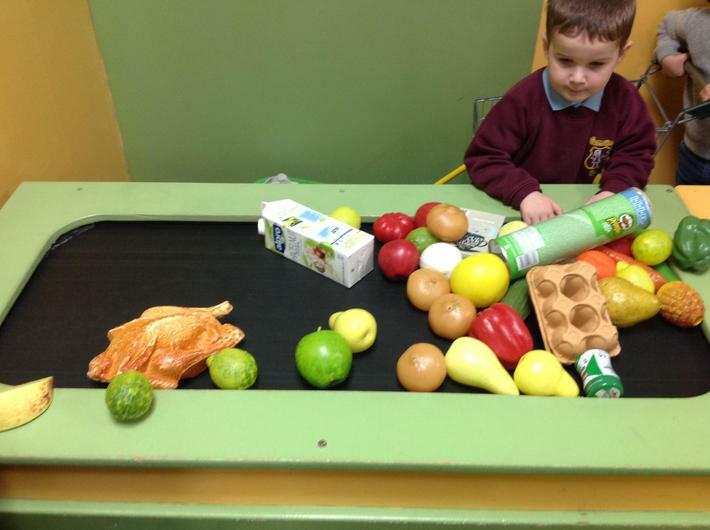 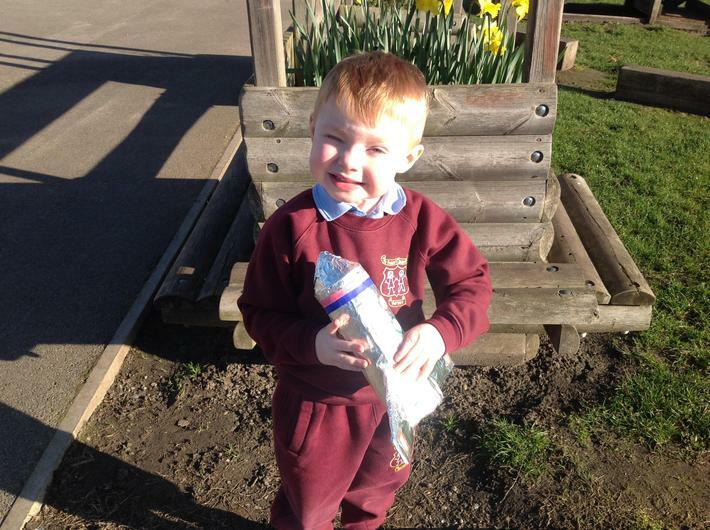 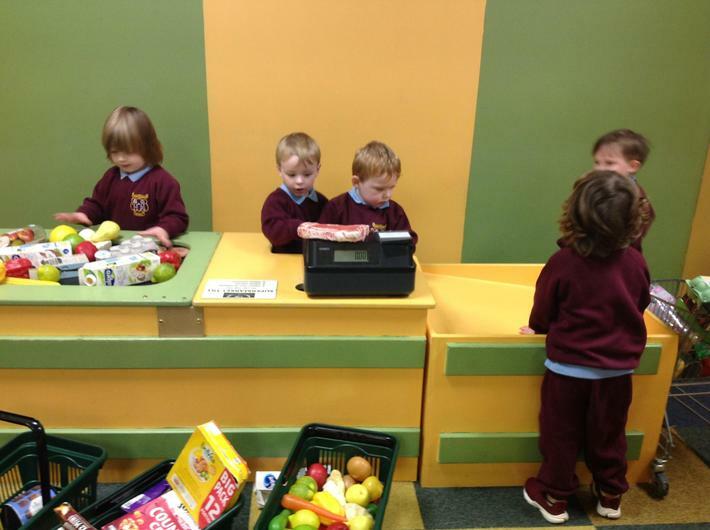 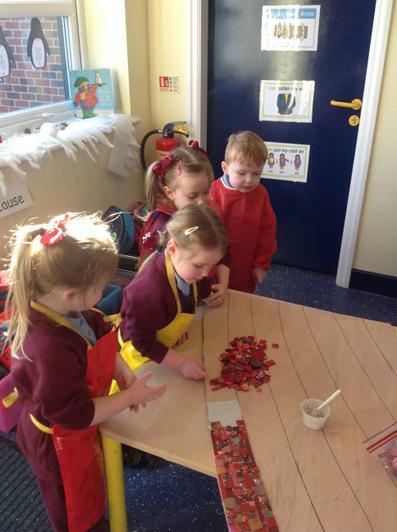 Snack money can be paid each week or for the half term, at £1.00 per week. 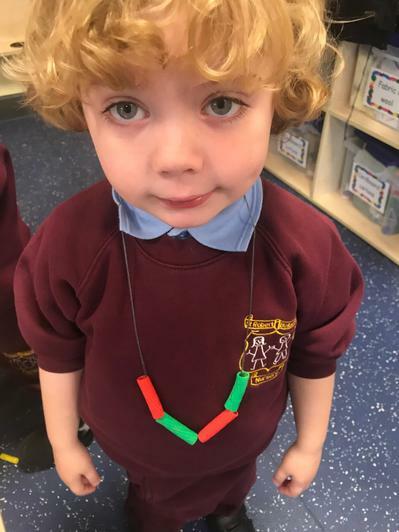 Please try to bring this in as promptly as possible! 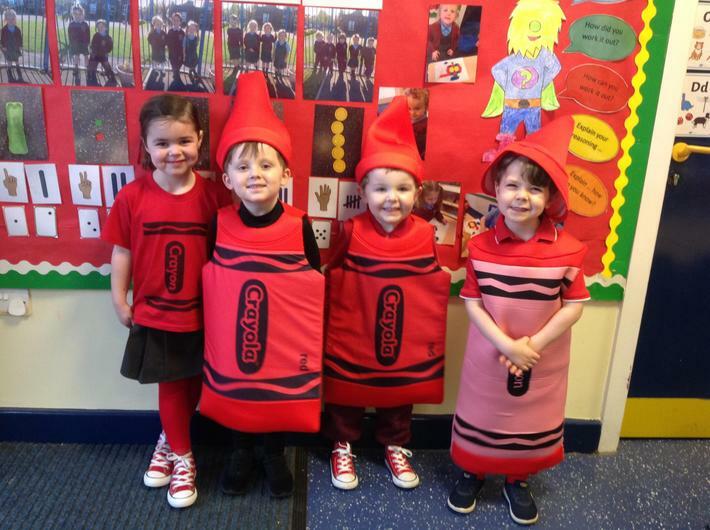 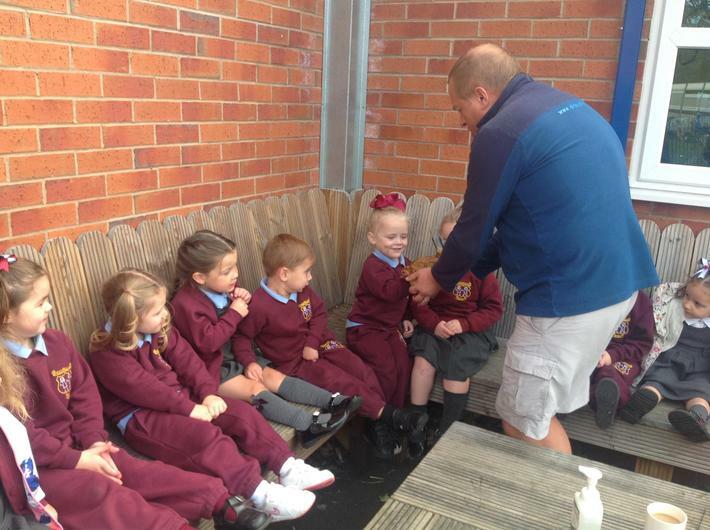 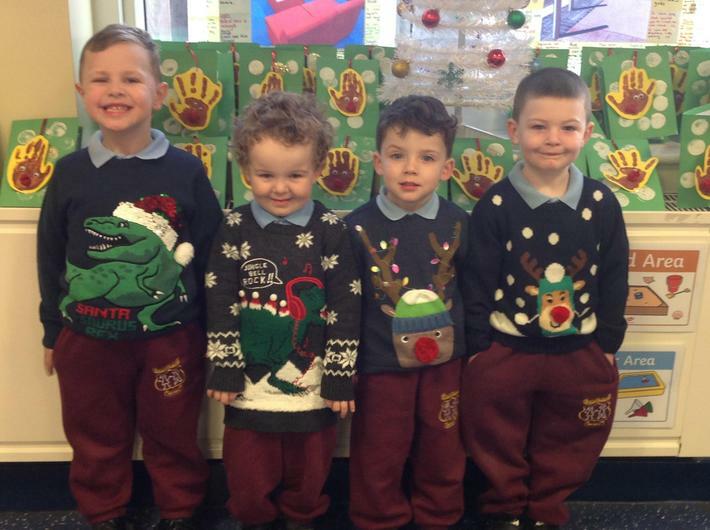 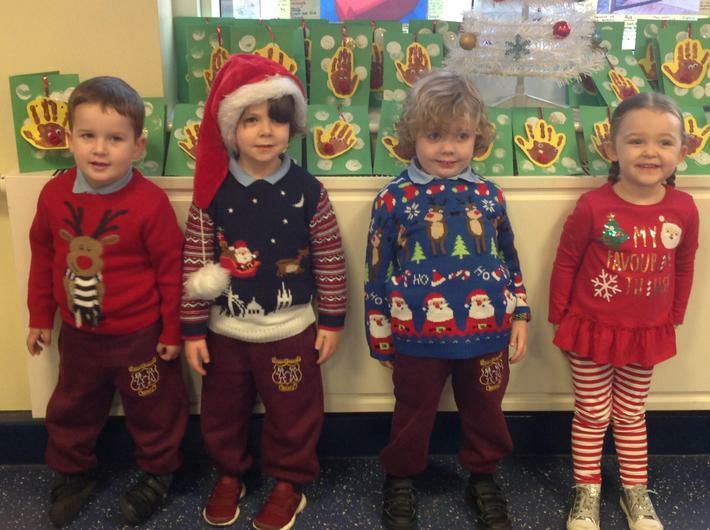 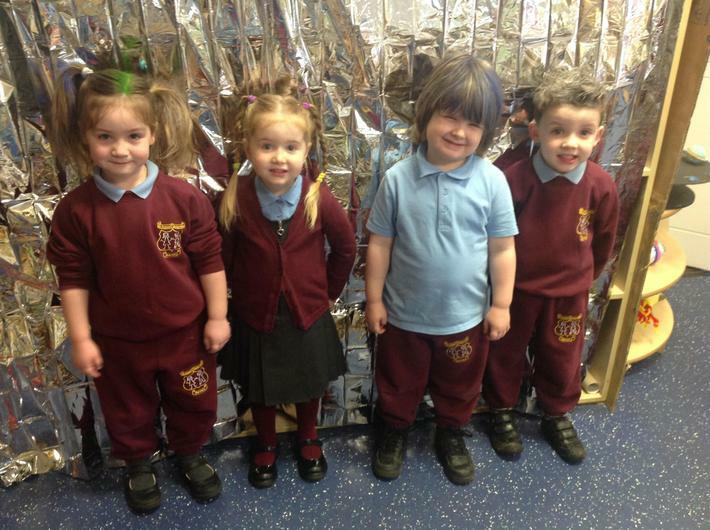 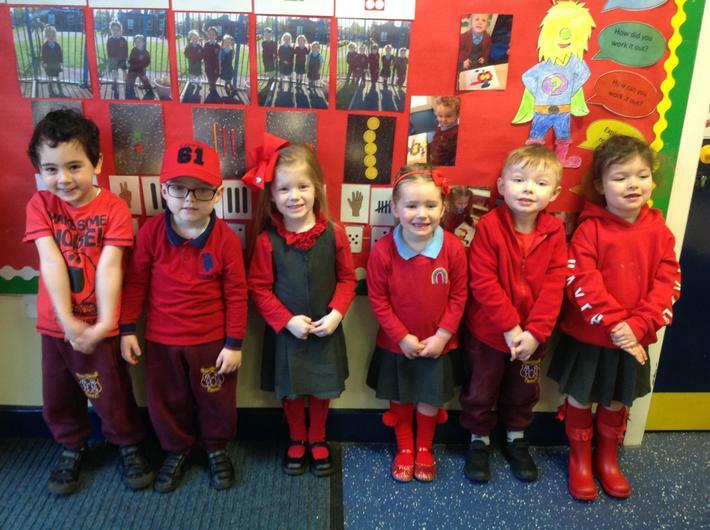 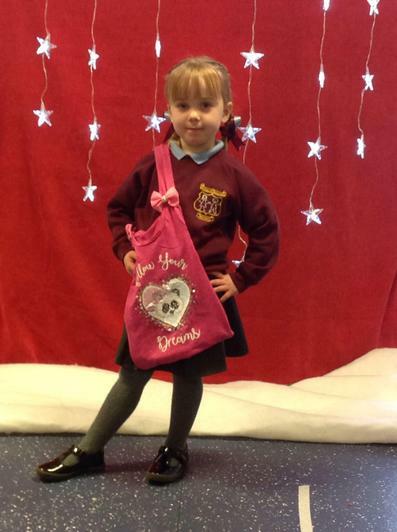 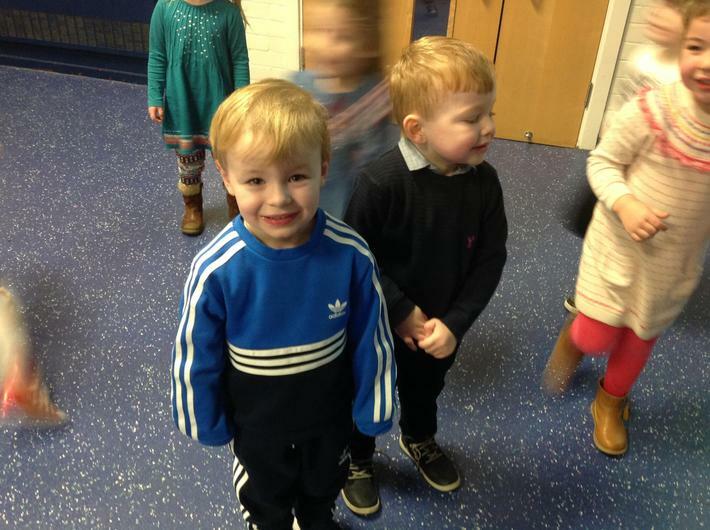 Please make sure that all of your child’s uniform and spare clothes (including shoes) have their full names in. 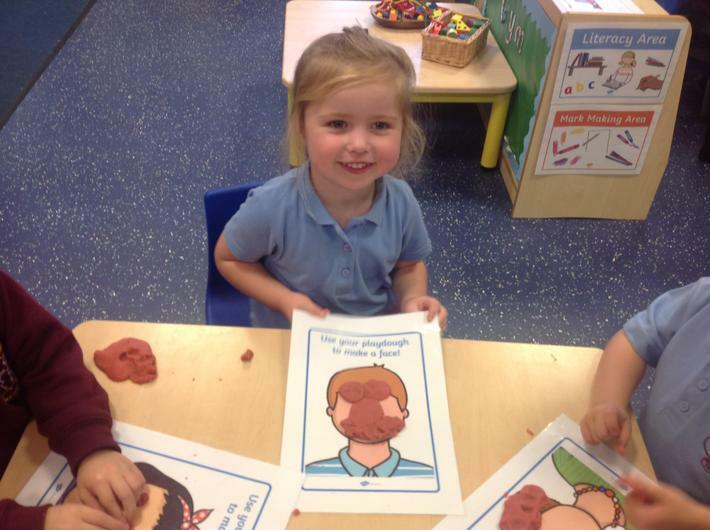 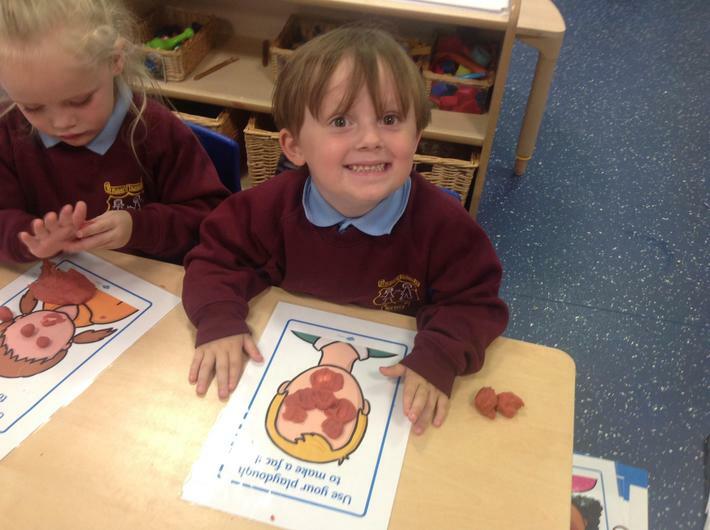 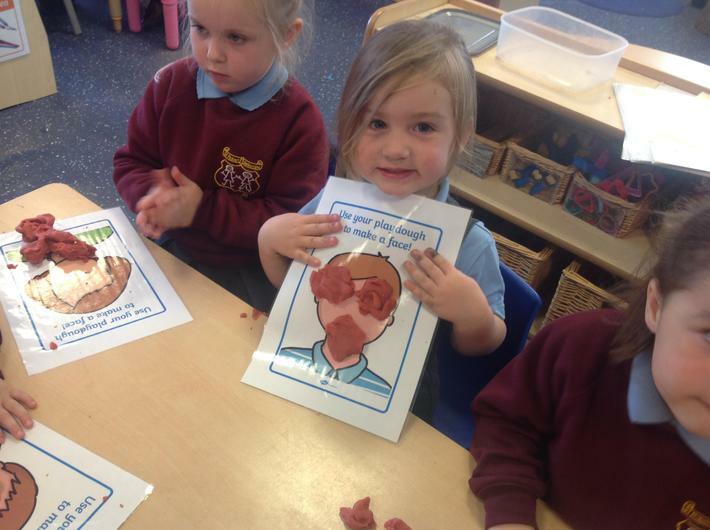 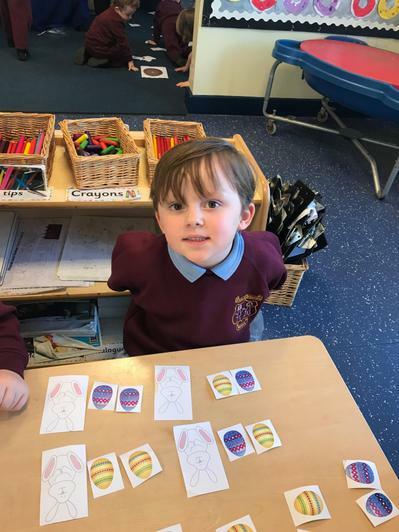 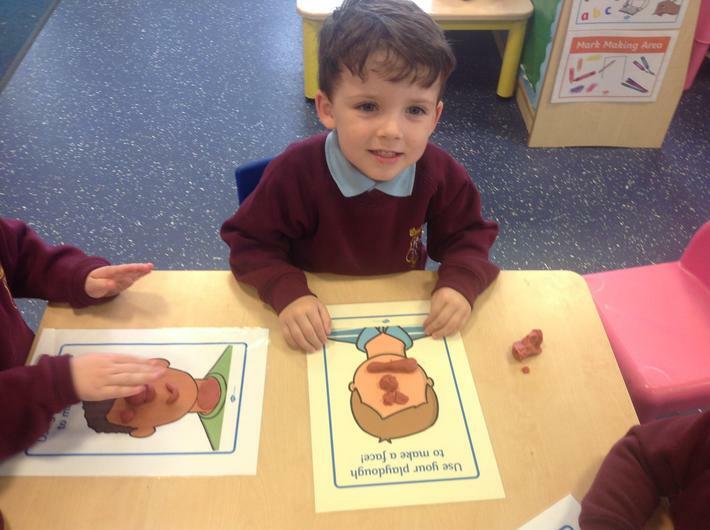 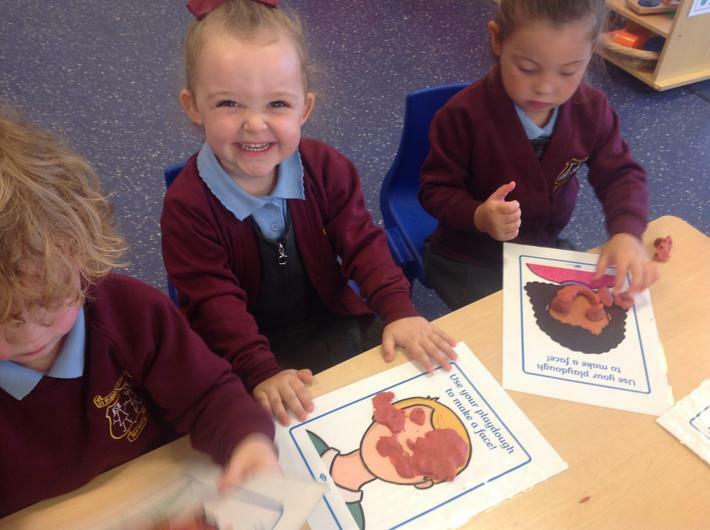 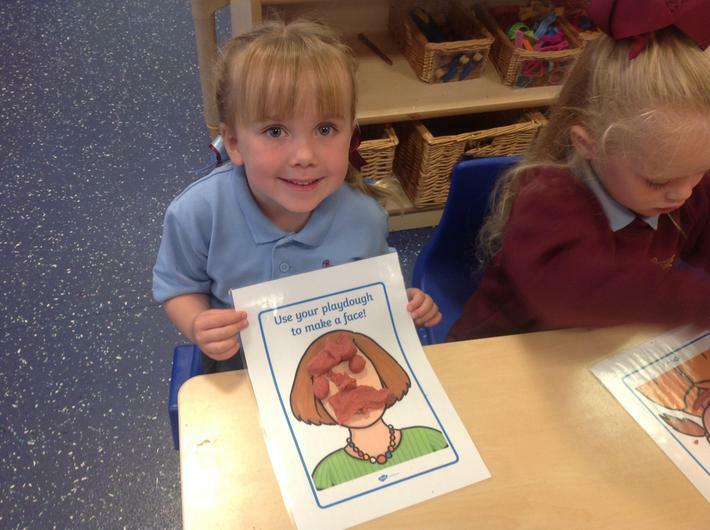 As part of our 'Ourselves' topic, the children all studied their own faces and thought about their features and how they could use these to make different facial expressions. 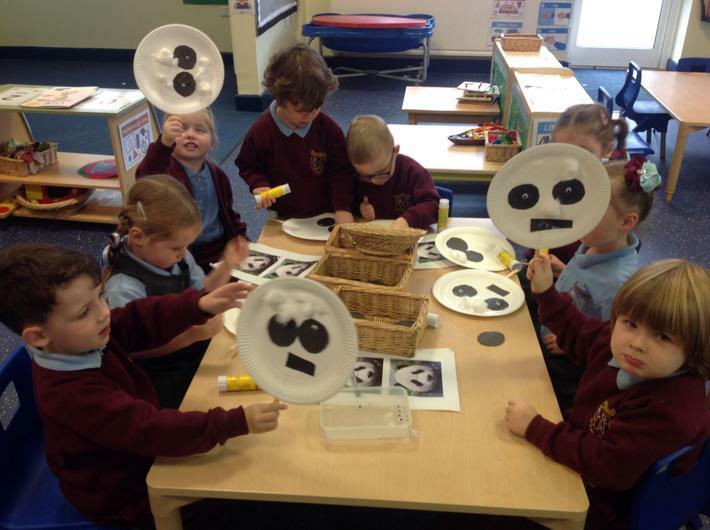 By looking in mirrors, they watched as their faces changed and they then talked about what emotion this revealed. 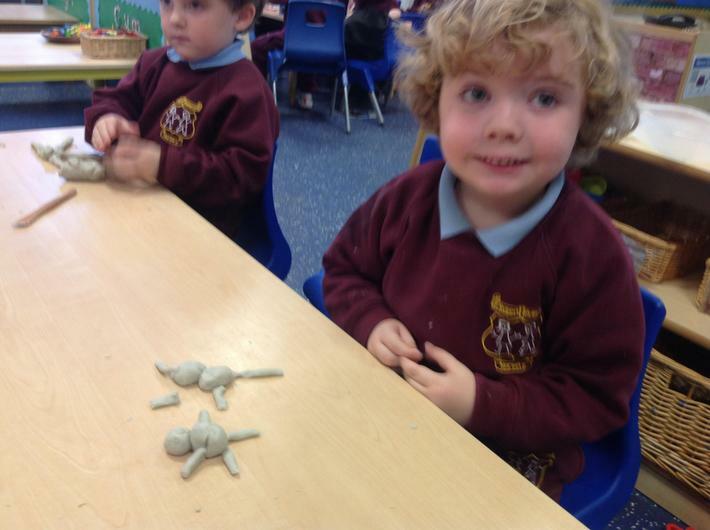 Afterwards they made play dough models and began to think about times when they have experienced this emotion. 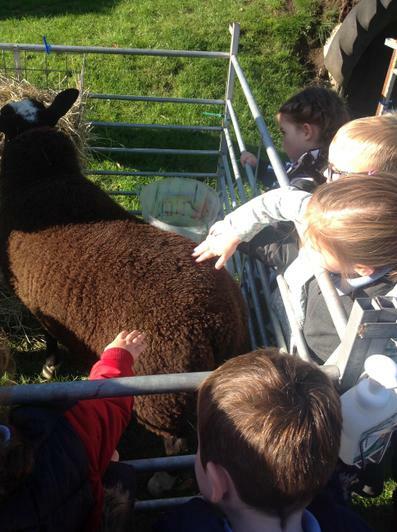 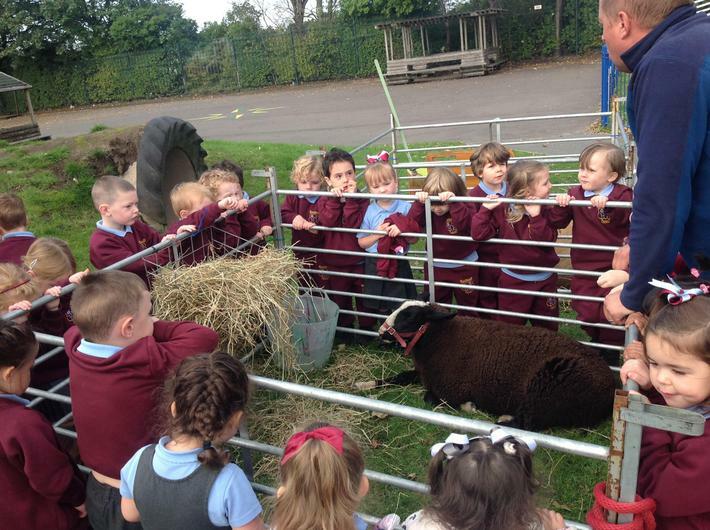 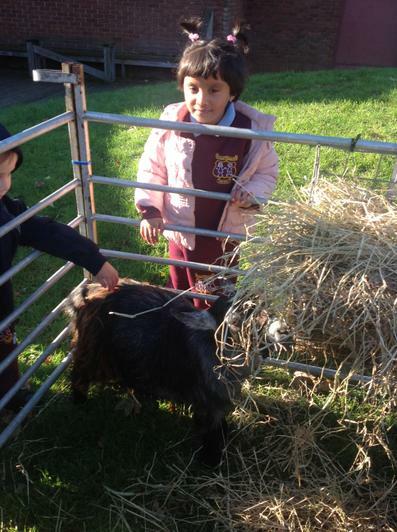 Today we had a very special day as we were surprised by the arrival of the farm! 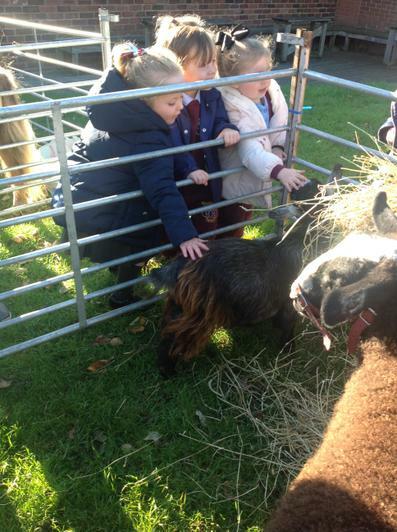 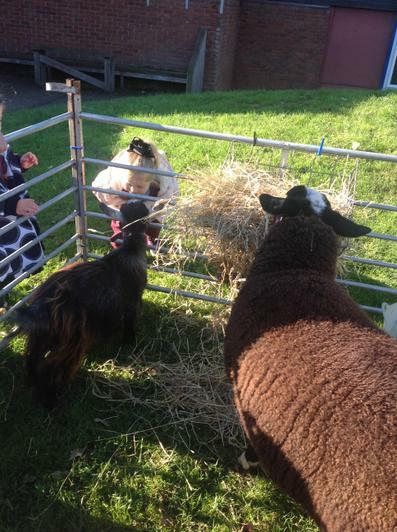 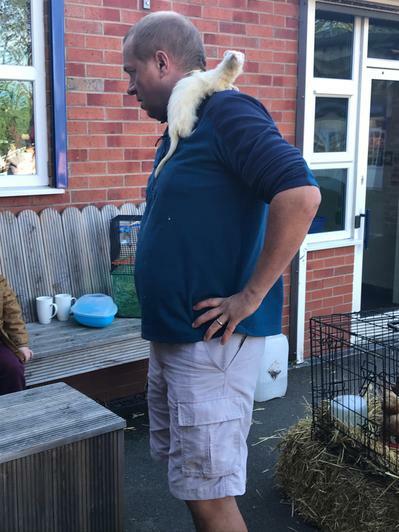 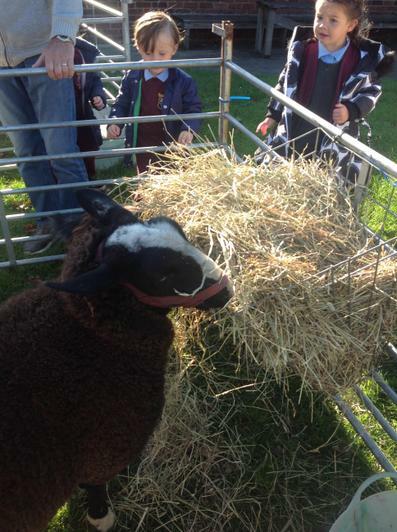 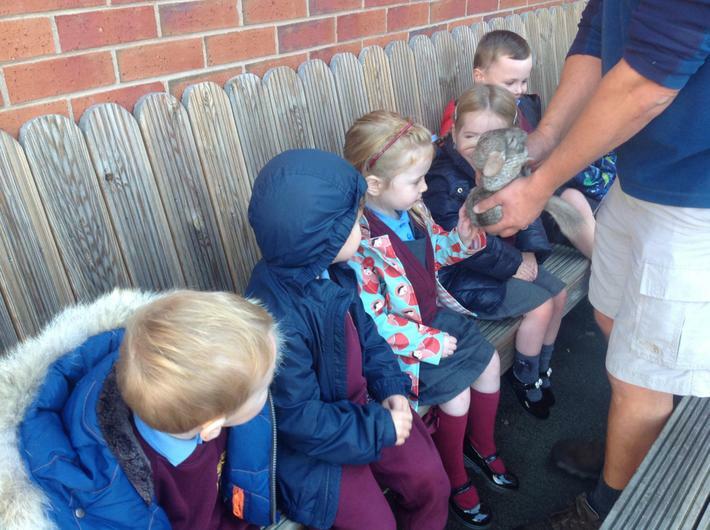 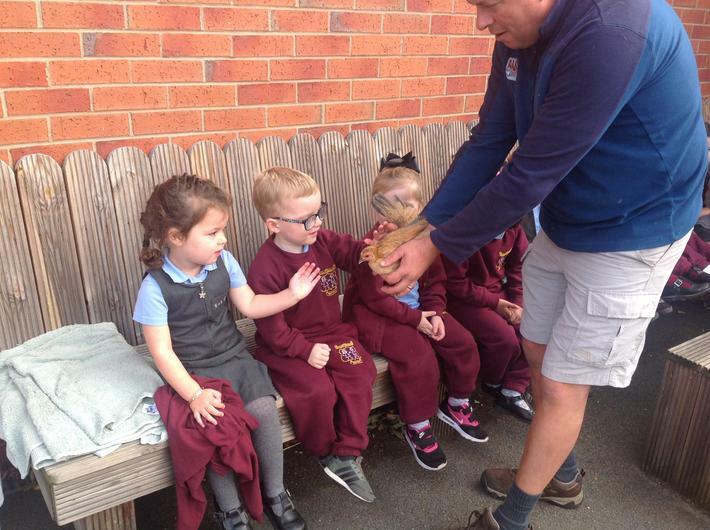 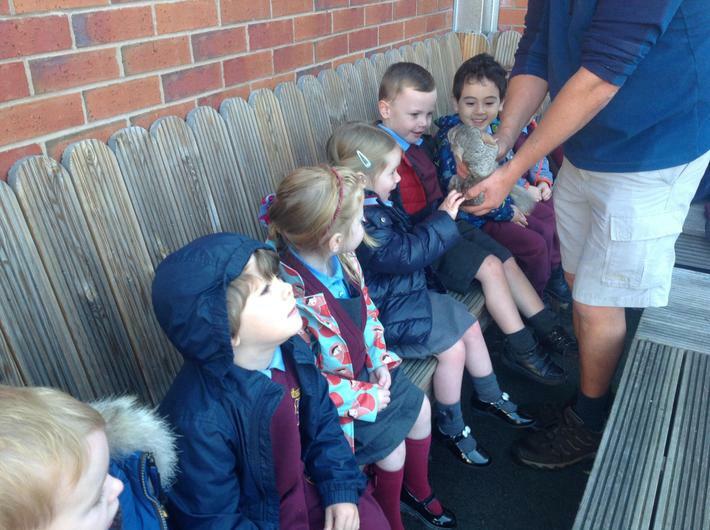 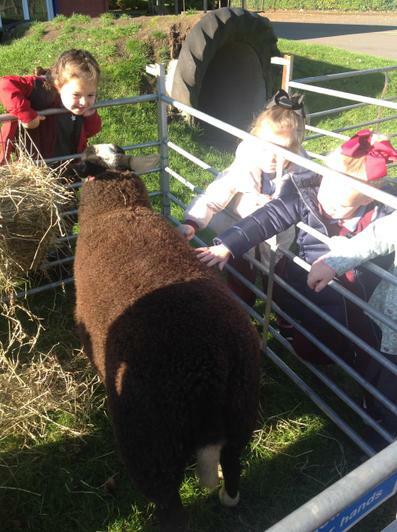 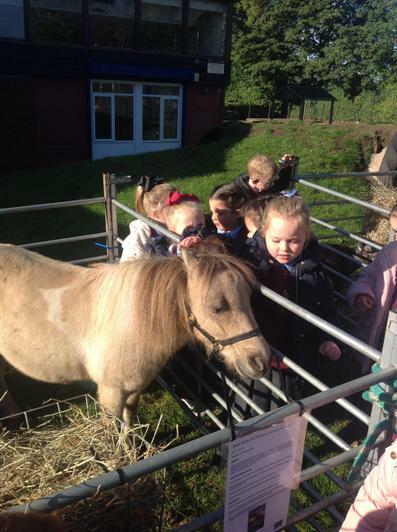 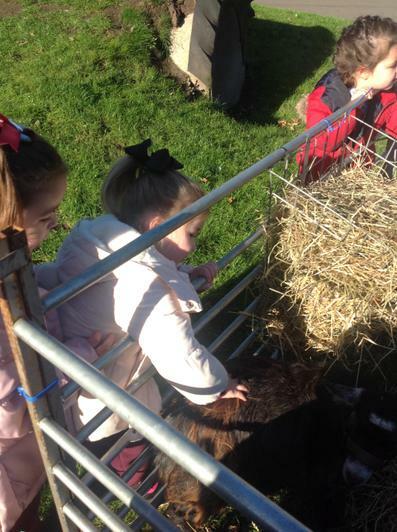 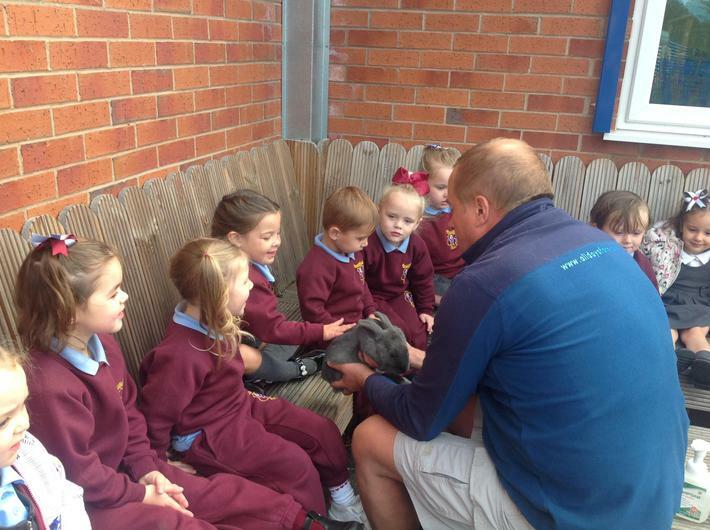 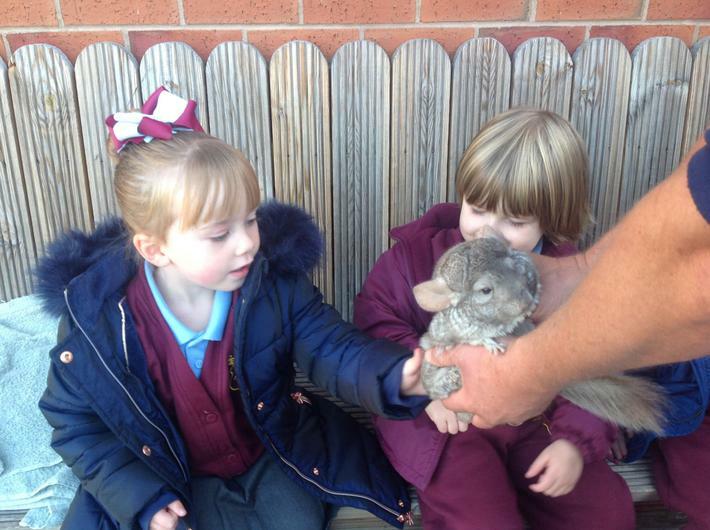 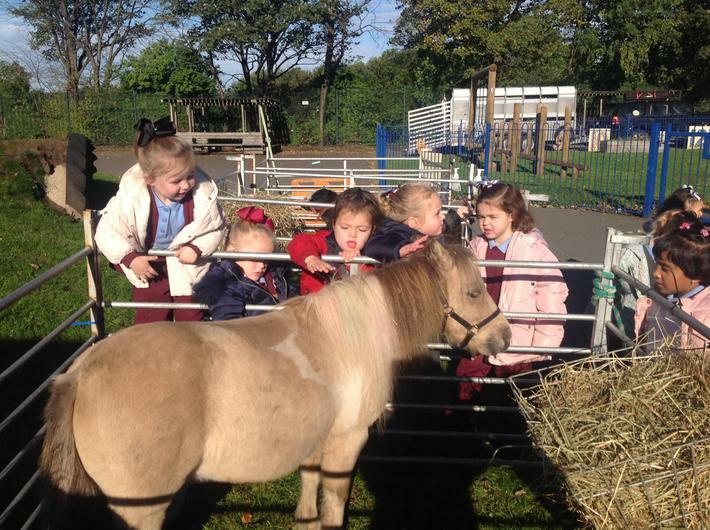 We got the chance to meet and stroke a horse, goat, sheep, pigs, guinea pigs, rabbits, ferrets and even a snake! 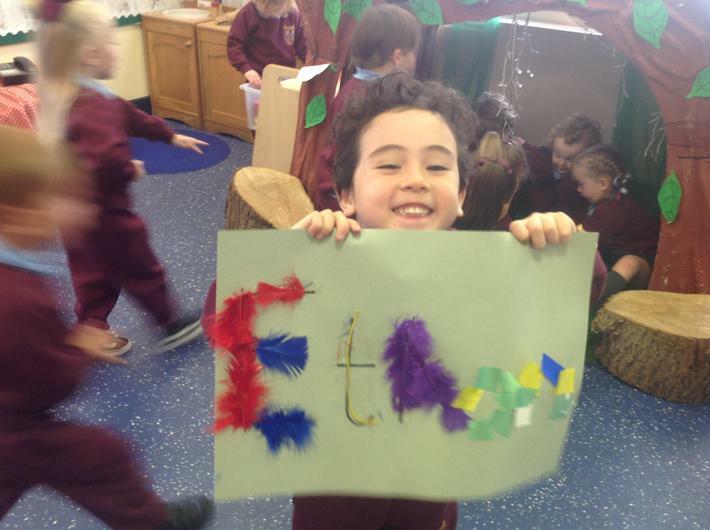 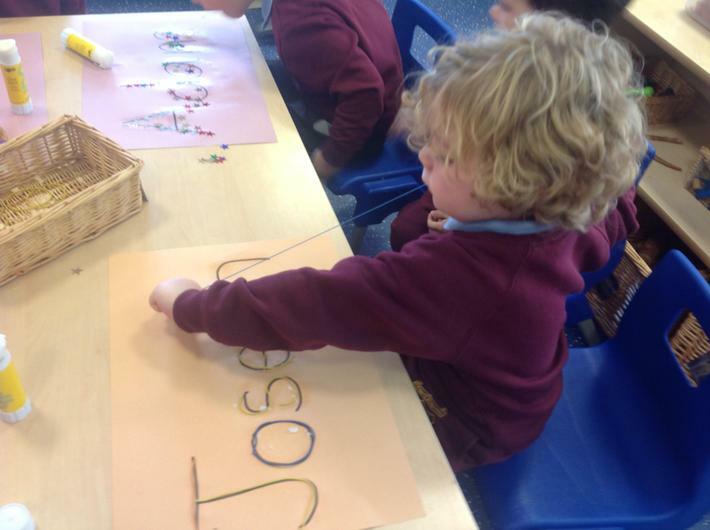 We have been thinking about what makes us so special and how our names are special to us. 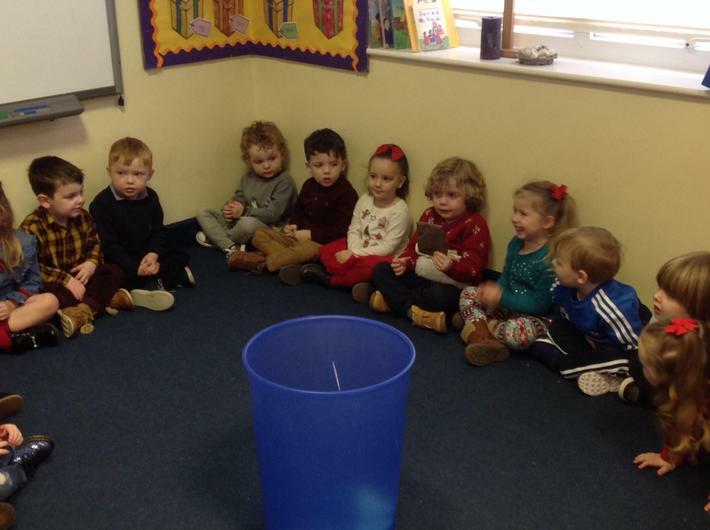 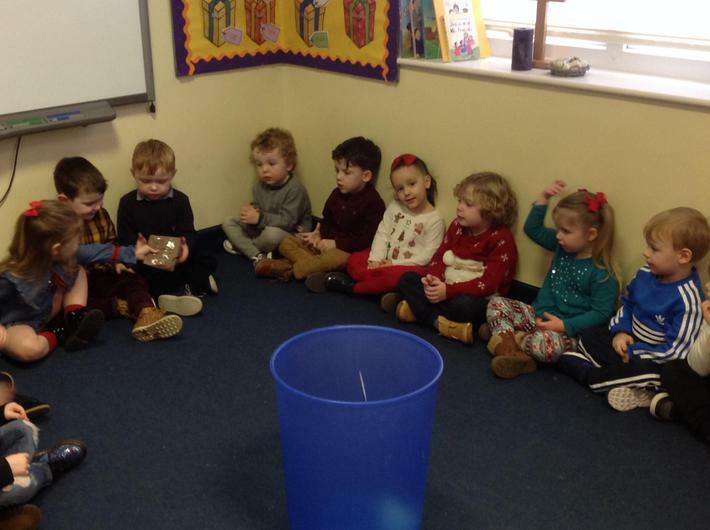 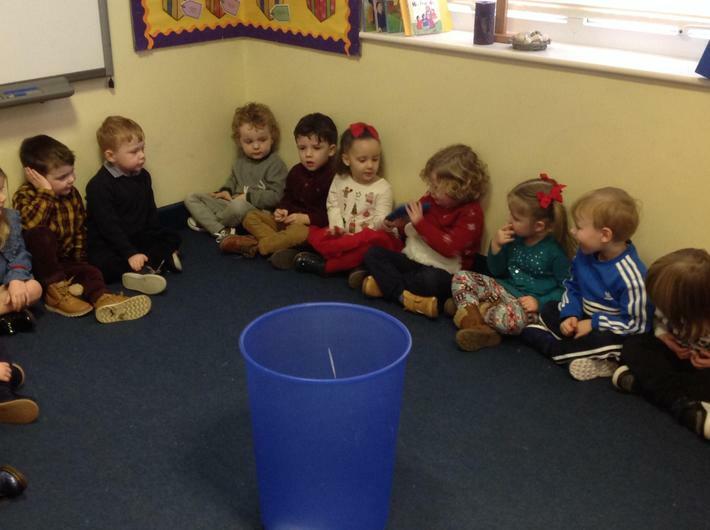 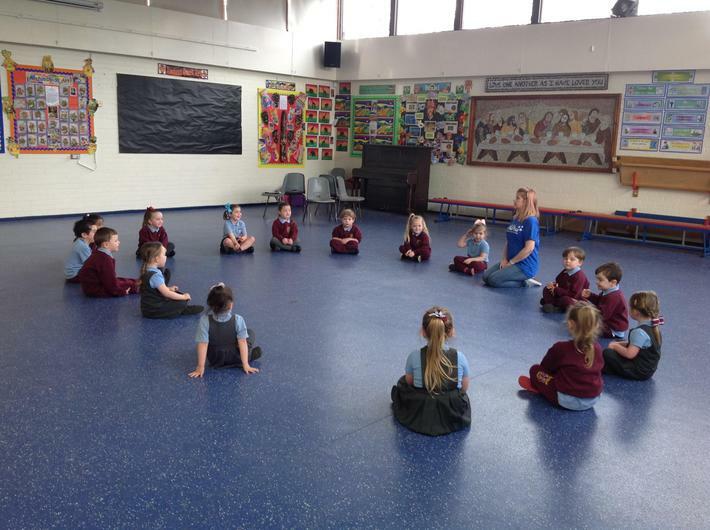 We also been using circle time to explore why God loves us all so much. 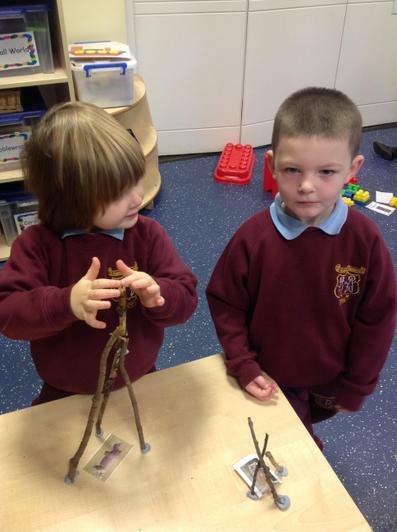 We have been using the language of big and small this week. 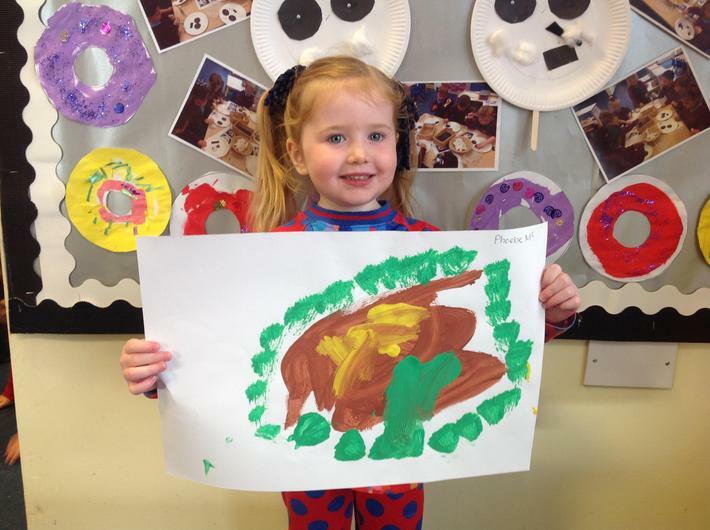 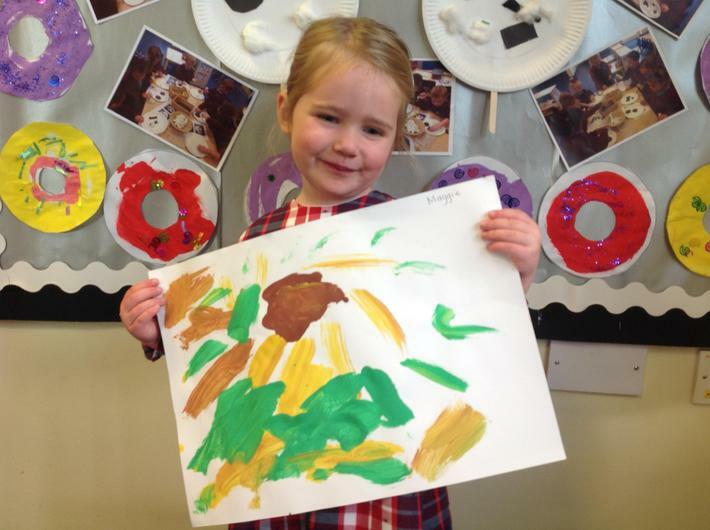 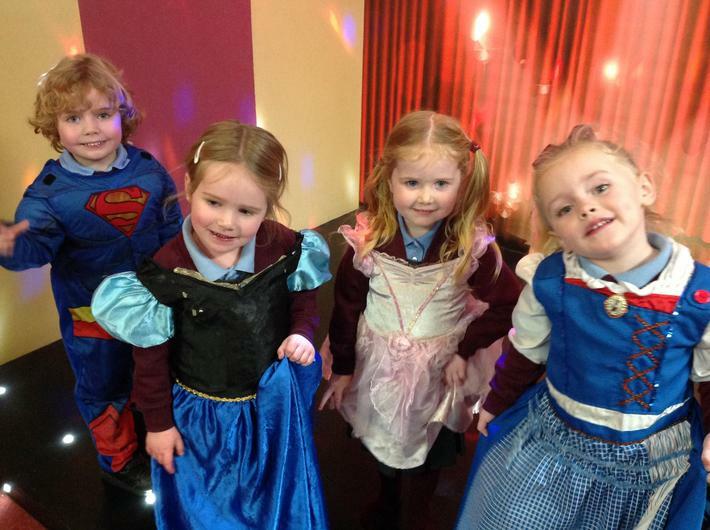 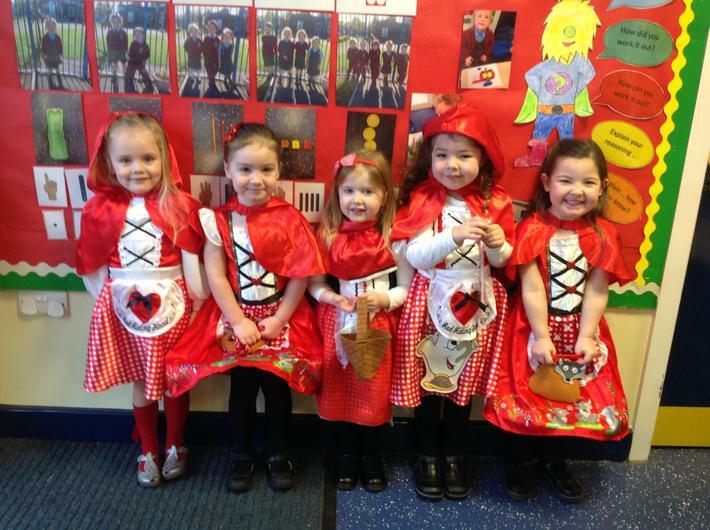 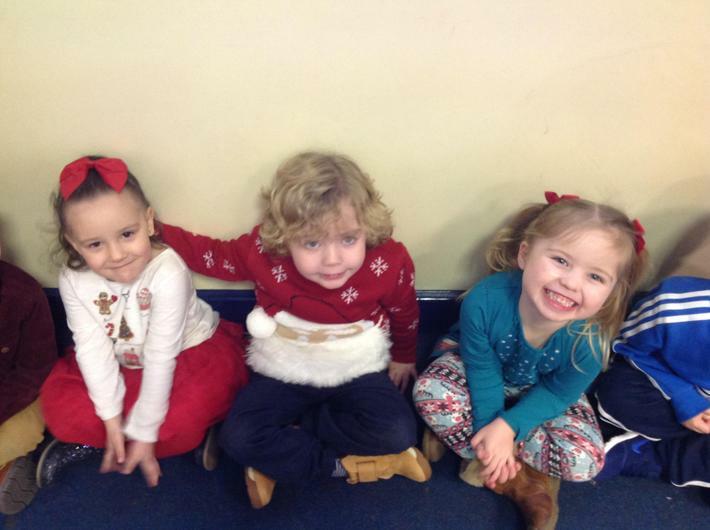 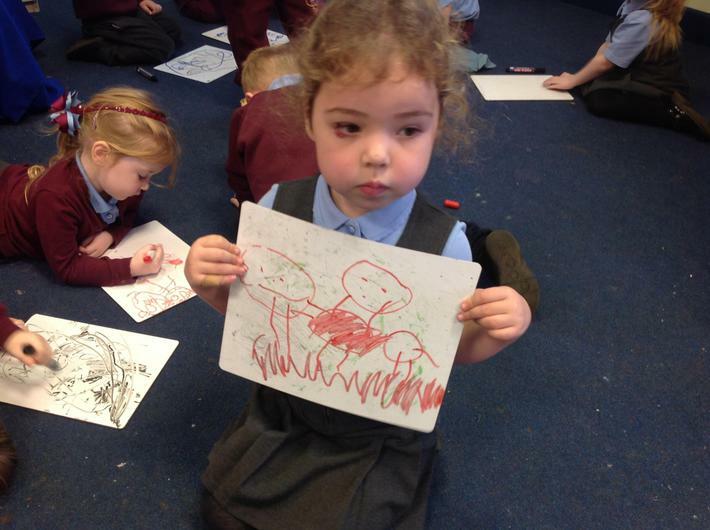 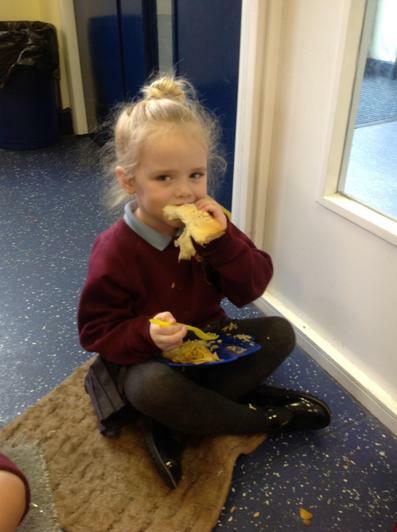 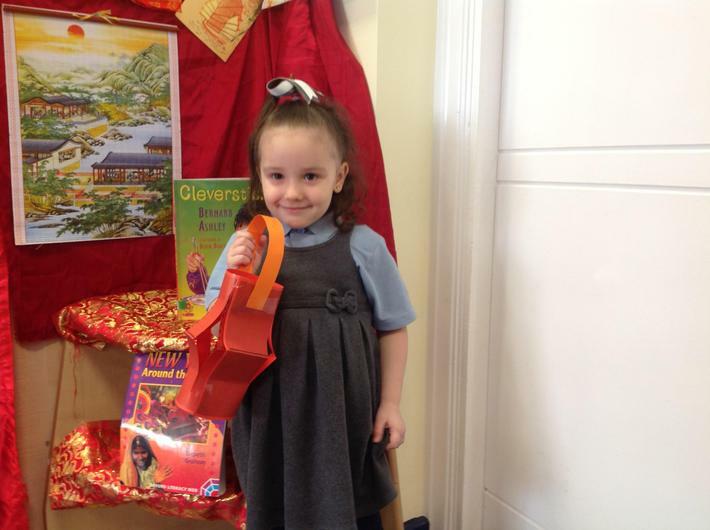 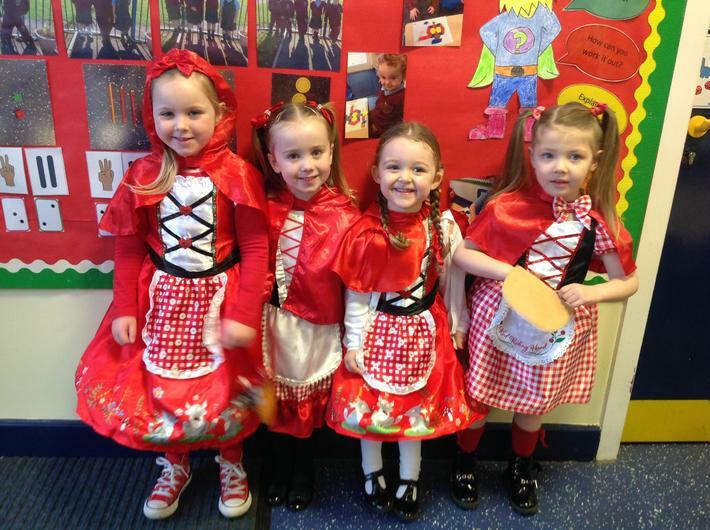 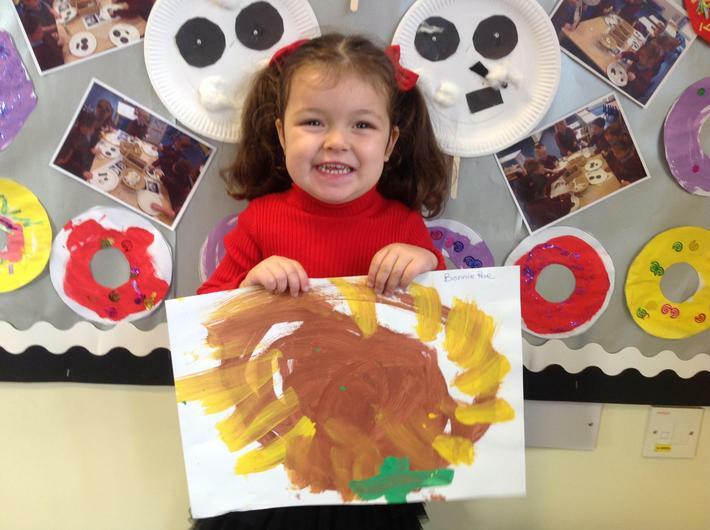 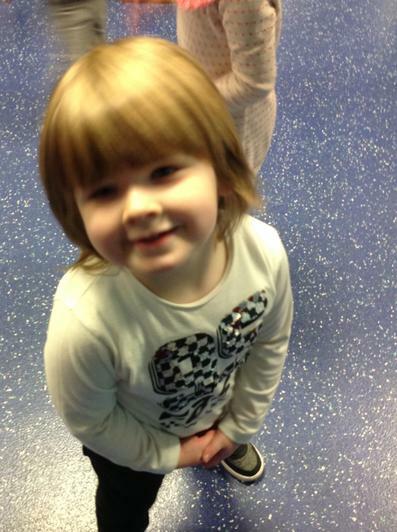 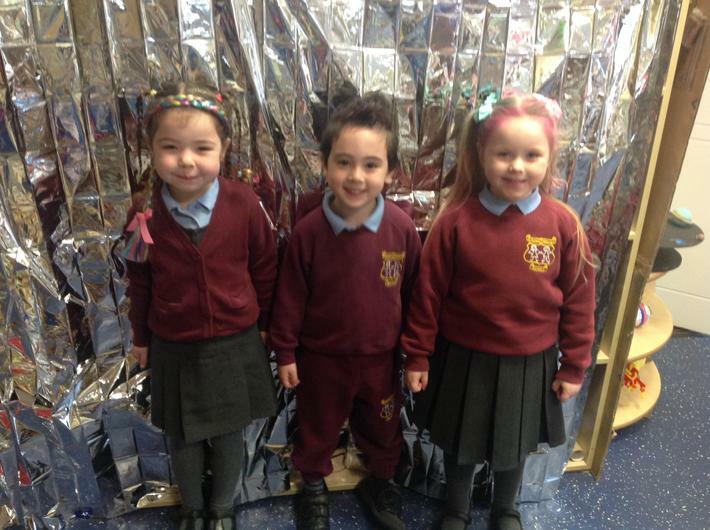 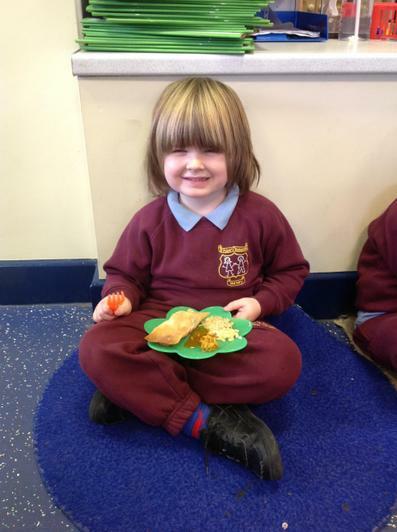 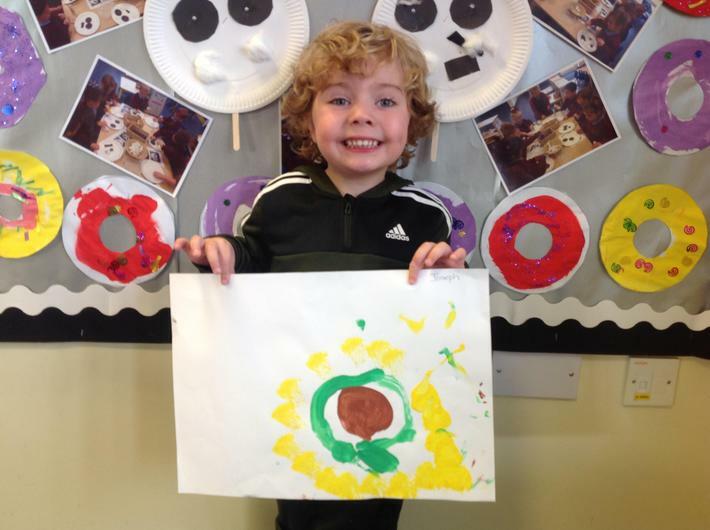 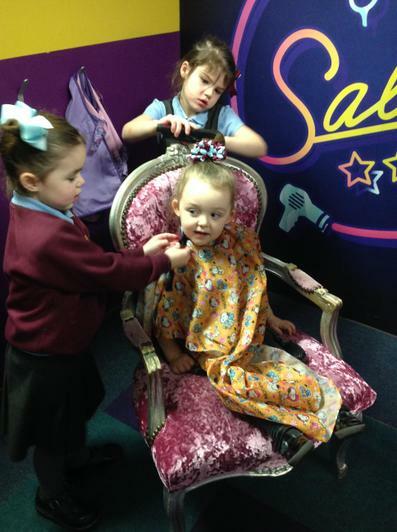 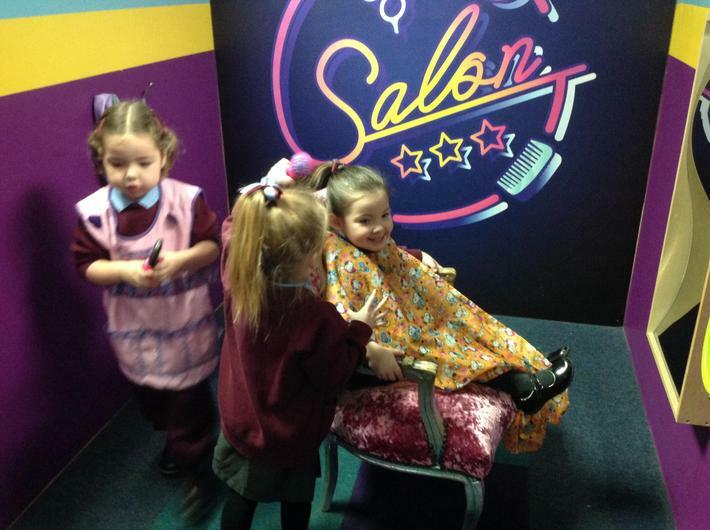 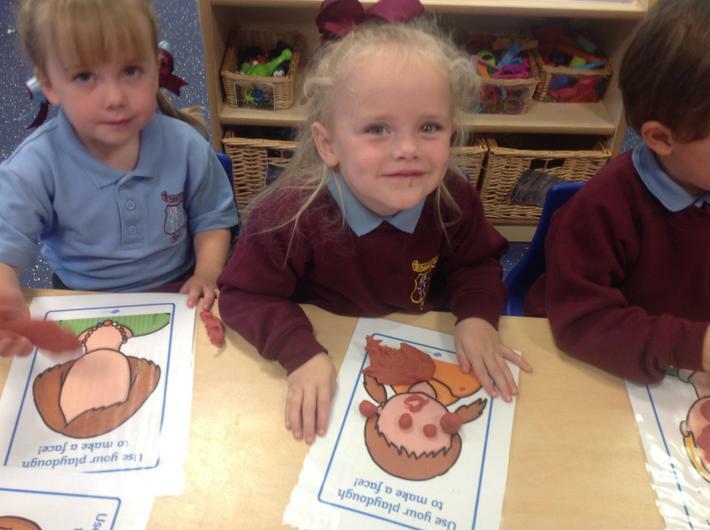 This links to our story of 'Goldilocks and the Three Bears'. 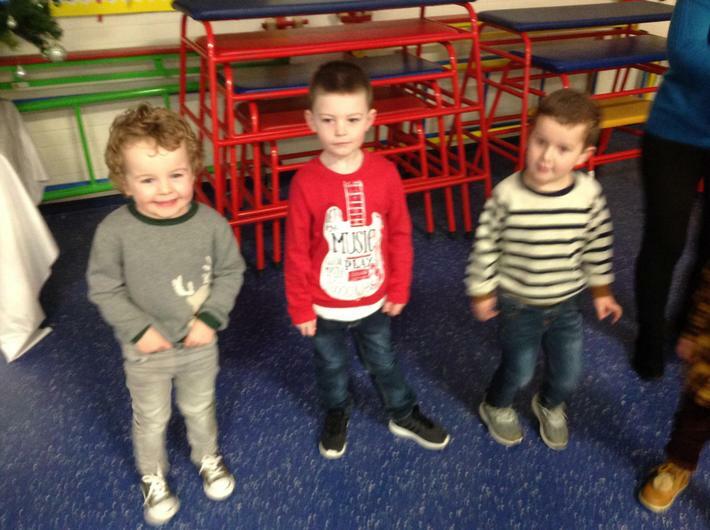 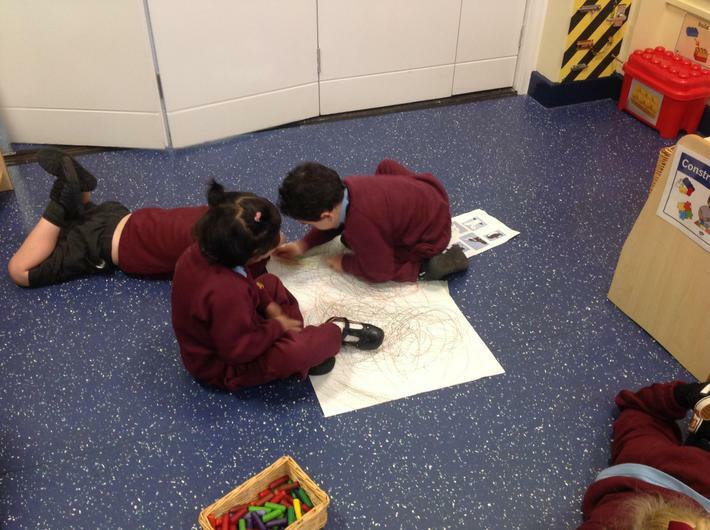 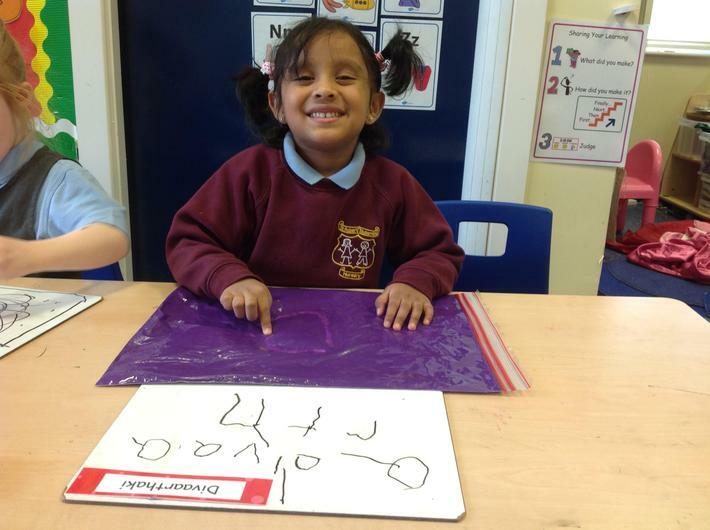 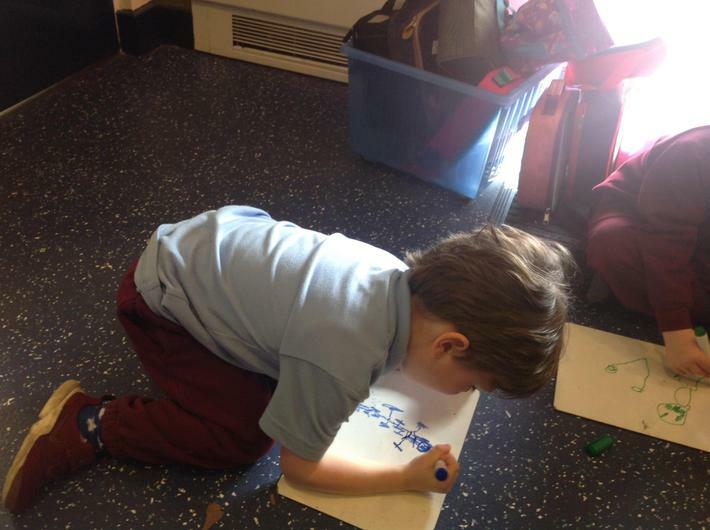 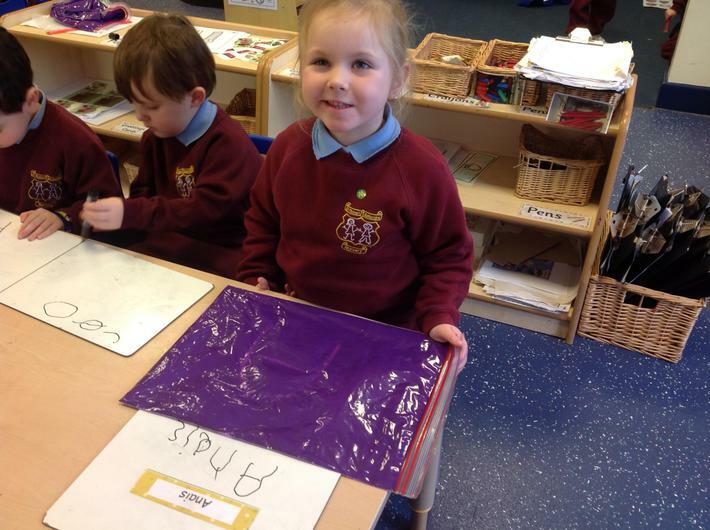 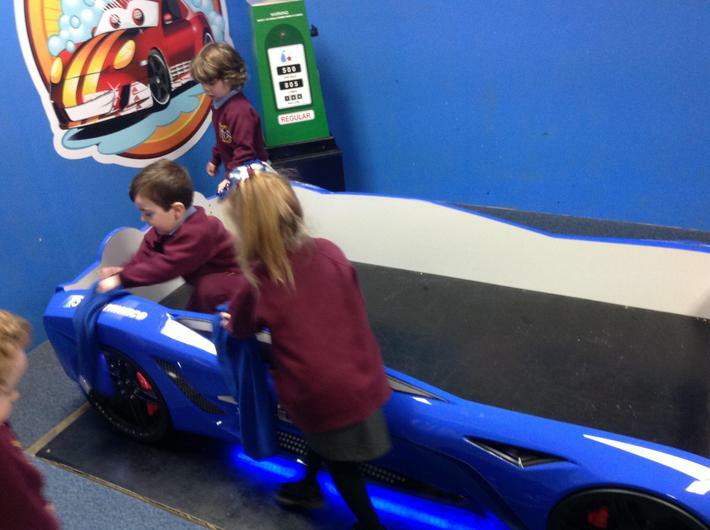 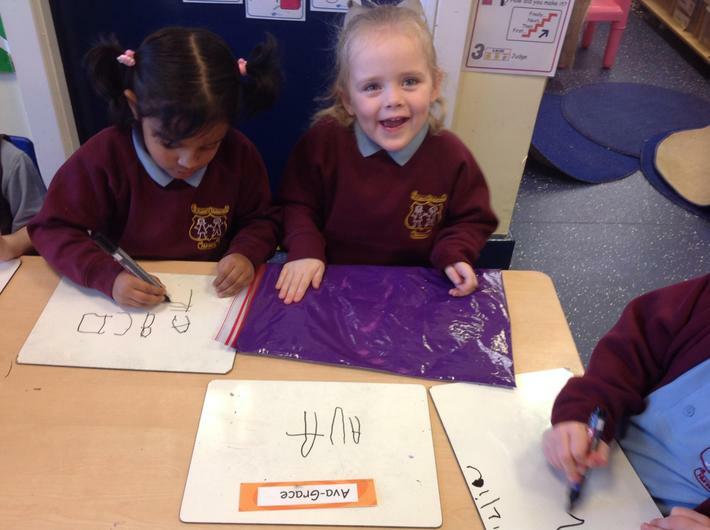 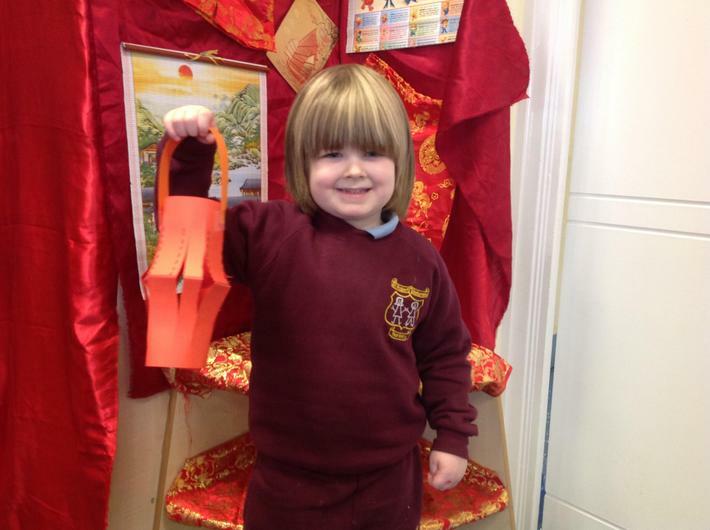 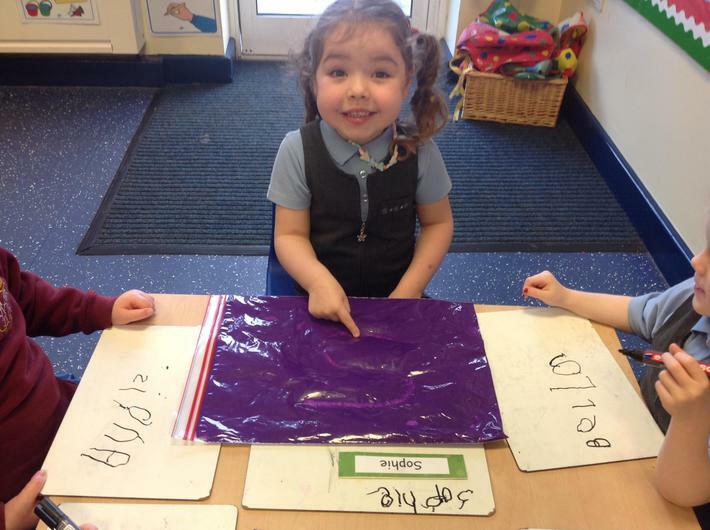 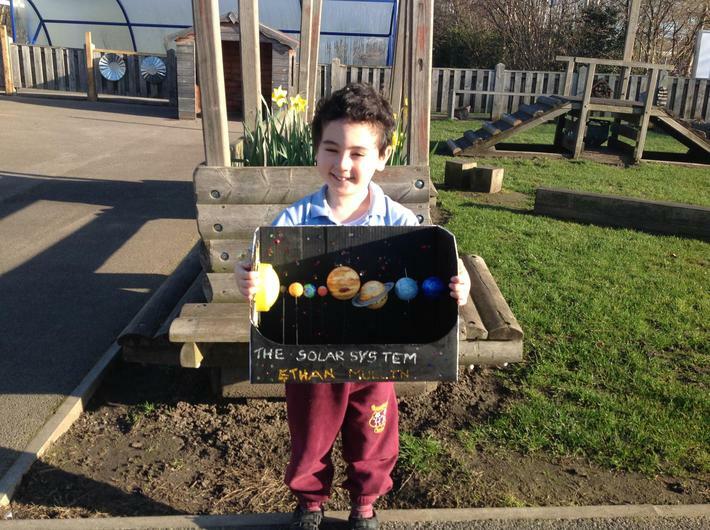 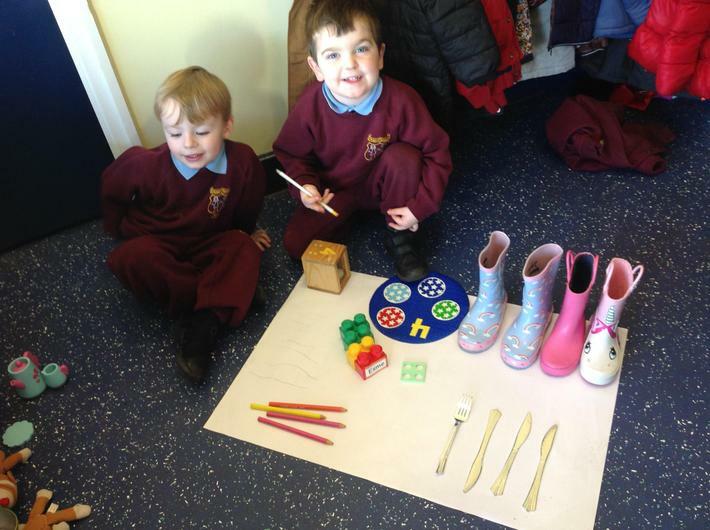 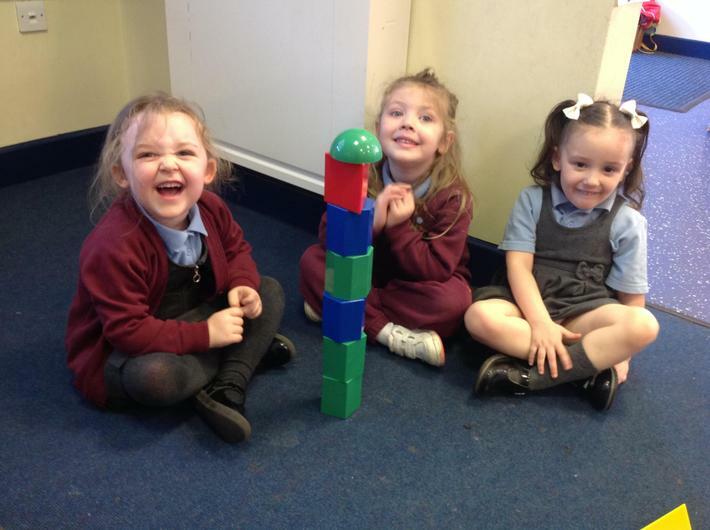 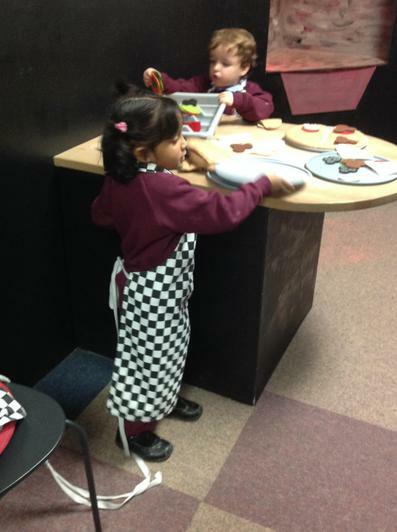 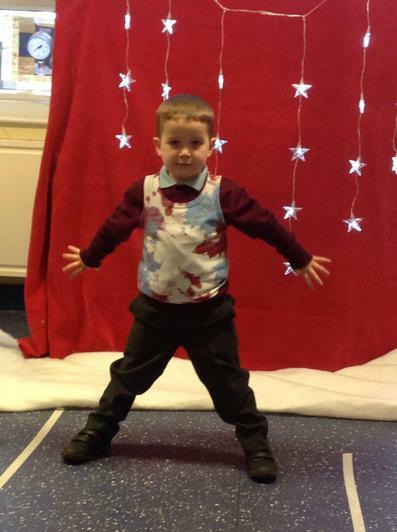 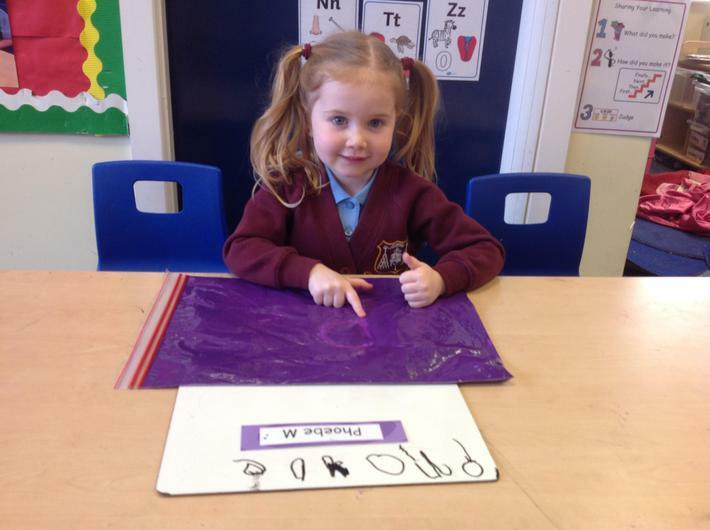 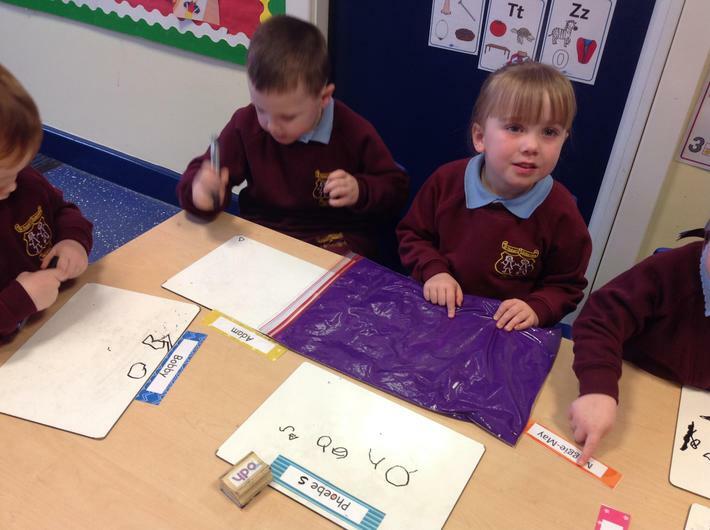 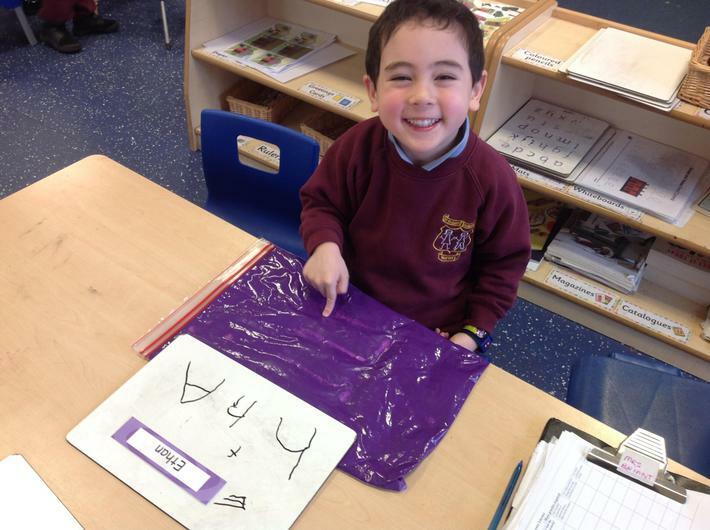 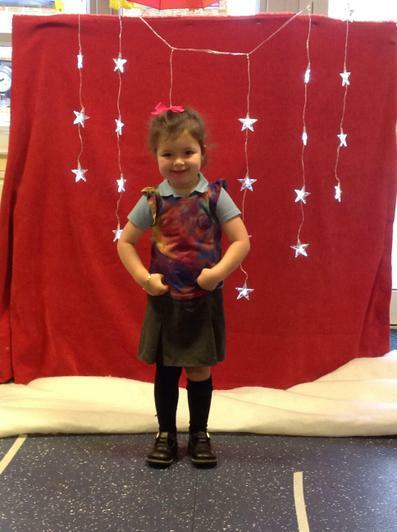 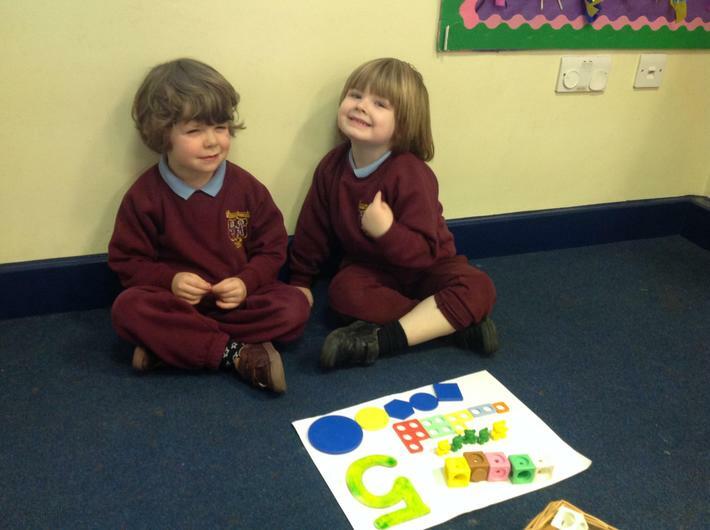 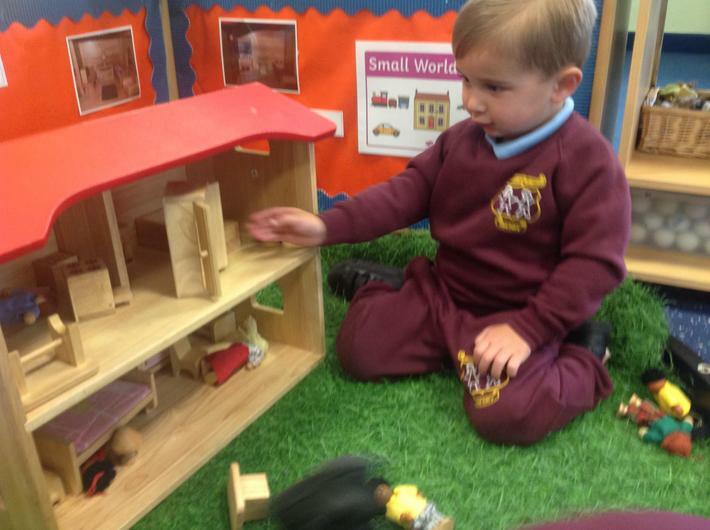 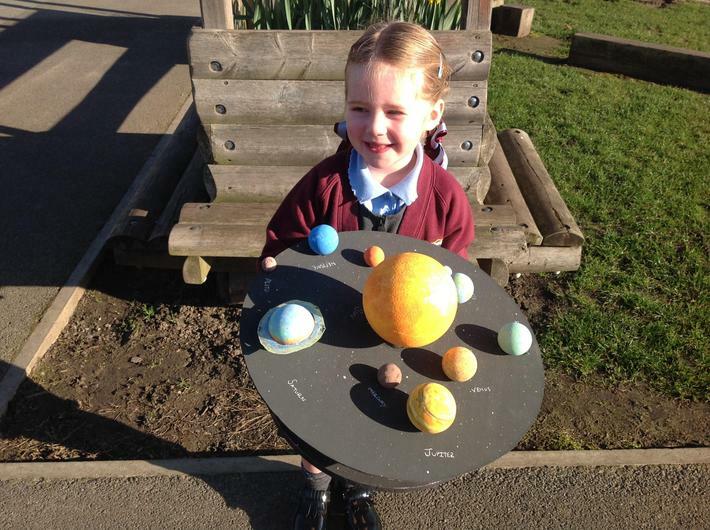 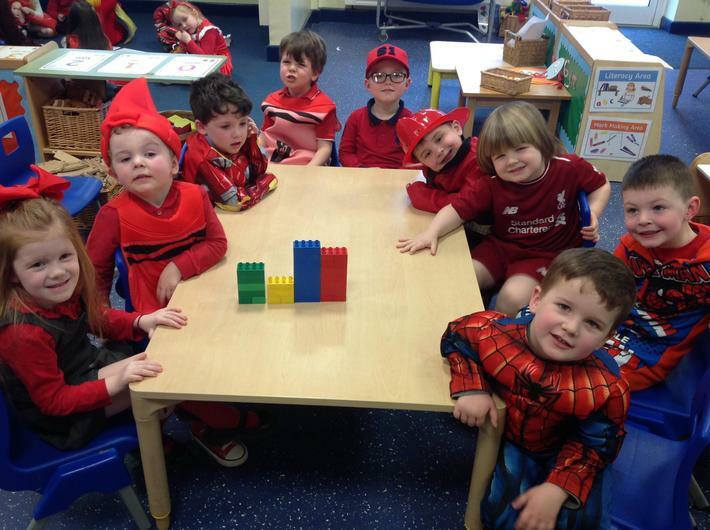 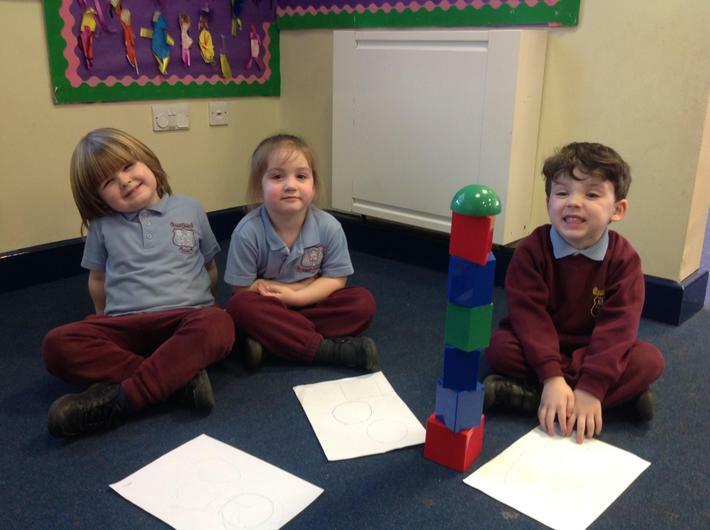 When comparing sizes the class have begun to use language of big, small, bigger, smaller and even medium! 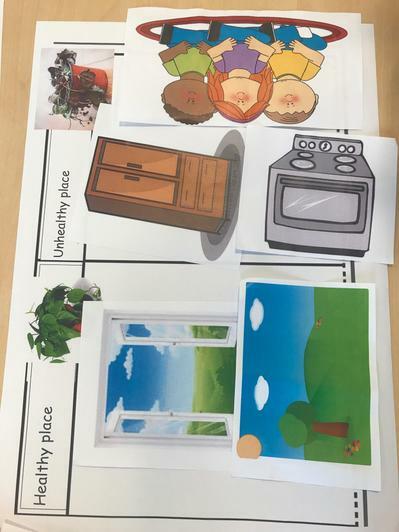 To apply and extend this knowledge we have used tcharts to sort pictures of different sizes and we have also drawn our family members and considered their different heights. 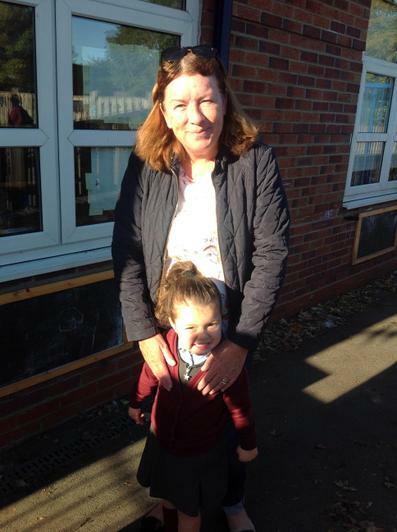 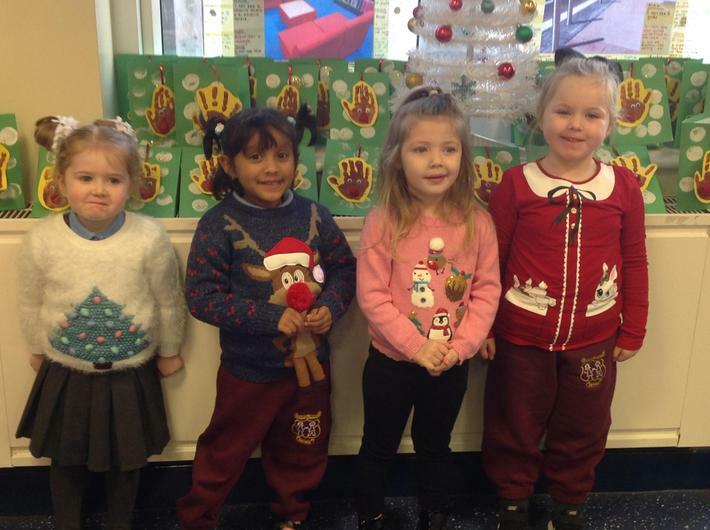 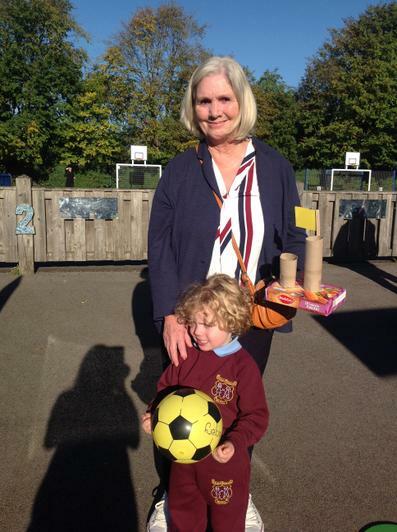 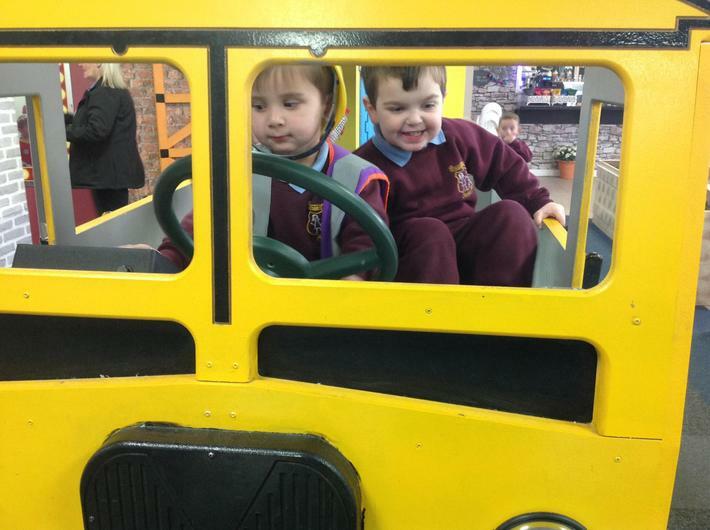 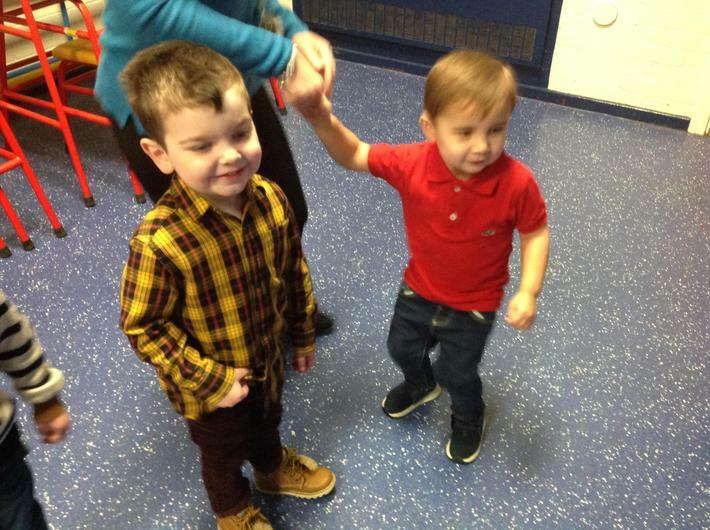 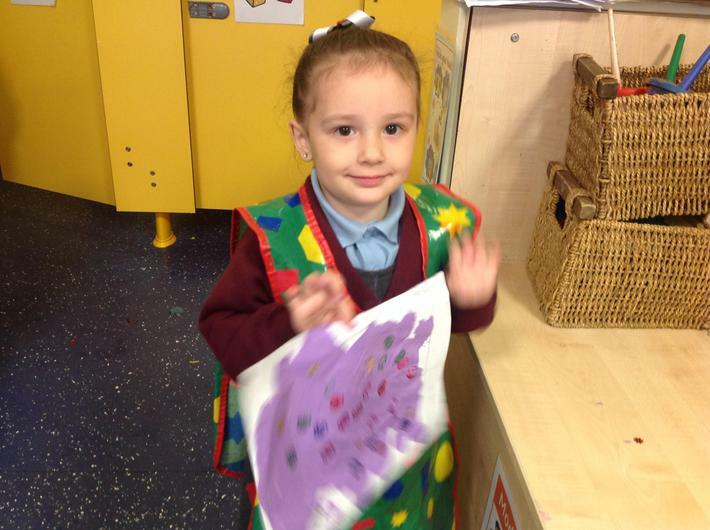 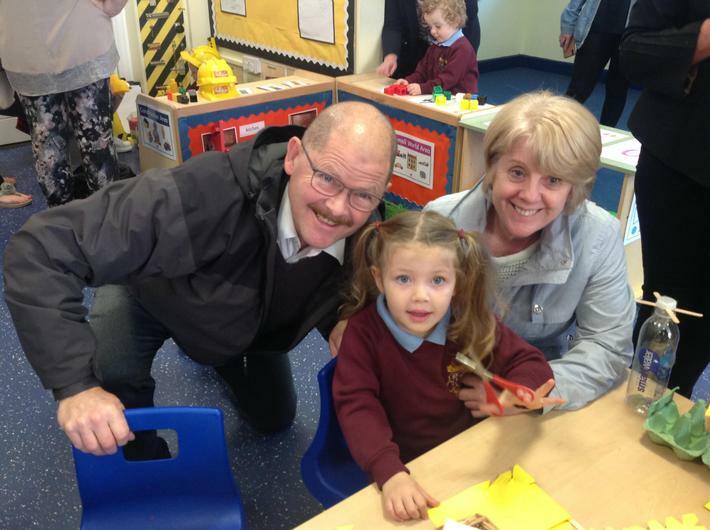 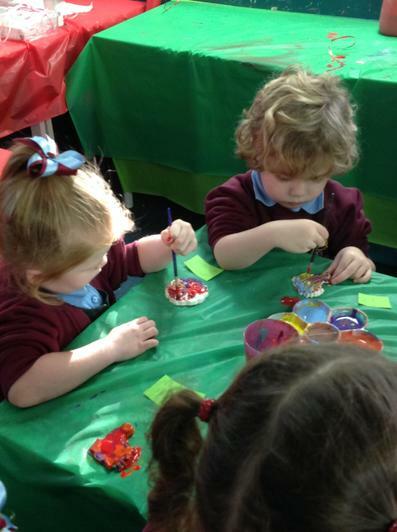 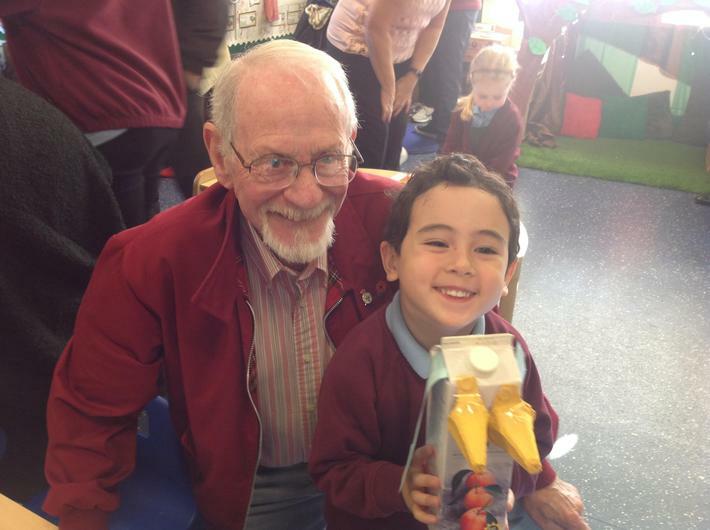 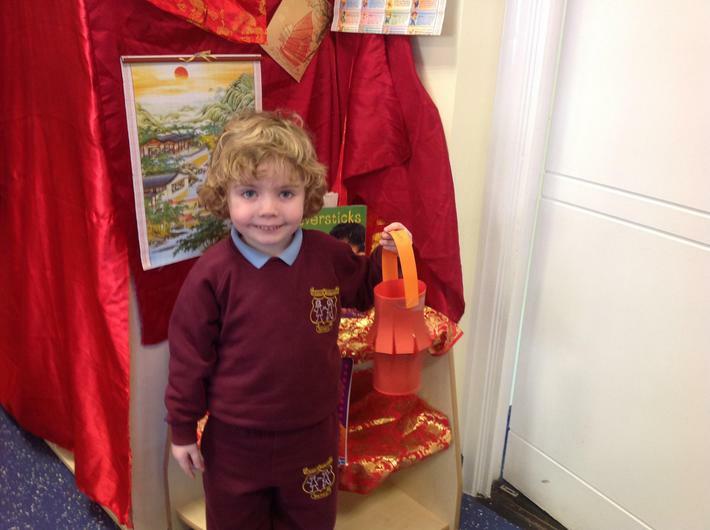 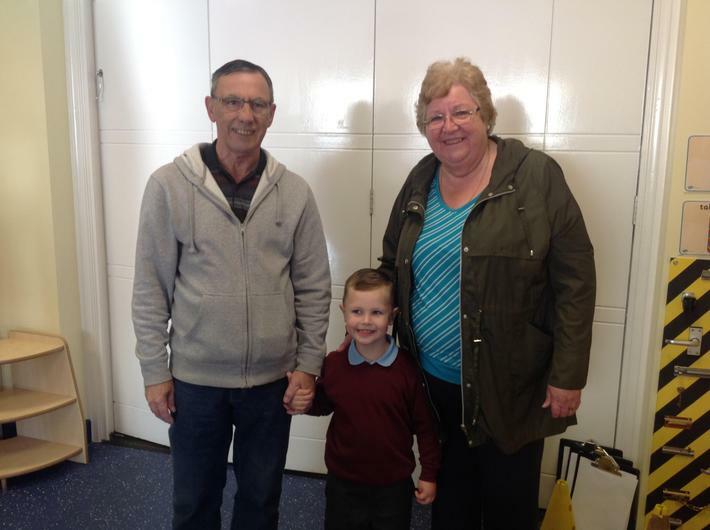 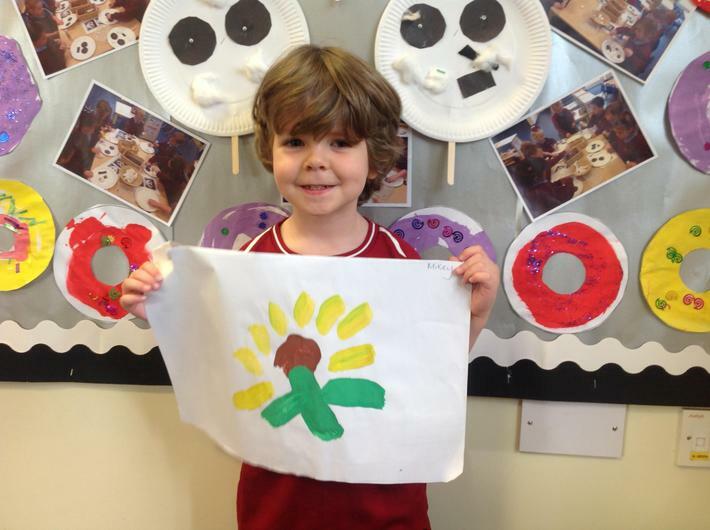 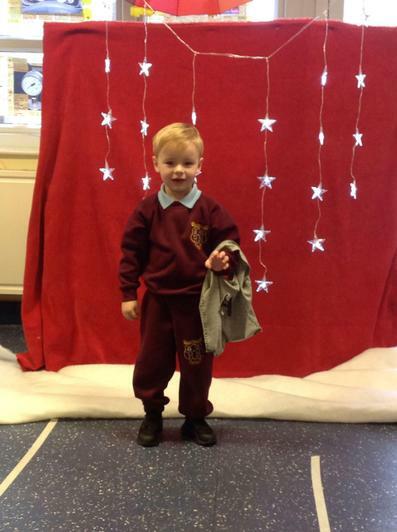 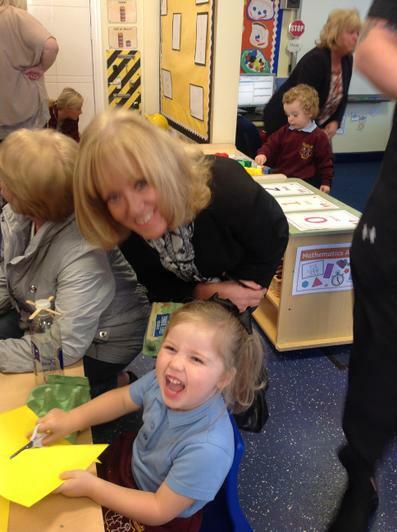 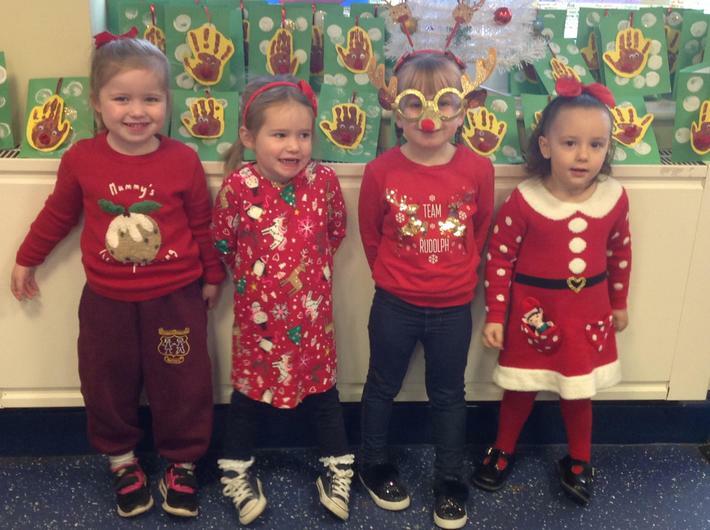 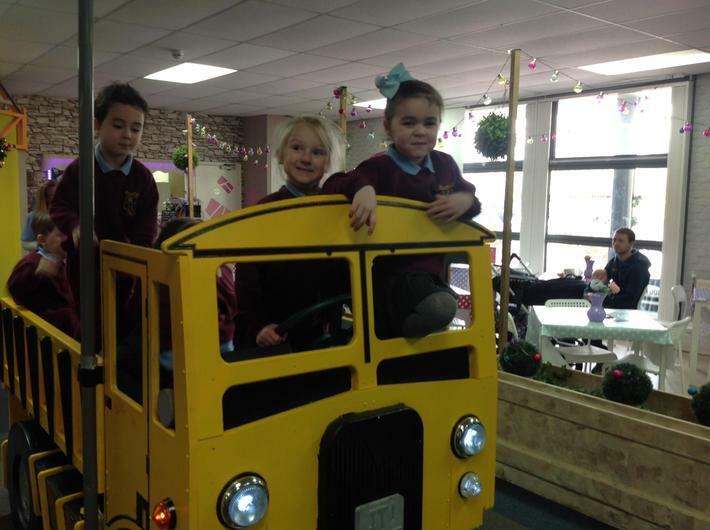 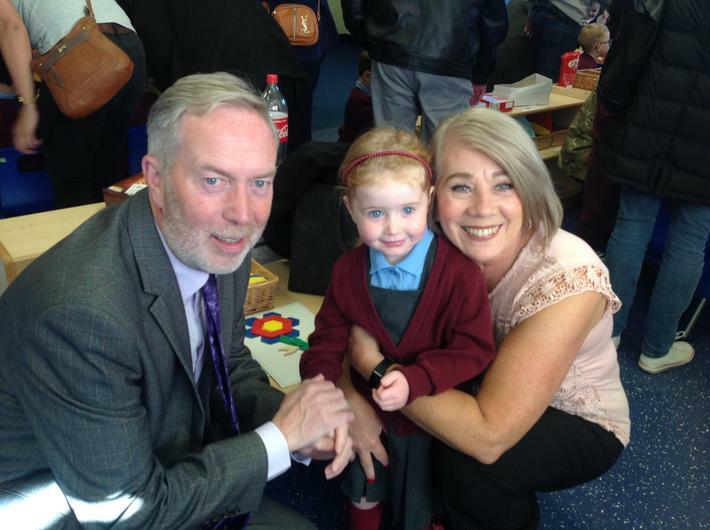 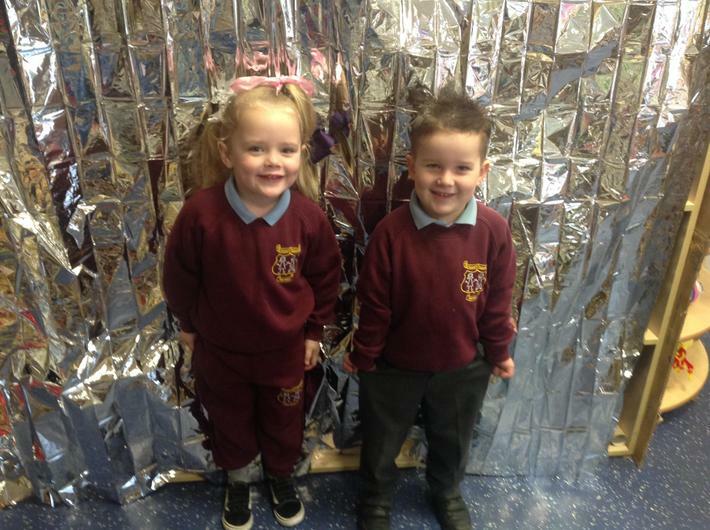 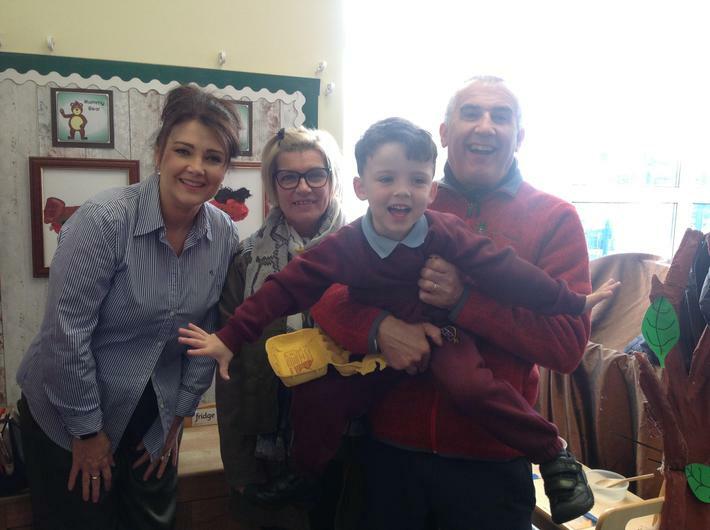 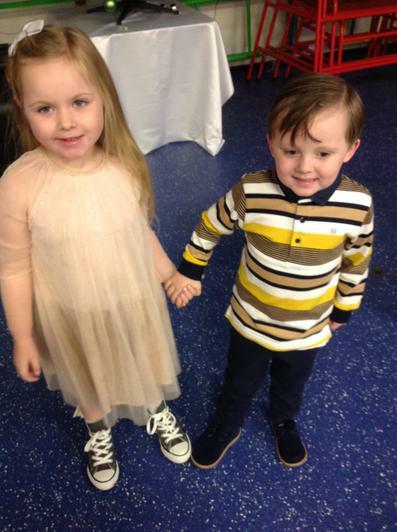 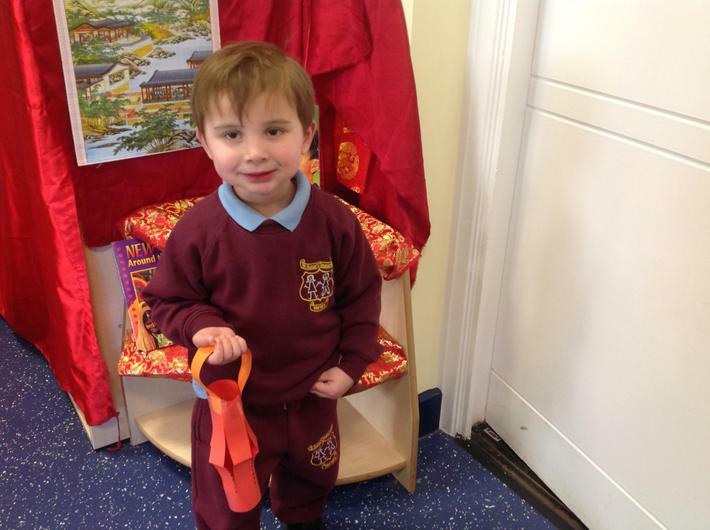 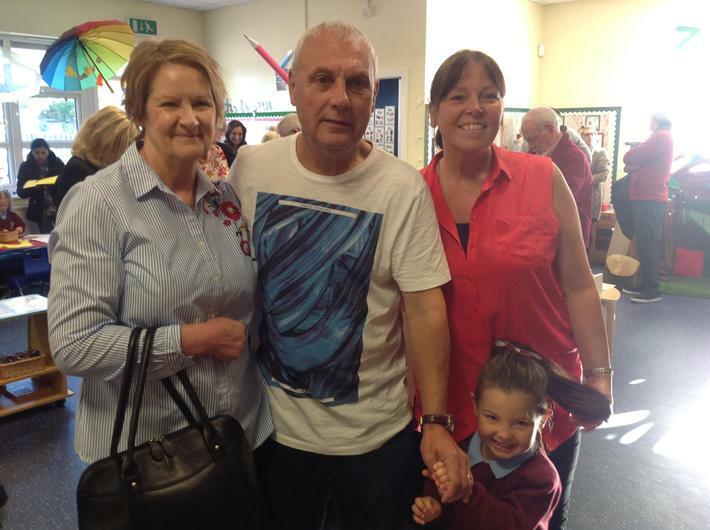 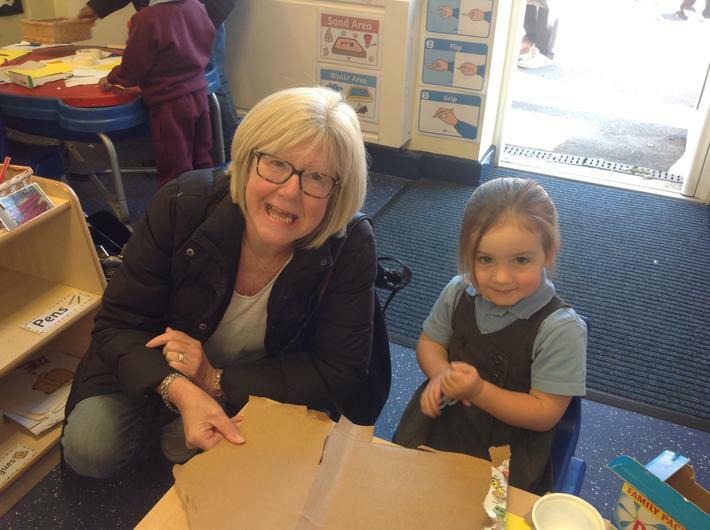 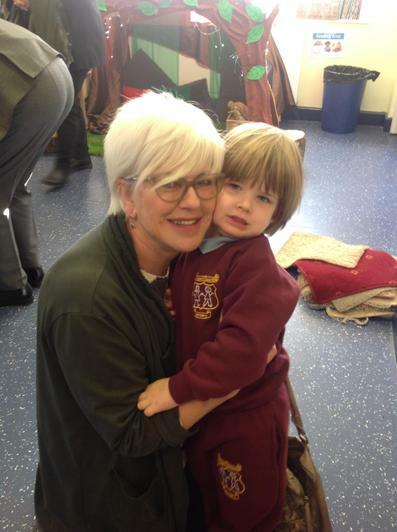 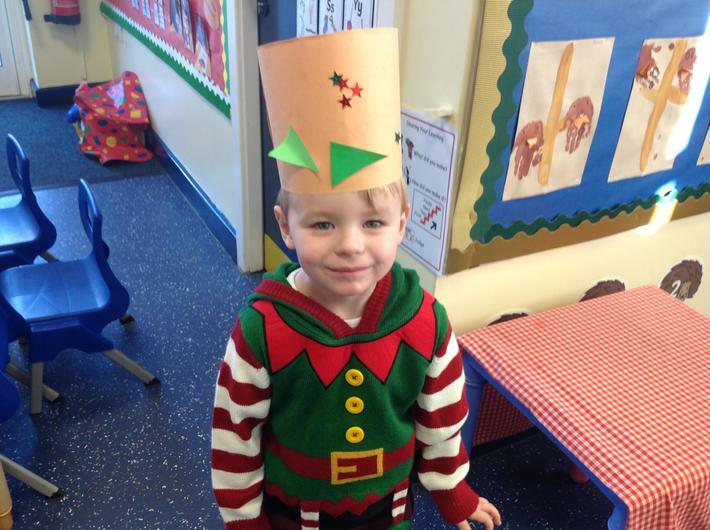 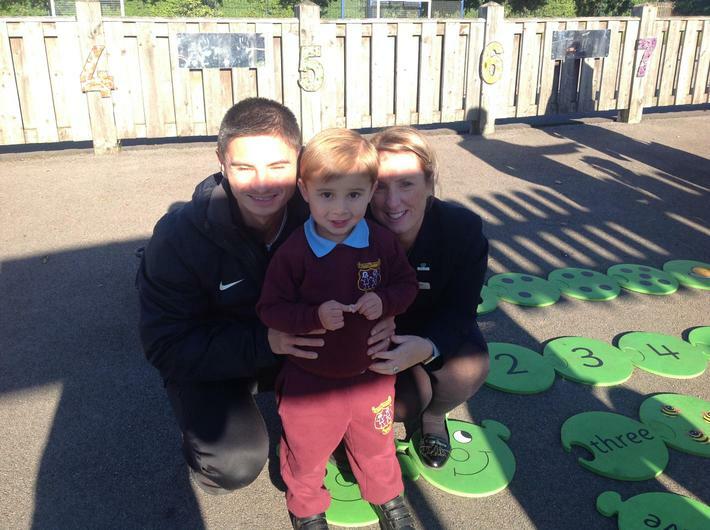 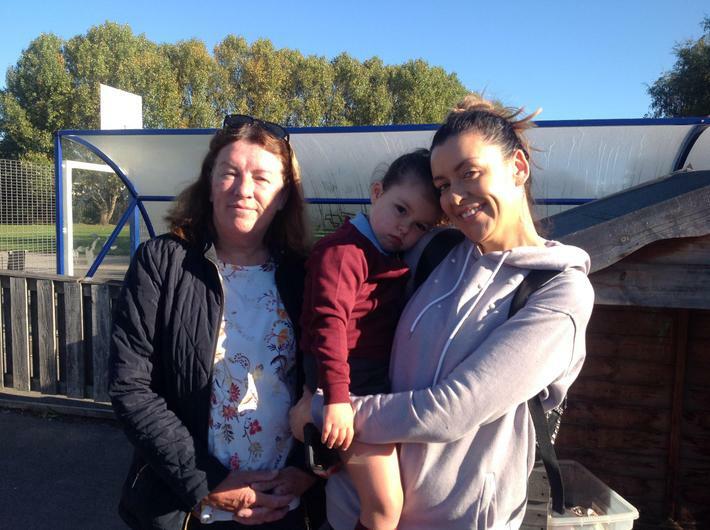 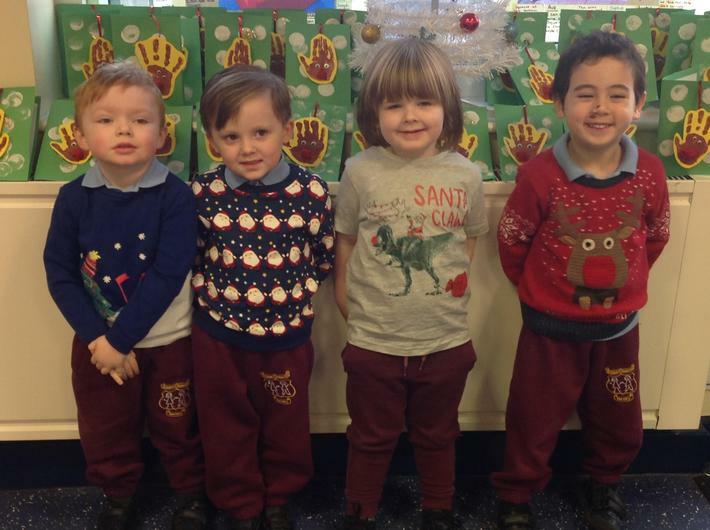 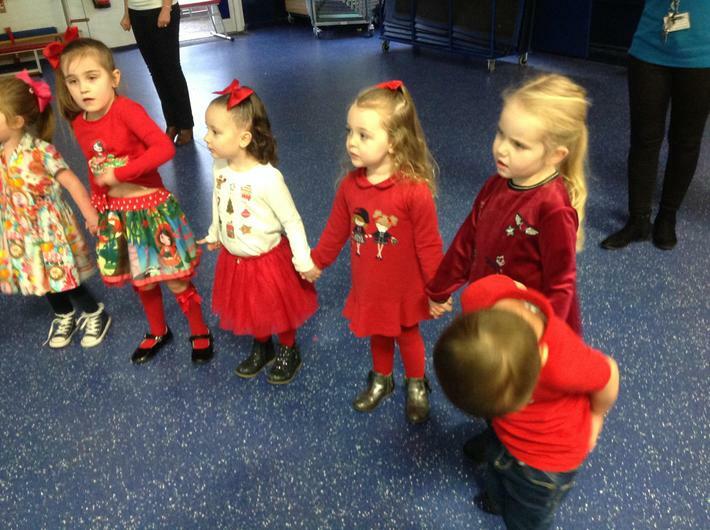 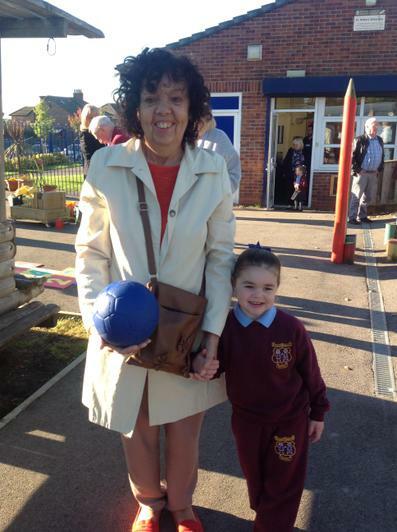 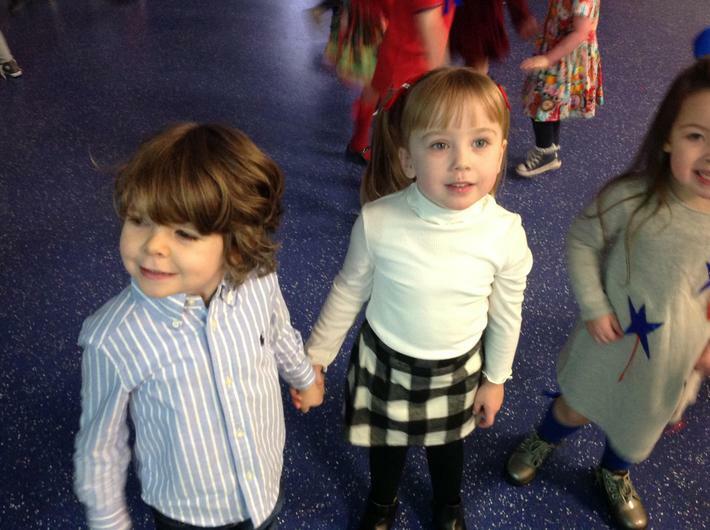 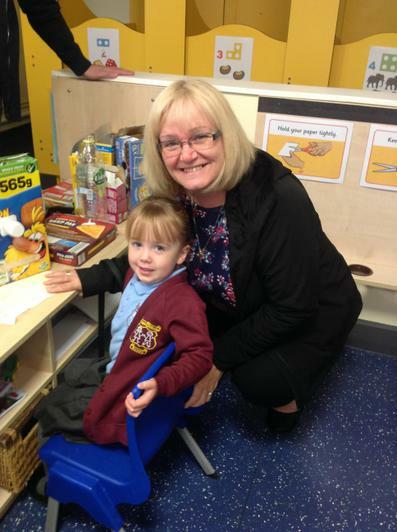 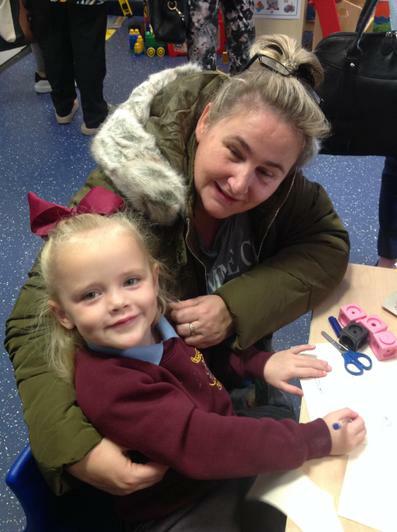 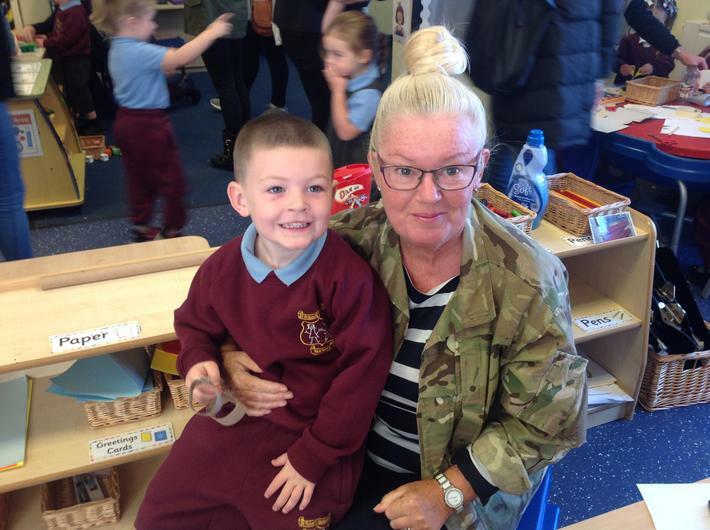 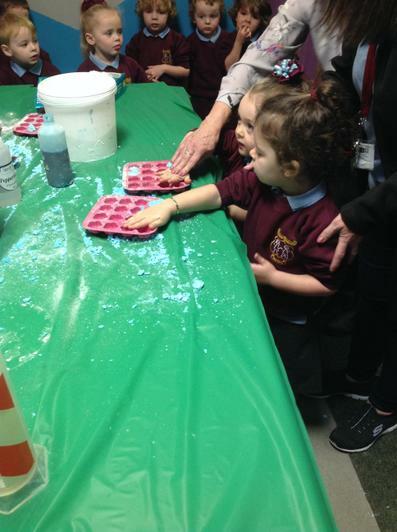 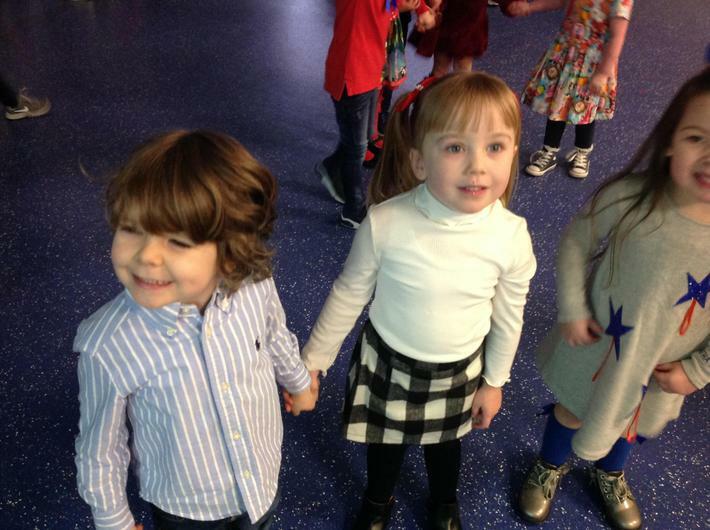 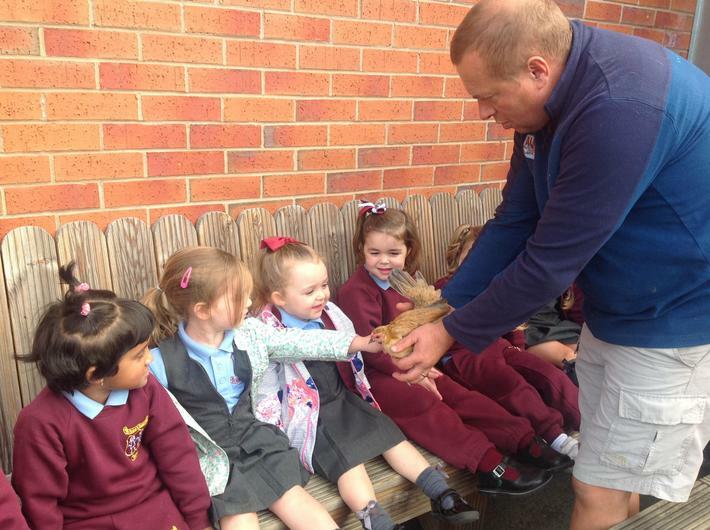 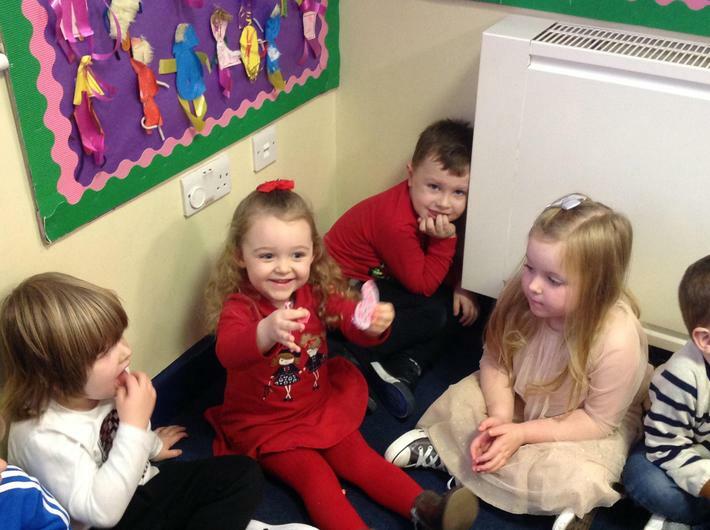 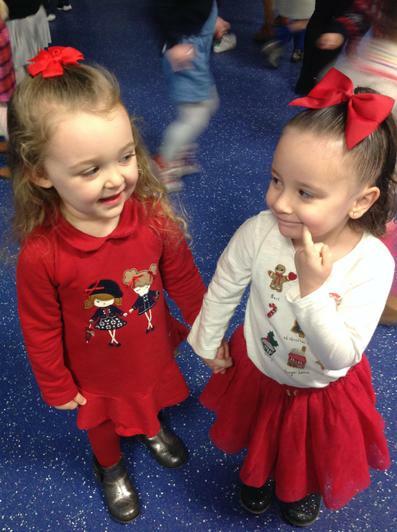 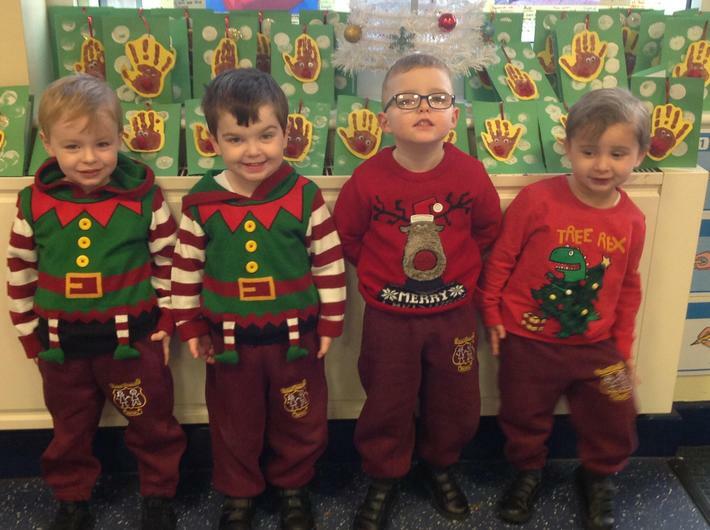 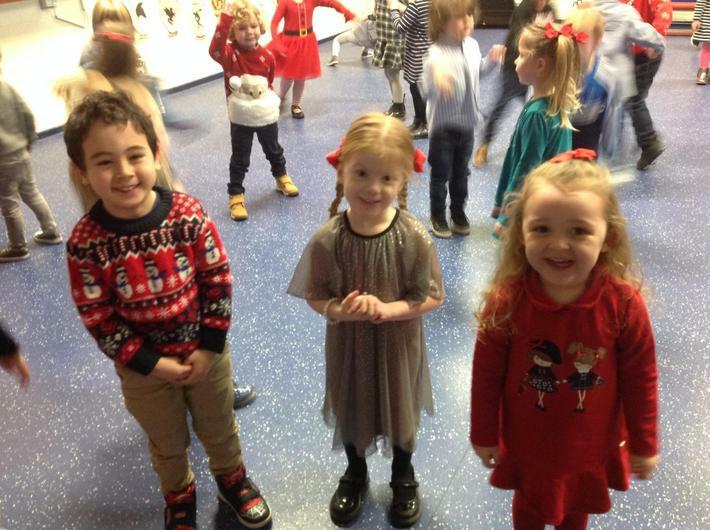 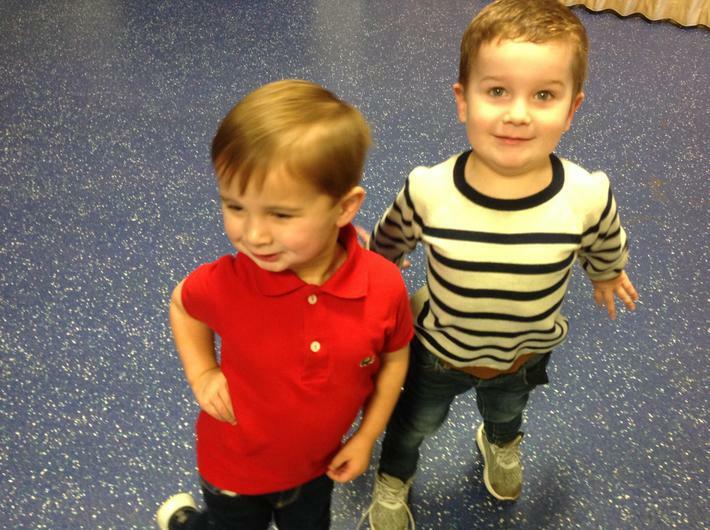 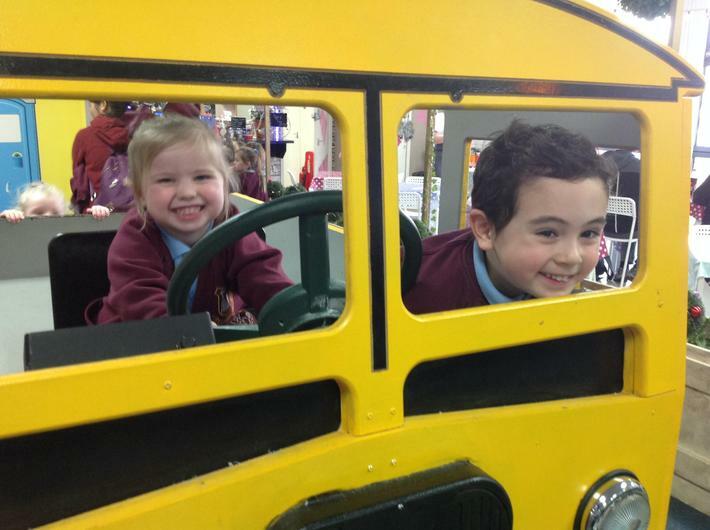 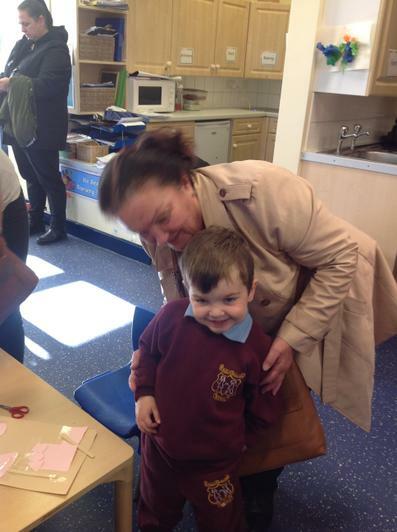 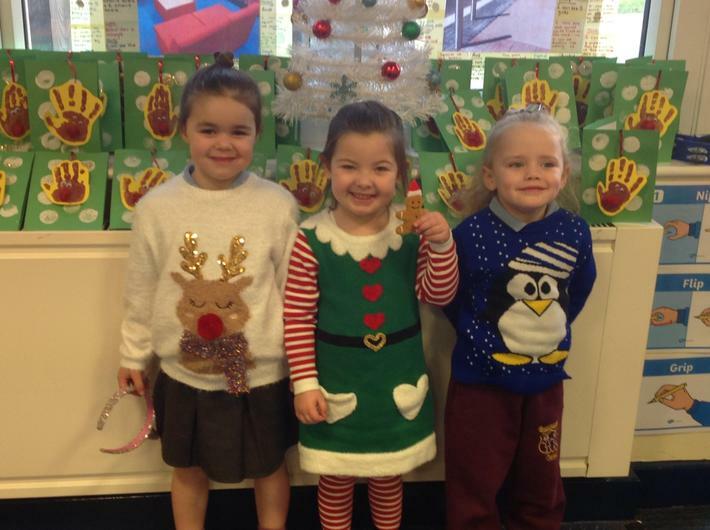 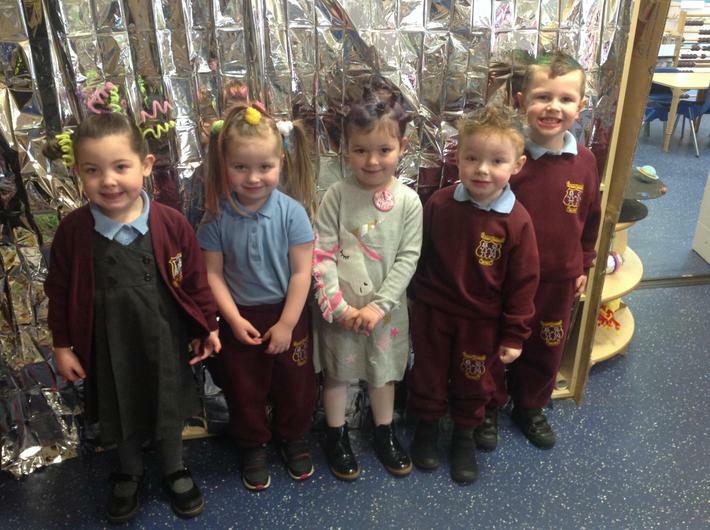 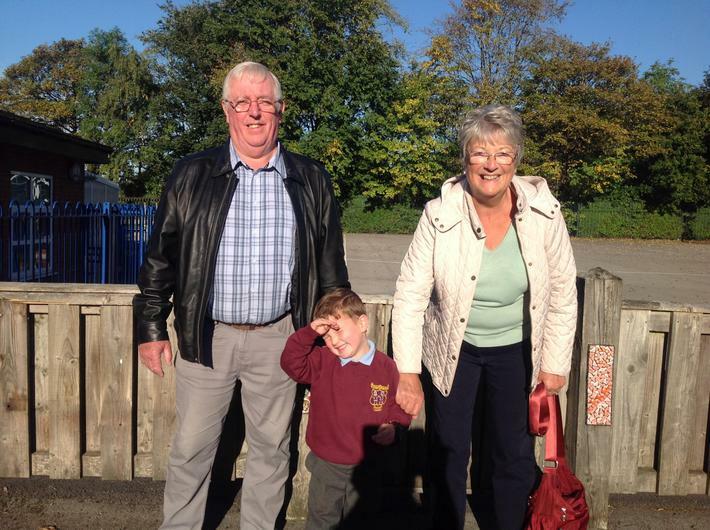 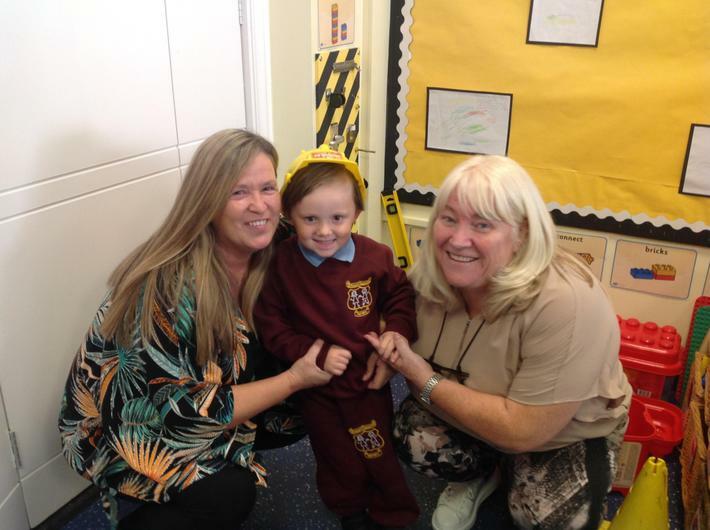 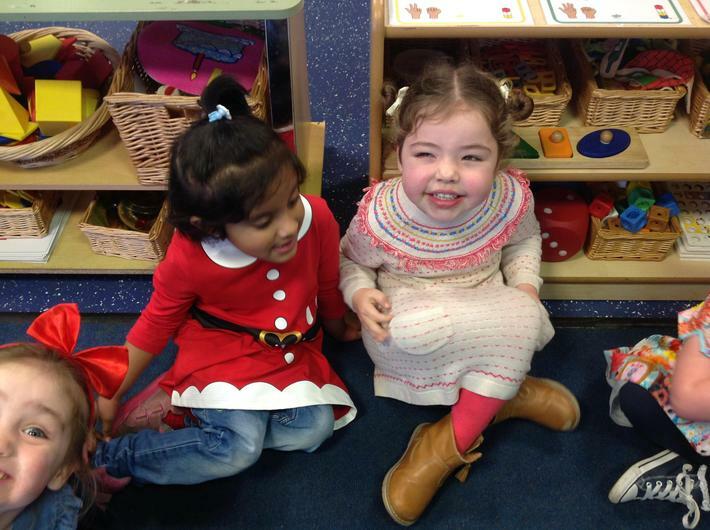 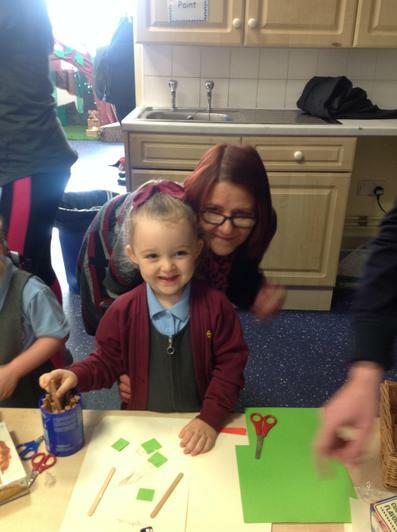 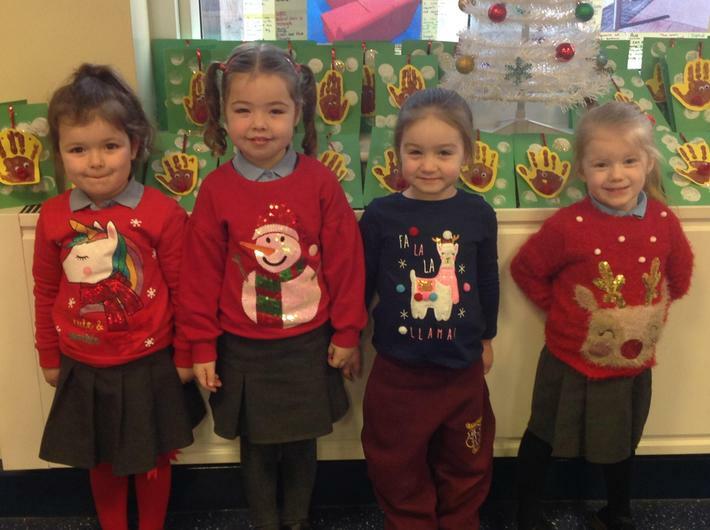 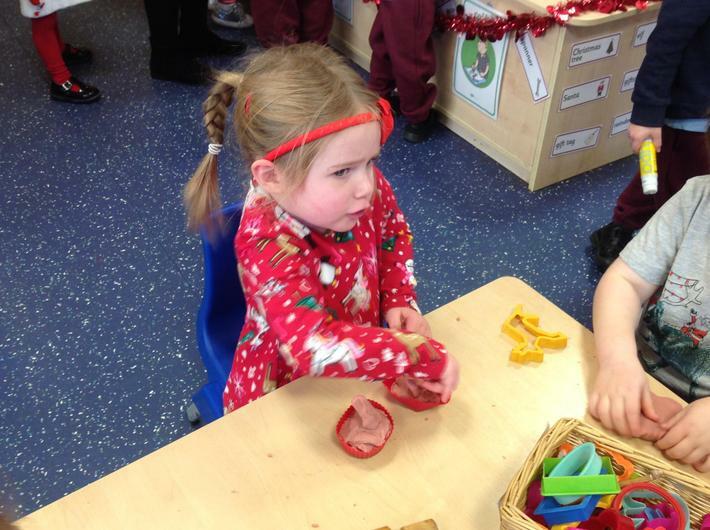 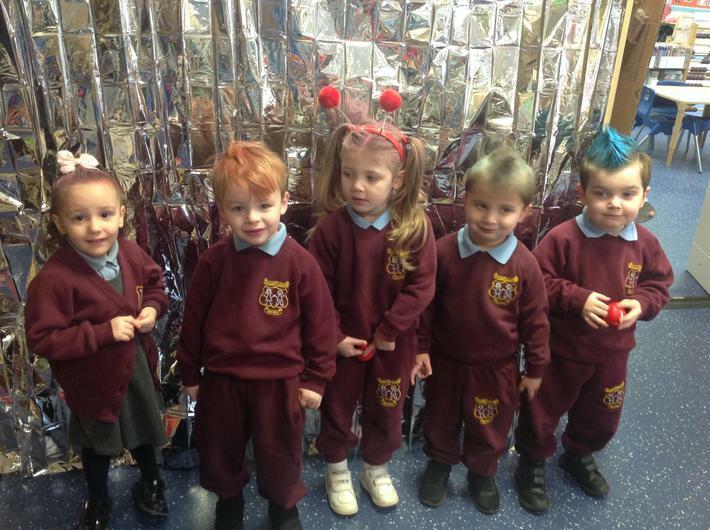 We had such a lovely day sharing the Nursery with our Grandparents and other family members. 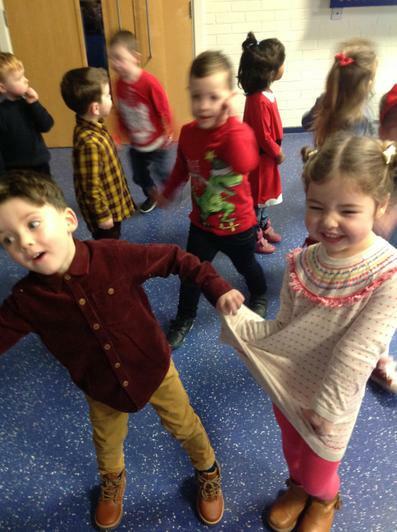 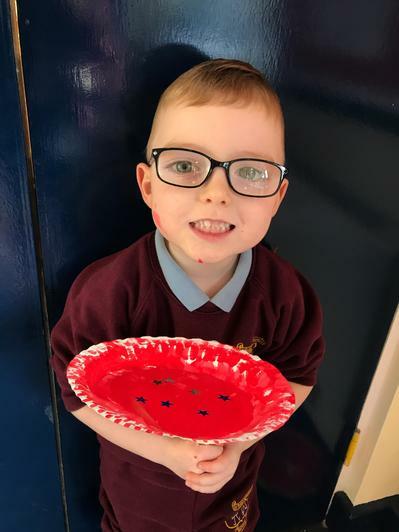 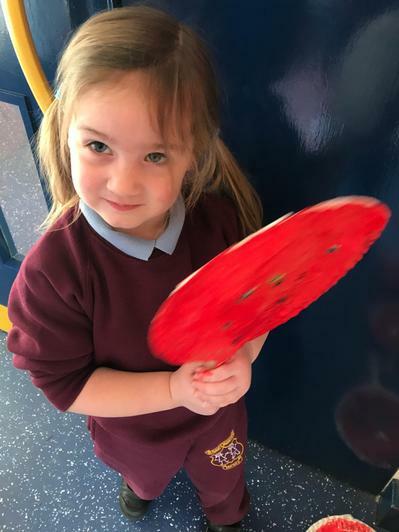 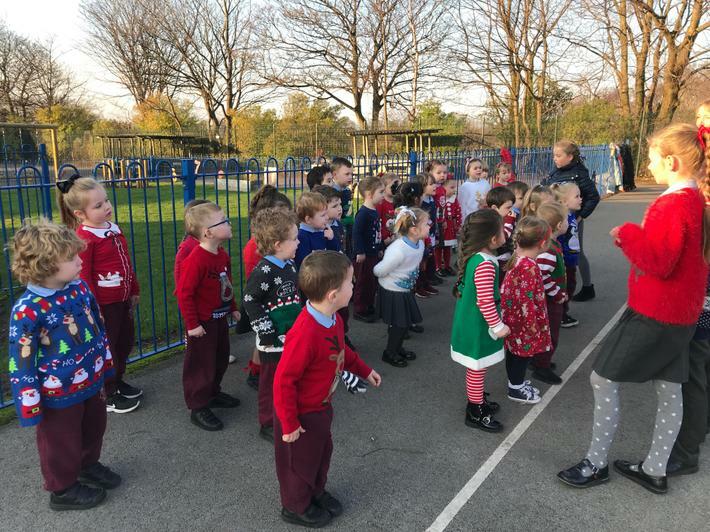 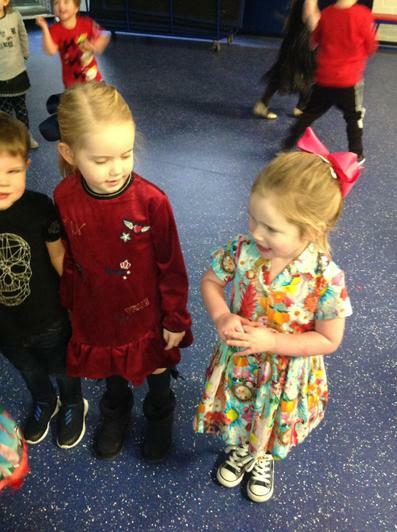 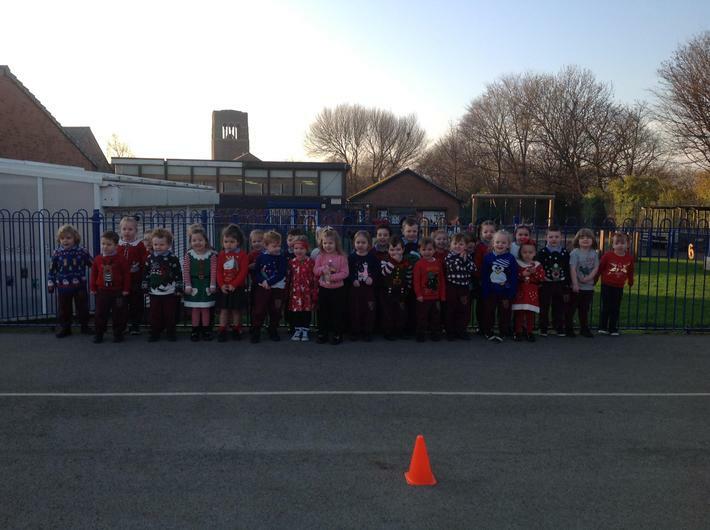 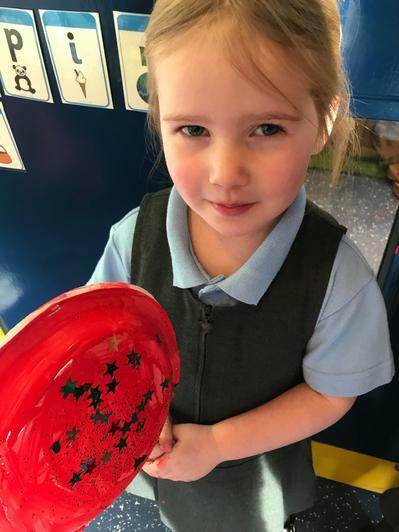 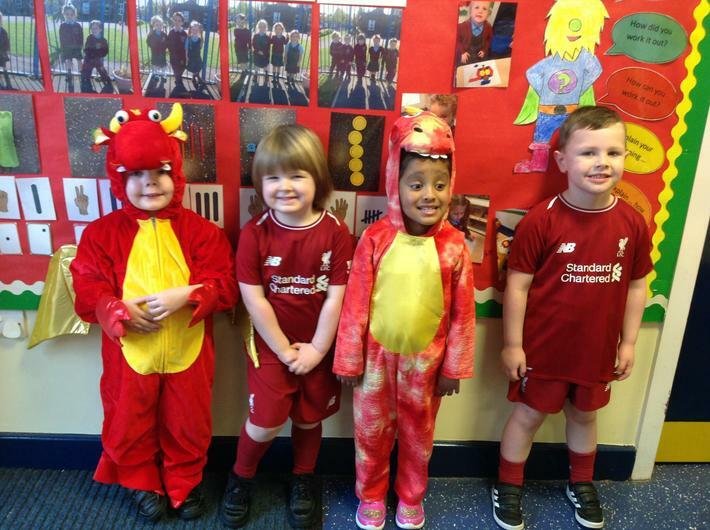 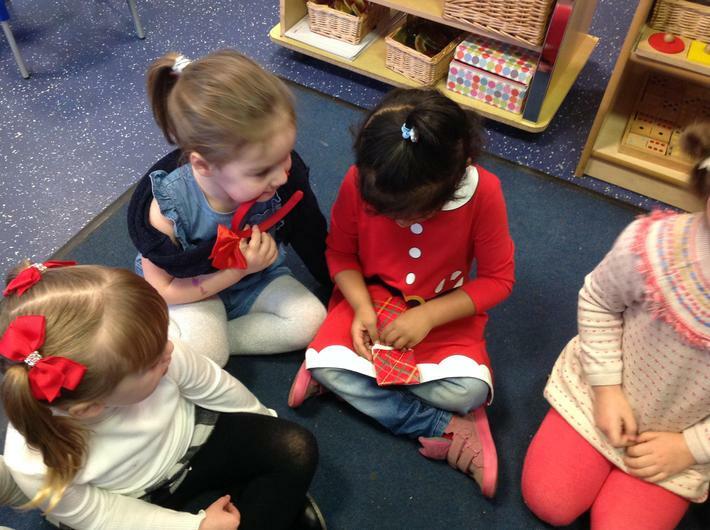 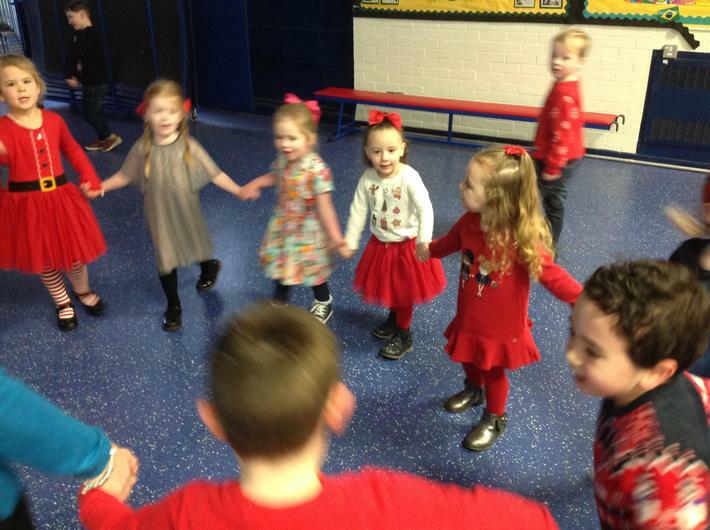 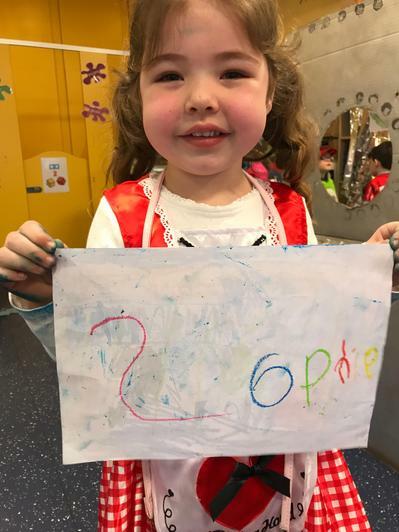 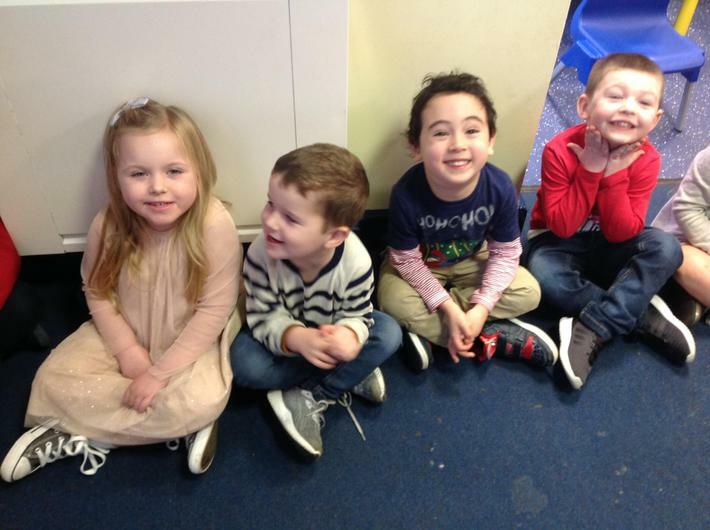 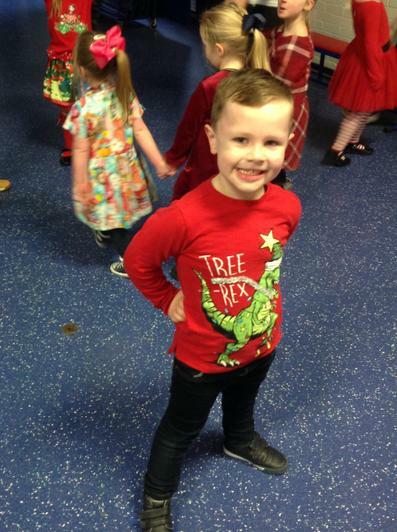 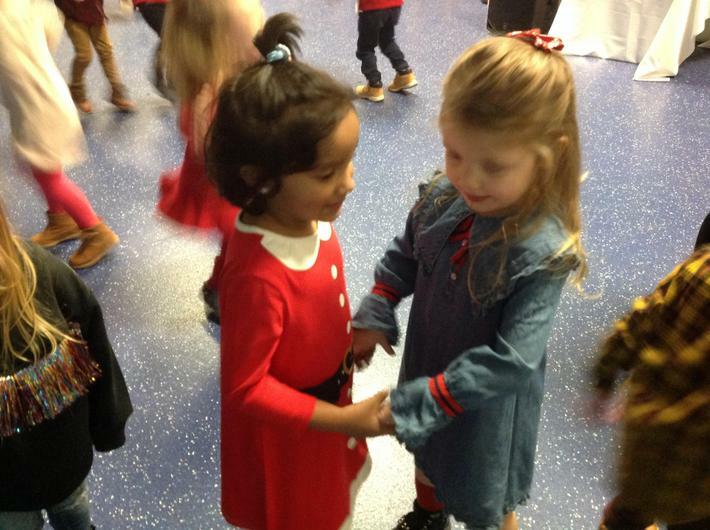 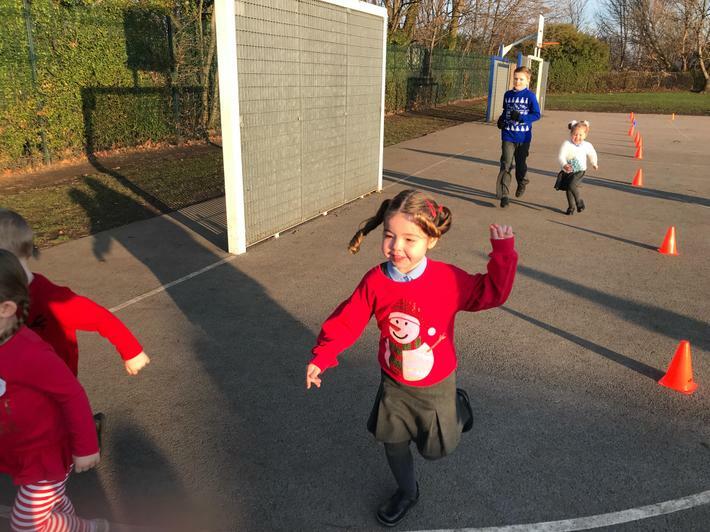 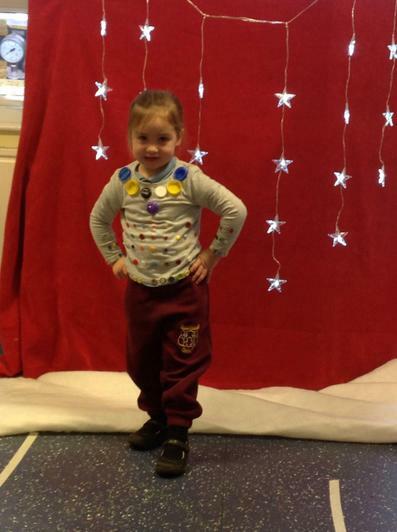 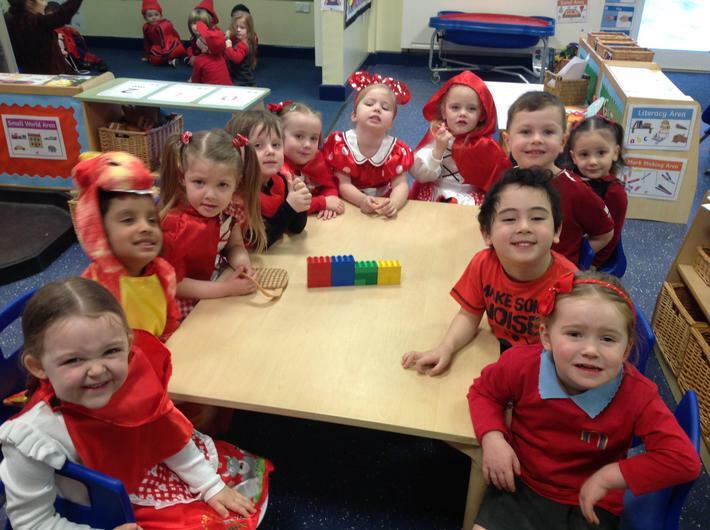 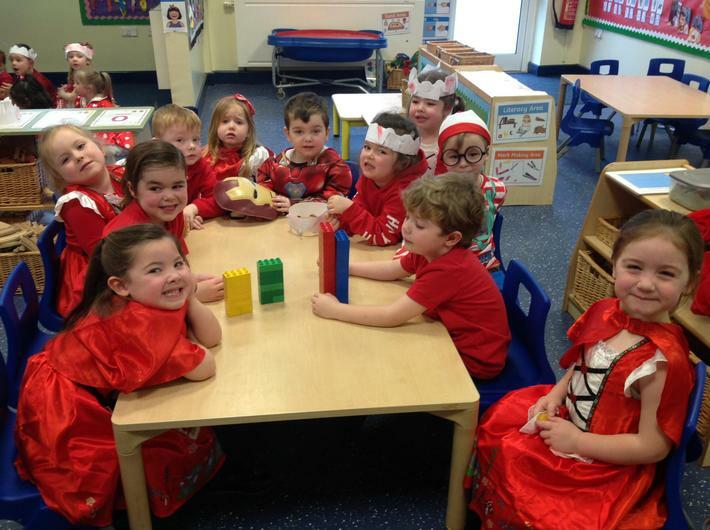 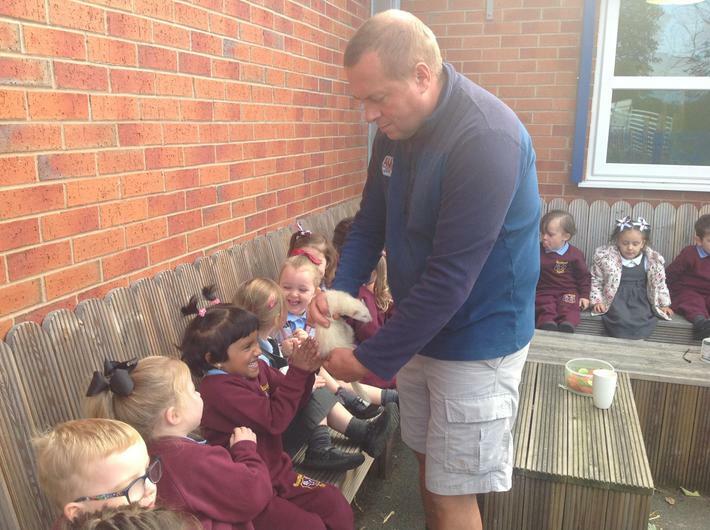 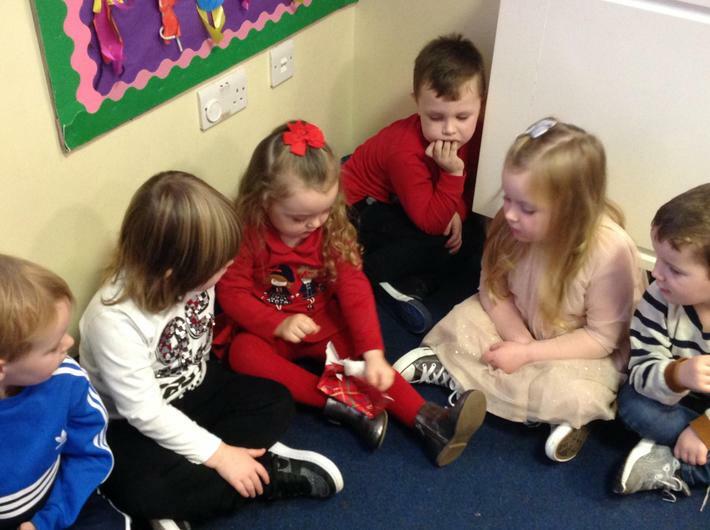 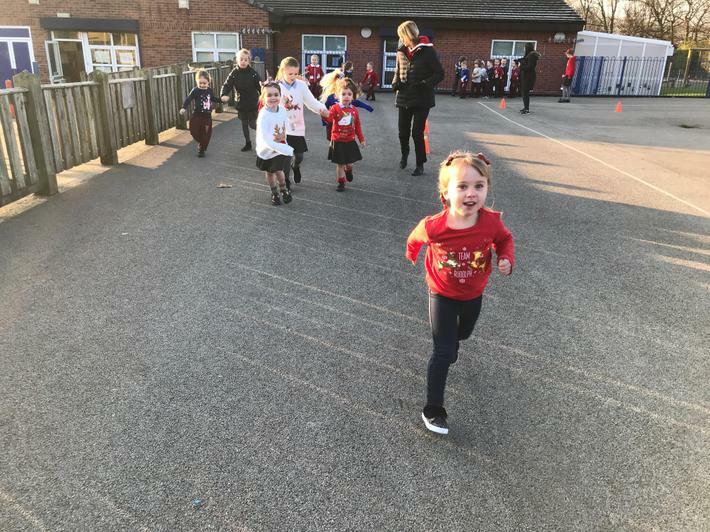 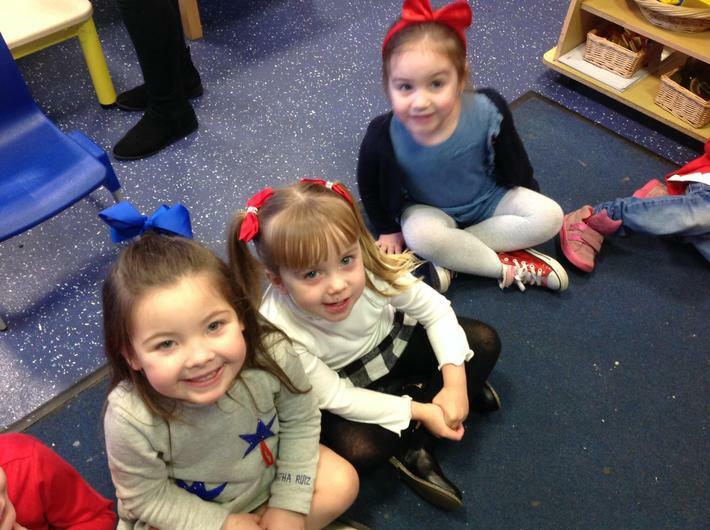 It is very special to watch the children show their class off and to hear them chattering away about all their ideas and friends. 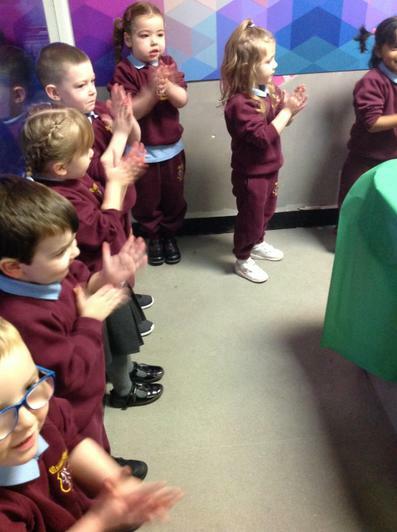 Thank you to everyone who came for making it such a memorable day! 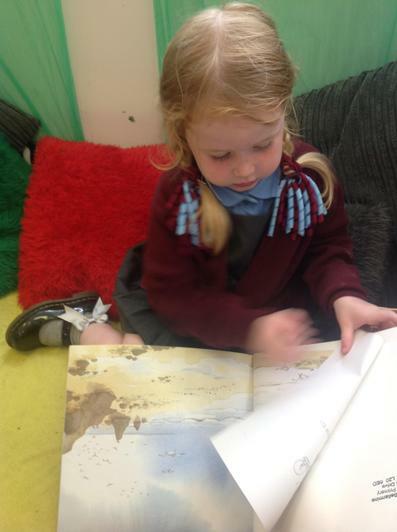 For our Literacy topic we have been exploring the work of a brilliant author, Steve Antony. 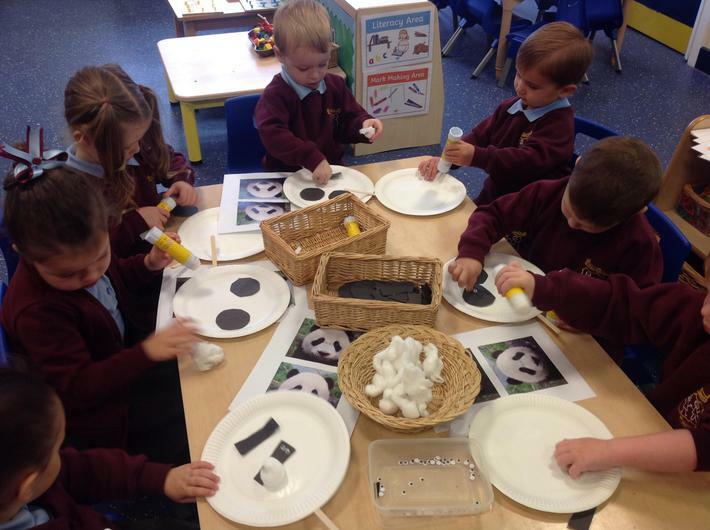 Through looking at his books of 'I'll Wait Mr Panda' and 'Thank you Mr Panda' we produced lots of brilliant work. 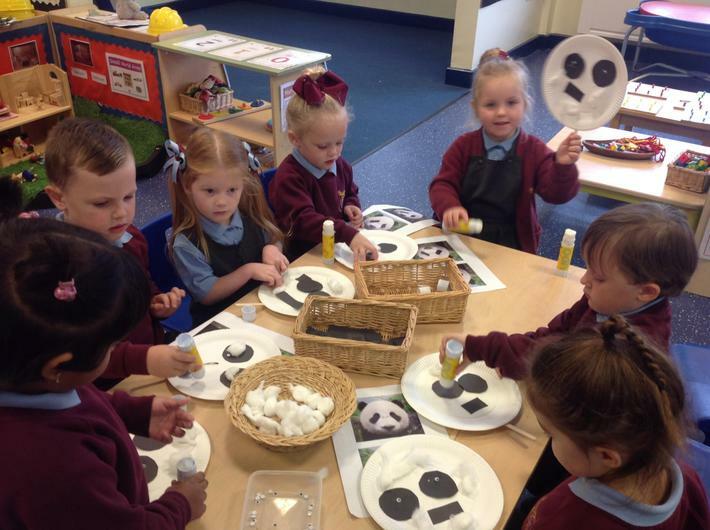 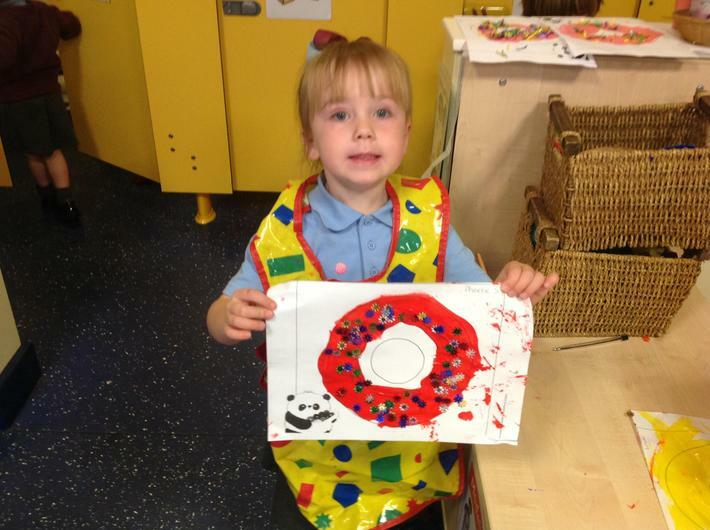 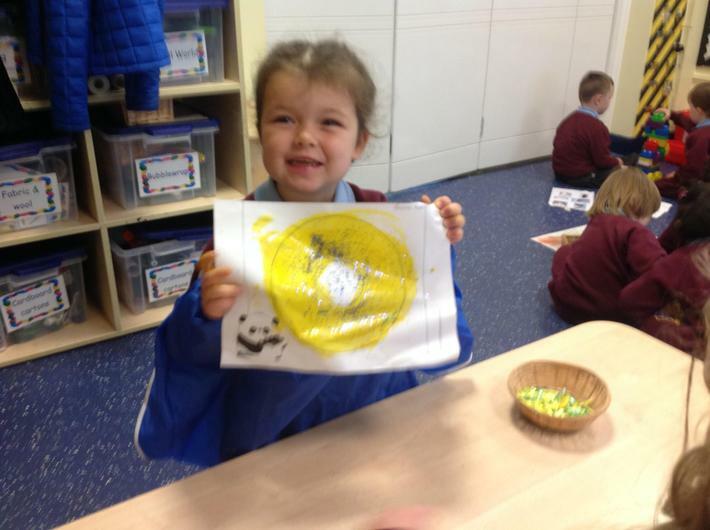 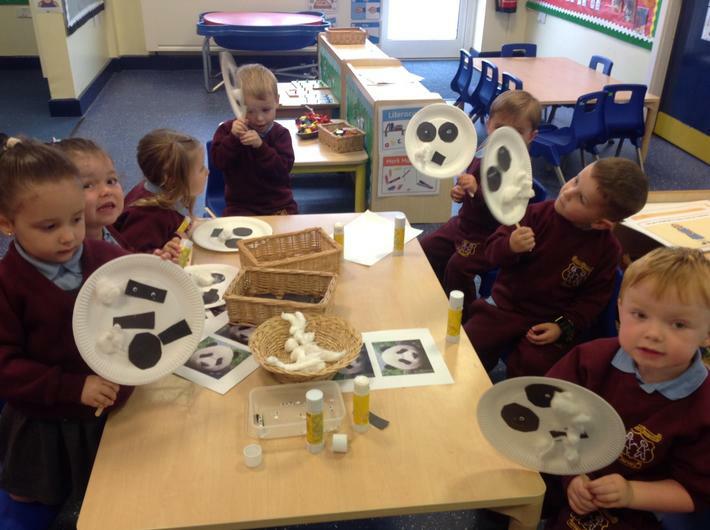 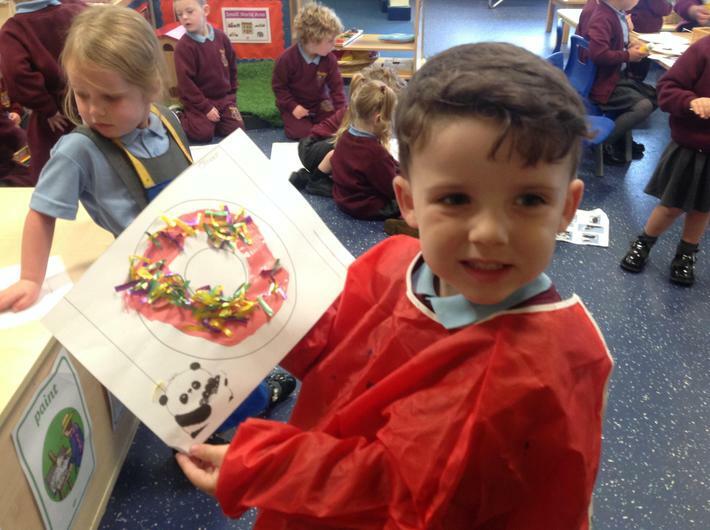 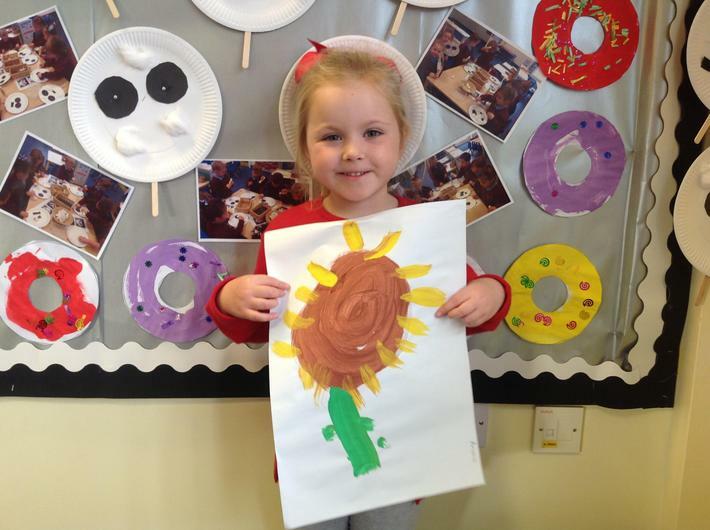 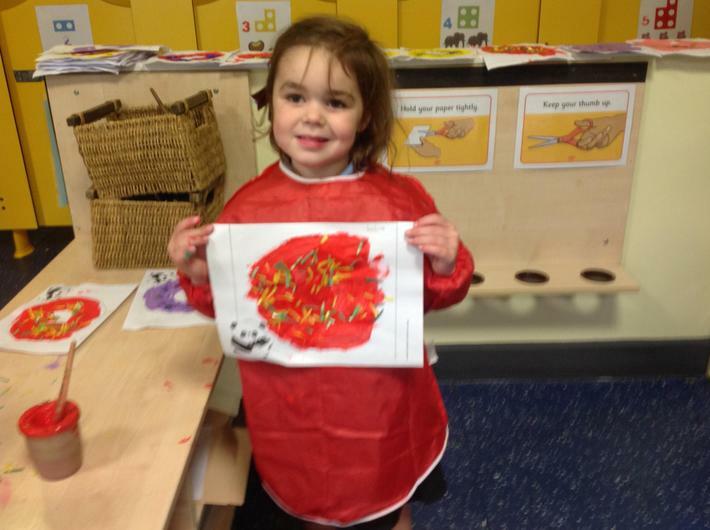 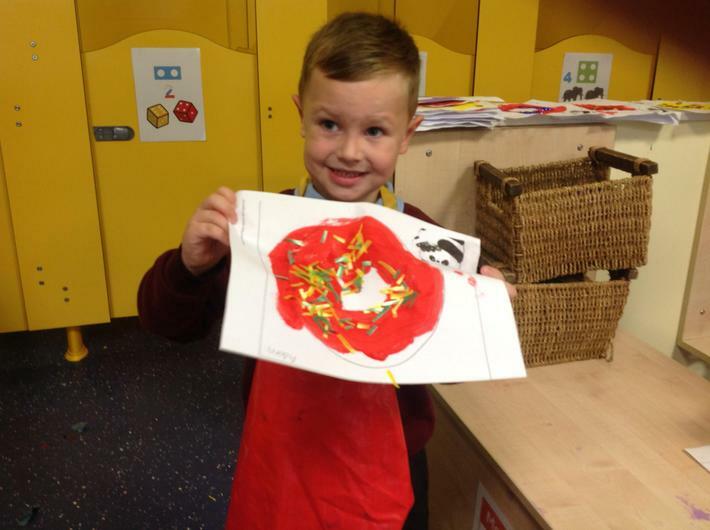 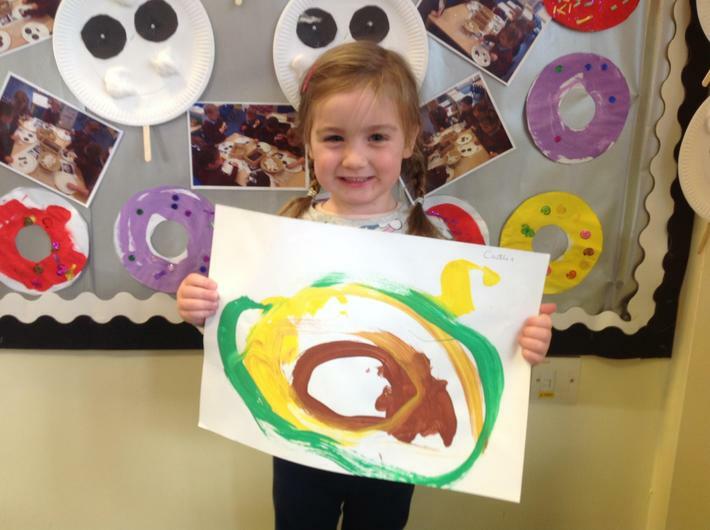 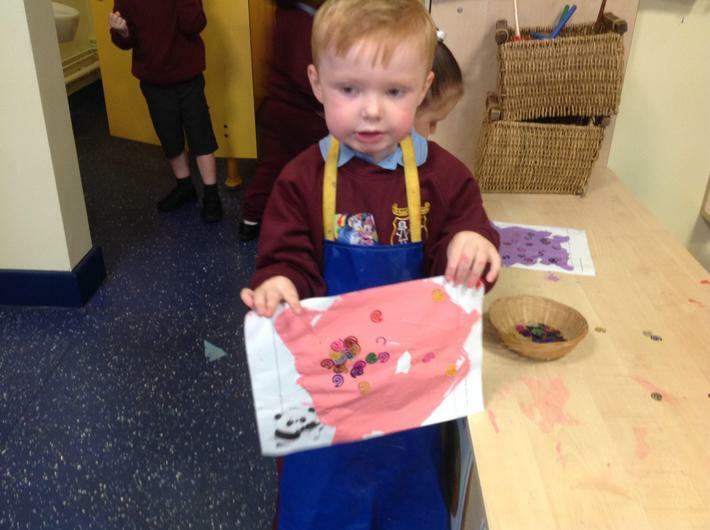 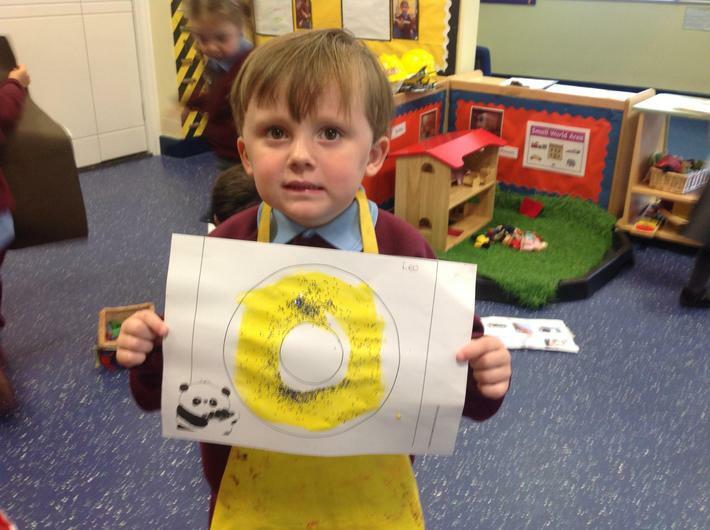 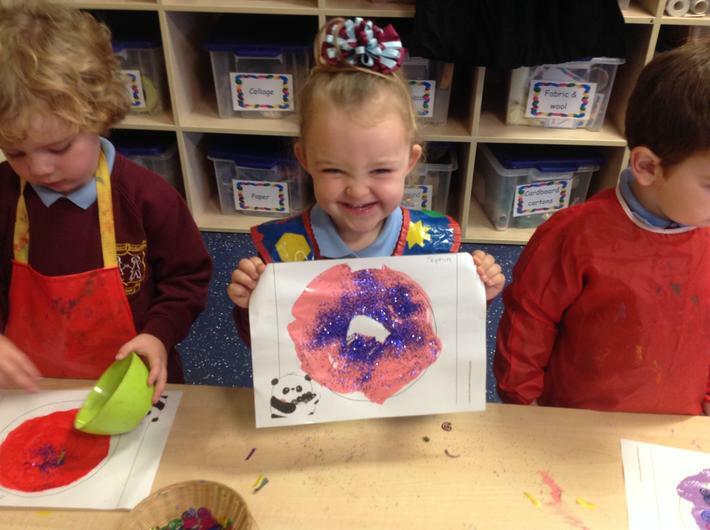 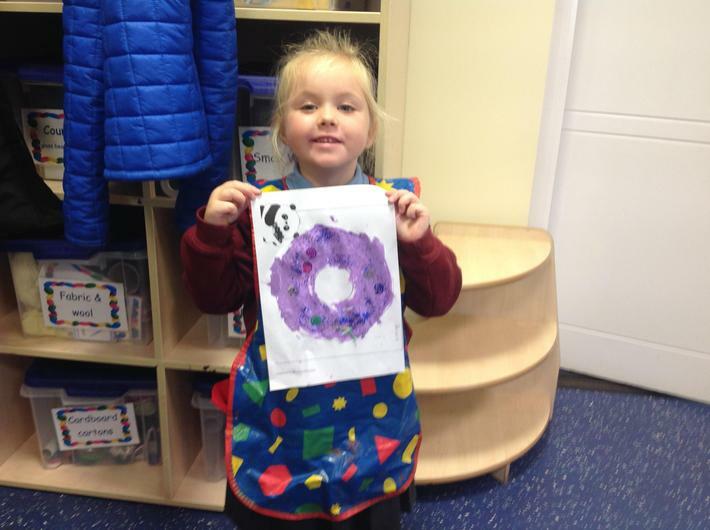 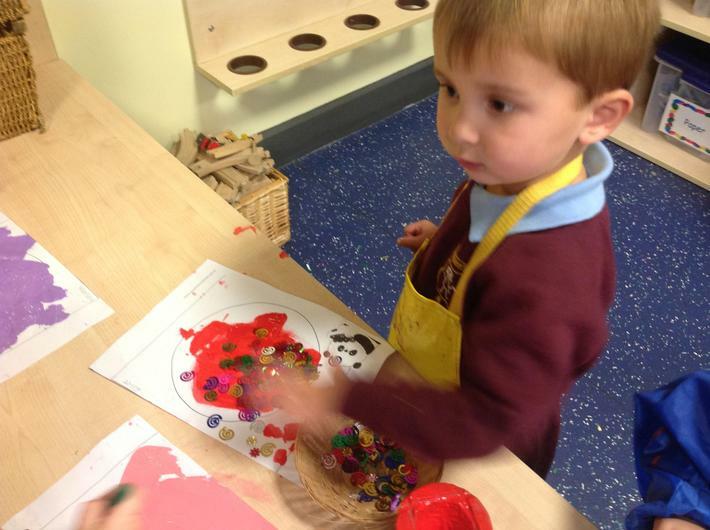 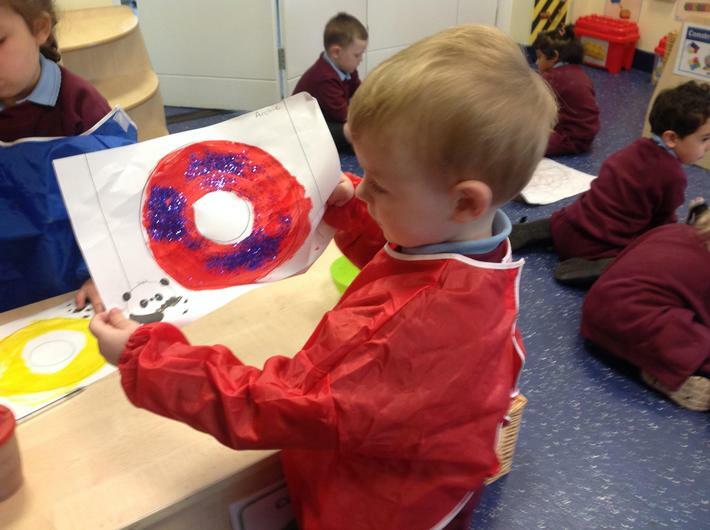 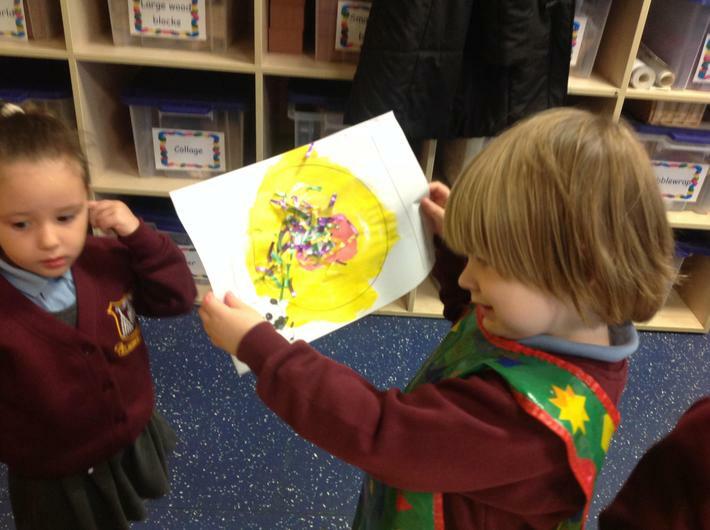 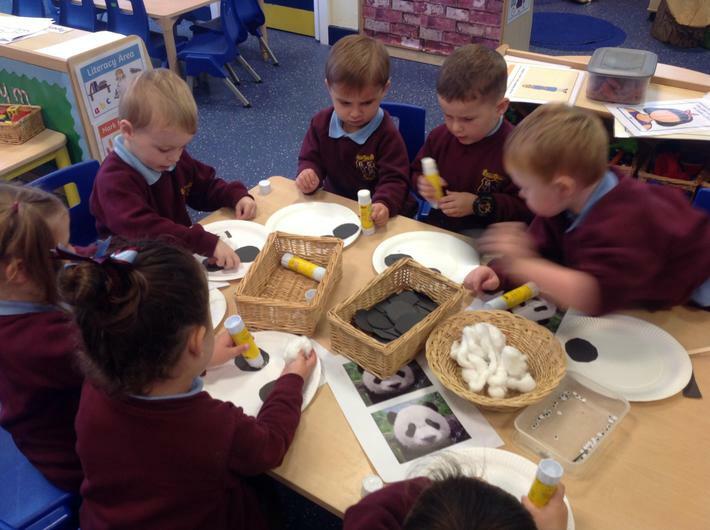 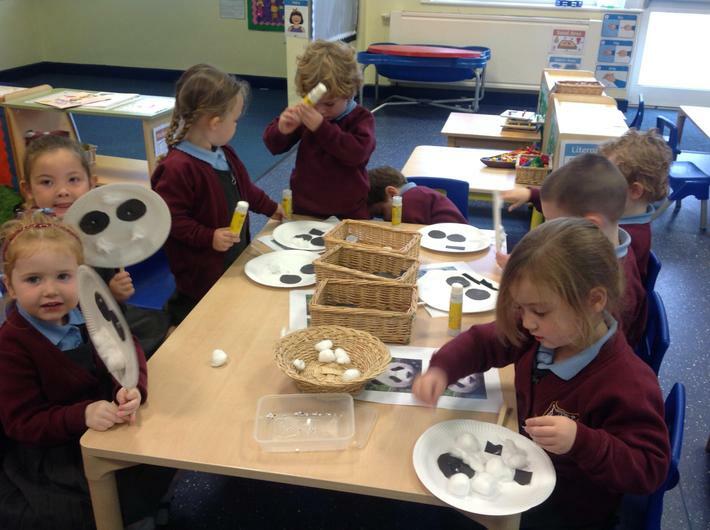 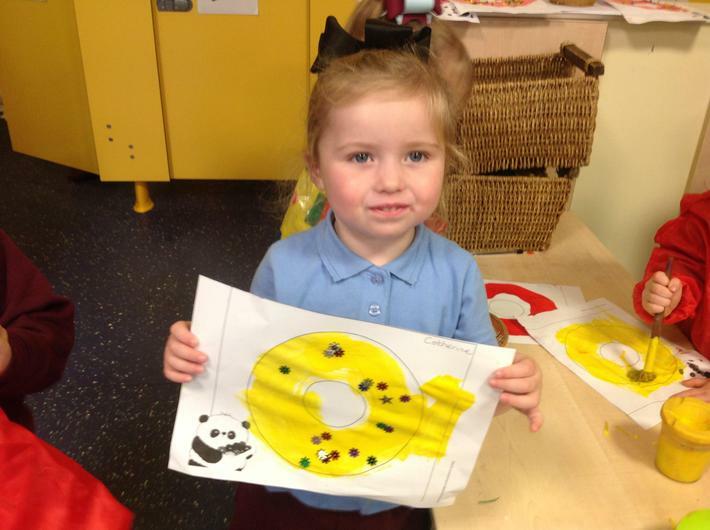 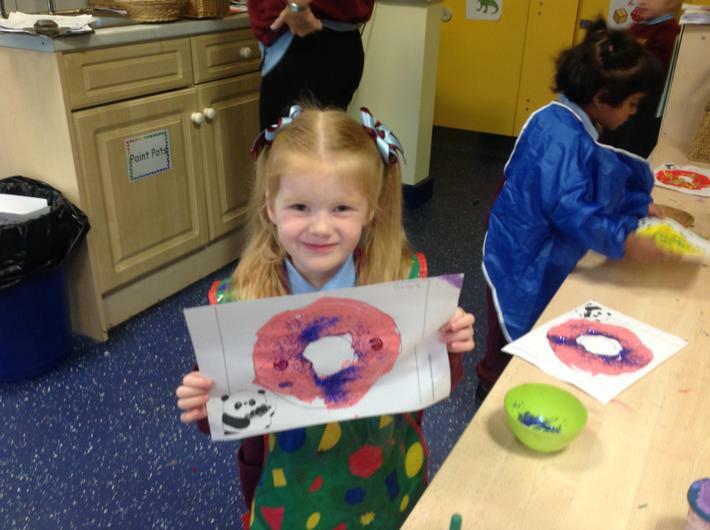 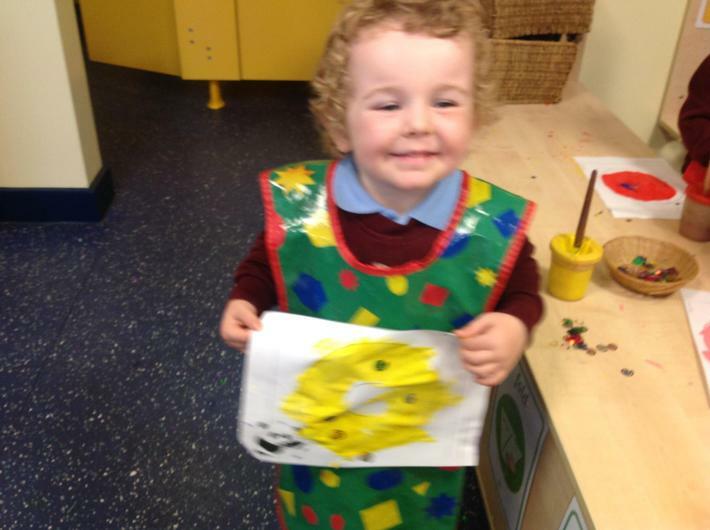 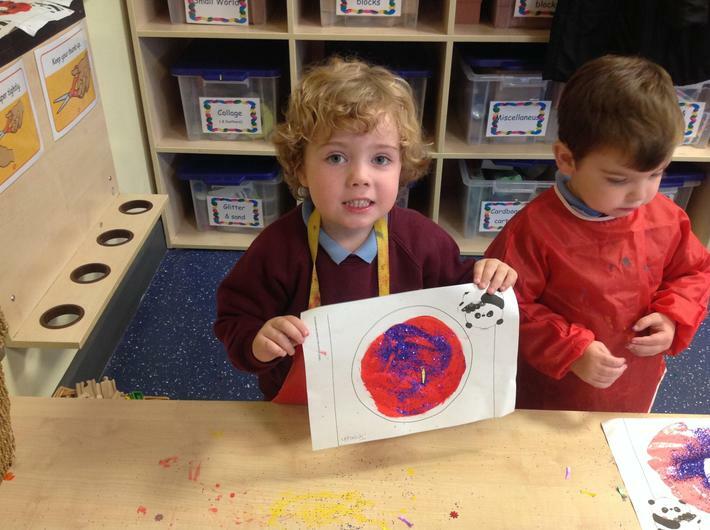 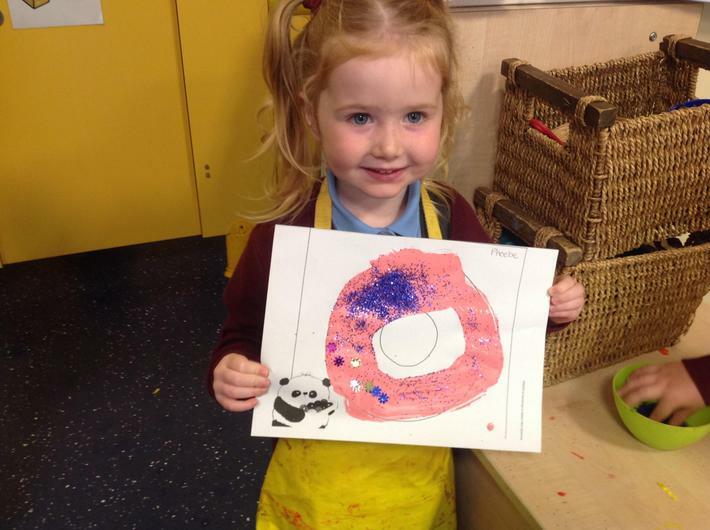 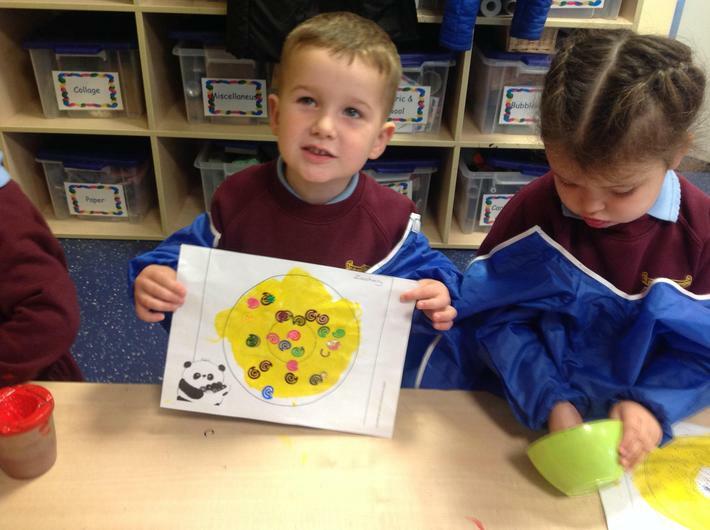 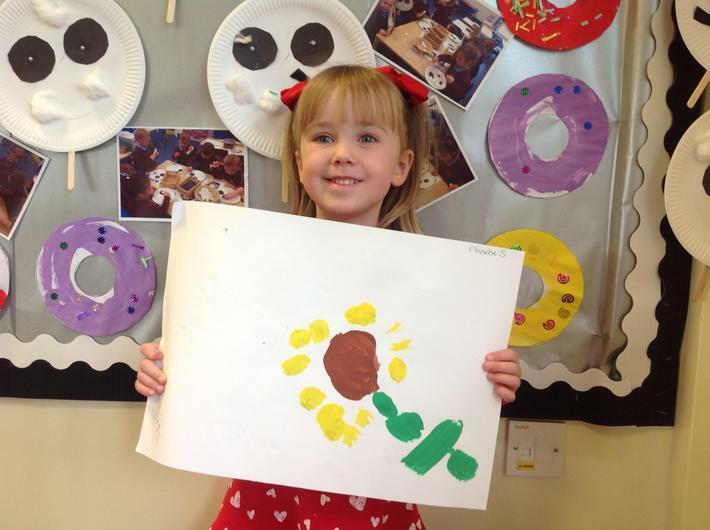 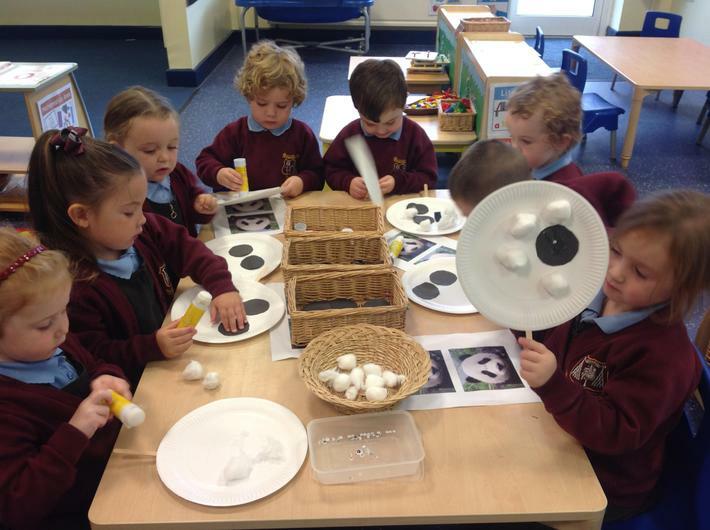 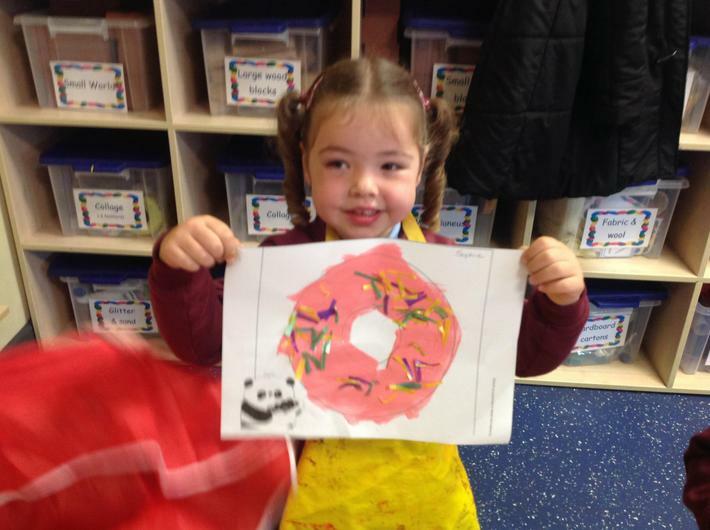 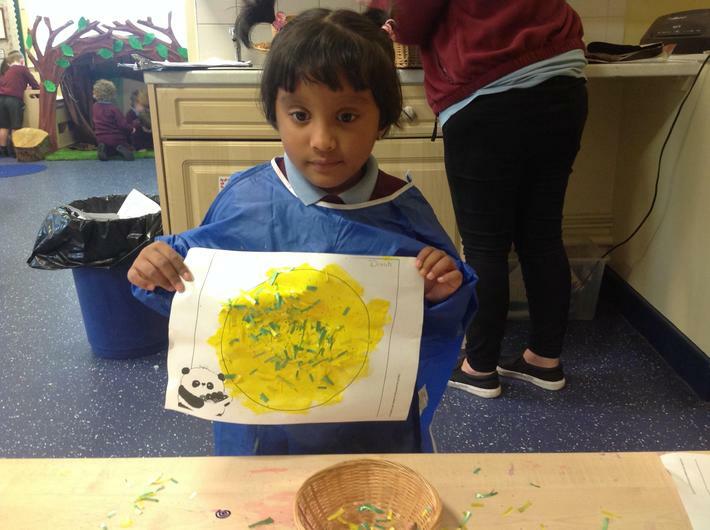 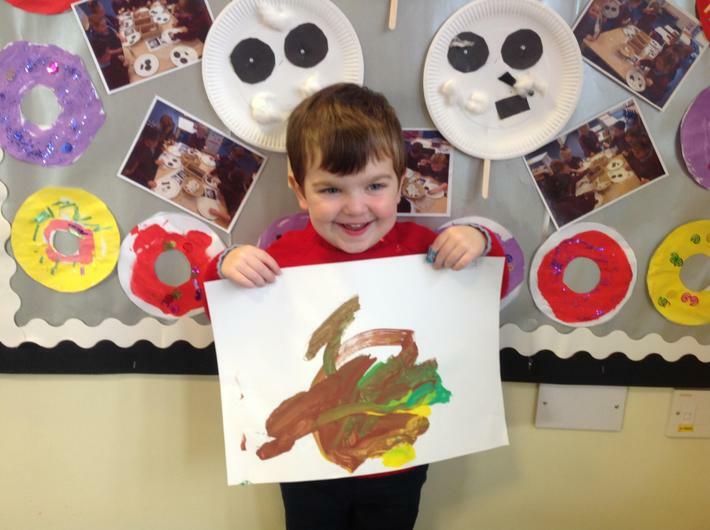 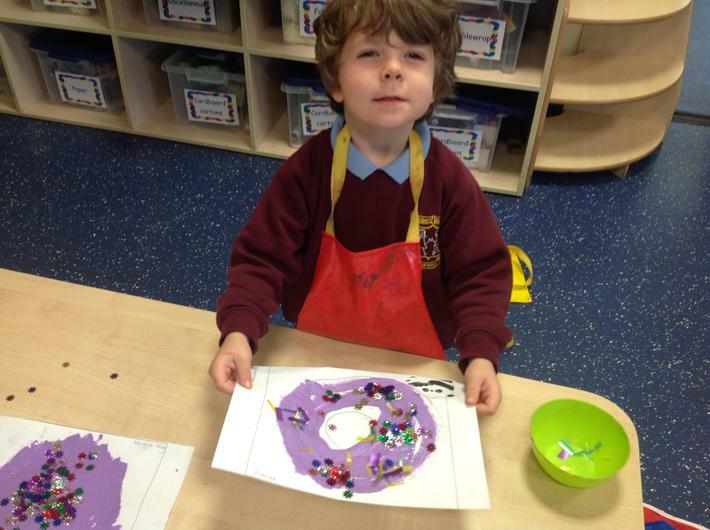 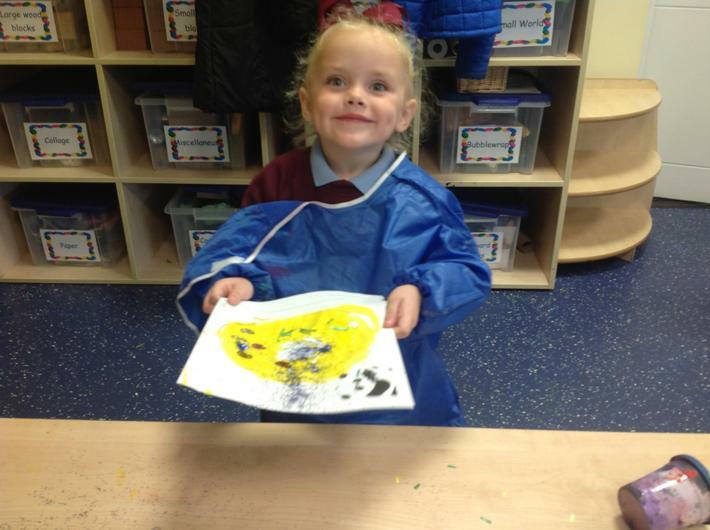 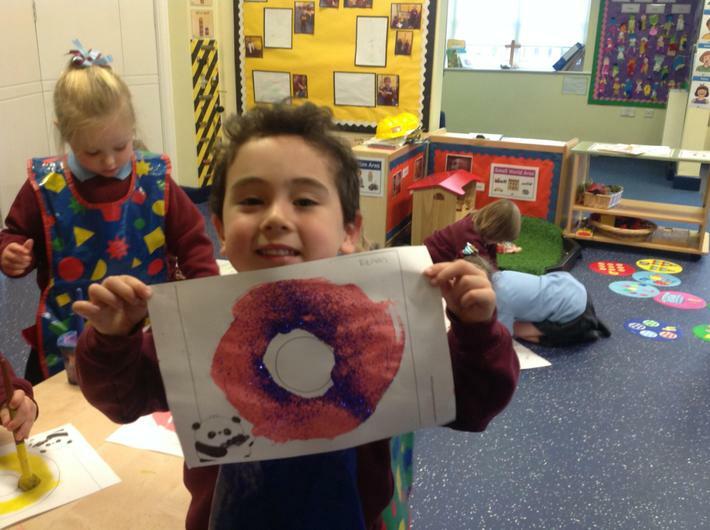 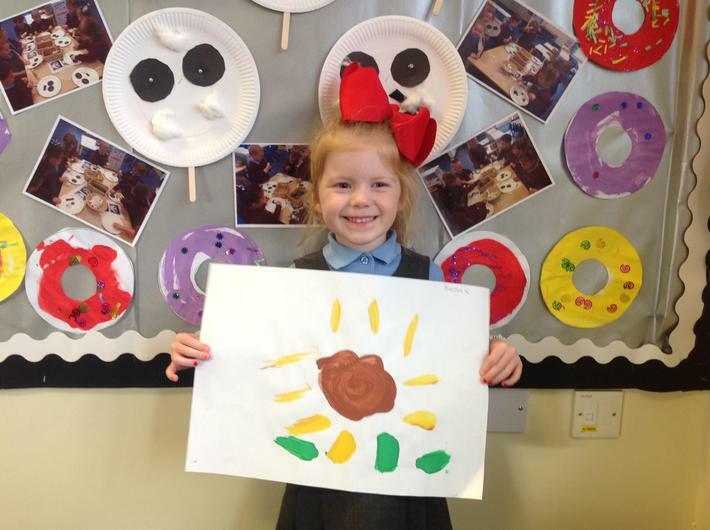 The class have made their own Mr Panda masks, decorated doughnuts, retold the story and drawn the different characters. 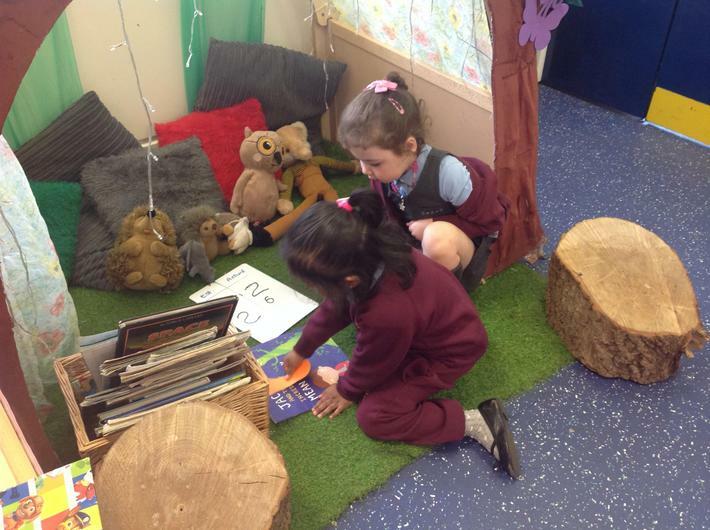 They are really enjoying the story and these books have encouraged them to really think about why manners are so important. 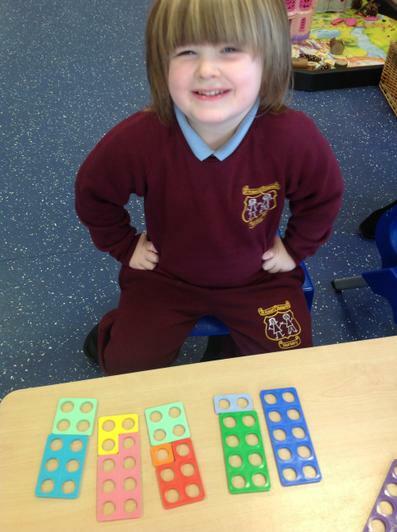 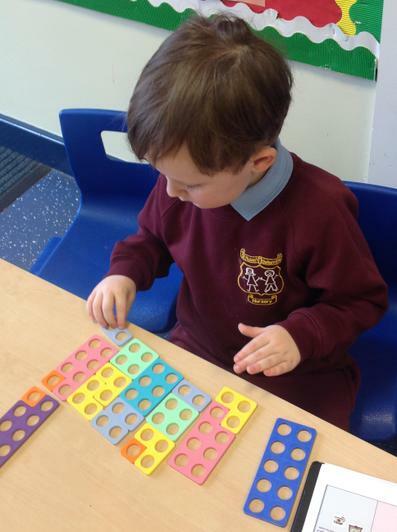 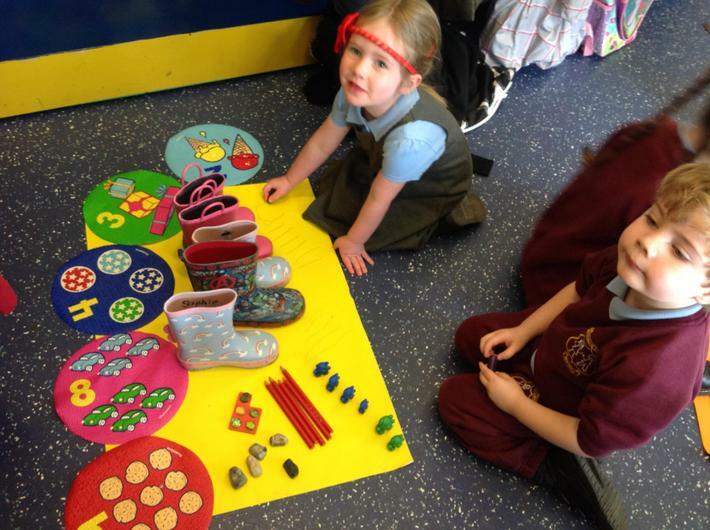 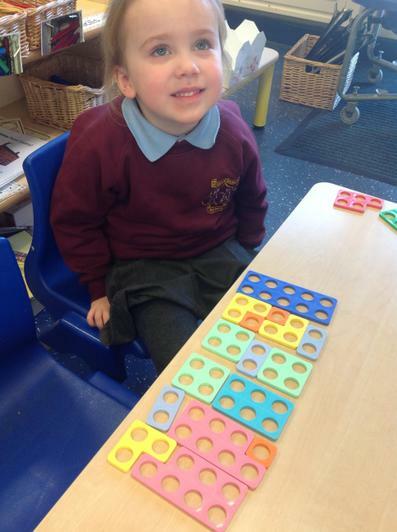 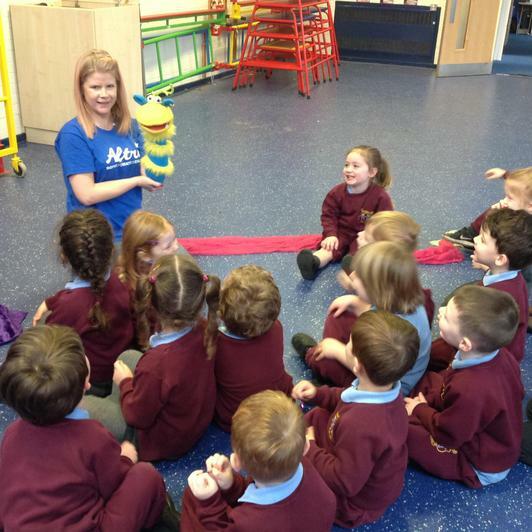 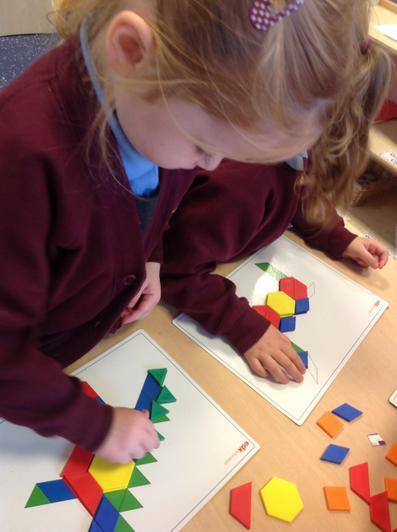 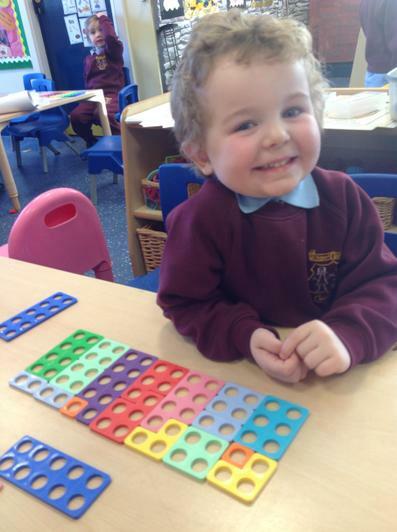 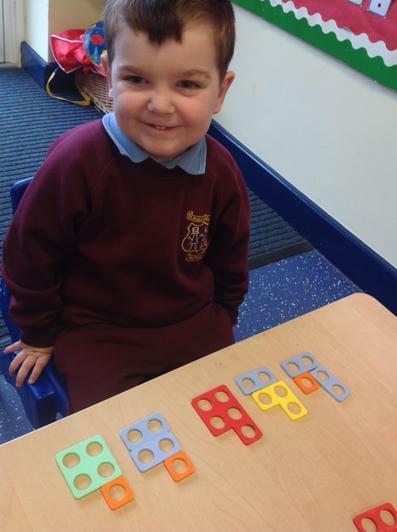 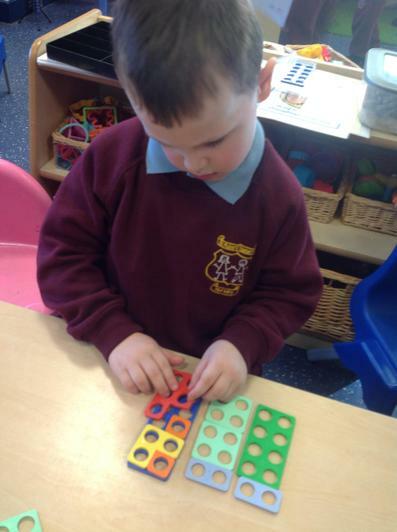 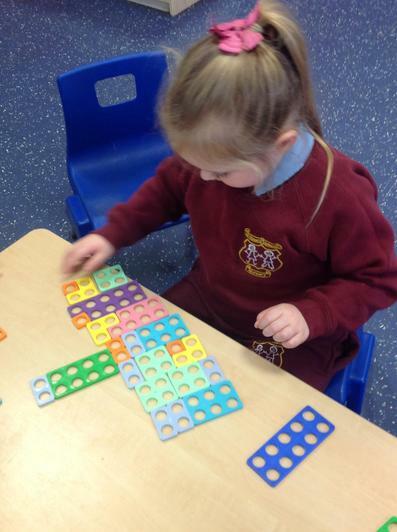 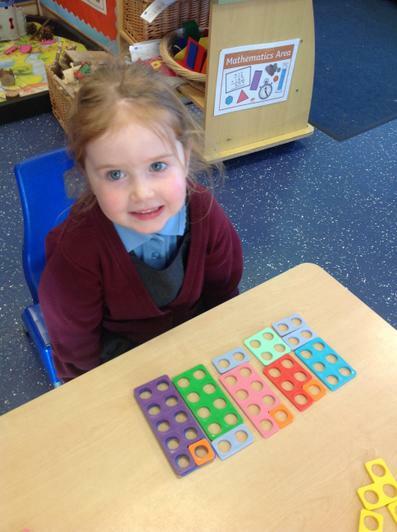 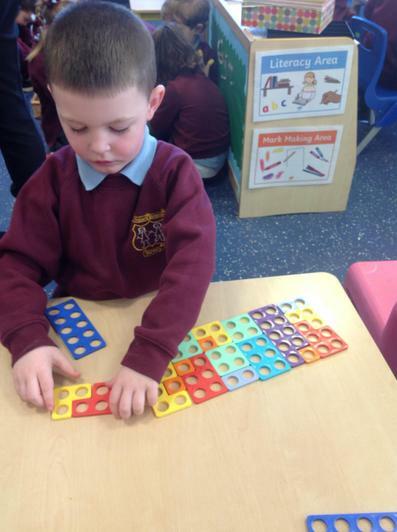 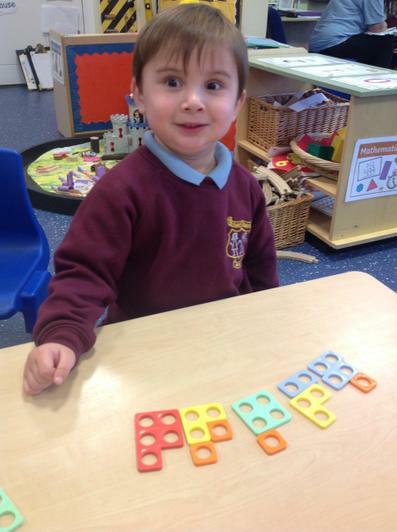 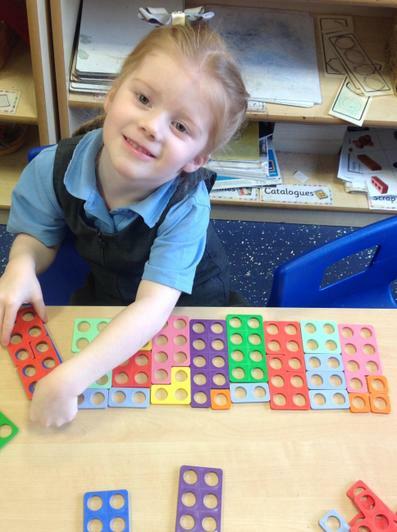 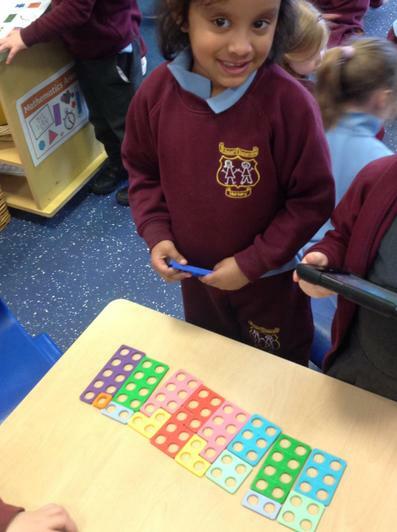 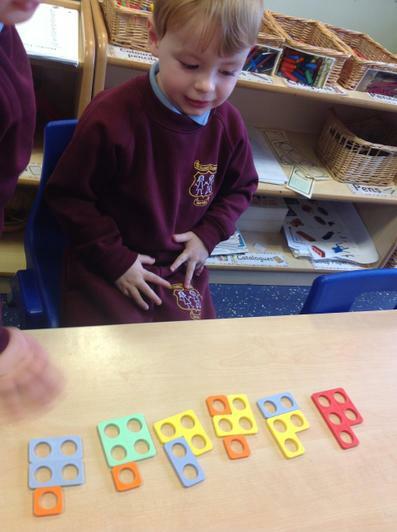 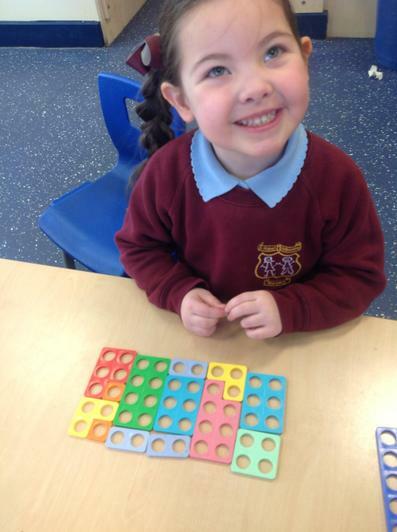 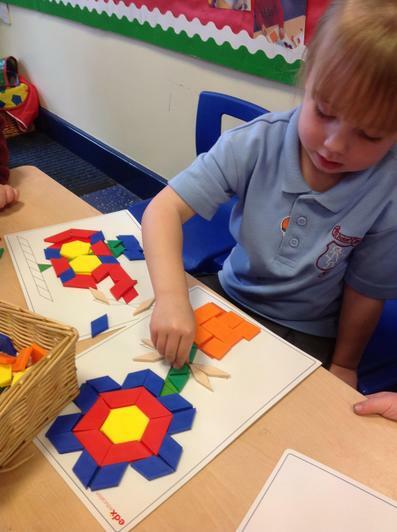 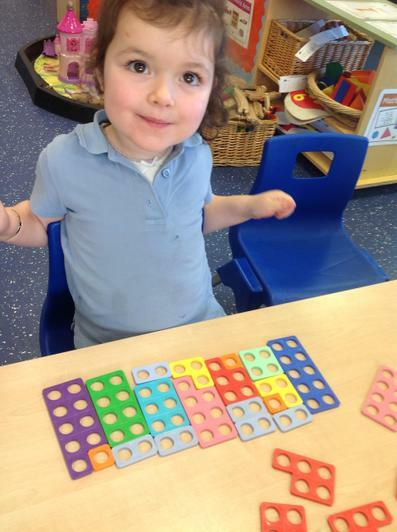 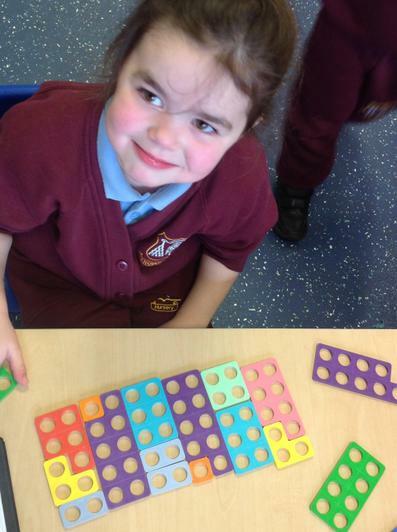 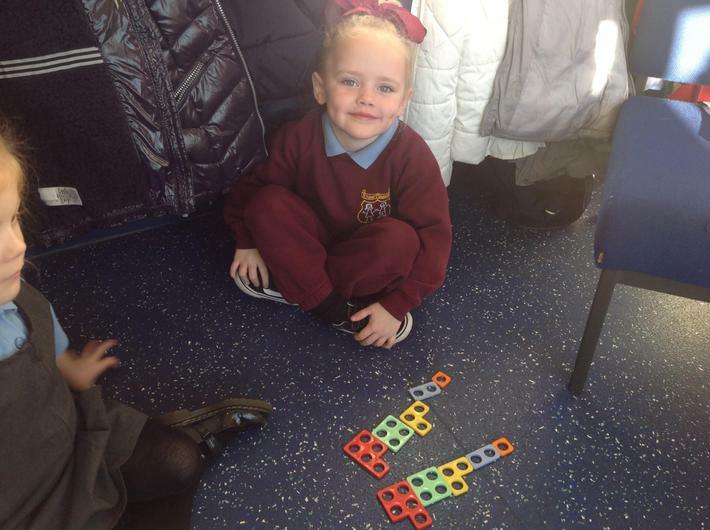 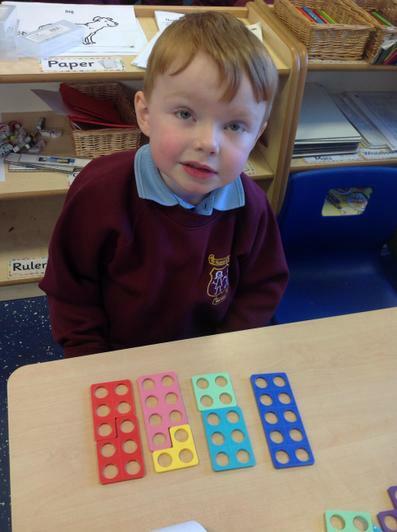 We have just started introducing the Numicon resources to the class. 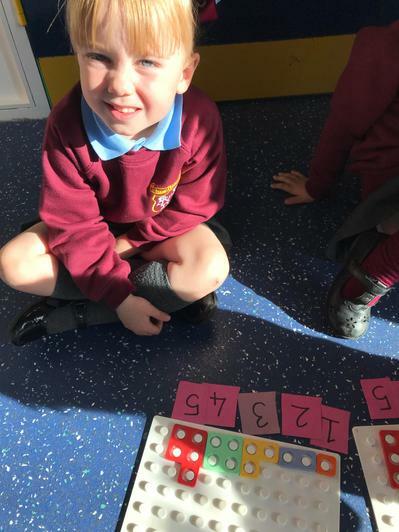 They are already becoming familiar with their corresponding numerical value. 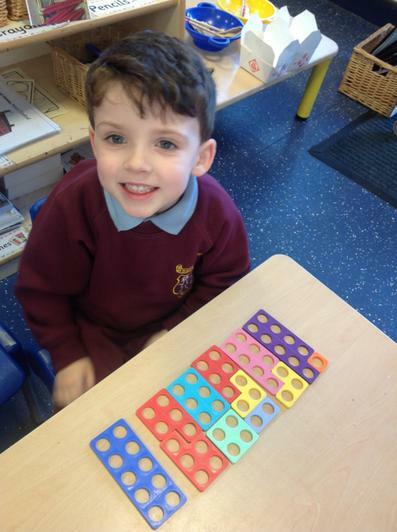 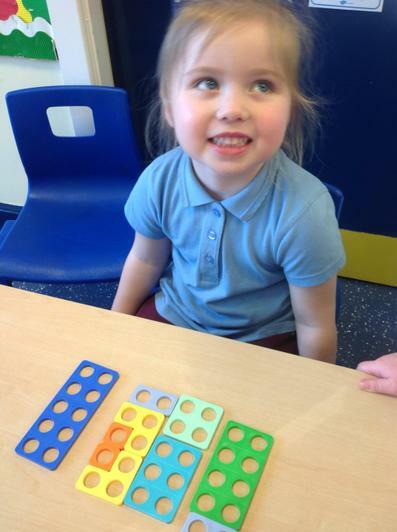 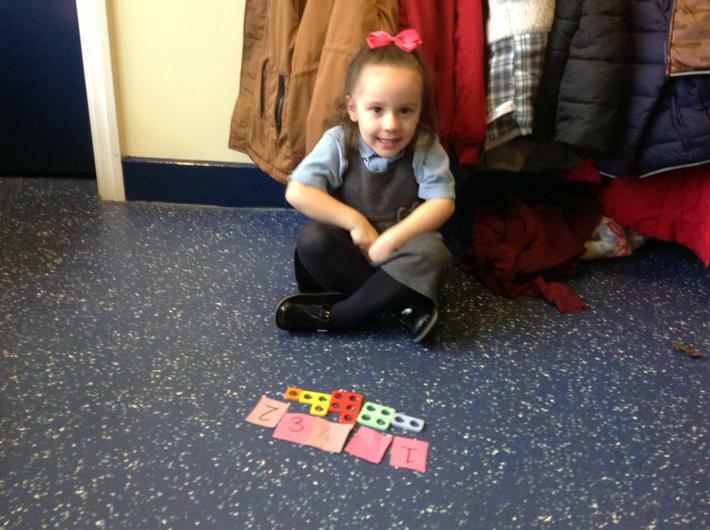 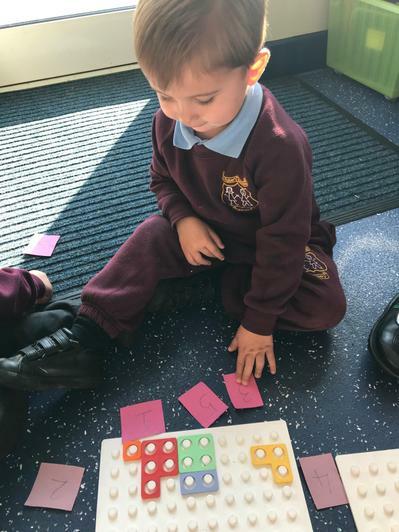 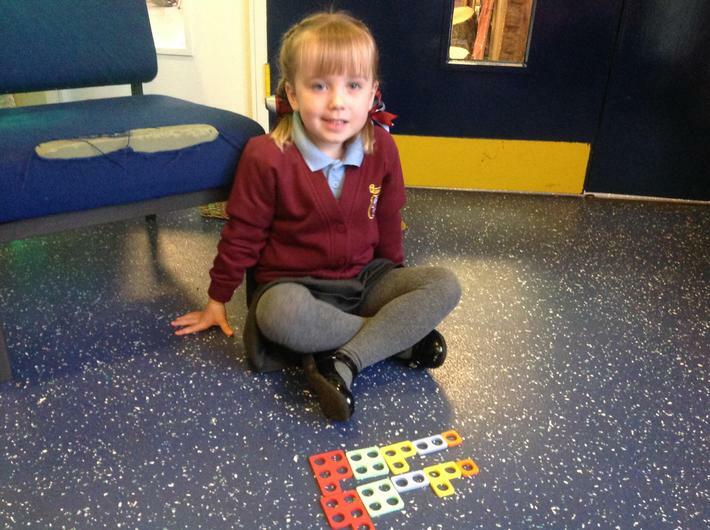 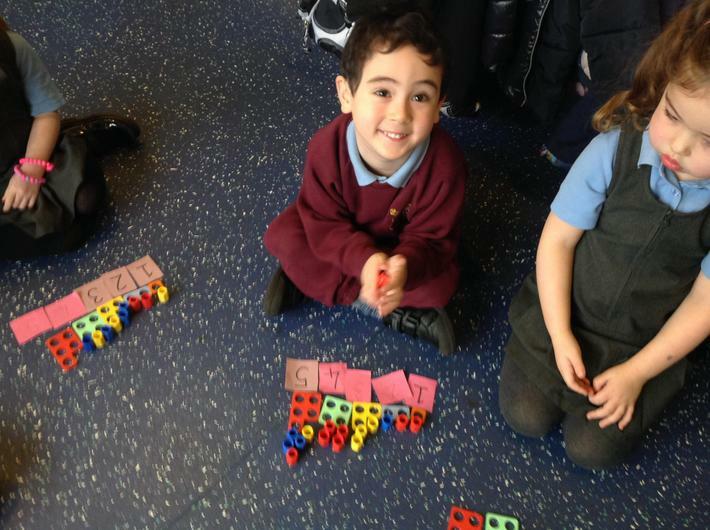 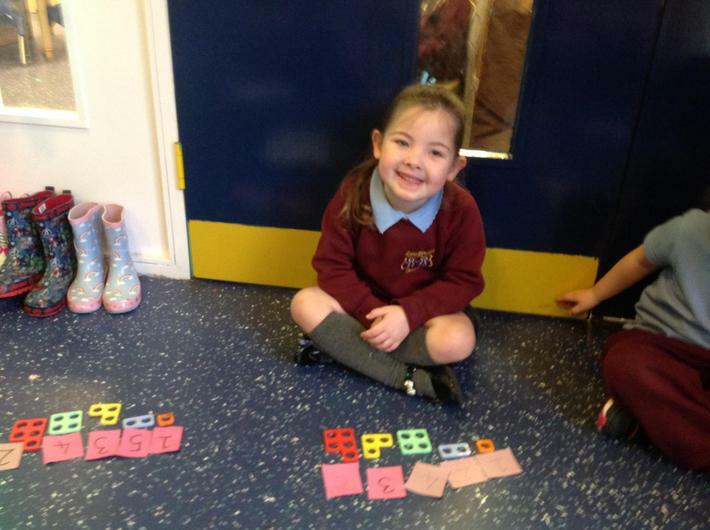 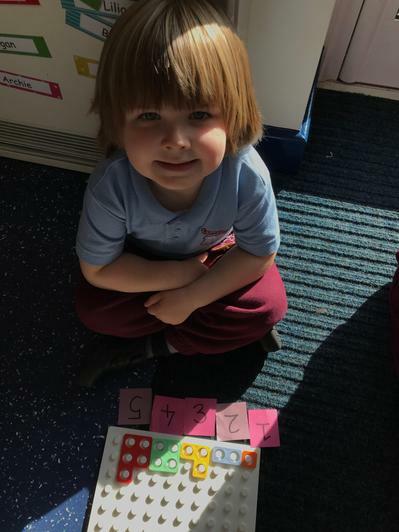 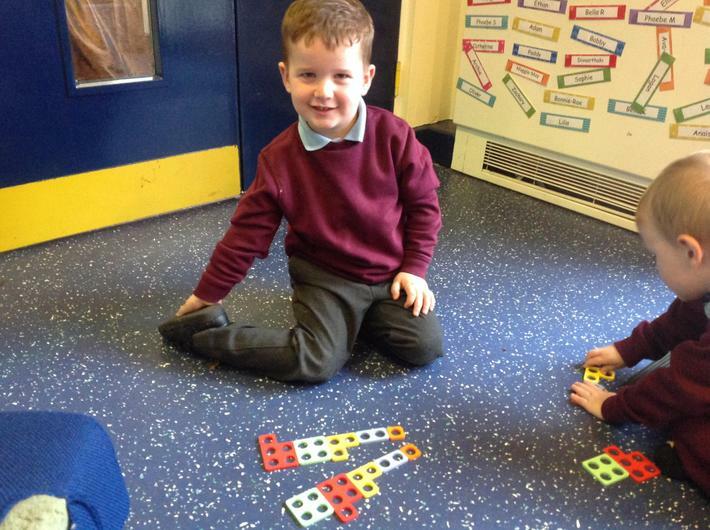 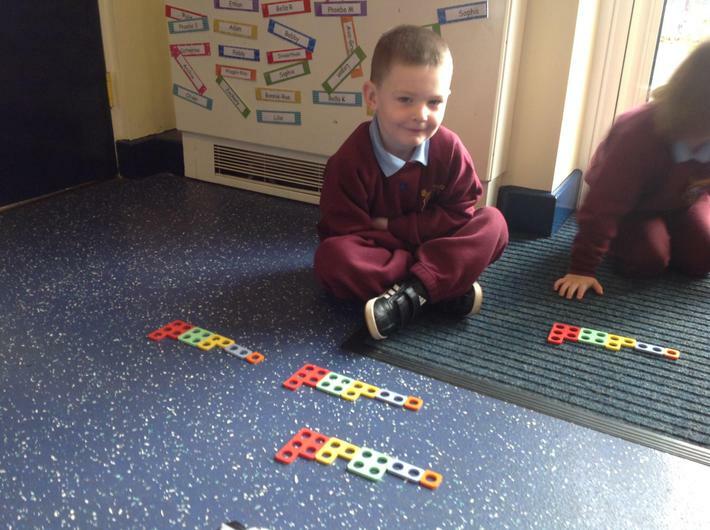 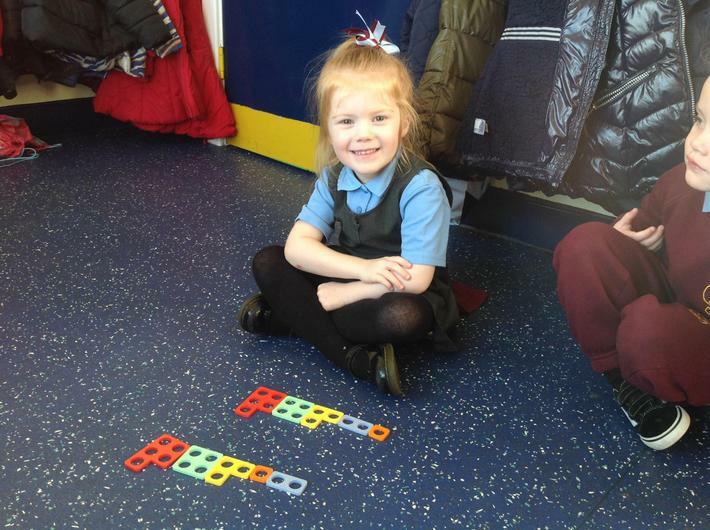 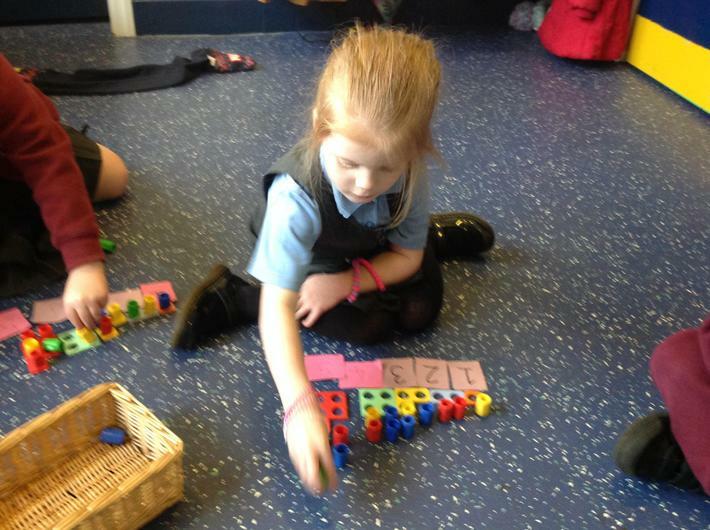 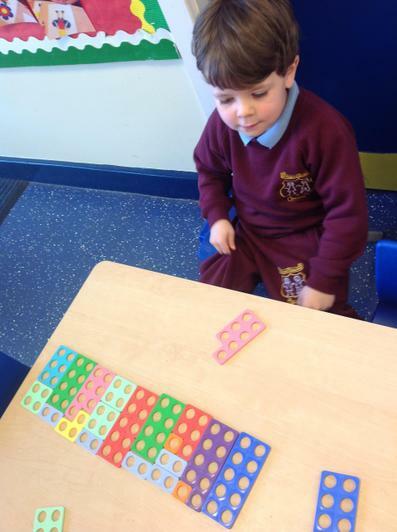 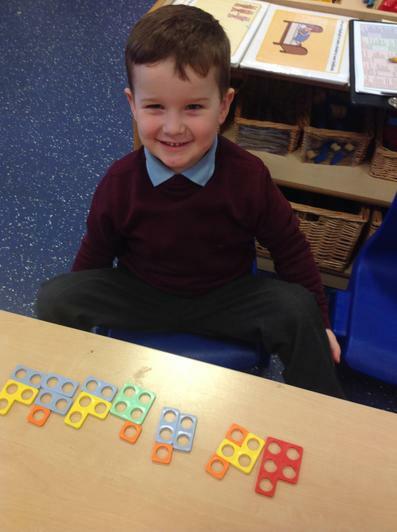 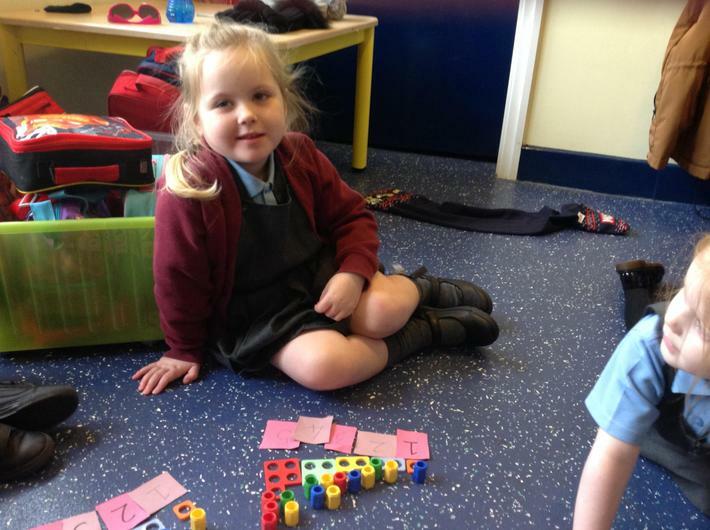 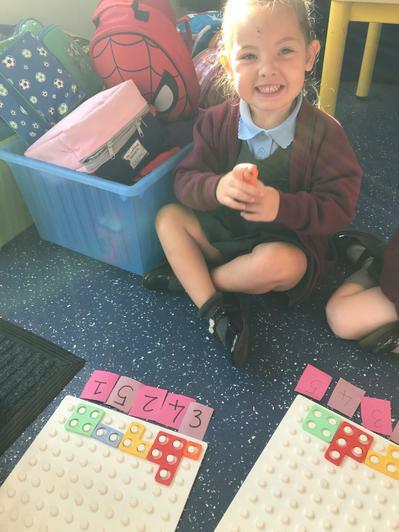 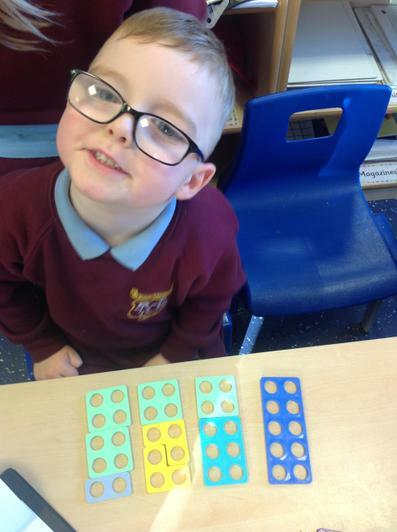 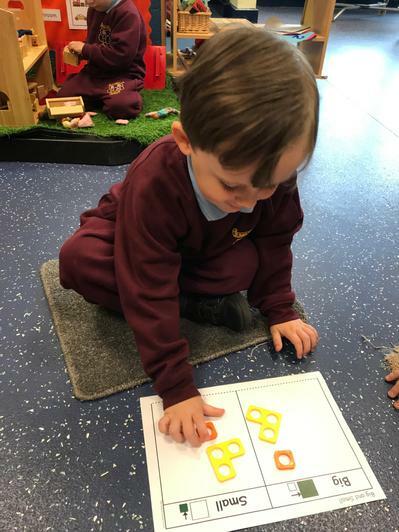 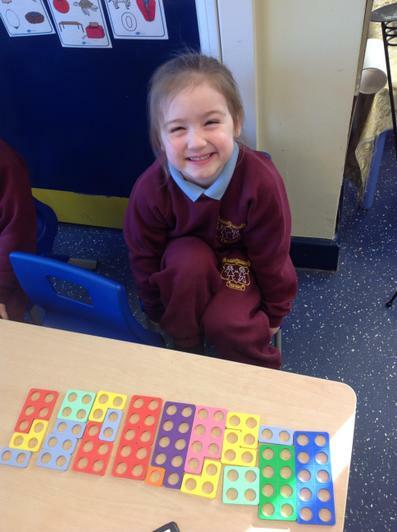 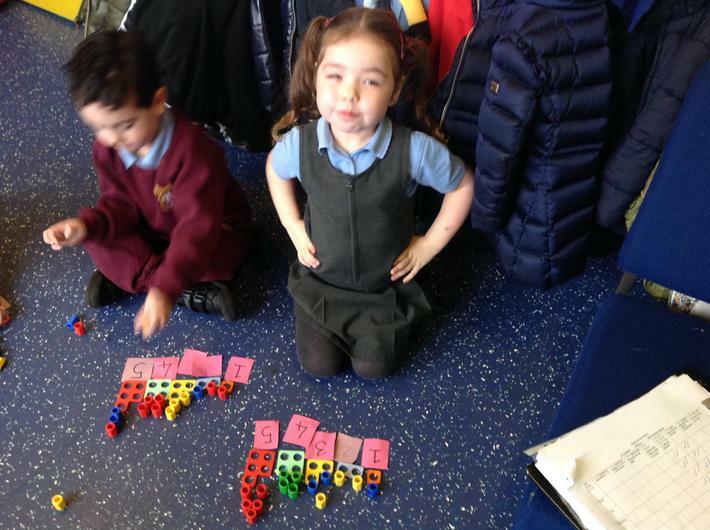 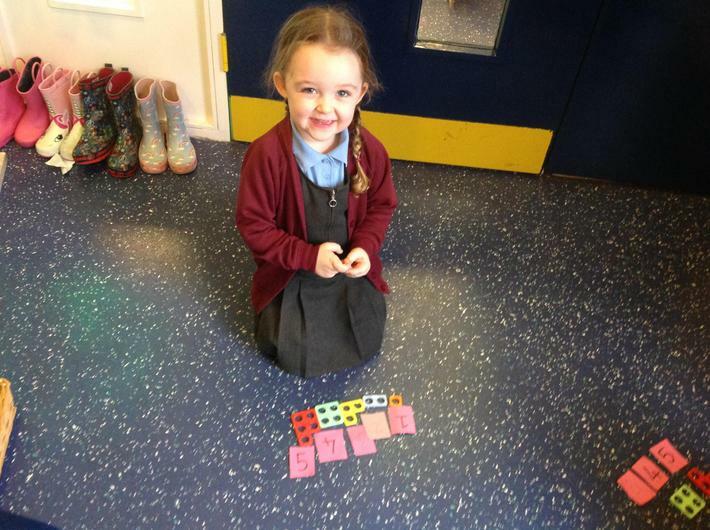 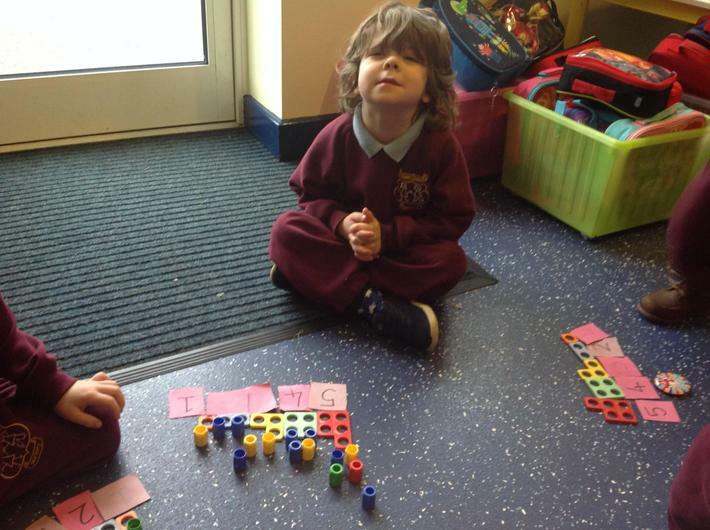 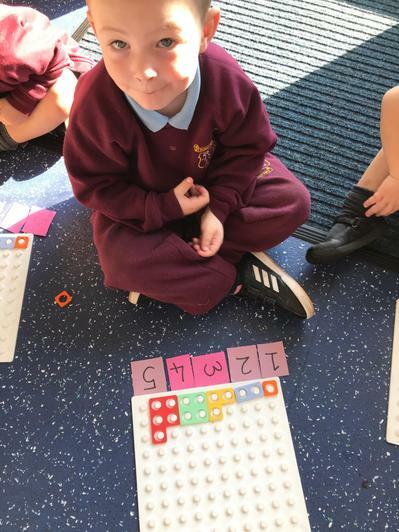 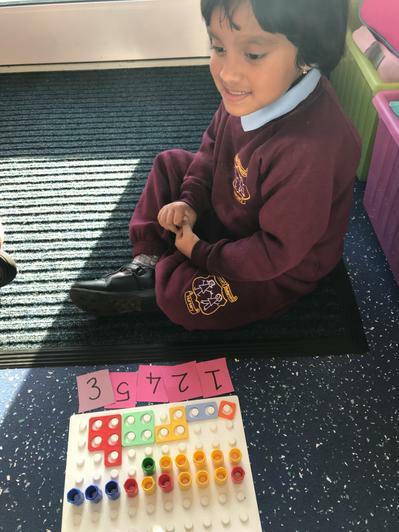 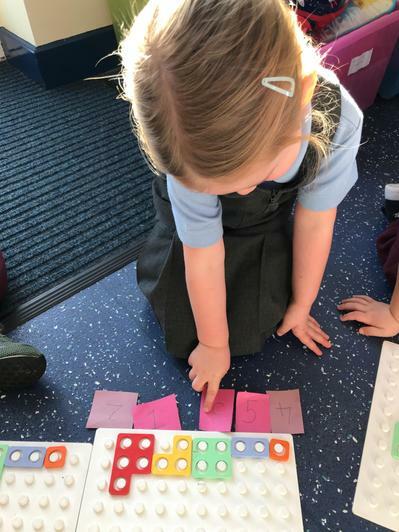 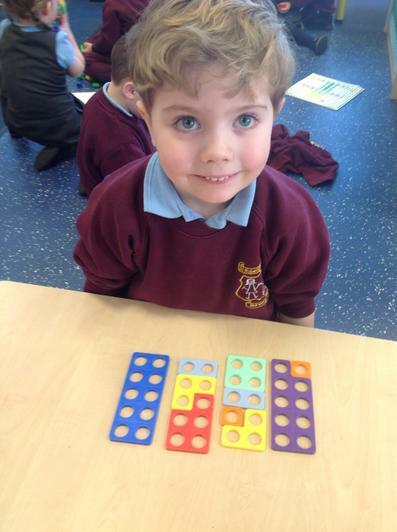 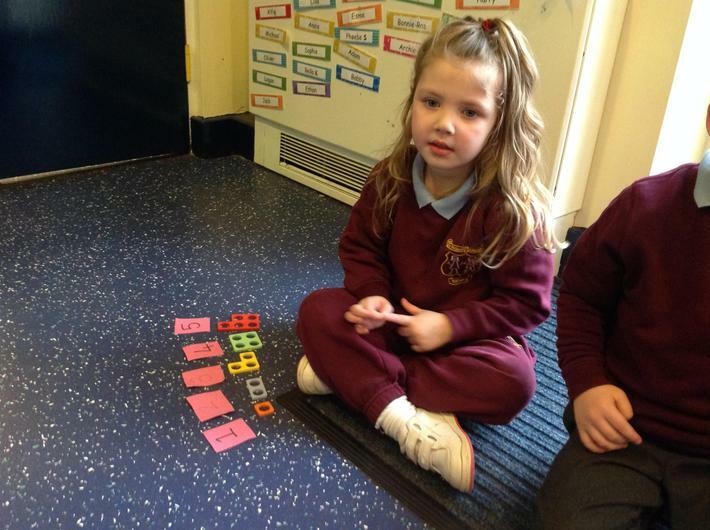 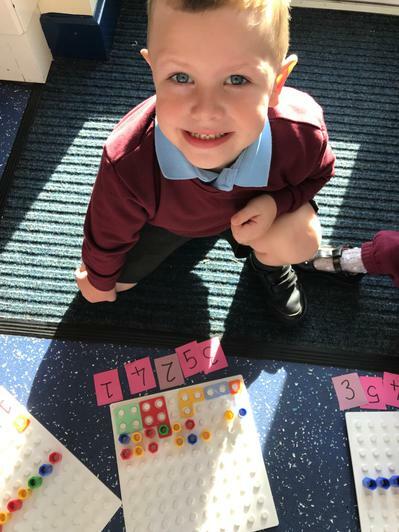 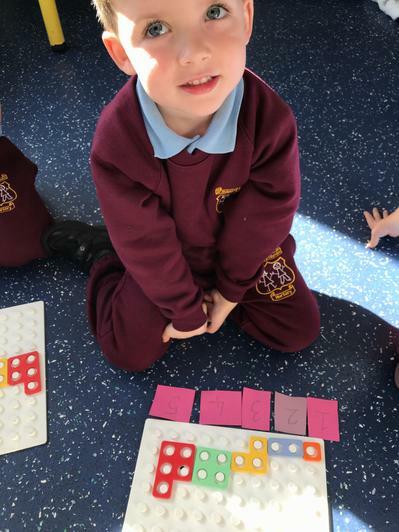 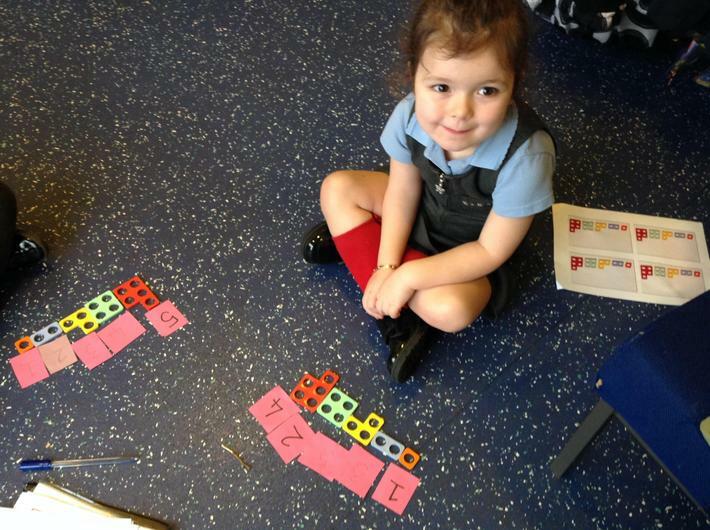 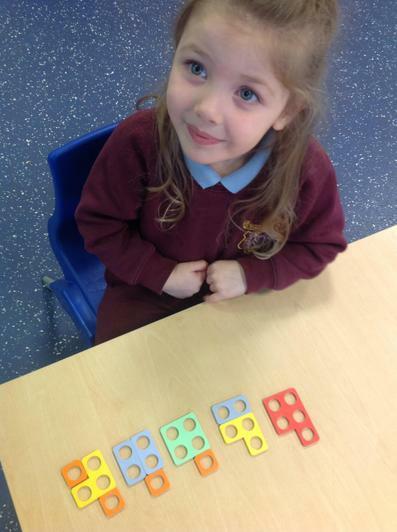 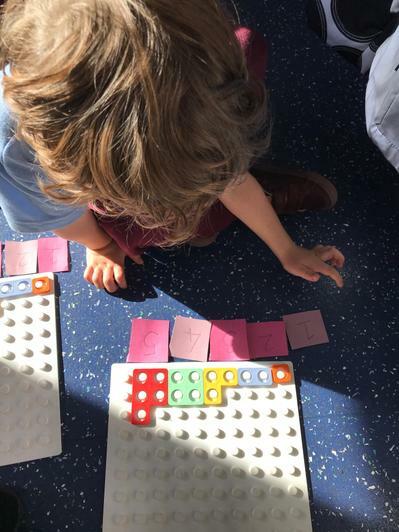 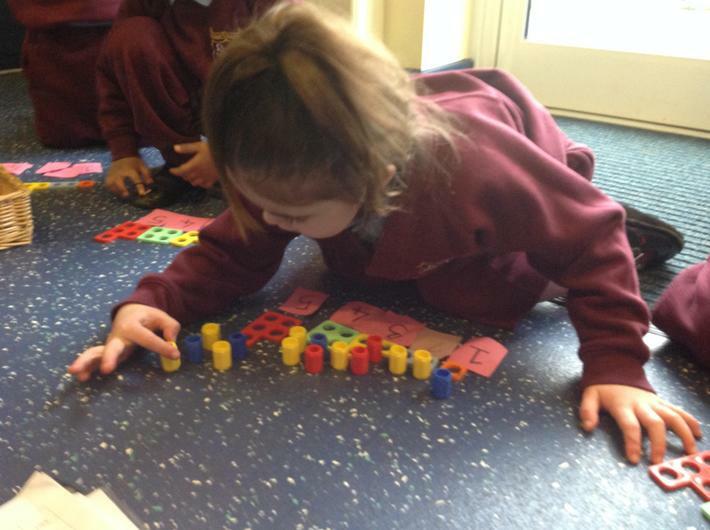 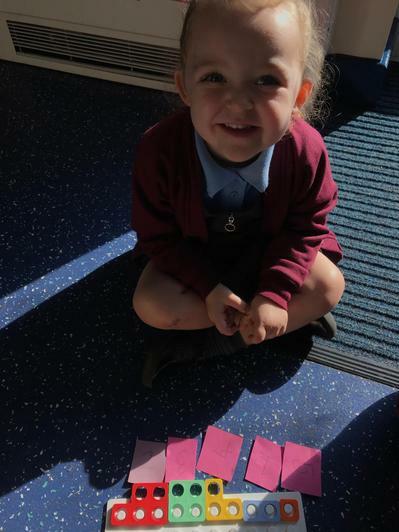 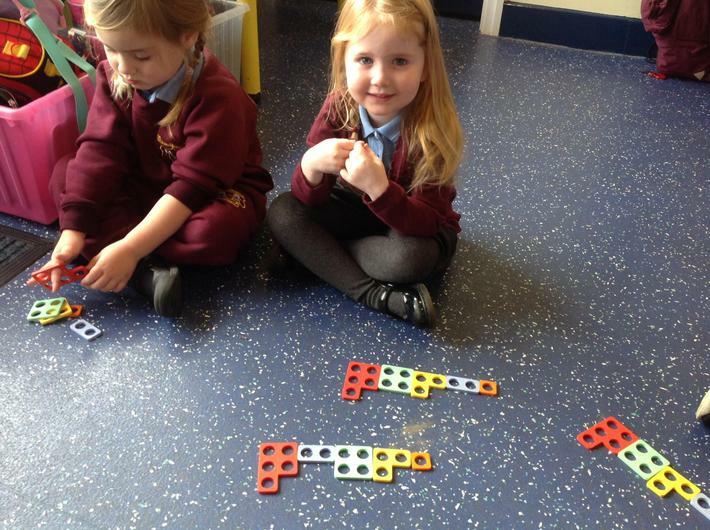 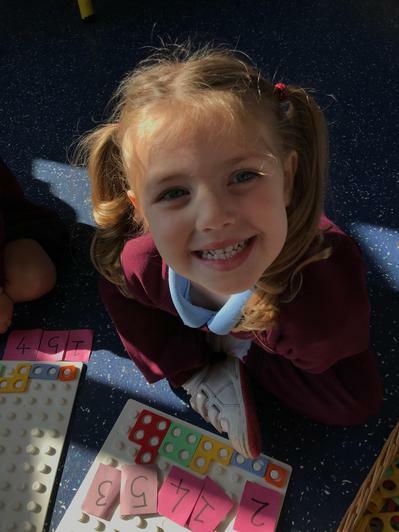 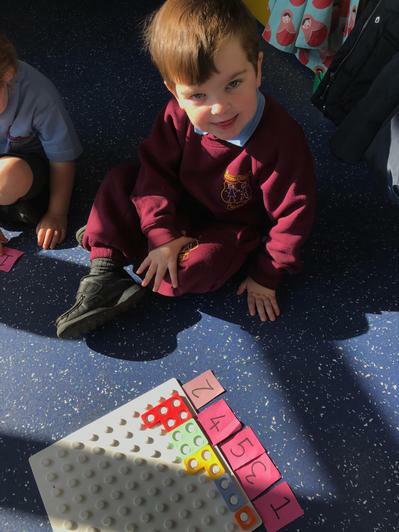 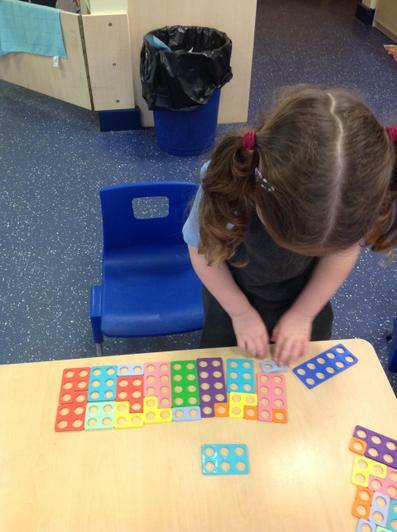 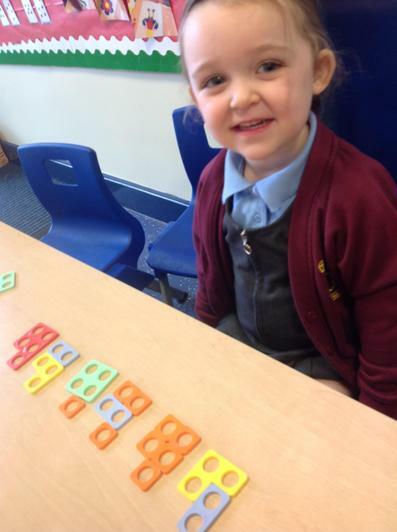 As part of our investigations we have made Numicon staircases (1-5) and used the tcharts to sort between big and small numbers and to correct Miss' mistakes. 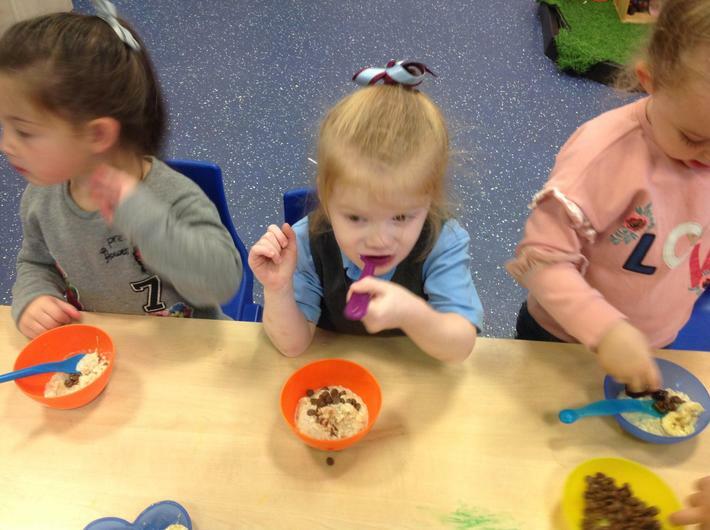 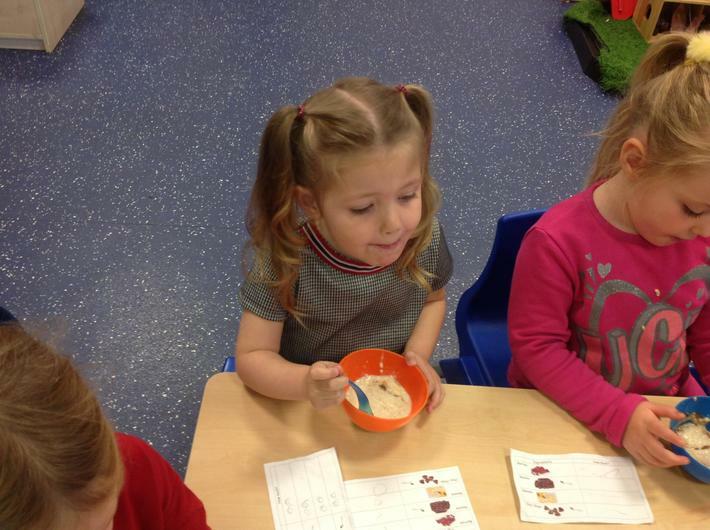 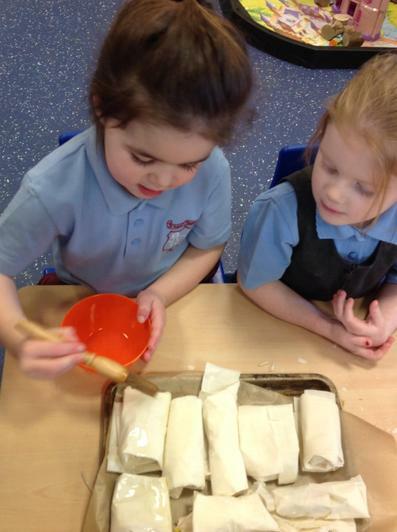 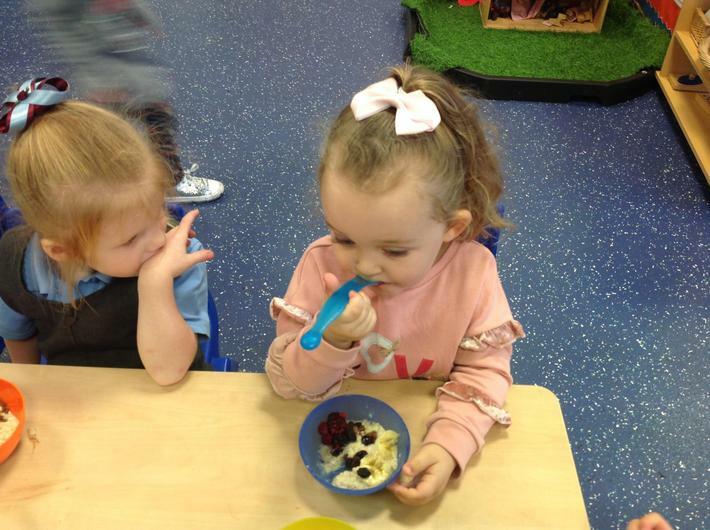 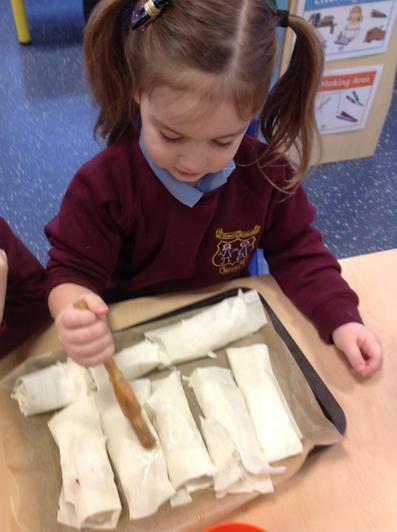 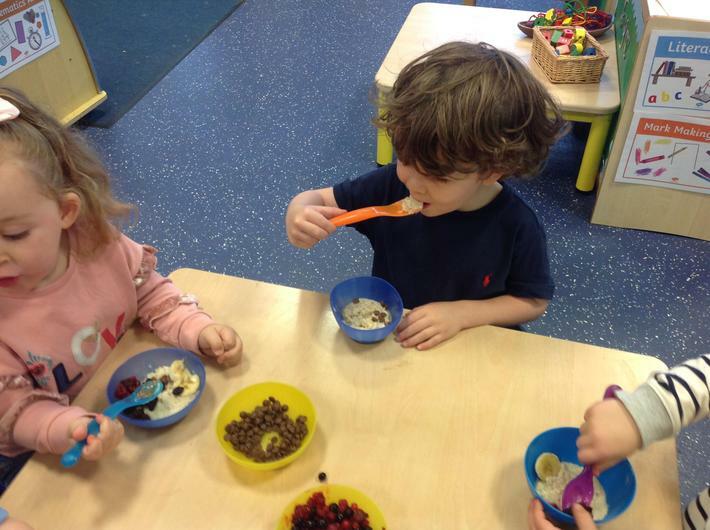 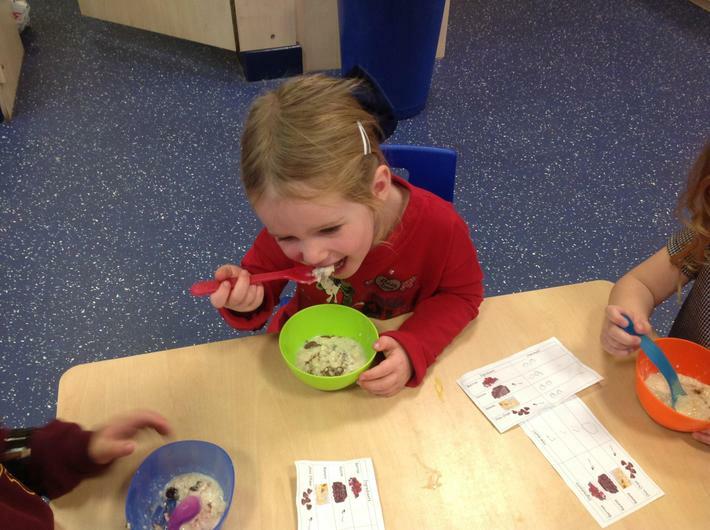 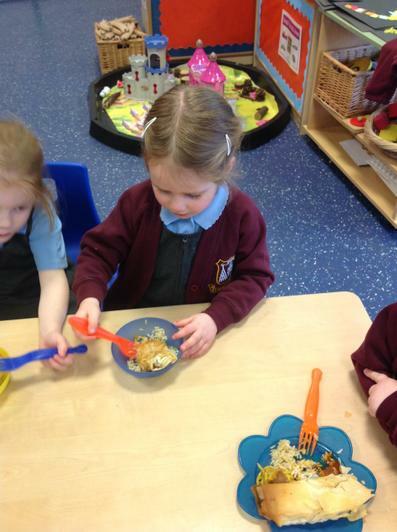 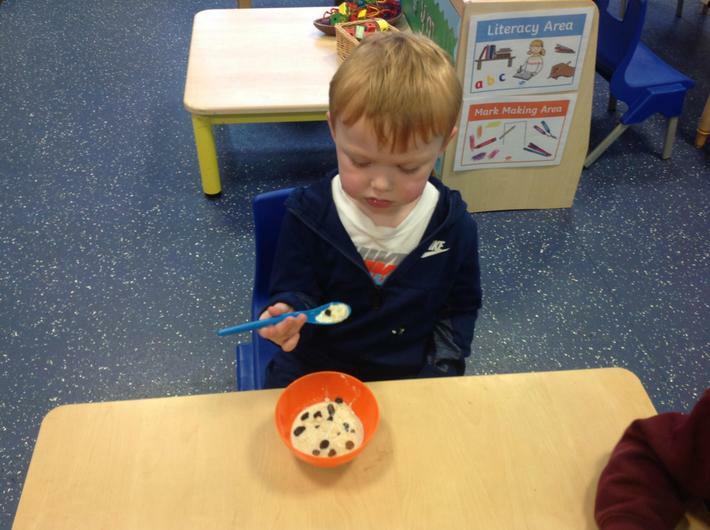 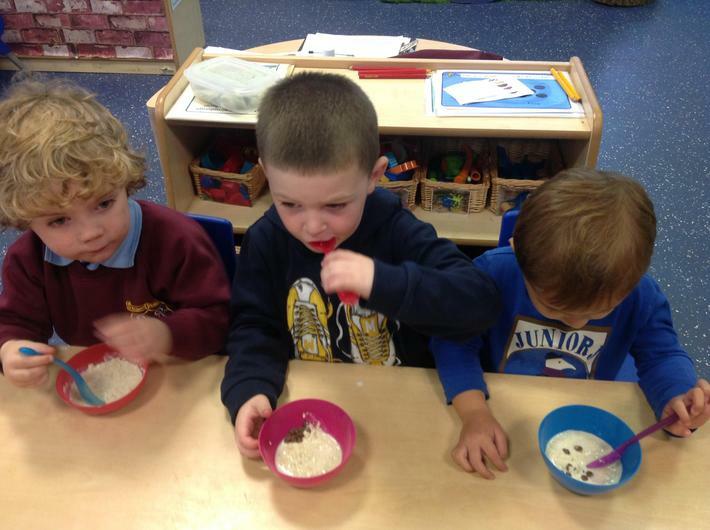 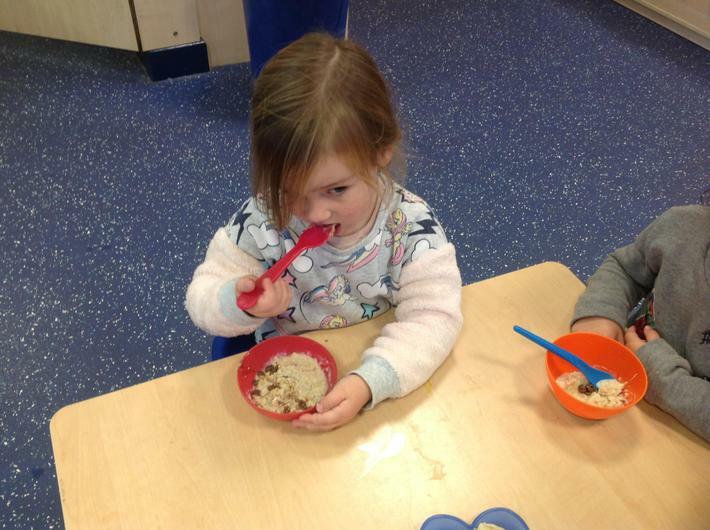 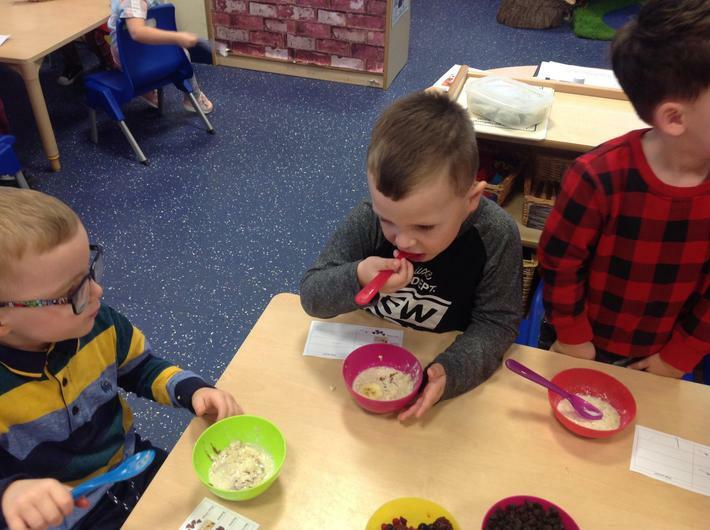 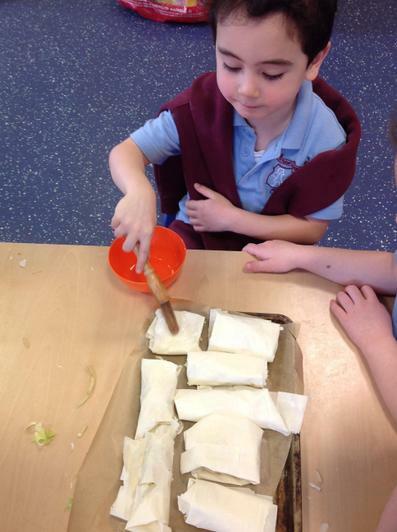 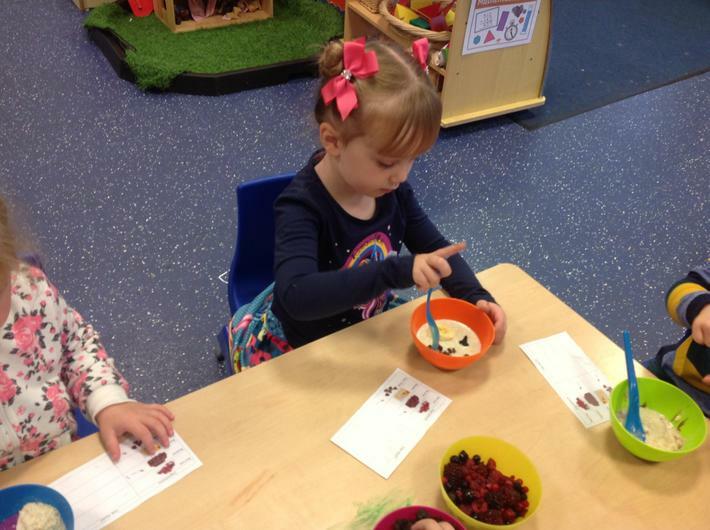 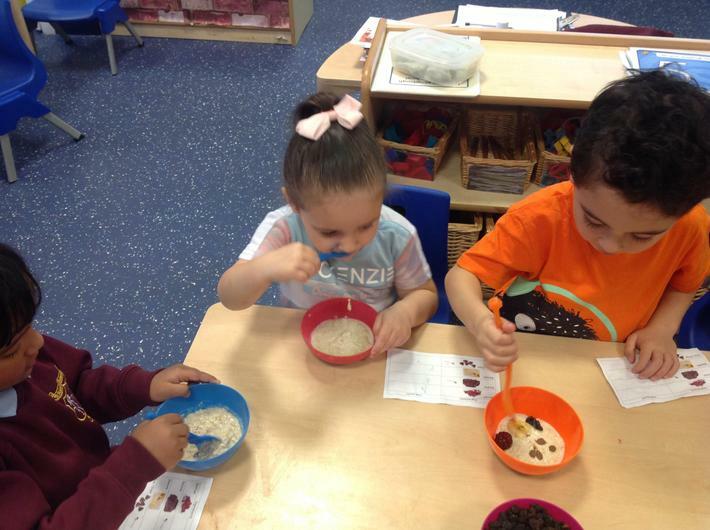 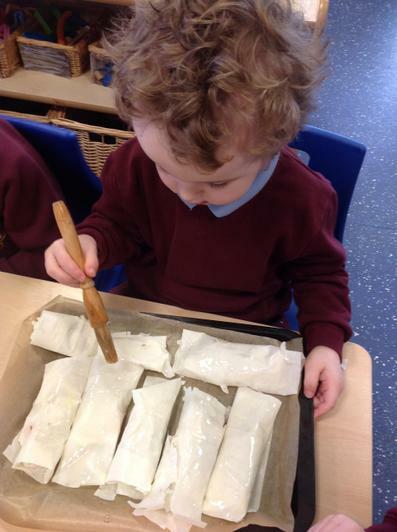 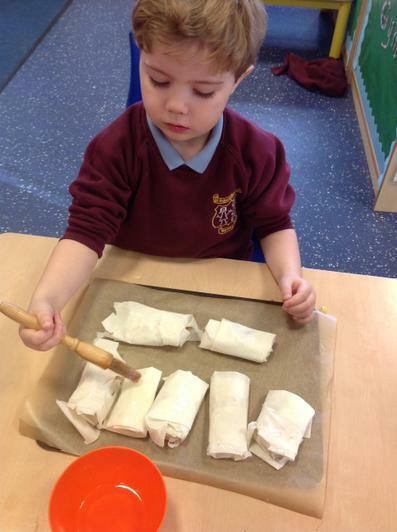 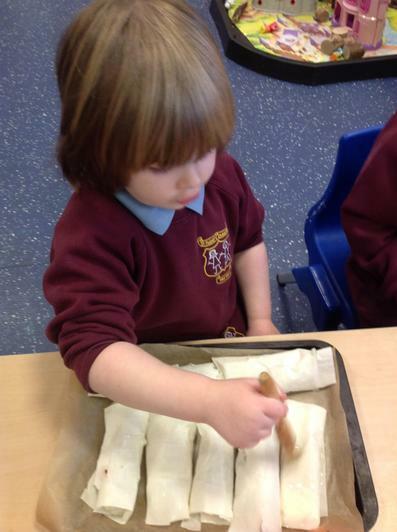 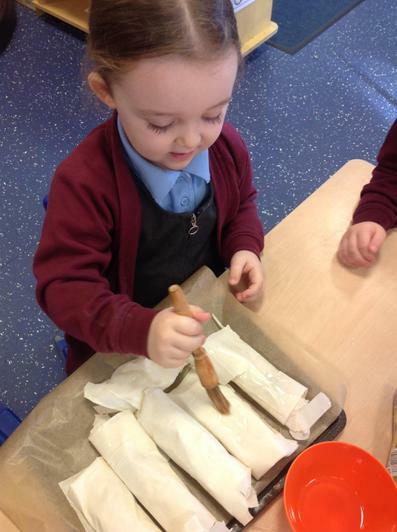 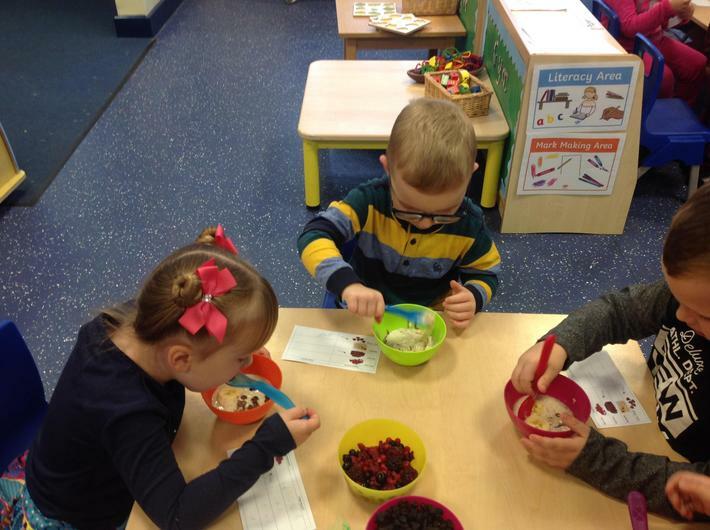 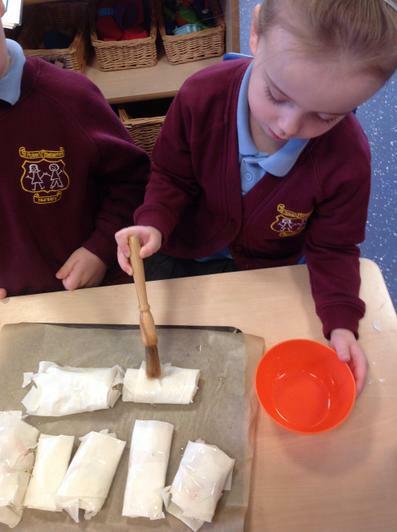 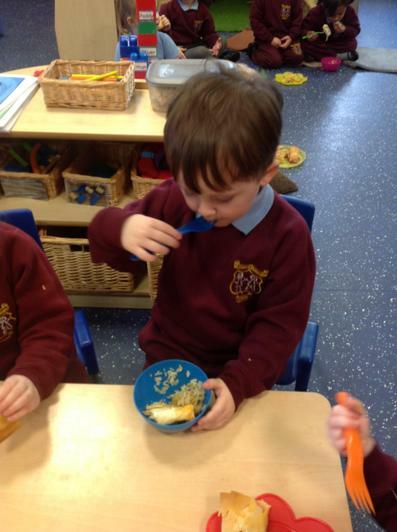 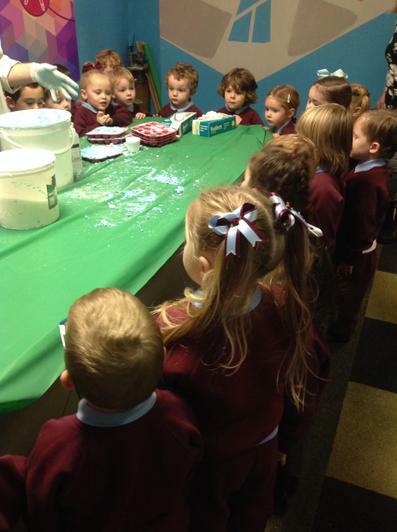 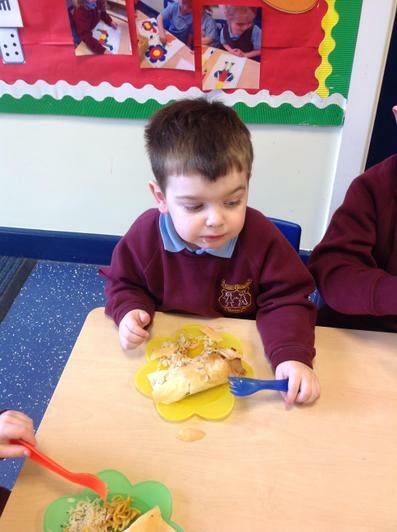 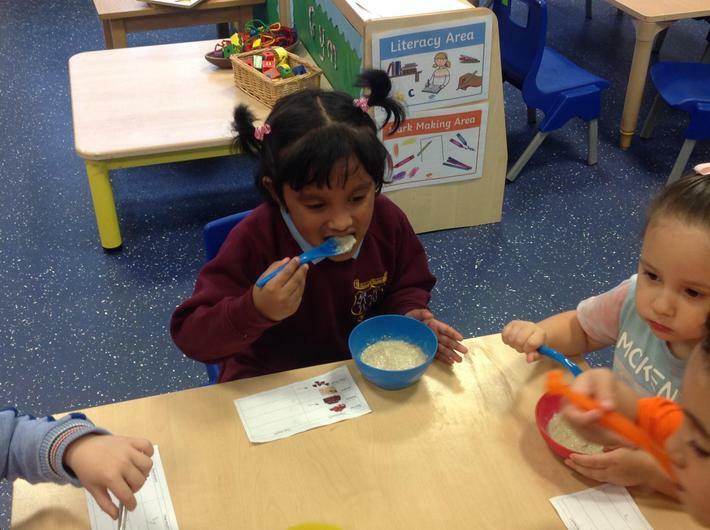 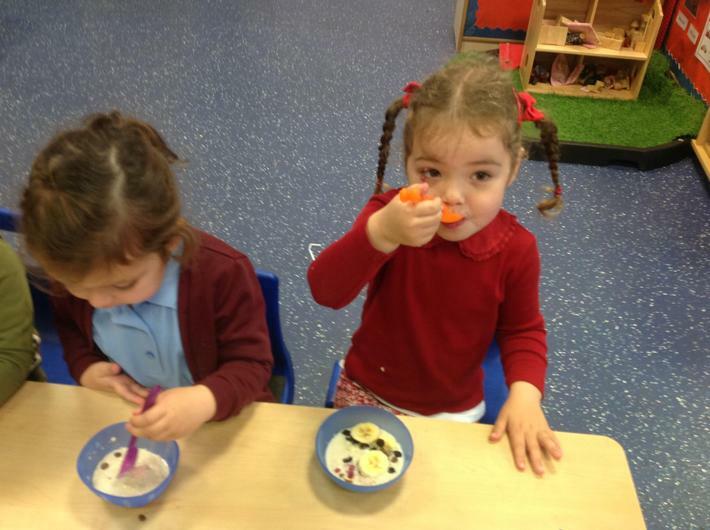 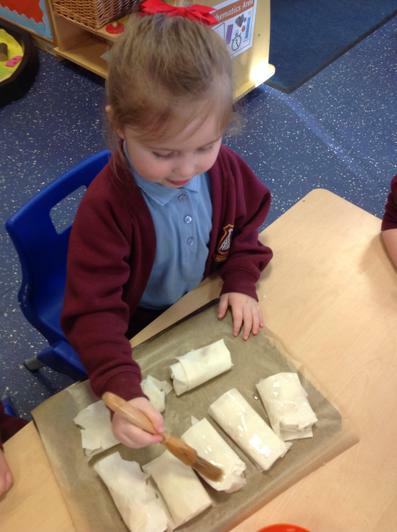 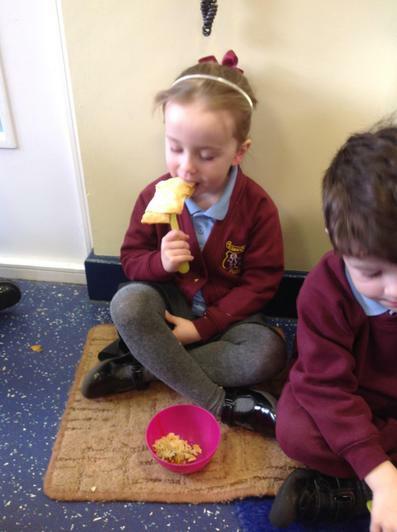 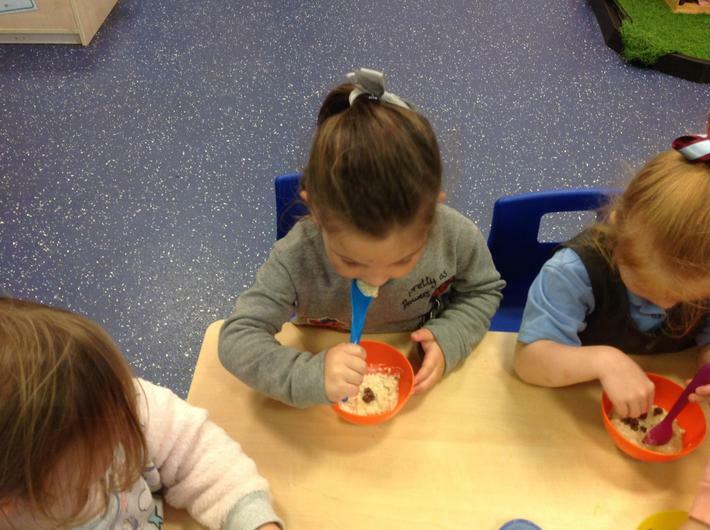 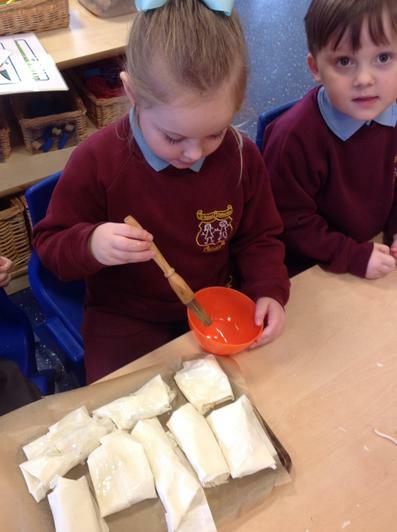 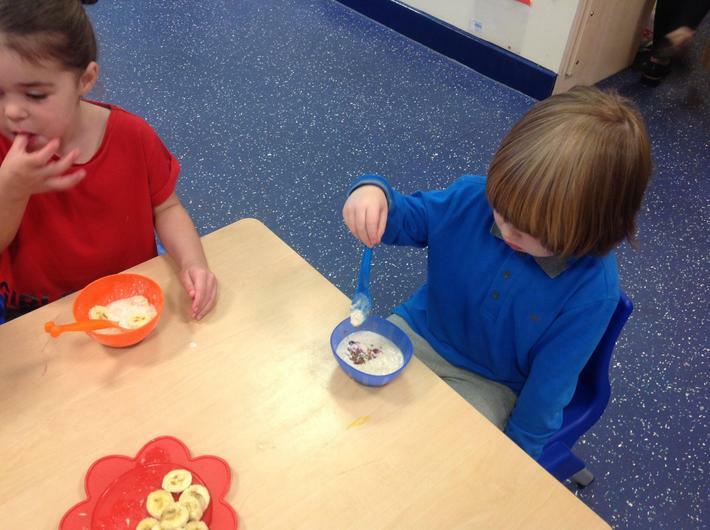 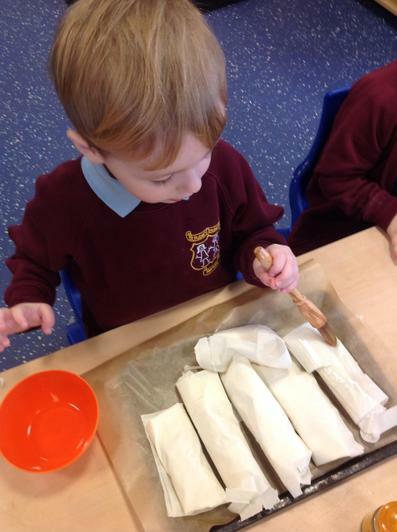 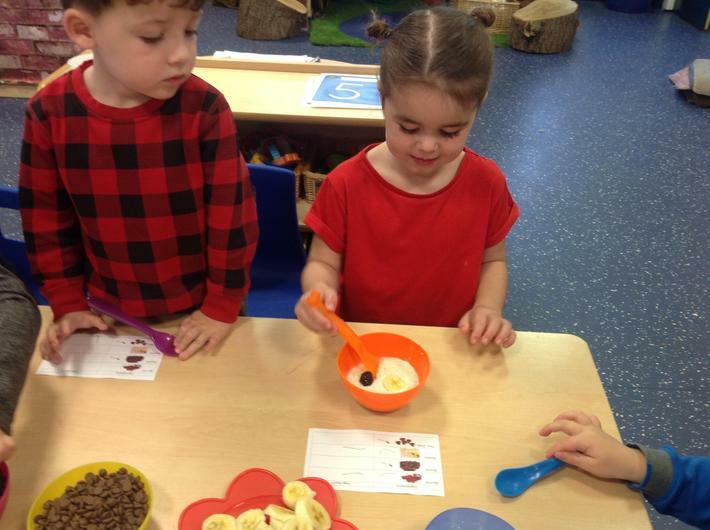 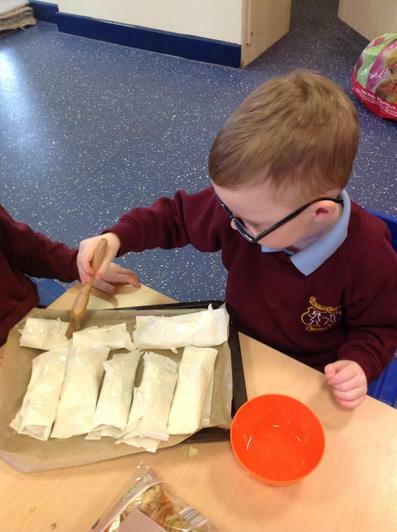 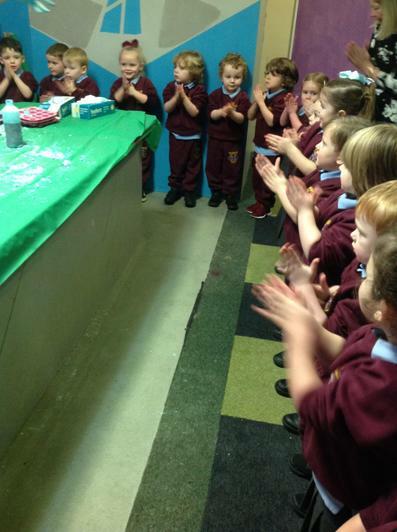 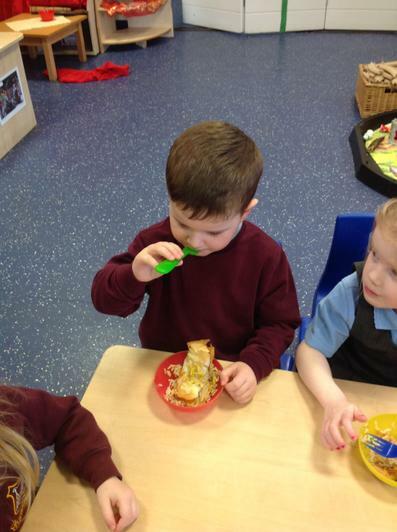 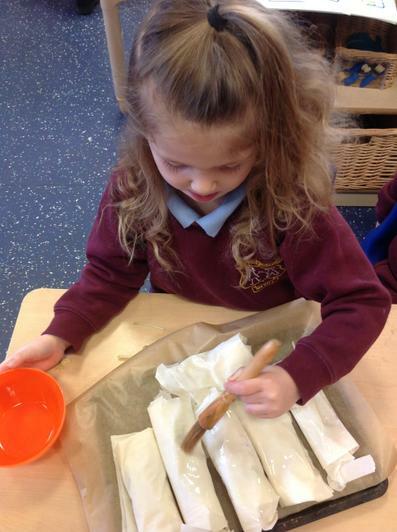 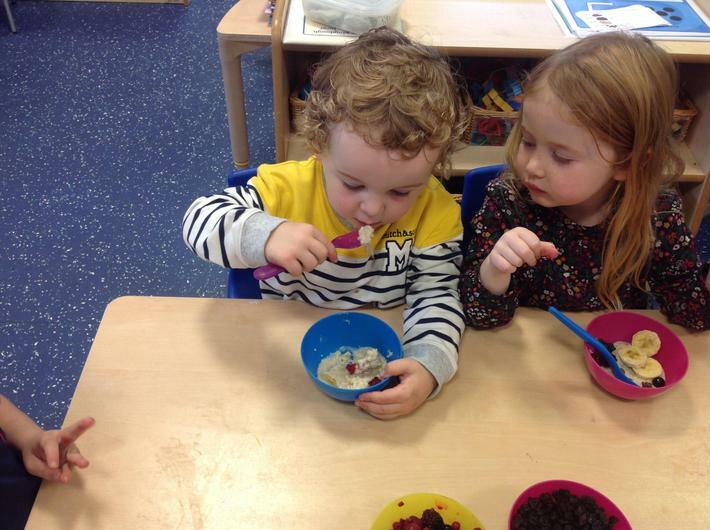 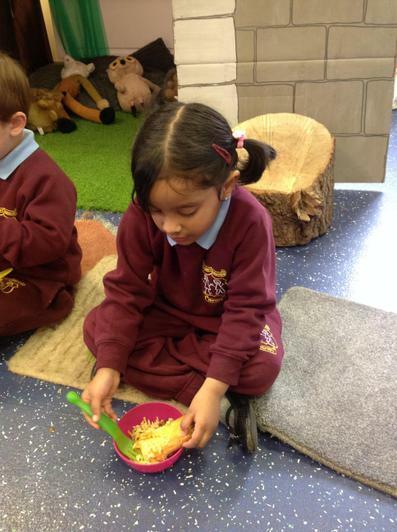 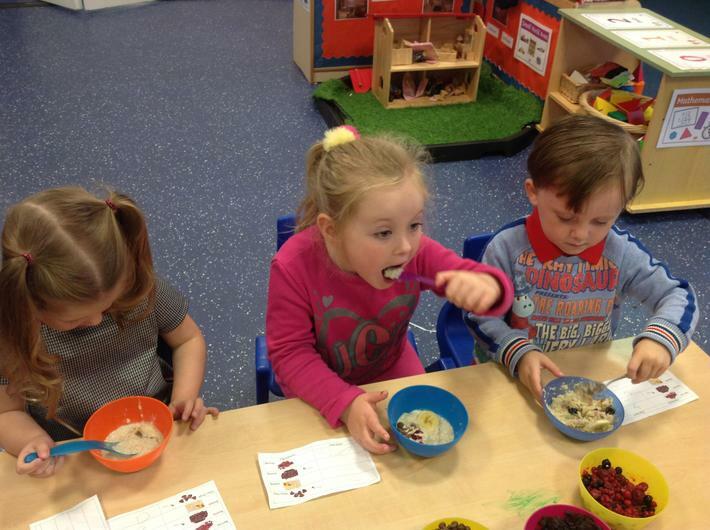 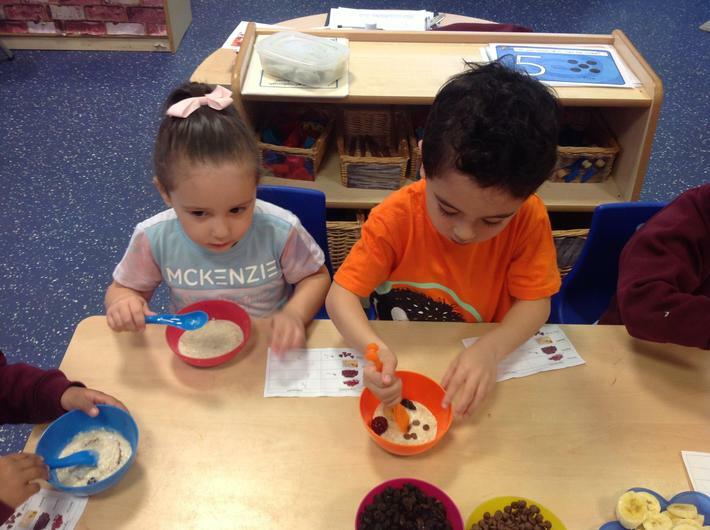 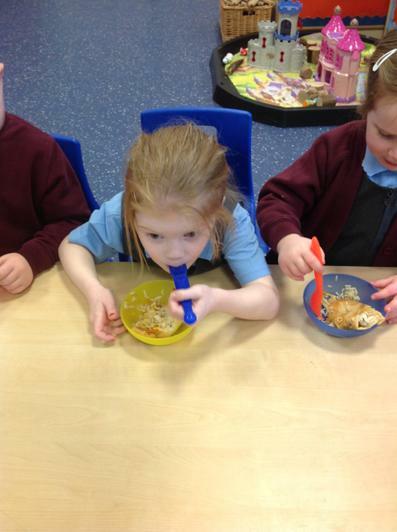 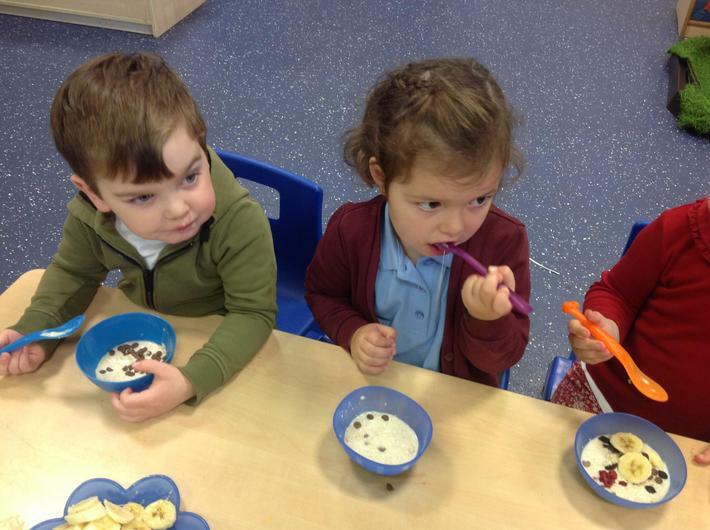 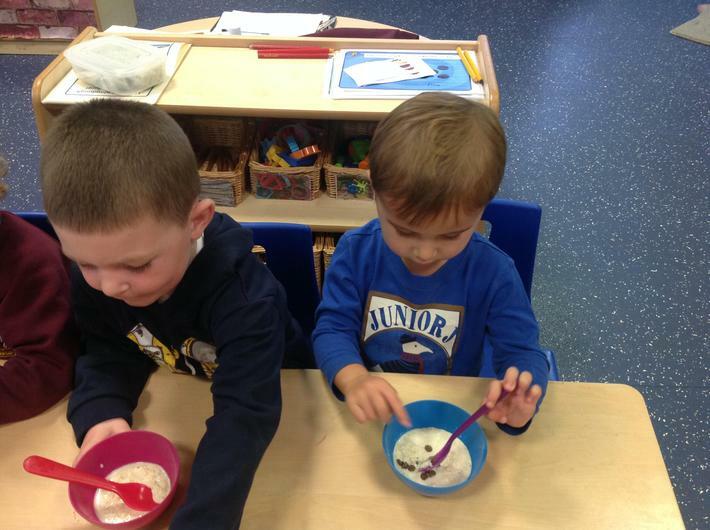 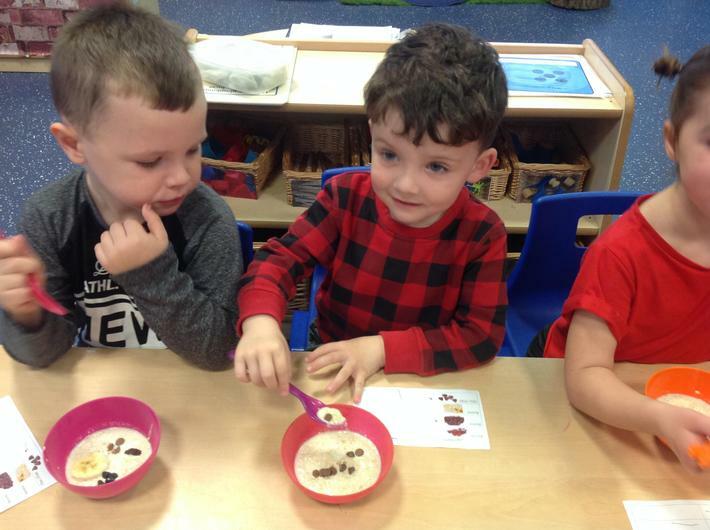 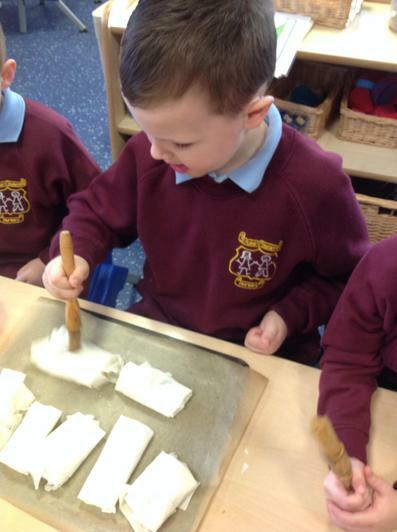 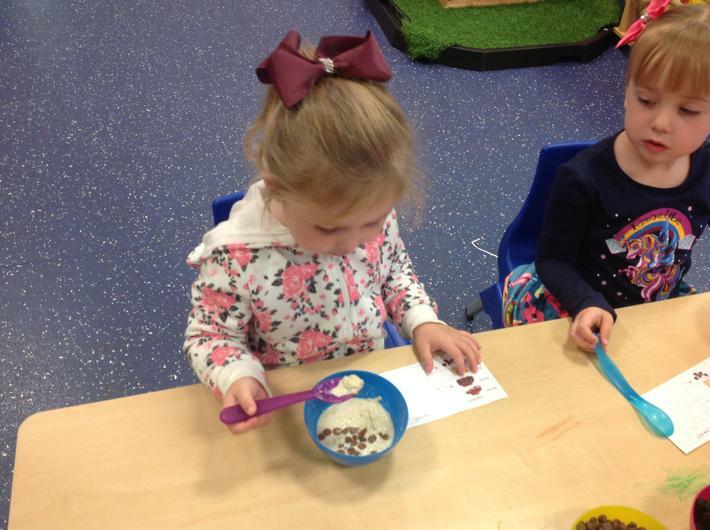 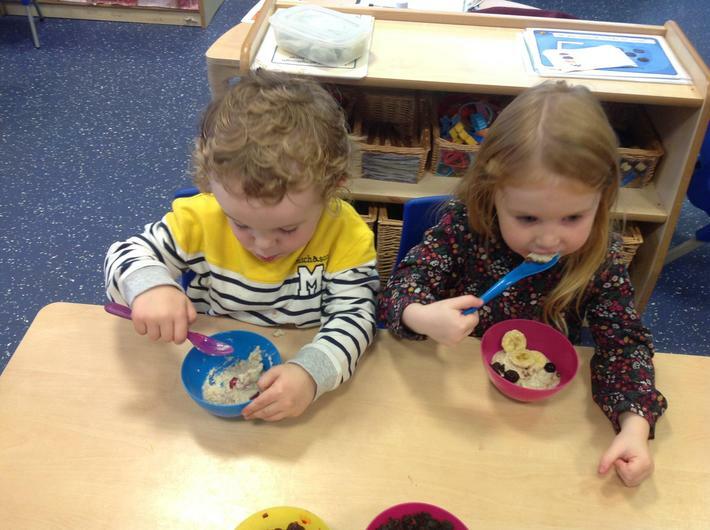 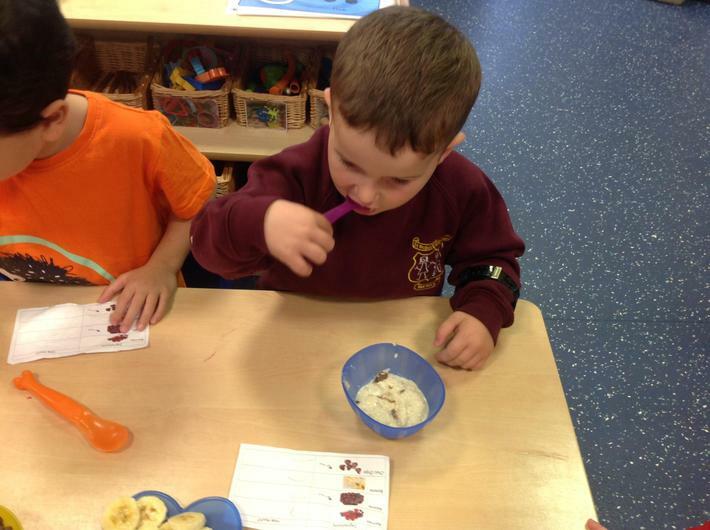 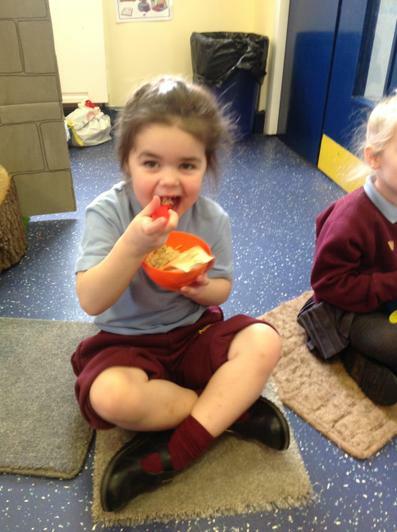 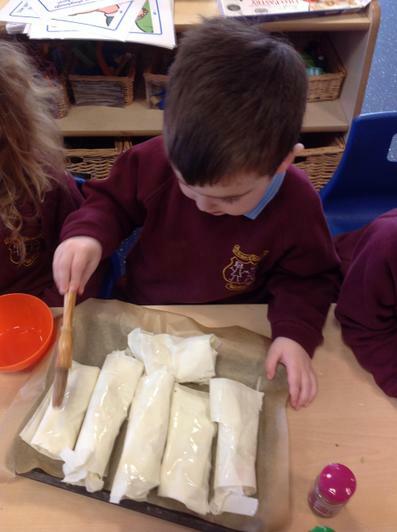 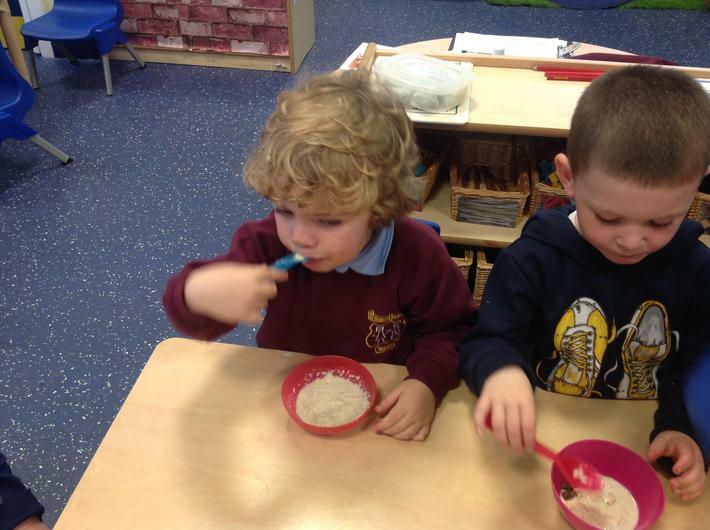 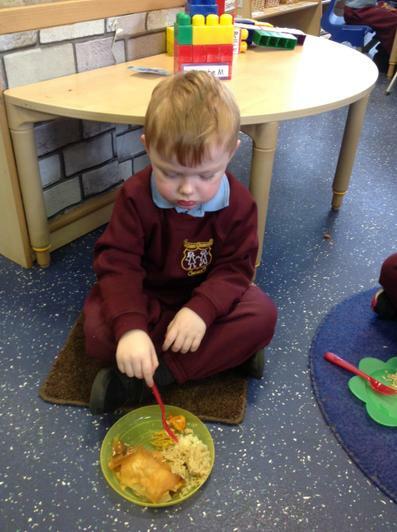 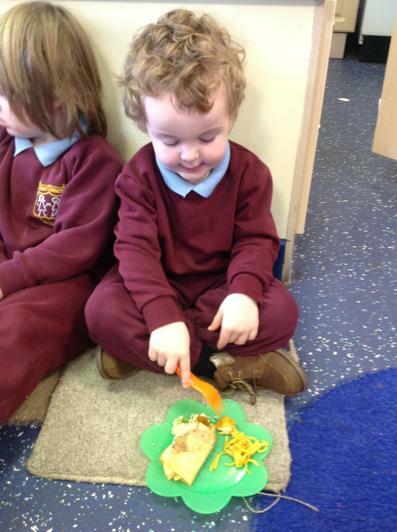 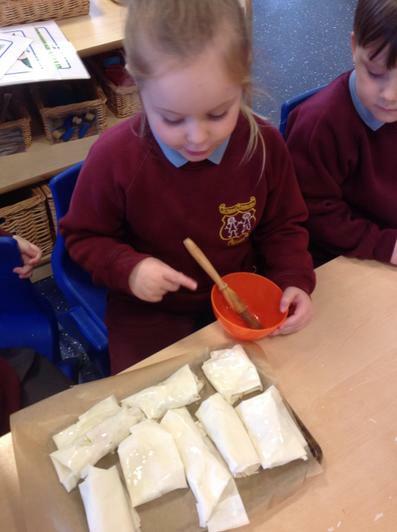 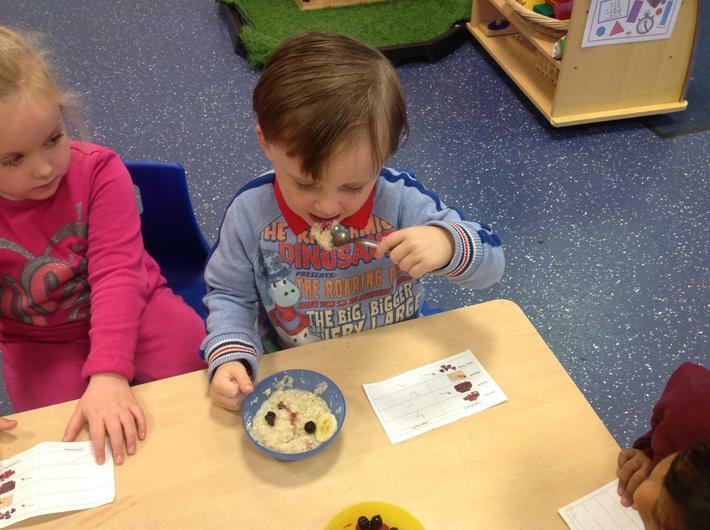 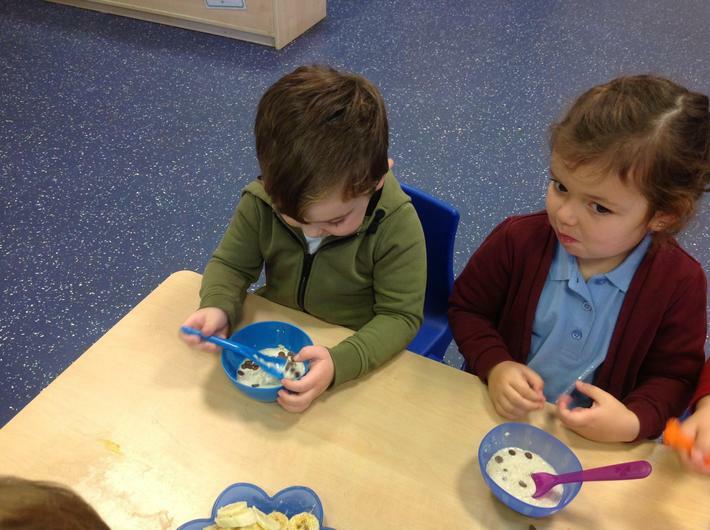 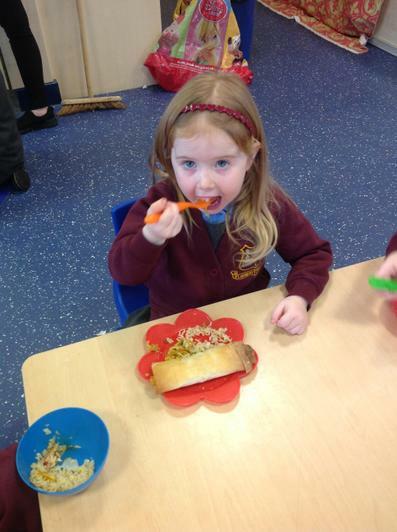 Today we made porridge and thought about what ingredients we would choose to make it just right, like Goldilocks did! 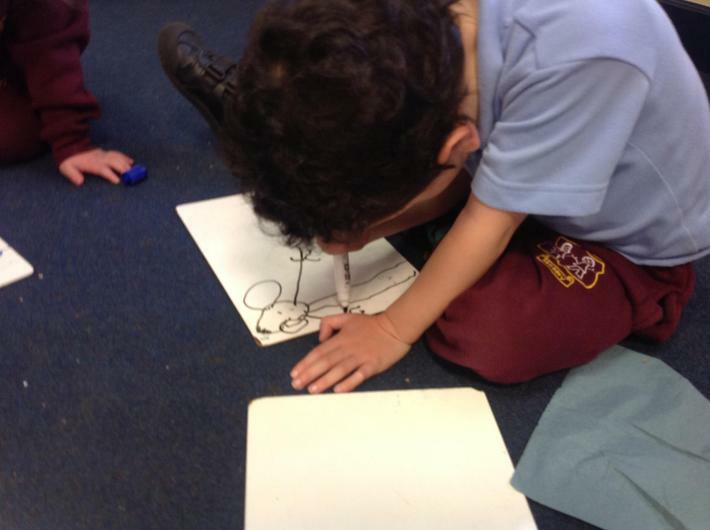 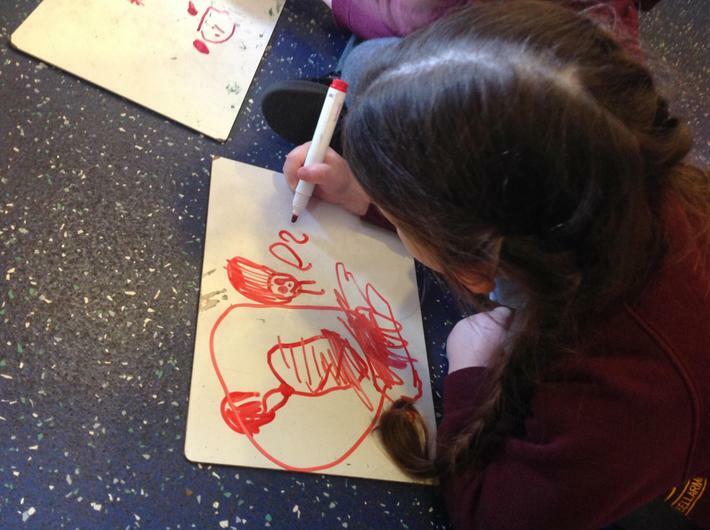 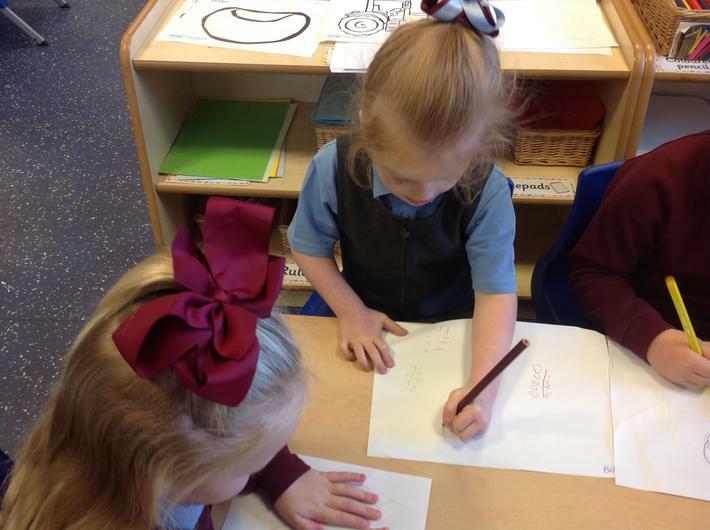 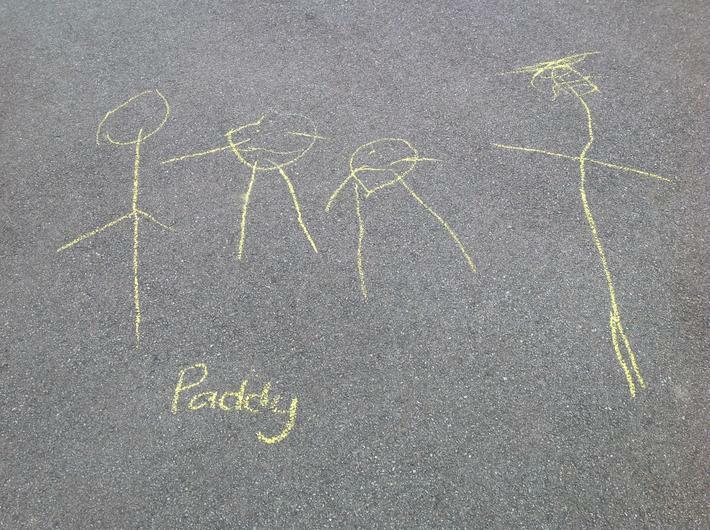 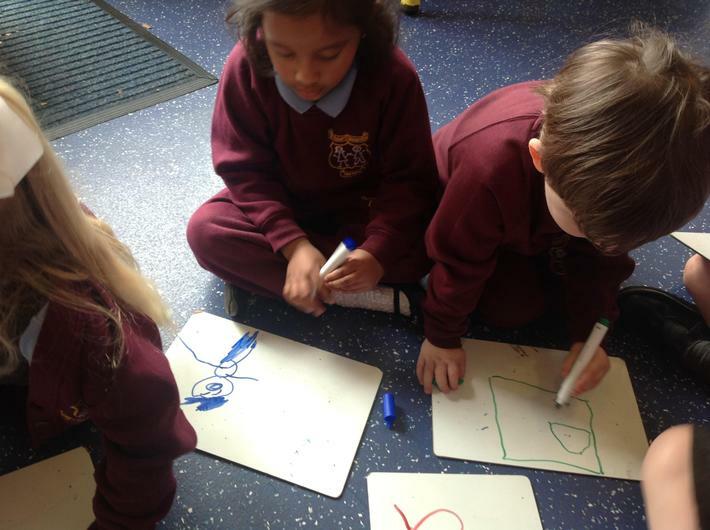 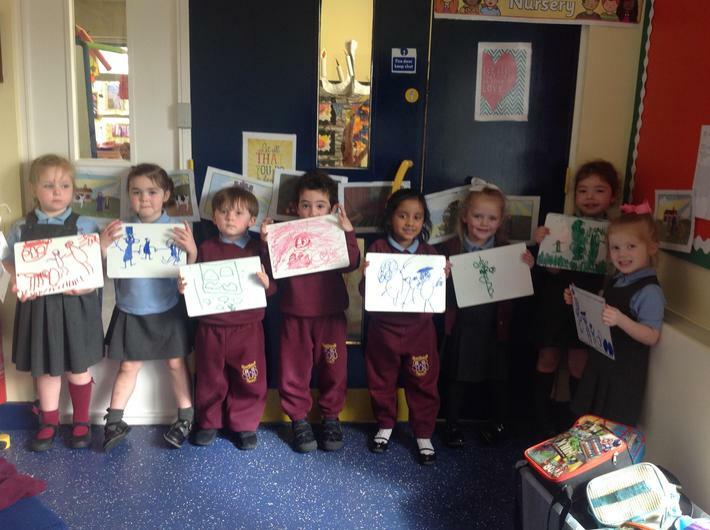 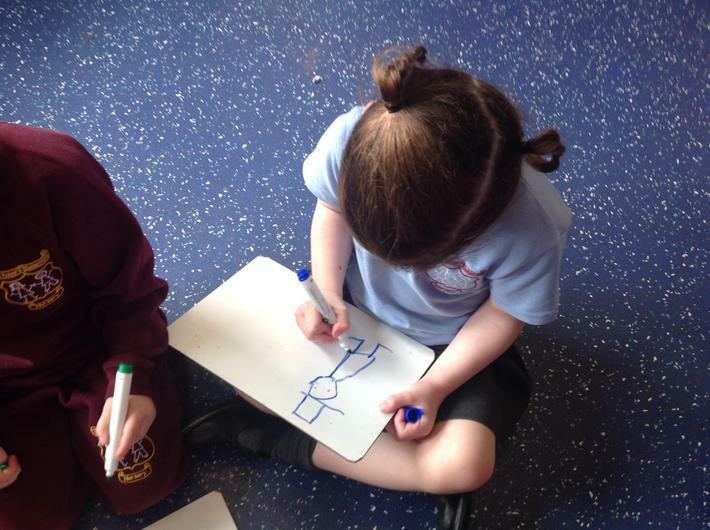 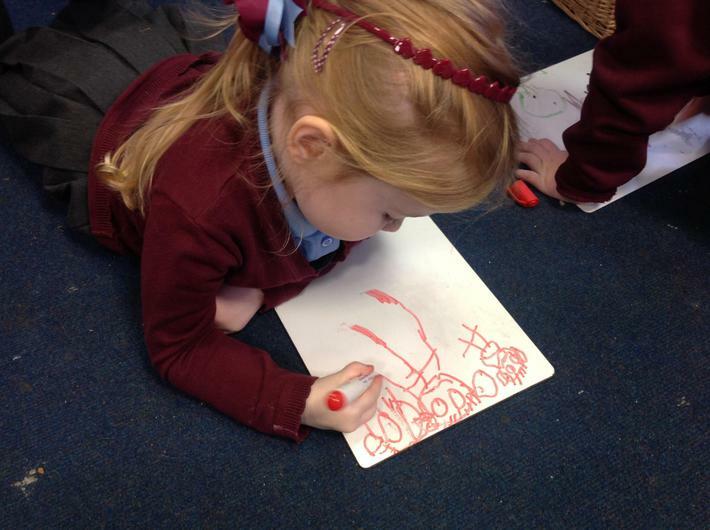 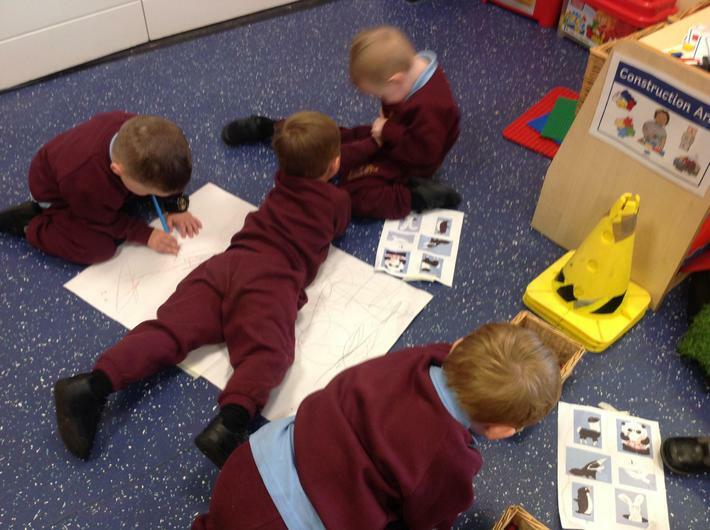 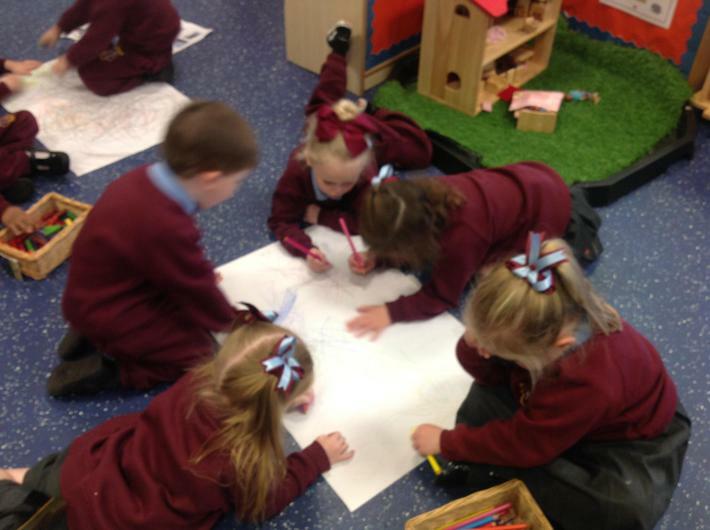 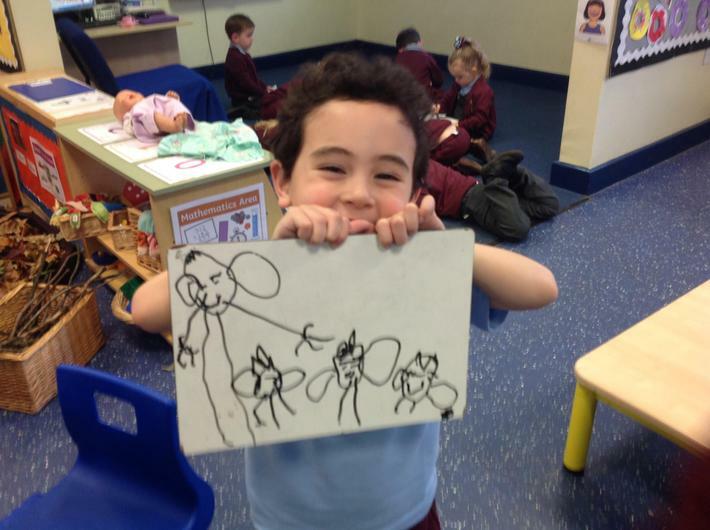 As a group we became authors, using our own drawings to represent a main character or event in the story. 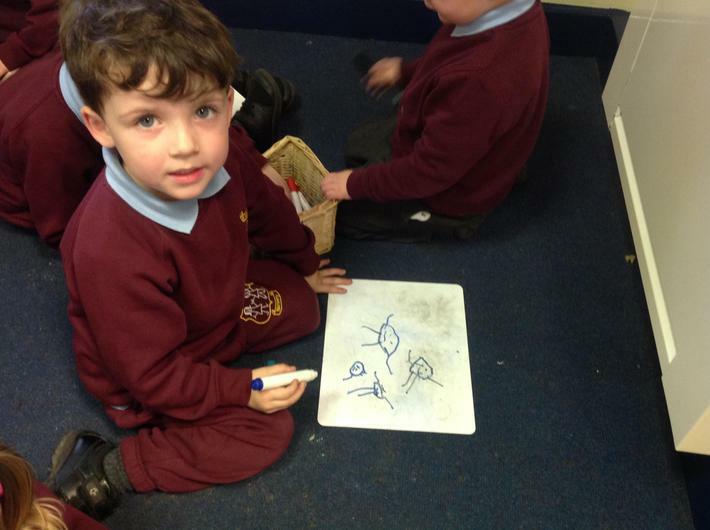 Afterwards we sequenced our drawings and retold the story by using familiar phrases from the book. 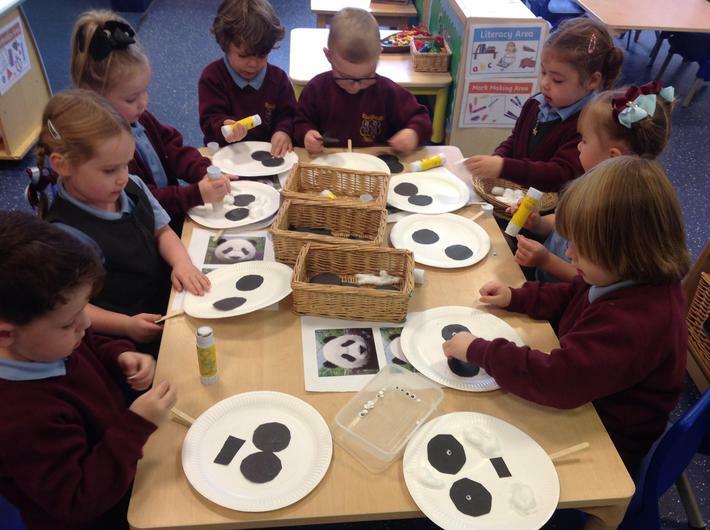 As part of our author study, we planned a range of maths tasks that were themed around the Steve Antony 'Mr Panda' books. 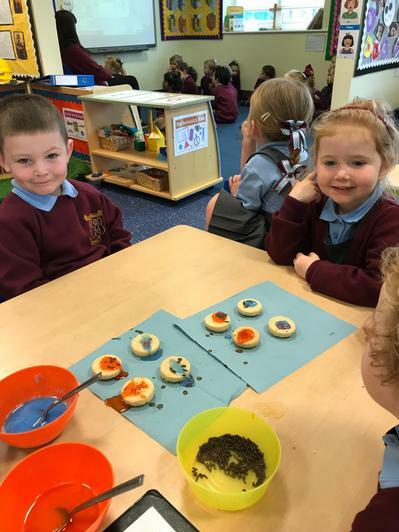 Some of these can be seen below, on one activity the children completed a problem solving task whereby they were challenged to find all possibilities for decorating the biscuits and on another task the children decided which size of paper matched which size of present (big, medium or small). 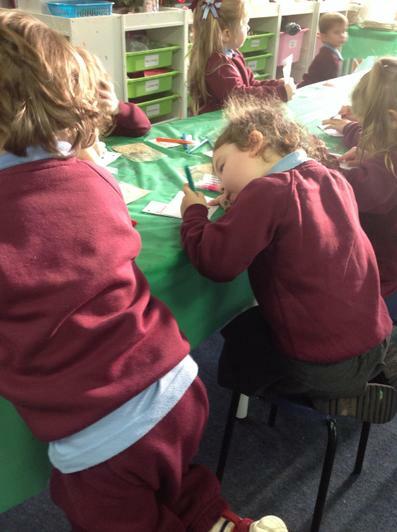 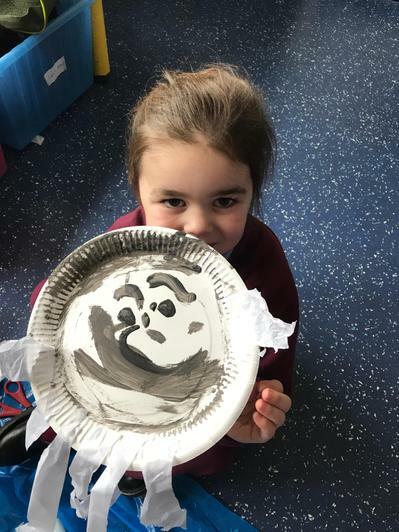 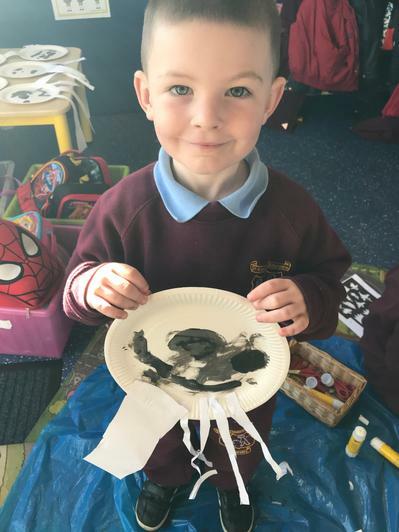 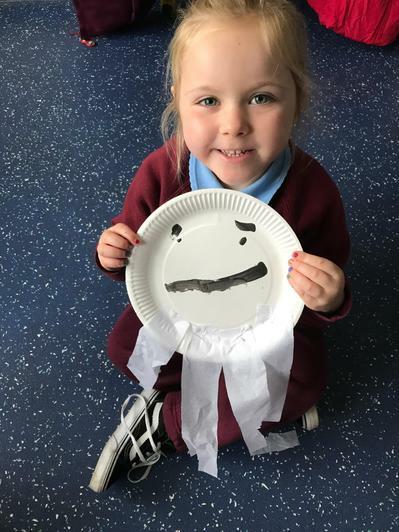 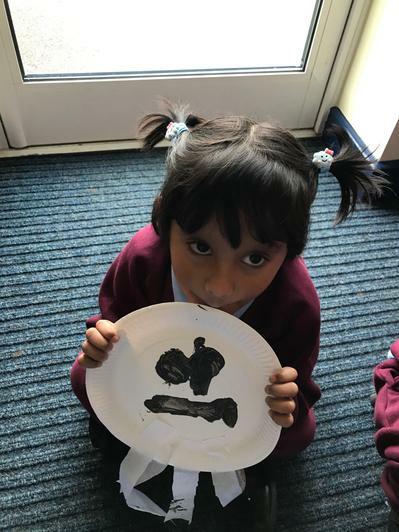 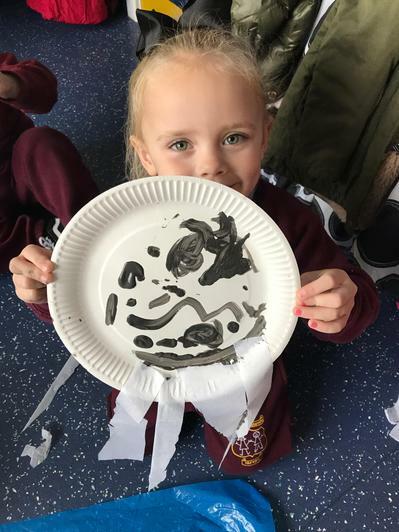 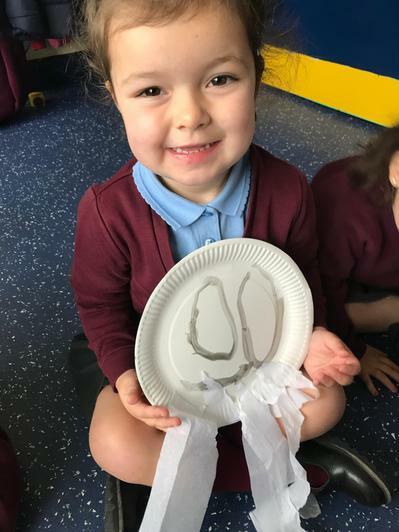 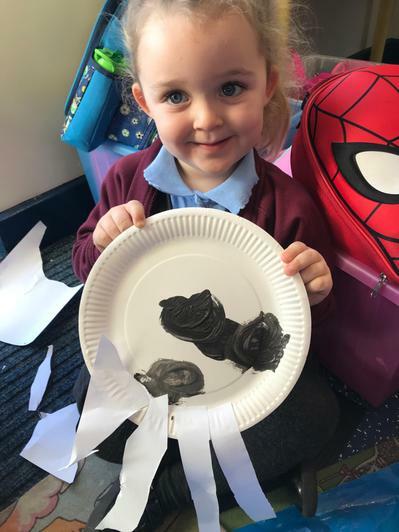 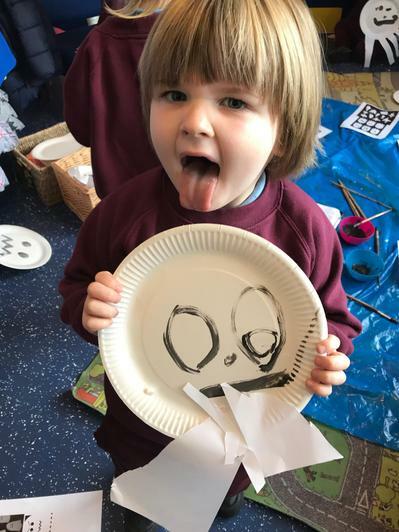 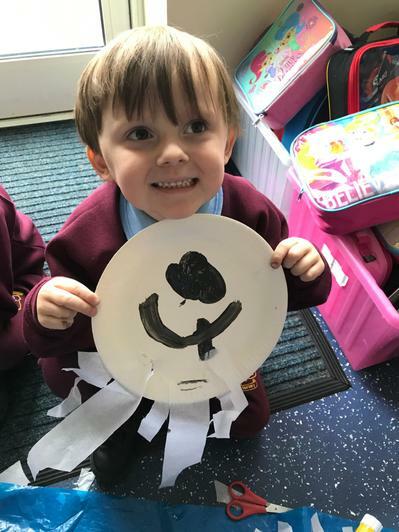 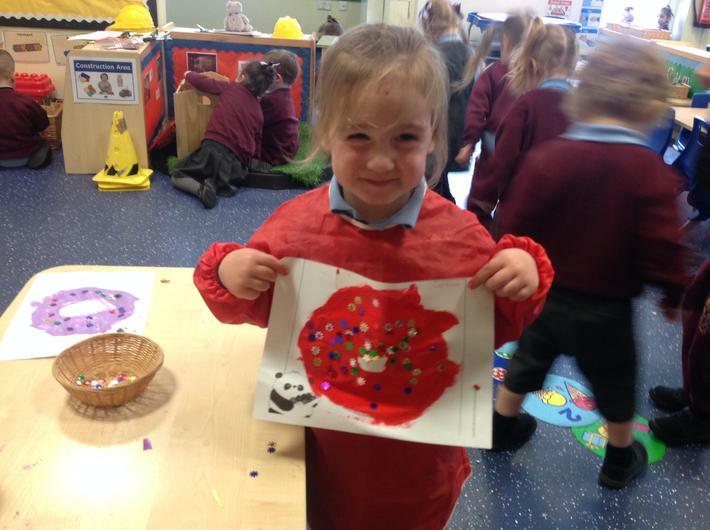 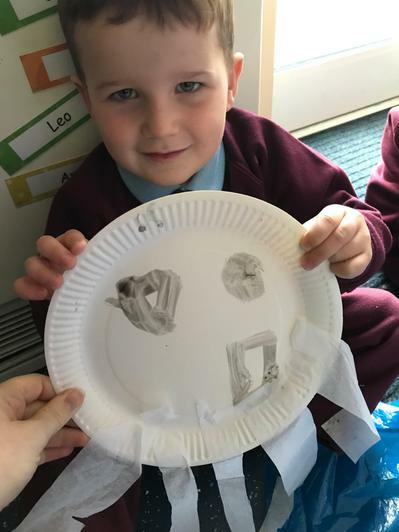 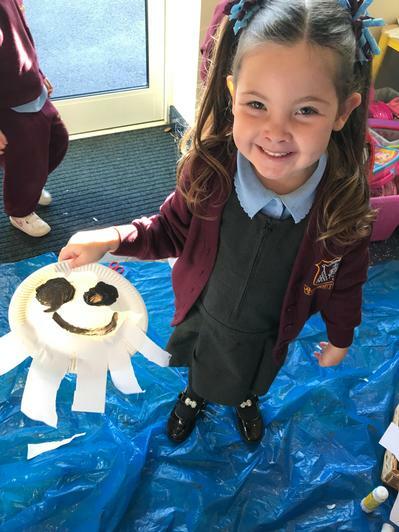 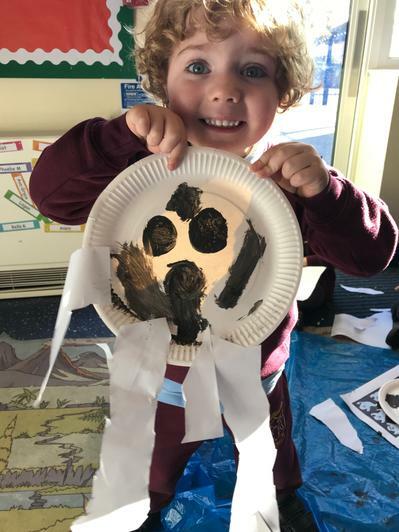 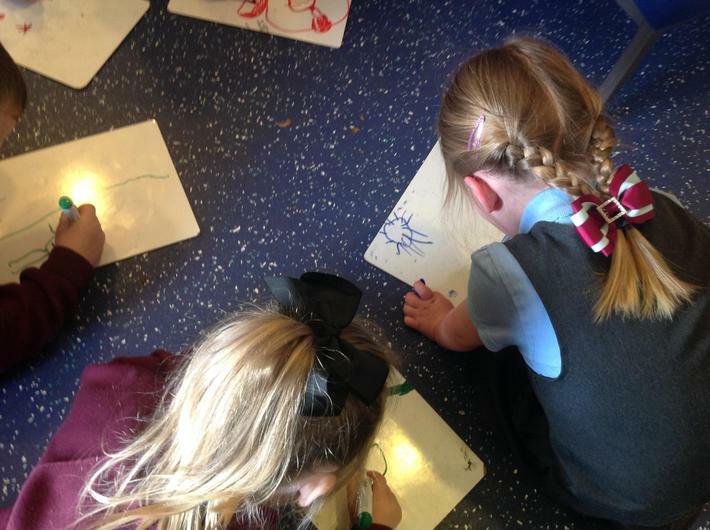 The children really enjoyed making their ghost designs, first they explored a range of ghoulish facial expressions before chosing their favourite one. 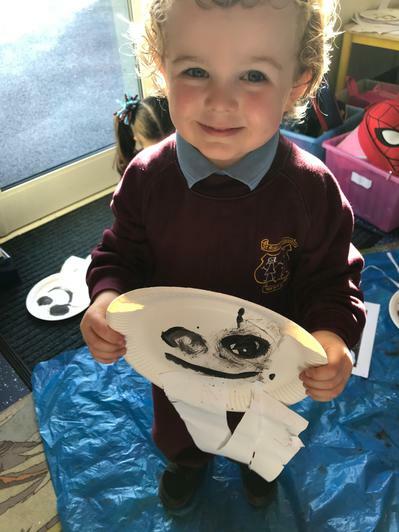 Afterwards they carefully painted the facial expression onto their own paper plates and attached the floaty bodies at the bottom. 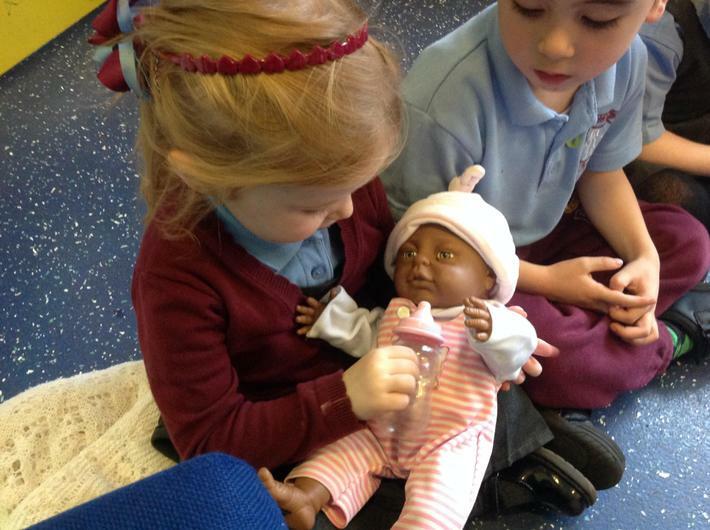 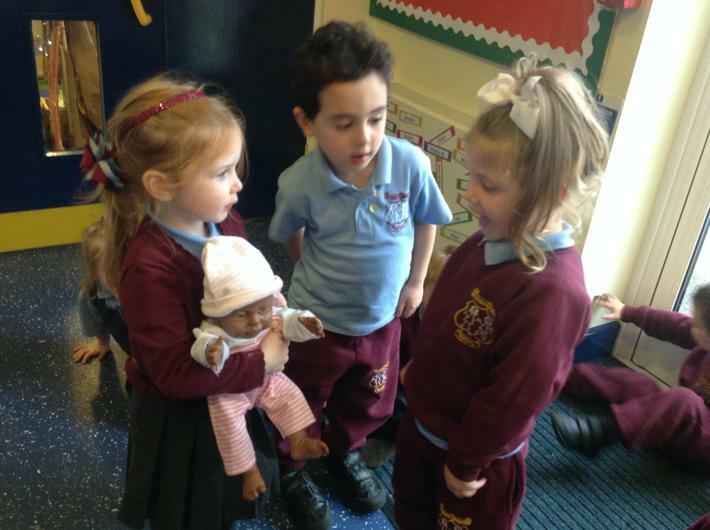 As part of our recent RE topic we have been exploring how to welcome new babies and make others feel like they belong into God's special family. 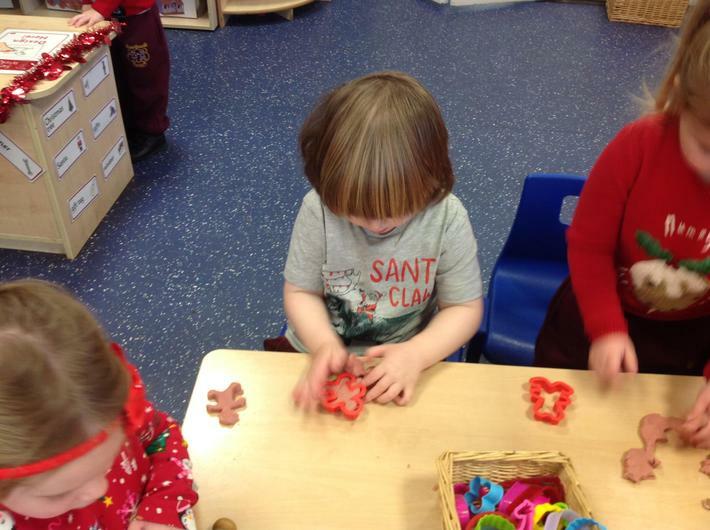 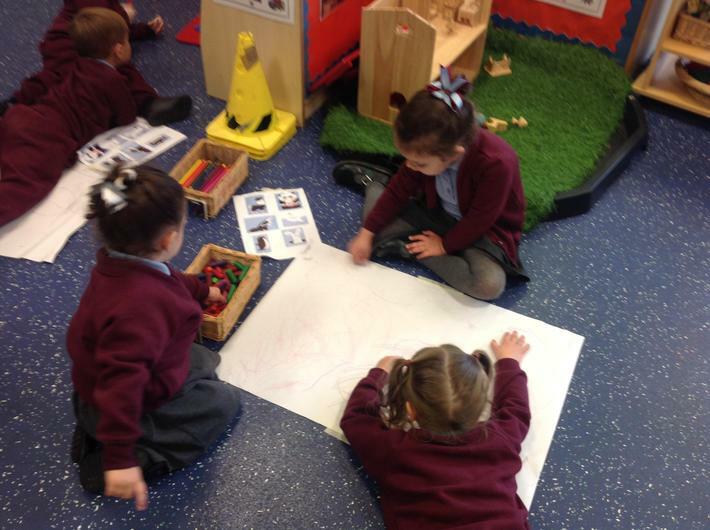 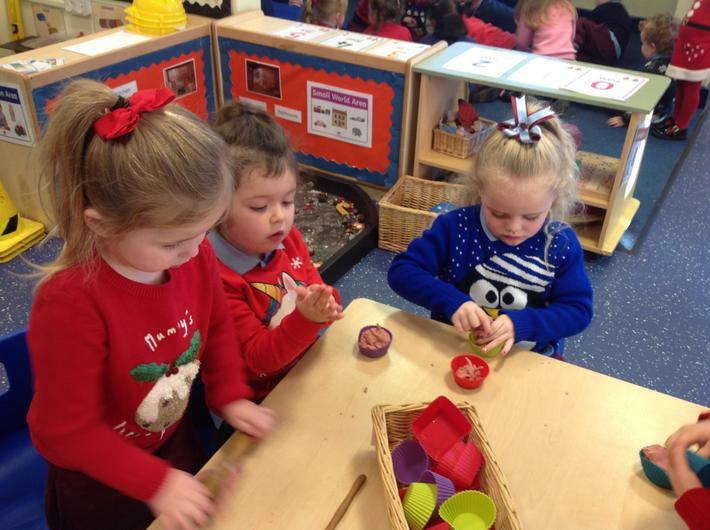 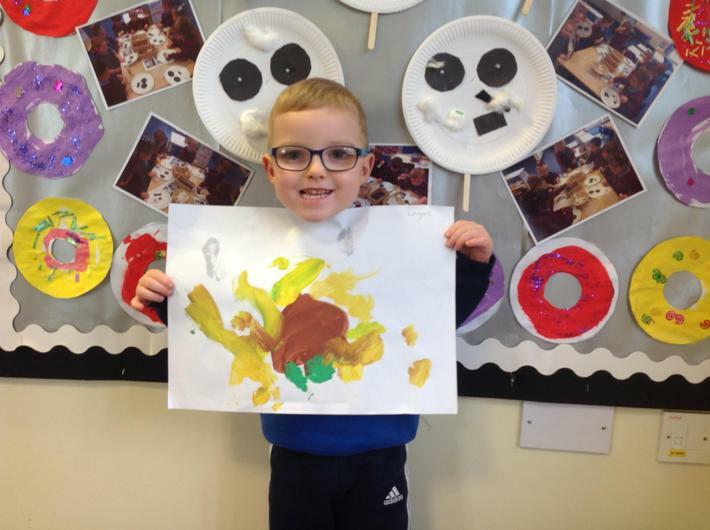 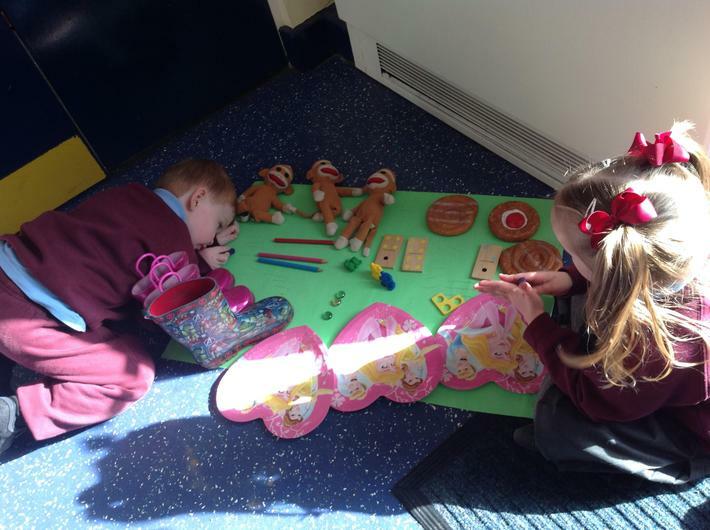 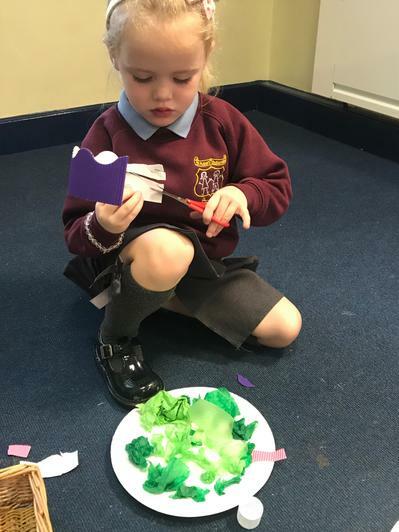 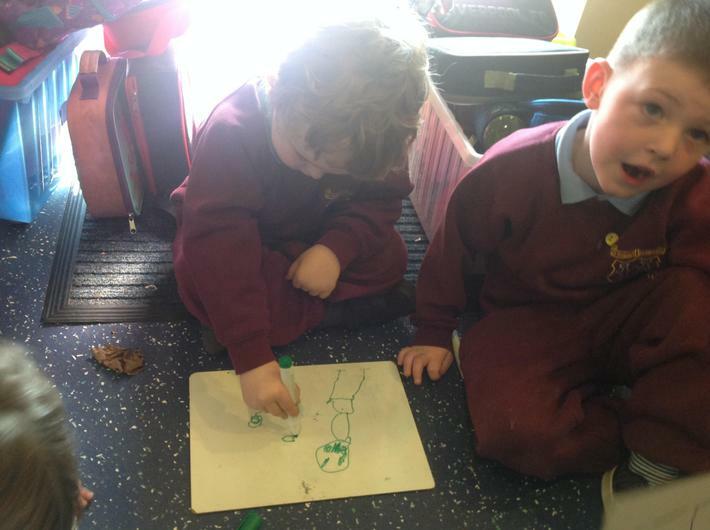 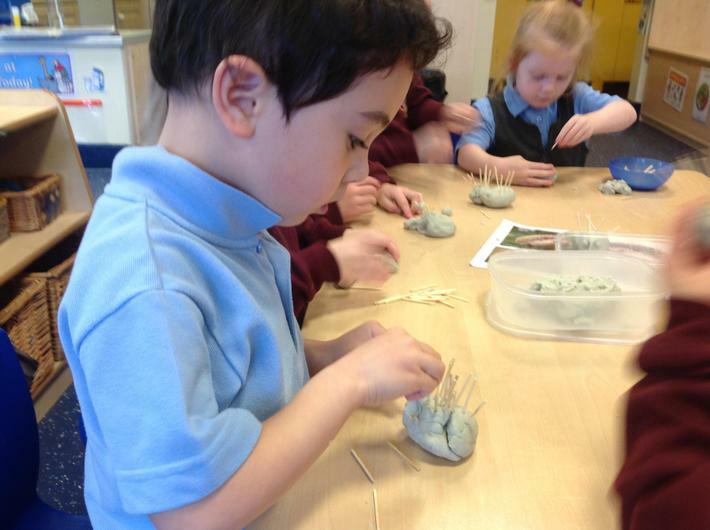 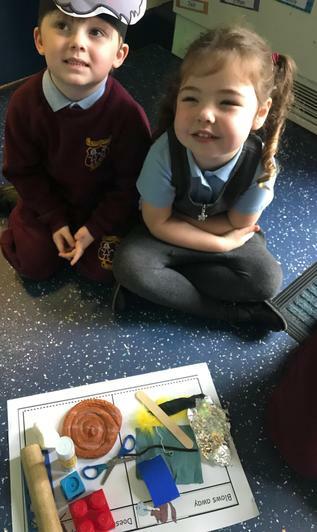 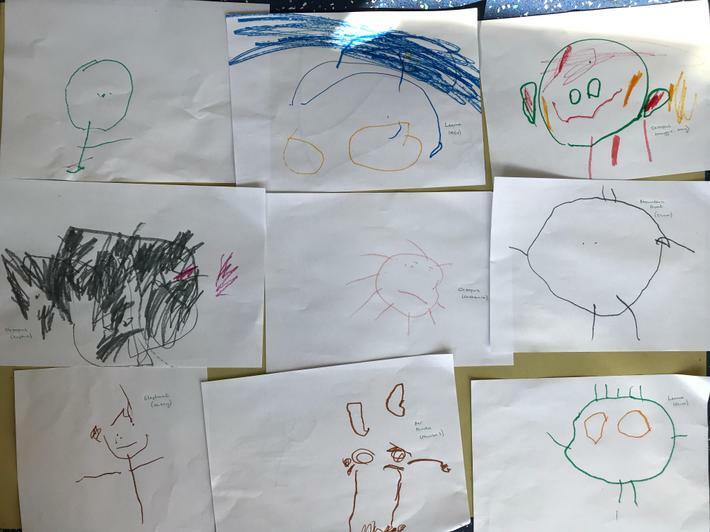 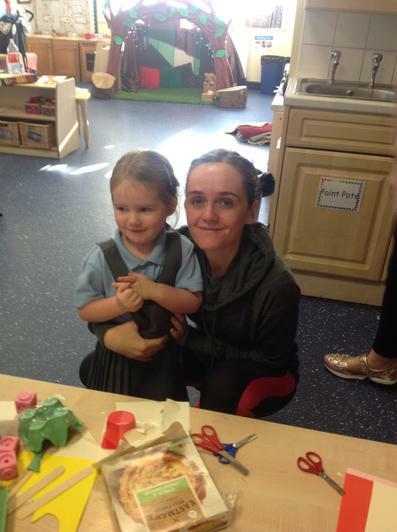 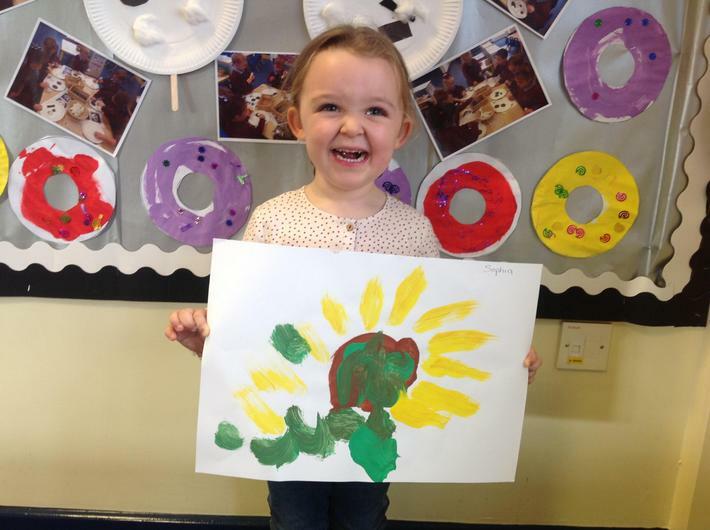 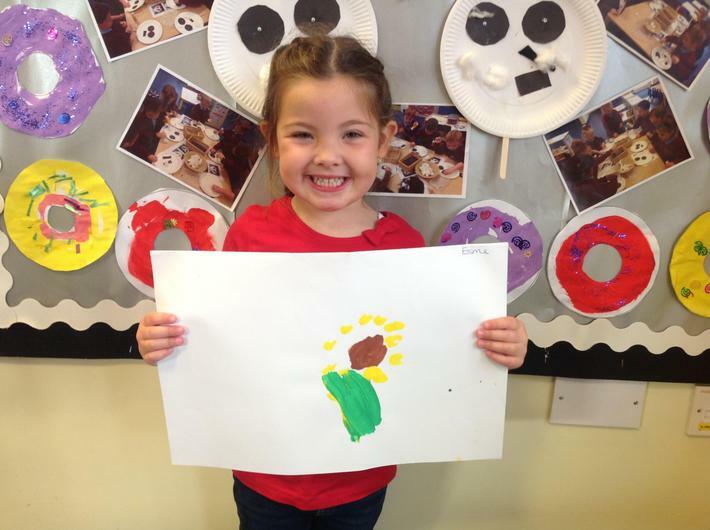 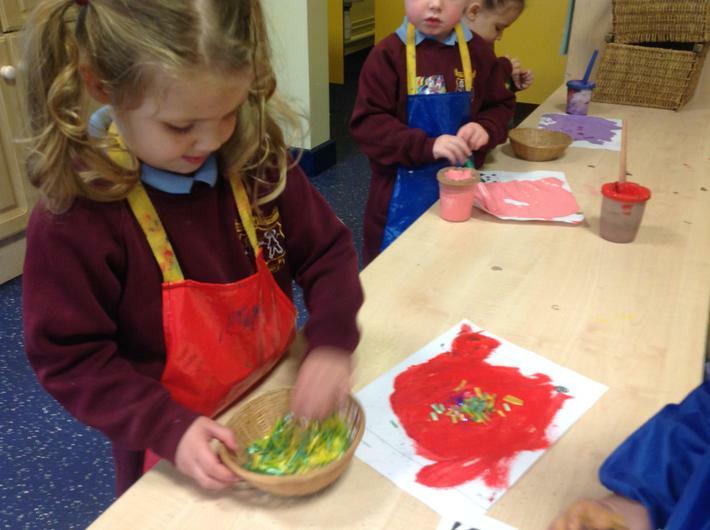 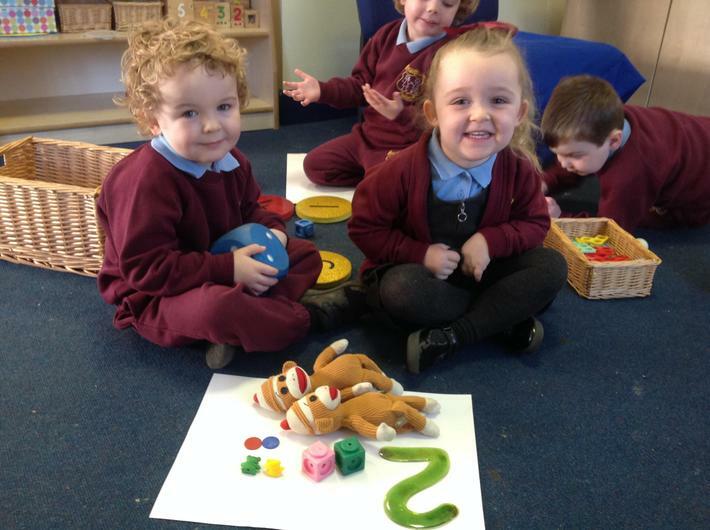 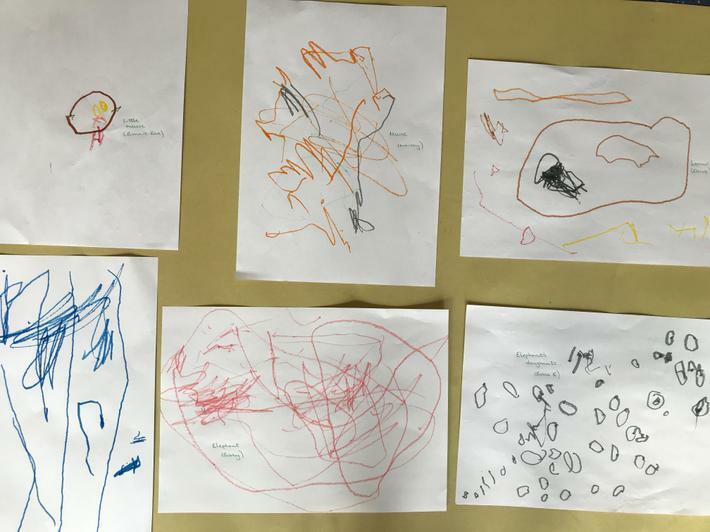 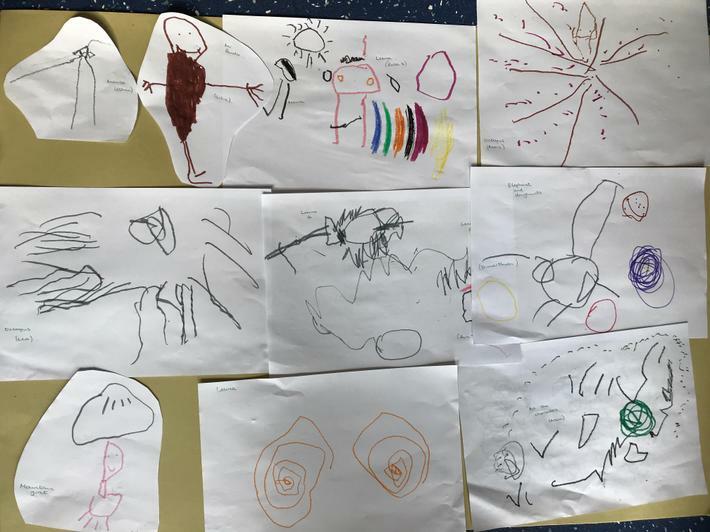 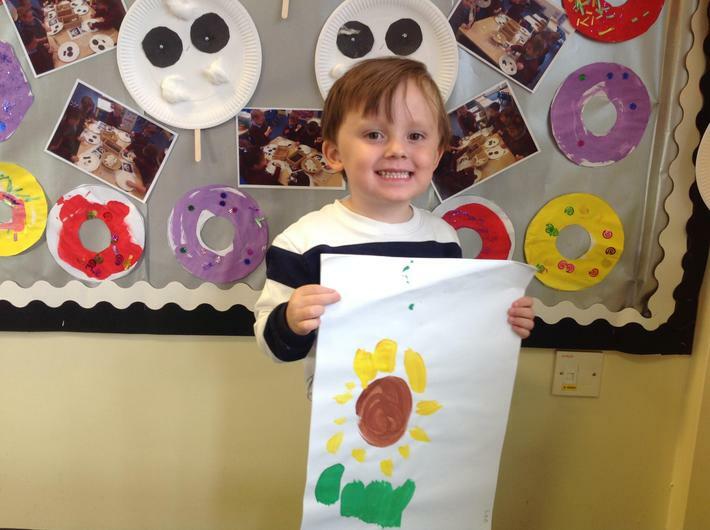 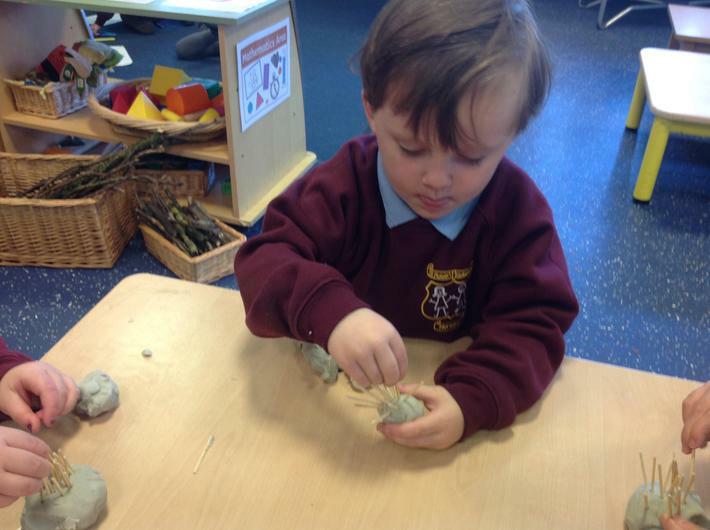 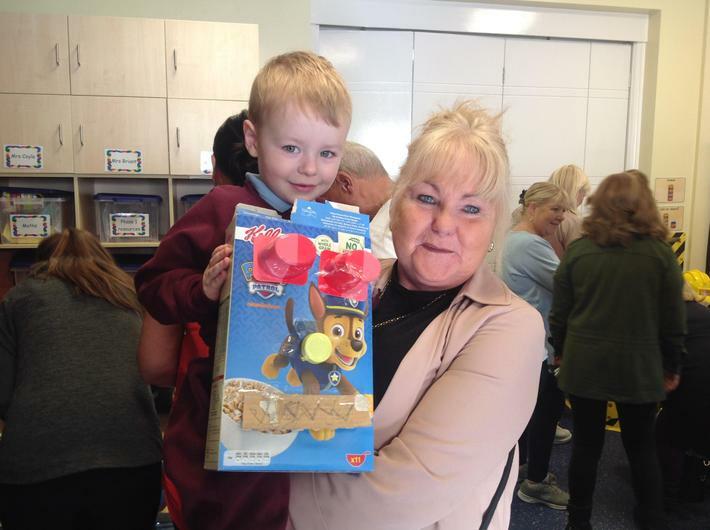 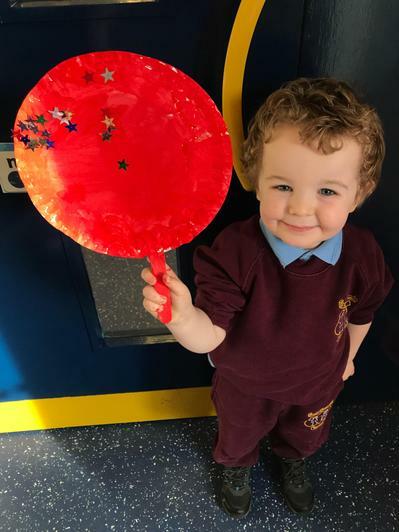 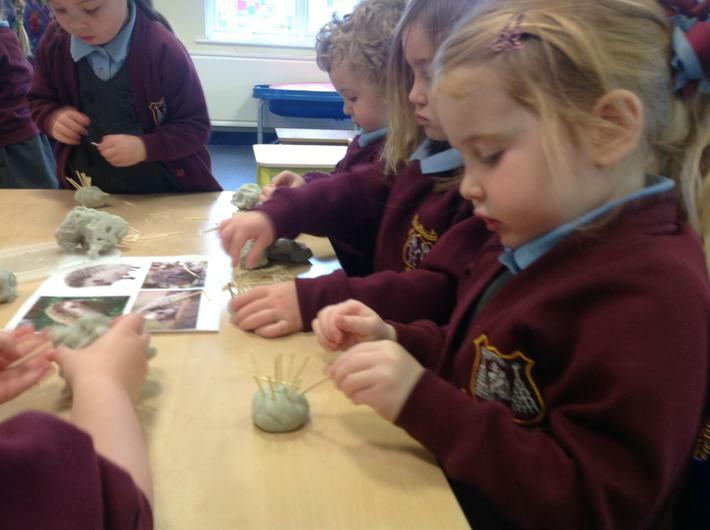 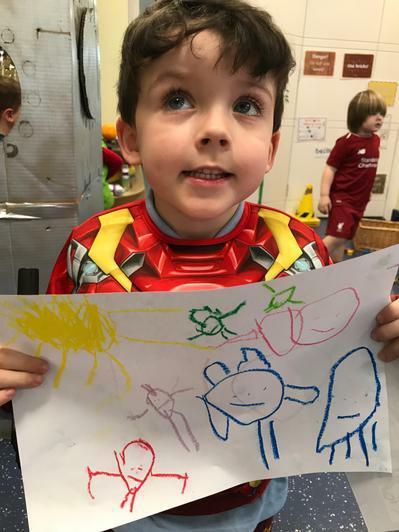 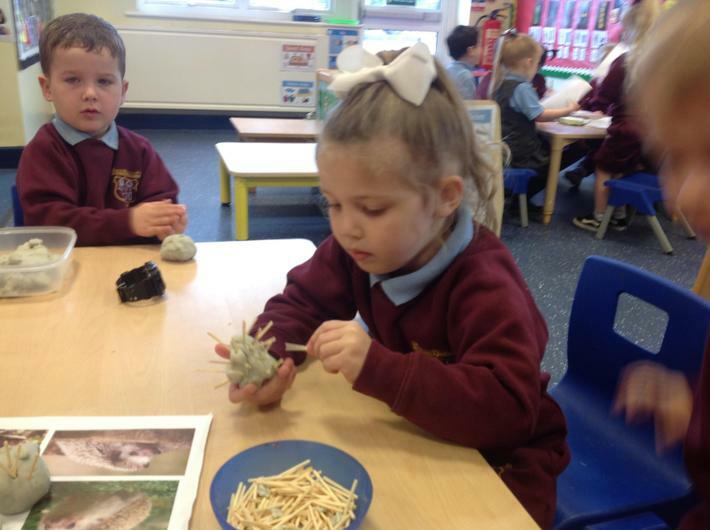 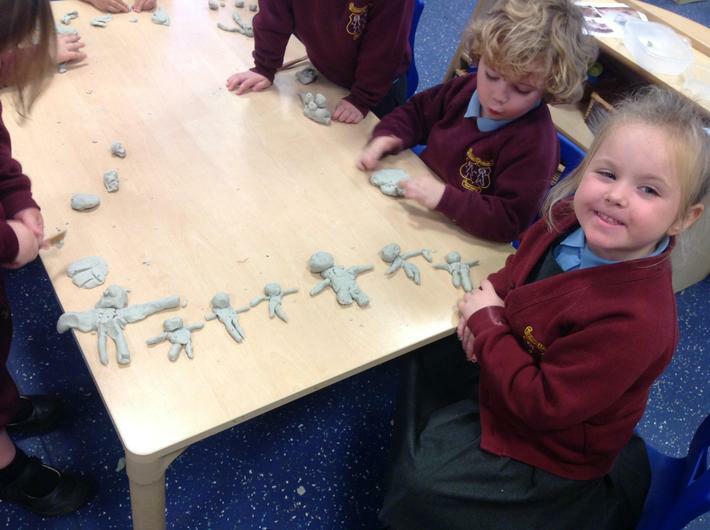 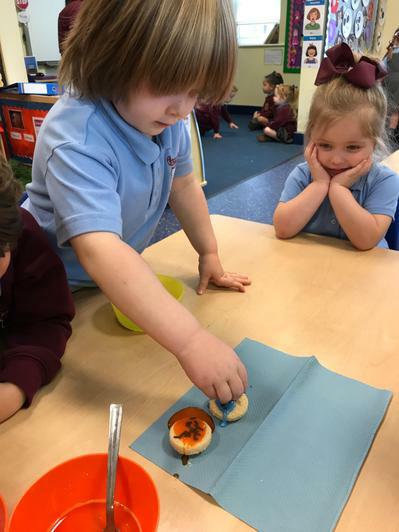 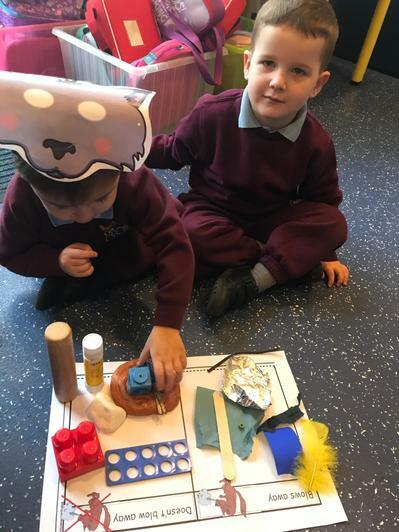 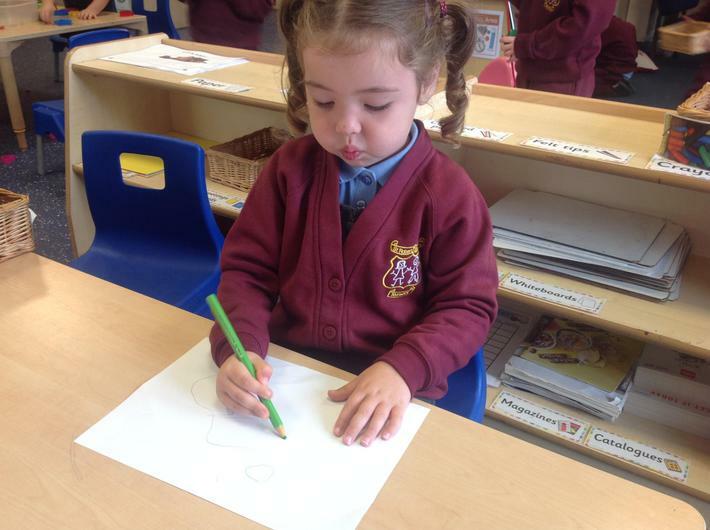 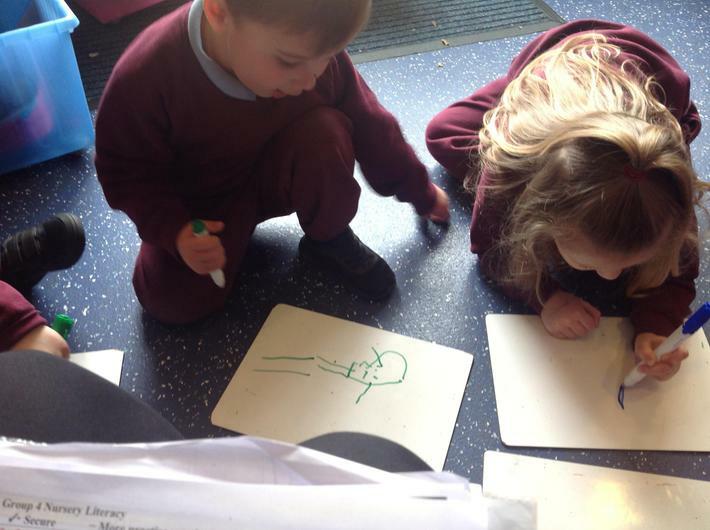 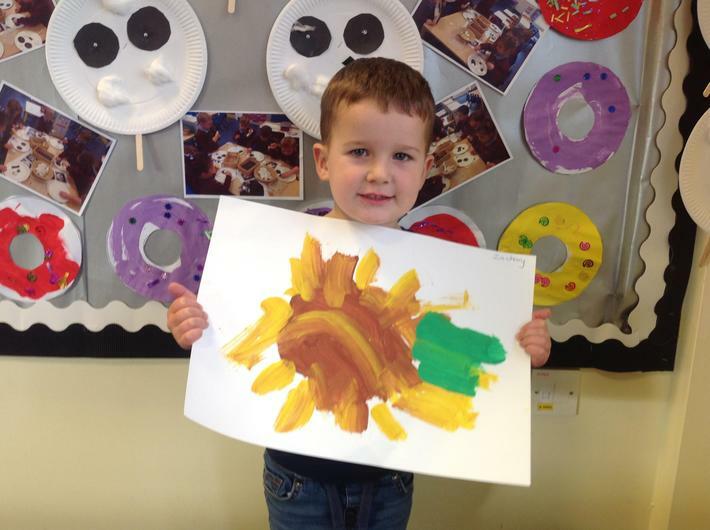 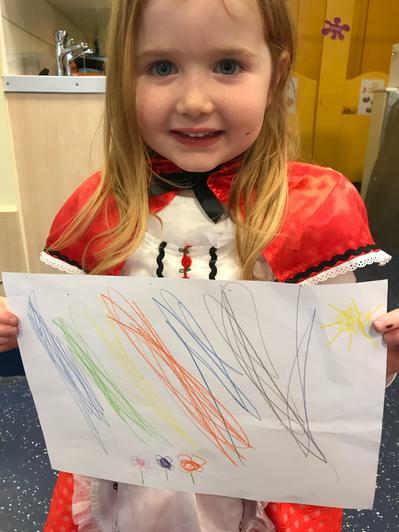 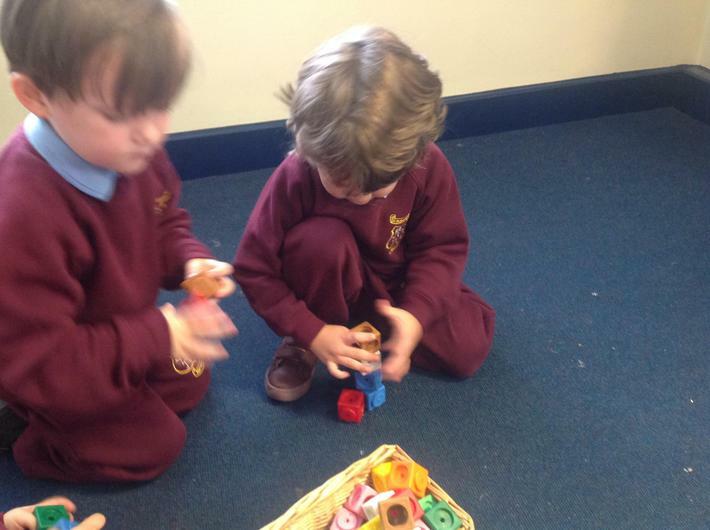 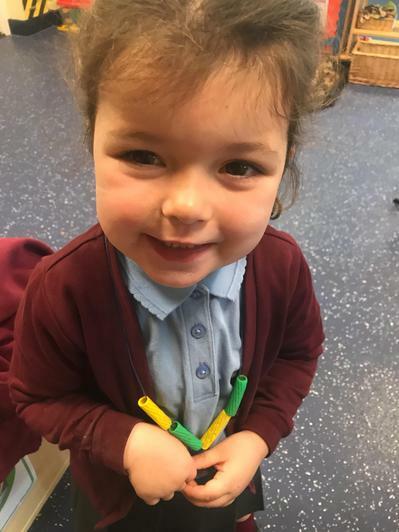 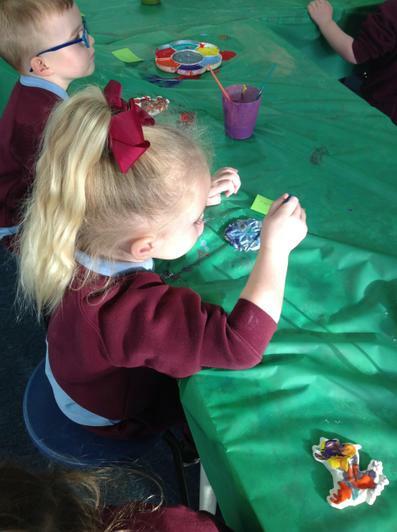 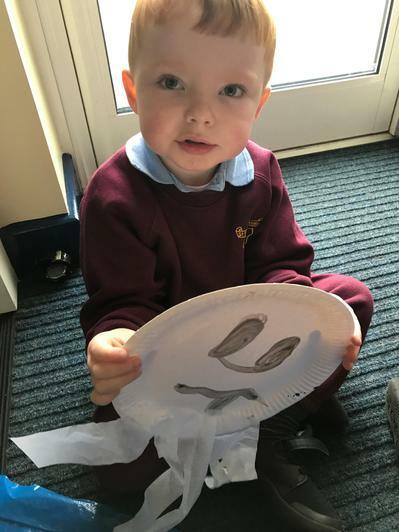 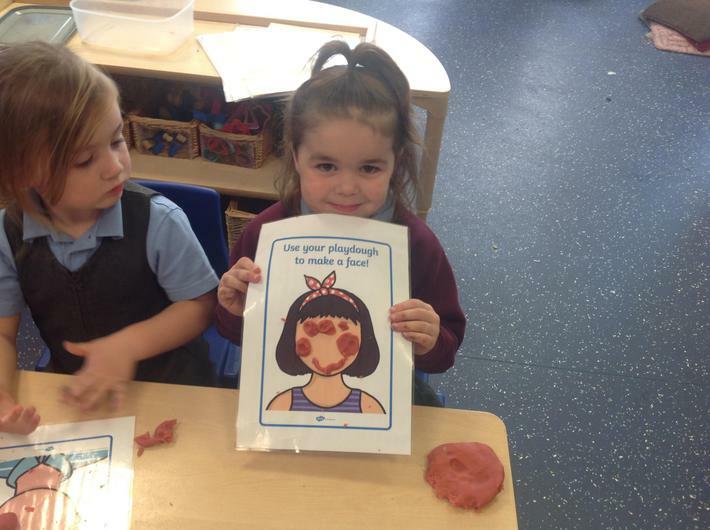 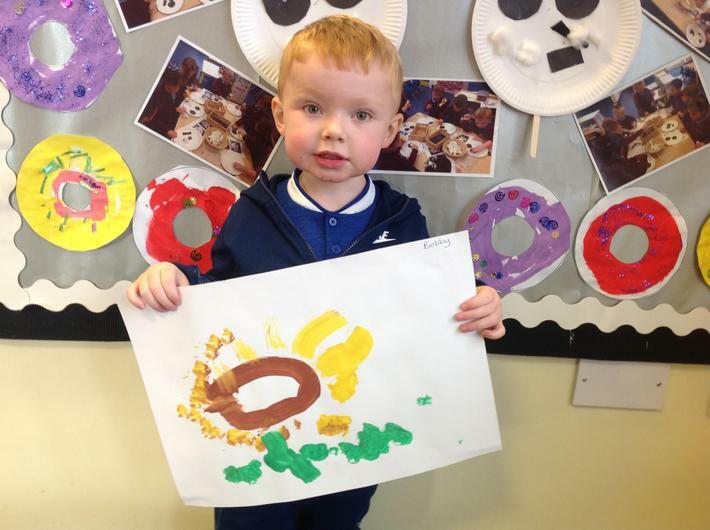 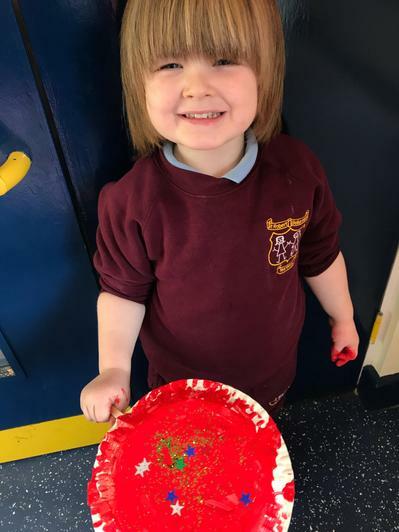 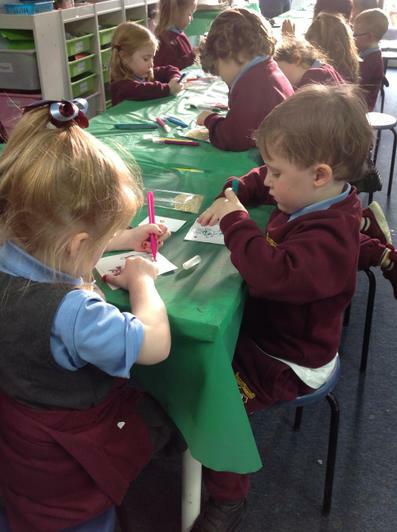 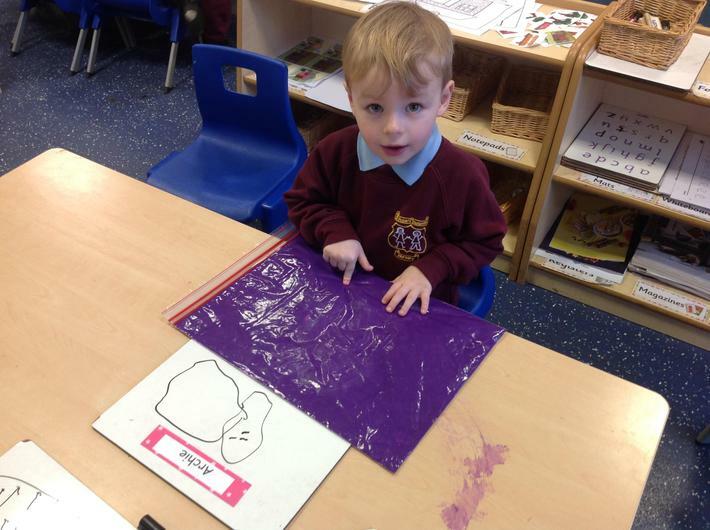 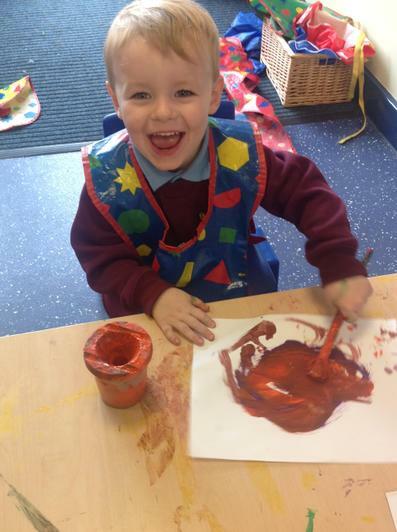 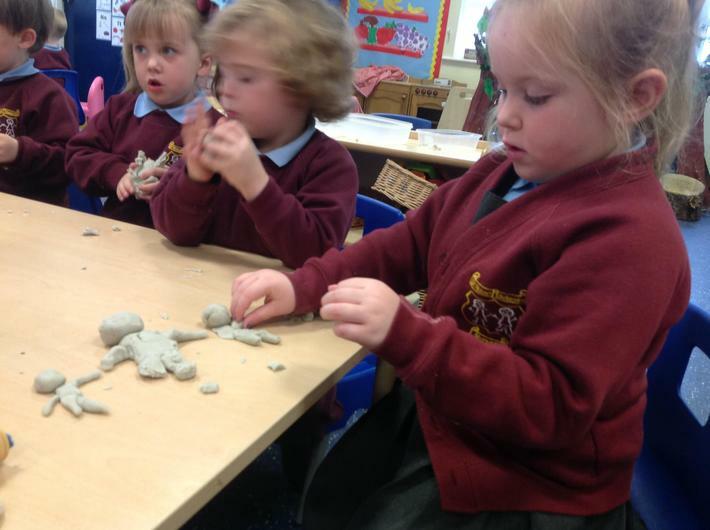 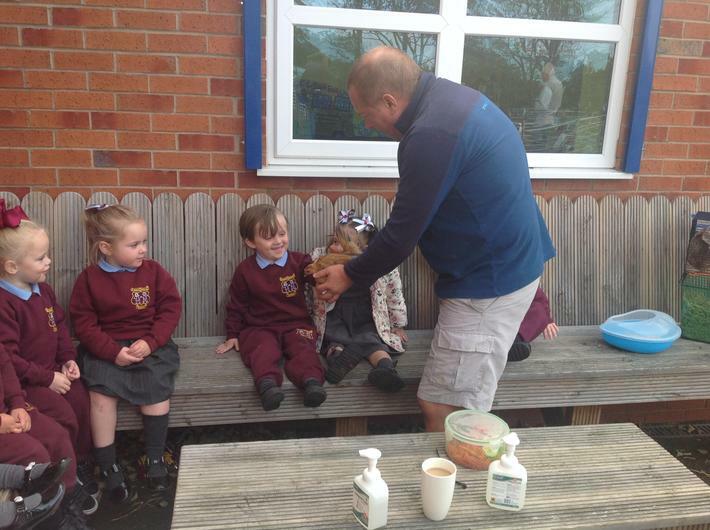 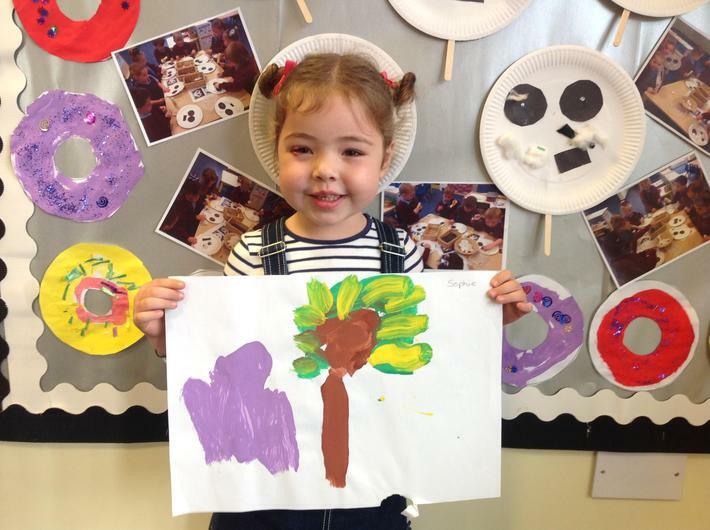 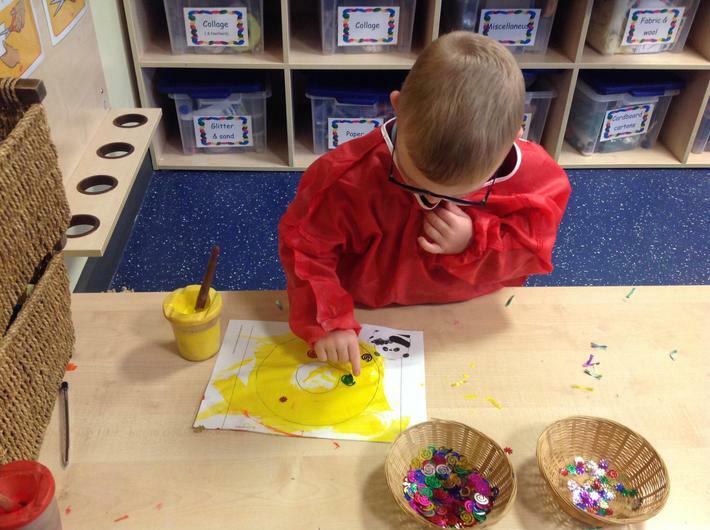 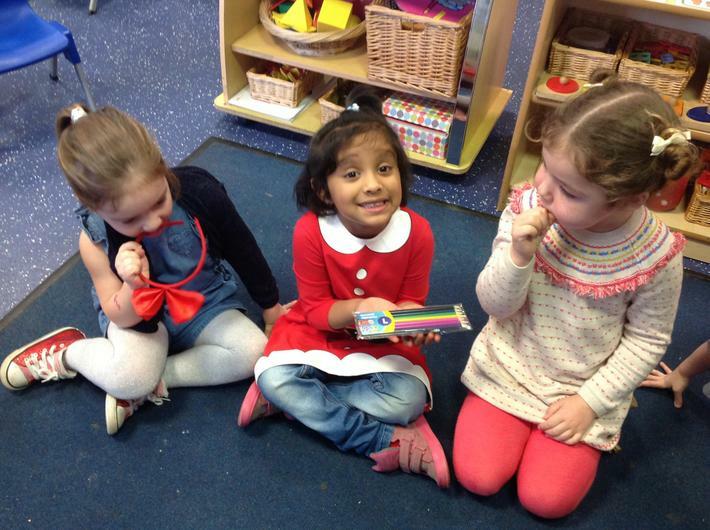 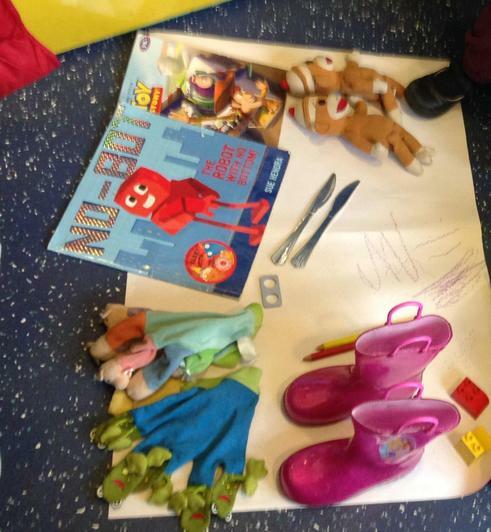 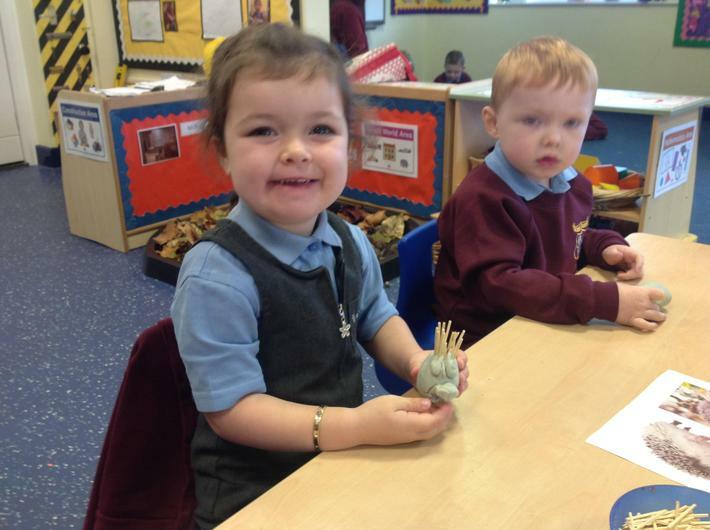 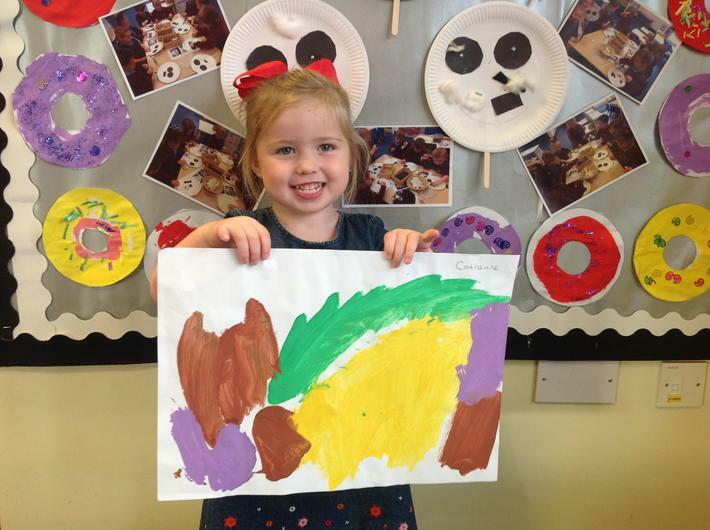 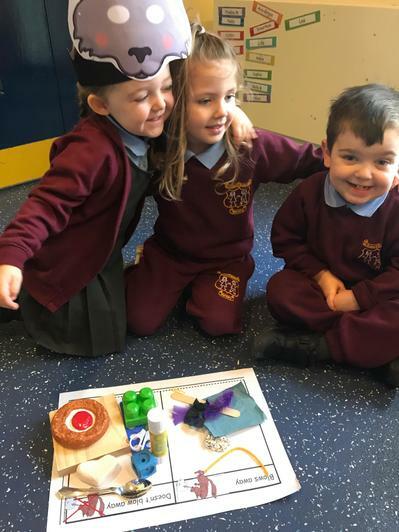 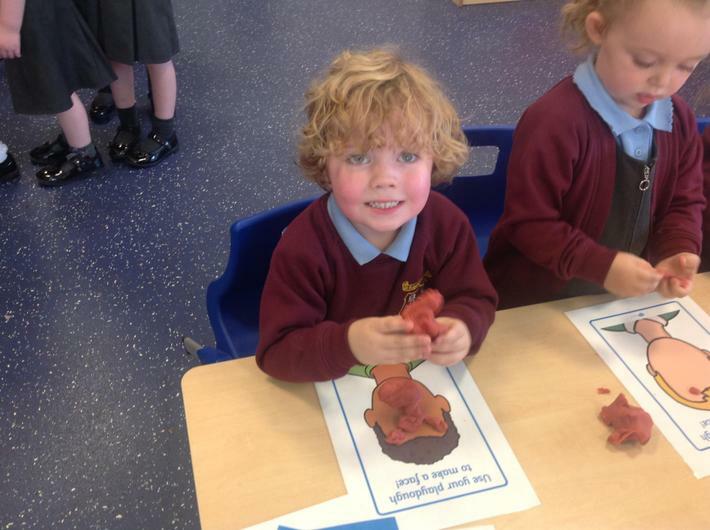 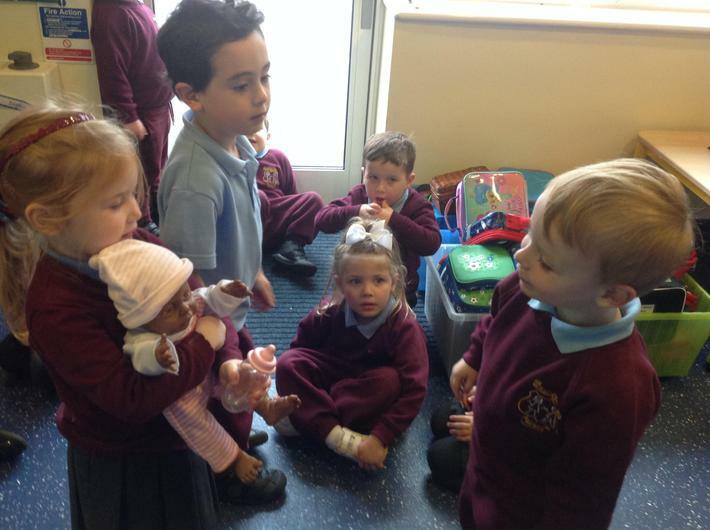 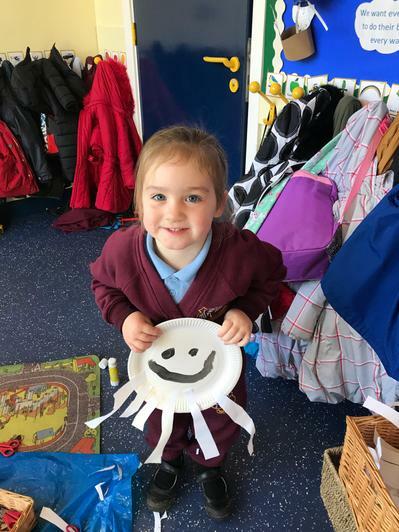 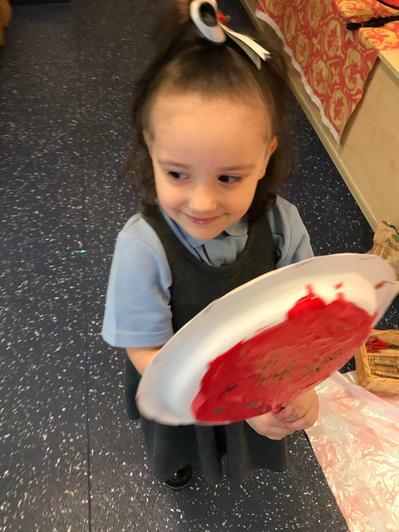 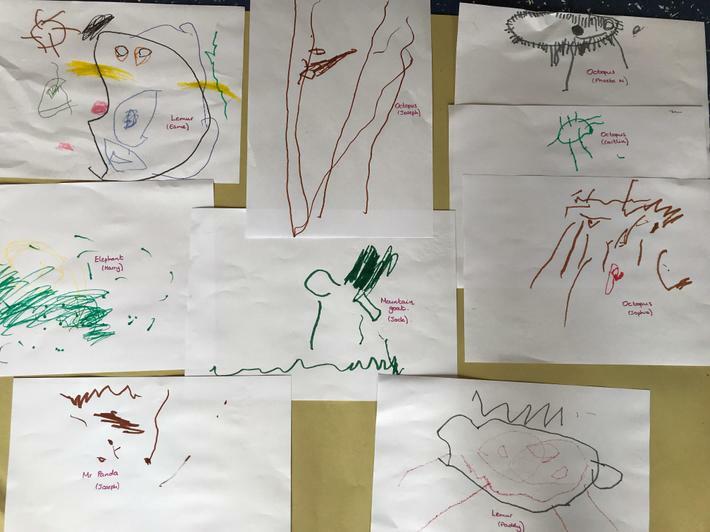 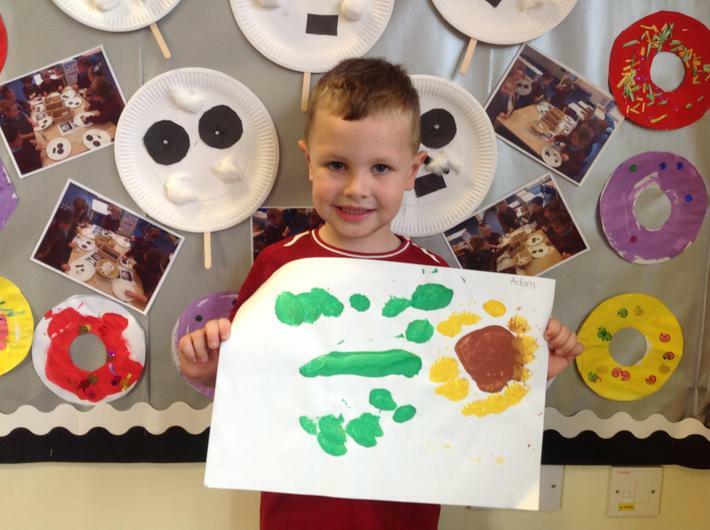 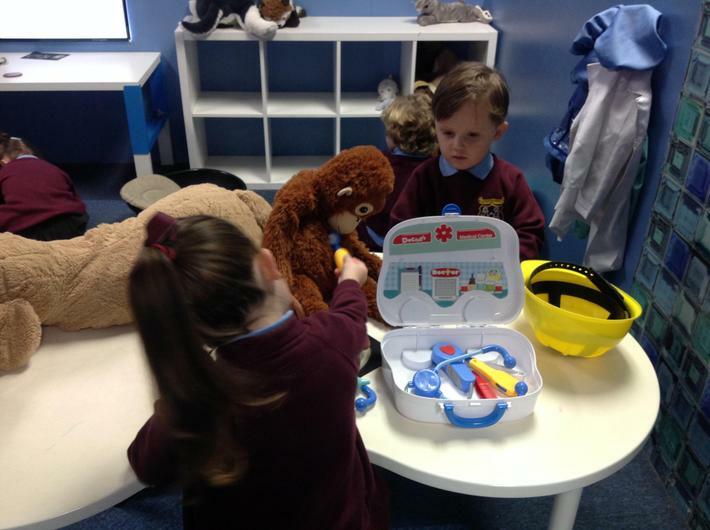 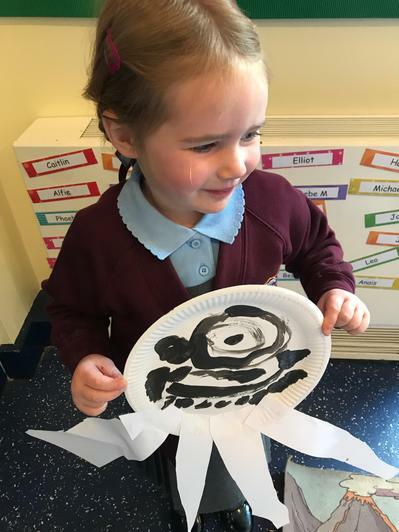 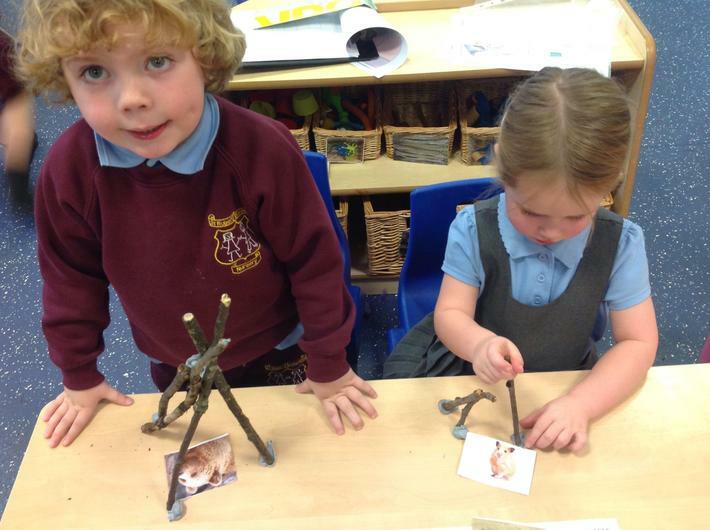 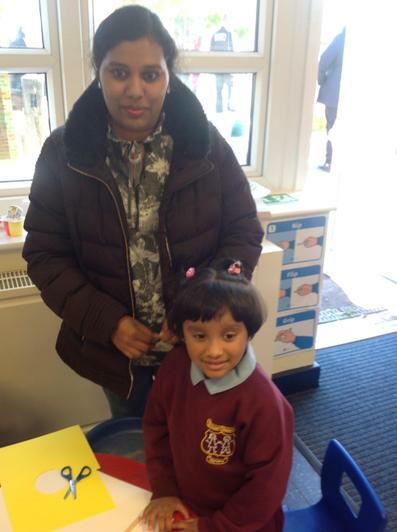 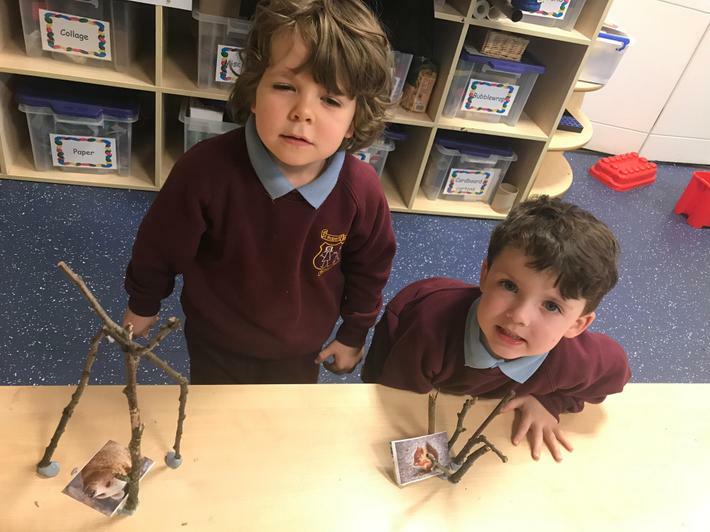 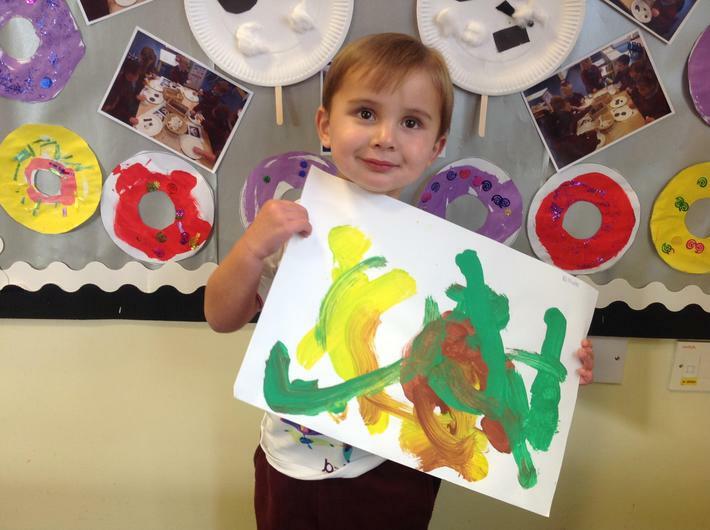 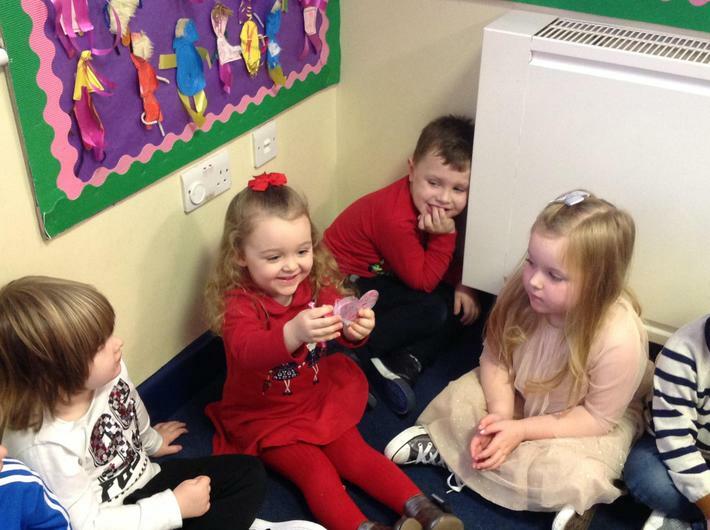 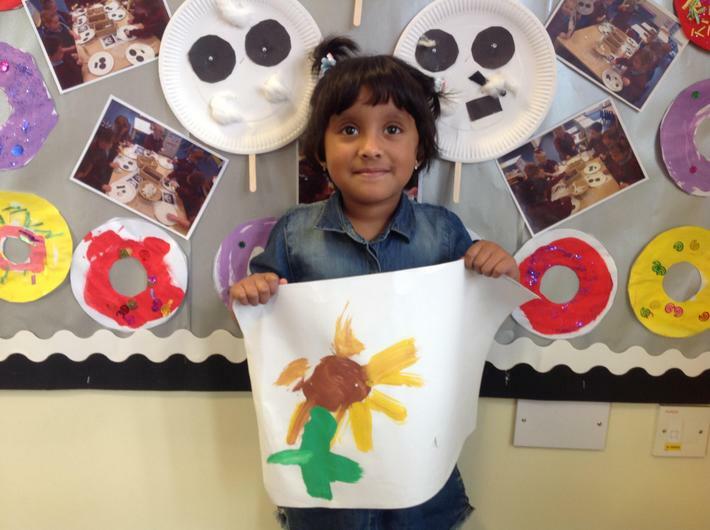 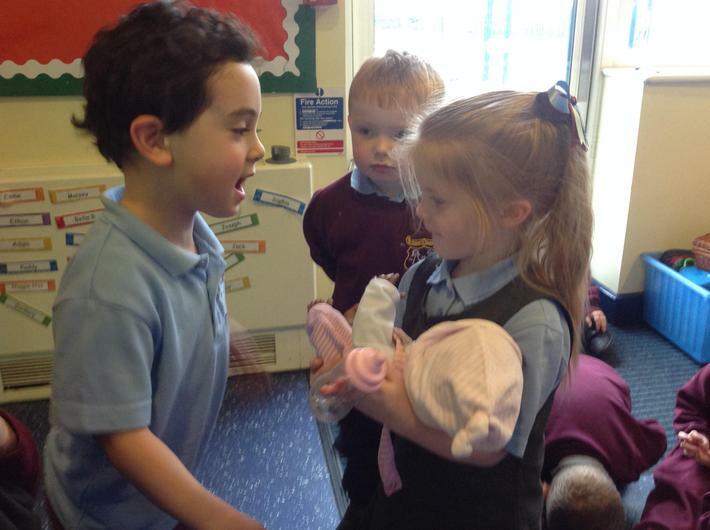 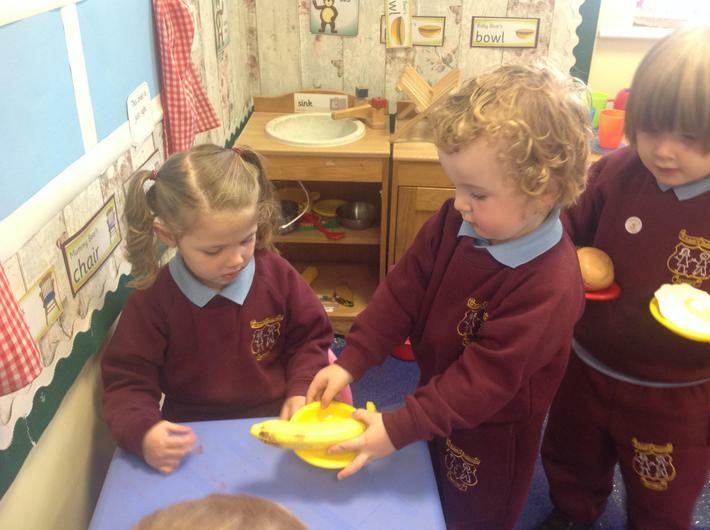 Below you can see photos of the children using role-play to practise welcoming a new baby and the drawings and play dough models the children made of their family. 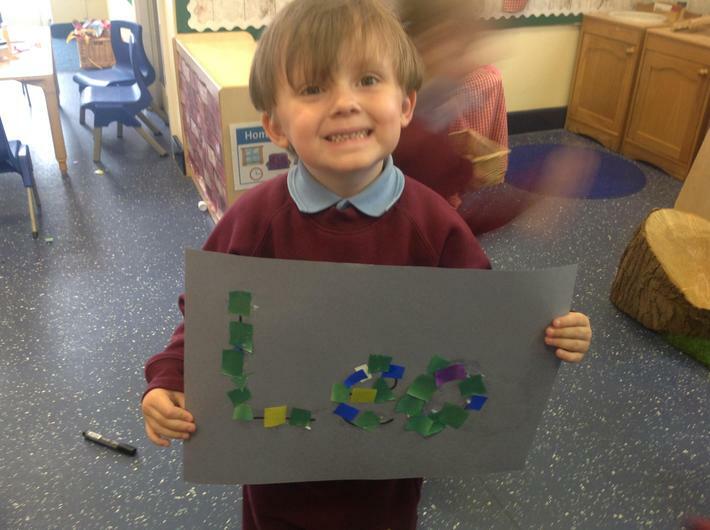 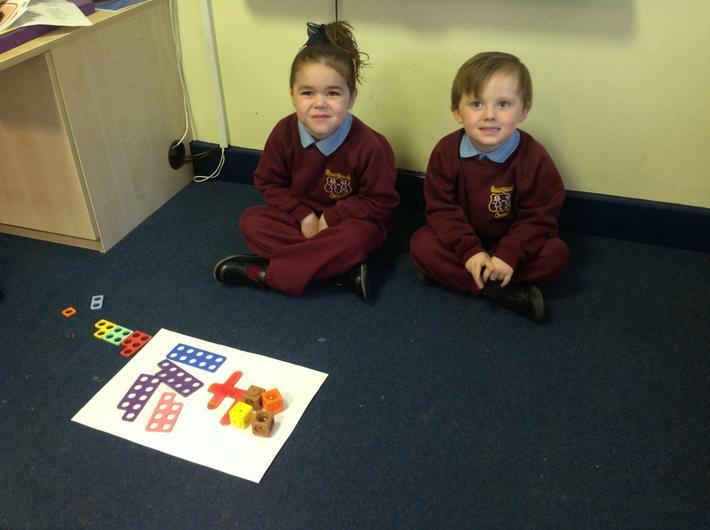 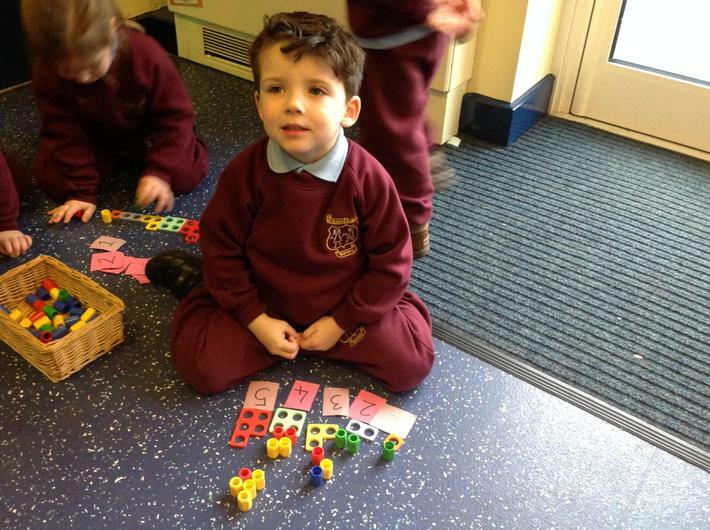 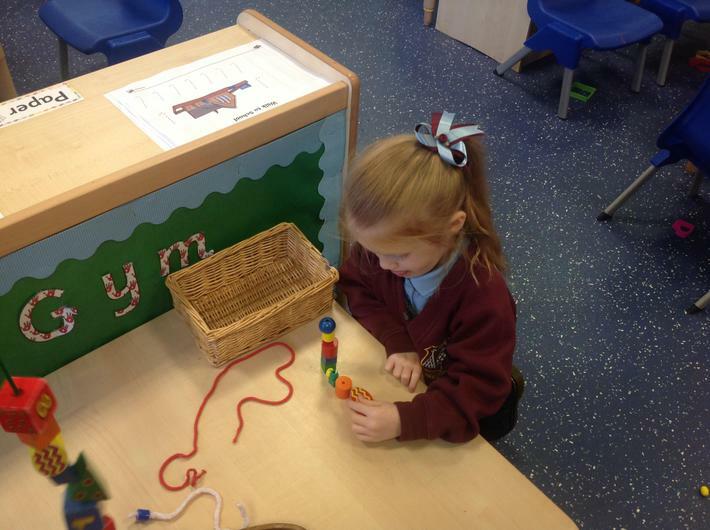 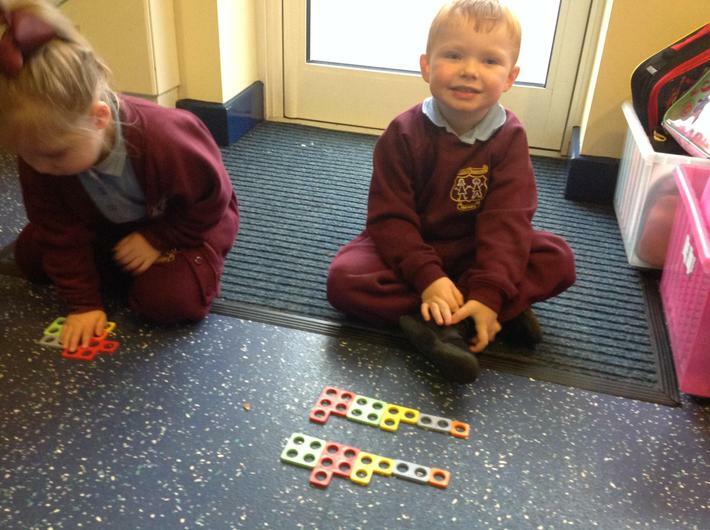 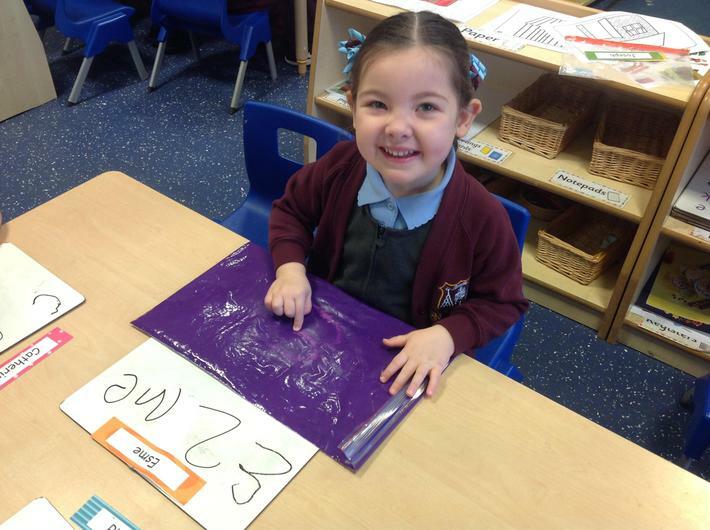 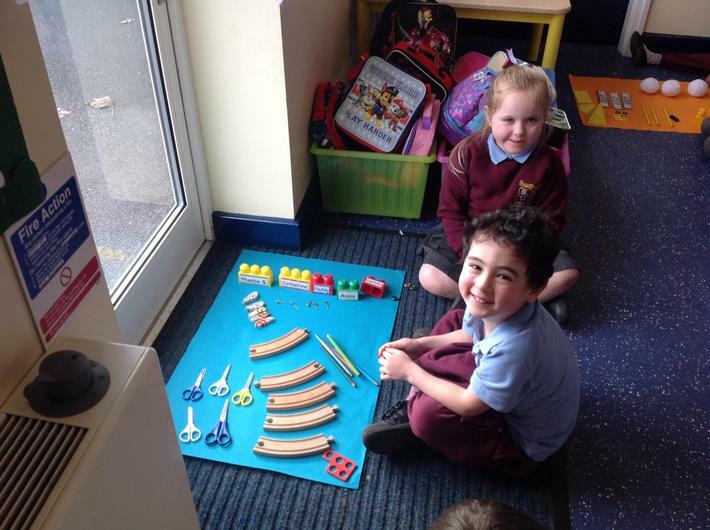 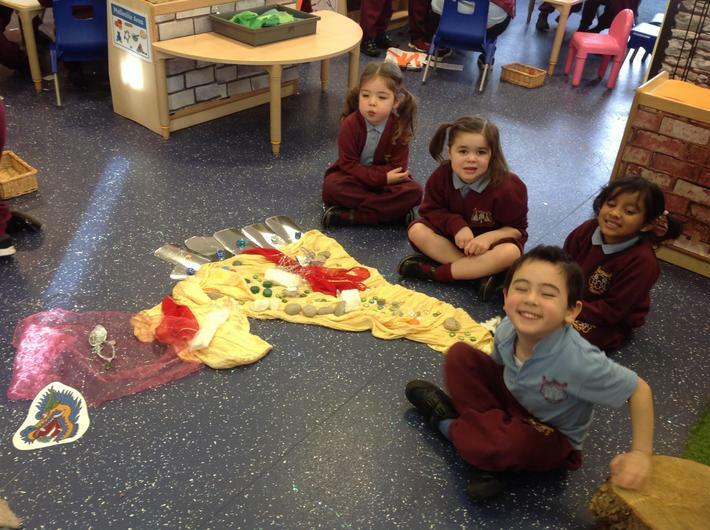 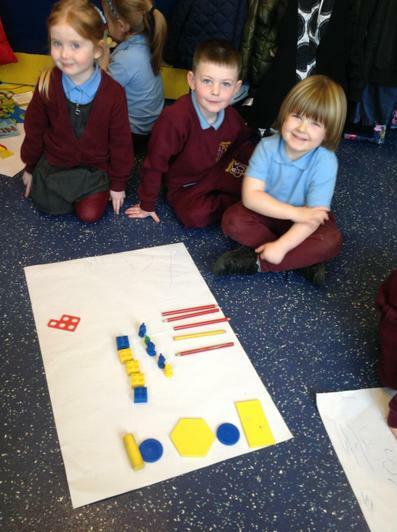 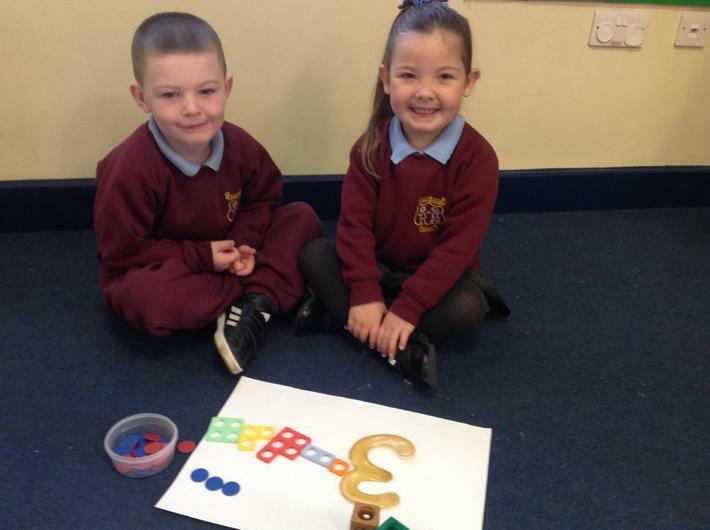 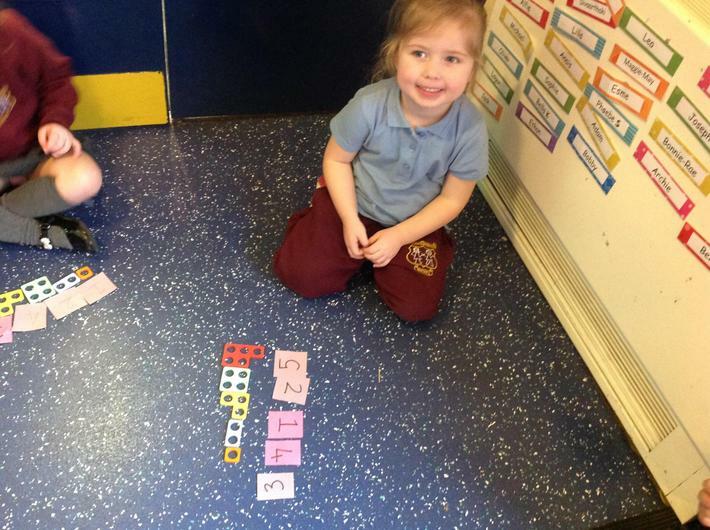 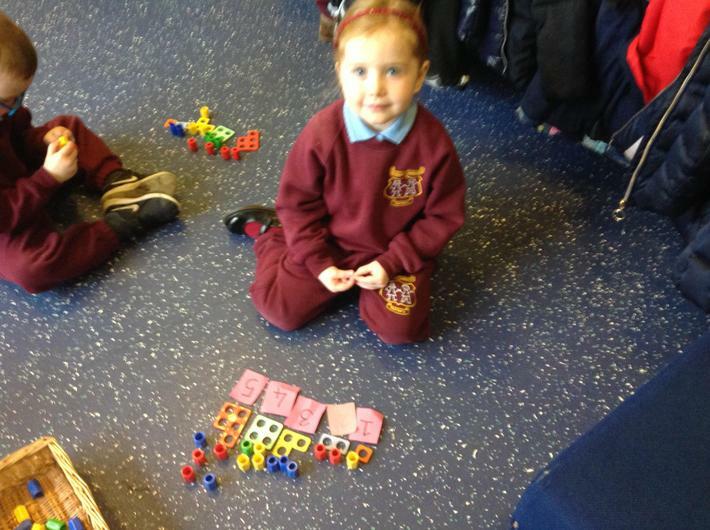 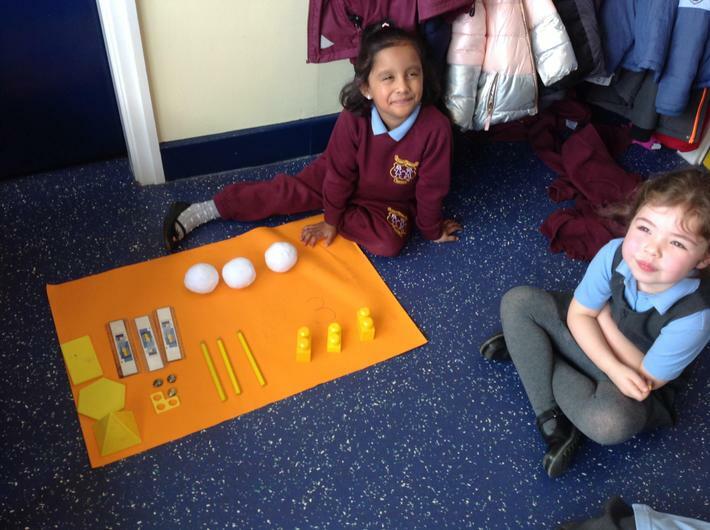 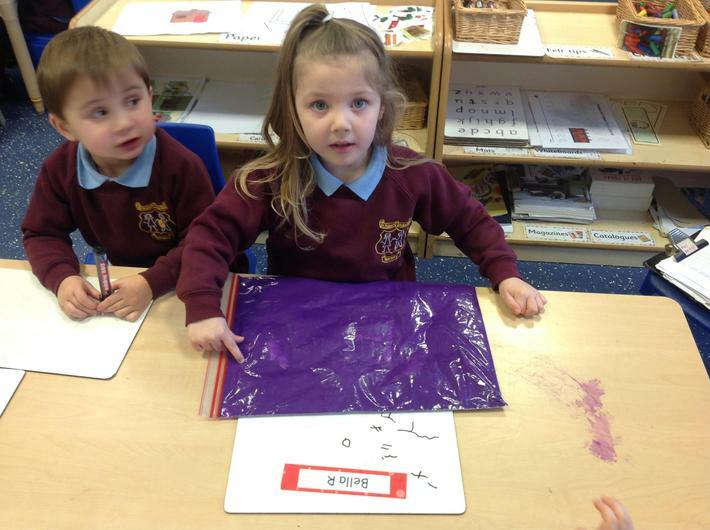 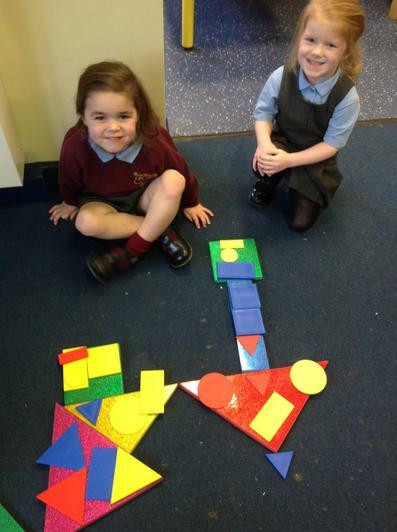 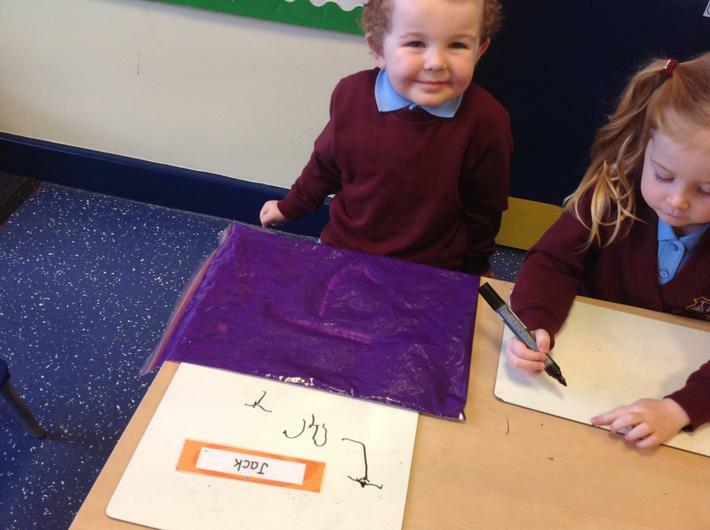 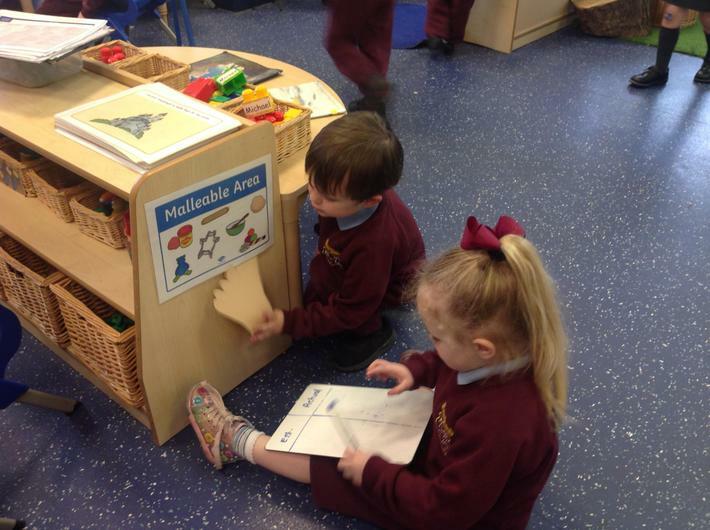 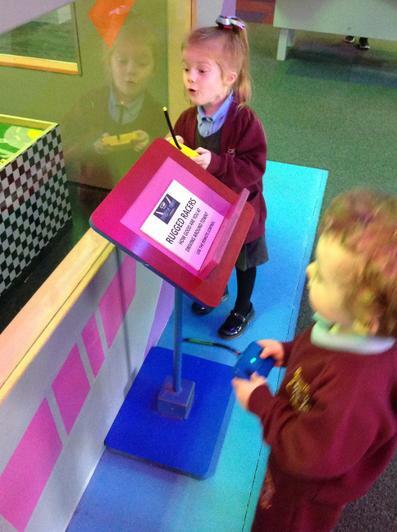 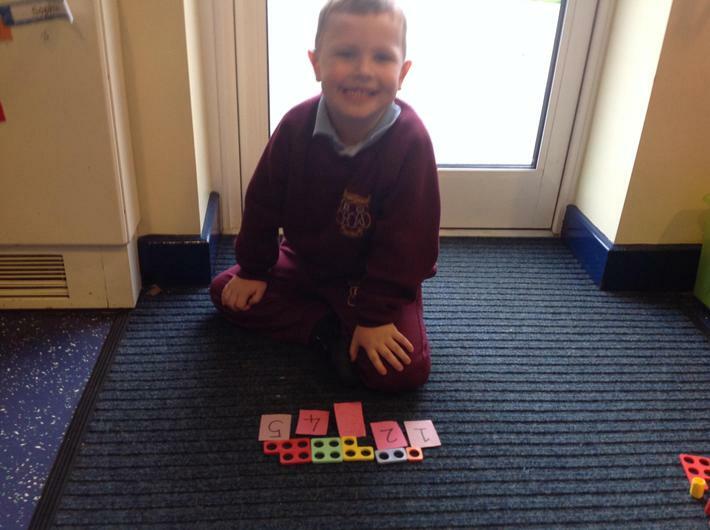 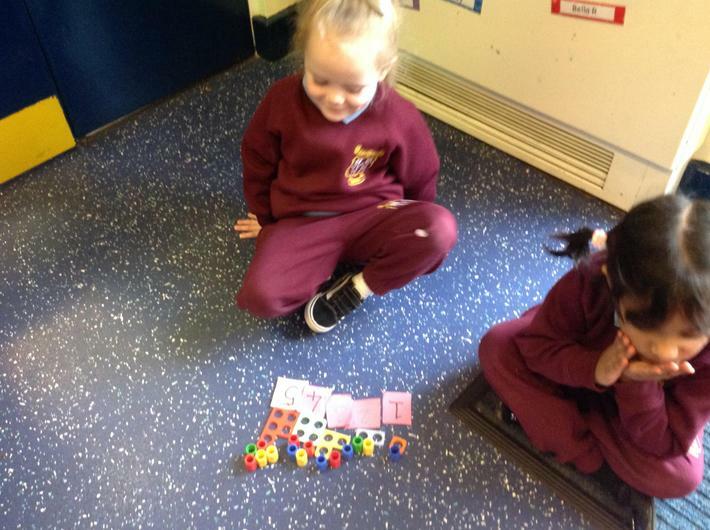 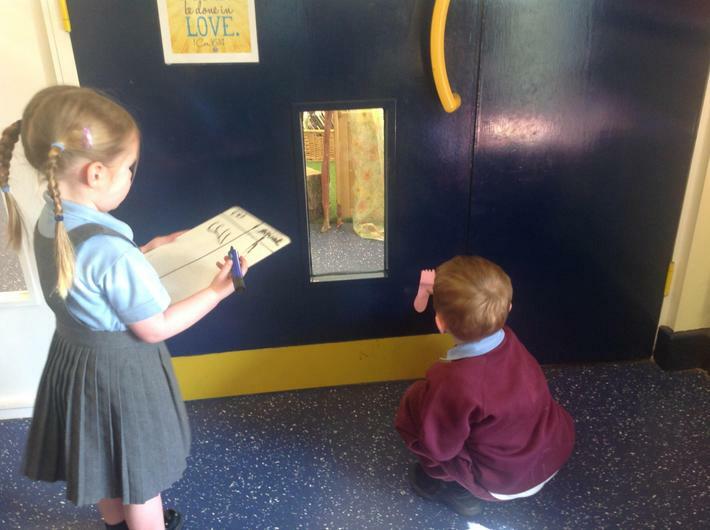 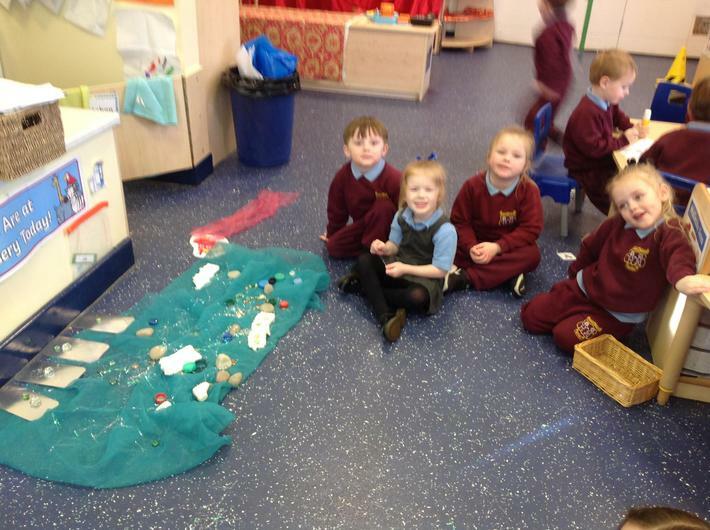 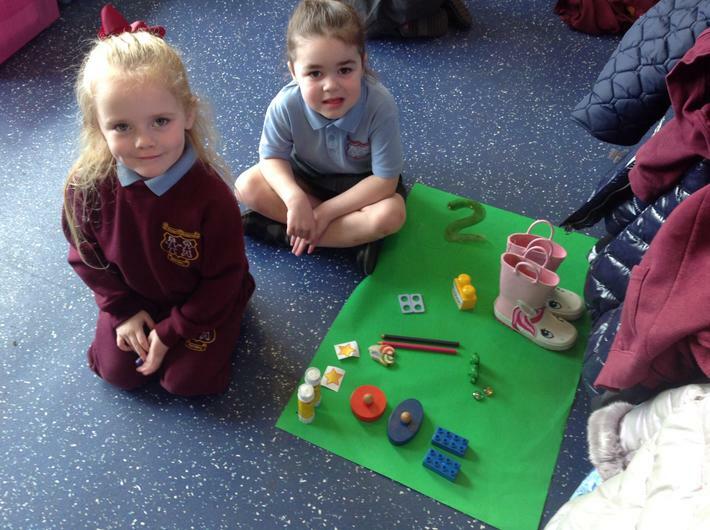 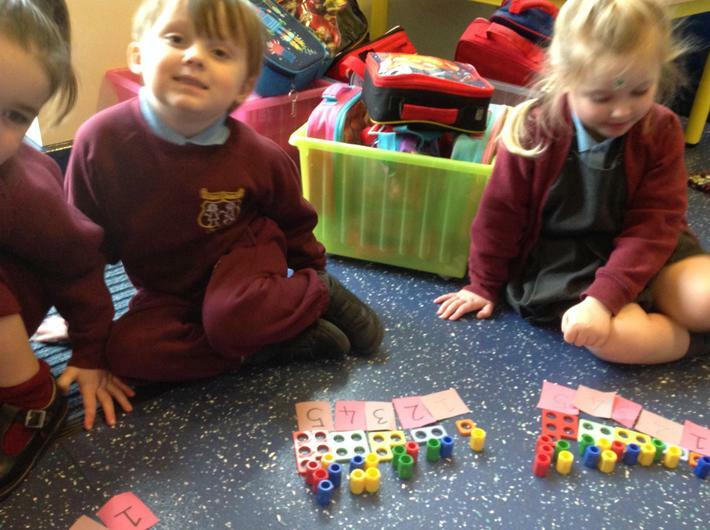 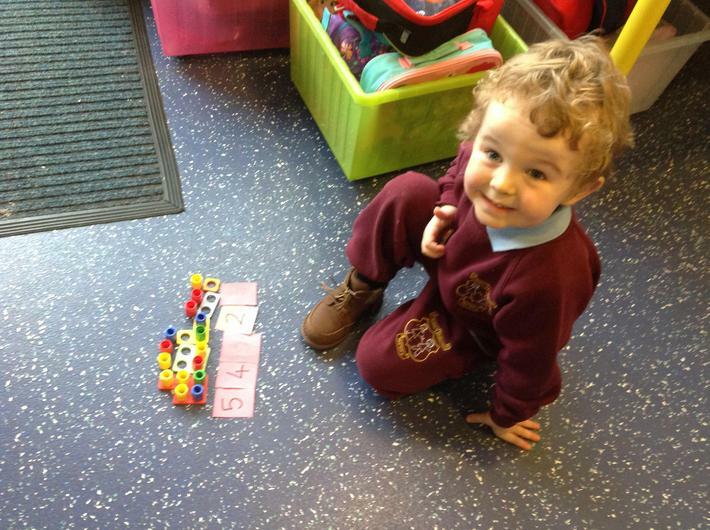 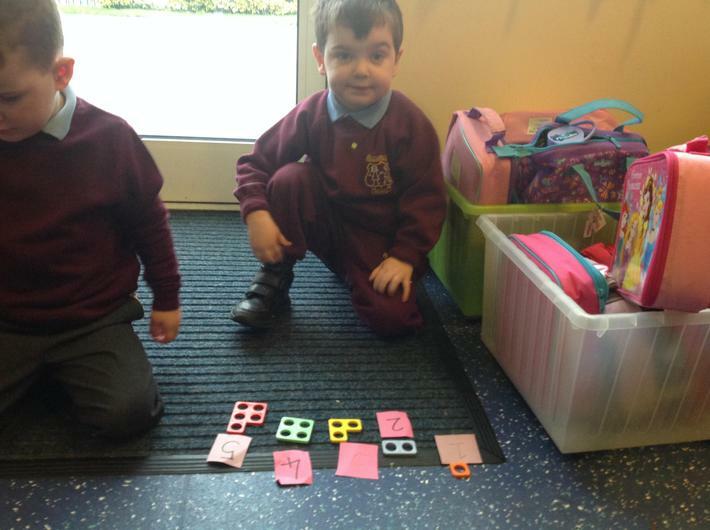 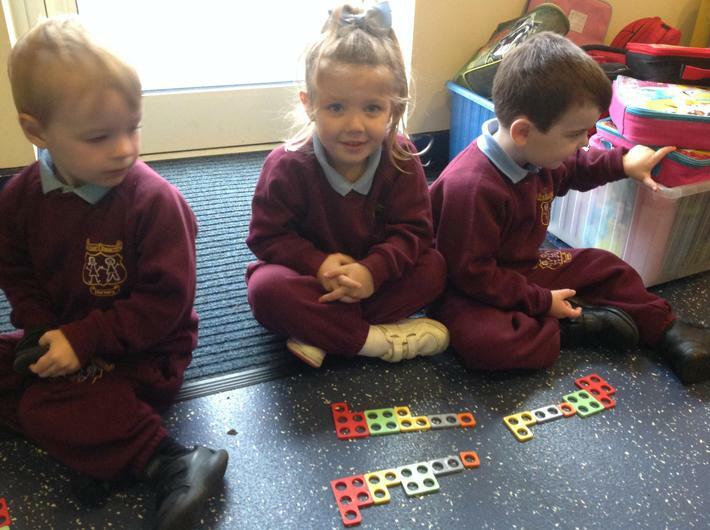 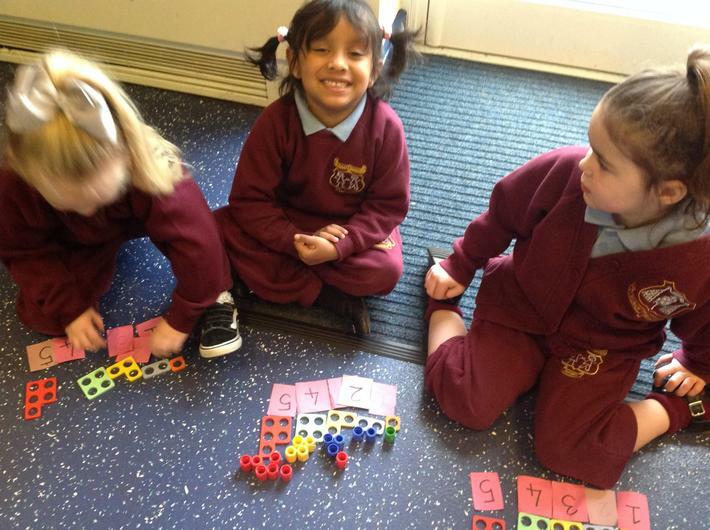 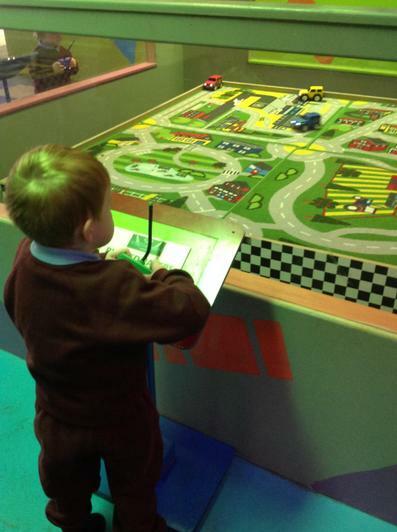 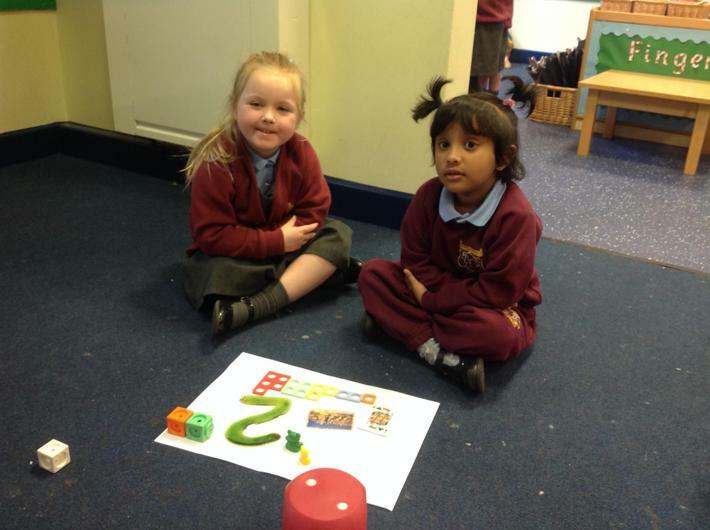 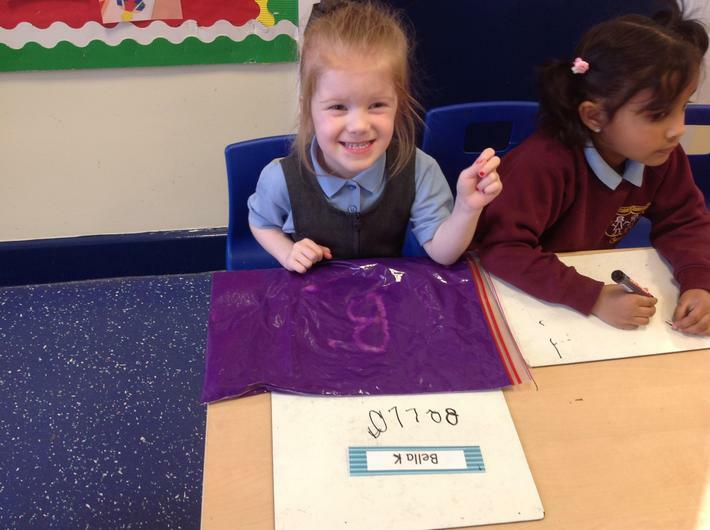 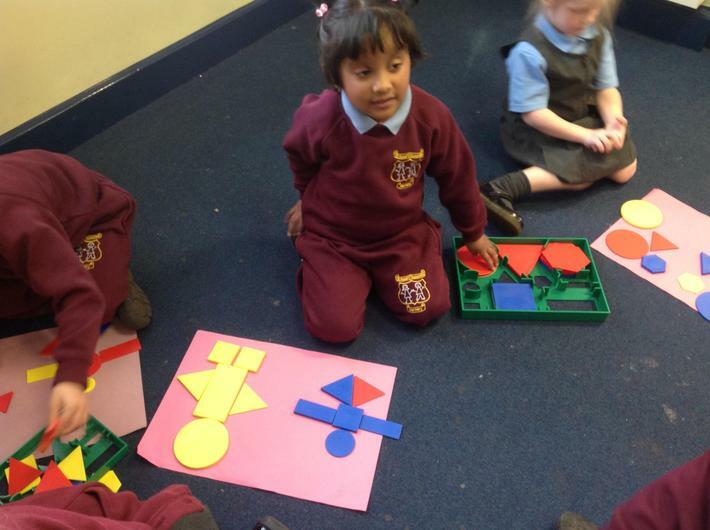 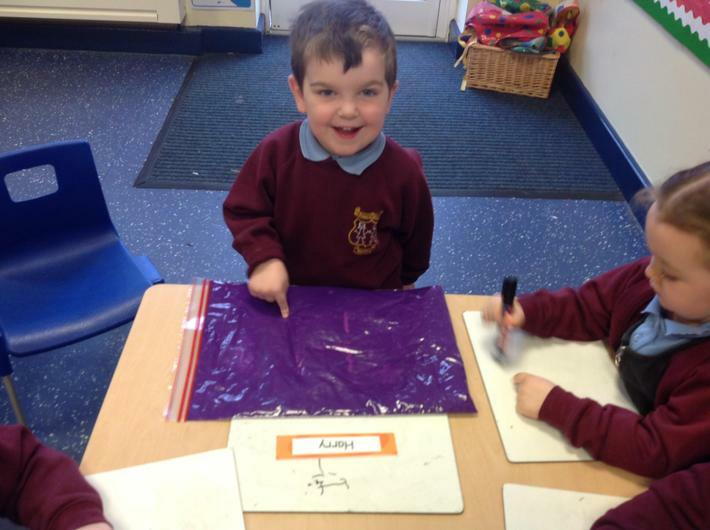 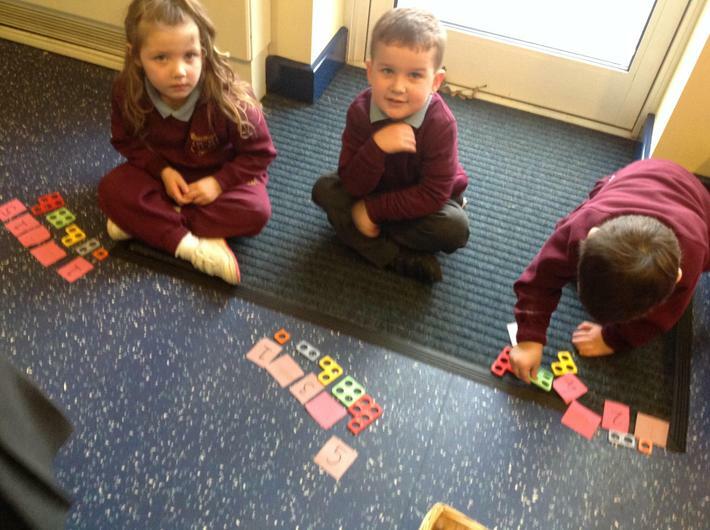 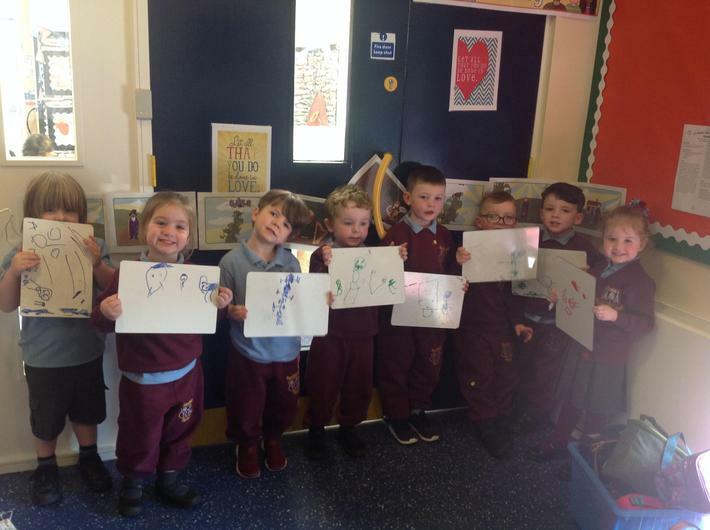 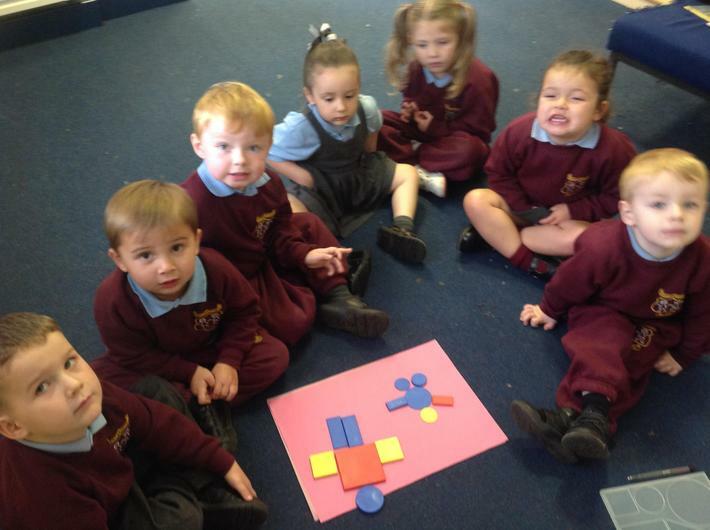 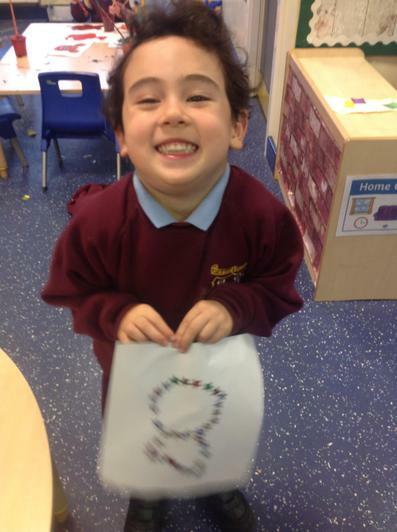 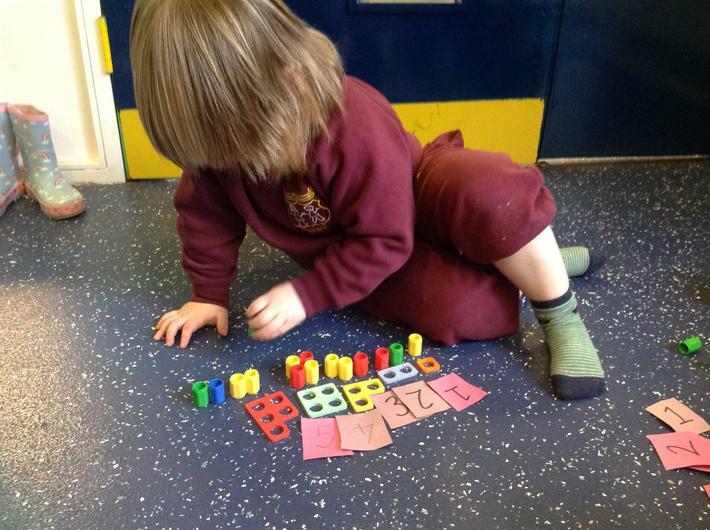 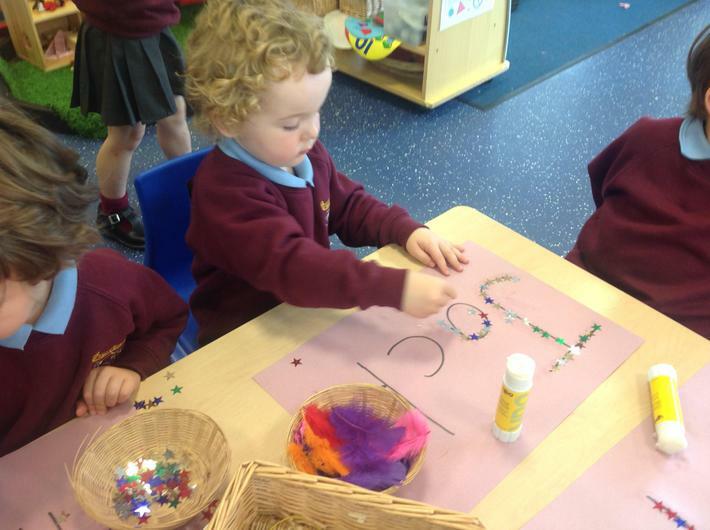 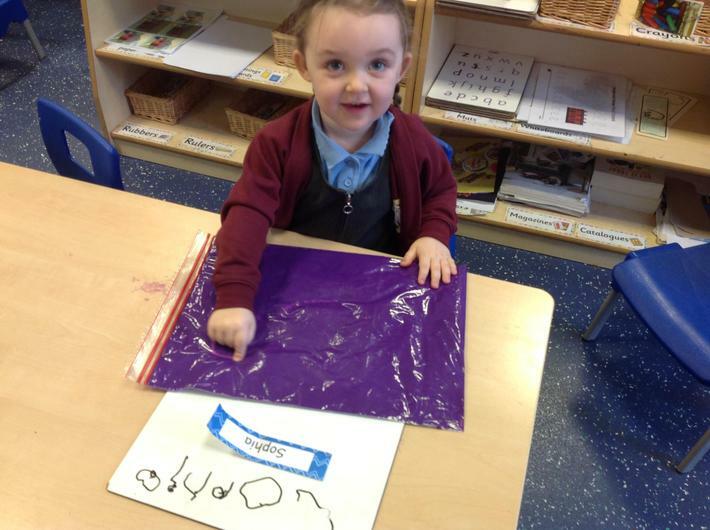 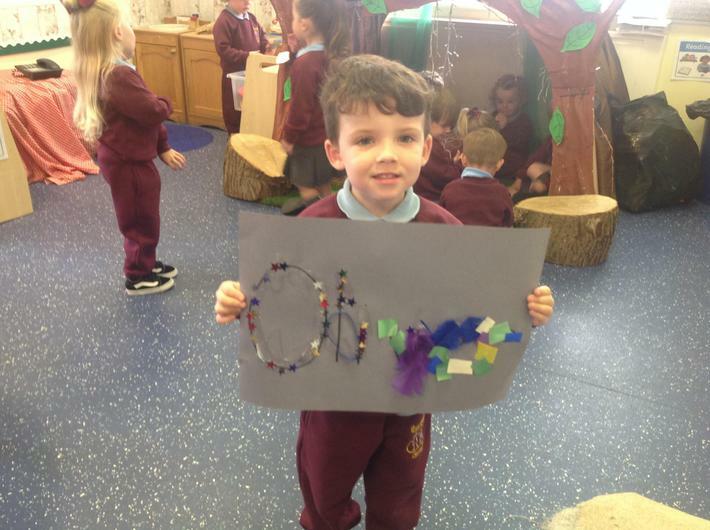 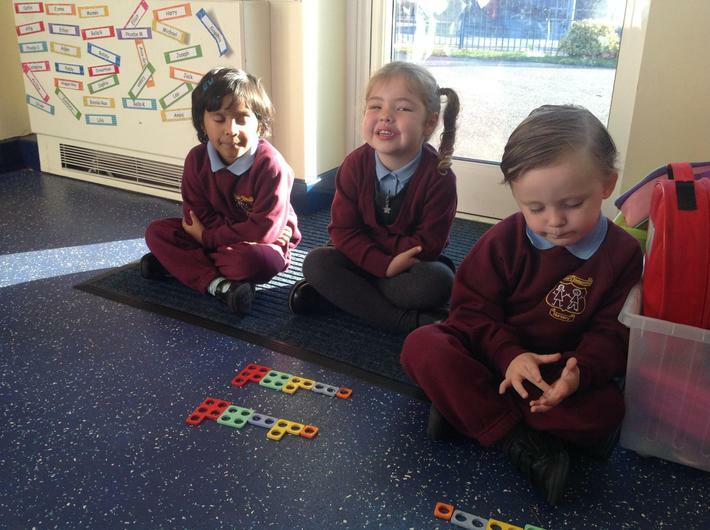 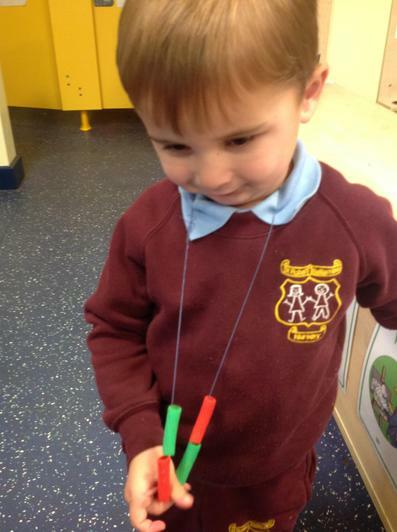 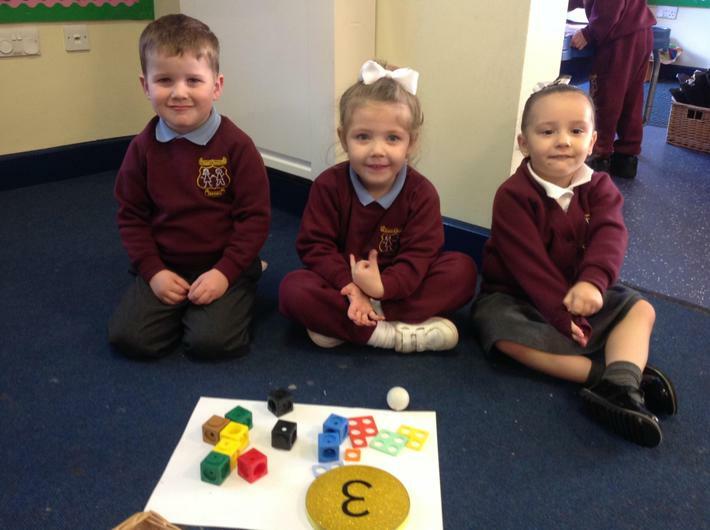 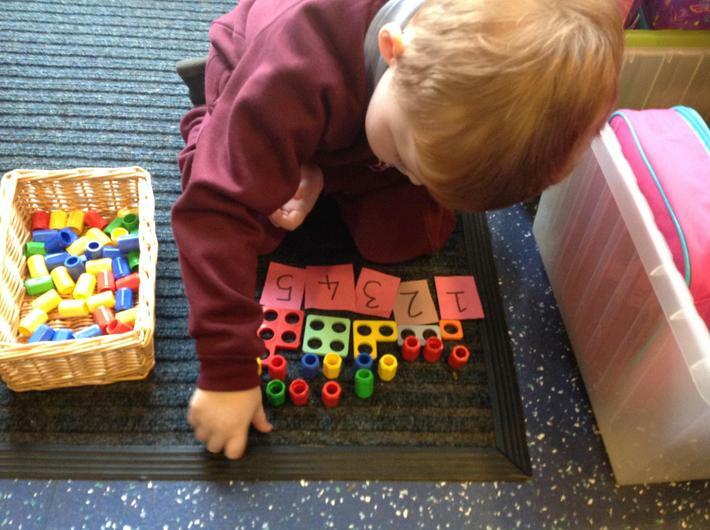 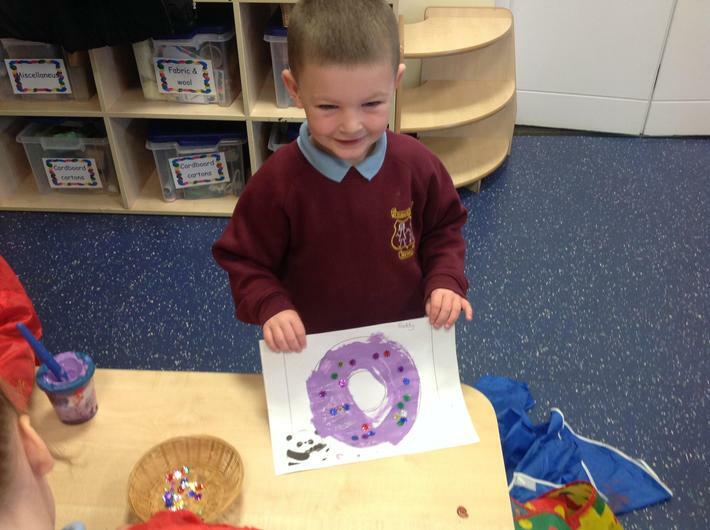 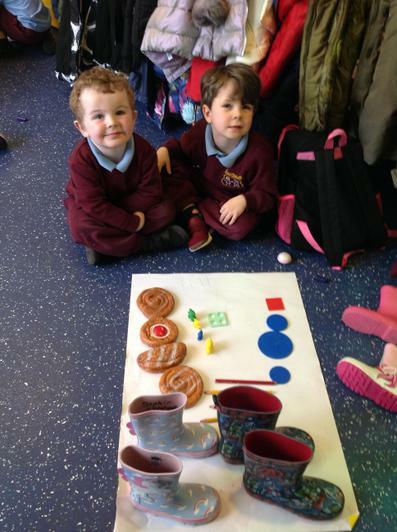 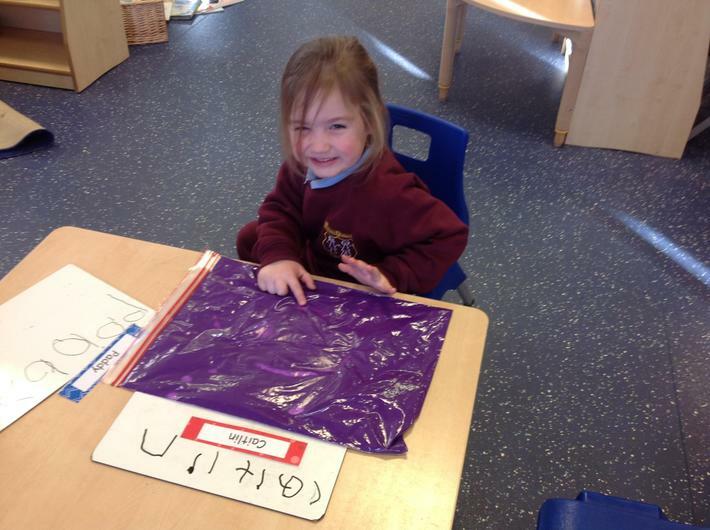 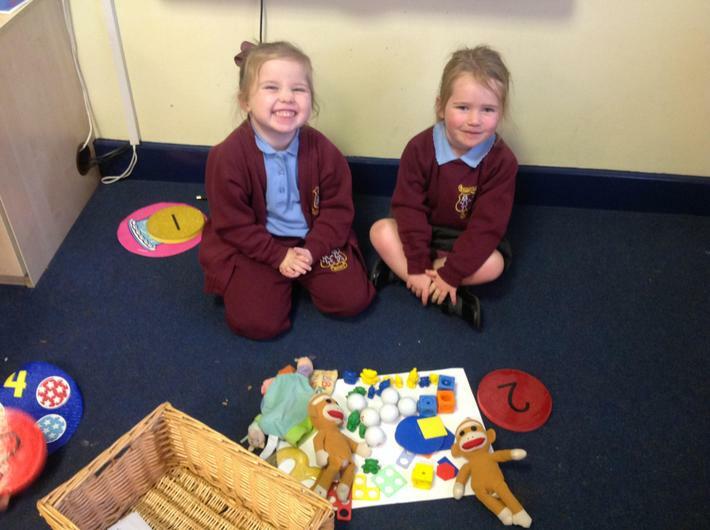 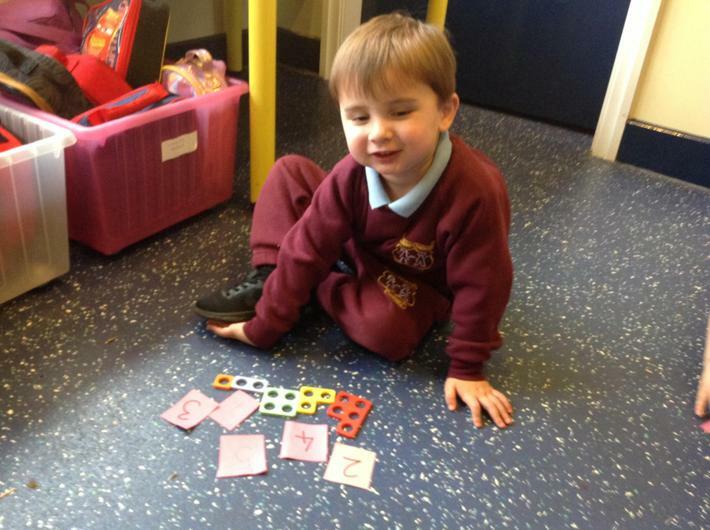 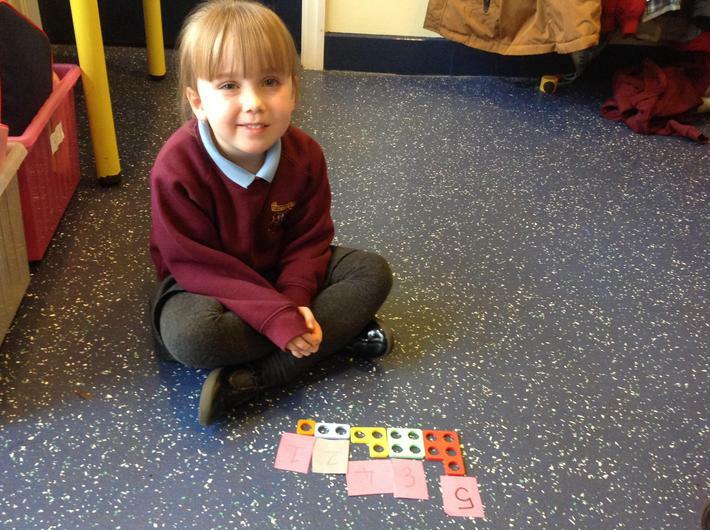 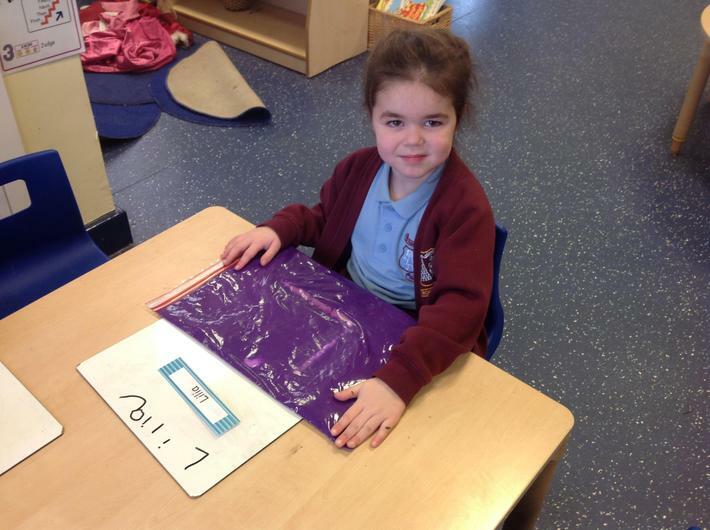 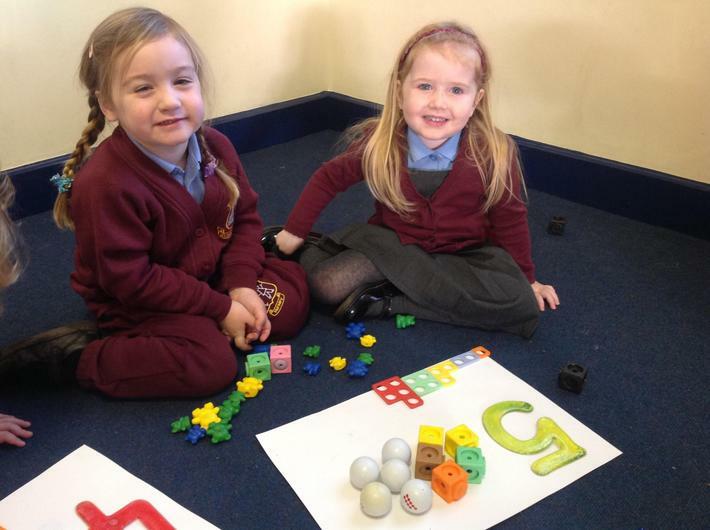 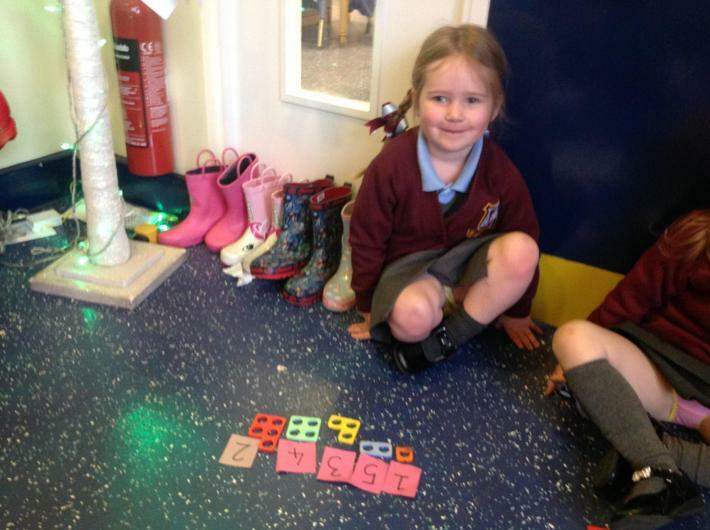 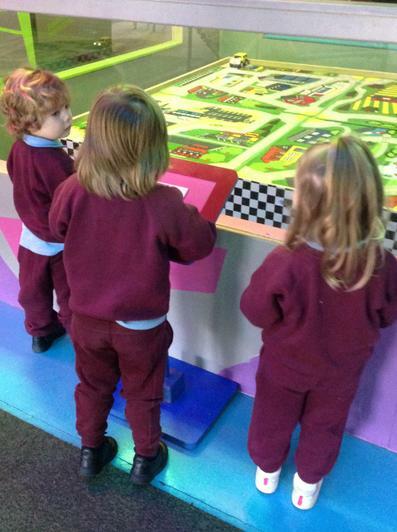 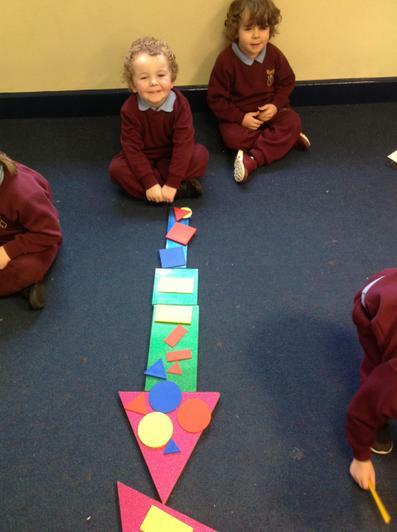 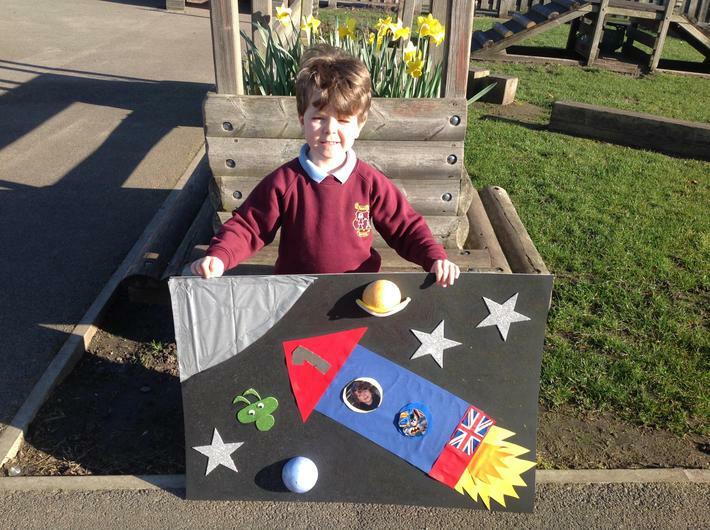 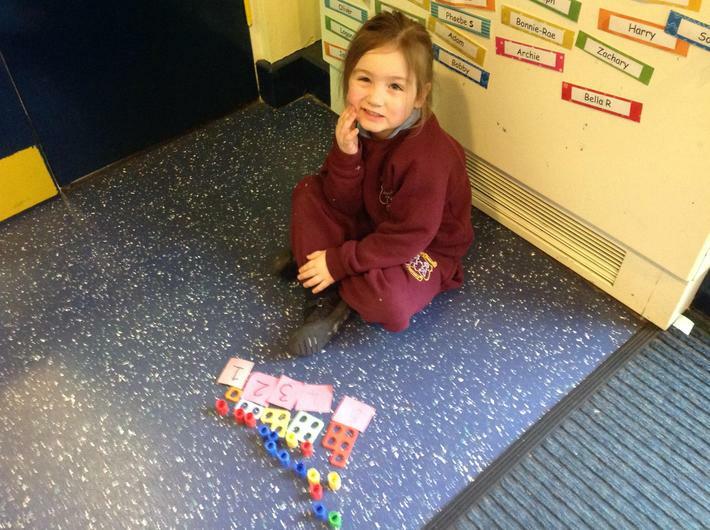 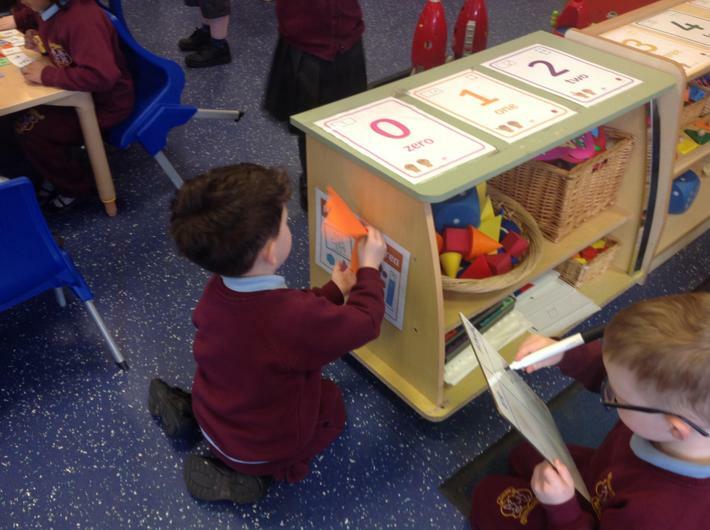 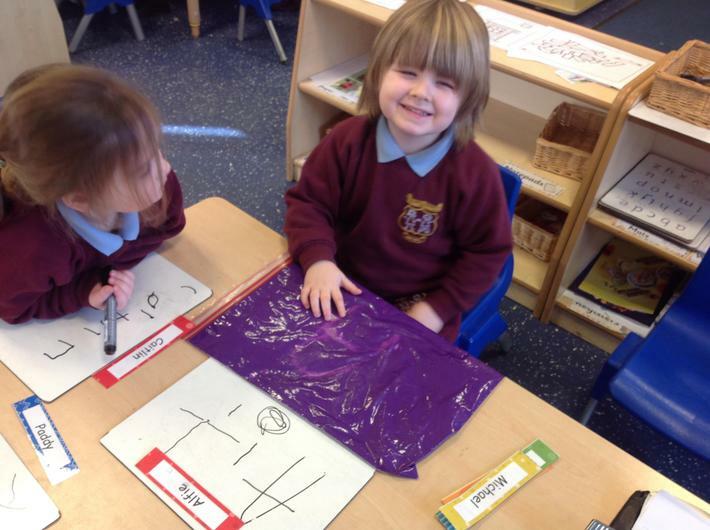 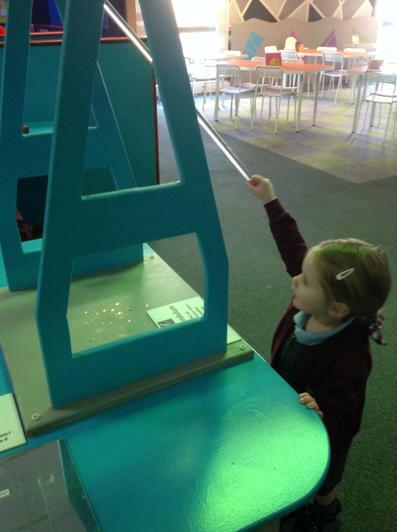 The children made their first ever maths museum today to show what the numbers 1-5 look like in different ways! 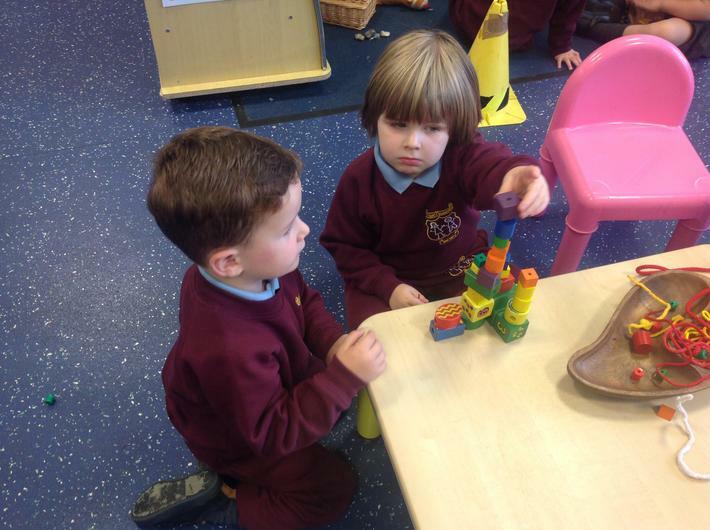 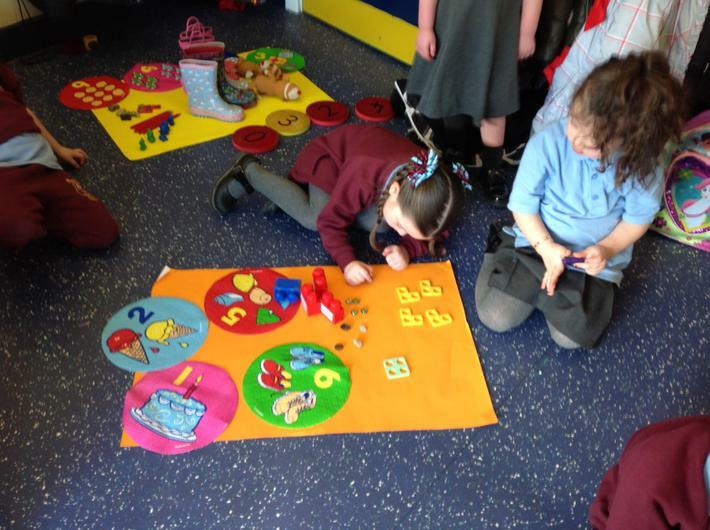 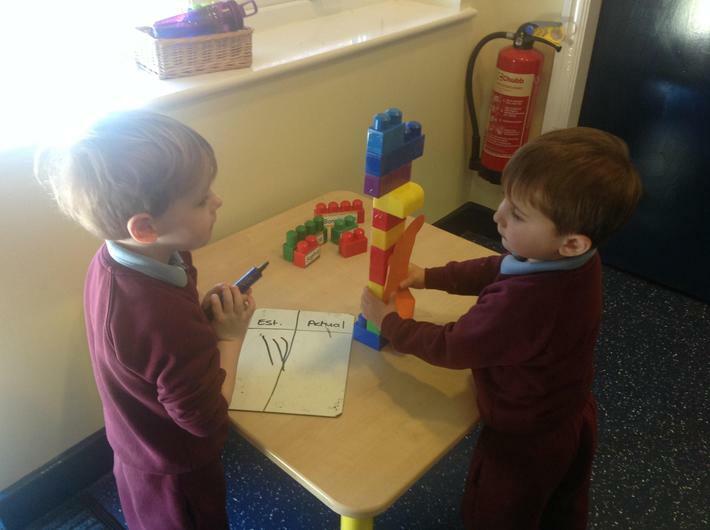 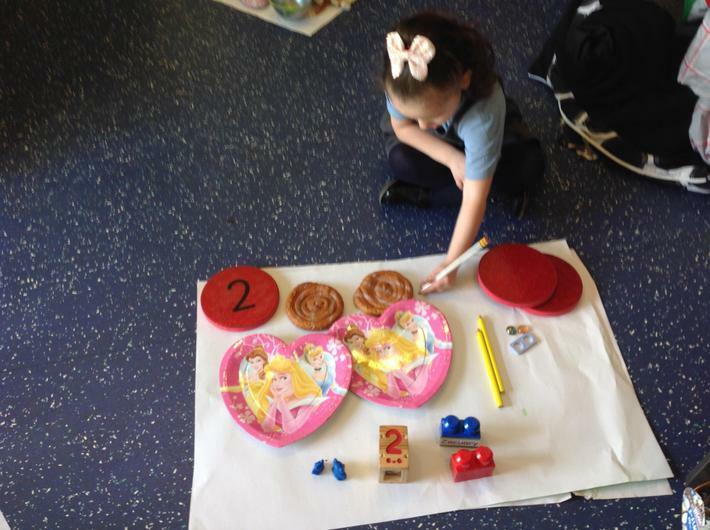 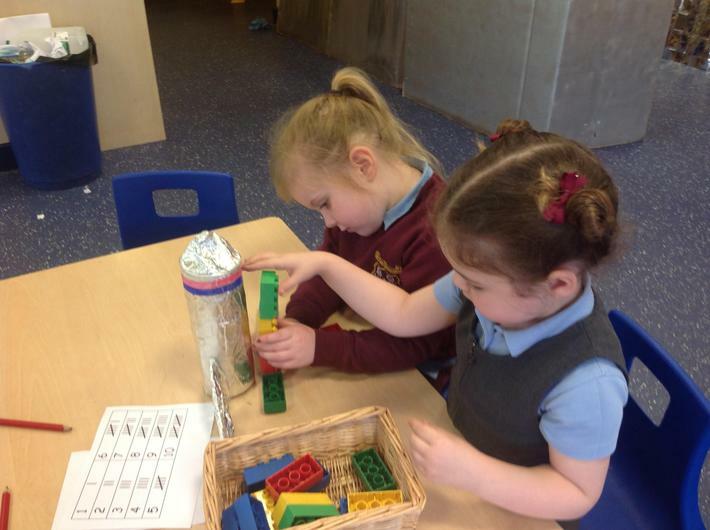 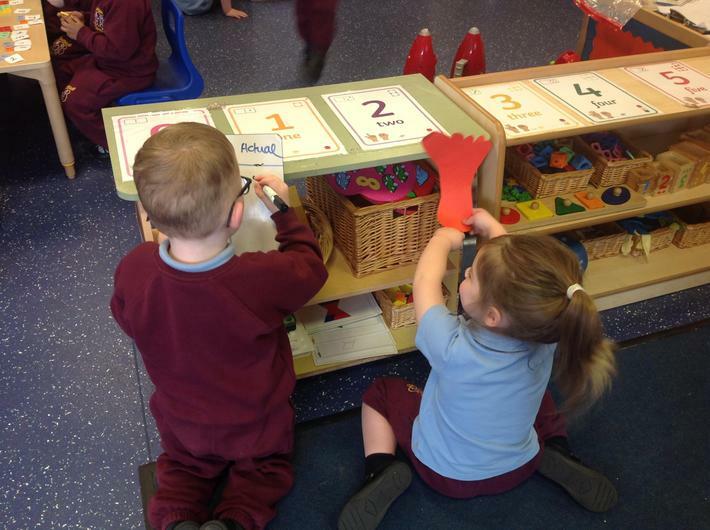 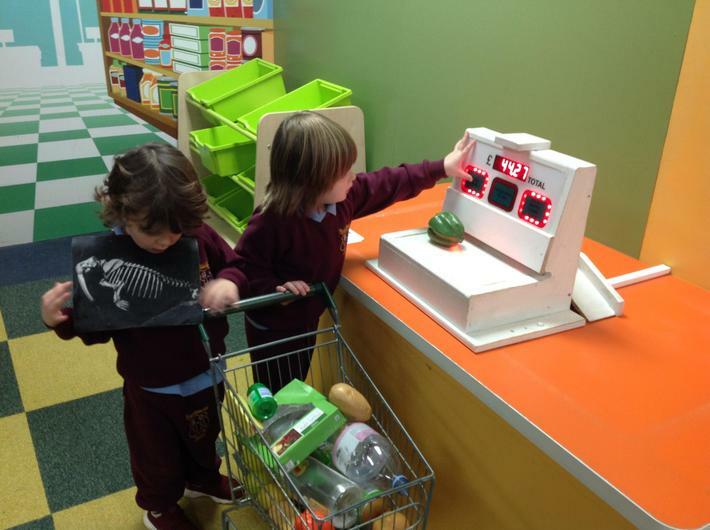 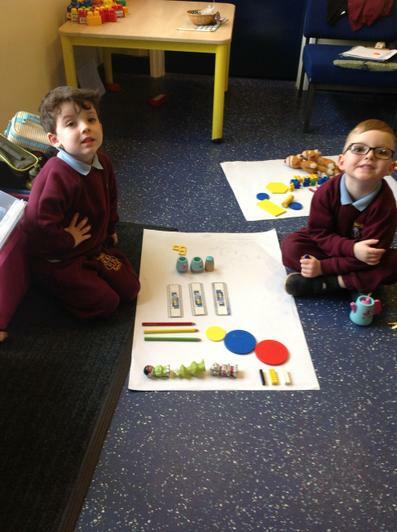 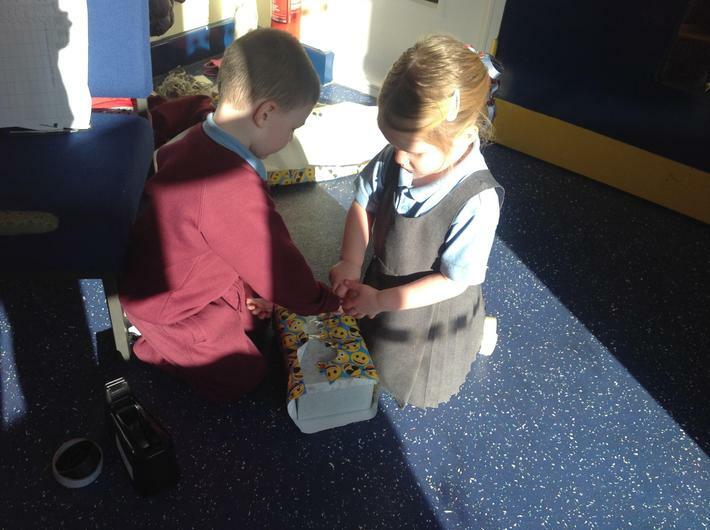 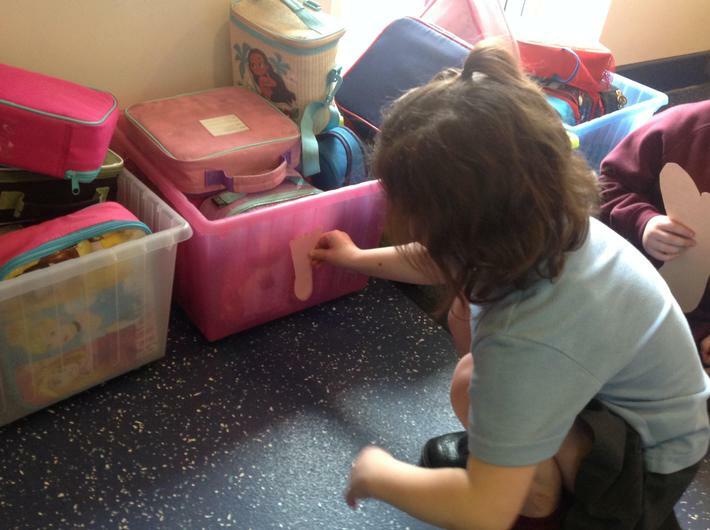 Working in partners they explored how to organise a range of objects to ensure their counting was accurate and systematic. 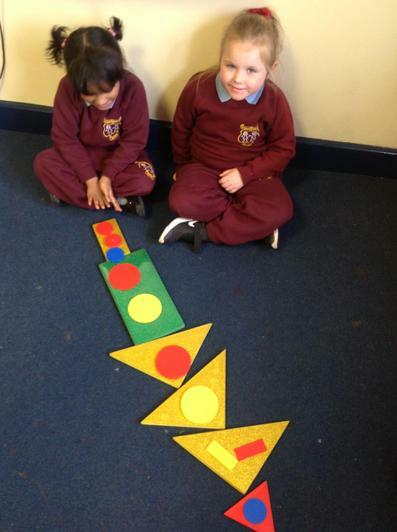 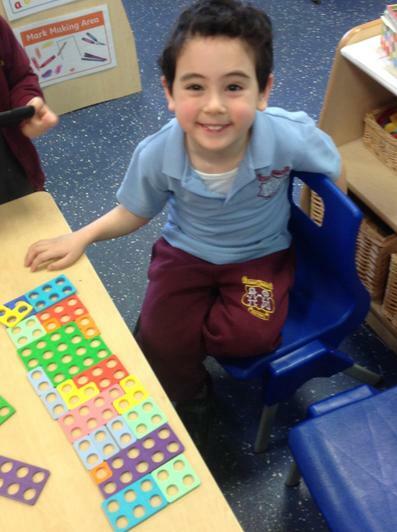 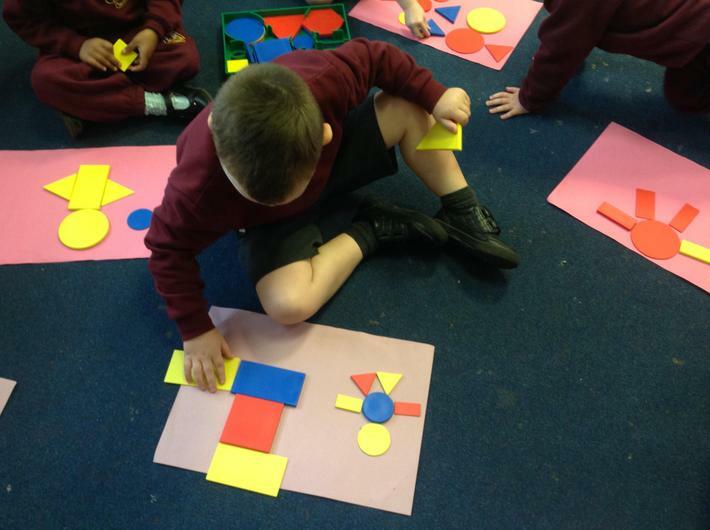 To consolidate previous work on repeating patterns, we explored how to use 2 or 3 colours to make a pattern. 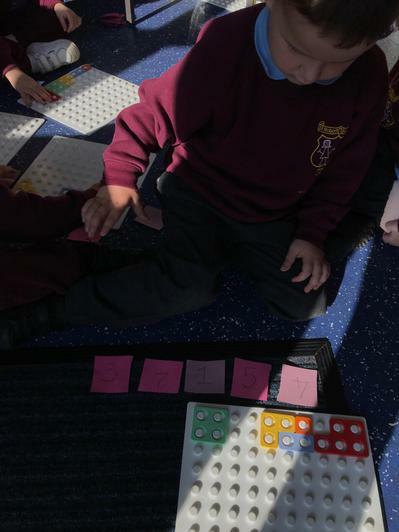 The class practised saying the sequence to themselves to check for errors and they began to justify what would come next. 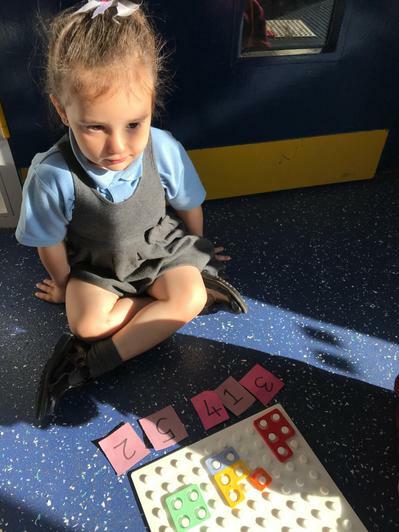 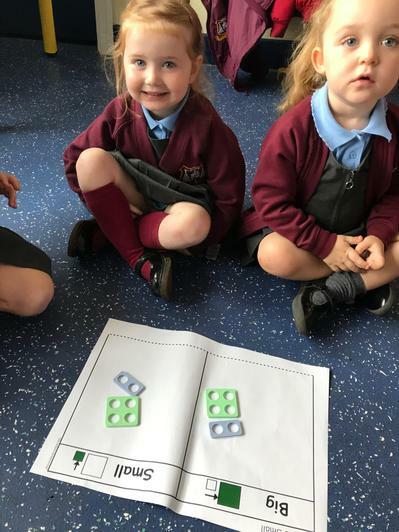 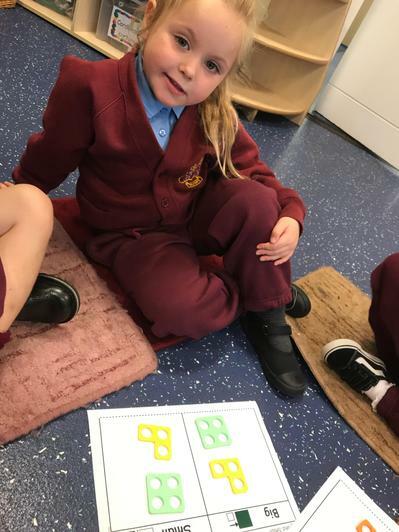 To apply their knowledge of the Numicon staircase and the numerical value of each Numicon shape we set the children a challenge to correct errors in a staircase. 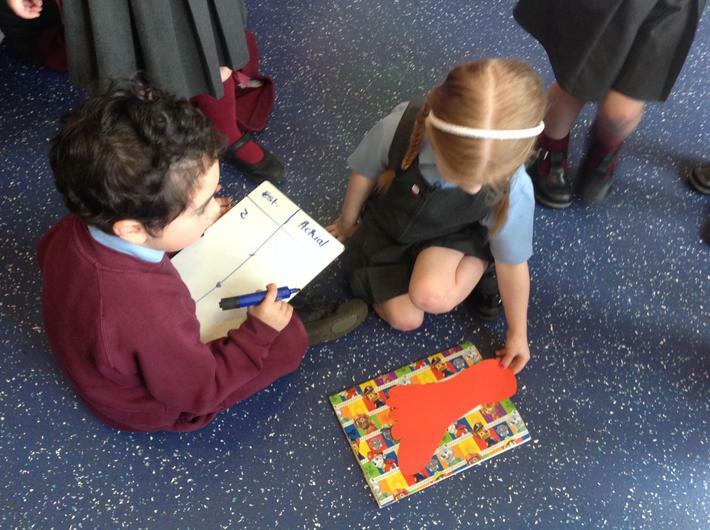 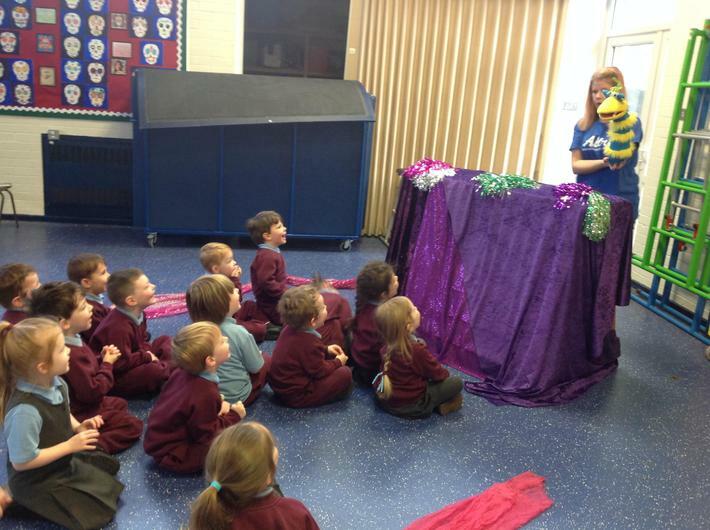 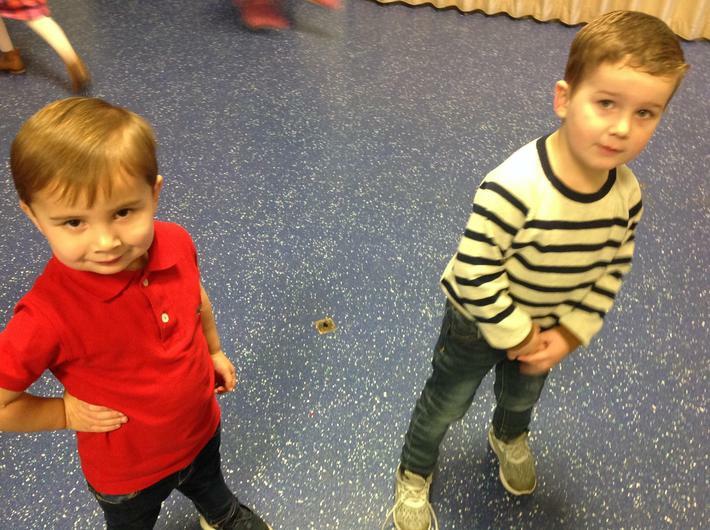 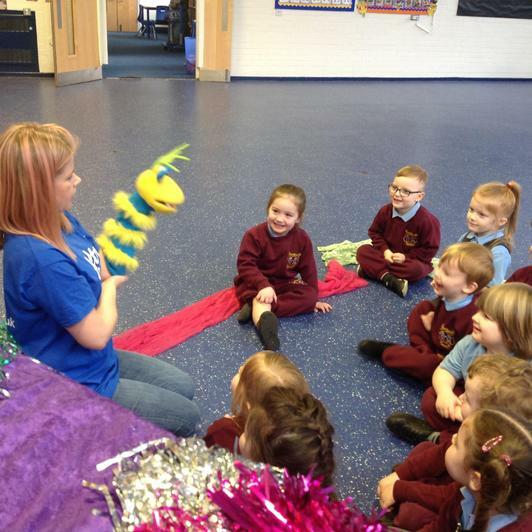 After locating the error, the children were encouraged to justify and convince the adult about why it was wrong. 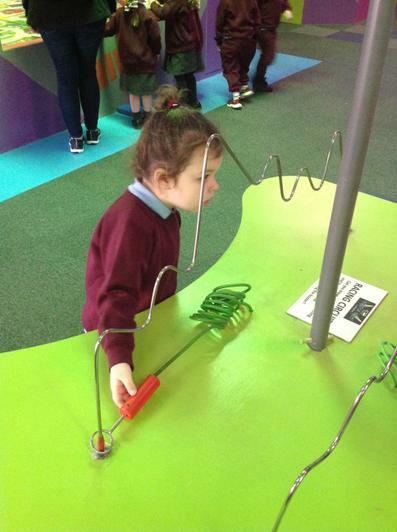 Finally they built a new staircase underneath to prove their justifications. 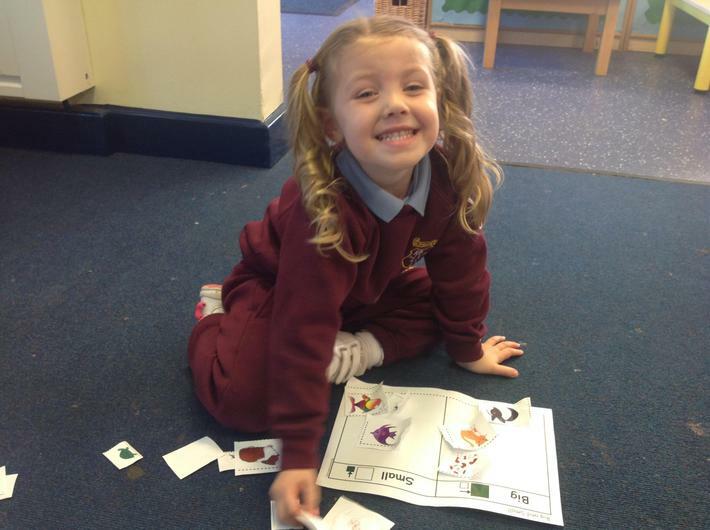 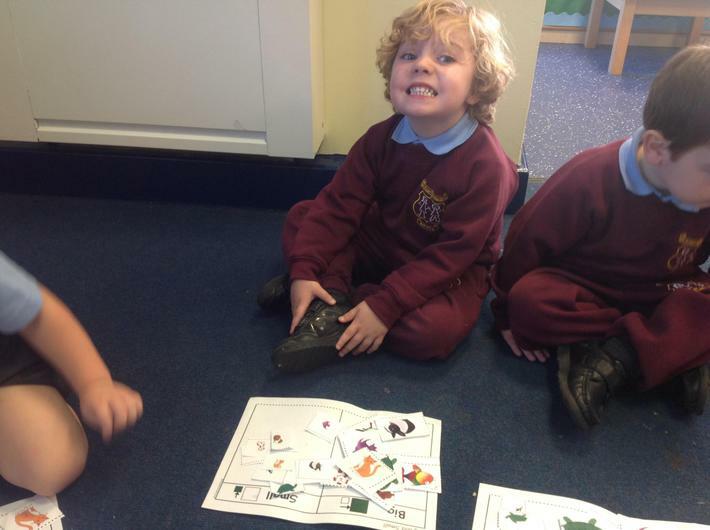 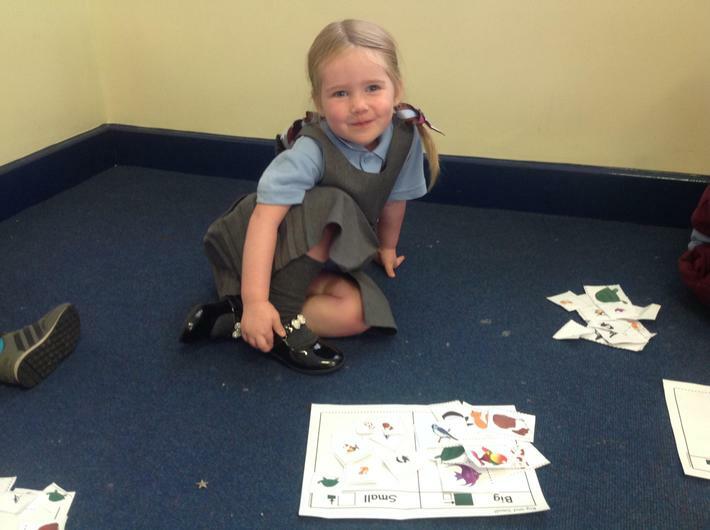 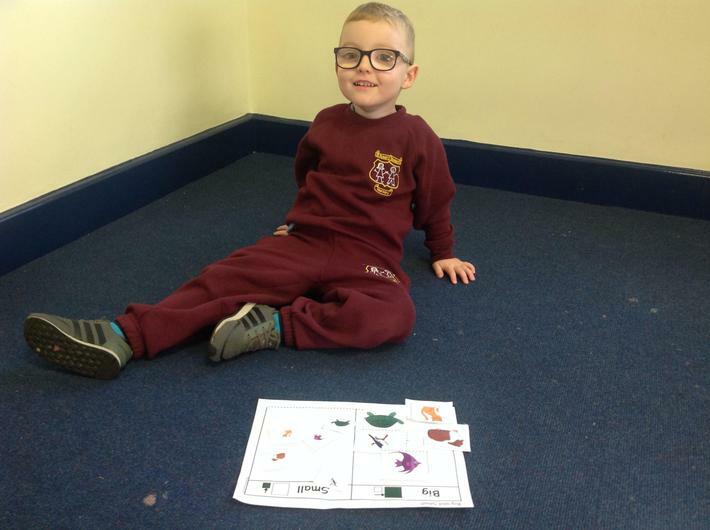 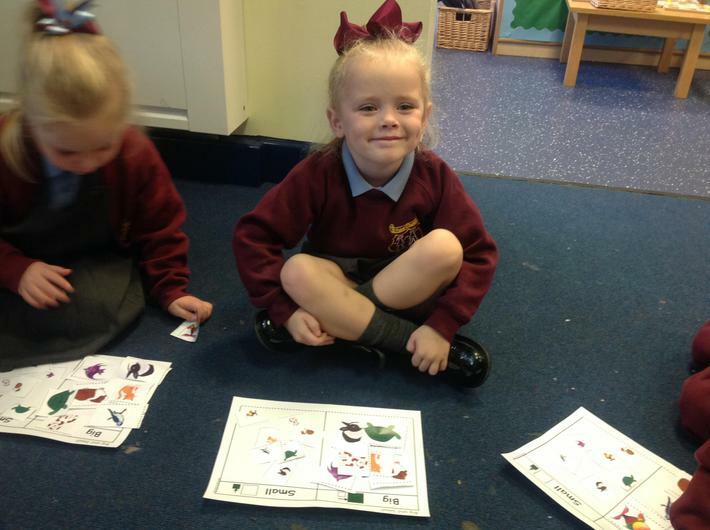 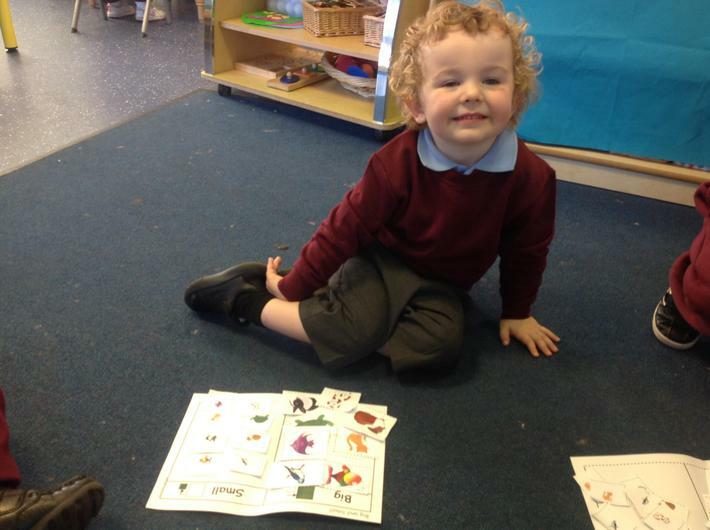 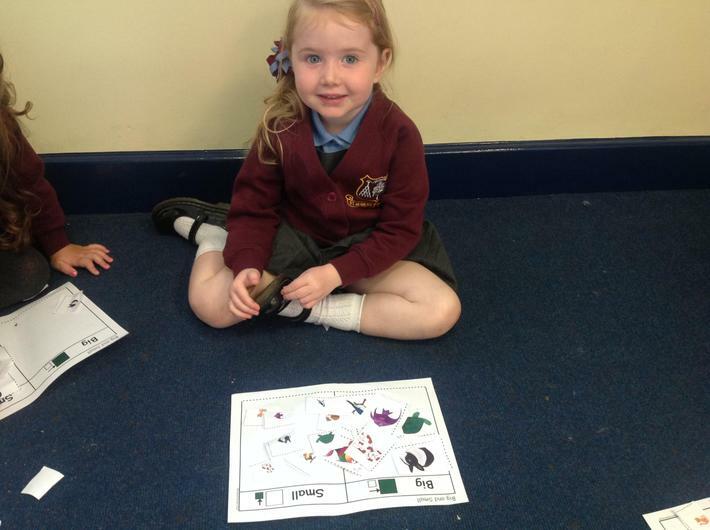 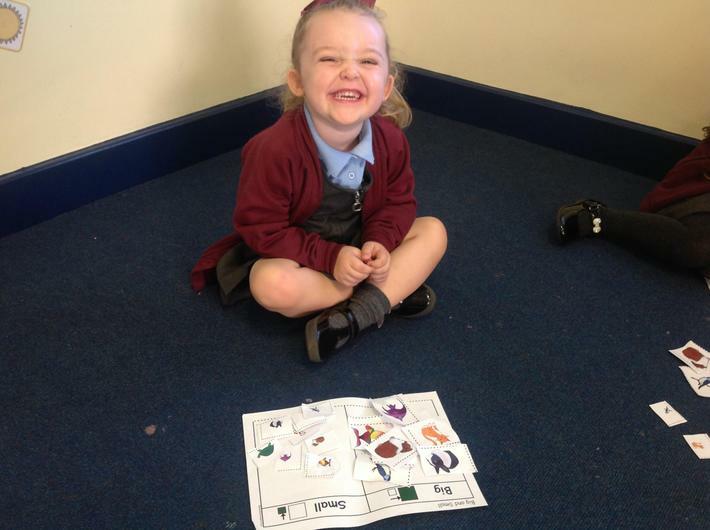 First we sorted range of animals on a tchart to categorise them by size. 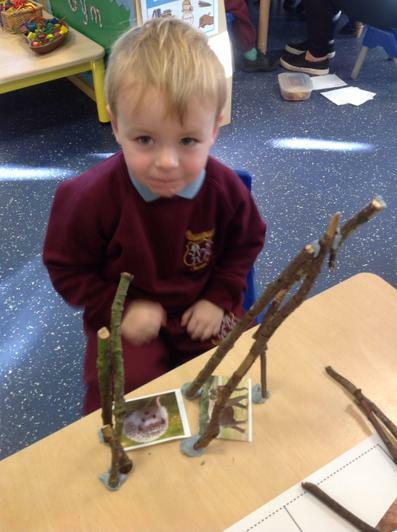 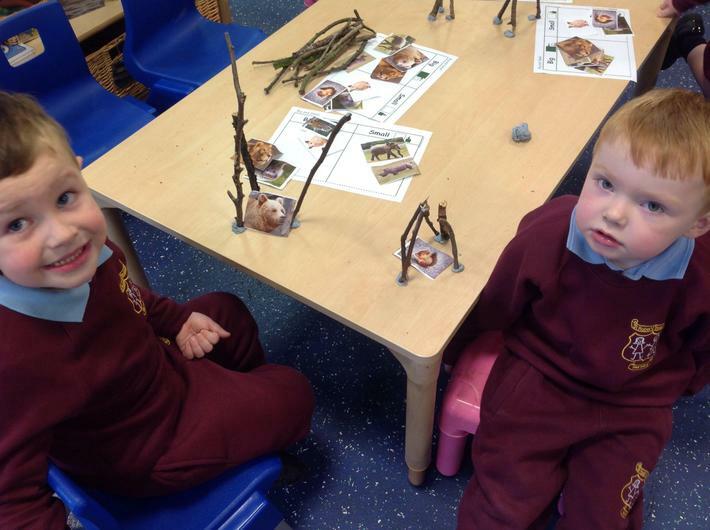 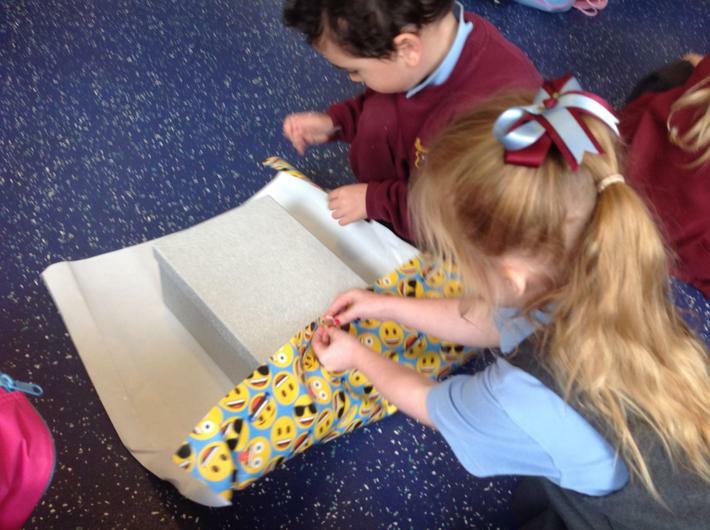 Afterwards we made big and small shelter in pairs and then chose an animal to fit in either shelter. 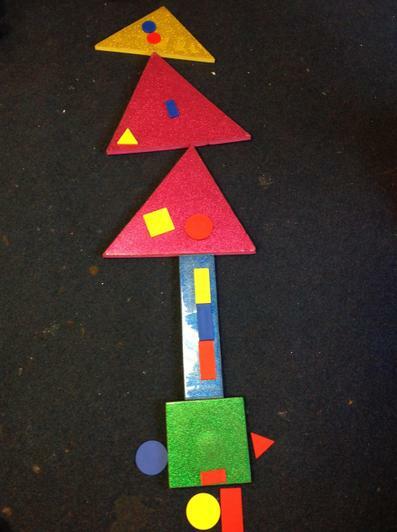 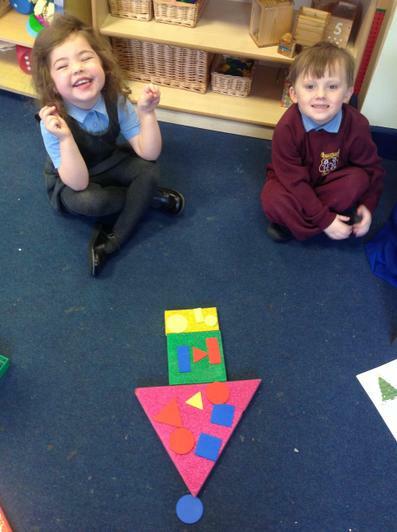 We entered into the Christmas spirit today and explored 2D shapes through constructing tree designs. 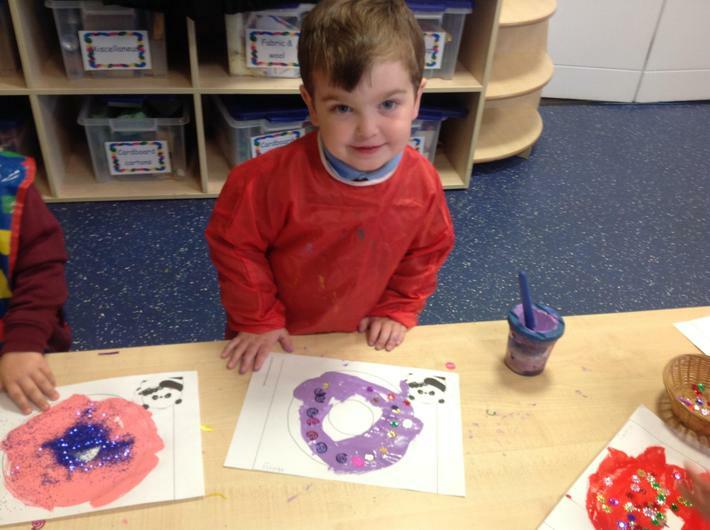 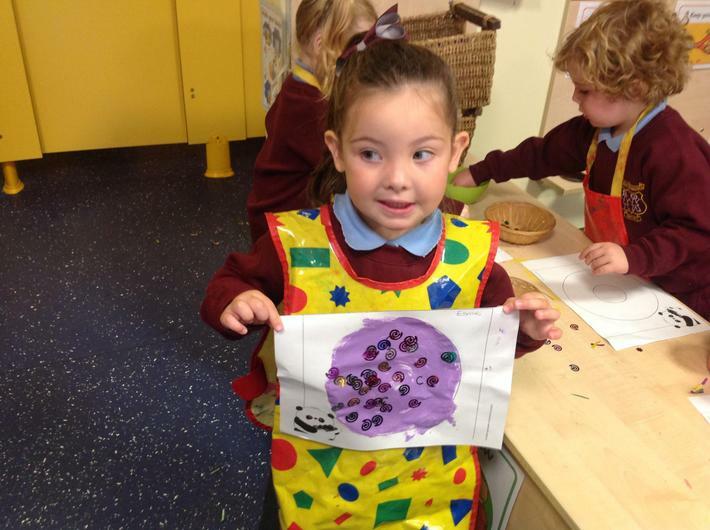 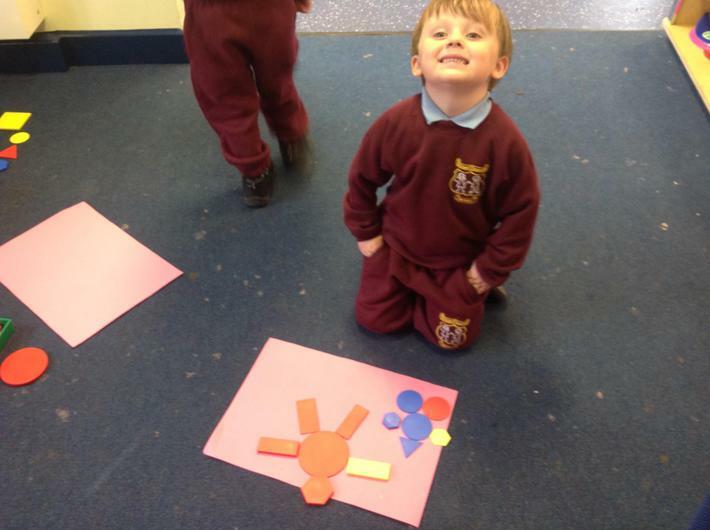 Afterwards we used smaller shapes to decorate them. 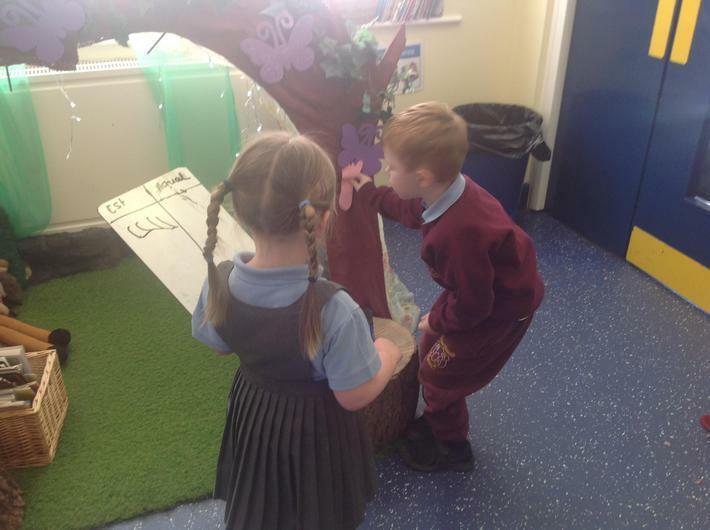 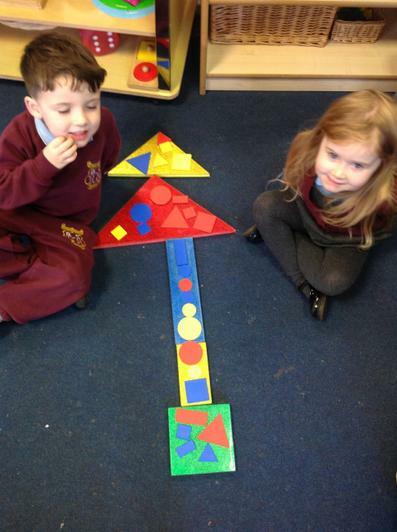 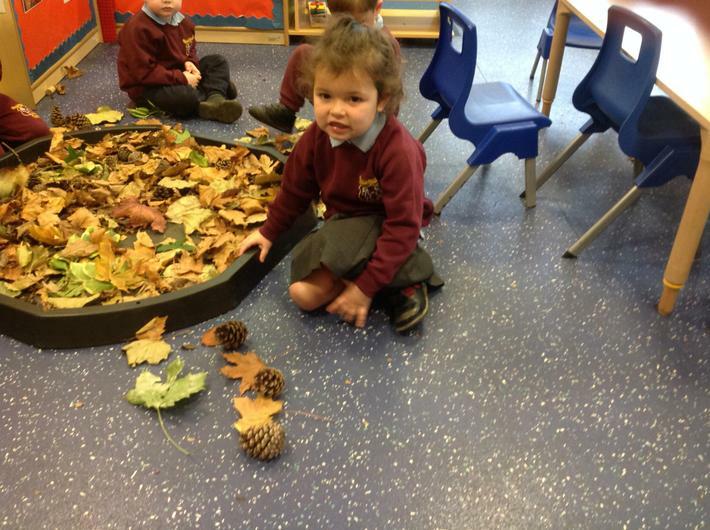 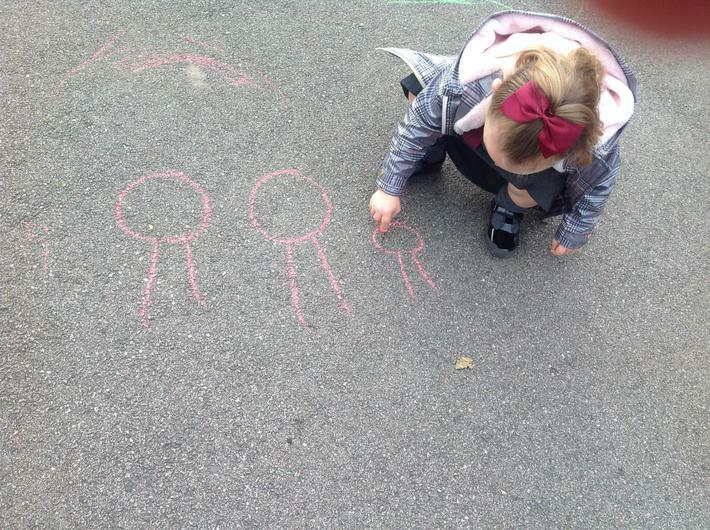 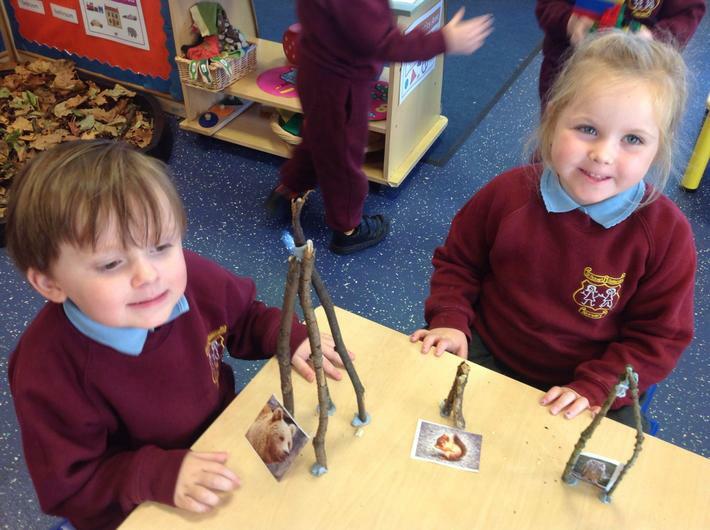 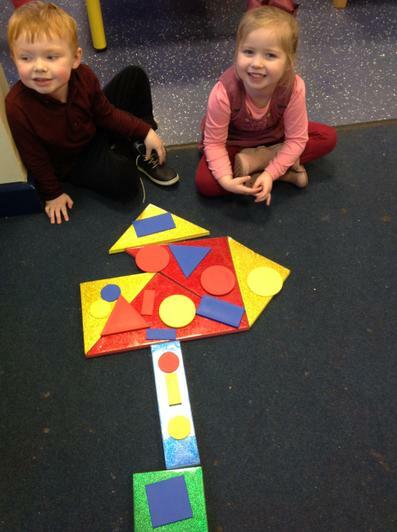 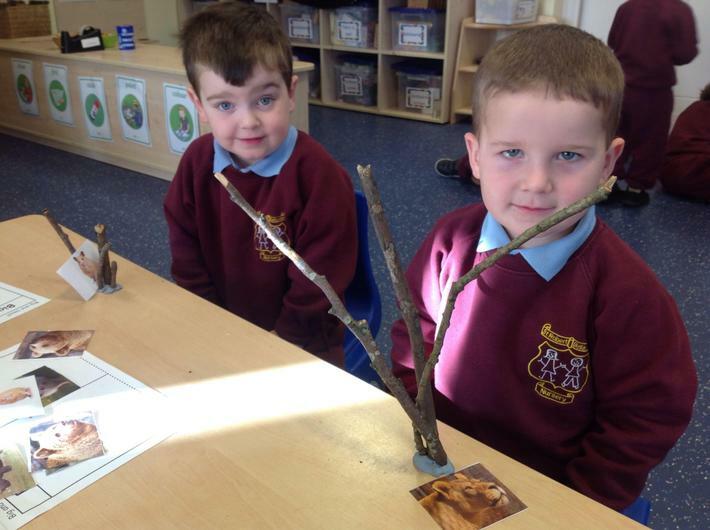 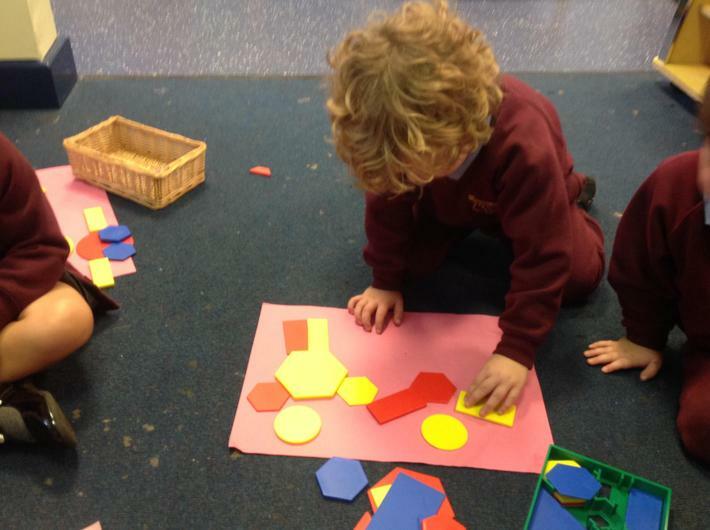 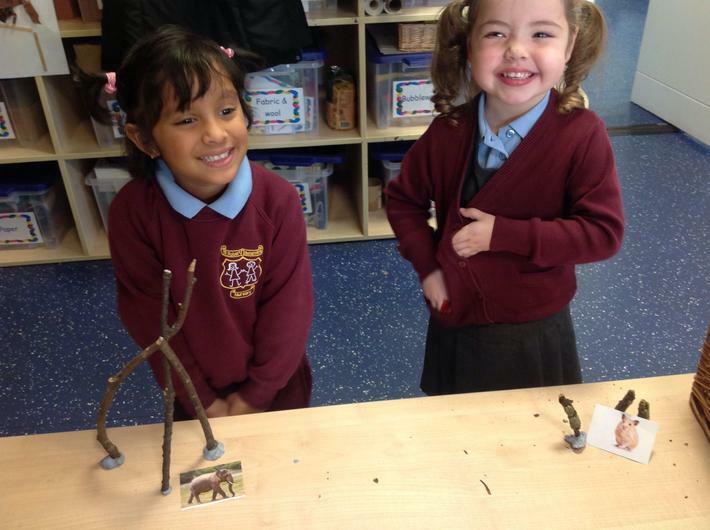 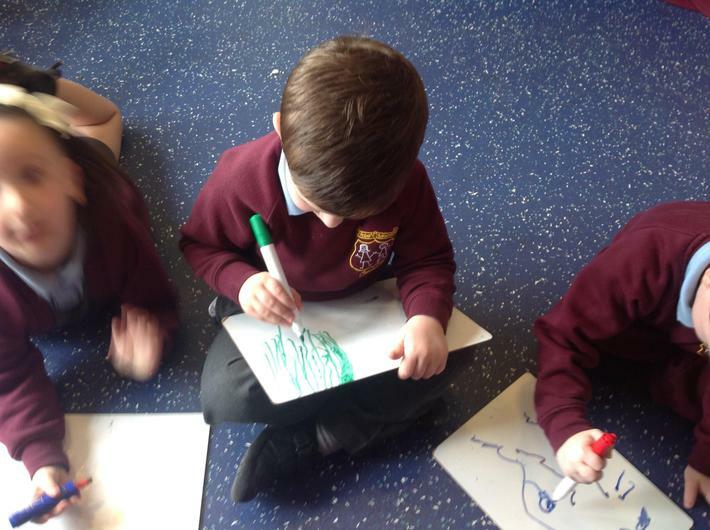 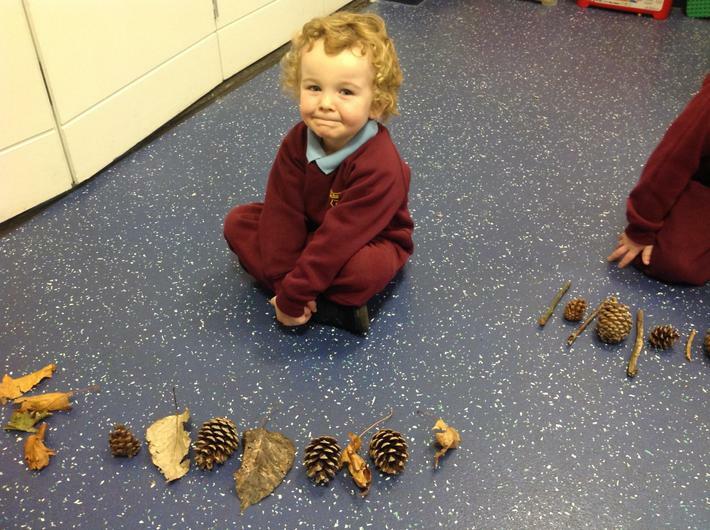 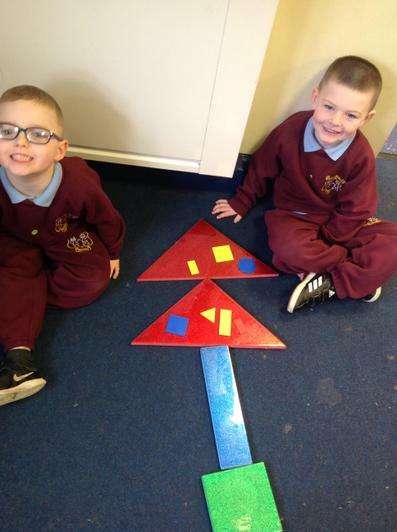 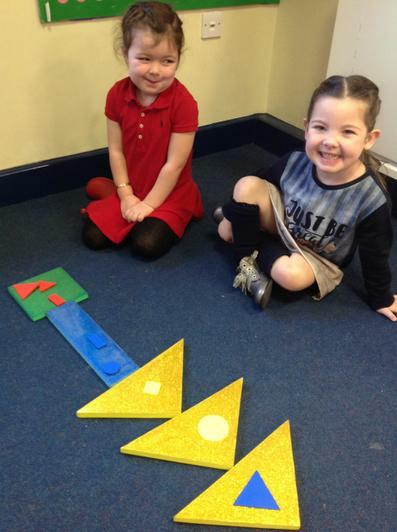 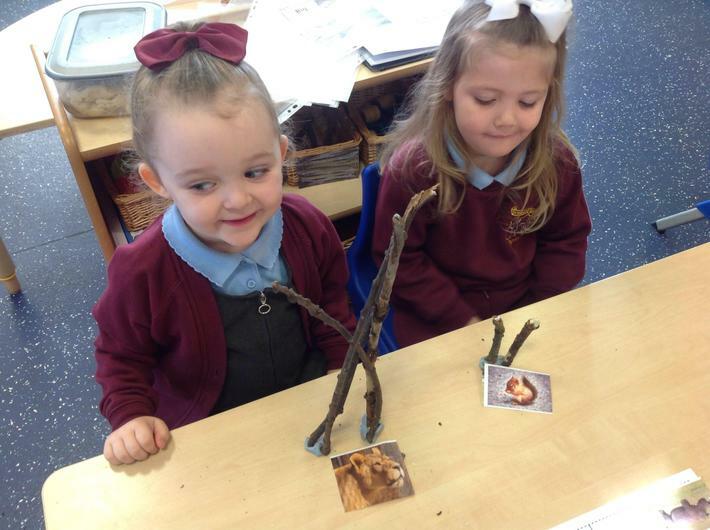 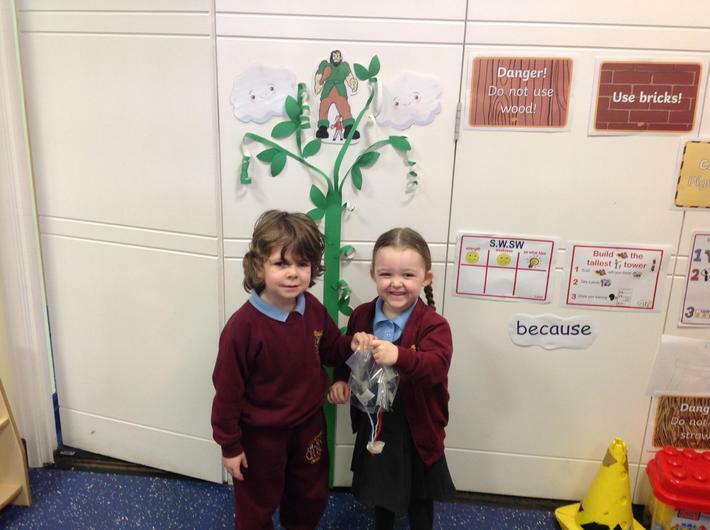 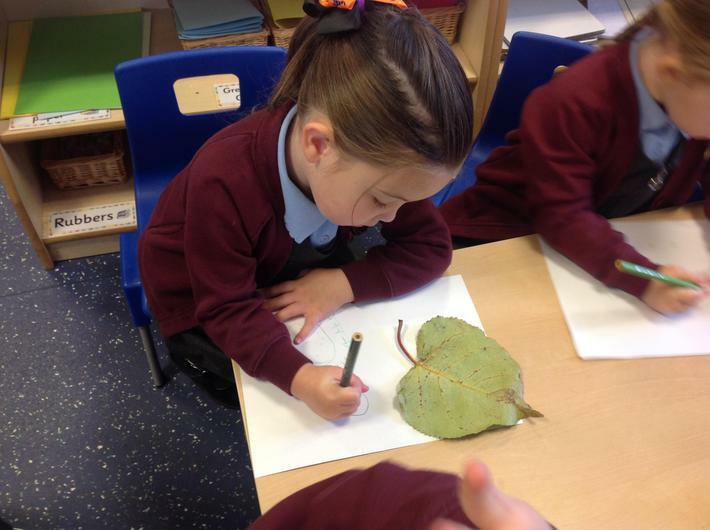 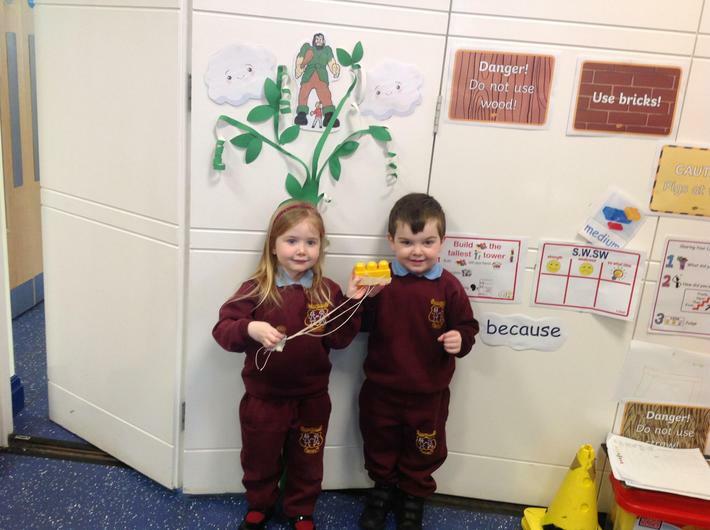 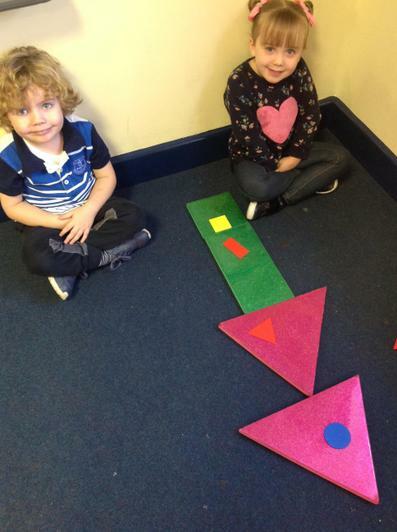 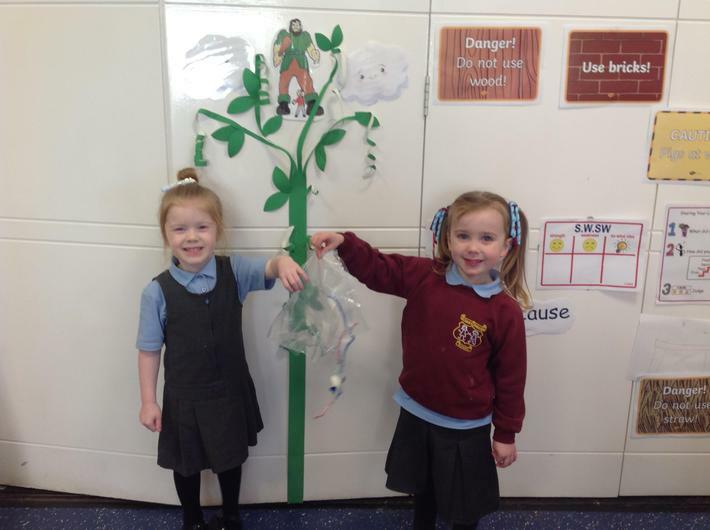 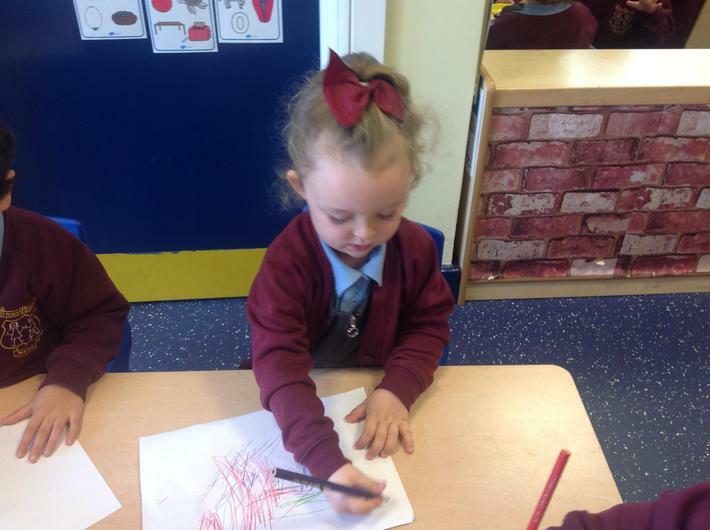 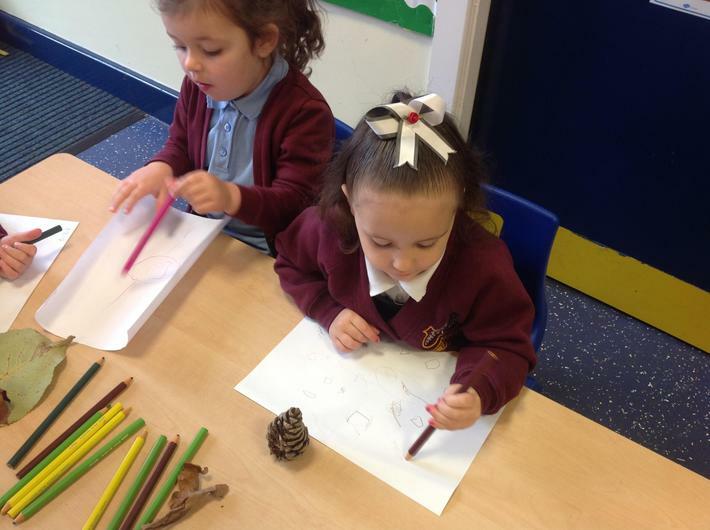 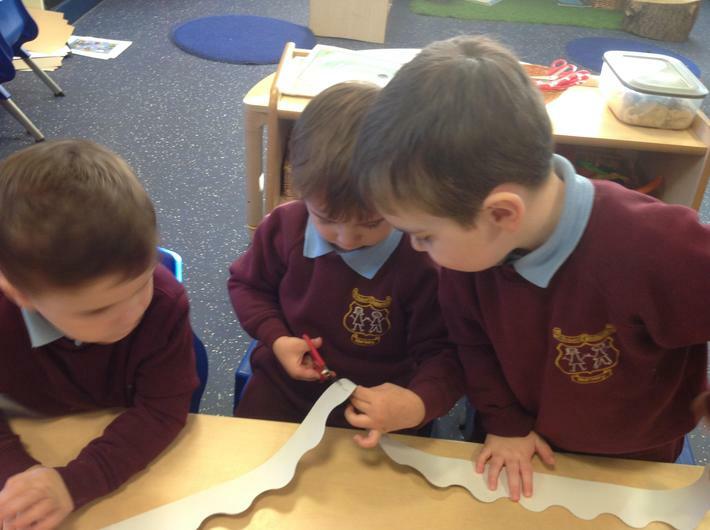 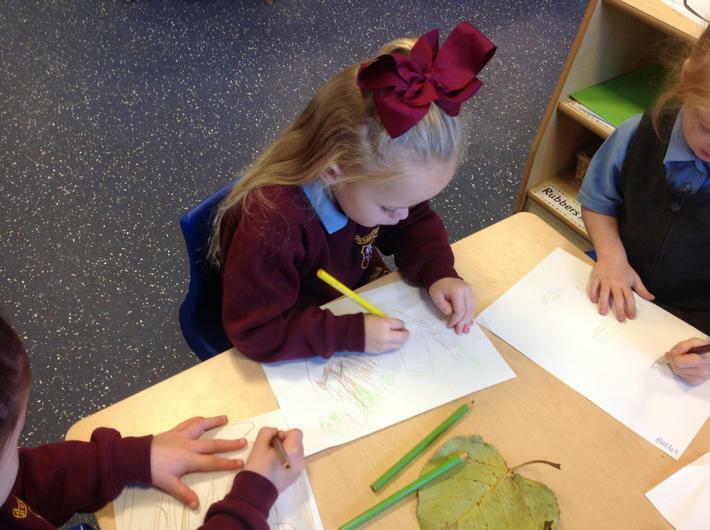 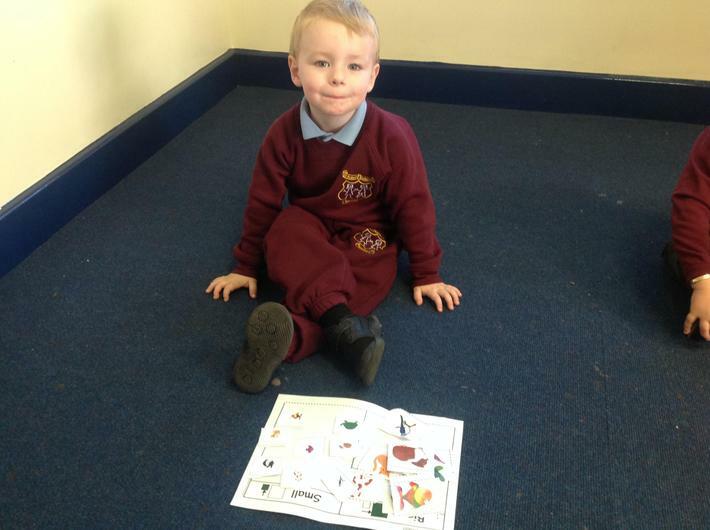 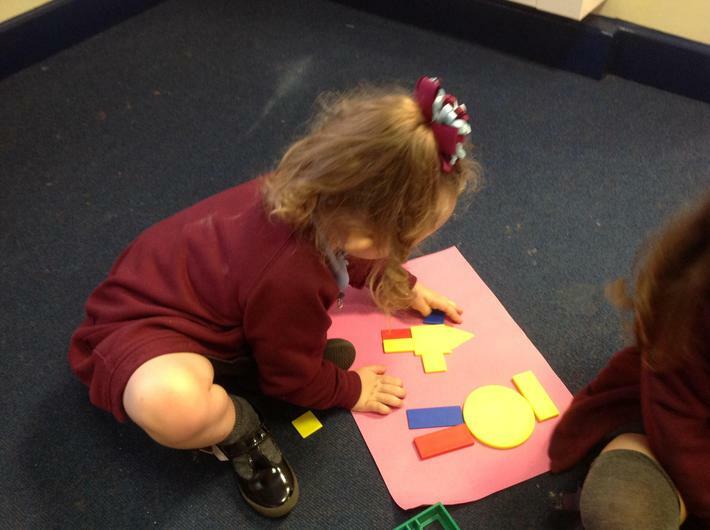 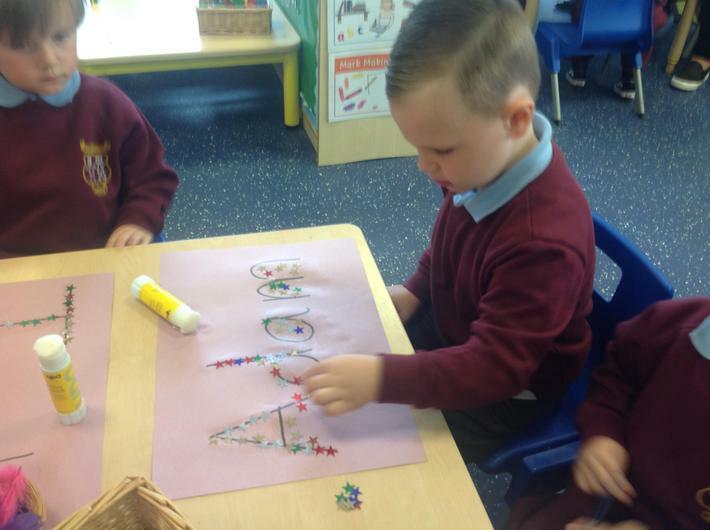 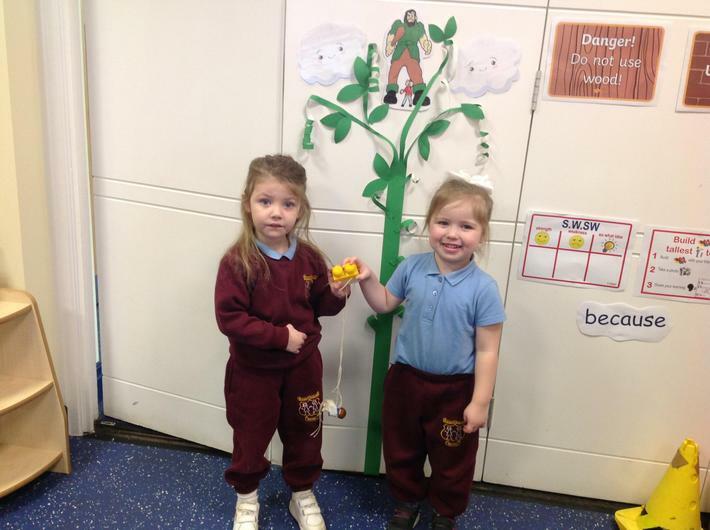 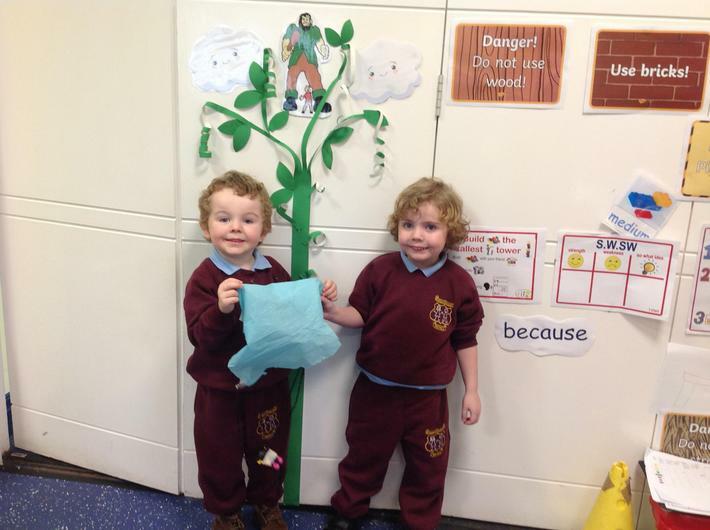 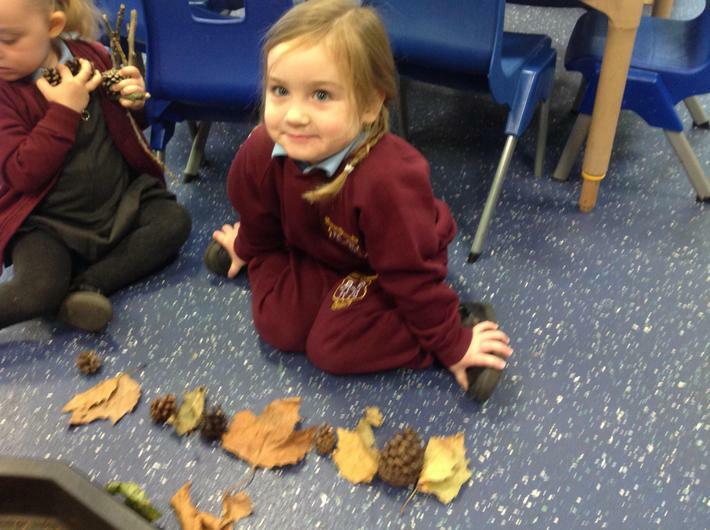 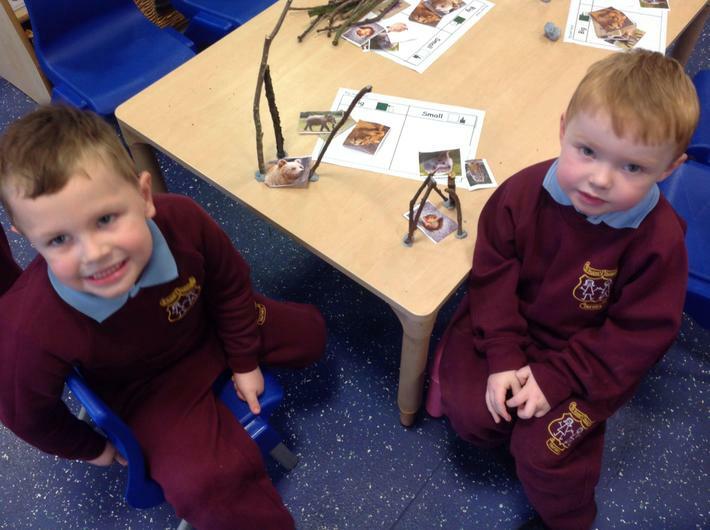 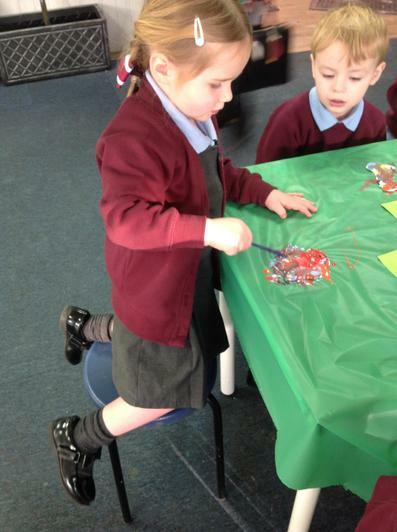 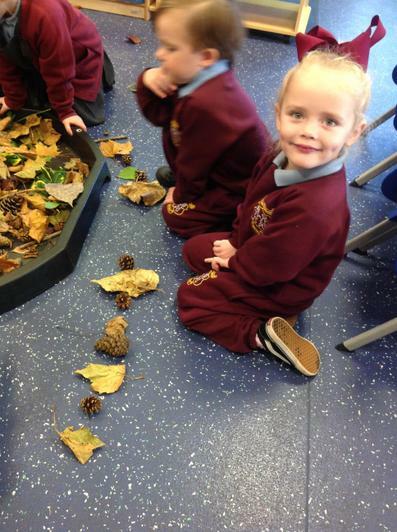 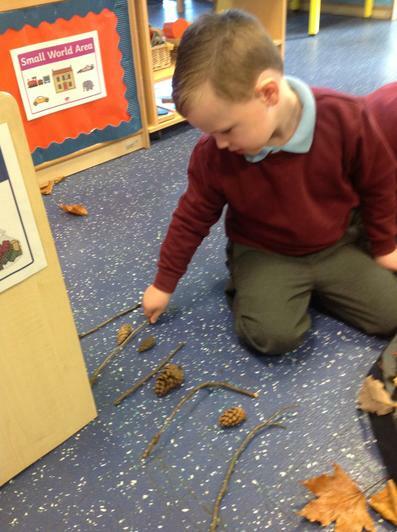 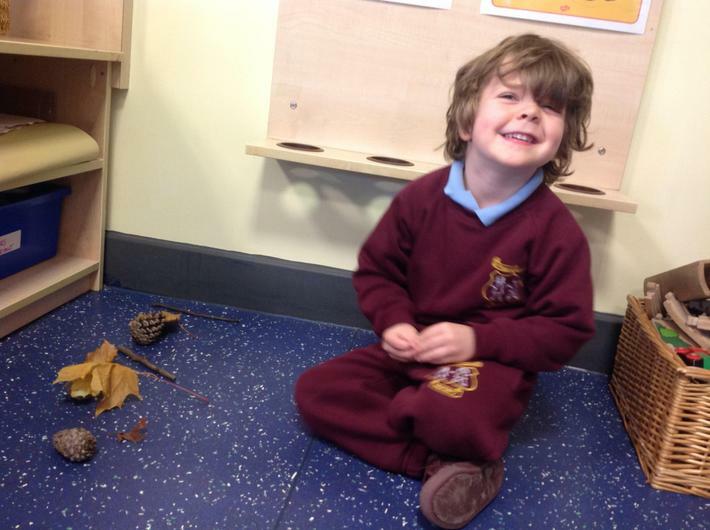 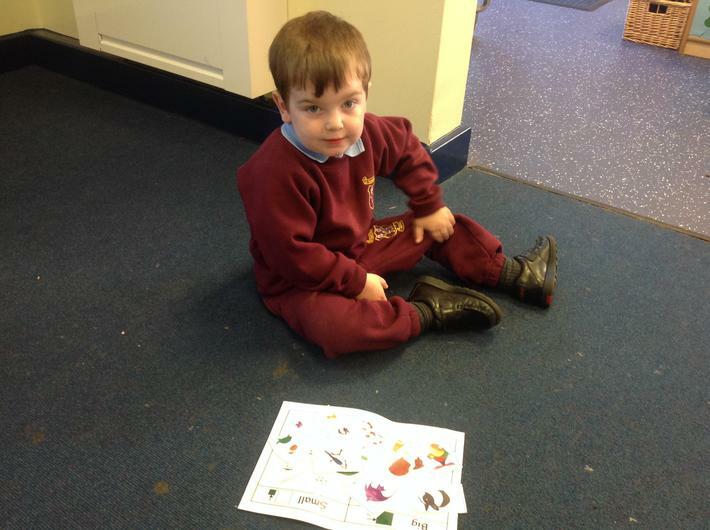 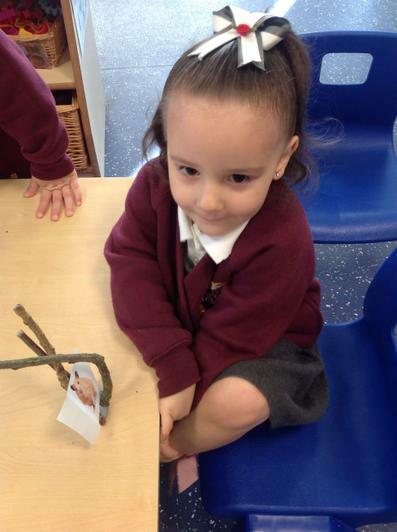 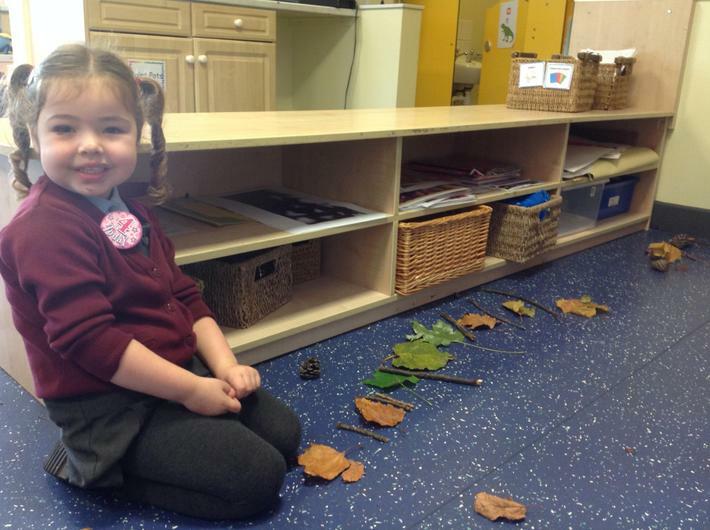 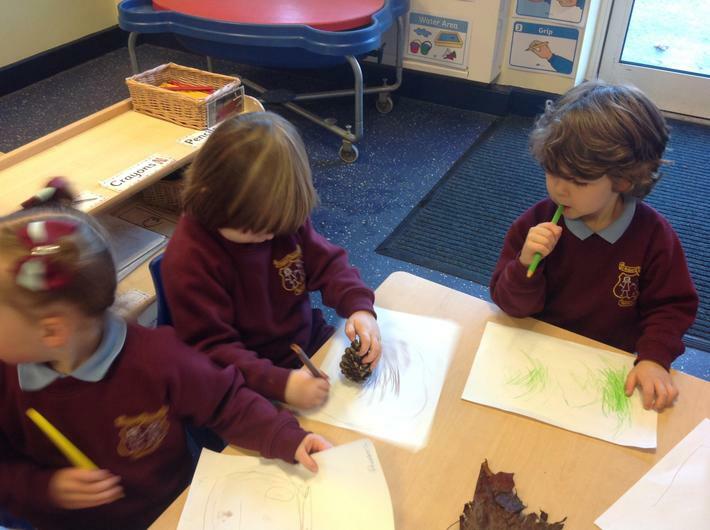 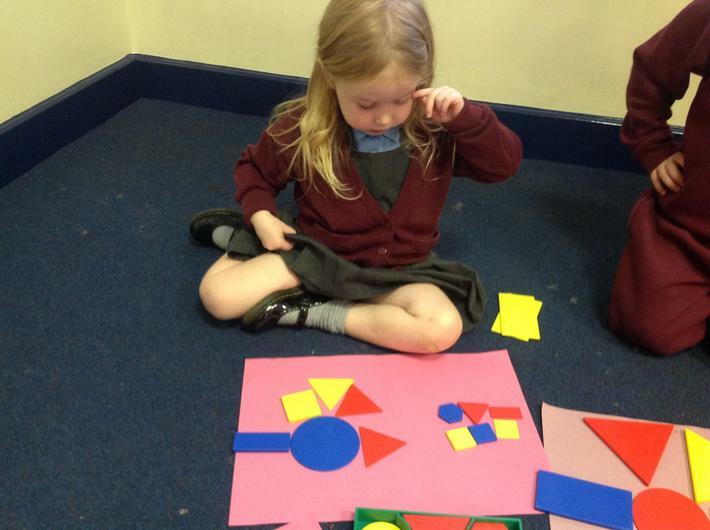 We began to use positional language to tell others about where we had placed the shapes onto our tree. 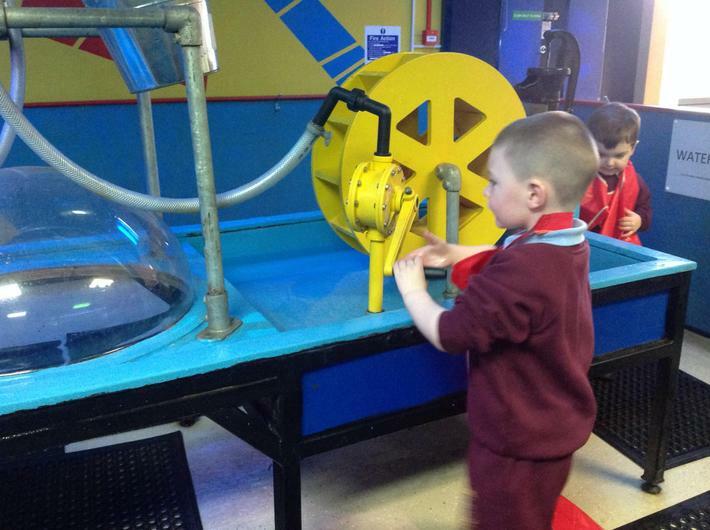 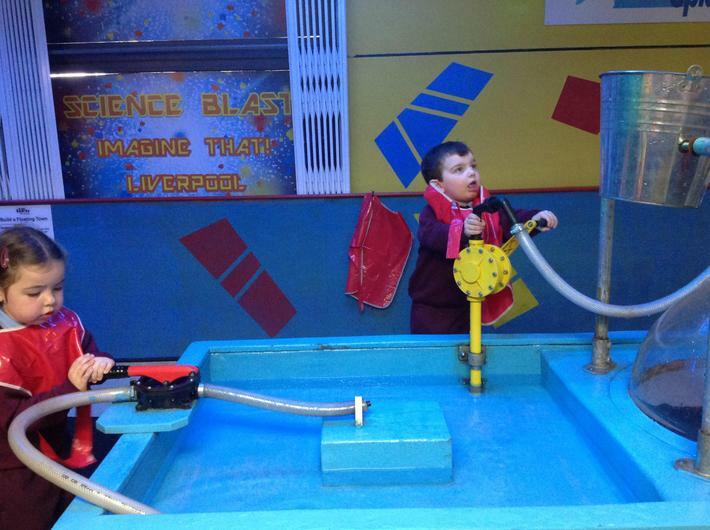 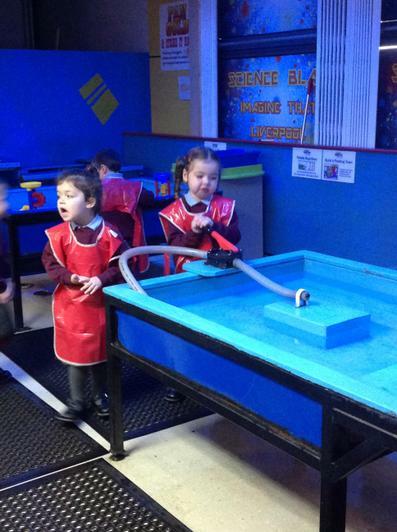 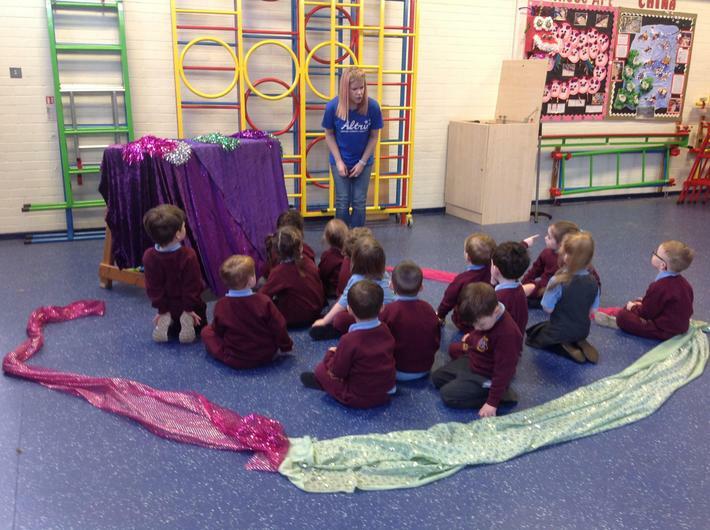 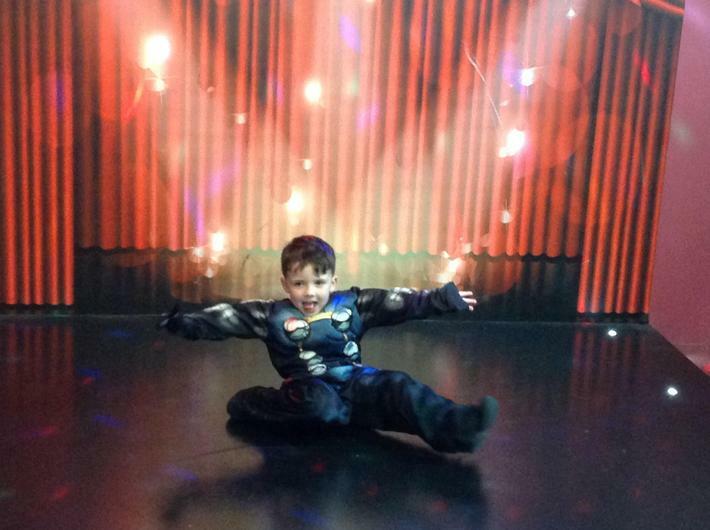 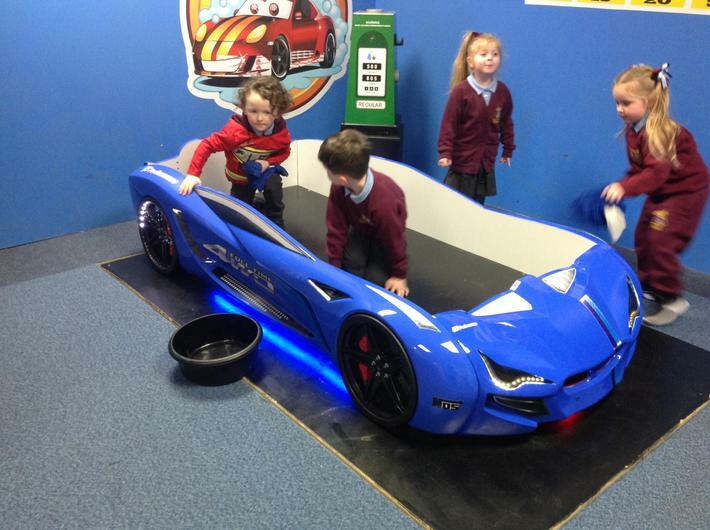 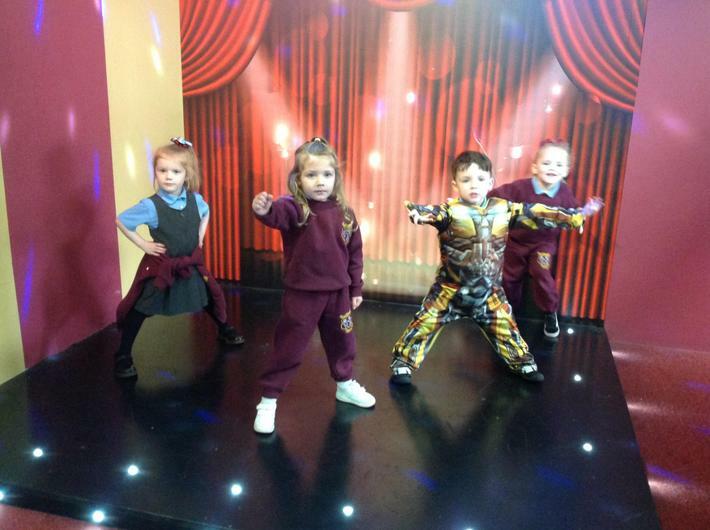 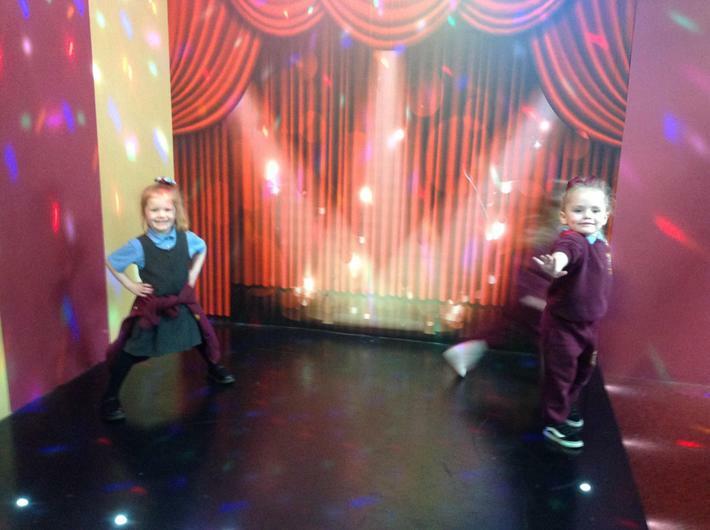 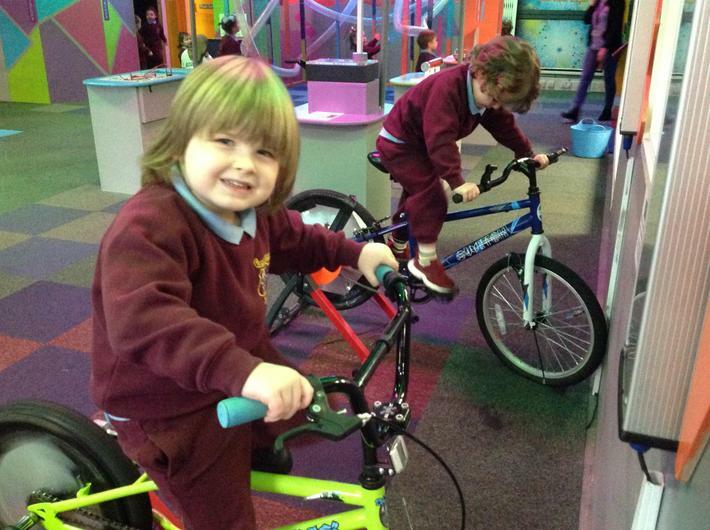 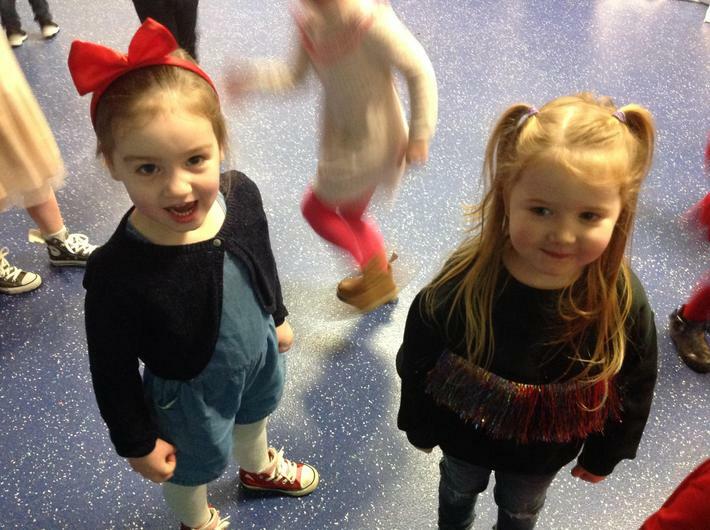 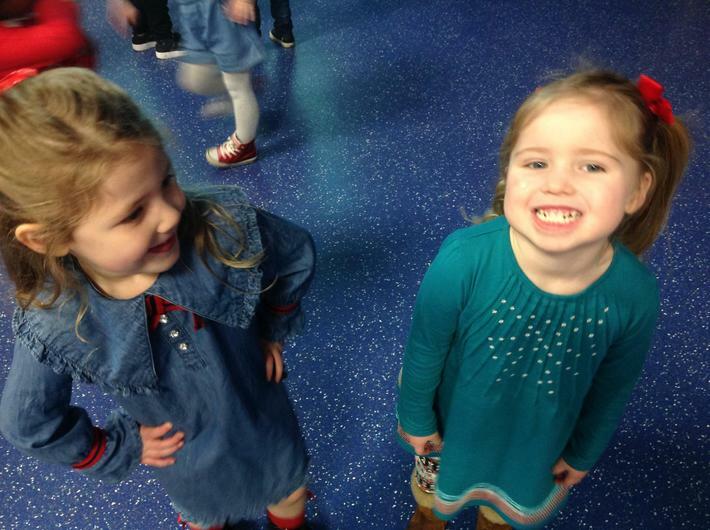 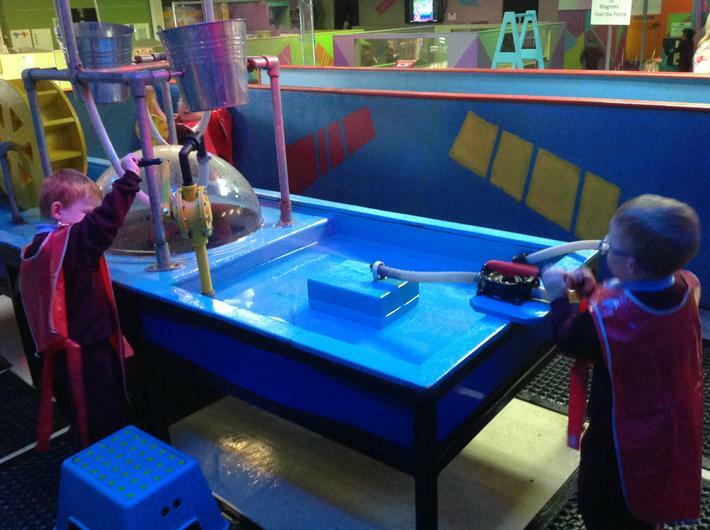 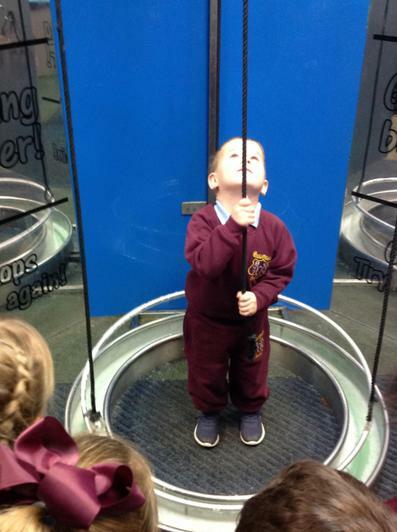 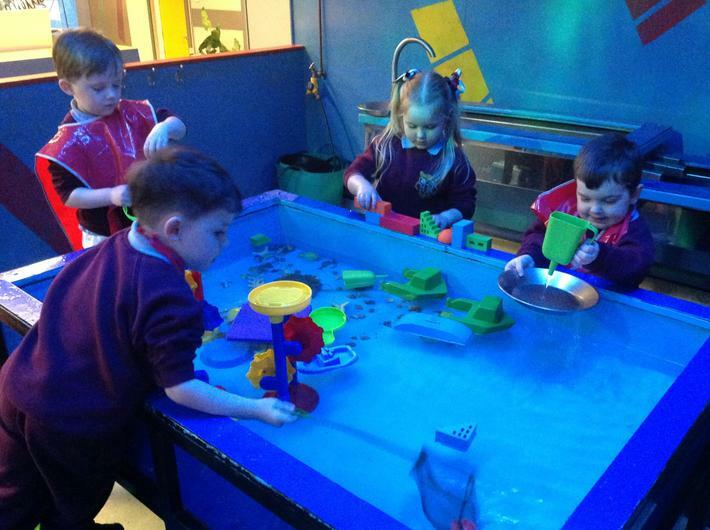 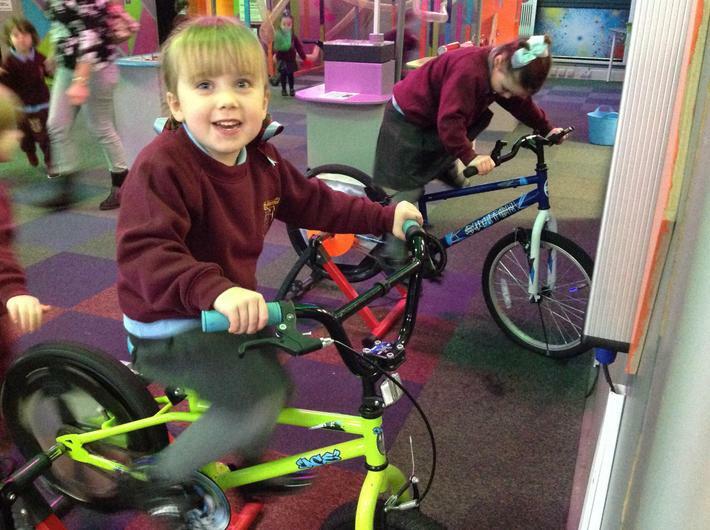 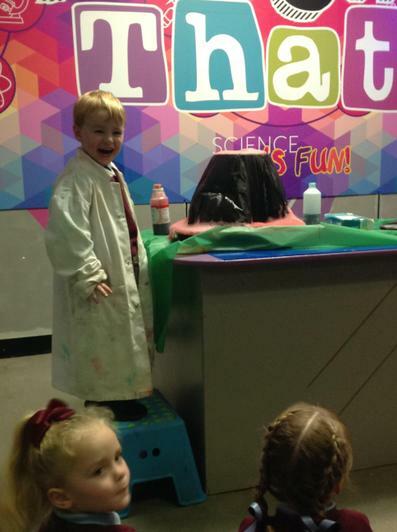 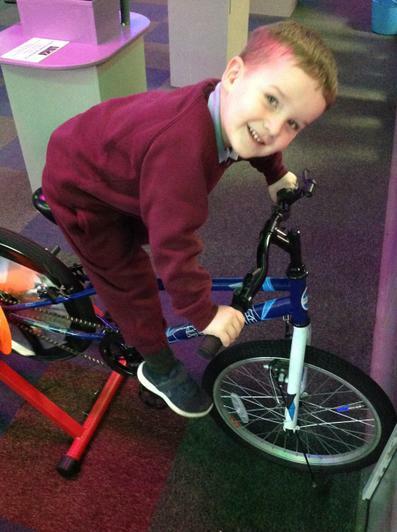 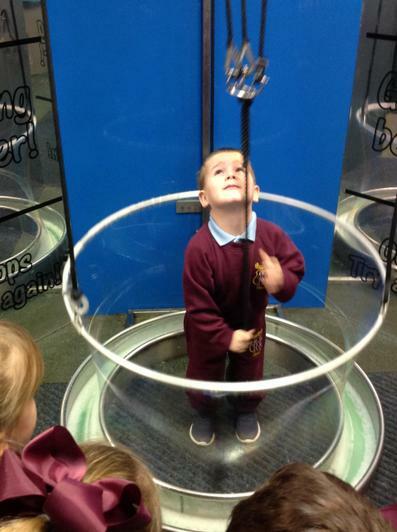 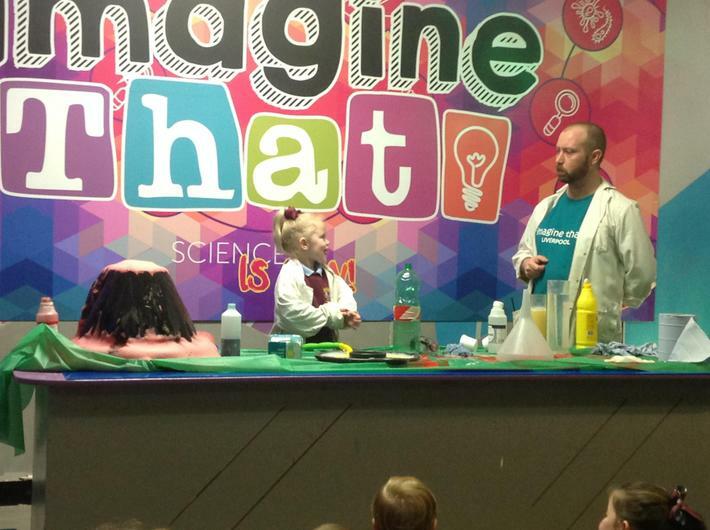 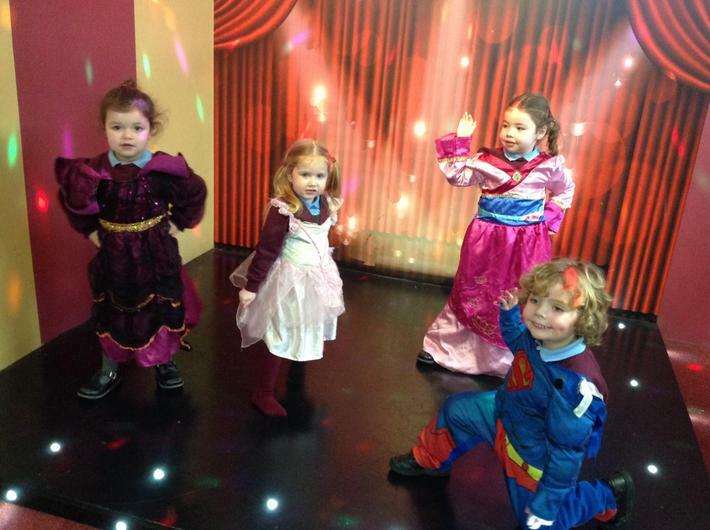 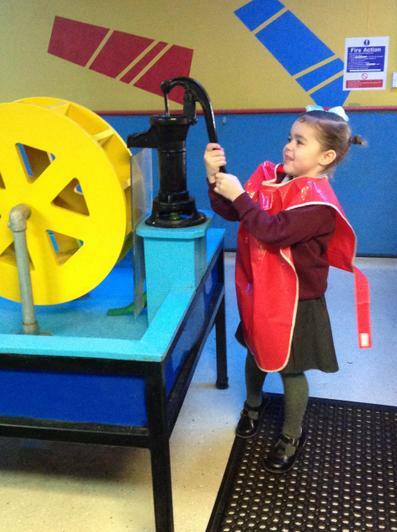 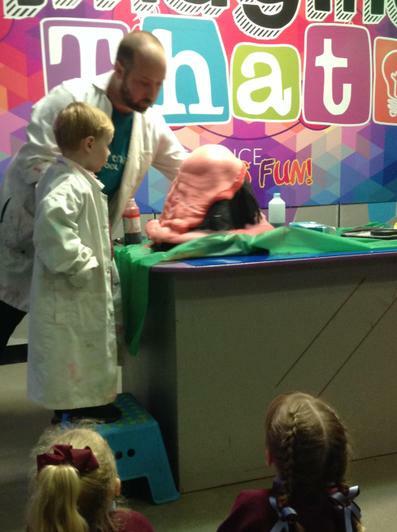 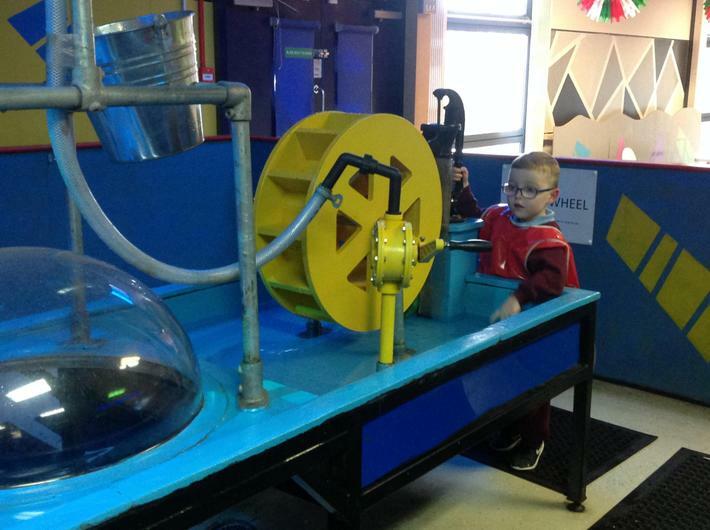 We have had the most amazing day at Underwater Street! 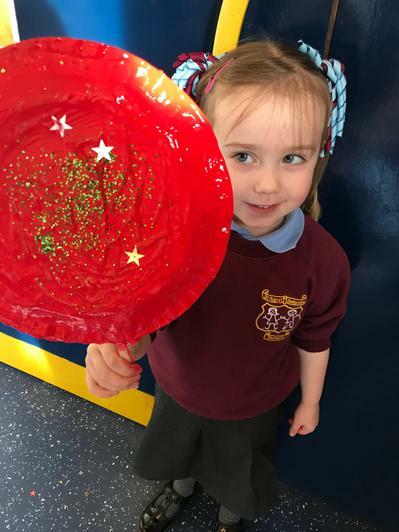 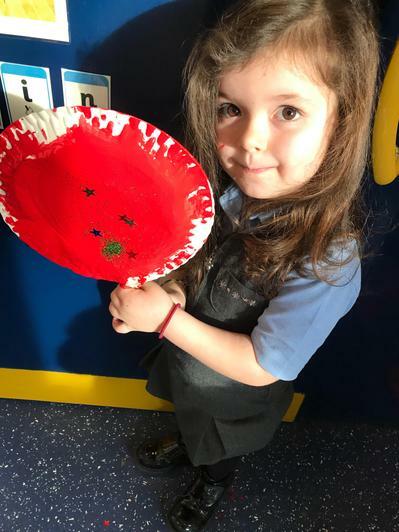 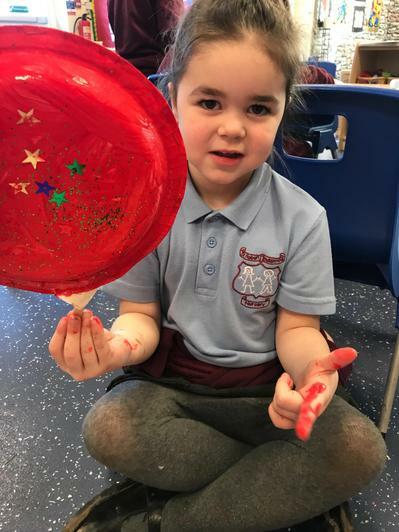 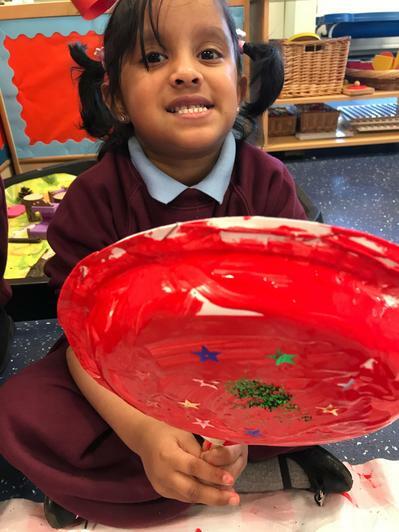 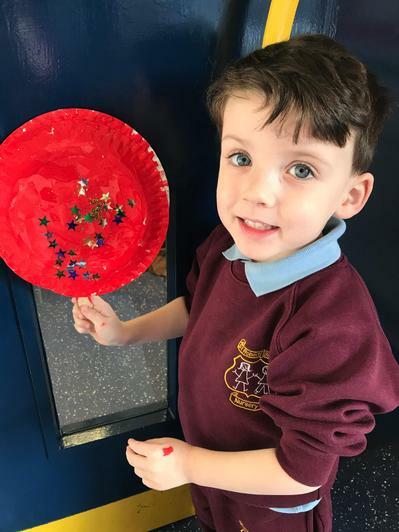 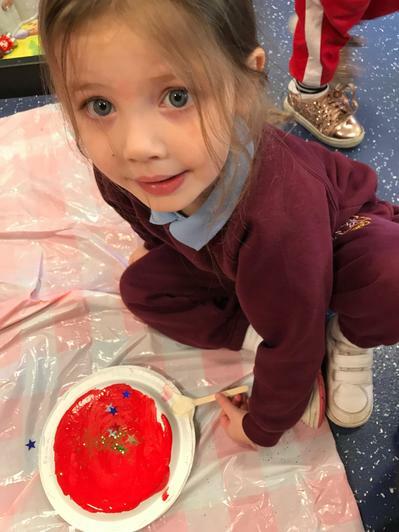 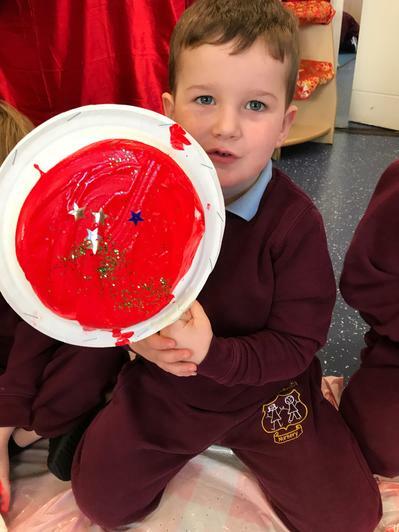 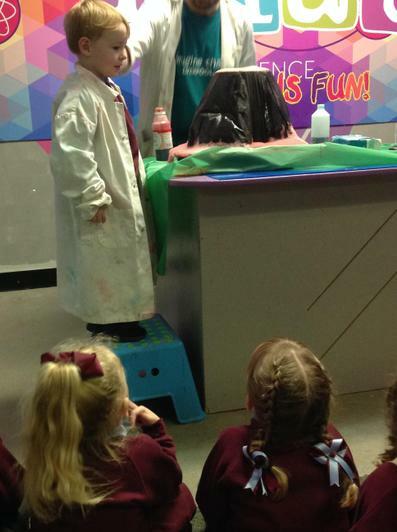 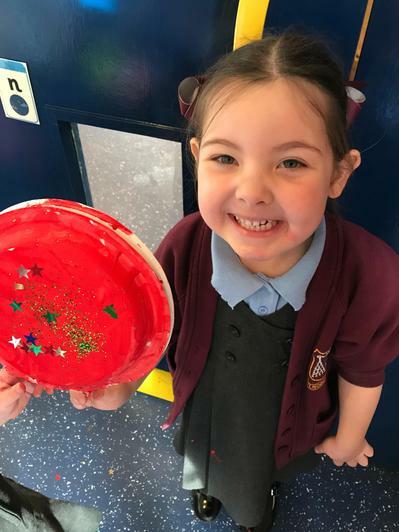 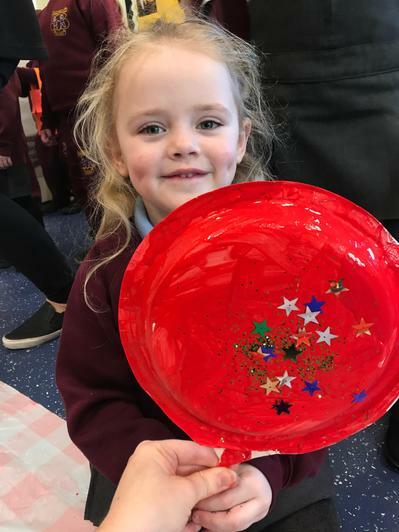 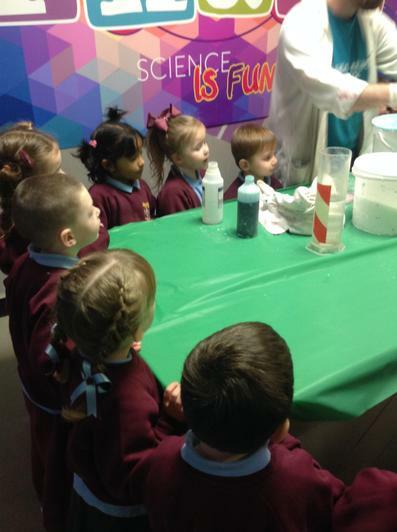 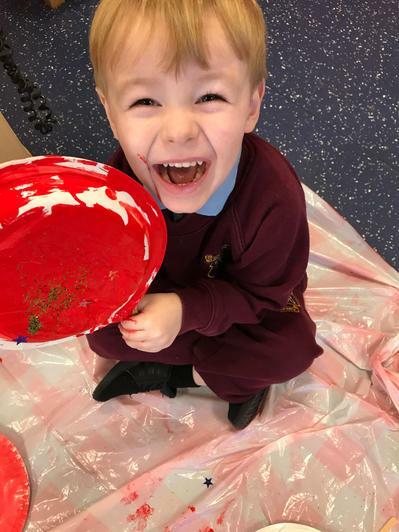 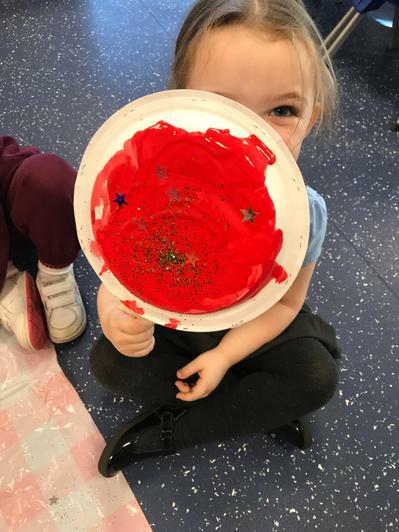 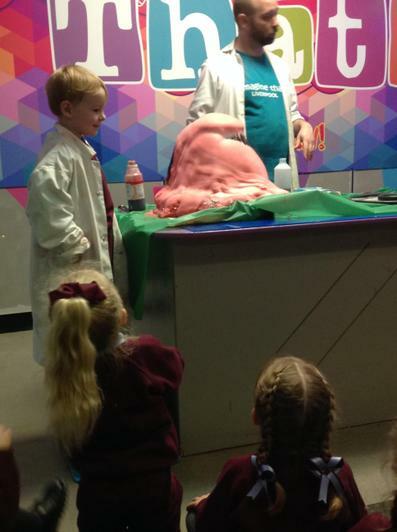 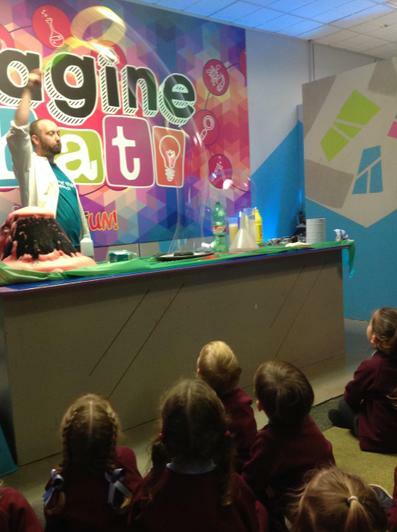 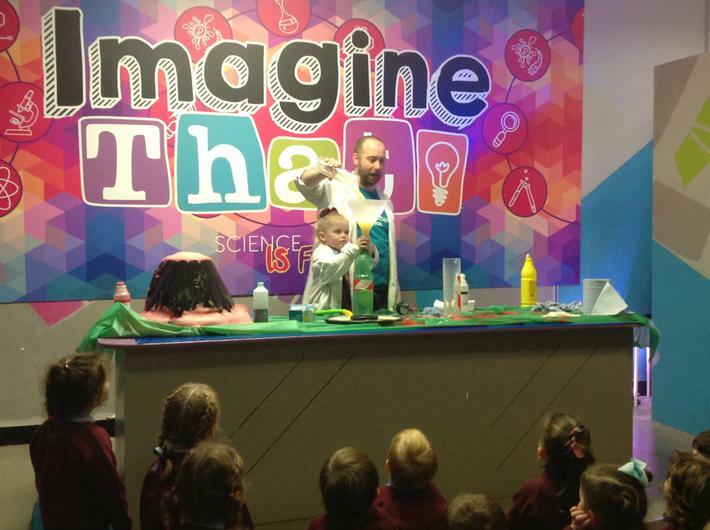 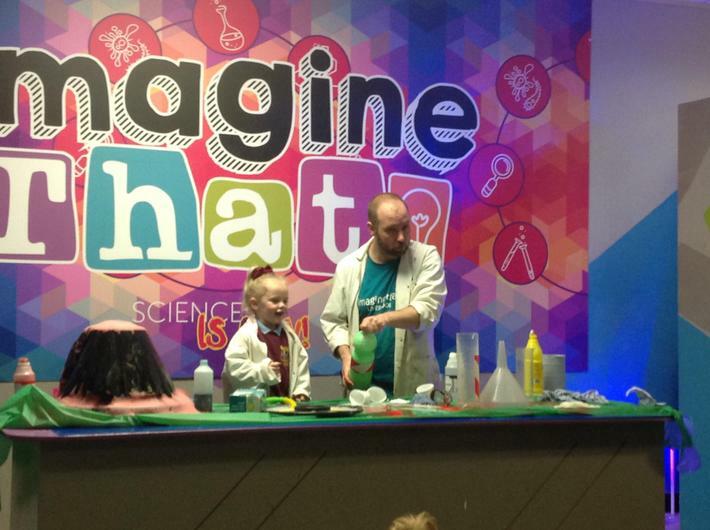 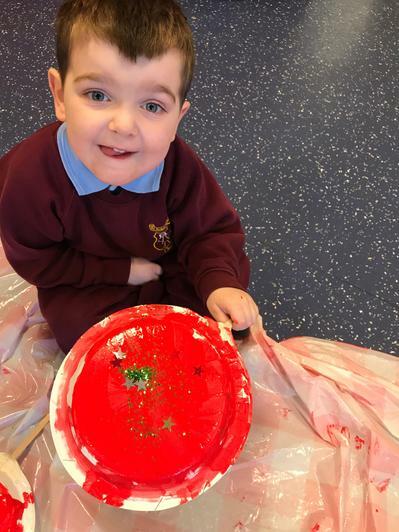 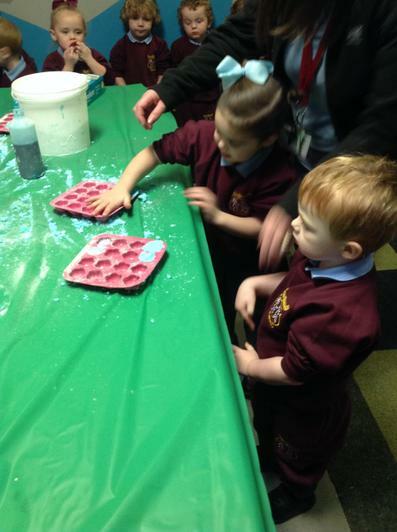 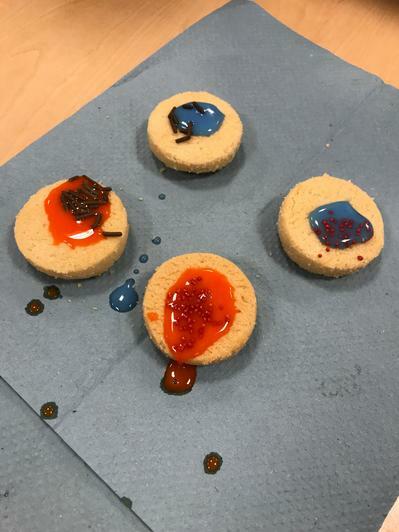 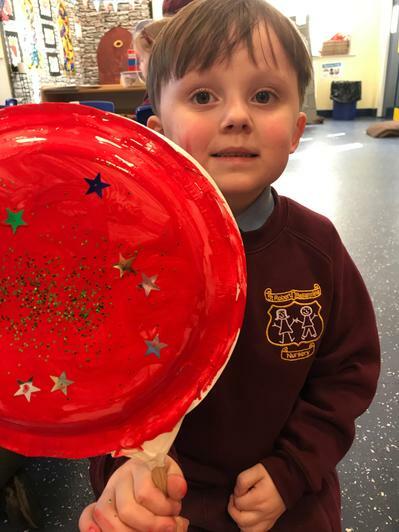 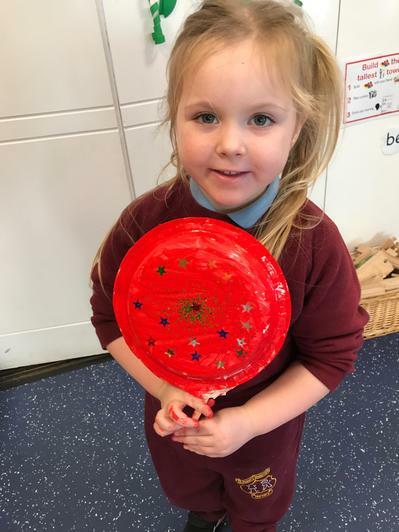 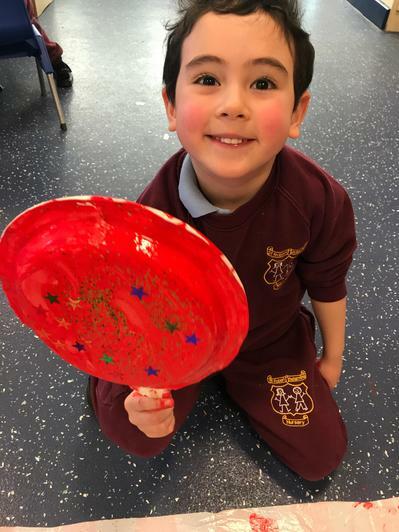 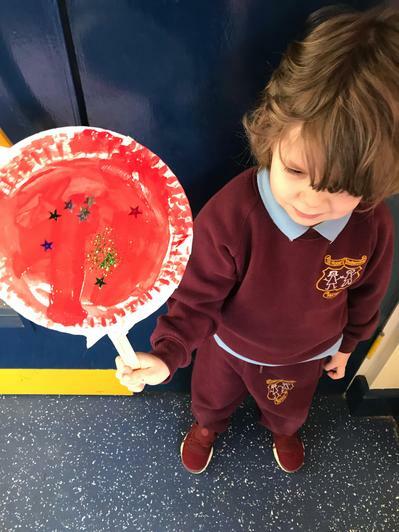 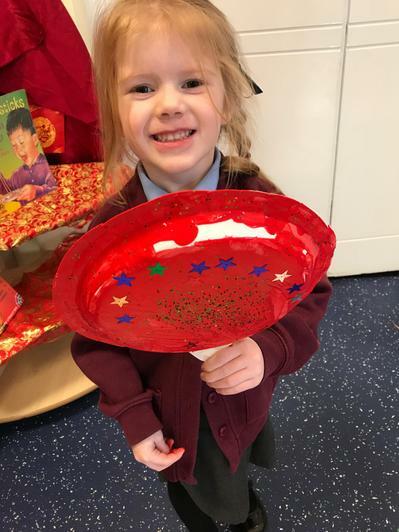 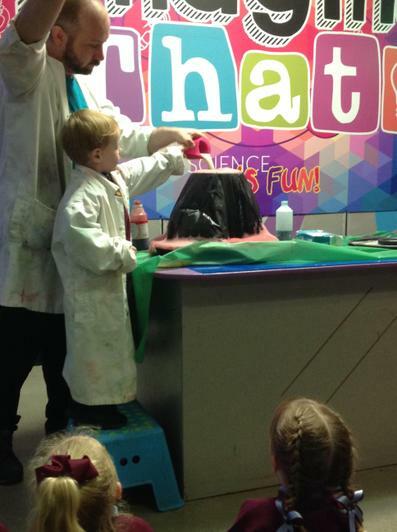 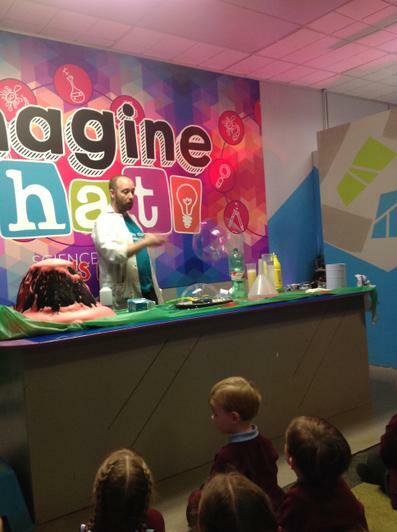 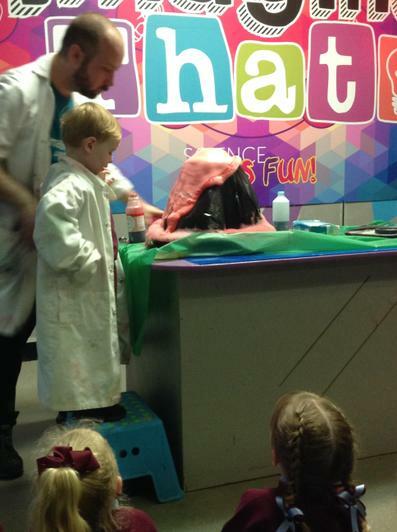 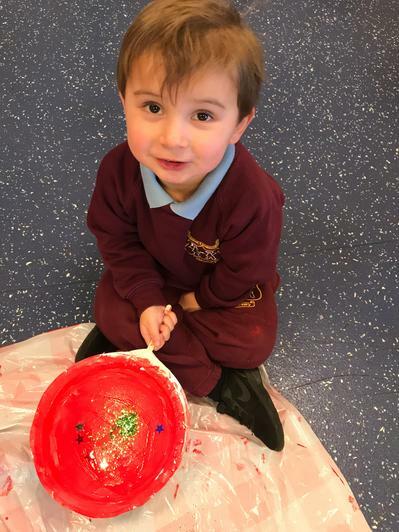 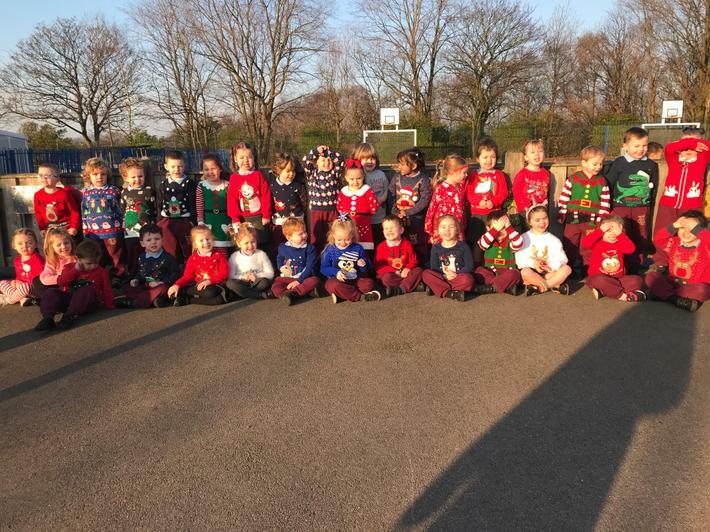 It has been a day very well spent from making Christmas baubles, magic reindeer food and bathbombs and watching science experiments to create volcanic eruptions, bubbles that defied gravity and rocket blast offs! 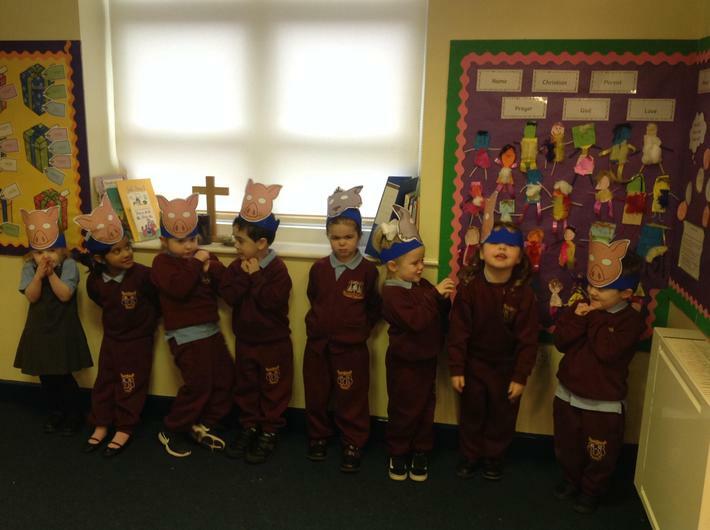 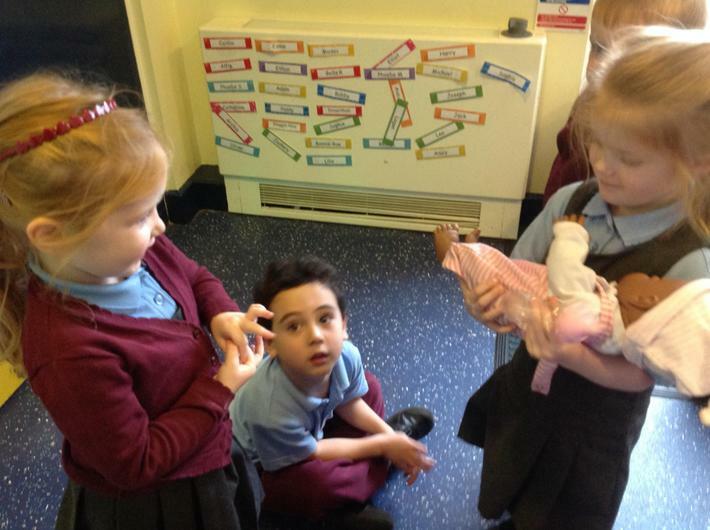 As part of our topic we have been exploring the Nativity story to find out why Christmas is such a special time of year. 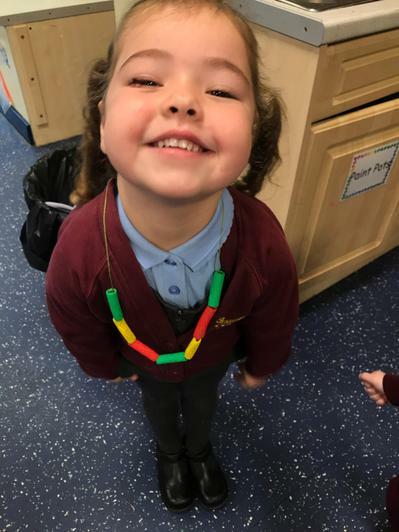 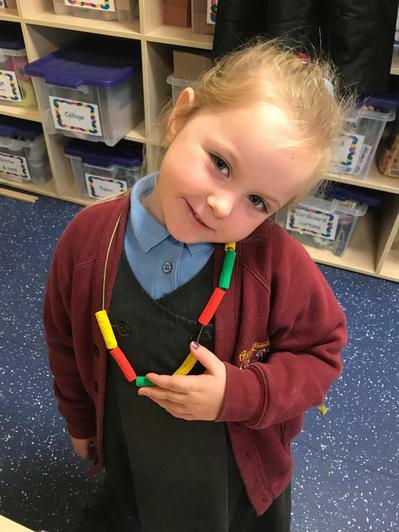 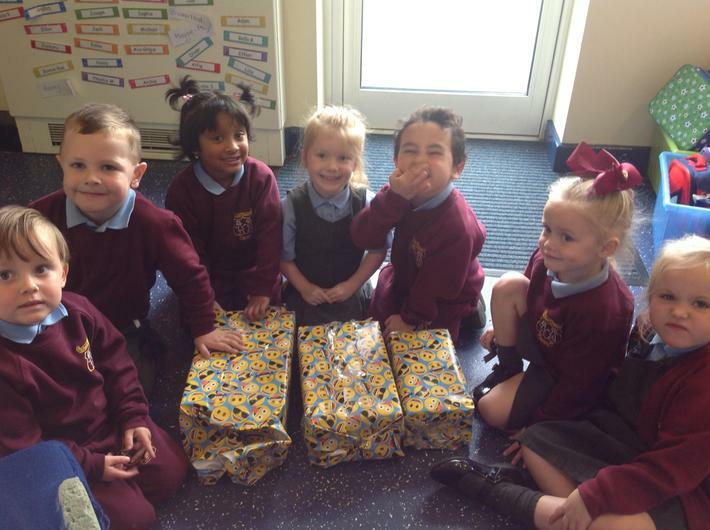 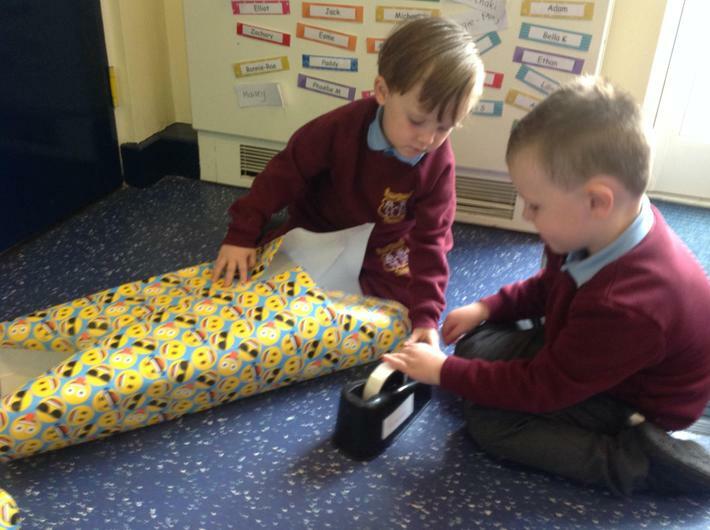 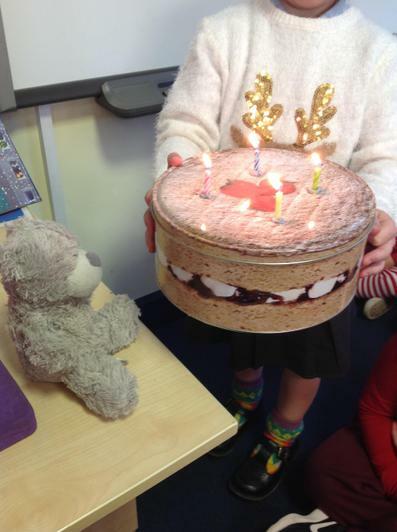 From this we have been making links to birthday celebrations in class to help us understand what we are celebrating when we talk about birthdays. 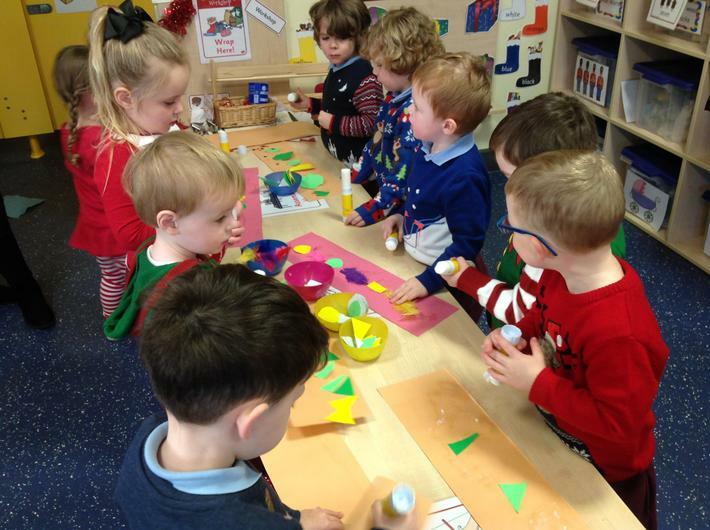 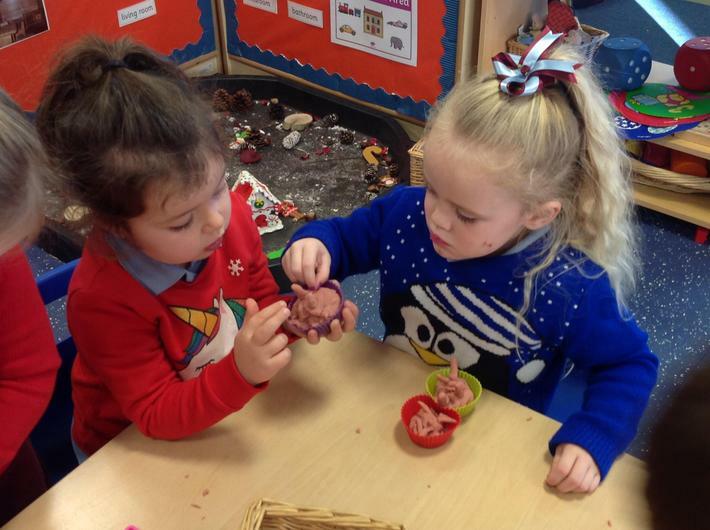 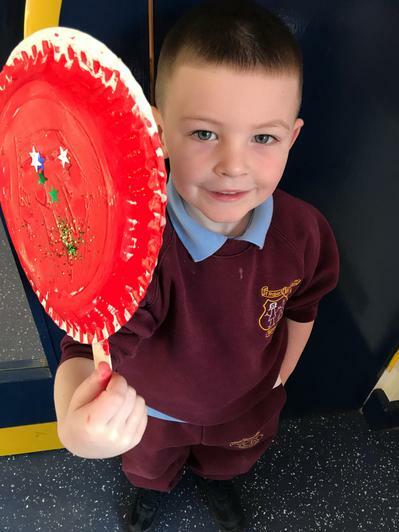 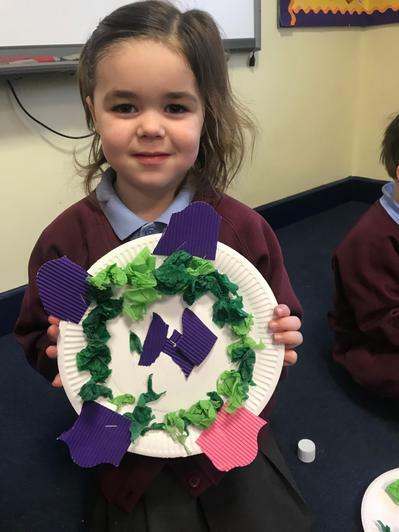 We made party hats, party food (playdoh) and cards and we have also made advent wreaths to help us count down until Jesus' birthday. 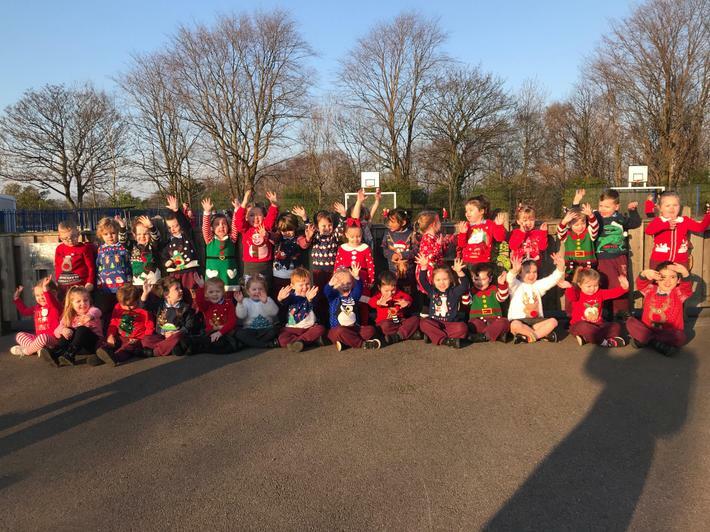 We would just like to wish everyone a very merry Christmas, enjoy the festive holidays and we cannot wait to see you again in the New Year! 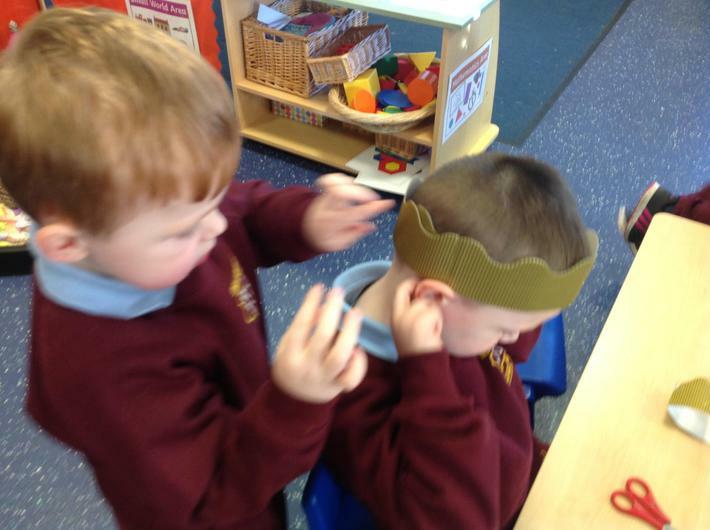 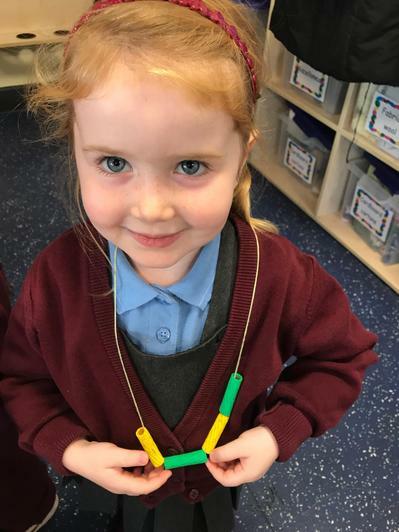 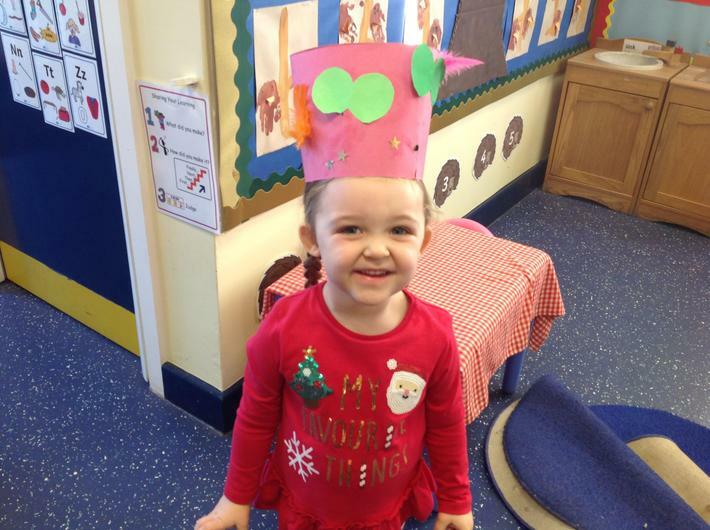 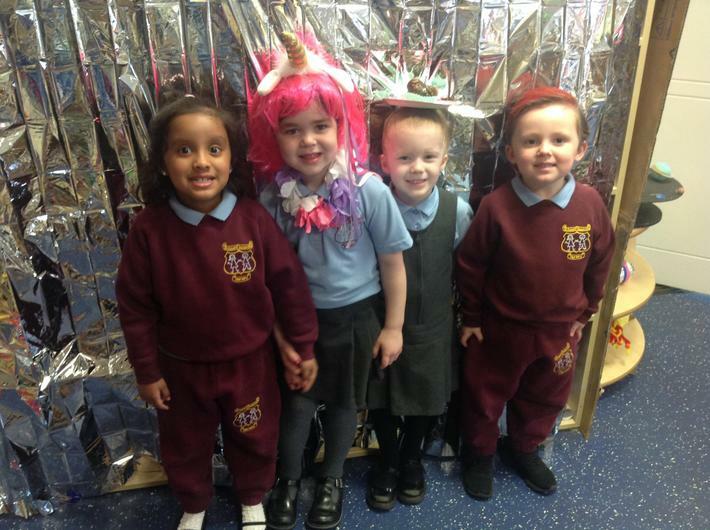 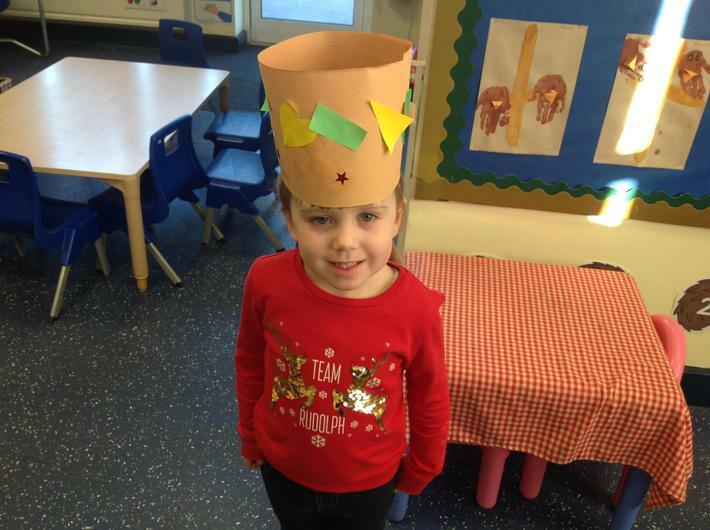 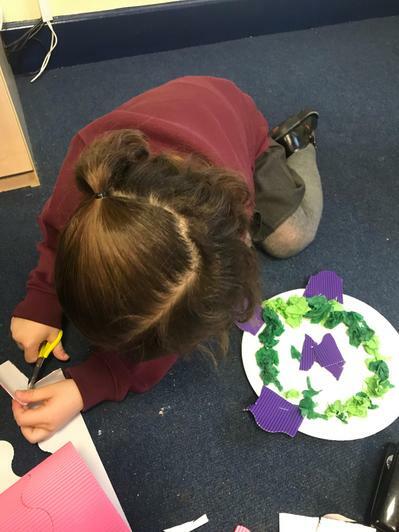 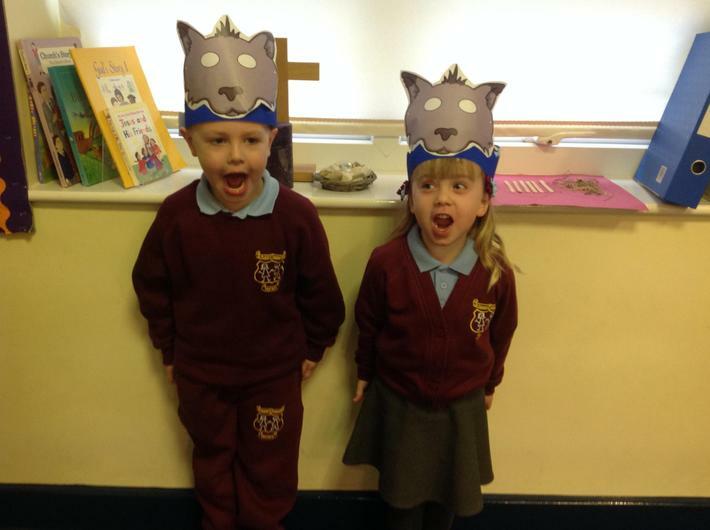 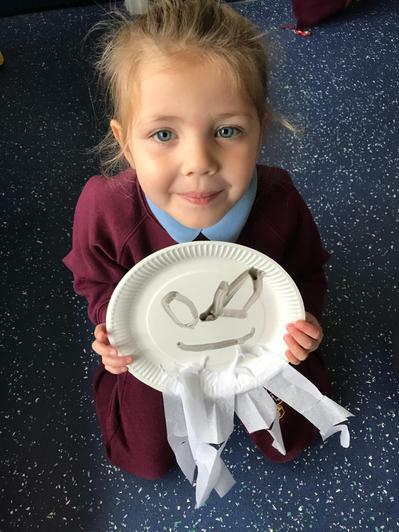 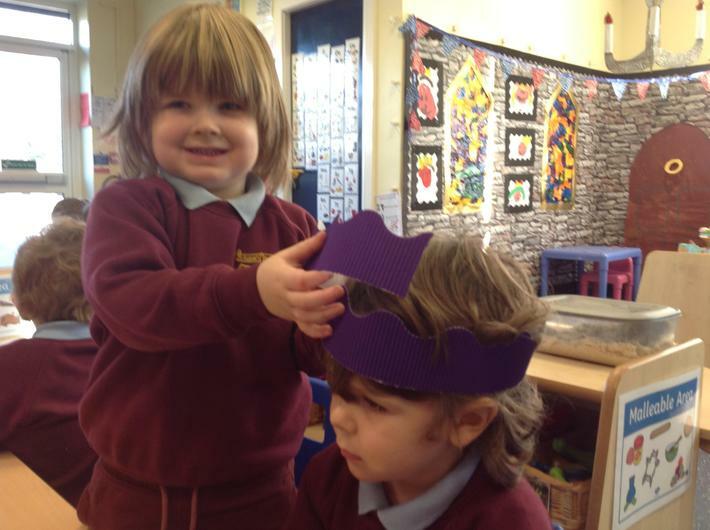 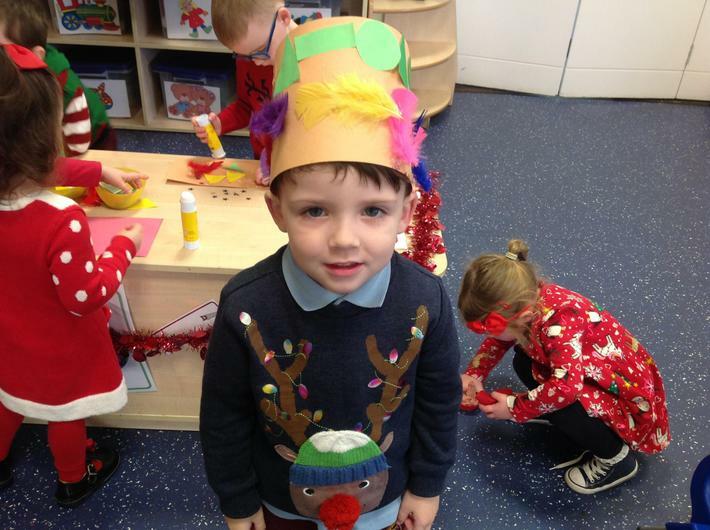 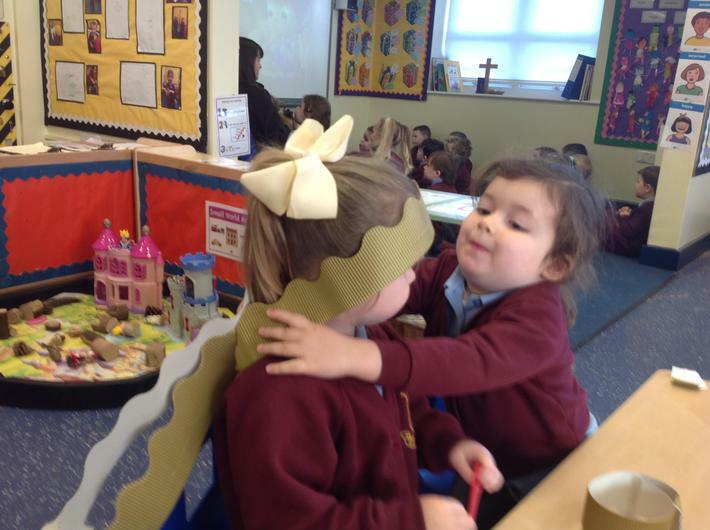 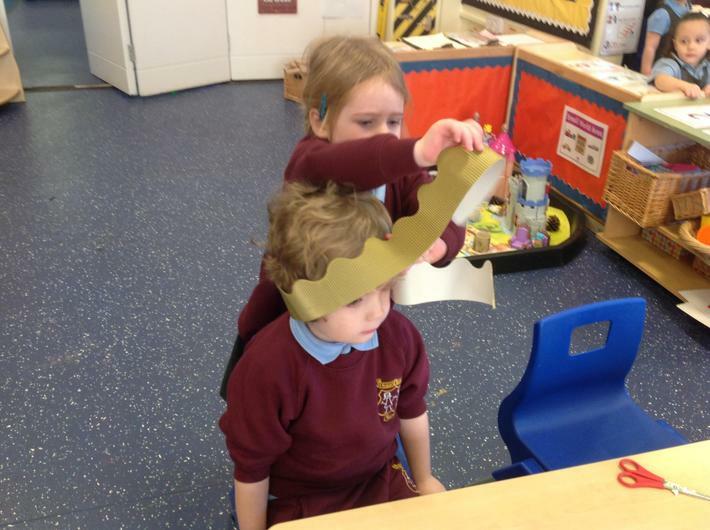 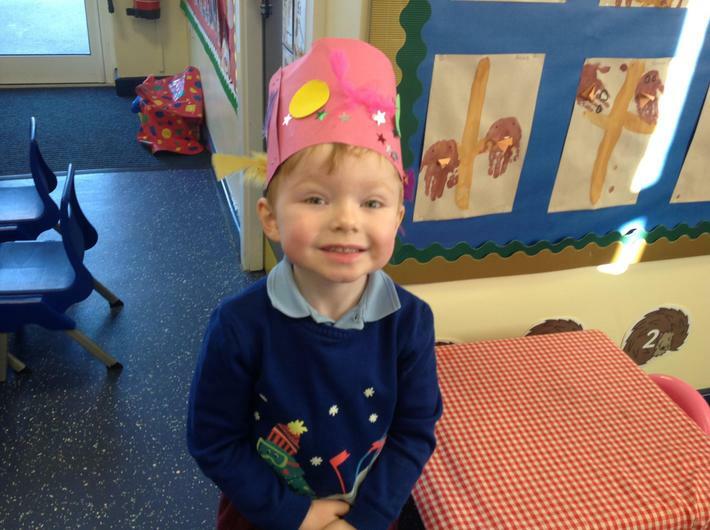 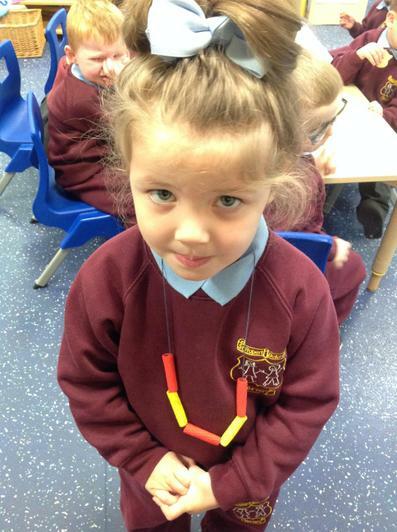 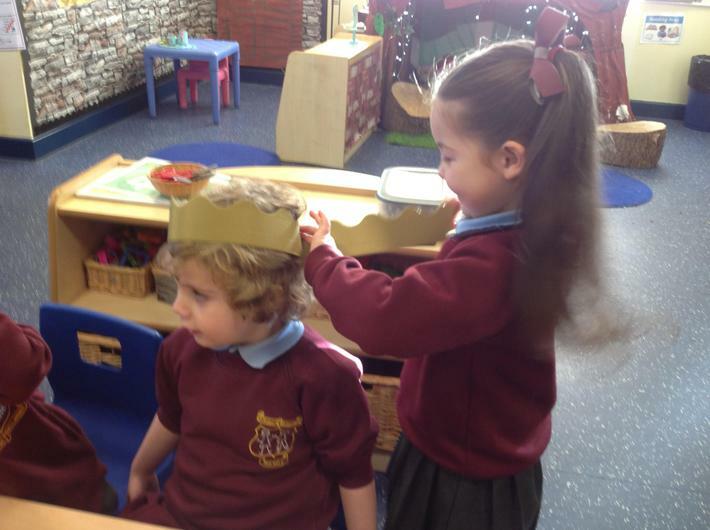 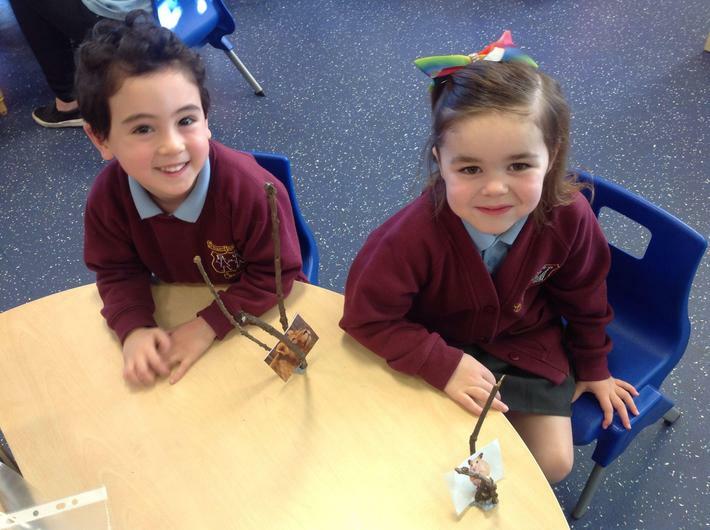 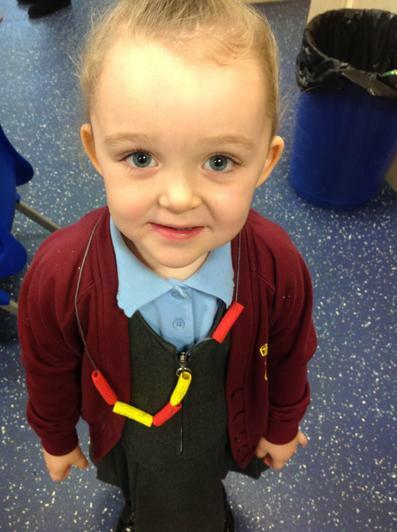 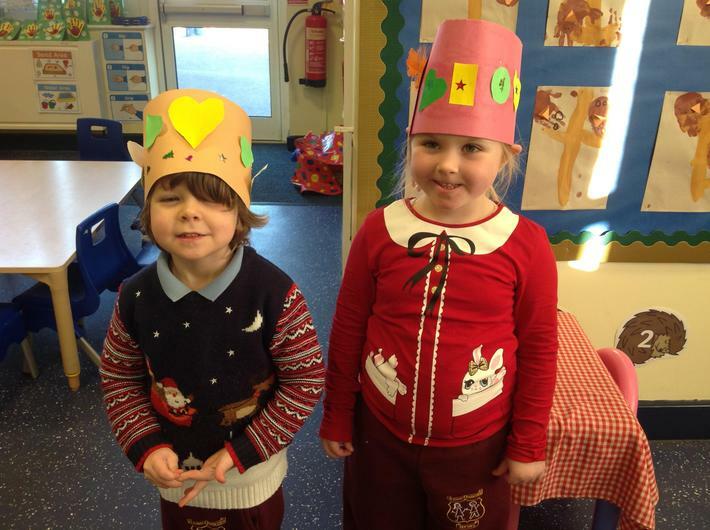 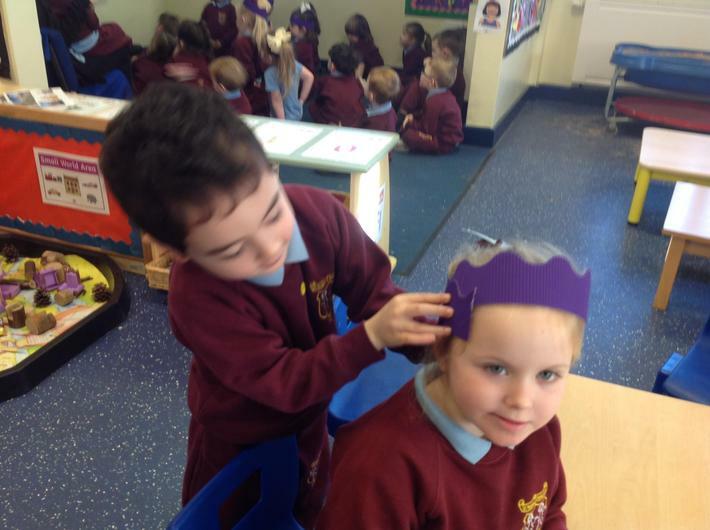 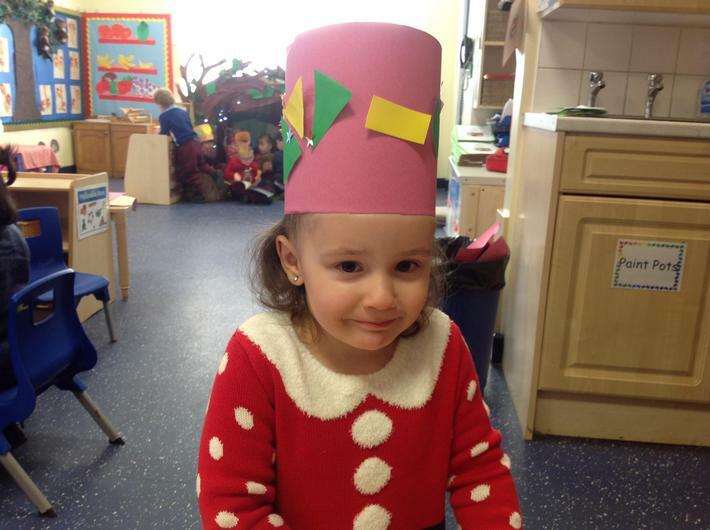 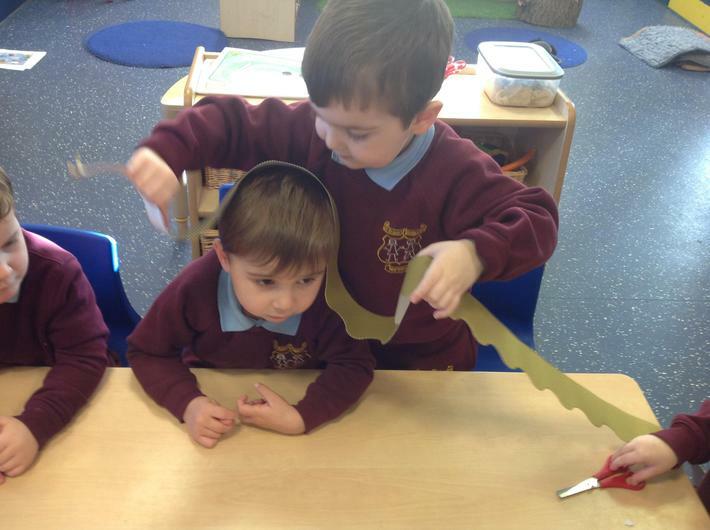 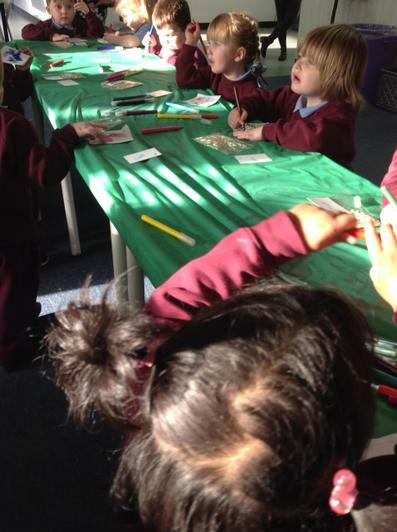 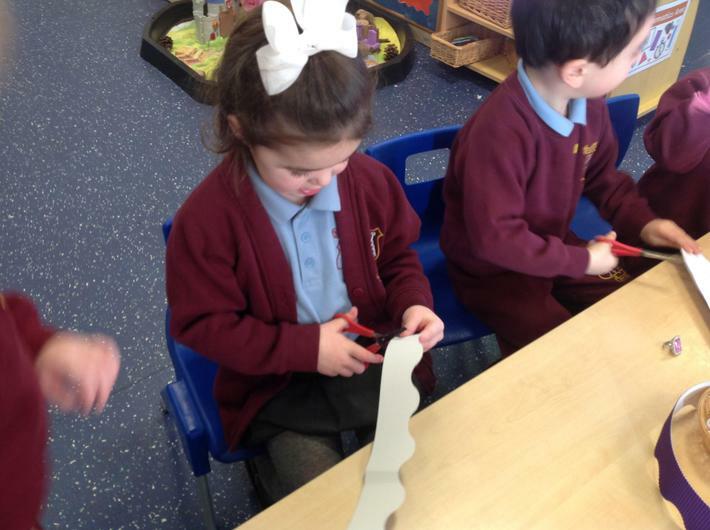 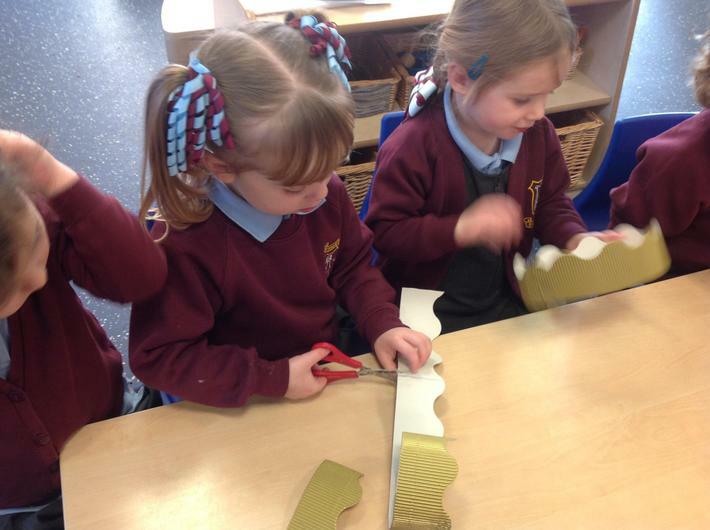 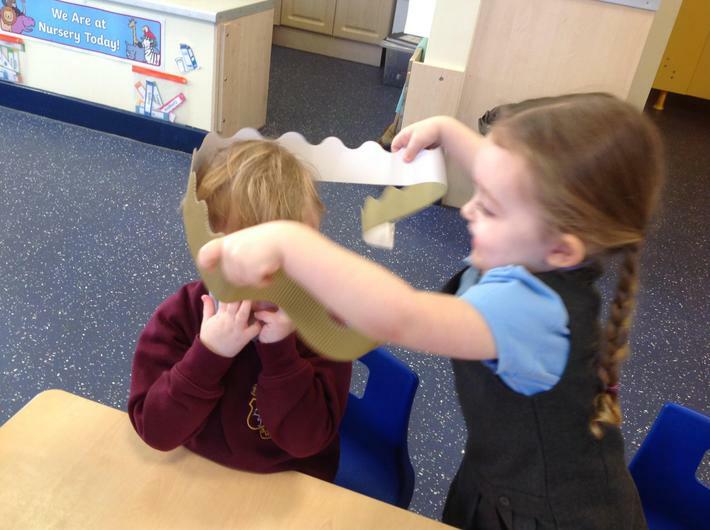 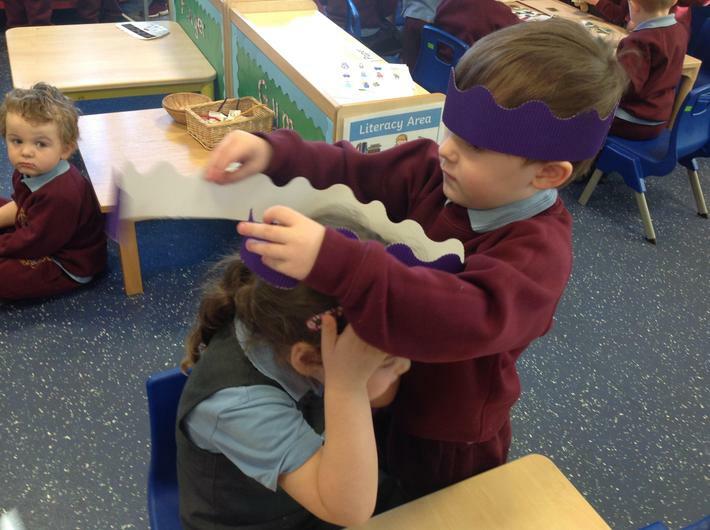 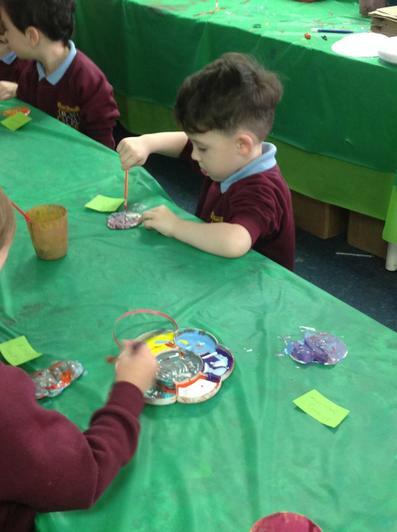 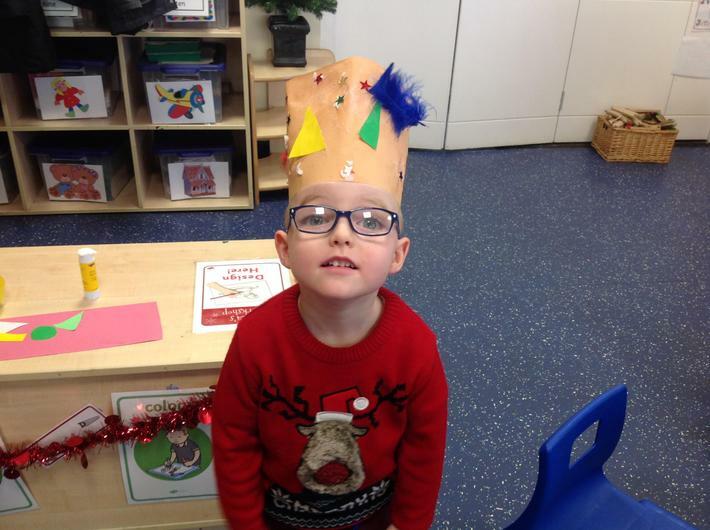 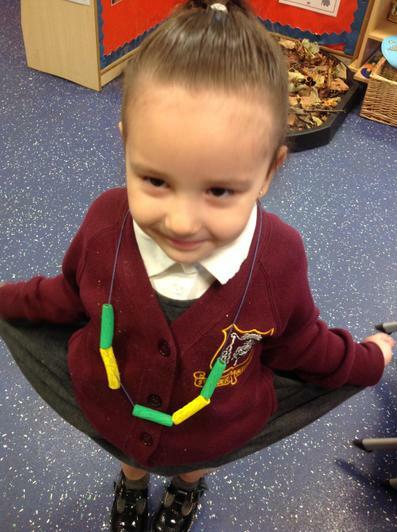 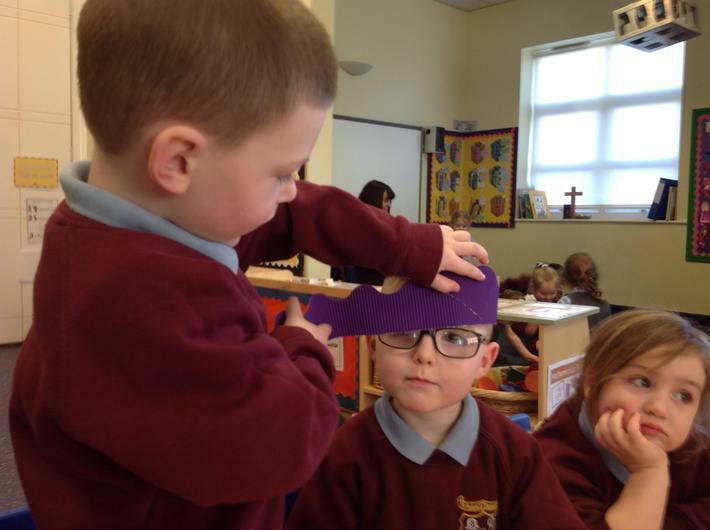 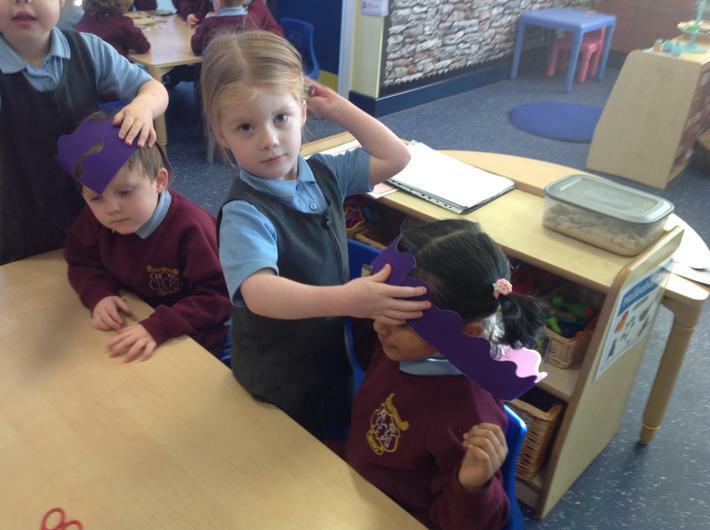 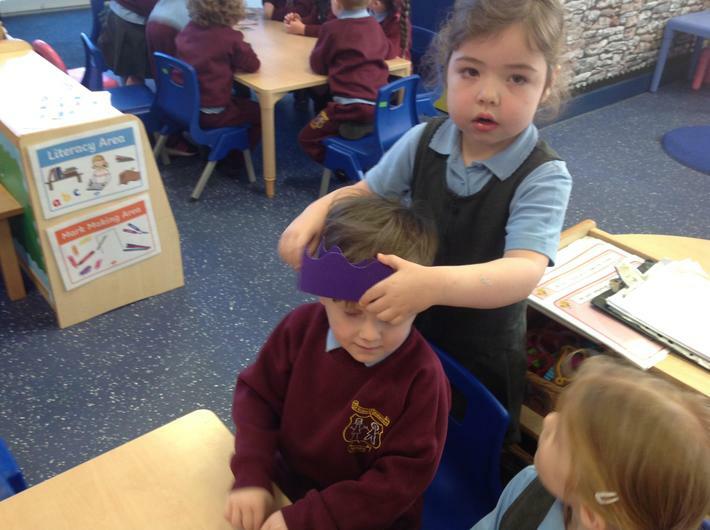 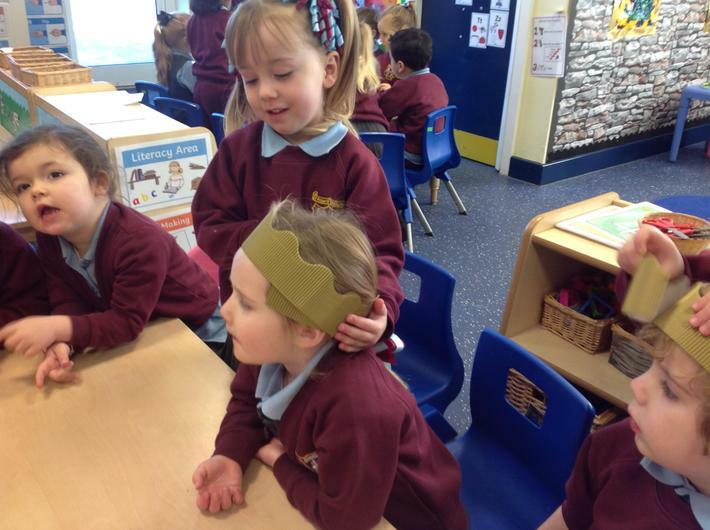 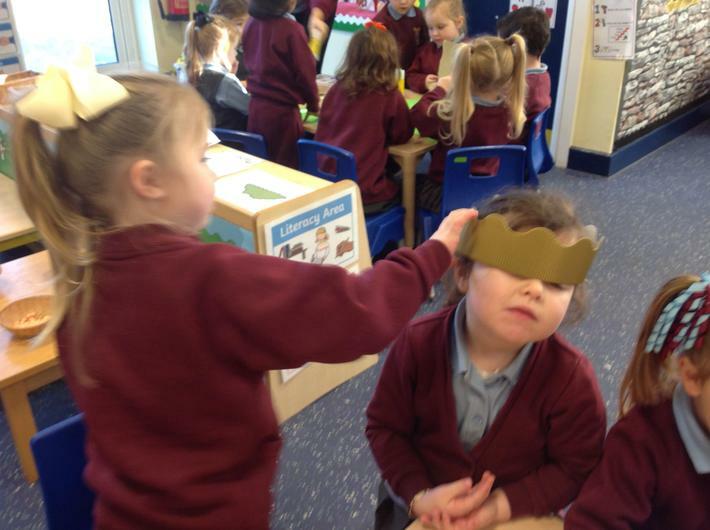 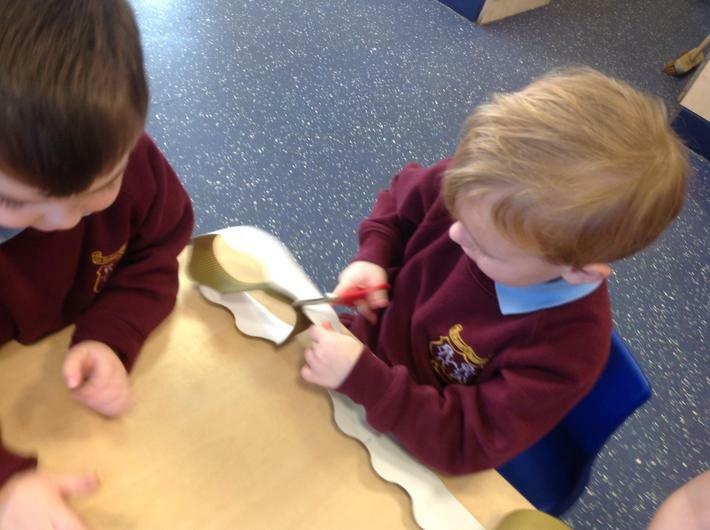 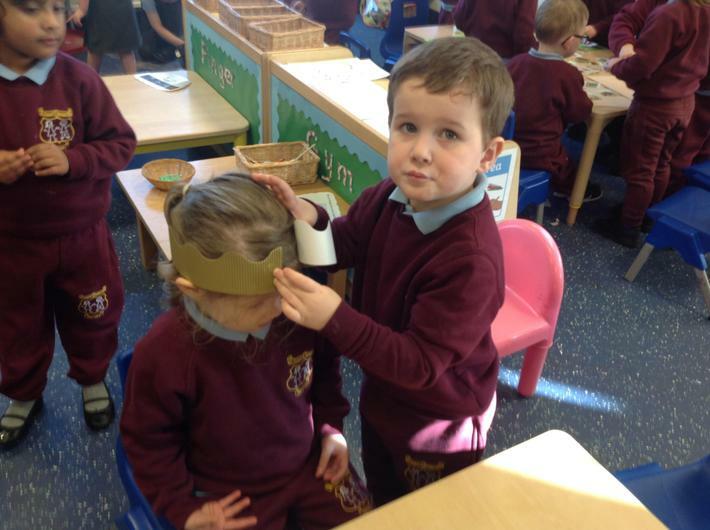 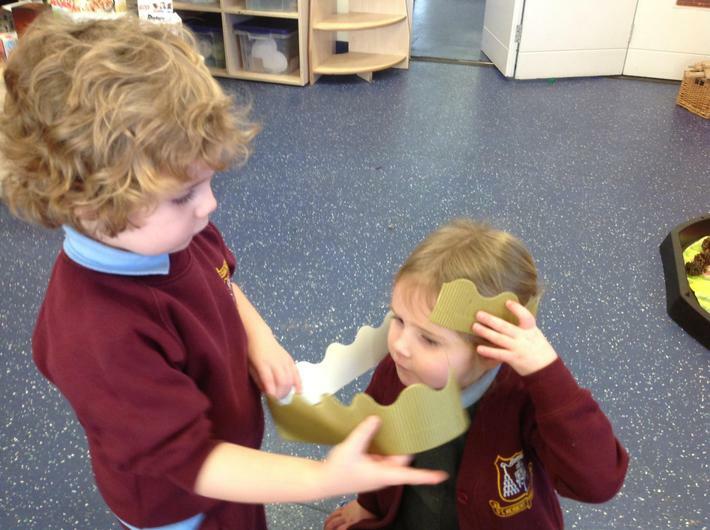 As part of our 'Traditional Tales' topic, we have been exploring how to help our friends make their own crowns. 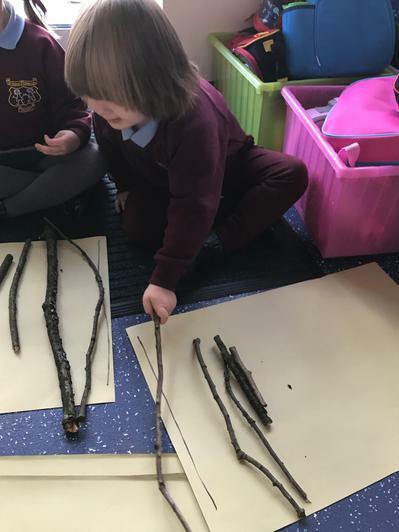 To do this we had to first find out how to carefully compare and order different lengths by using comparative language of longer and shorter. 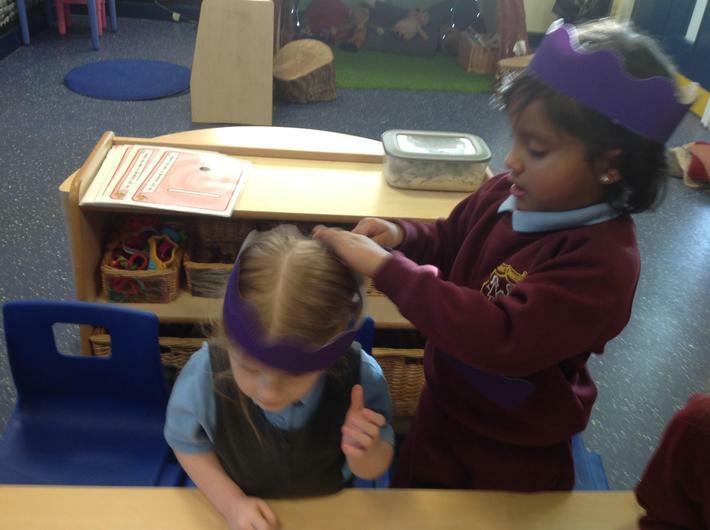 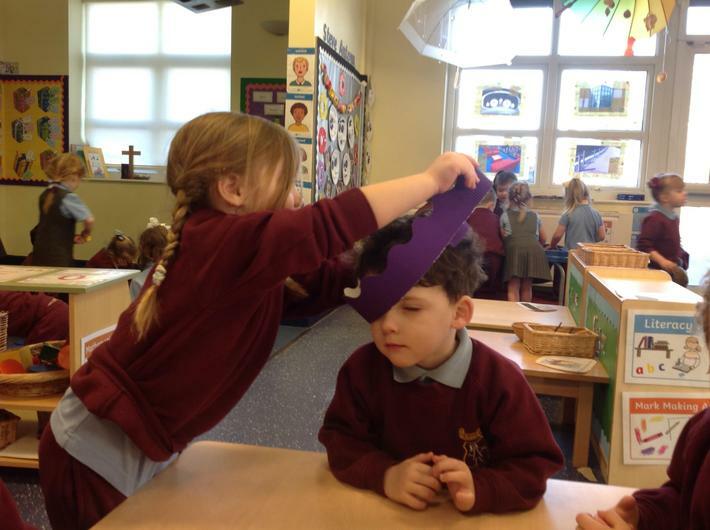 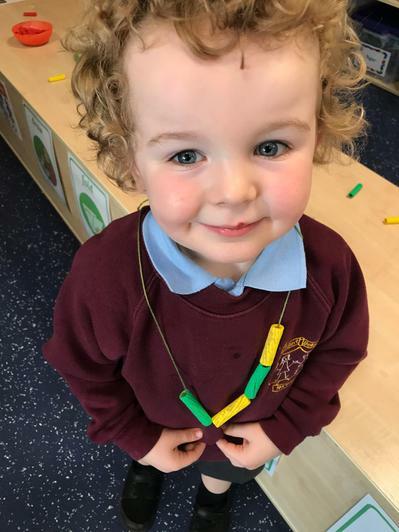 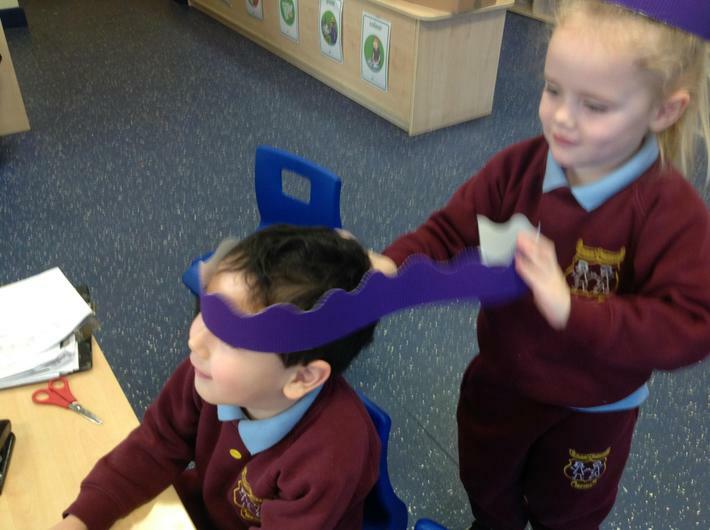 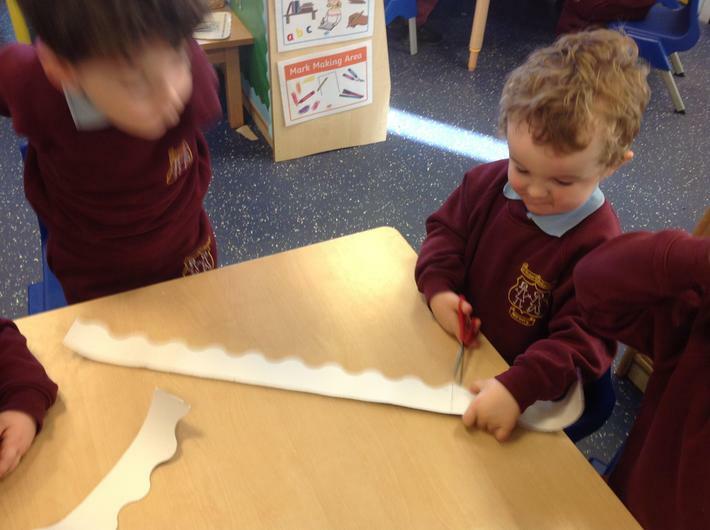 After this we learnt how to measure our friend's head and to make a mark so we knew where to cut to make it 'just right'! 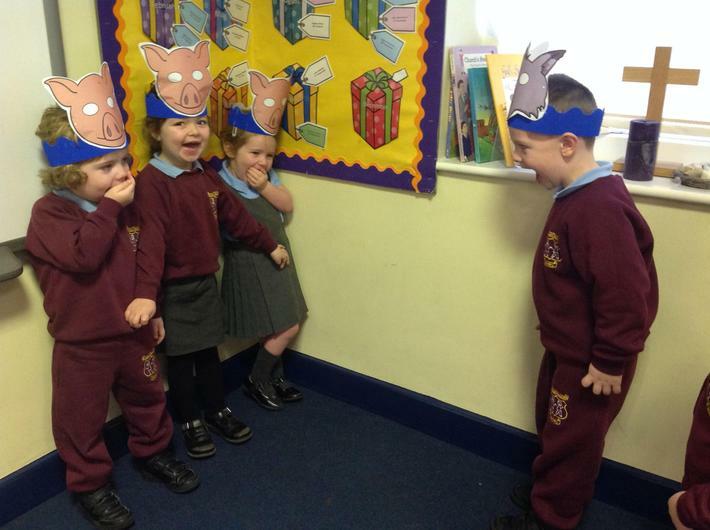 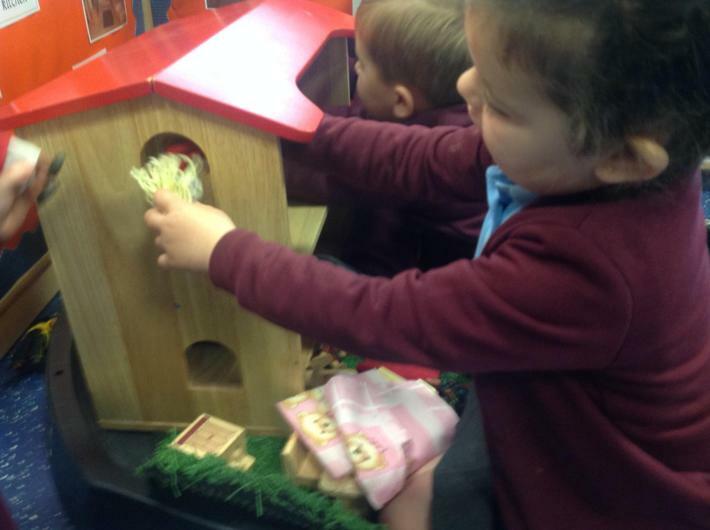 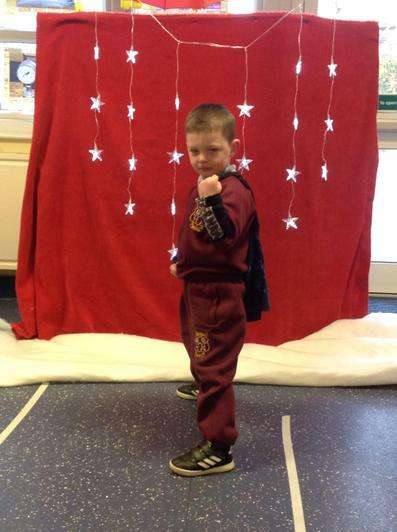 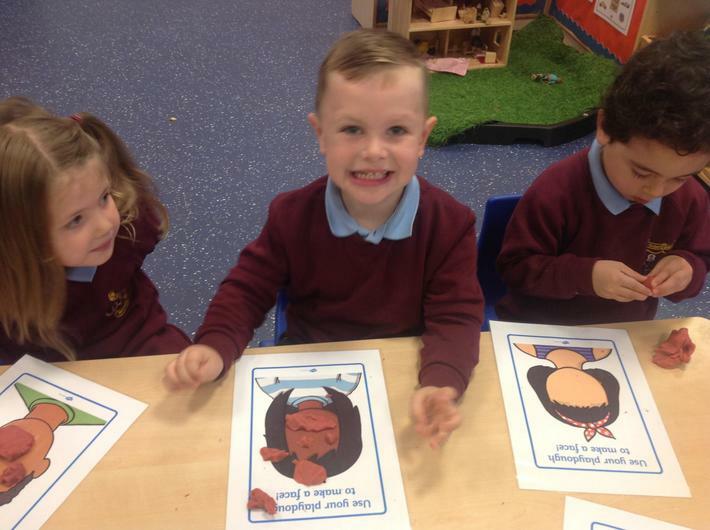 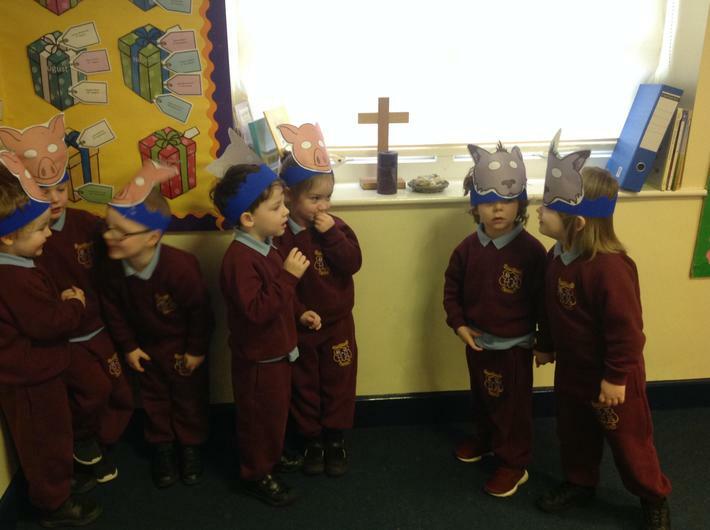 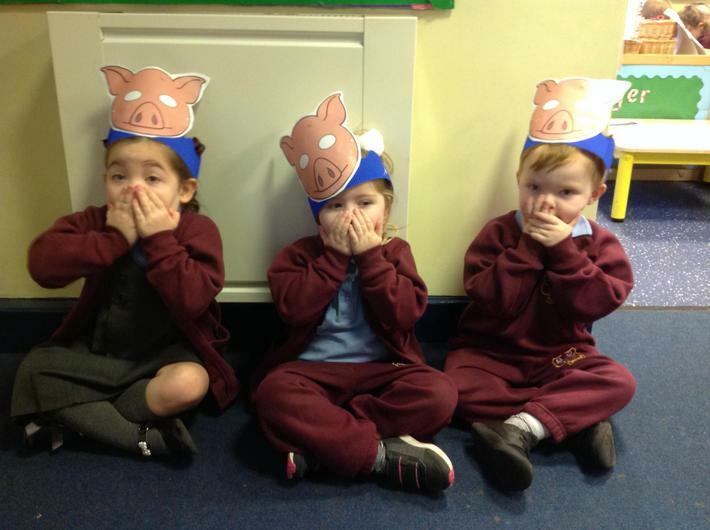 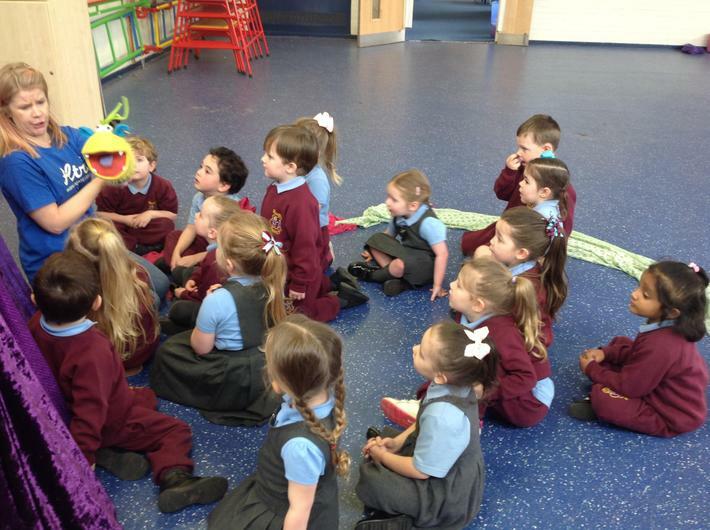 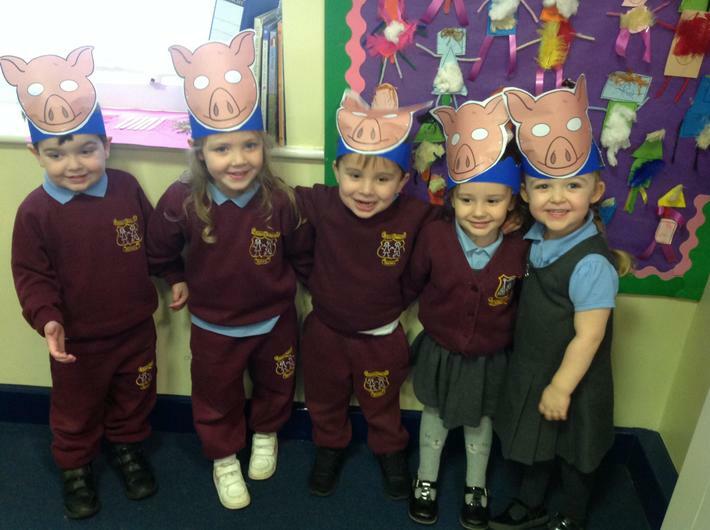 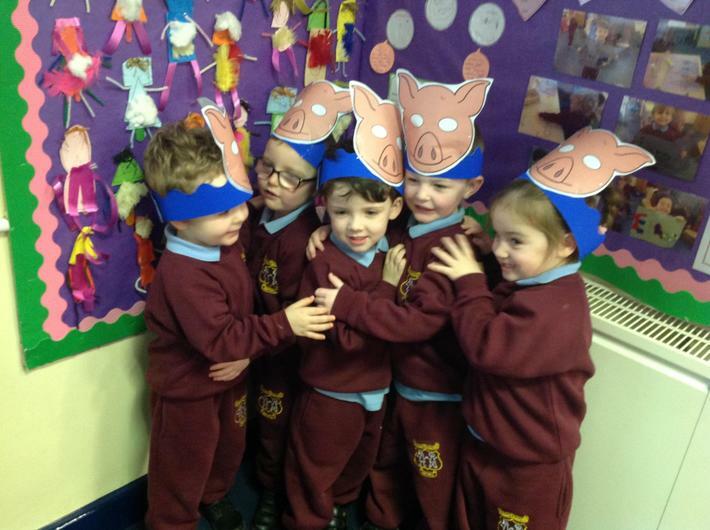 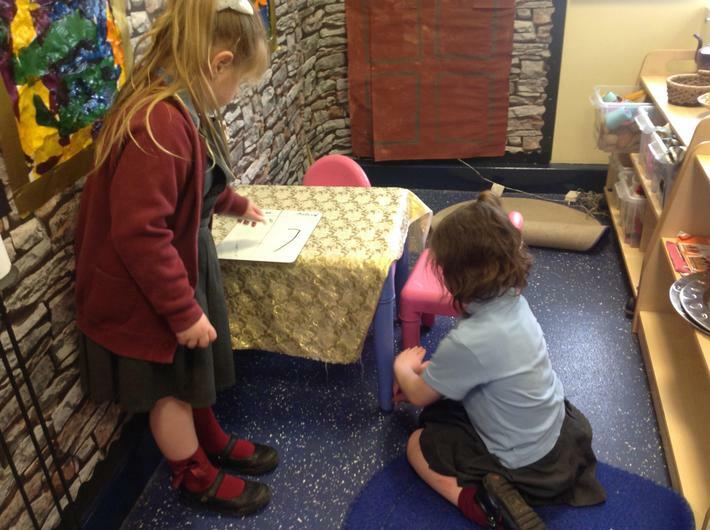 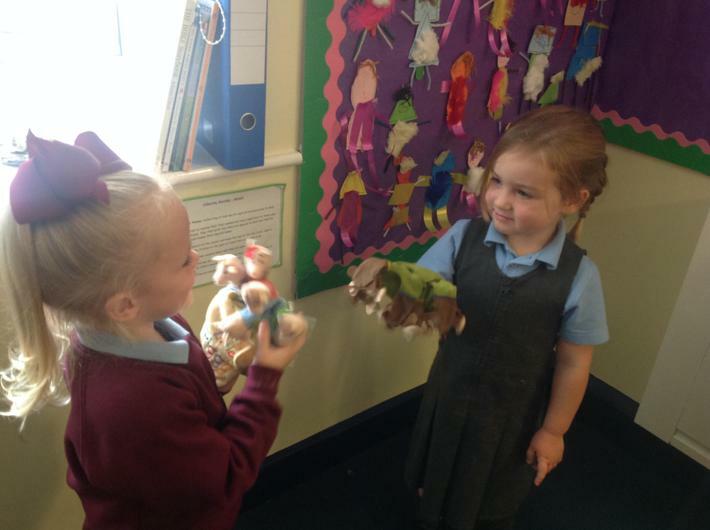 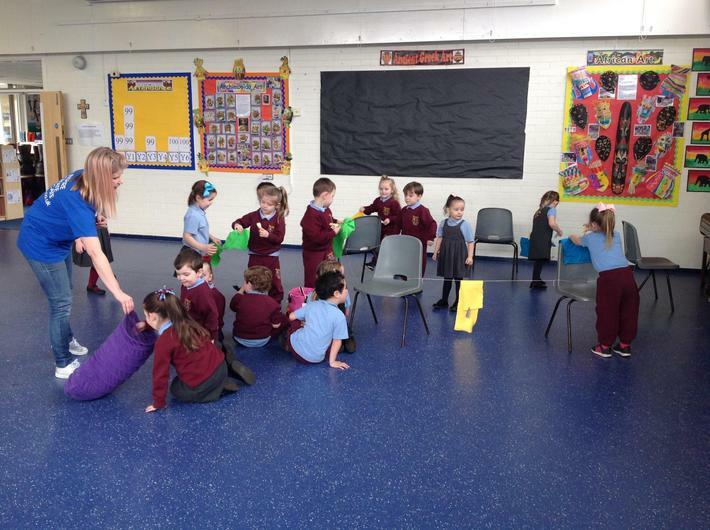 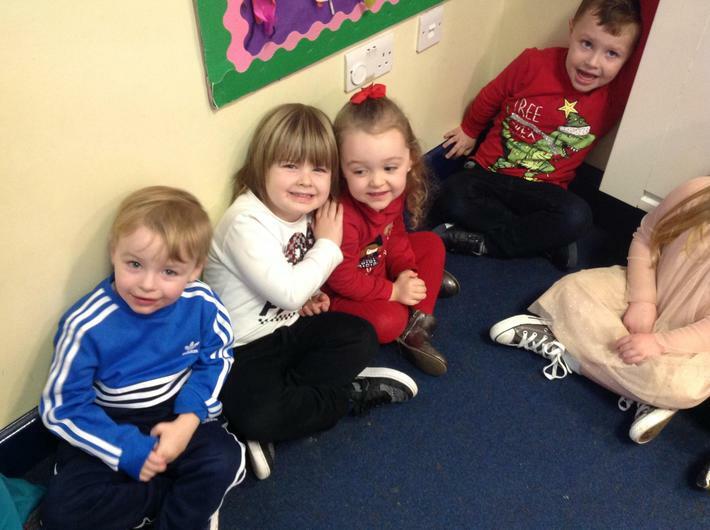 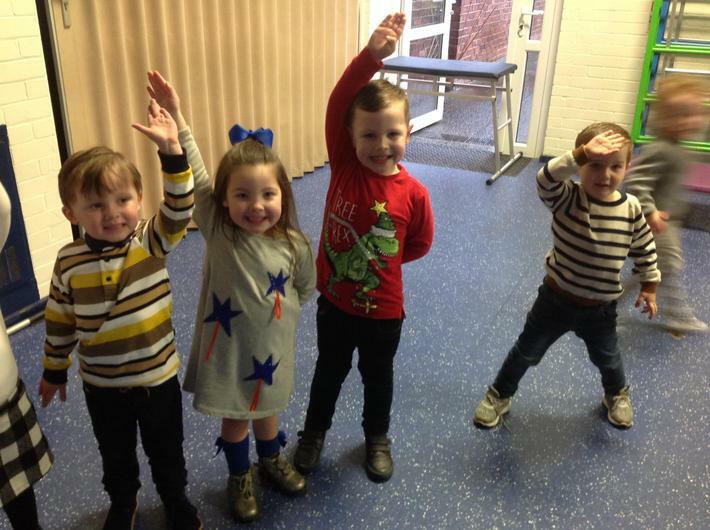 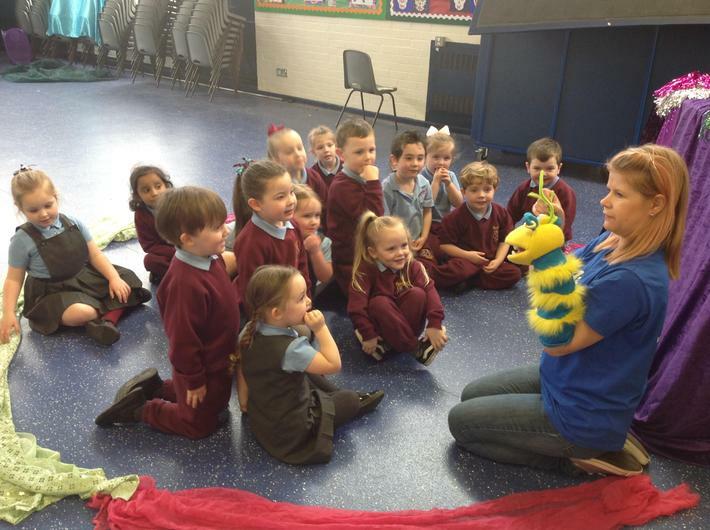 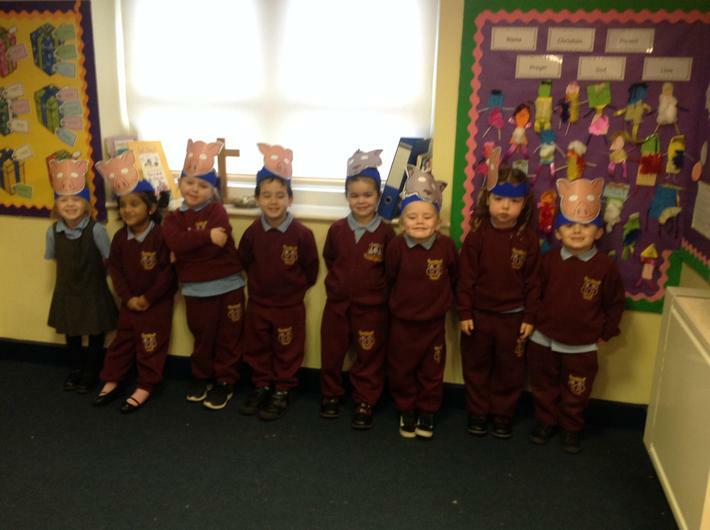 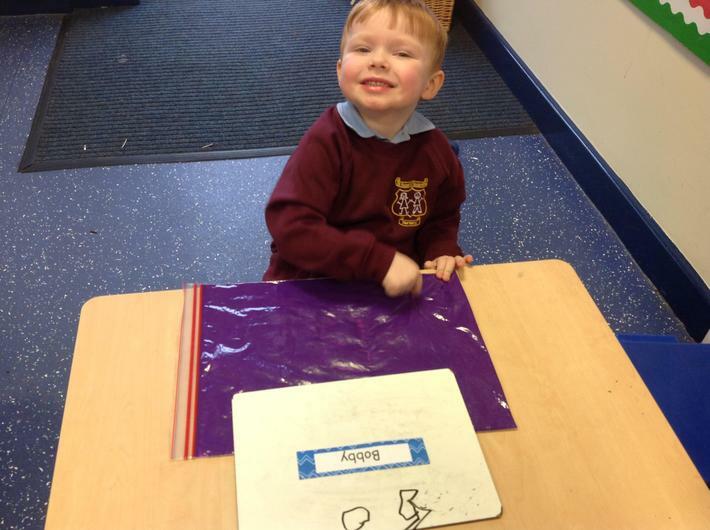 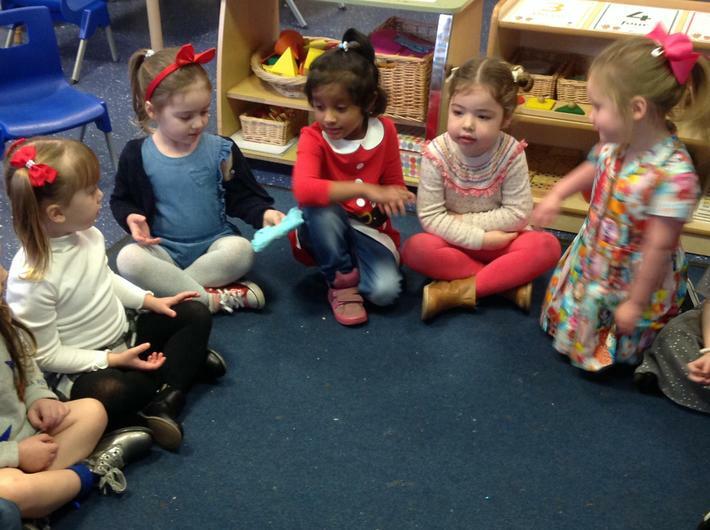 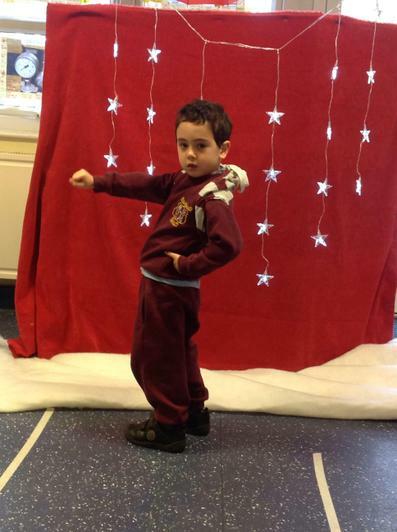 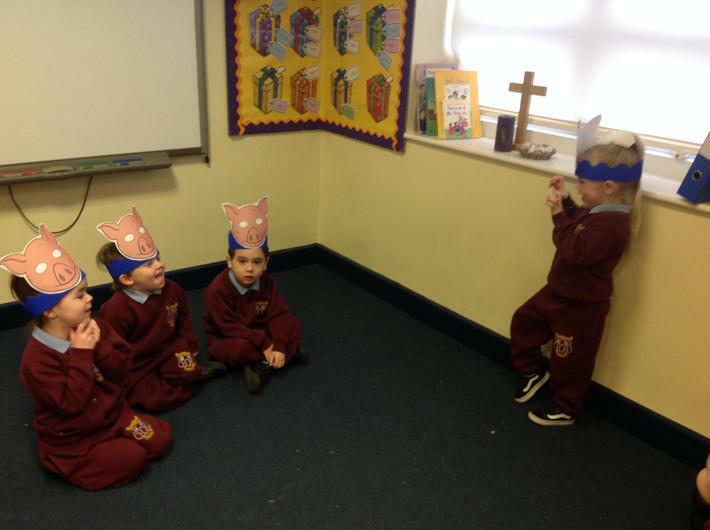 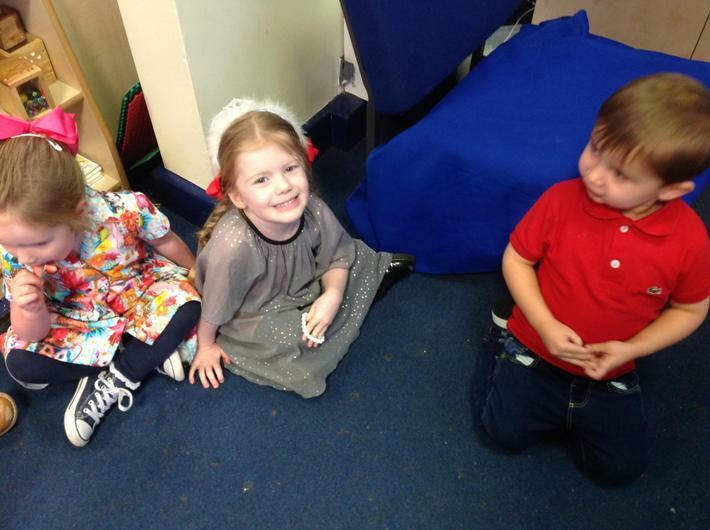 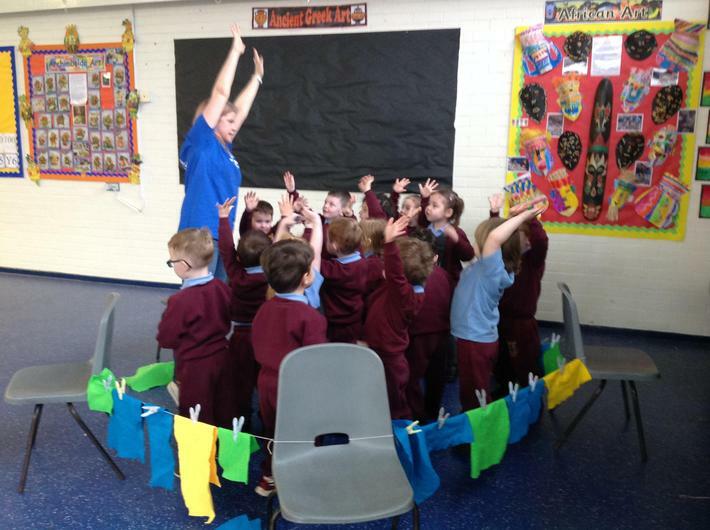 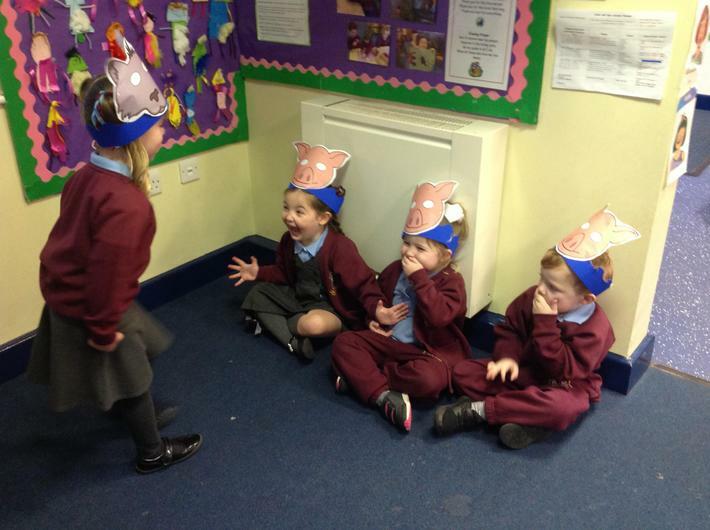 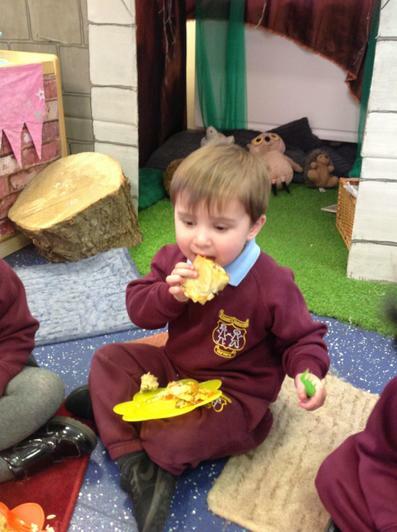 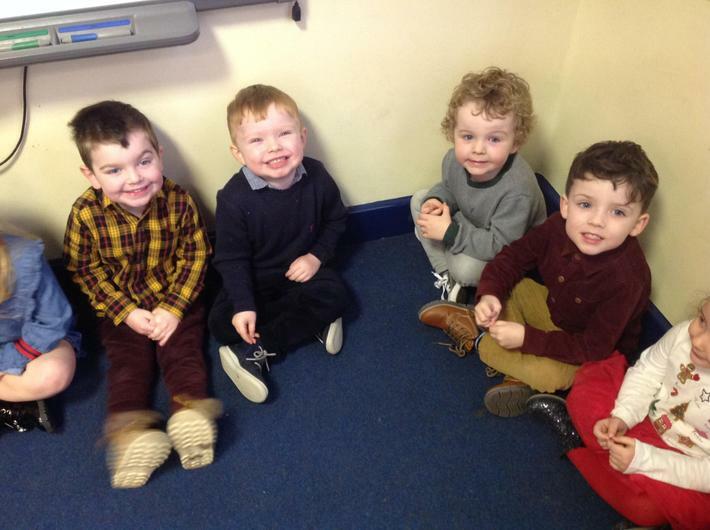 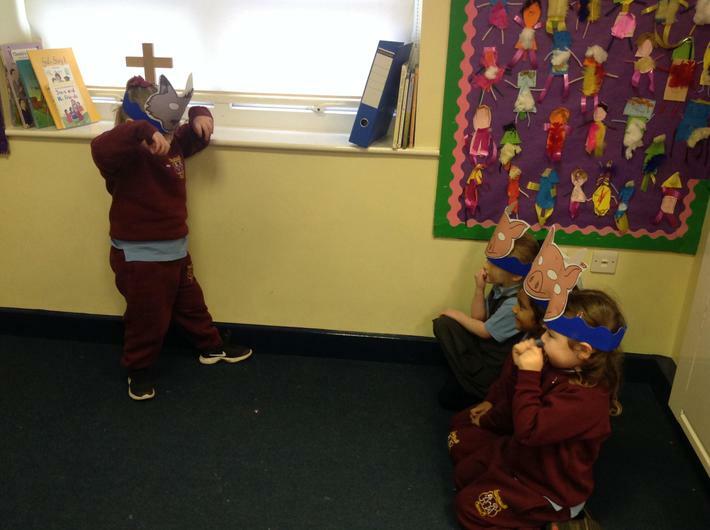 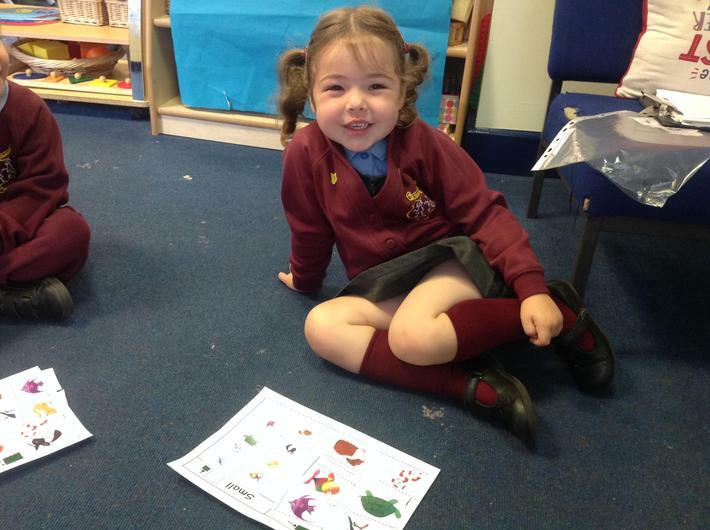 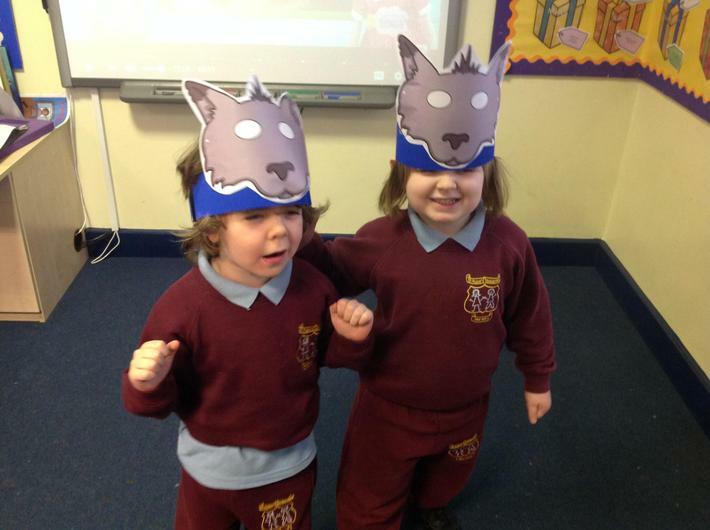 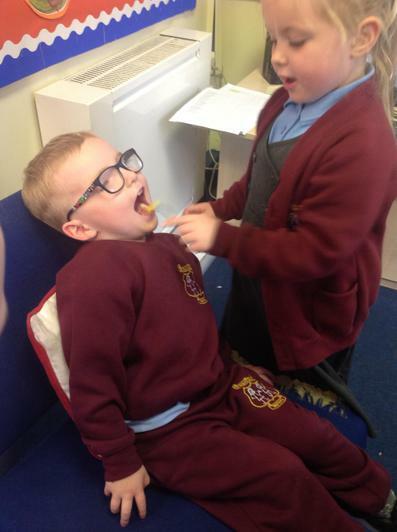 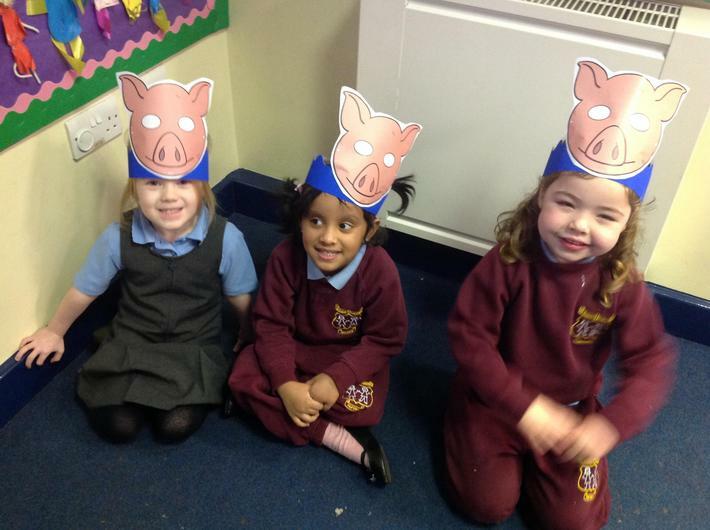 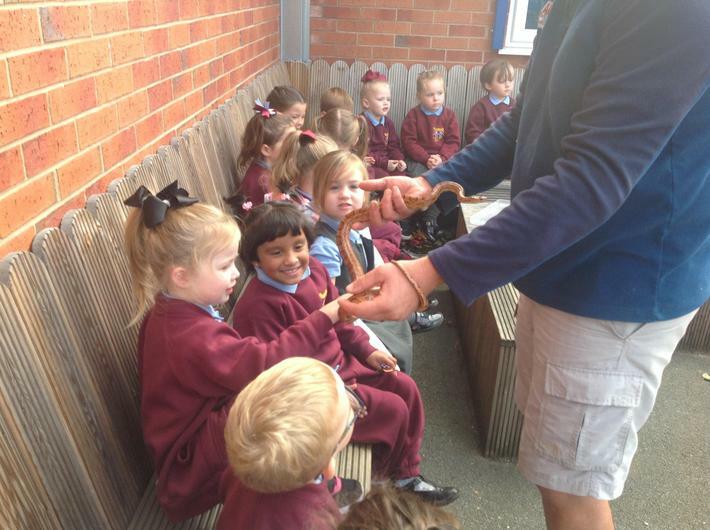 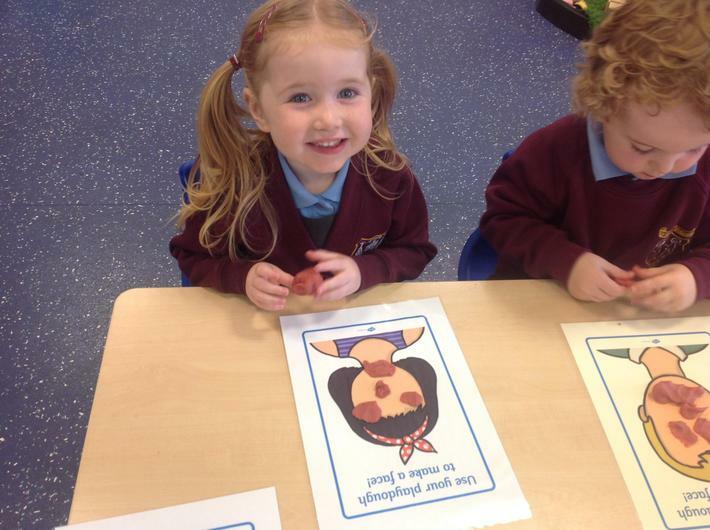 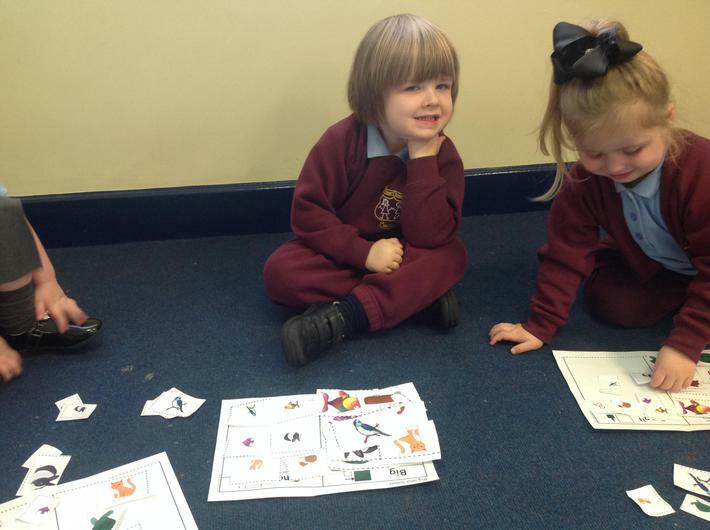 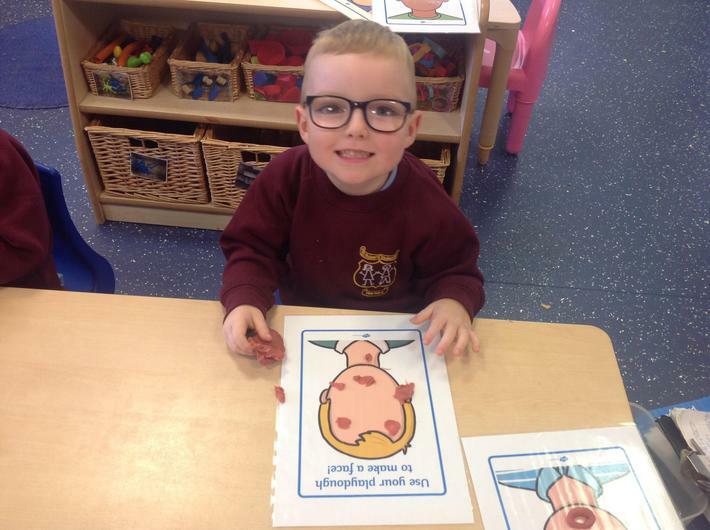 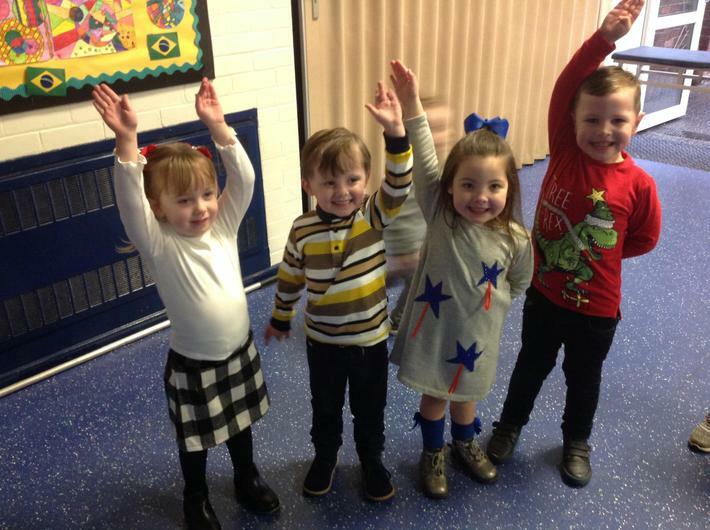 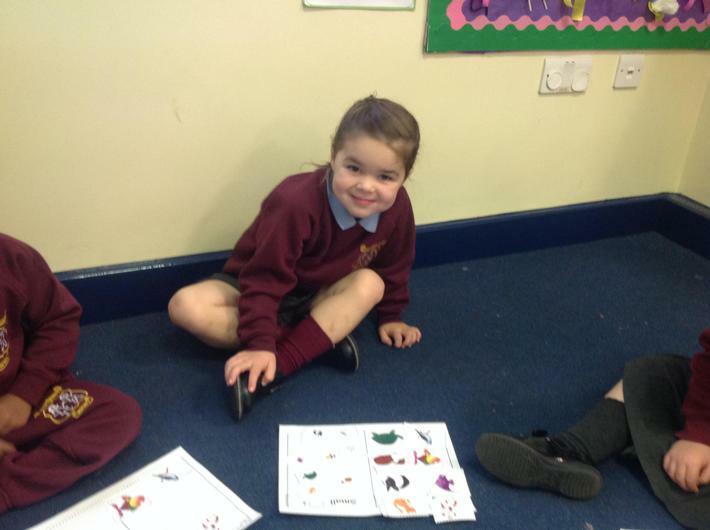 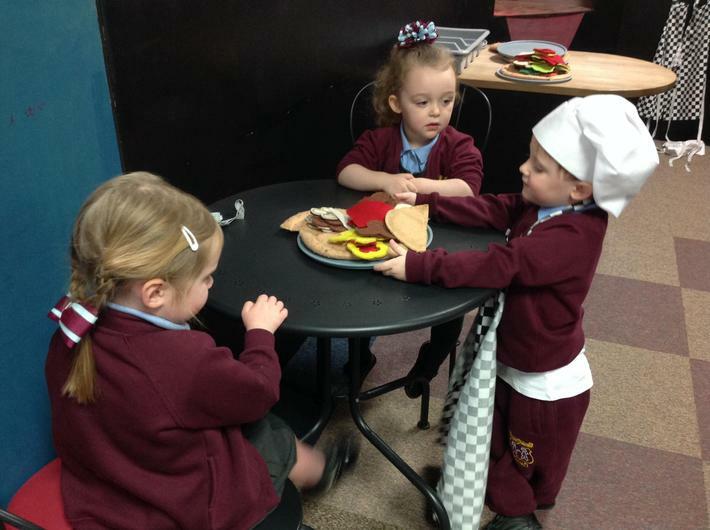 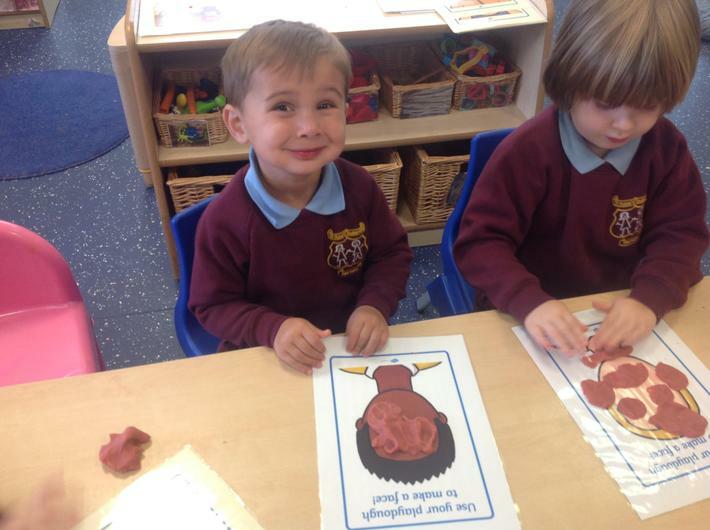 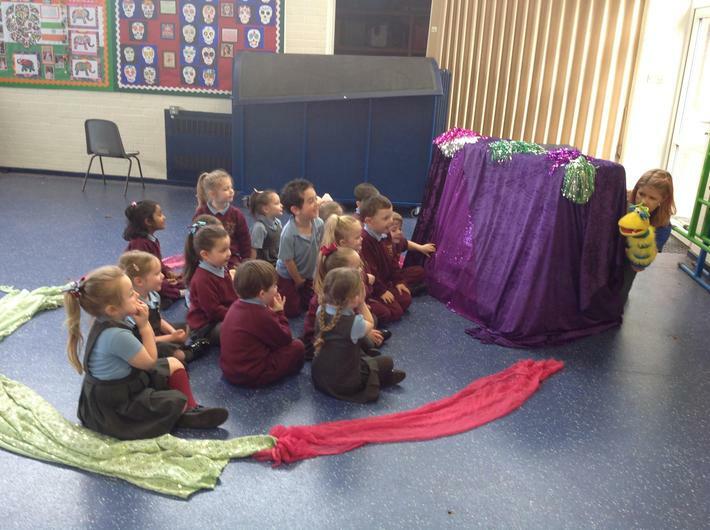 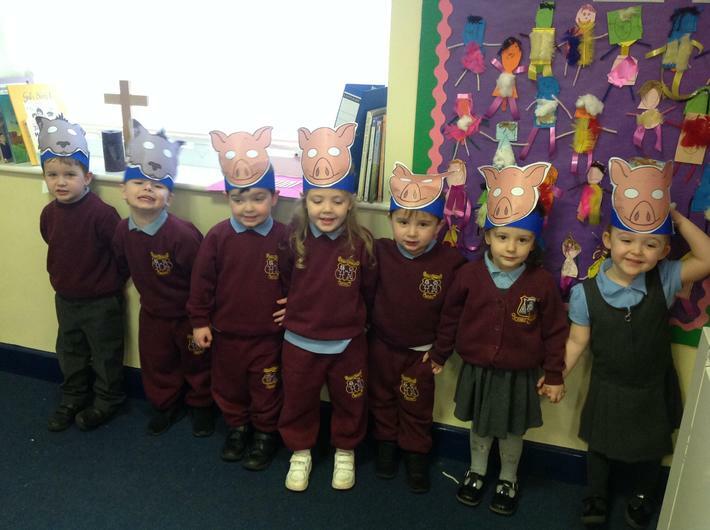 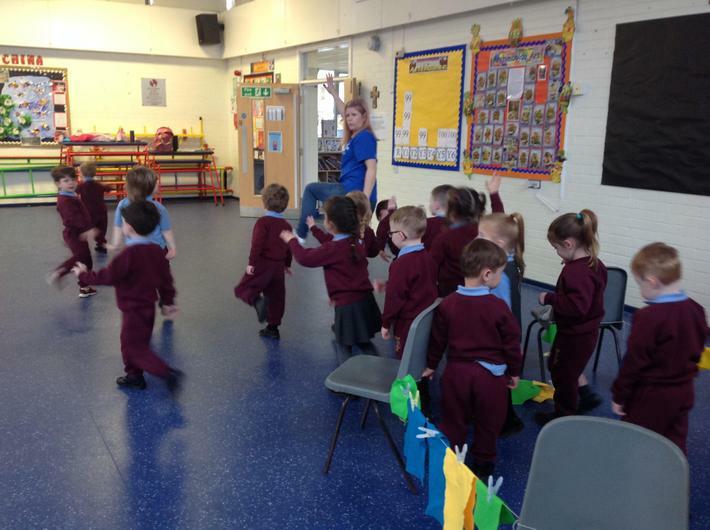 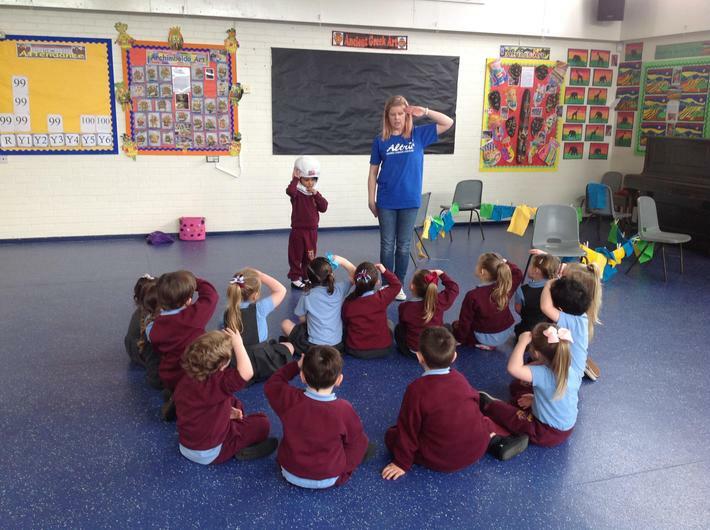 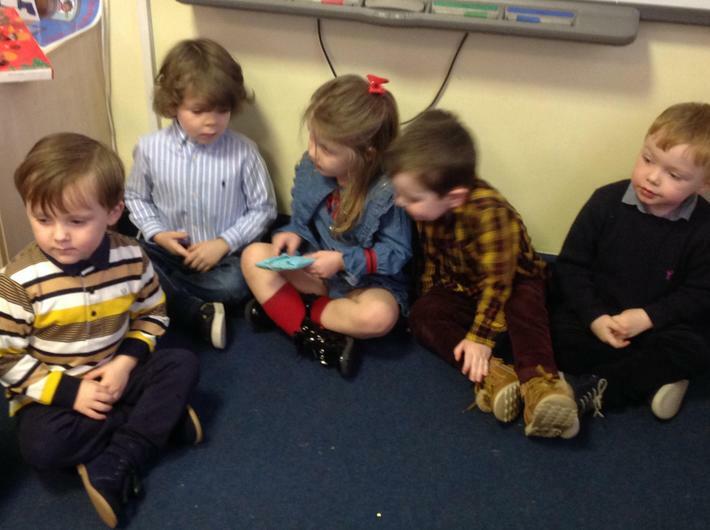 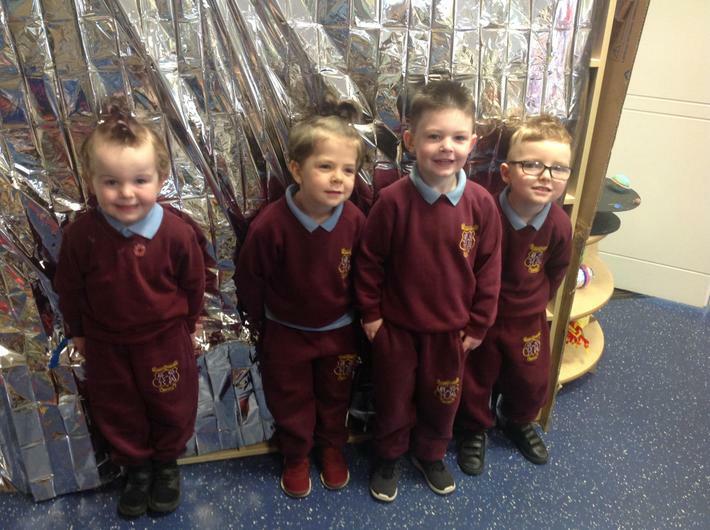 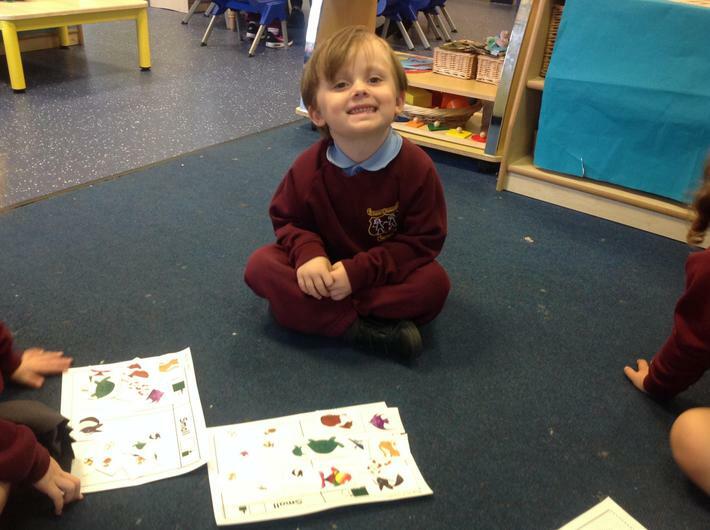 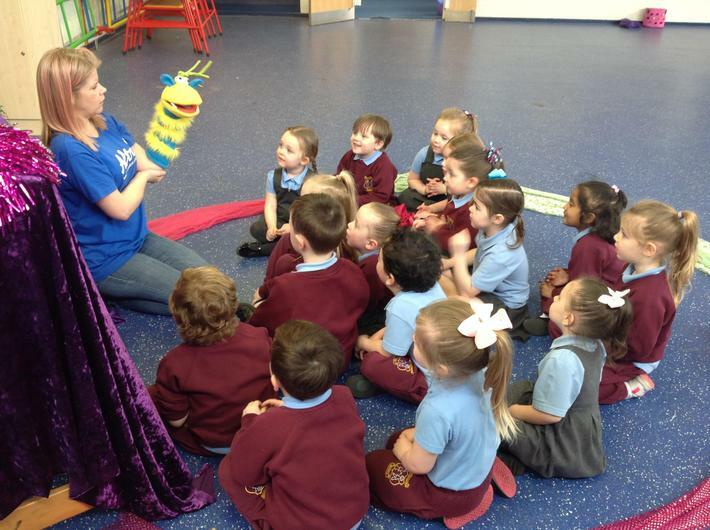 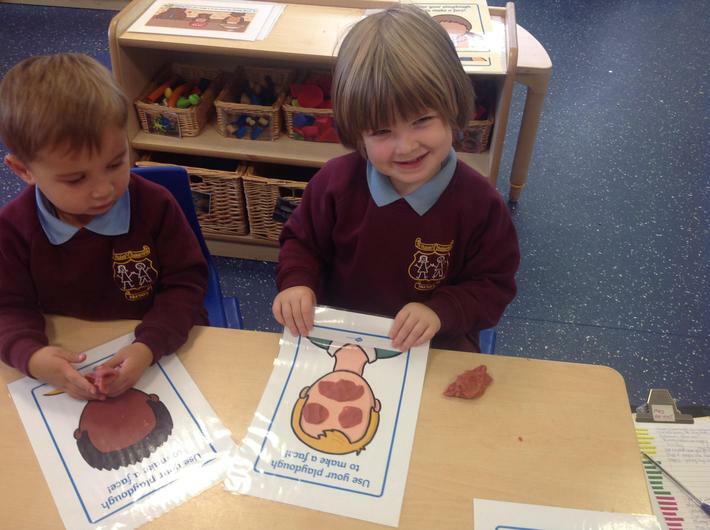 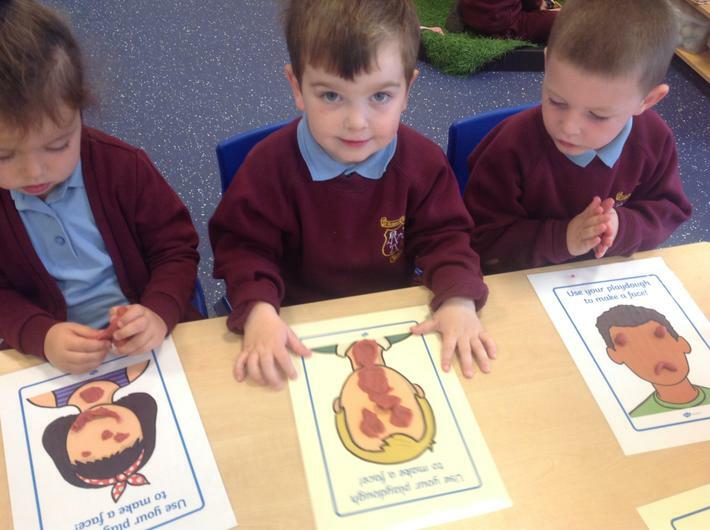 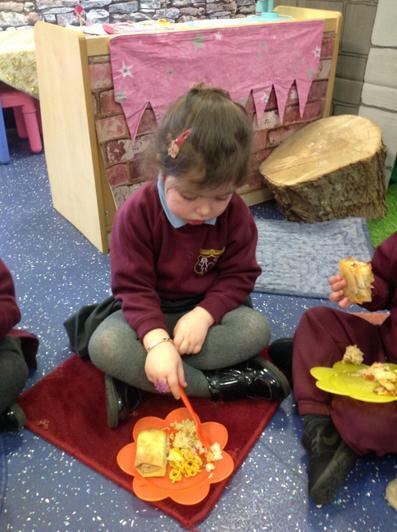 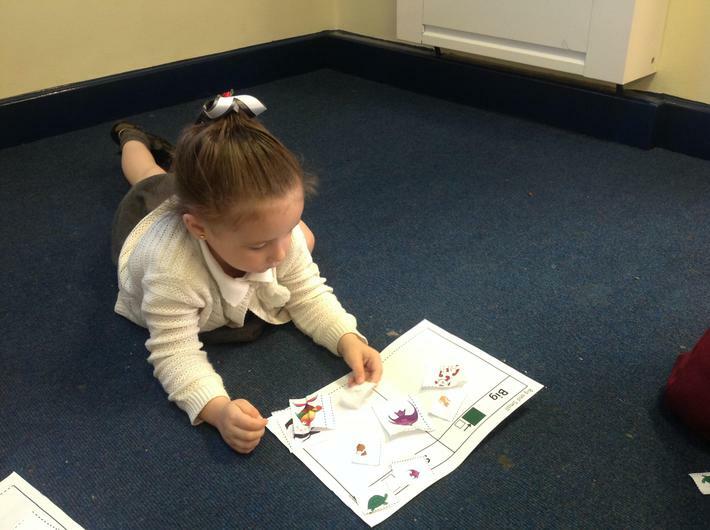 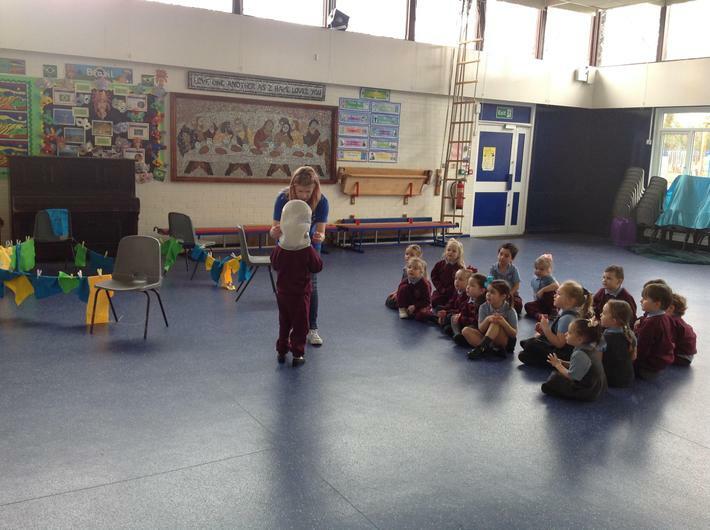 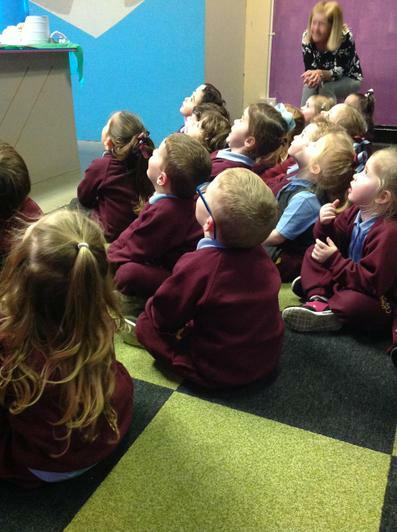 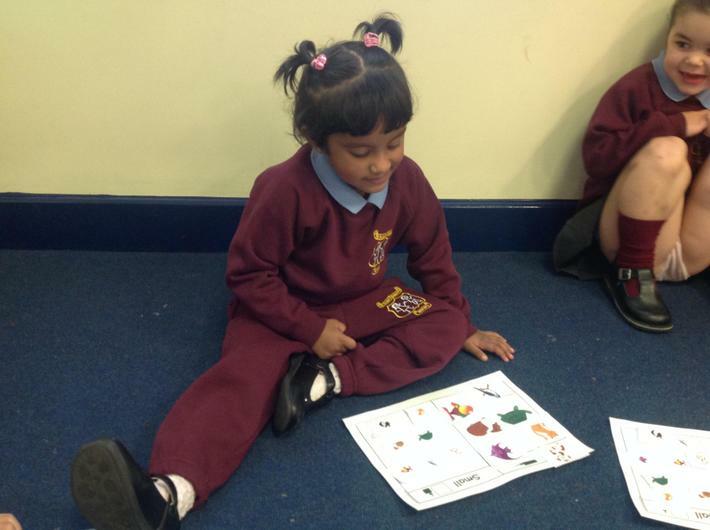 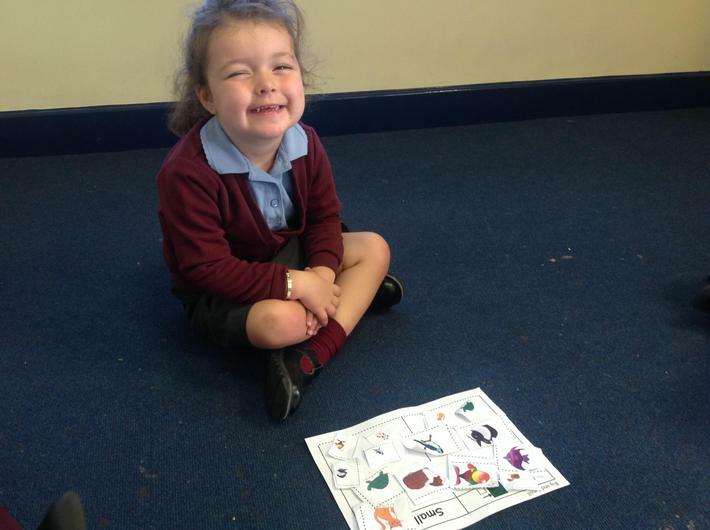 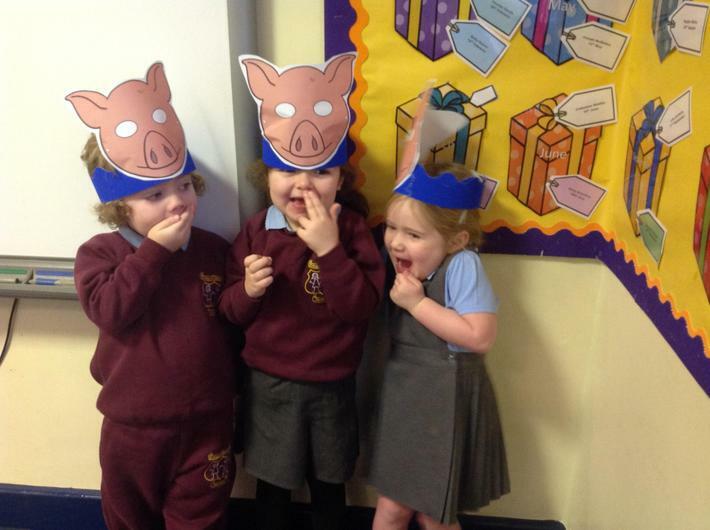 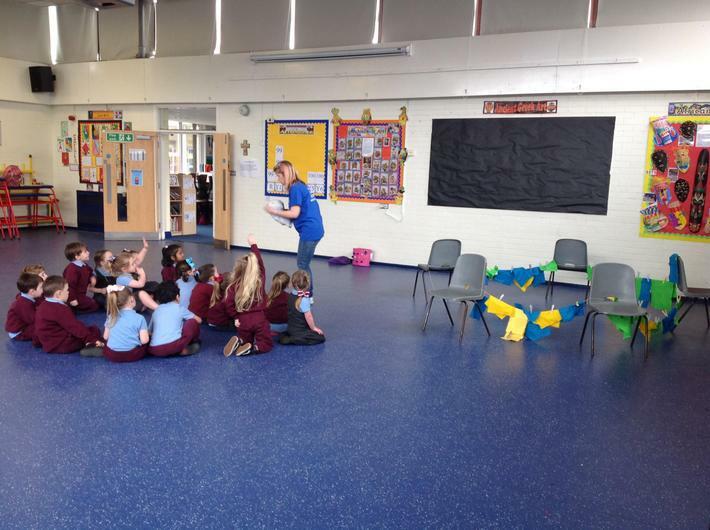 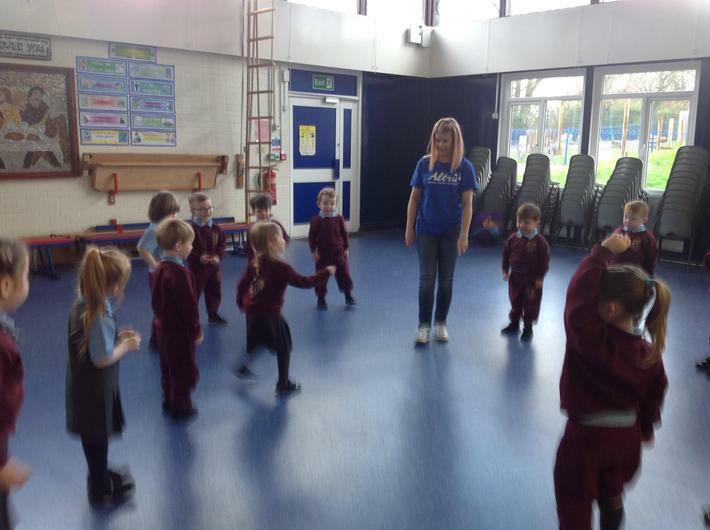 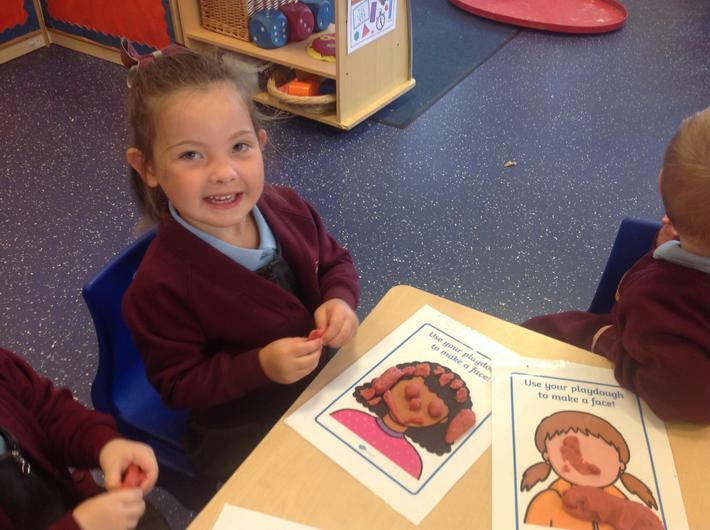 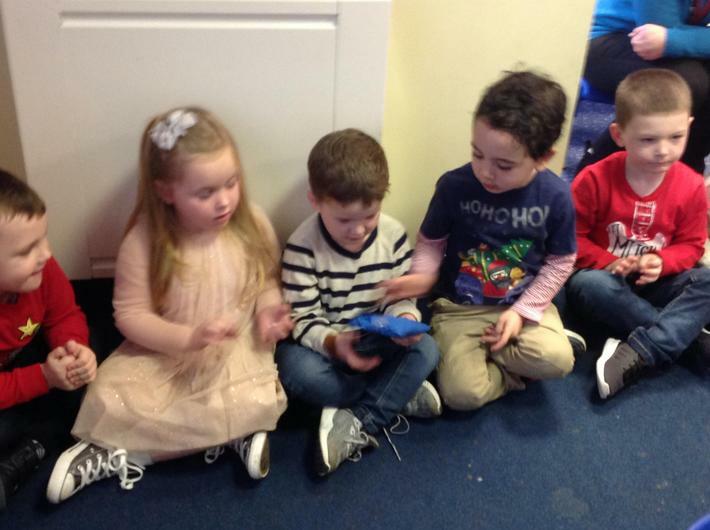 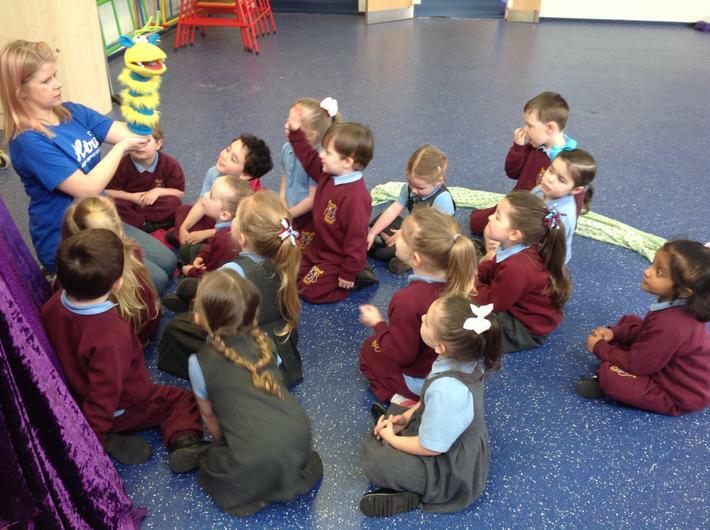 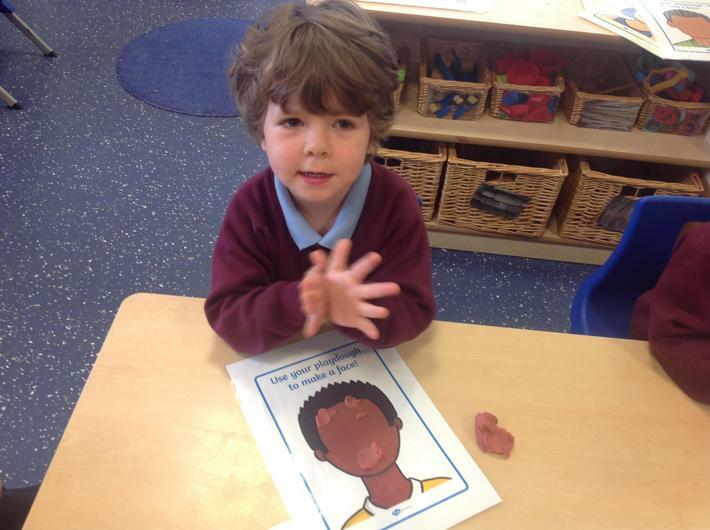 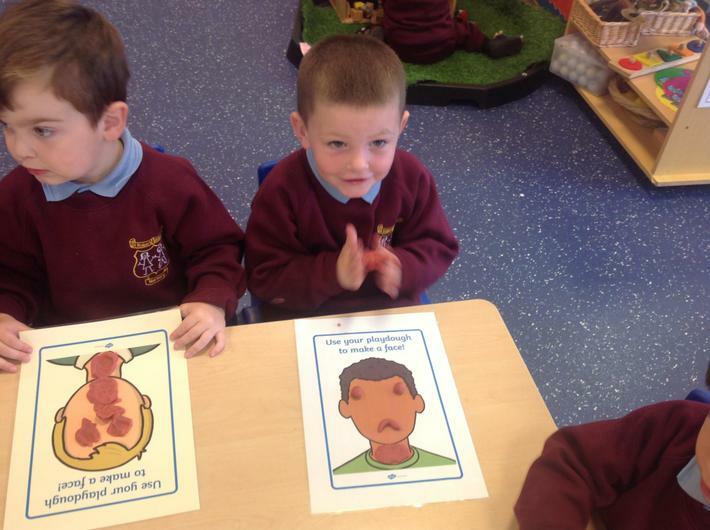 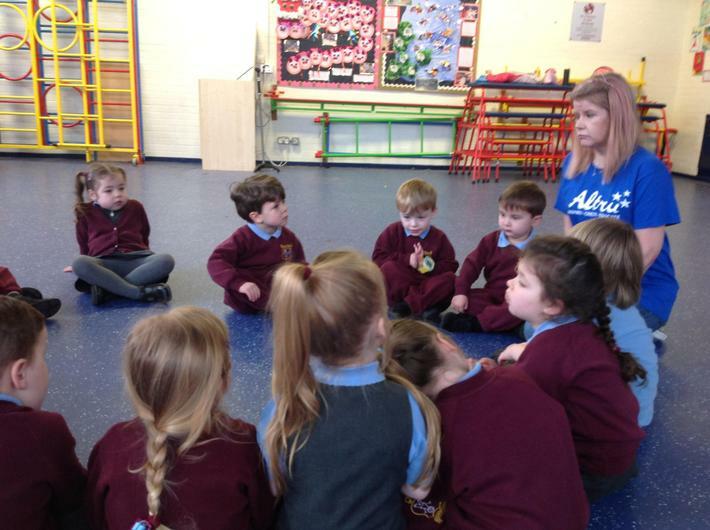 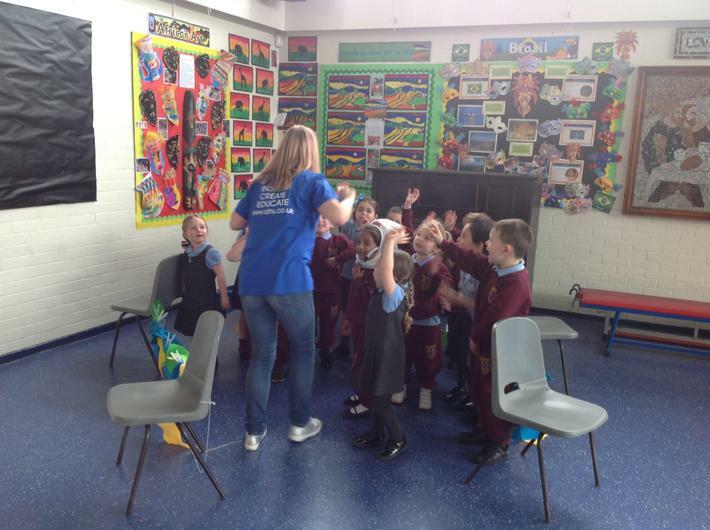 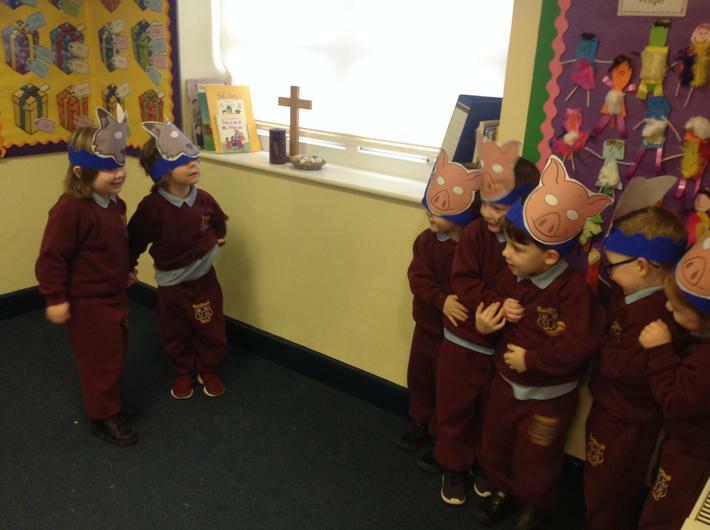 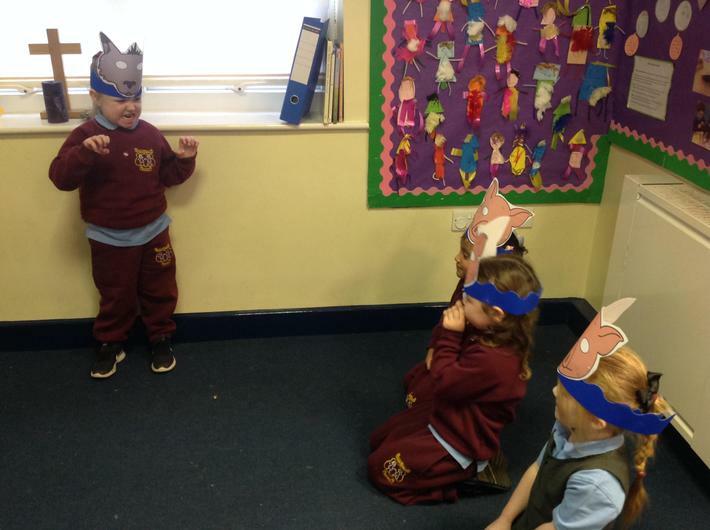 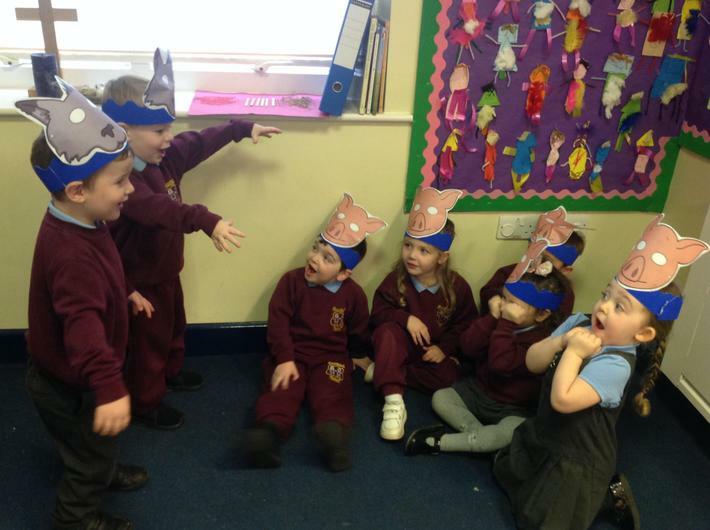 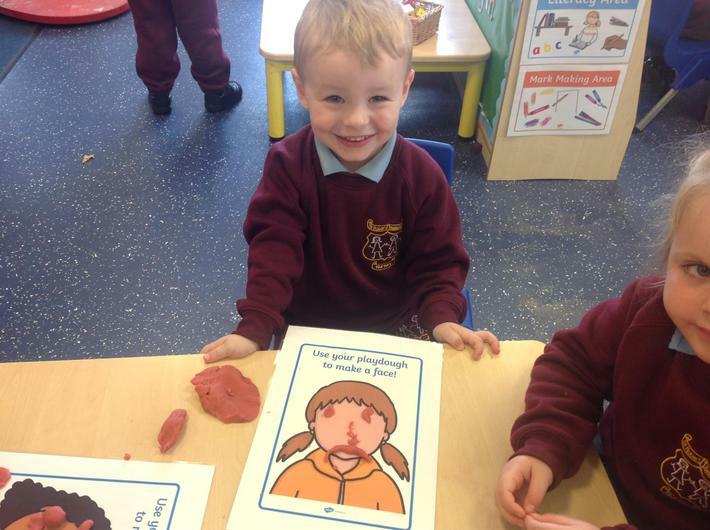 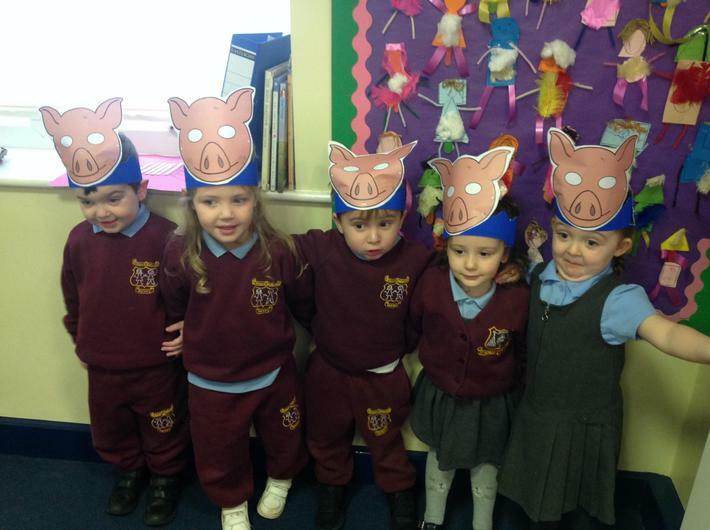 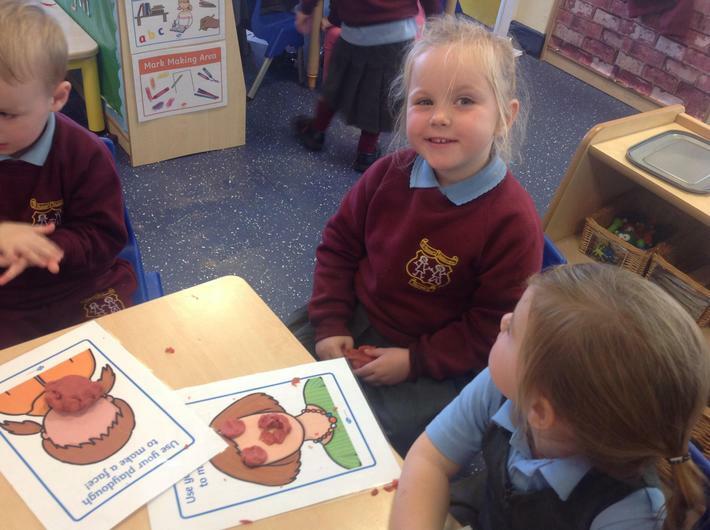 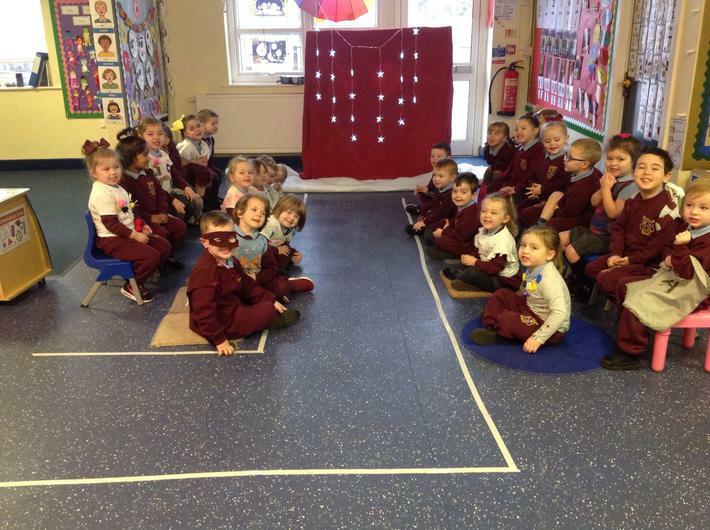 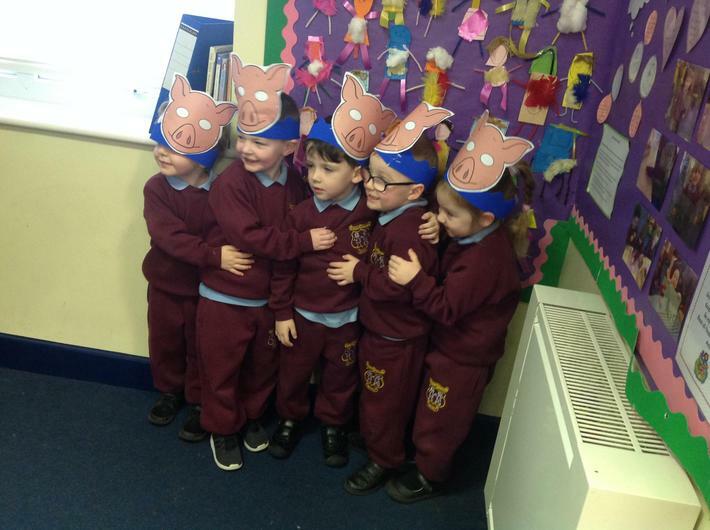 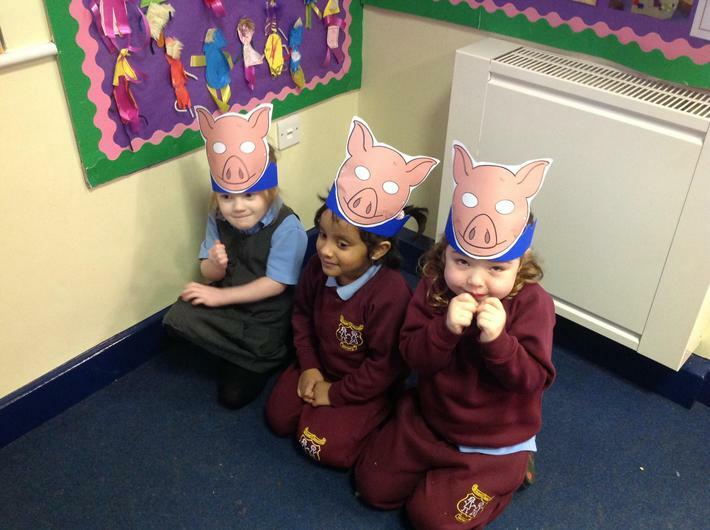 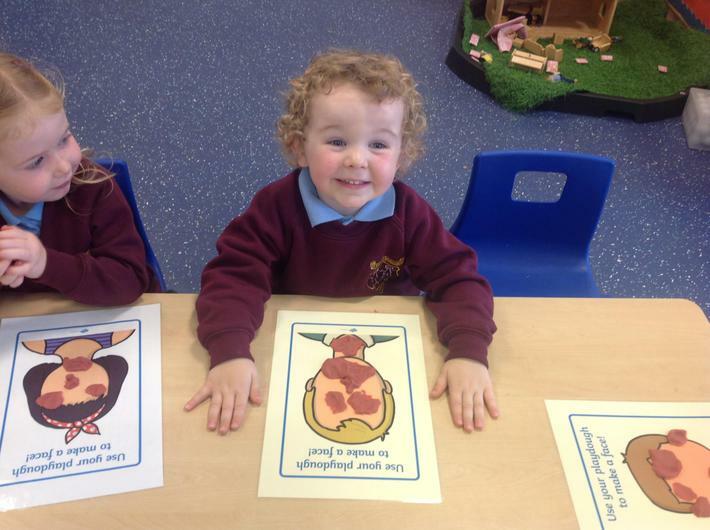 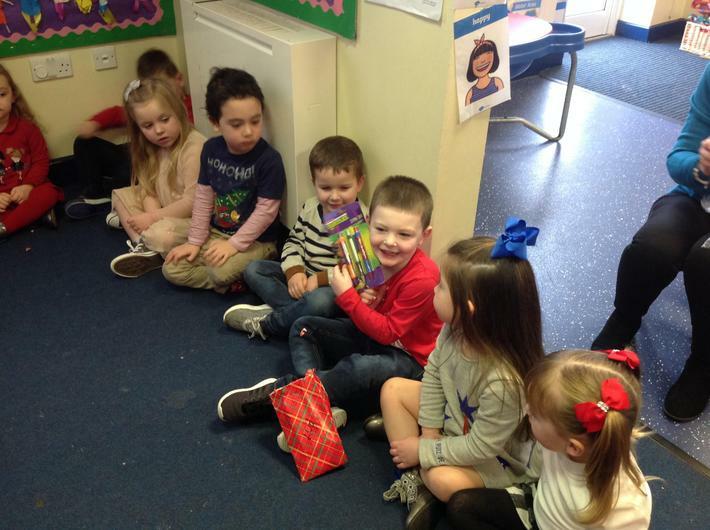 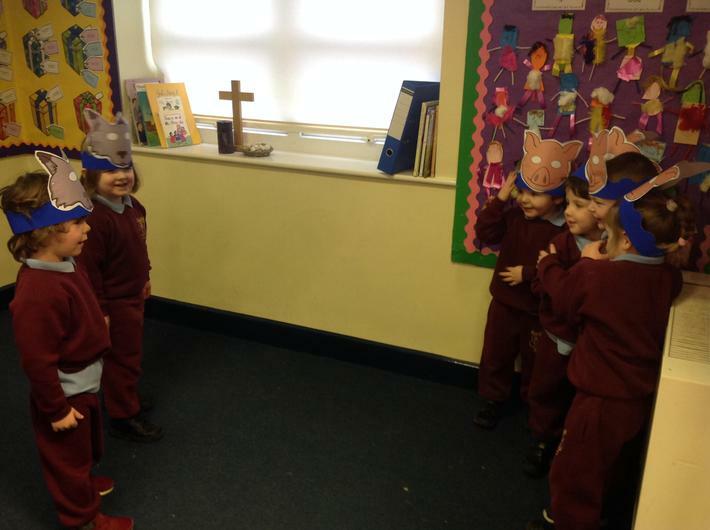 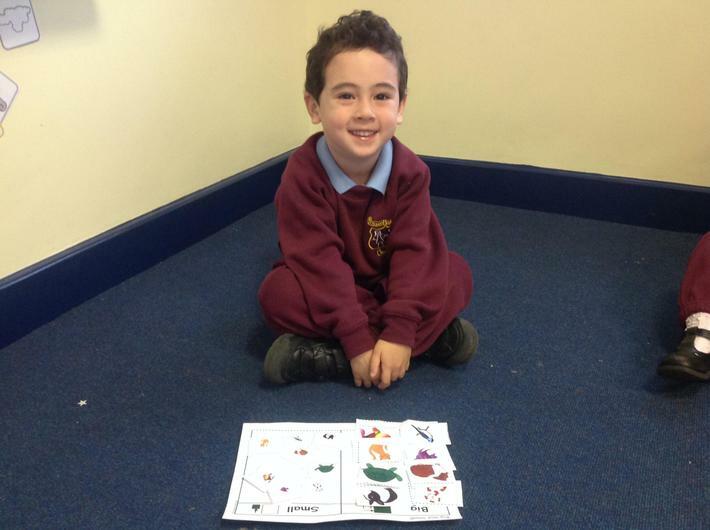 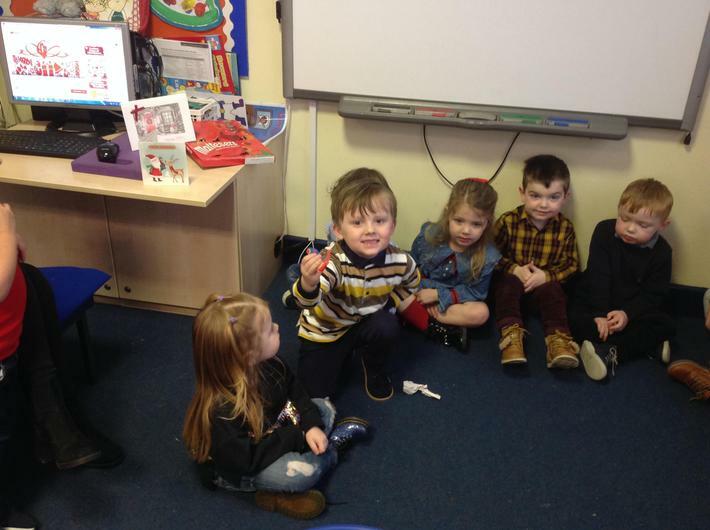 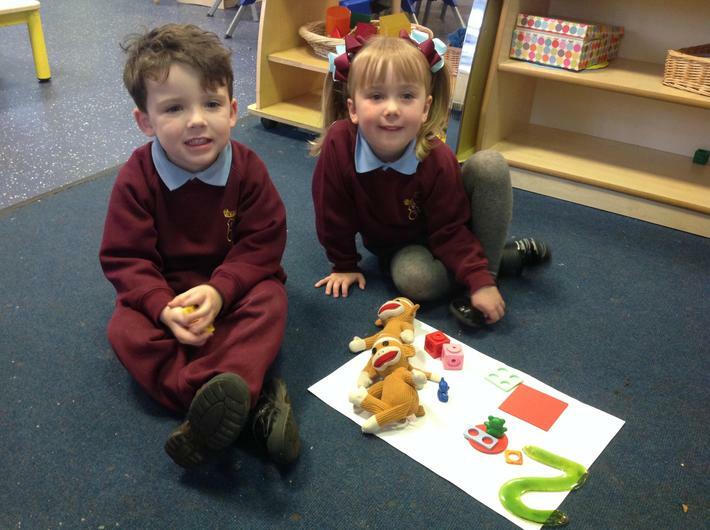 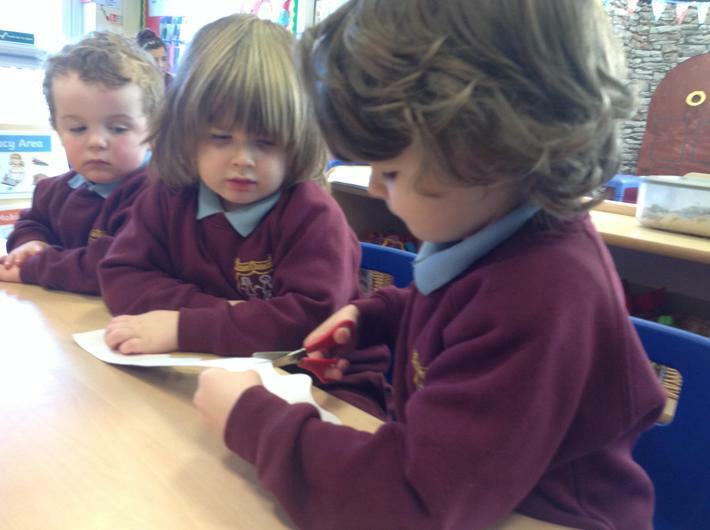 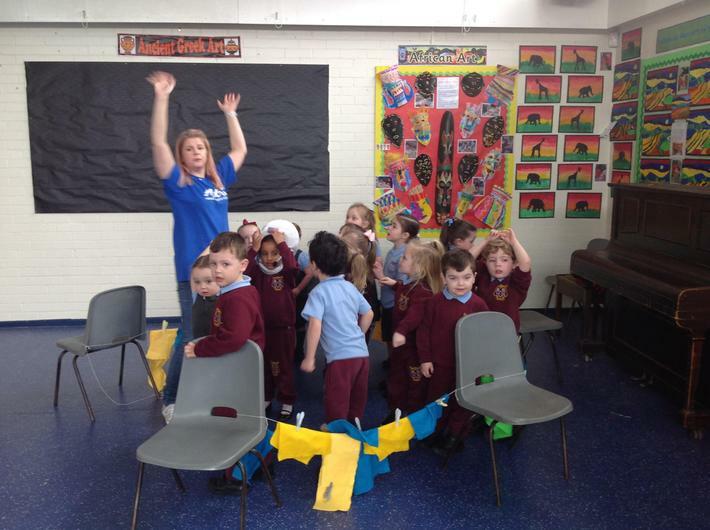 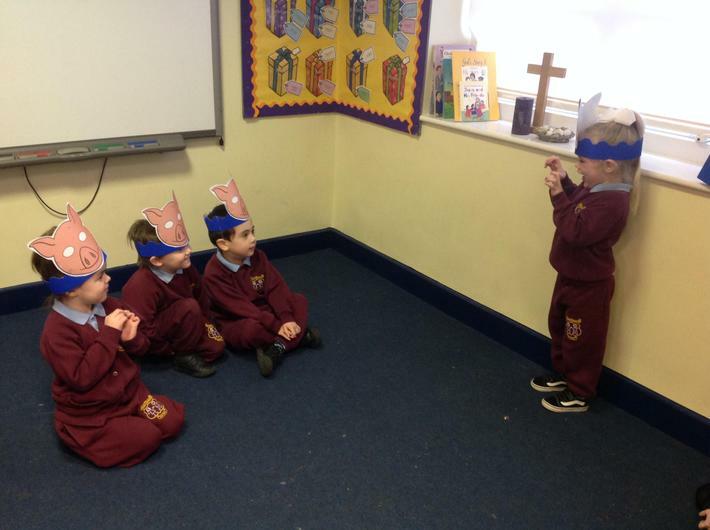 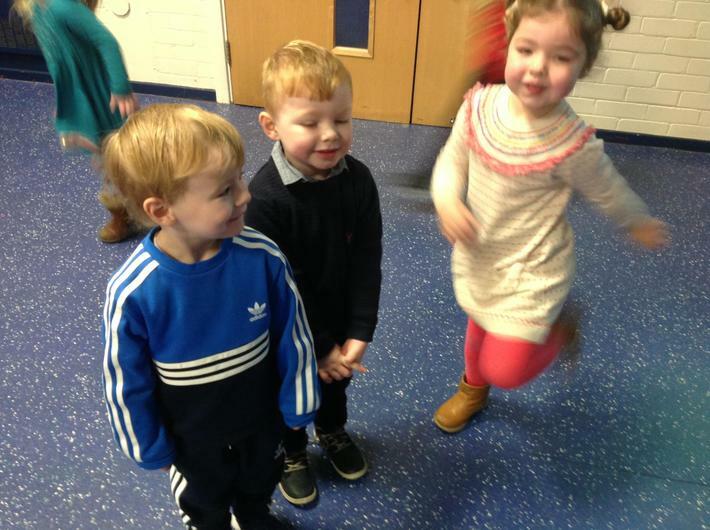 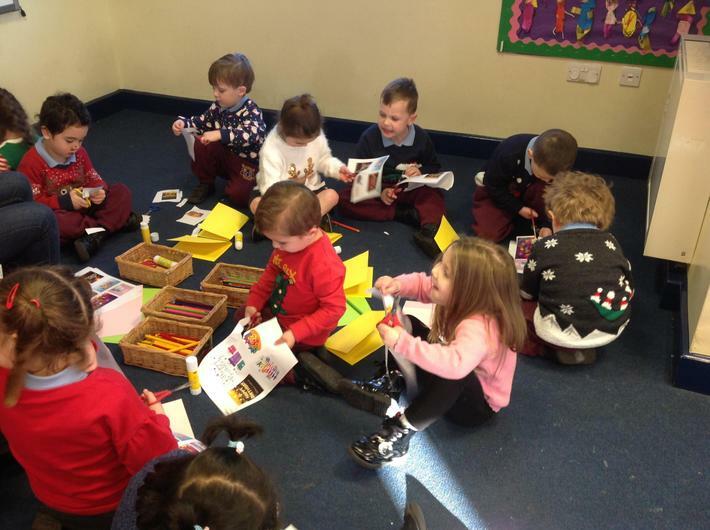 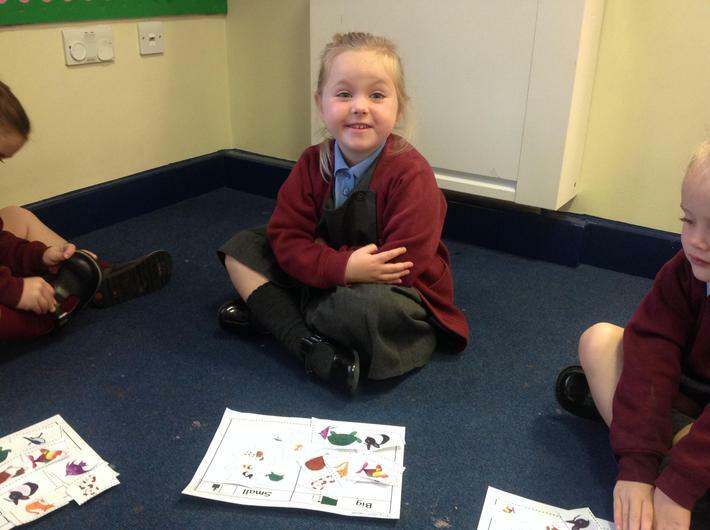 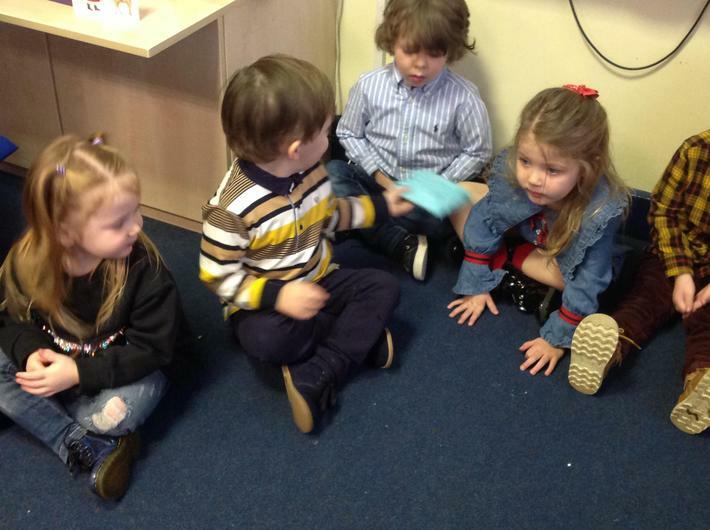 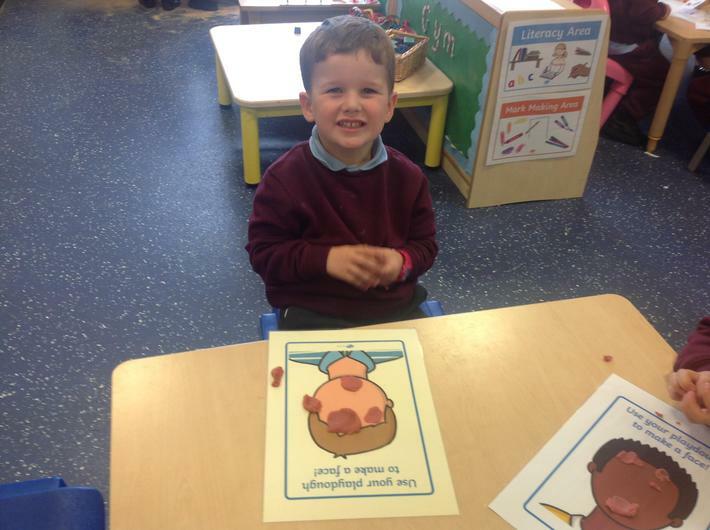 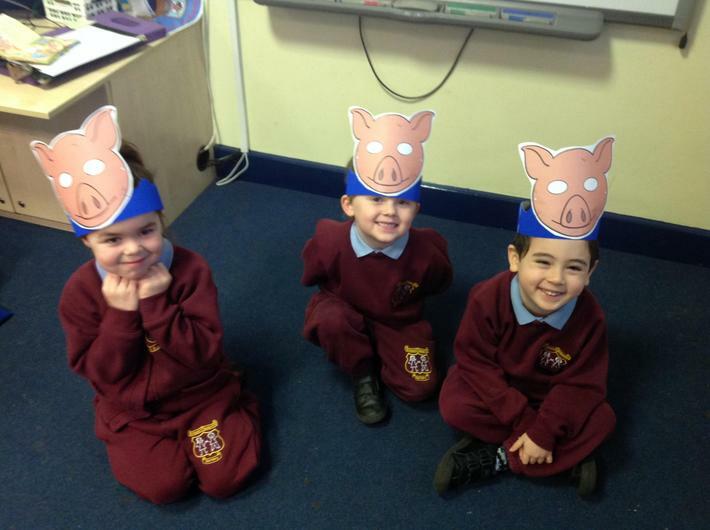 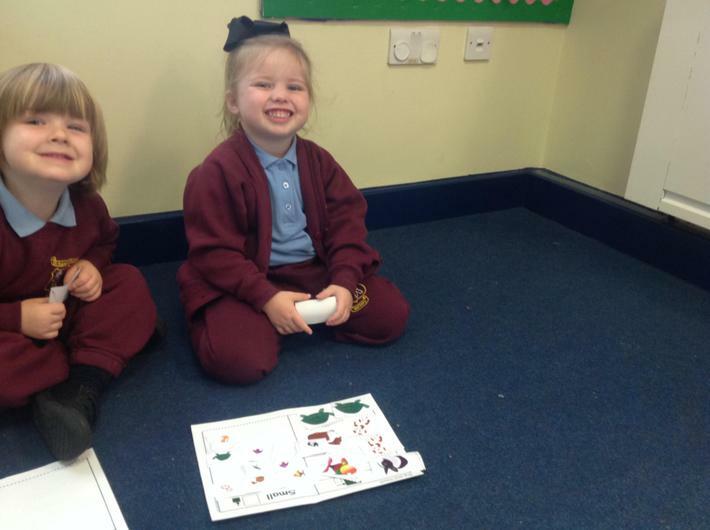 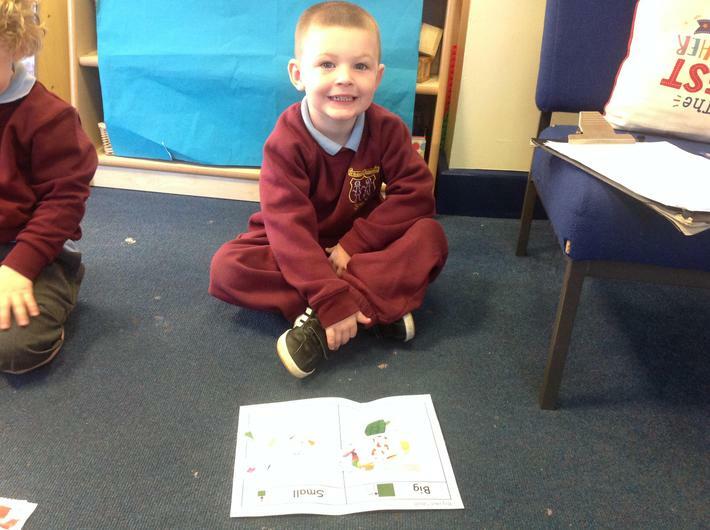 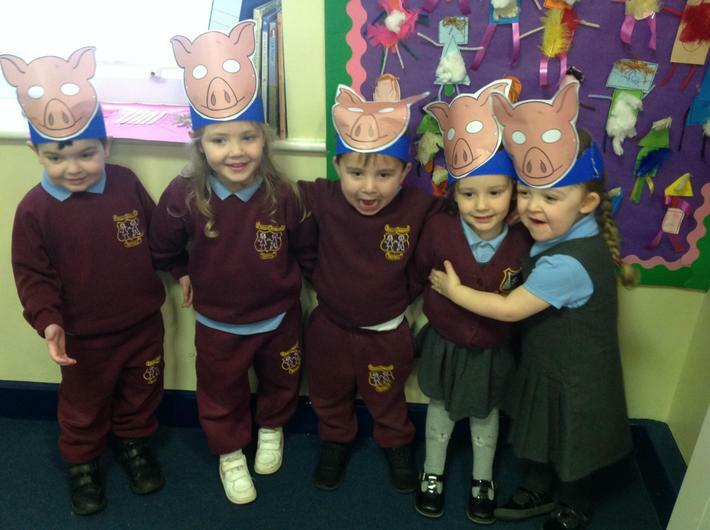 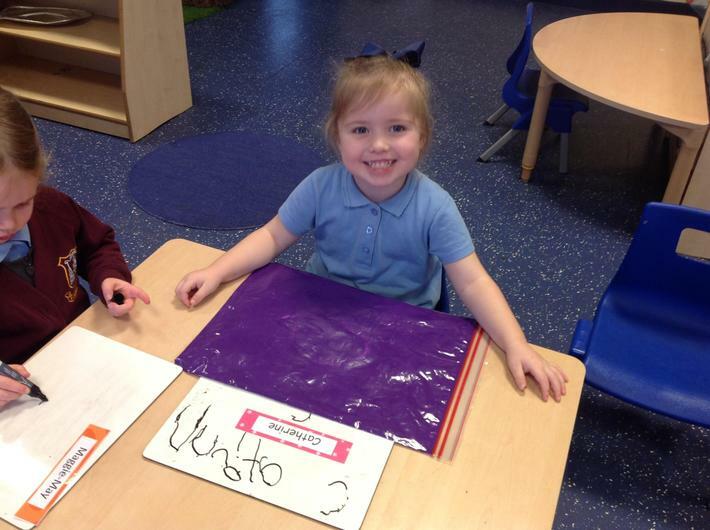 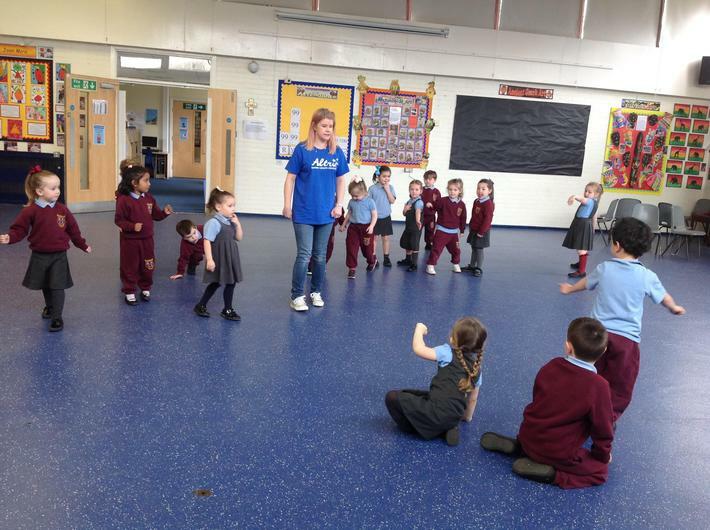 The class have really enjoyed reading the 'Three Little Pigs' and became particularly animated during the role-play! 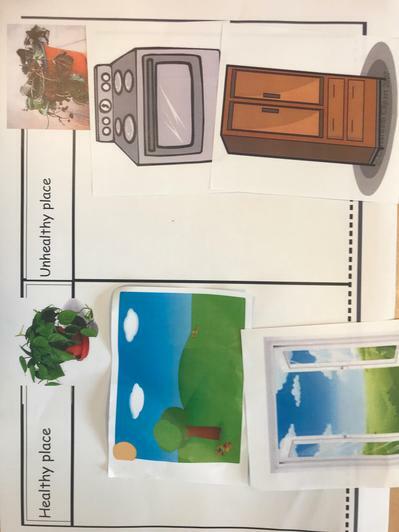 This helped them to consider how the characters may have felt at different points in the story and begin to use time language to order the main events. 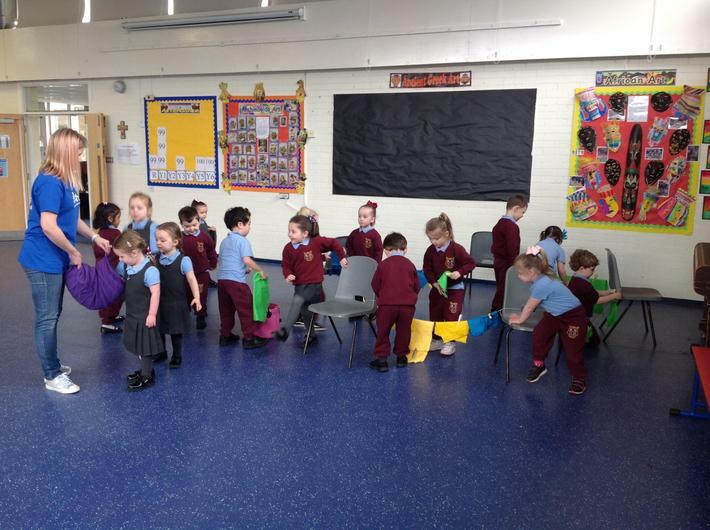 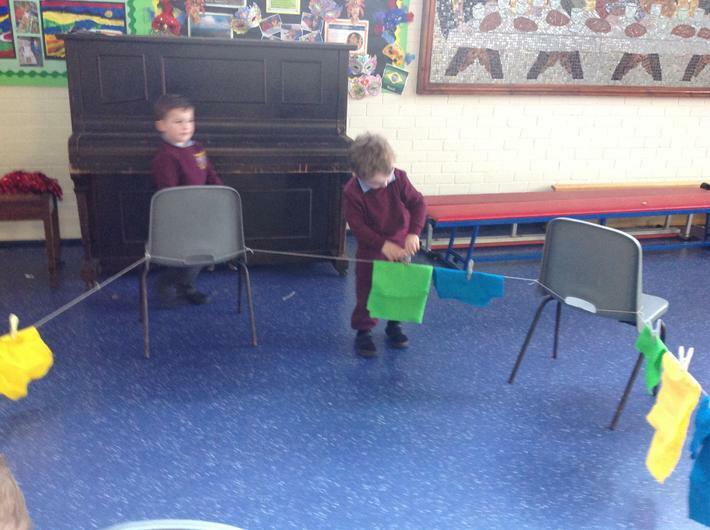 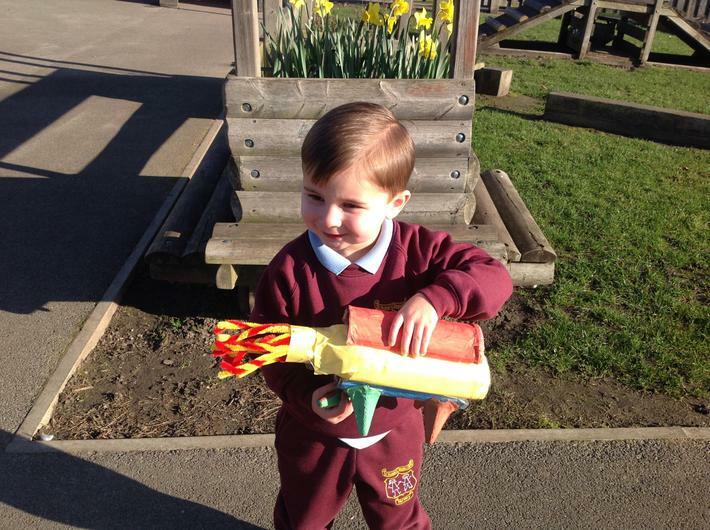 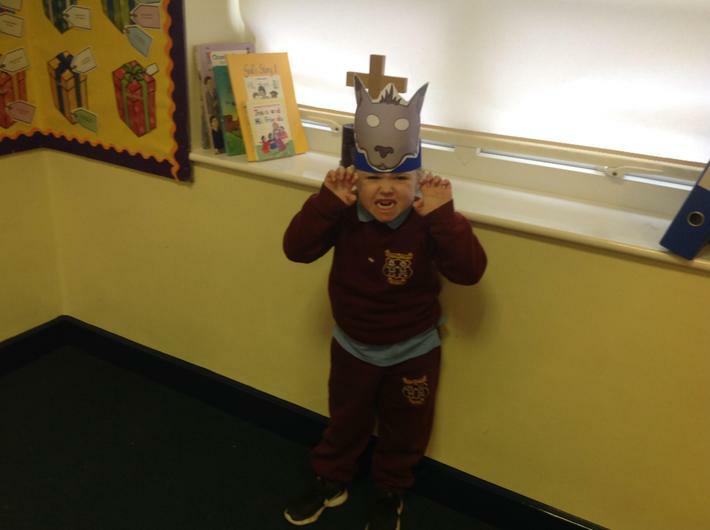 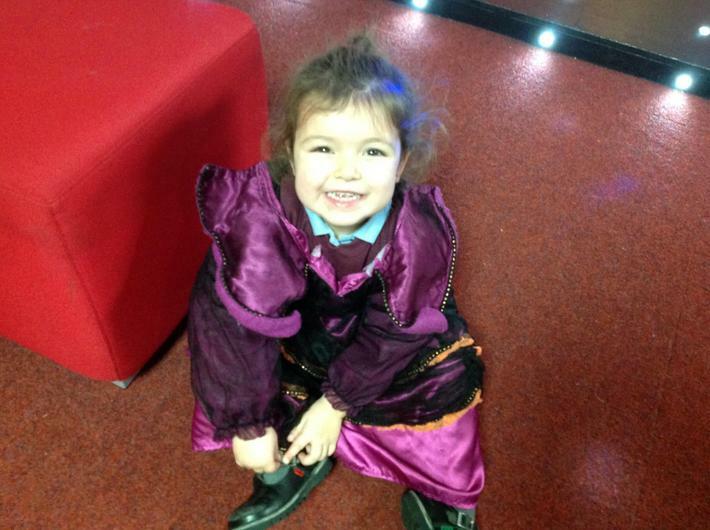 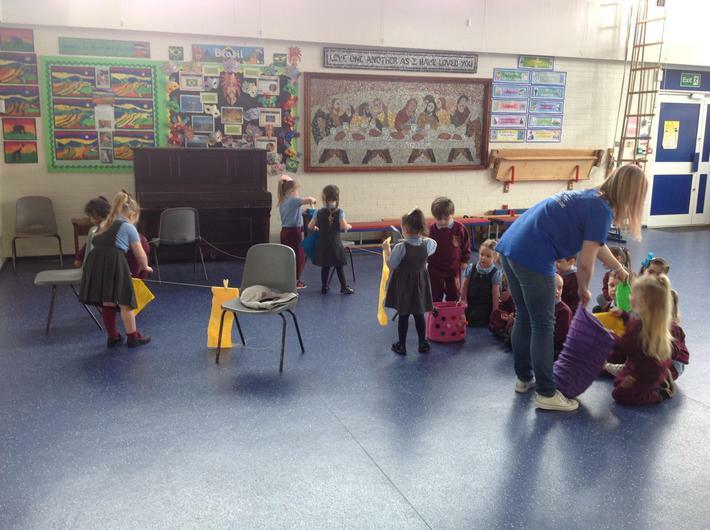 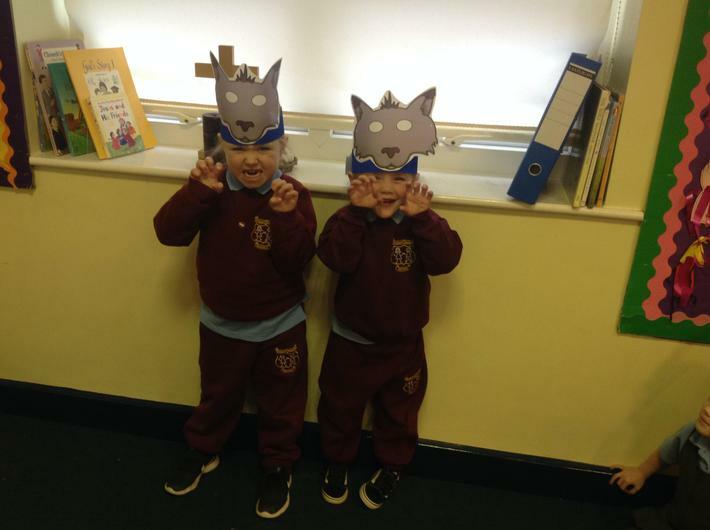 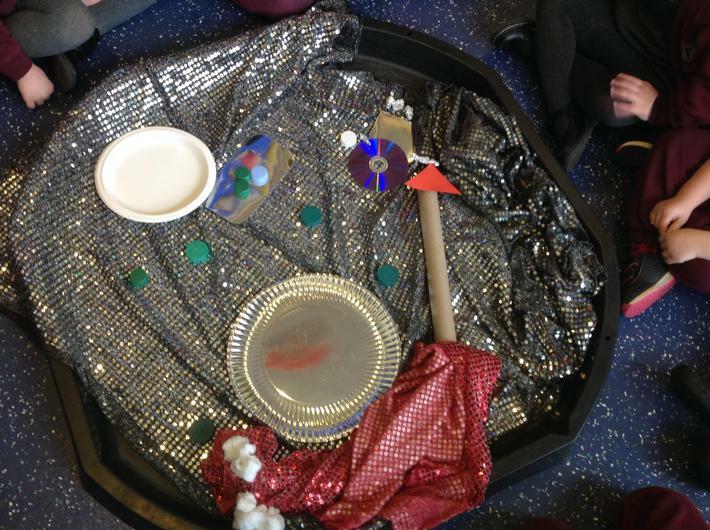 Today we became the Big Bad Wolf as we tested a range of objects to see if they would blow away or stay in one place. 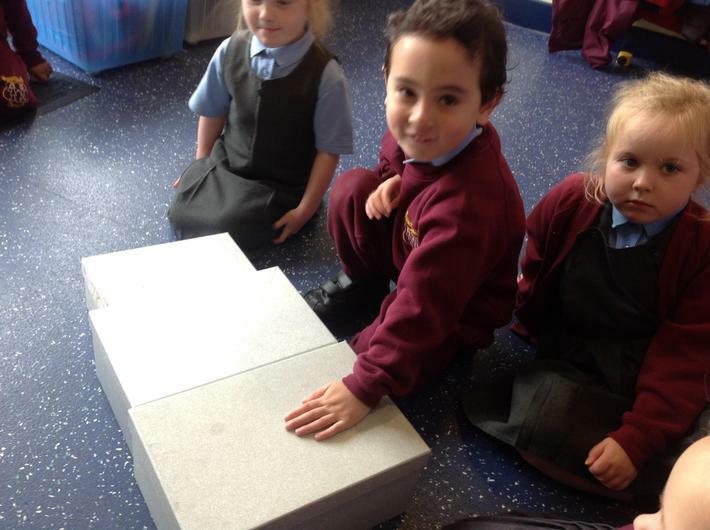 We also began to think about why this happened by considering what type of materials stayed in the same place. 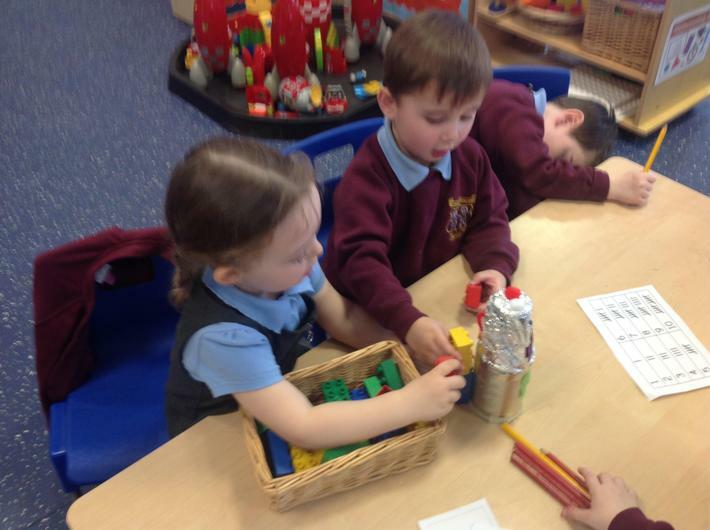 We found out the that heavy materials did not move and the lighter ones did. 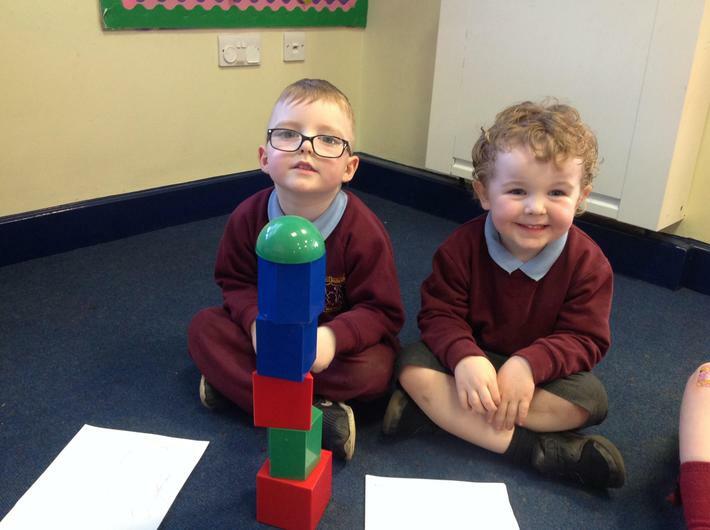 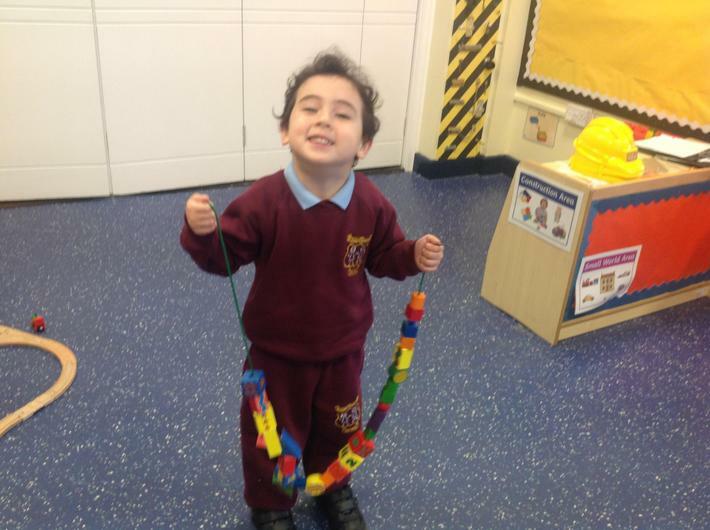 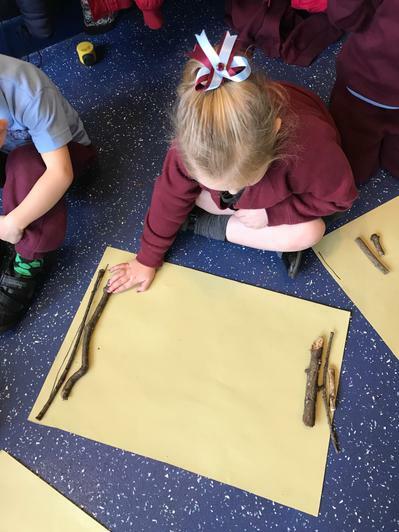 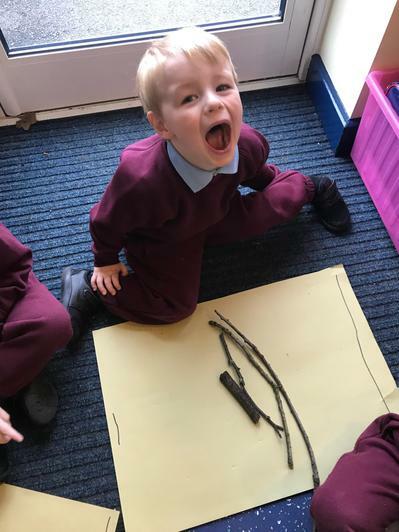 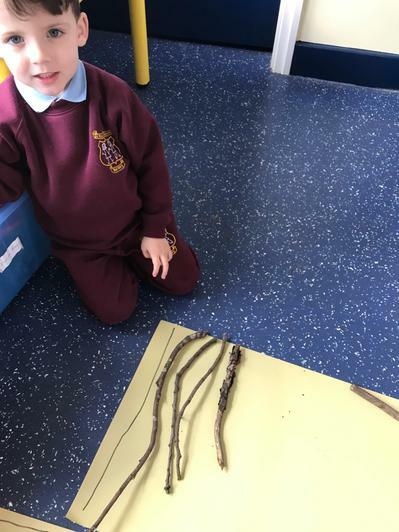 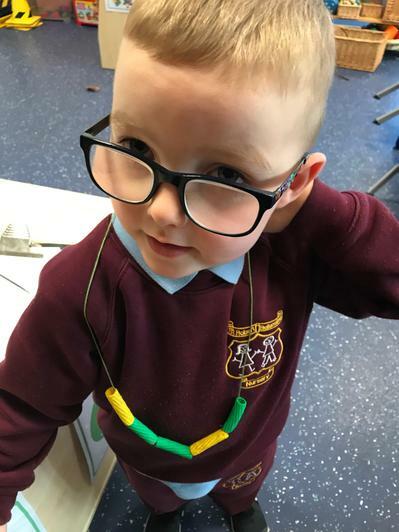 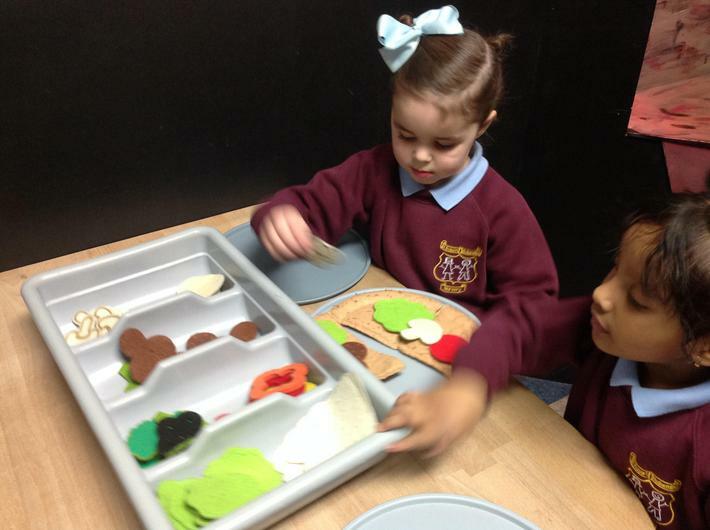 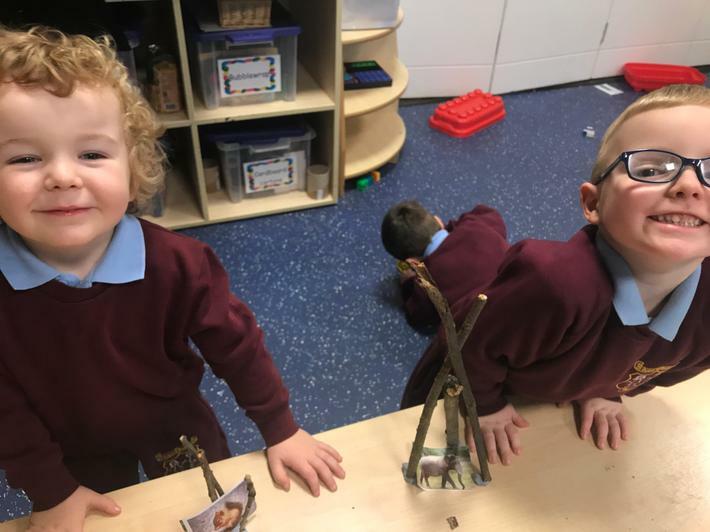 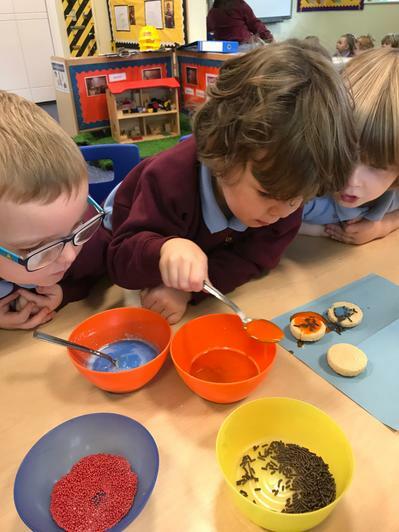 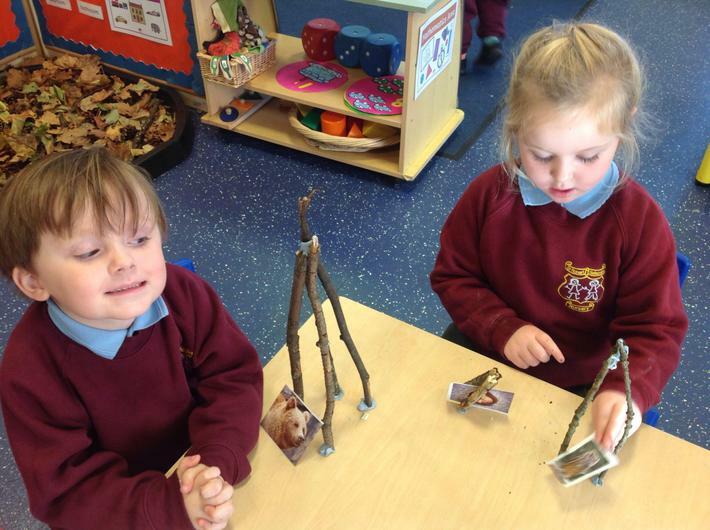 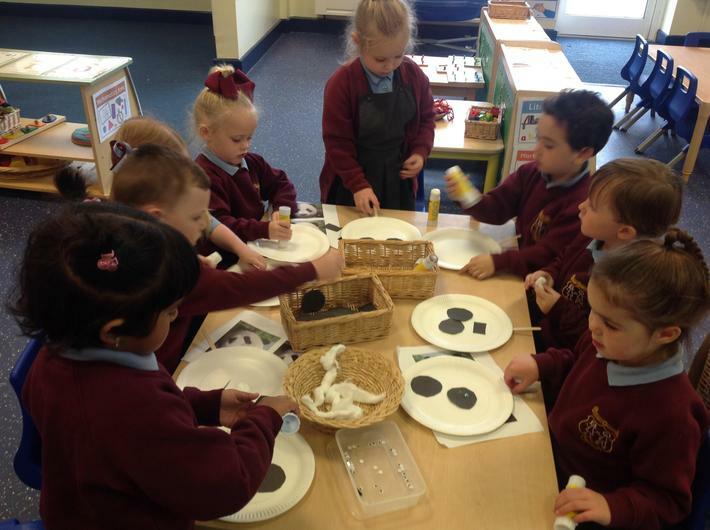 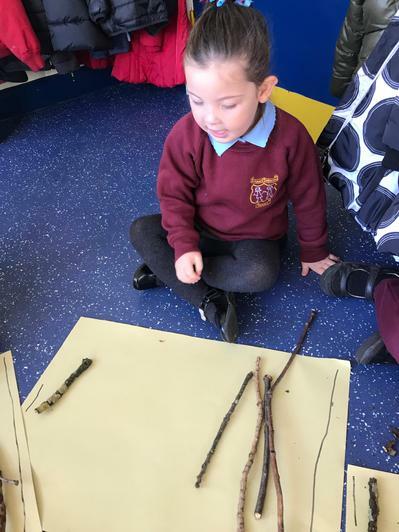 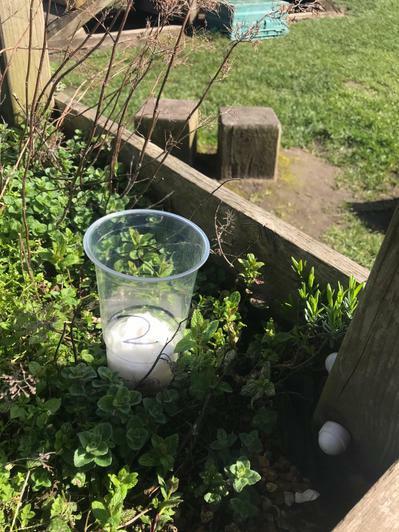 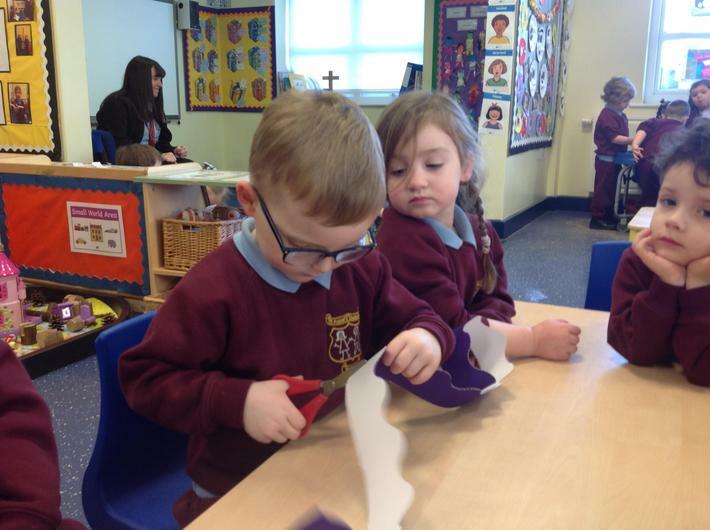 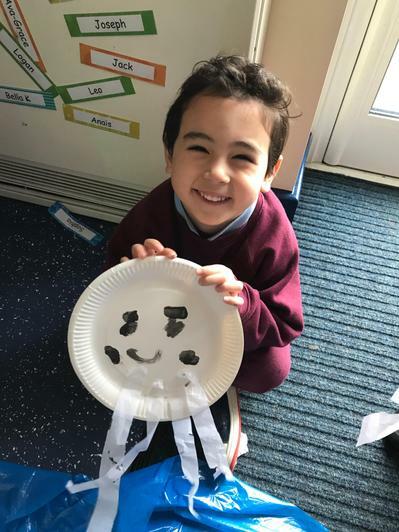 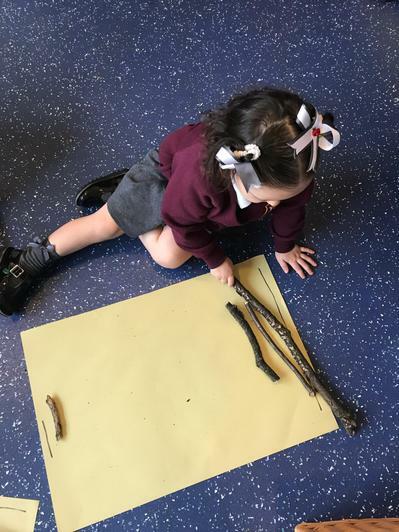 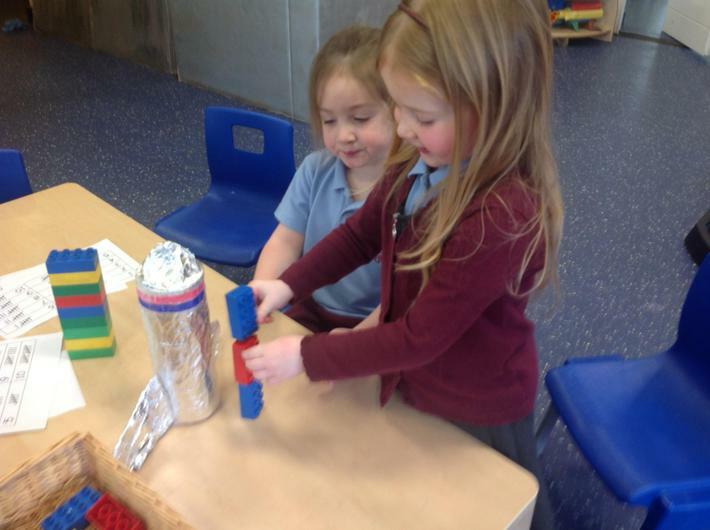 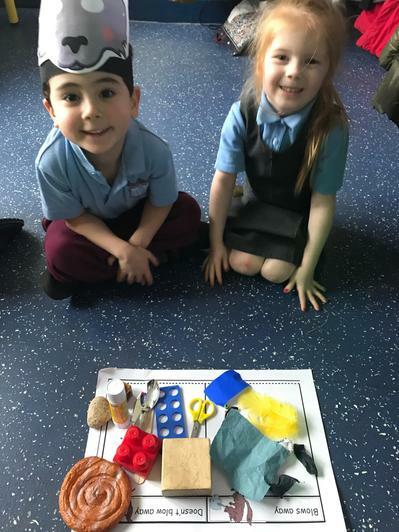 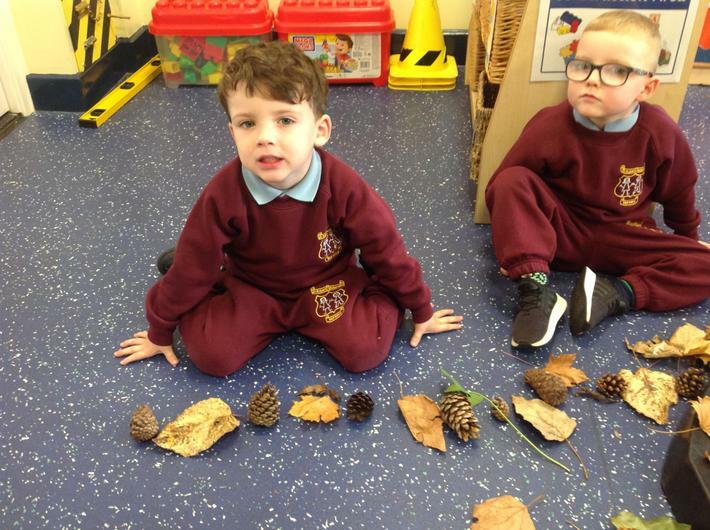 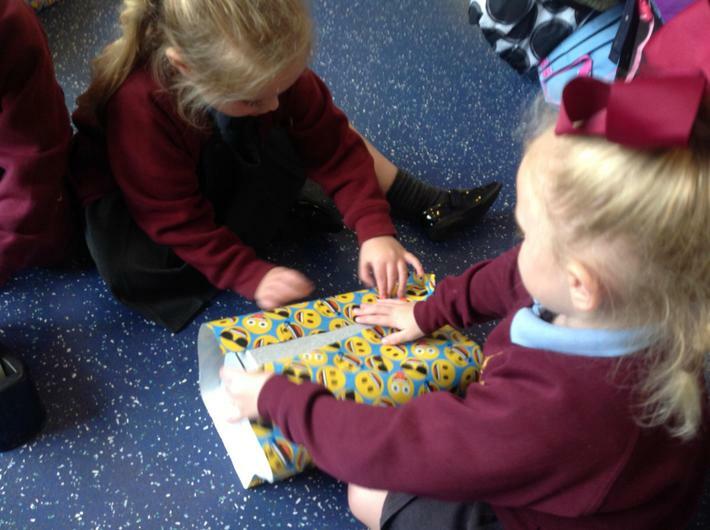 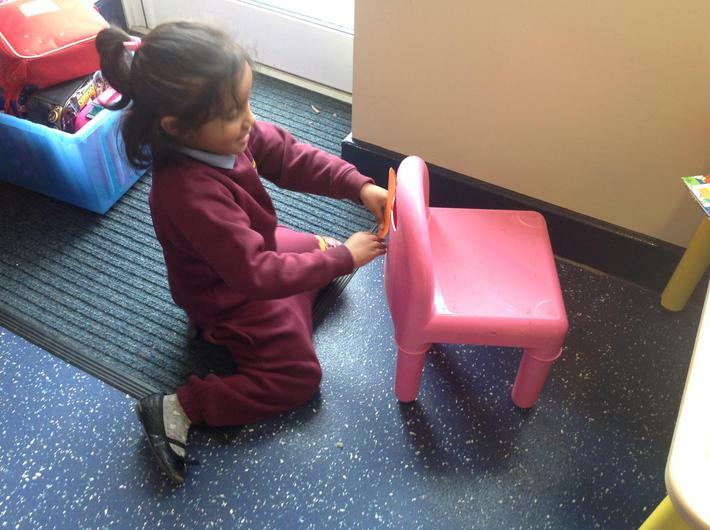 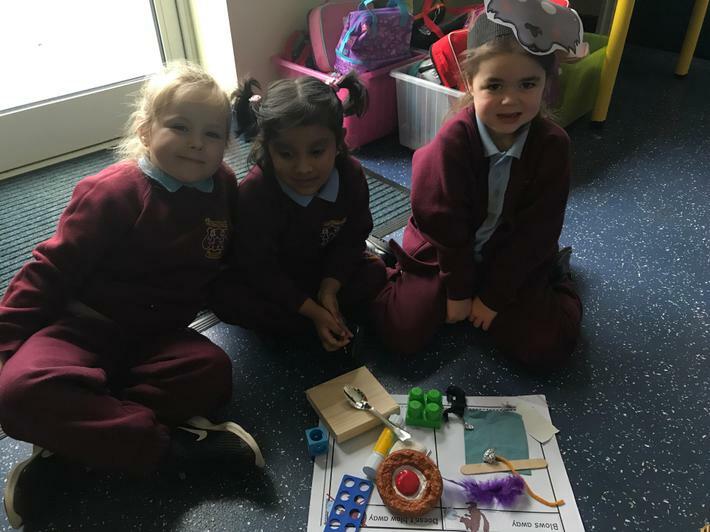 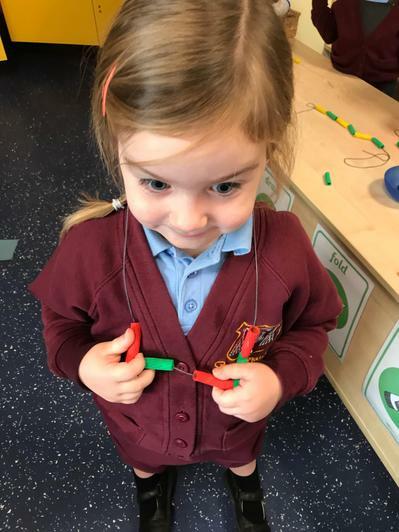 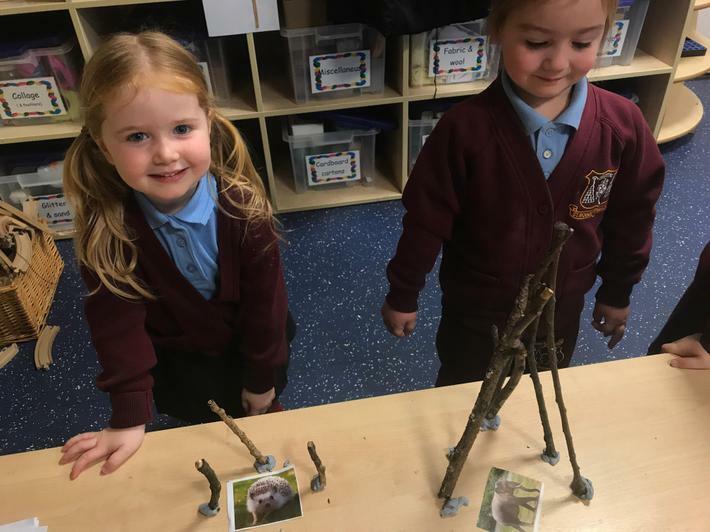 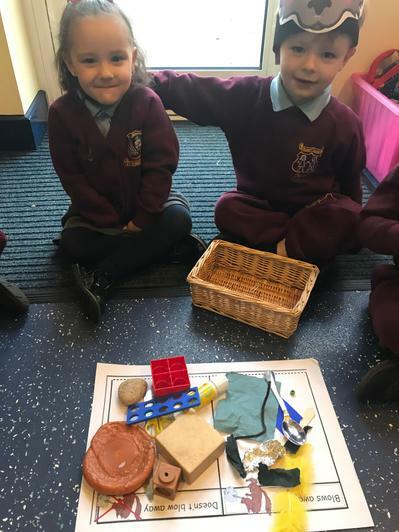 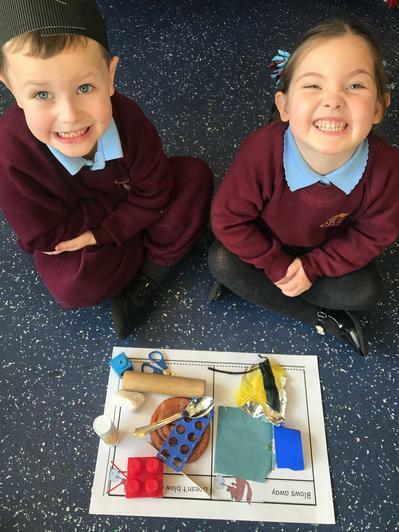 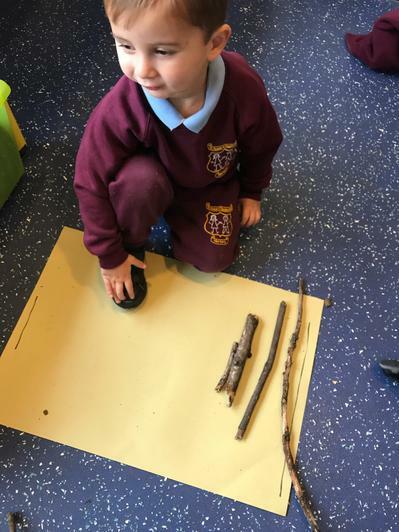 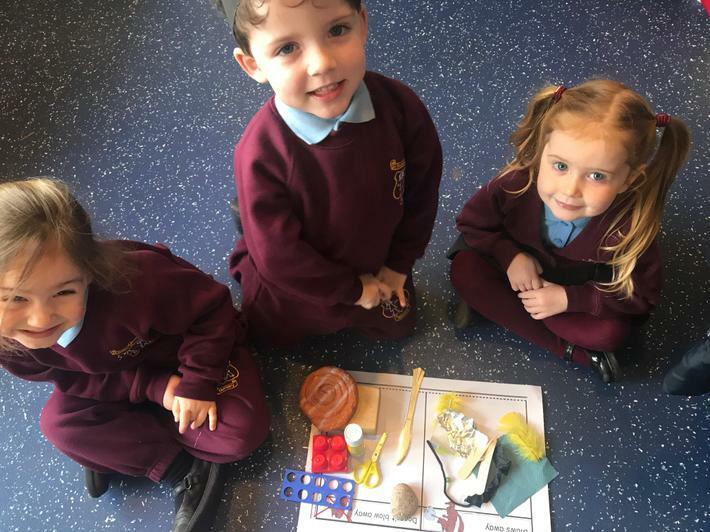 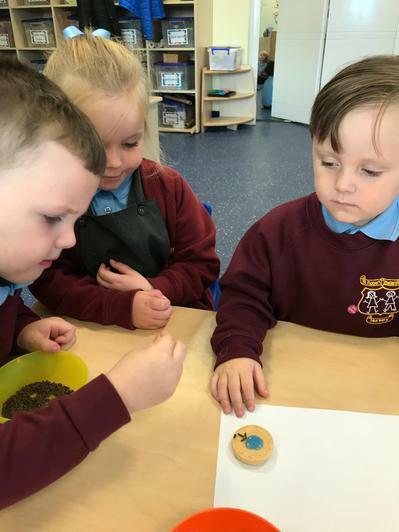 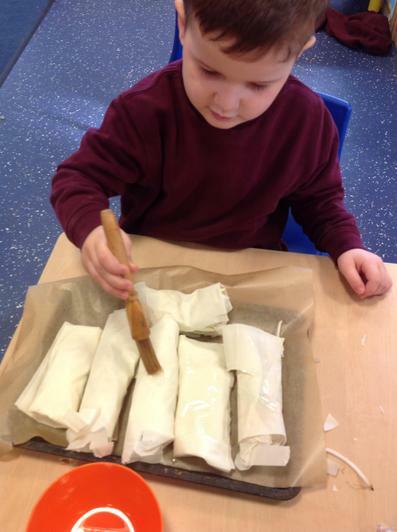 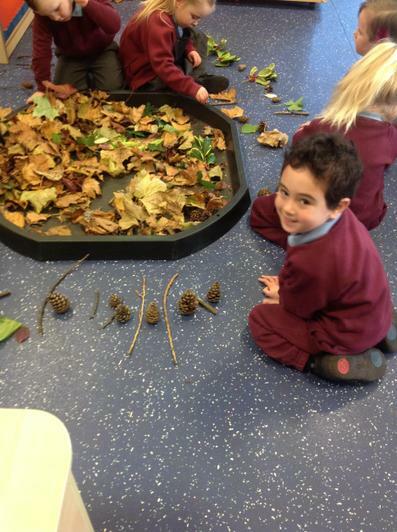 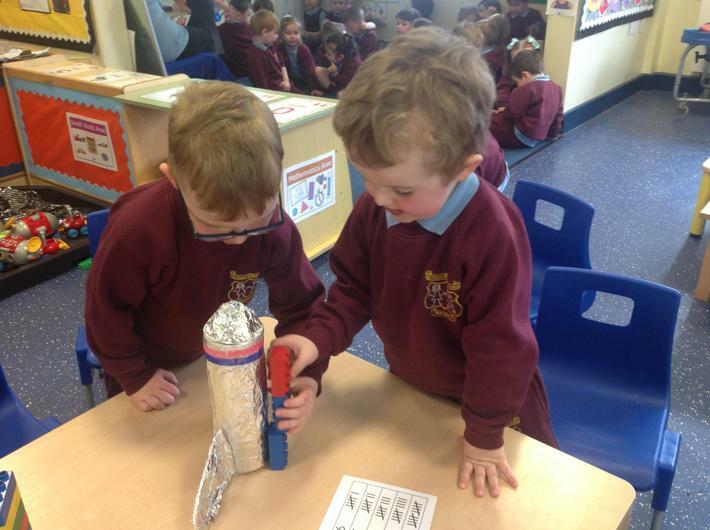 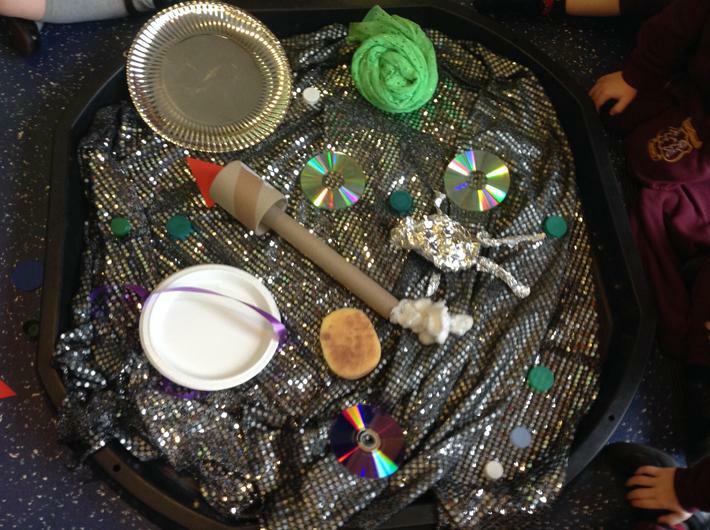 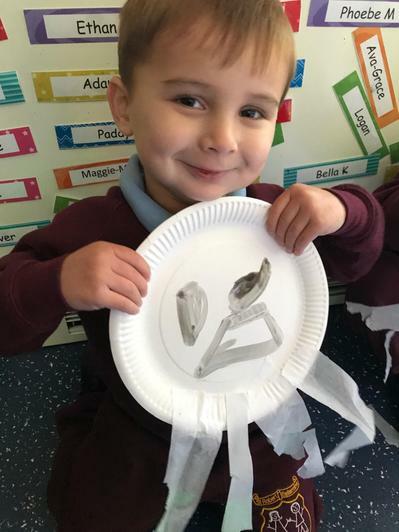 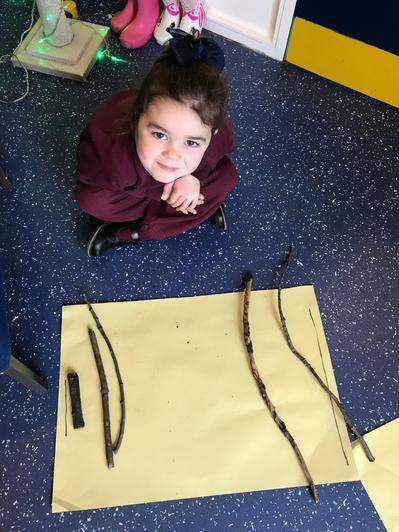 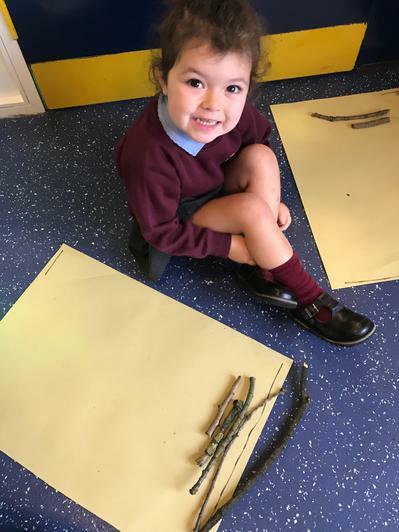 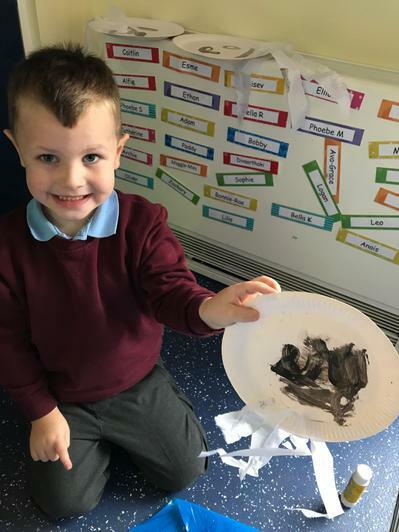 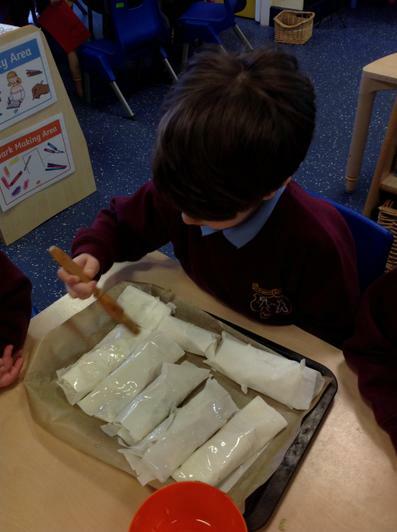 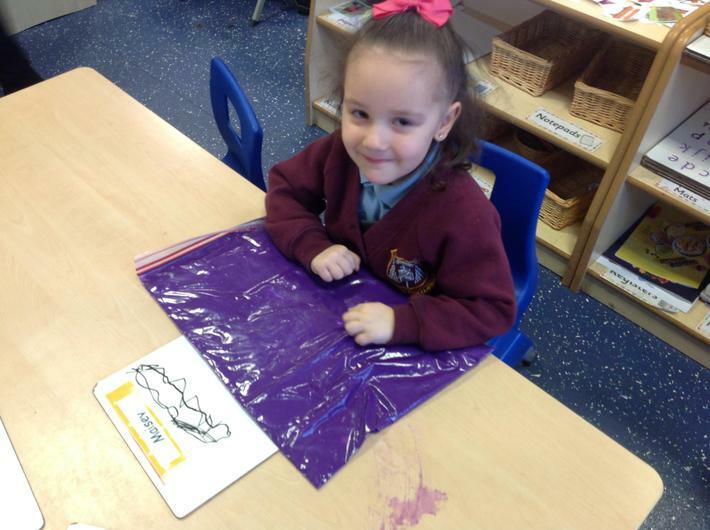 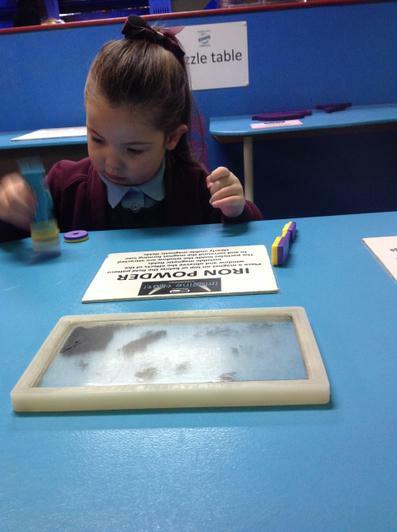 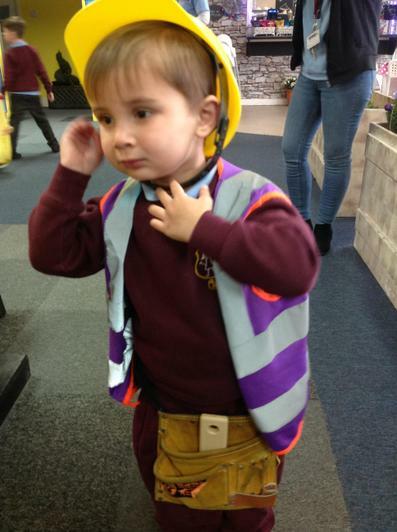 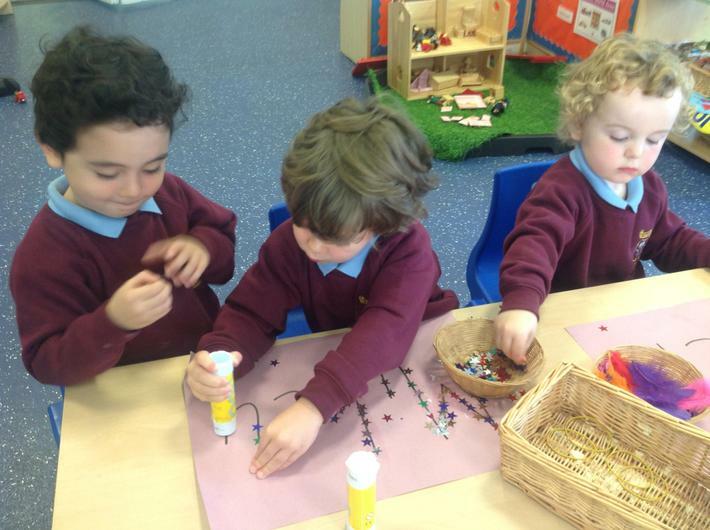 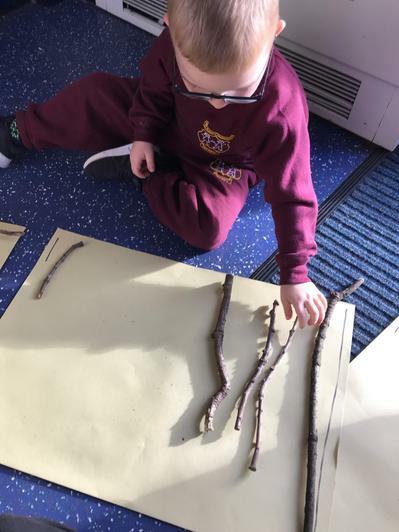 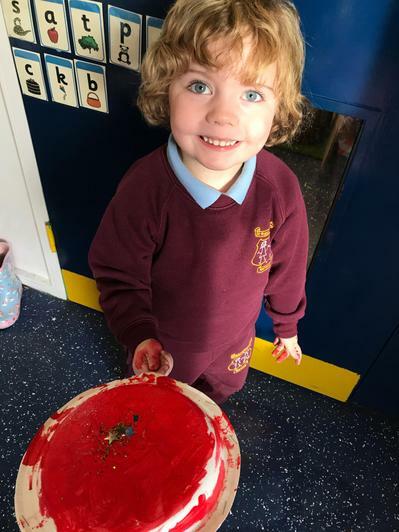 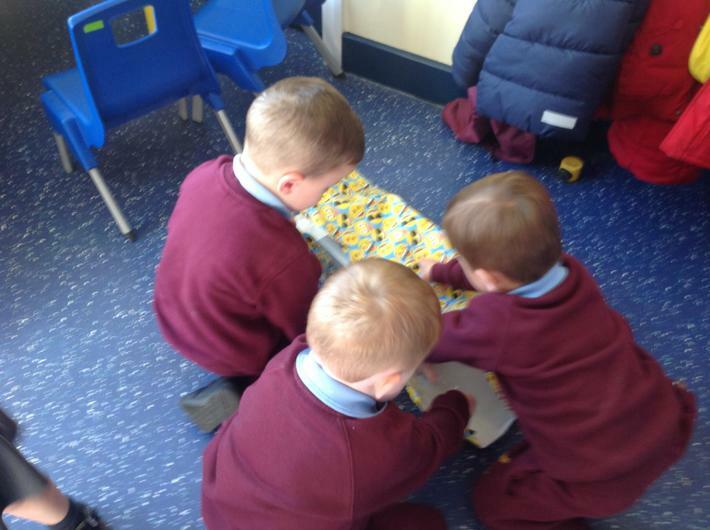 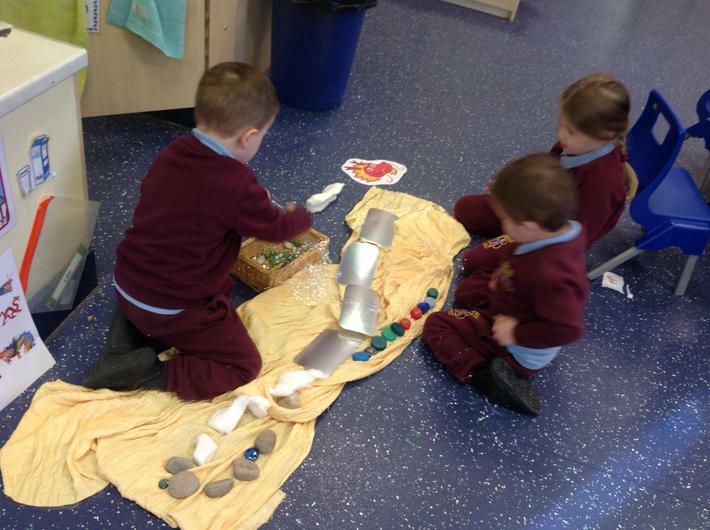 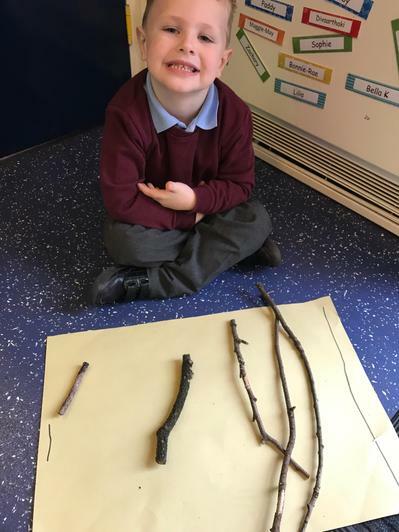 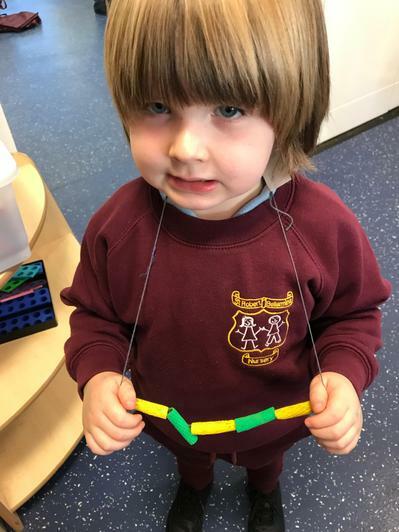 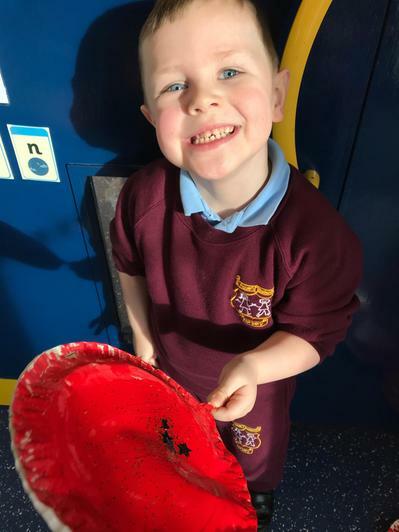 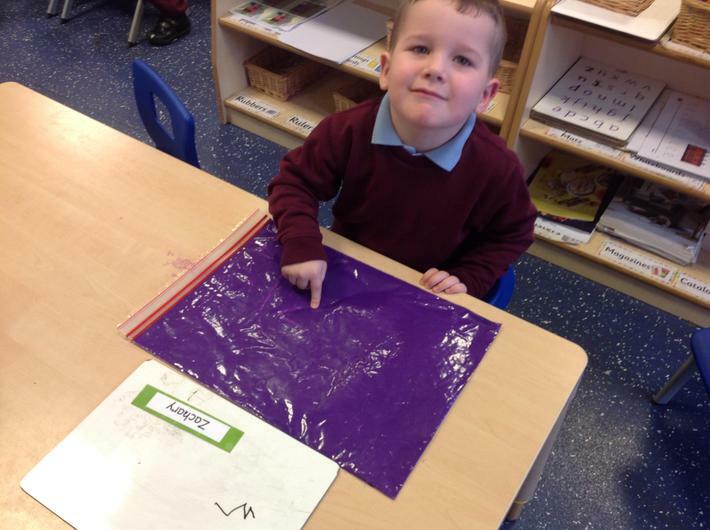 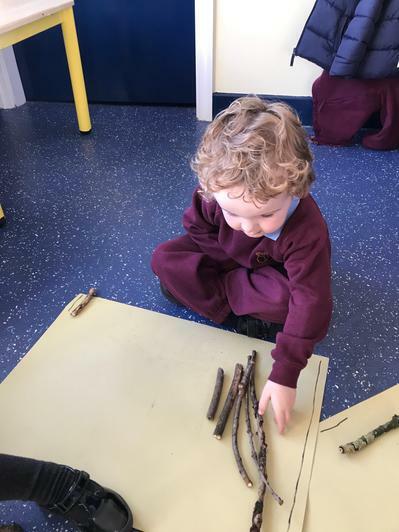 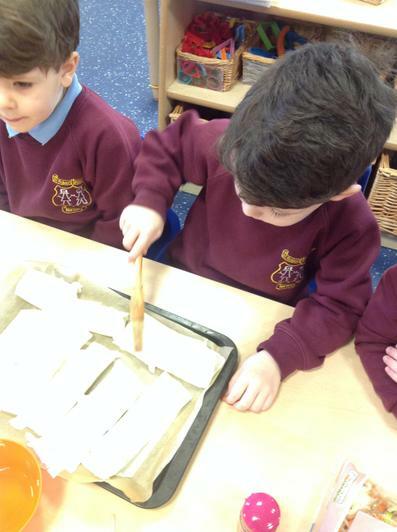 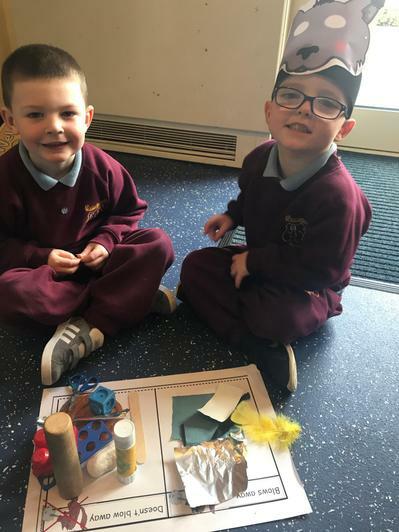 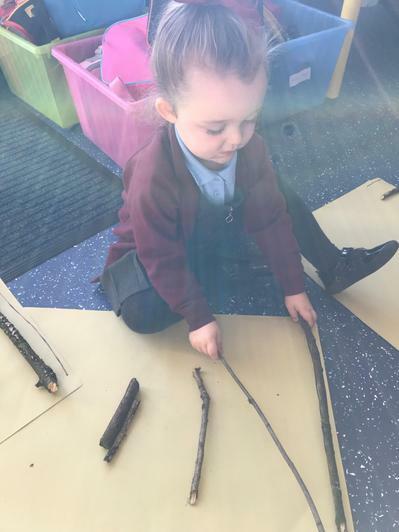 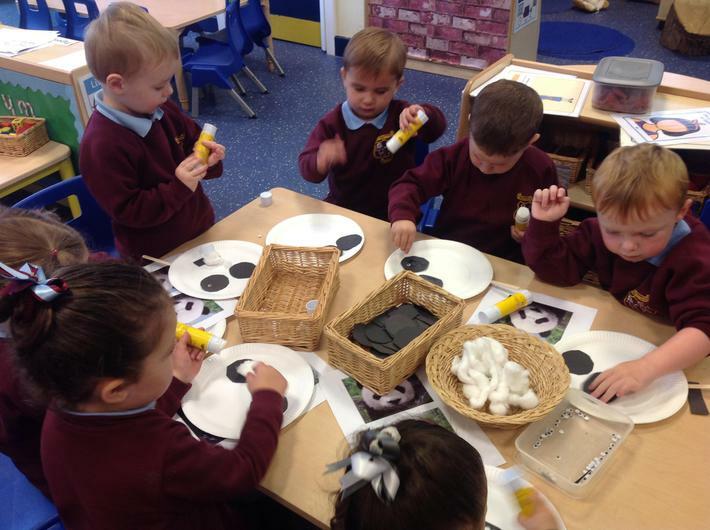 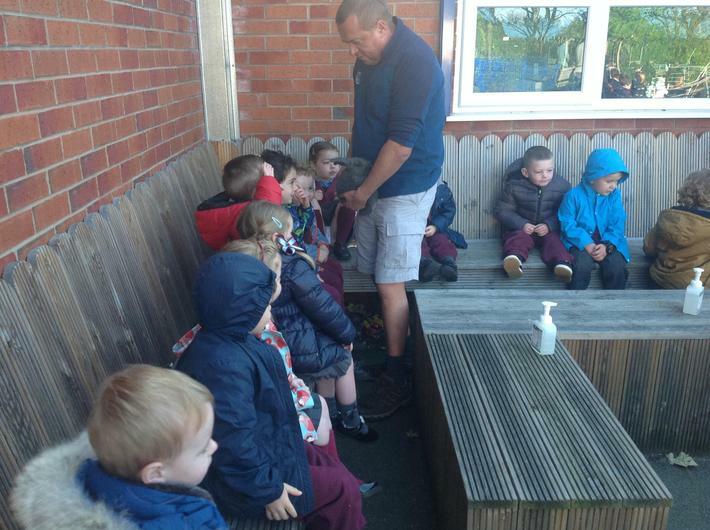 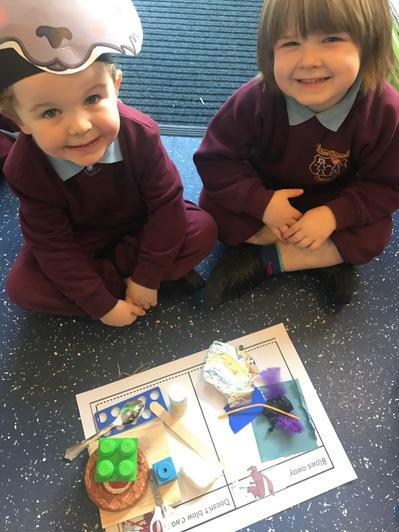 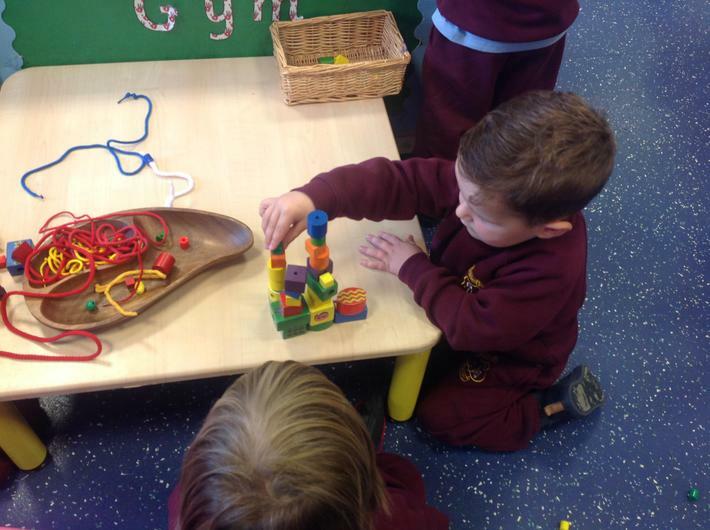 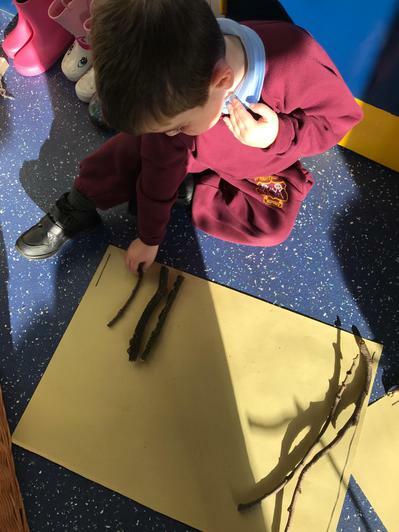 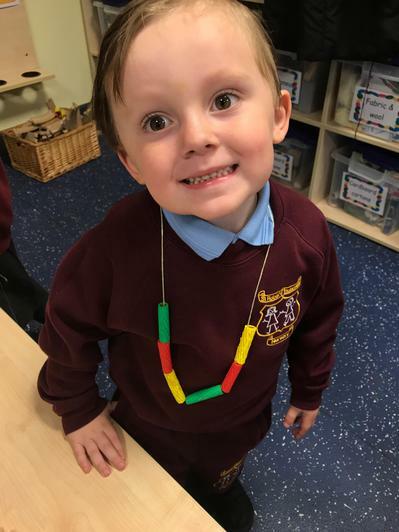 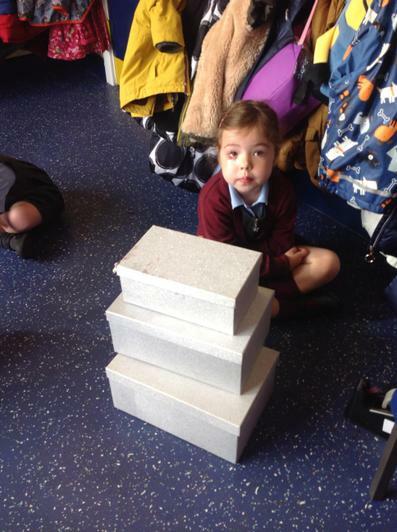 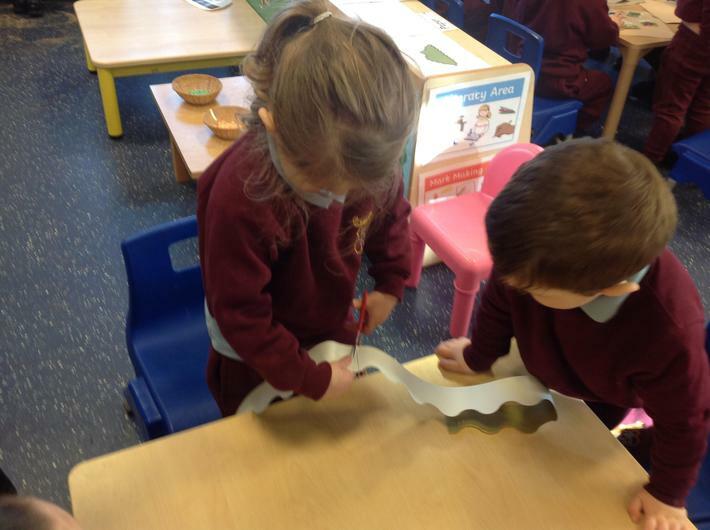 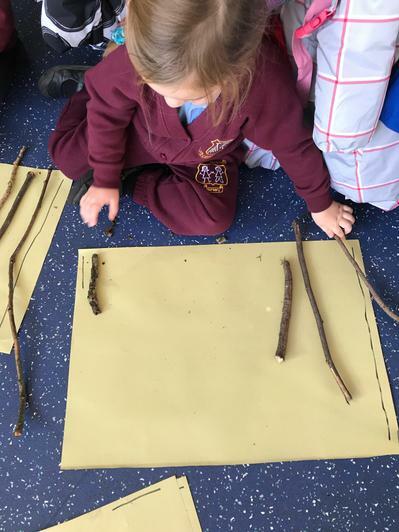 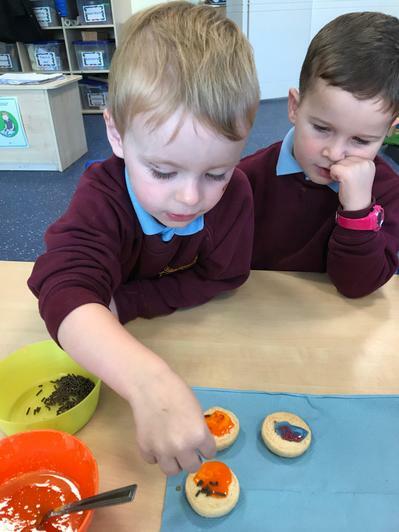 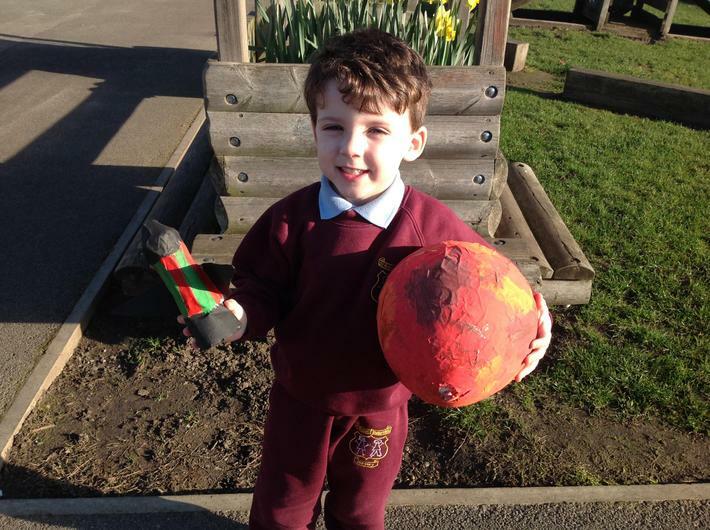 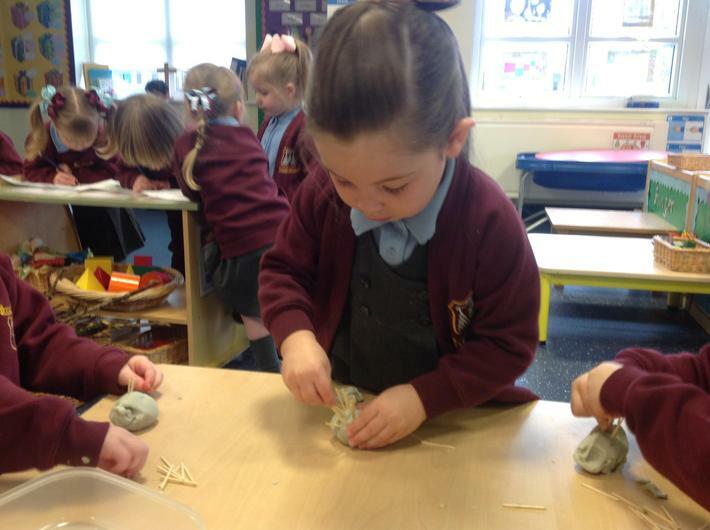 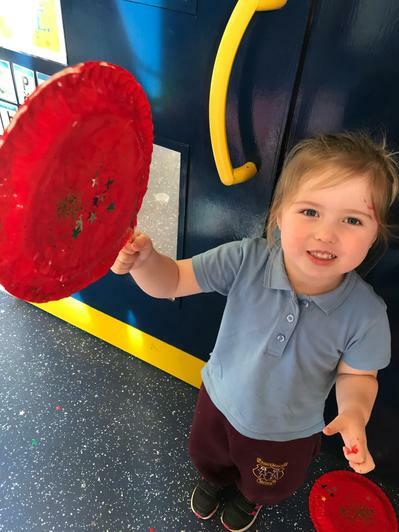 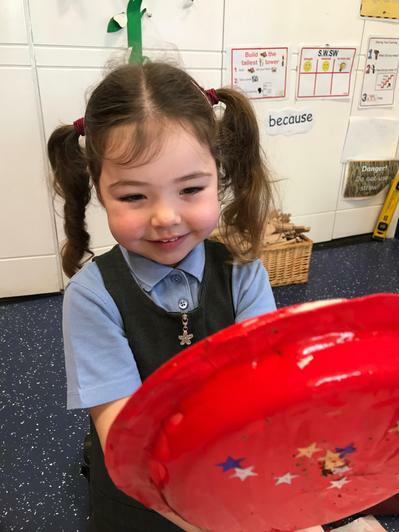 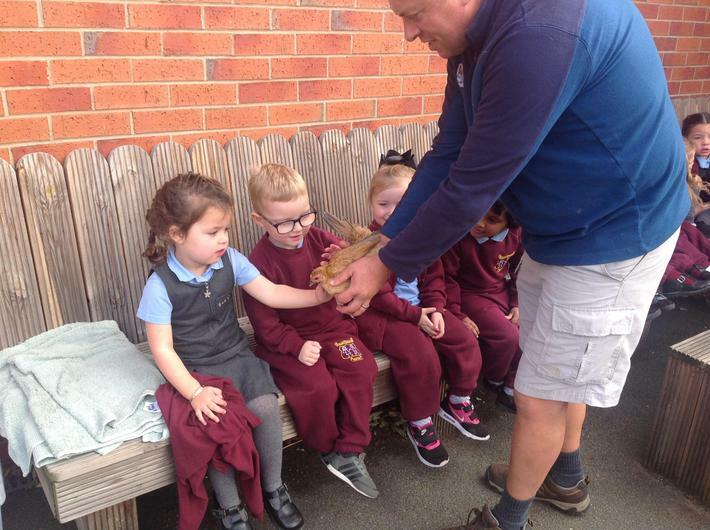 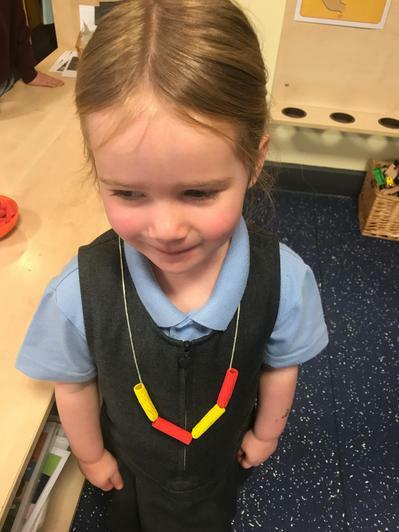 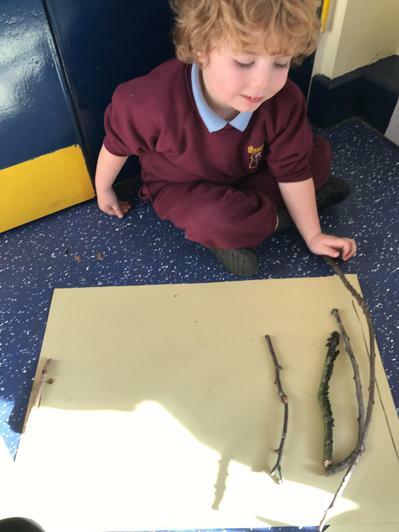 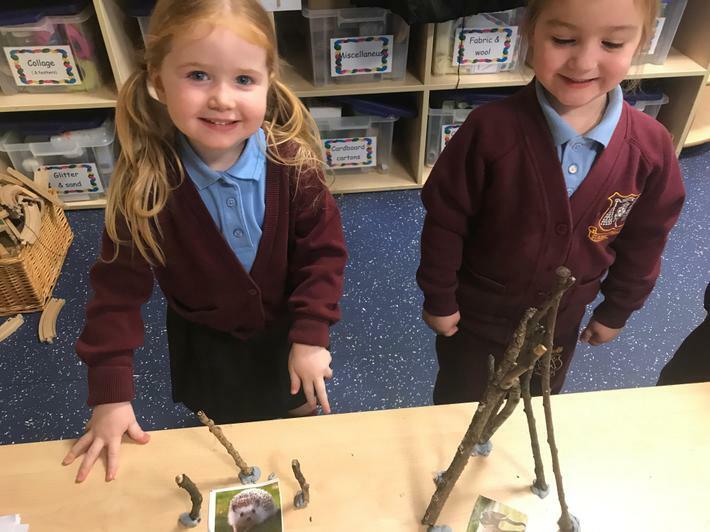 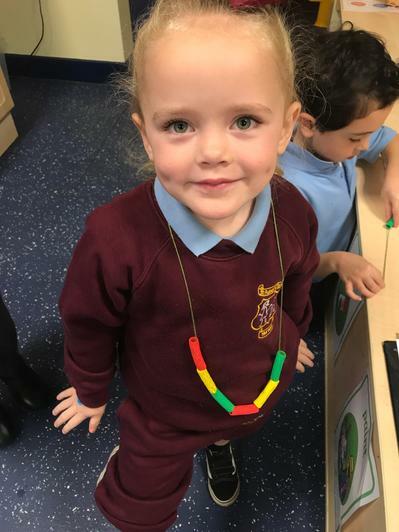 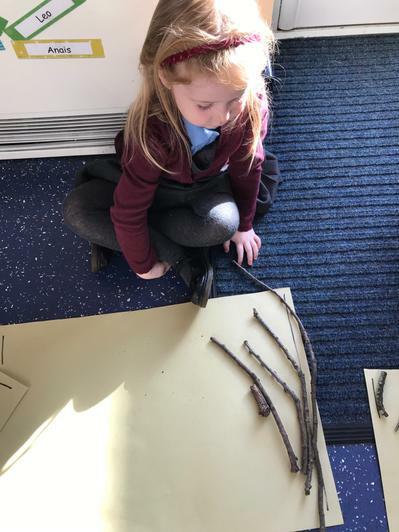 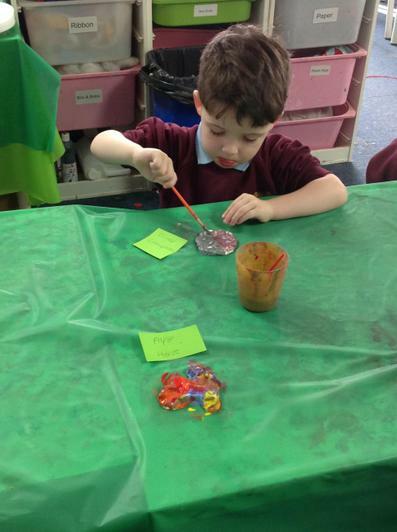 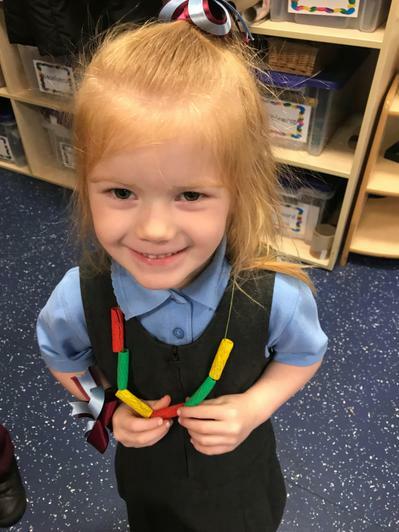 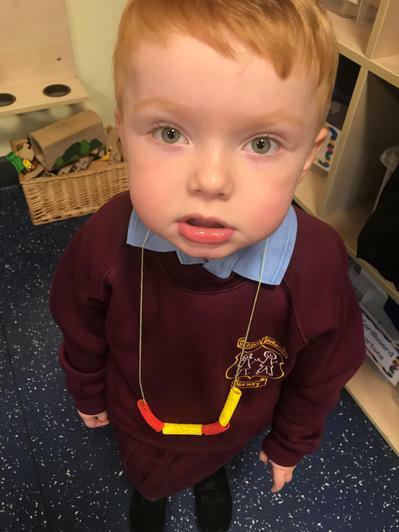 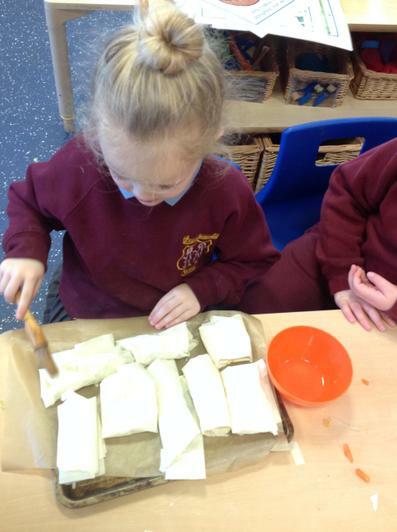 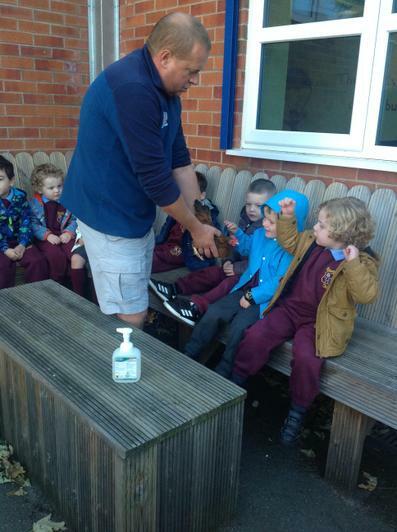 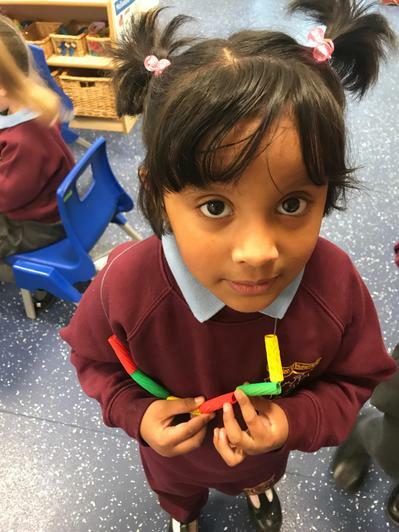 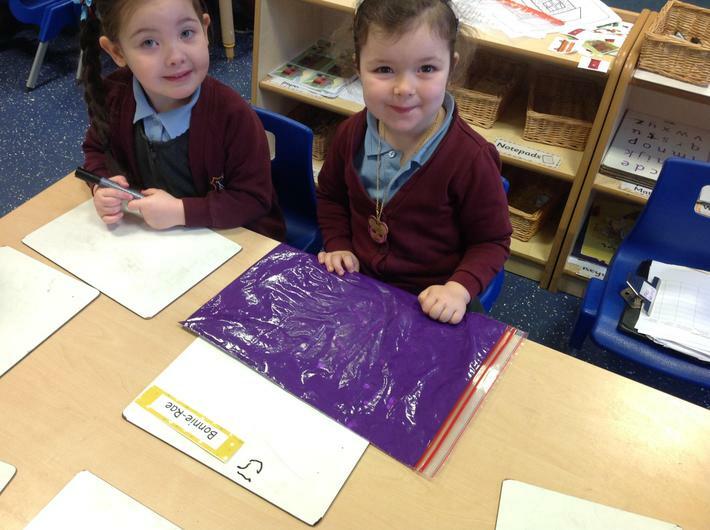 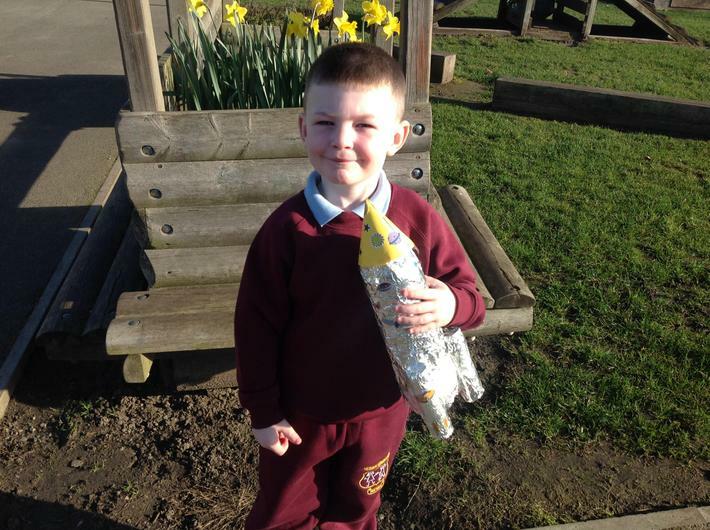 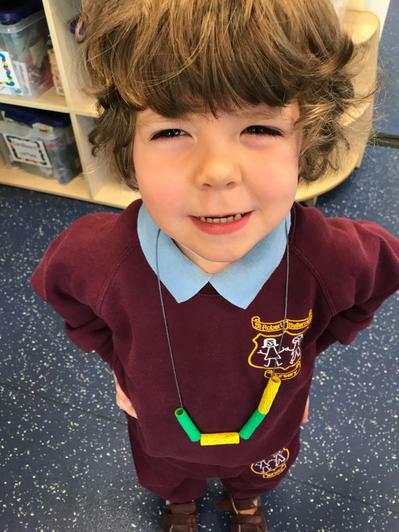 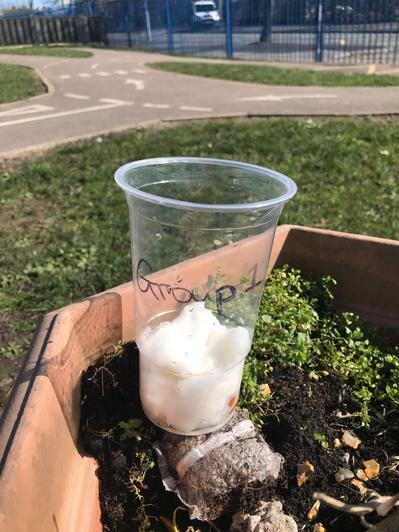 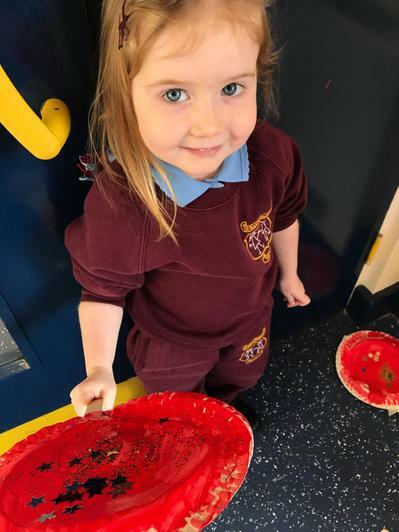 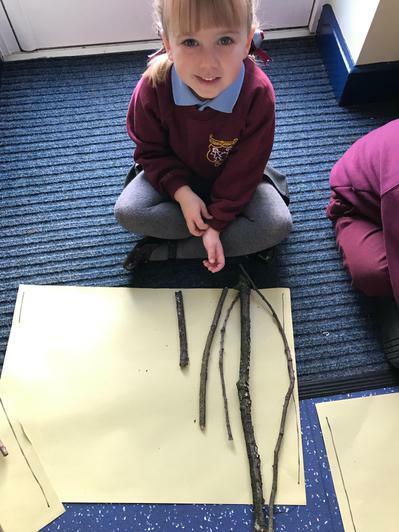 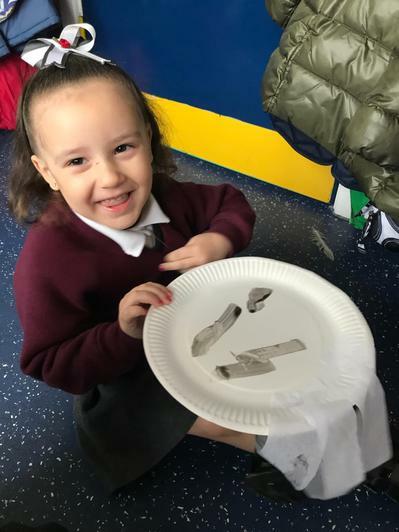 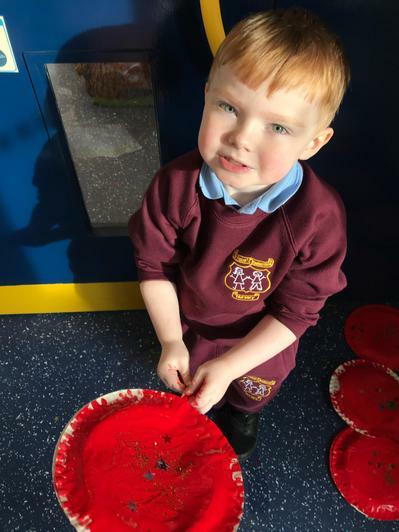 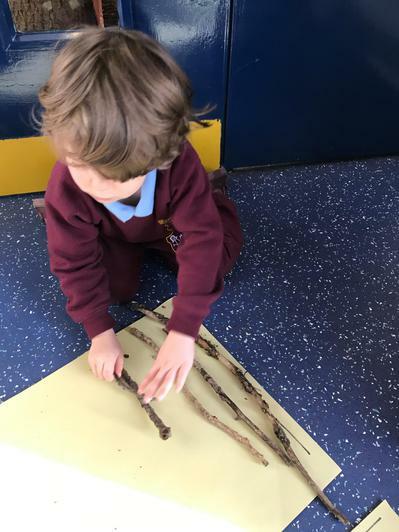 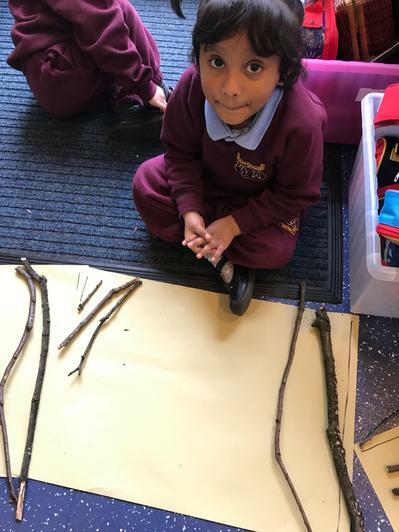 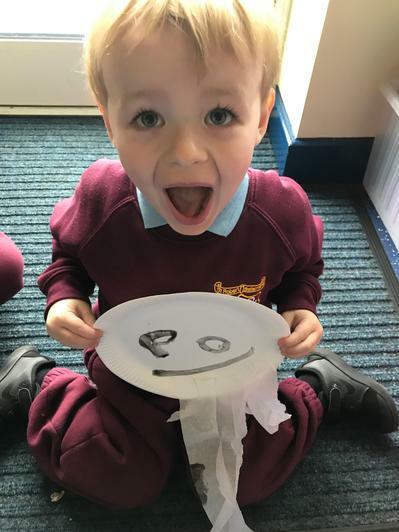 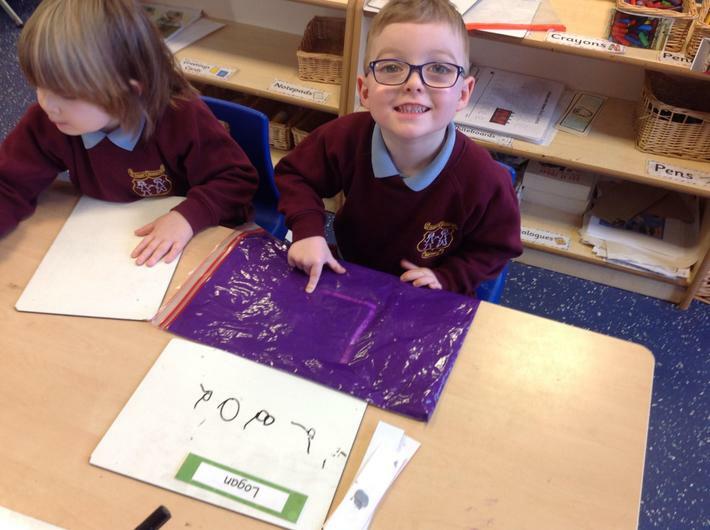 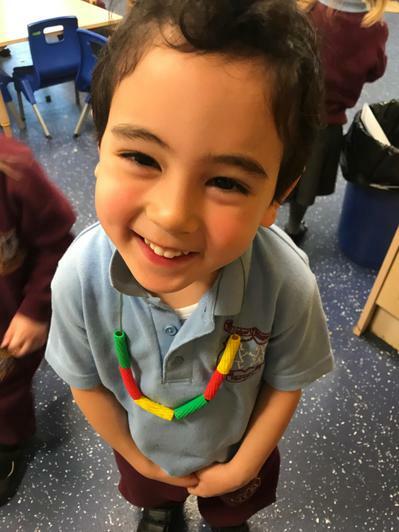 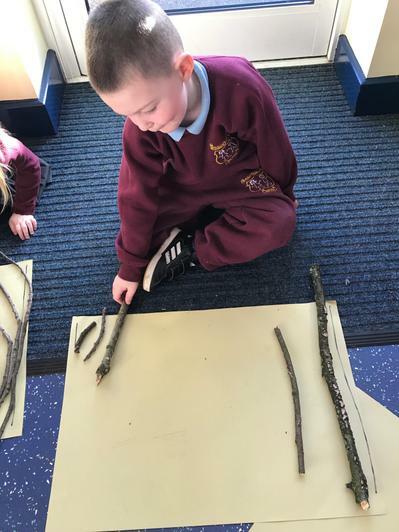 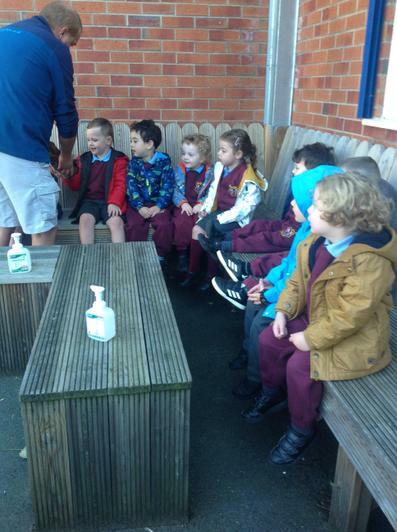 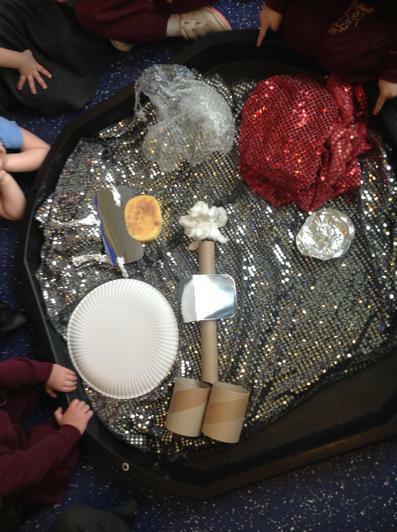 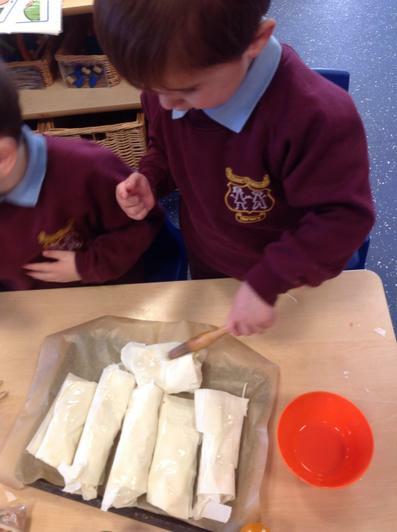 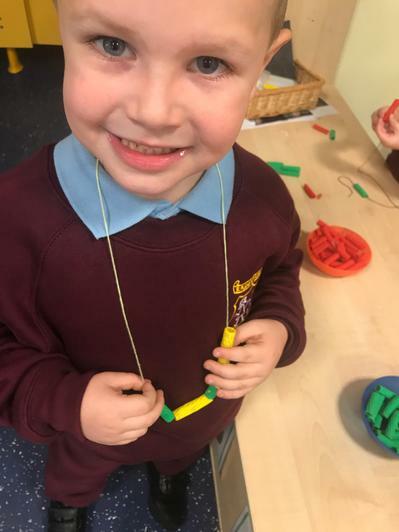 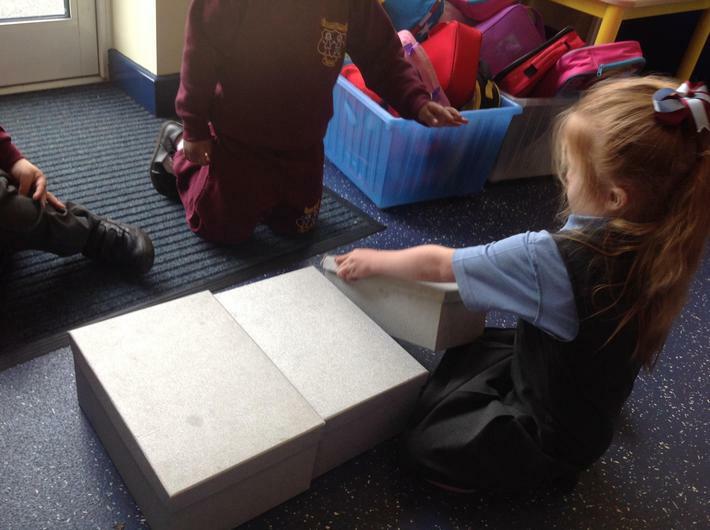 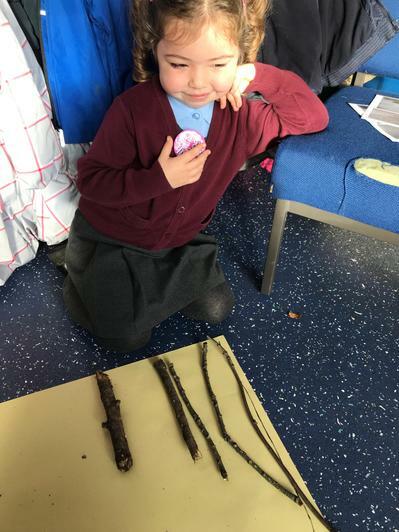 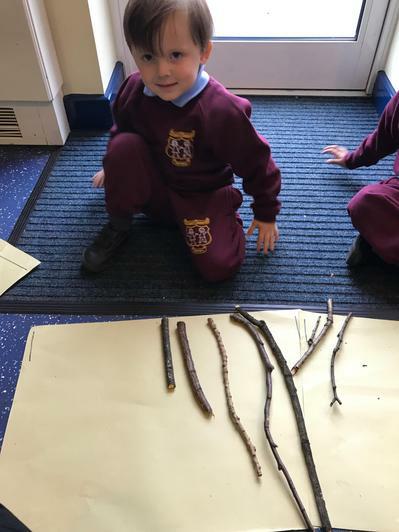 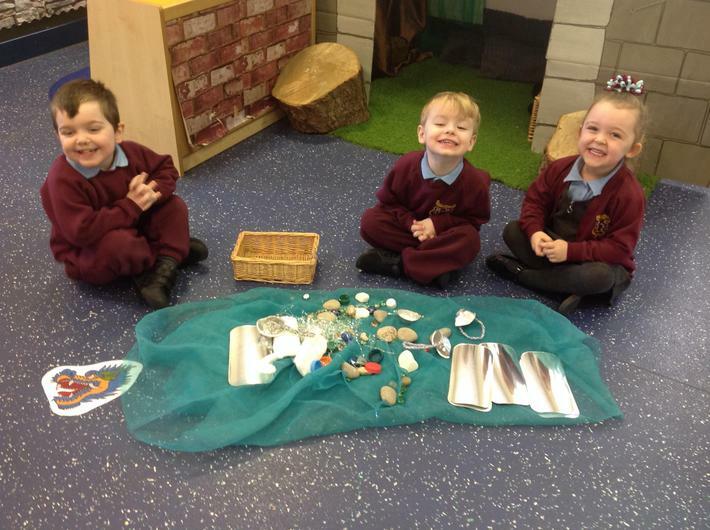 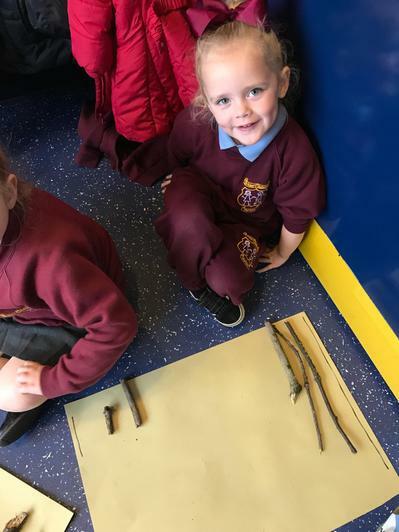 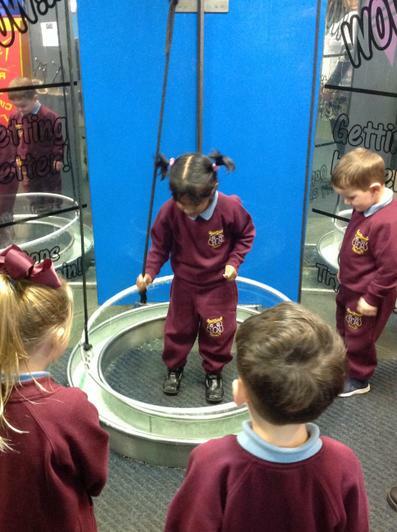 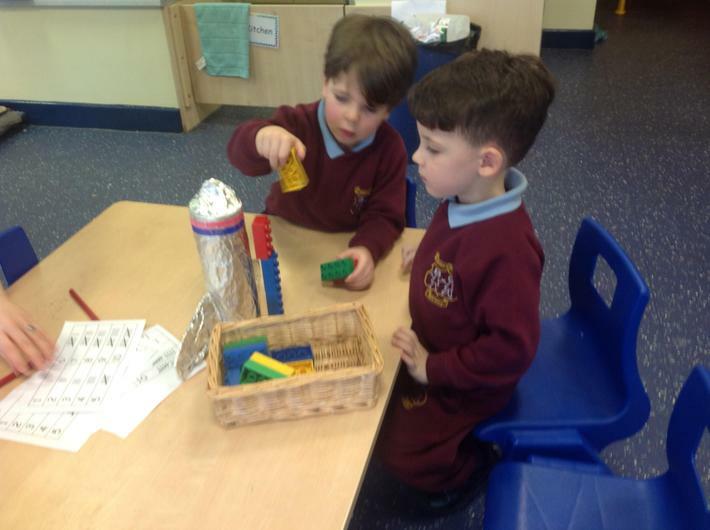 In class we having been investigating the properties of materials and exploring language such as rigid, flexible, hard, soft, strong, weak, heavy, light and waterproof. 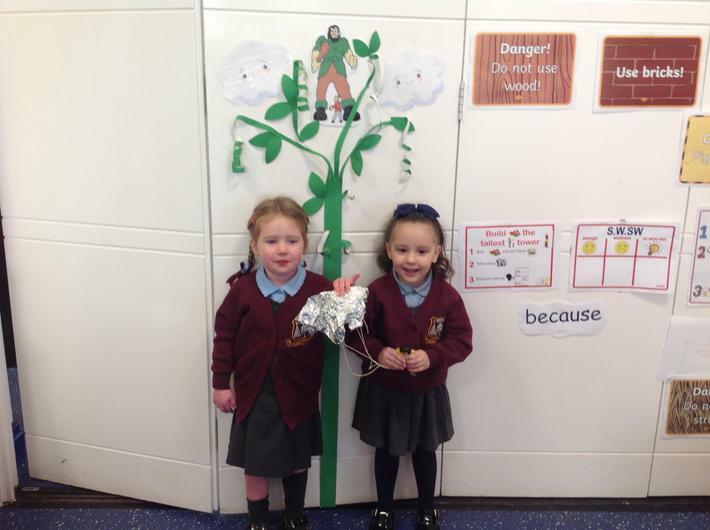 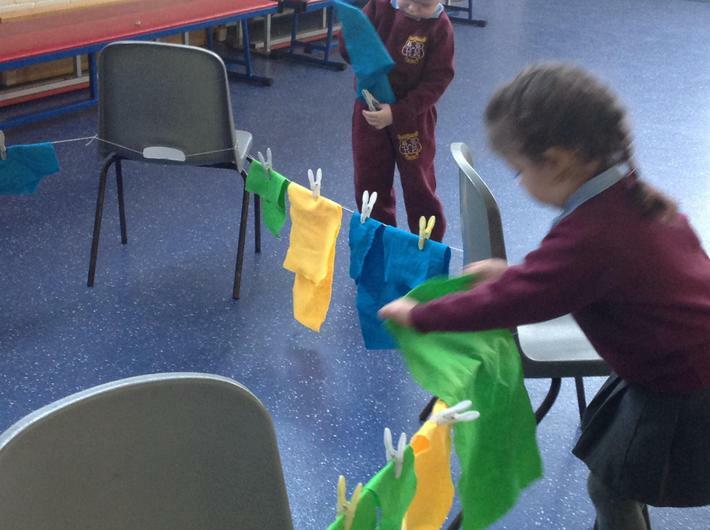 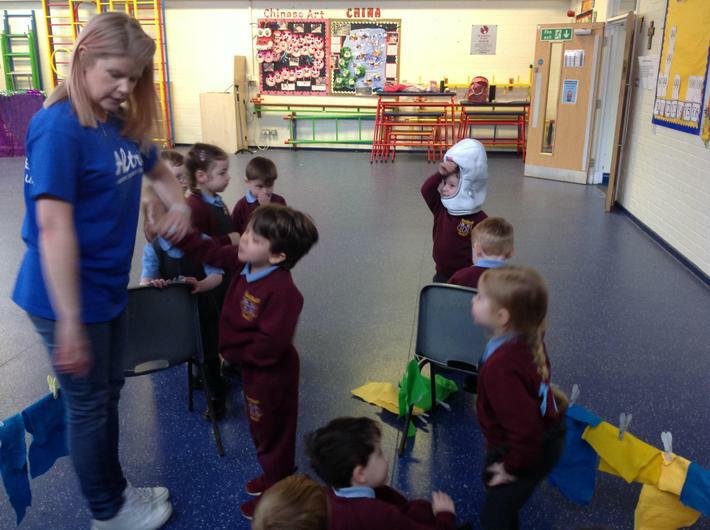 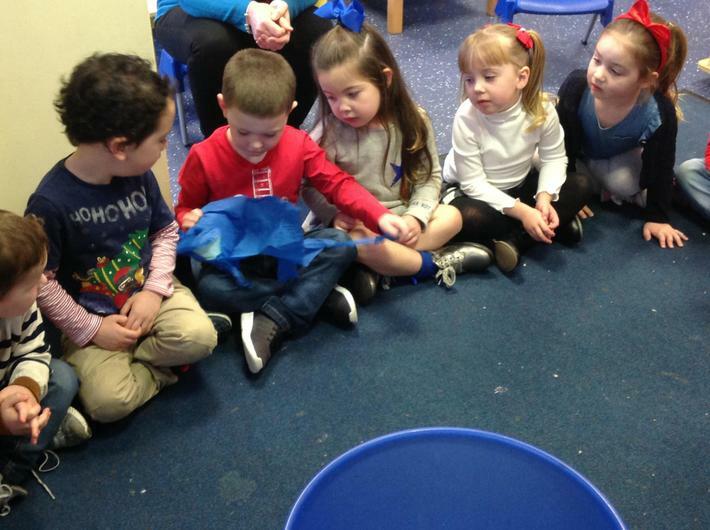 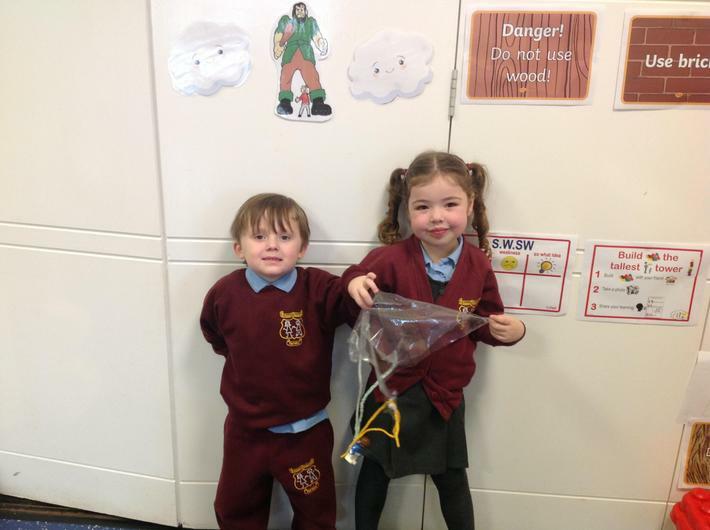 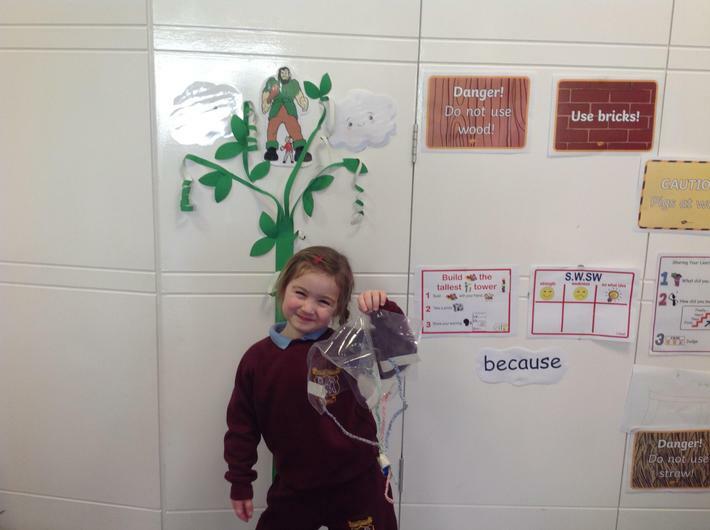 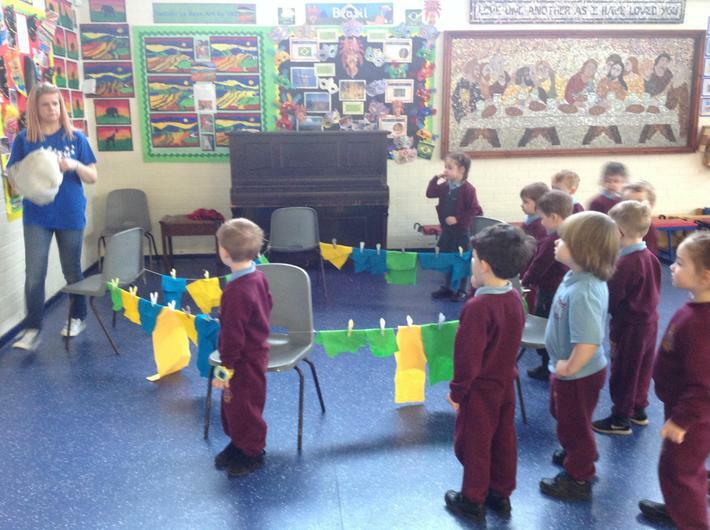 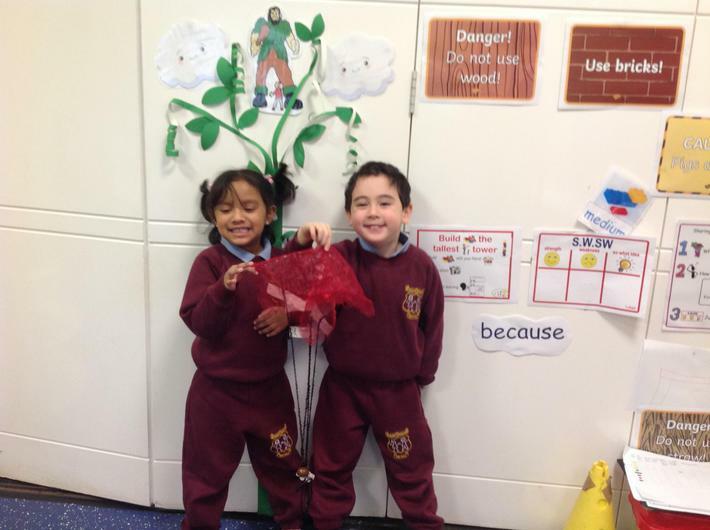 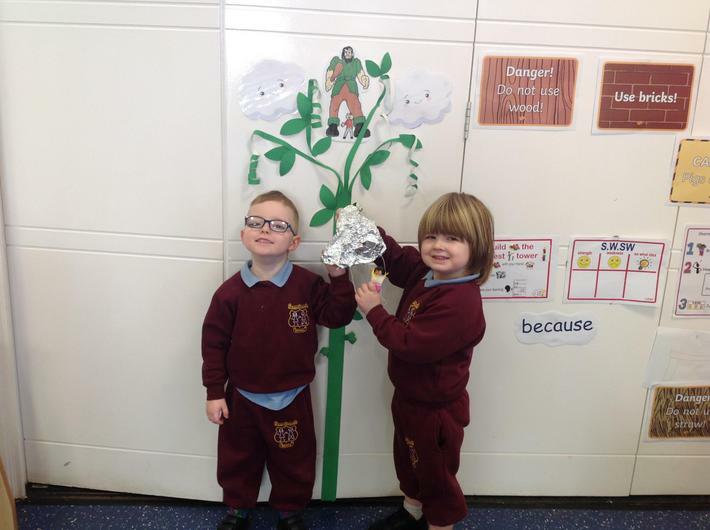 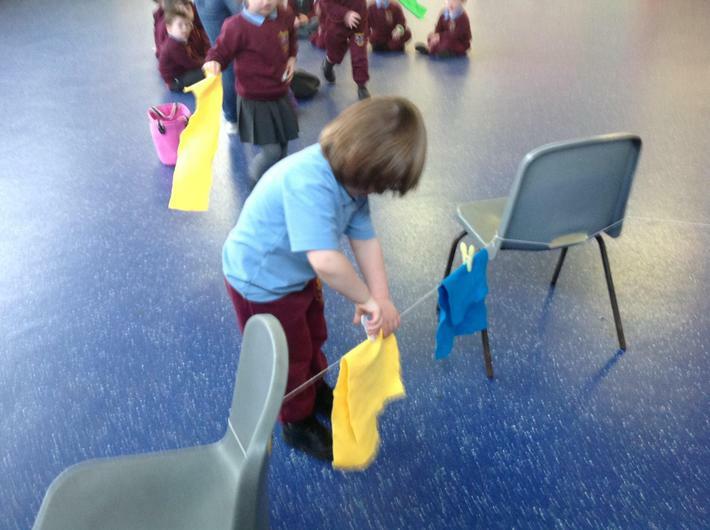 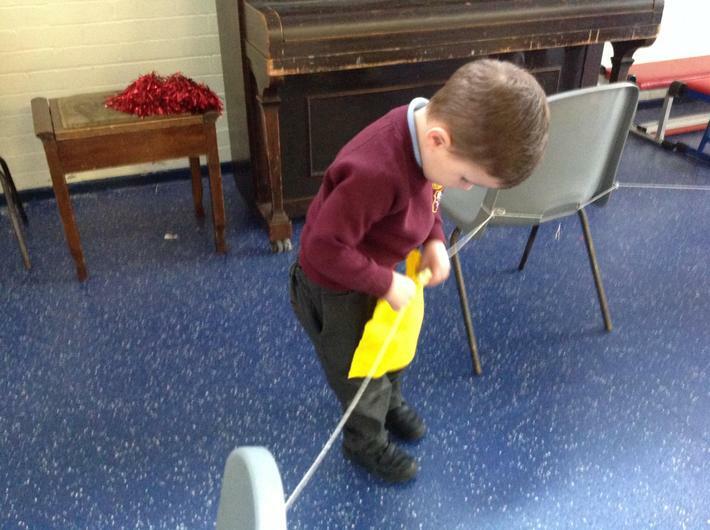 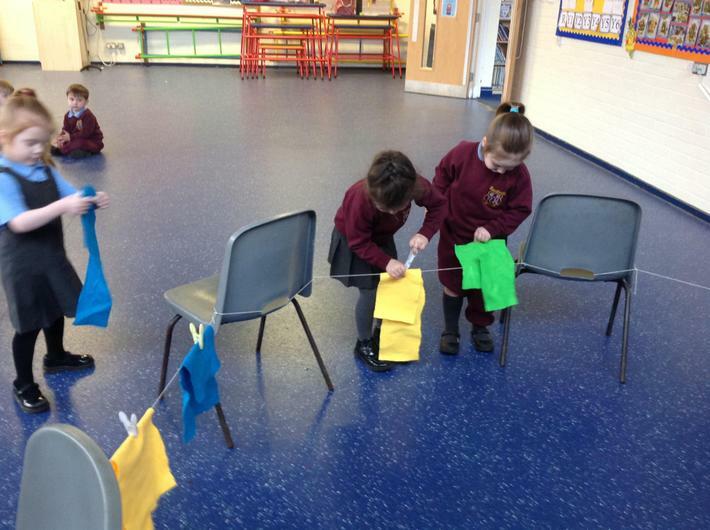 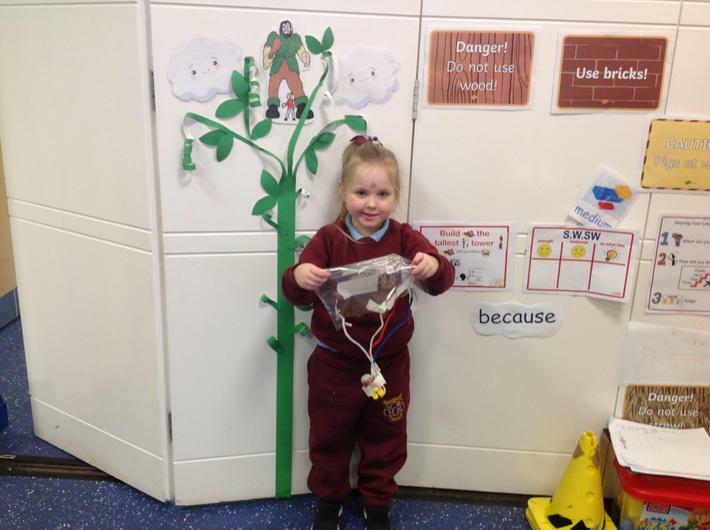 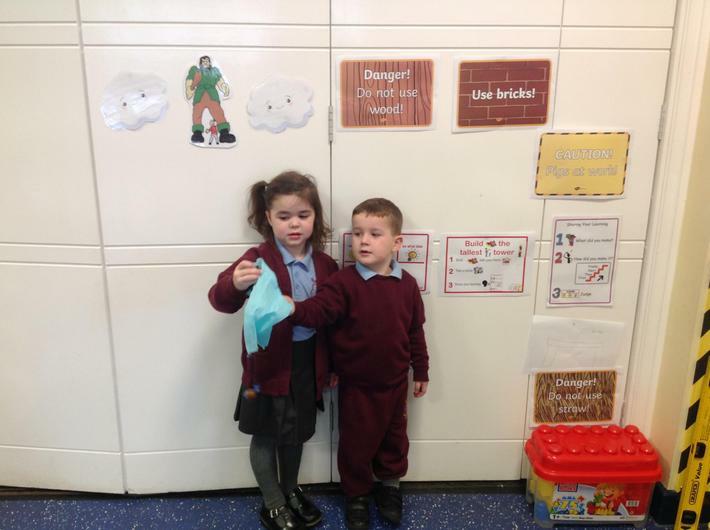 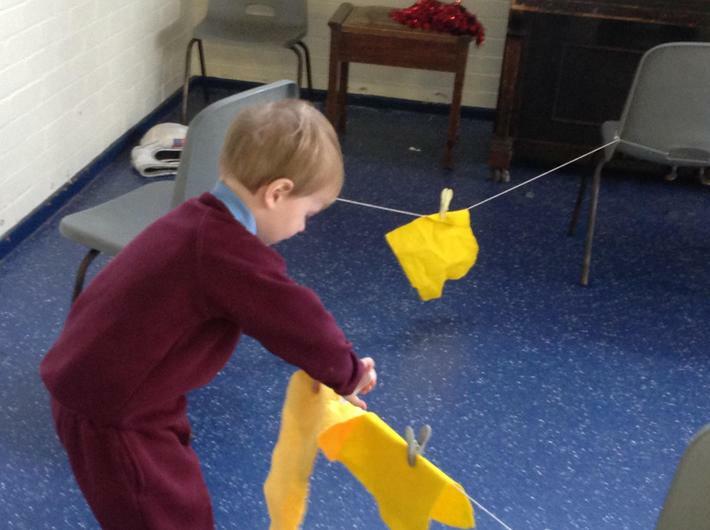 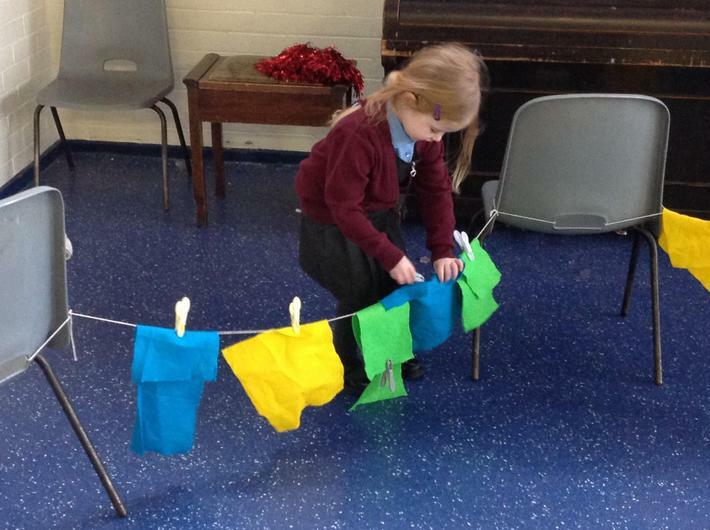 Today the class had a challenge to get Jack safely down from the beanstalk and escape the giant by making a parachute. 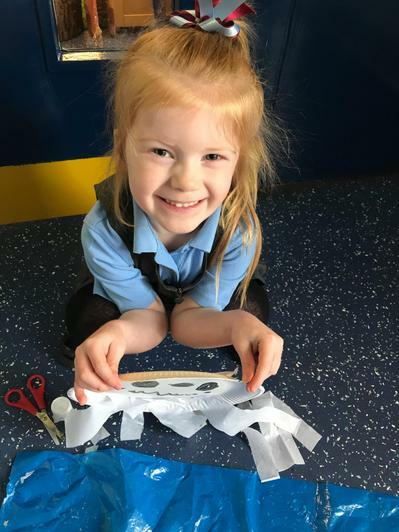 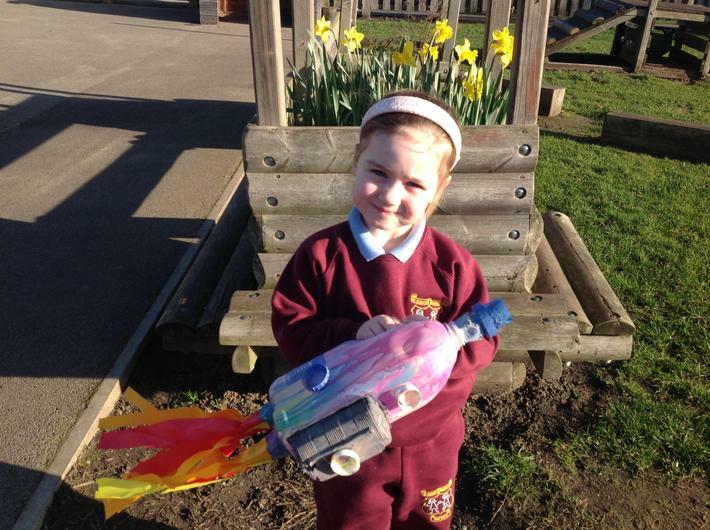 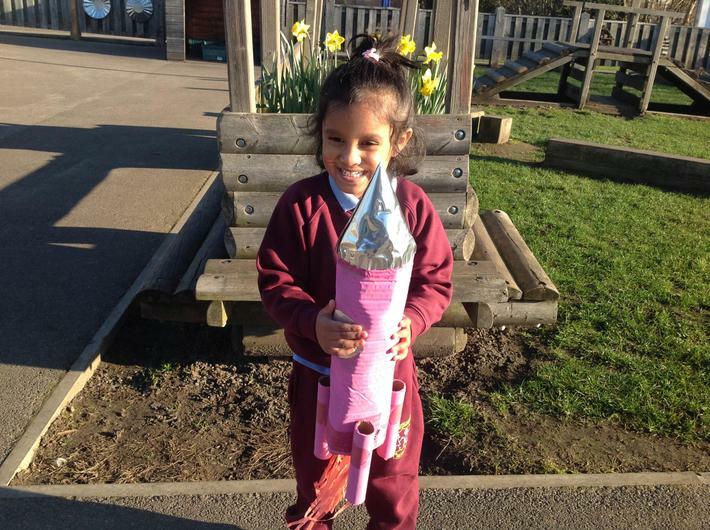 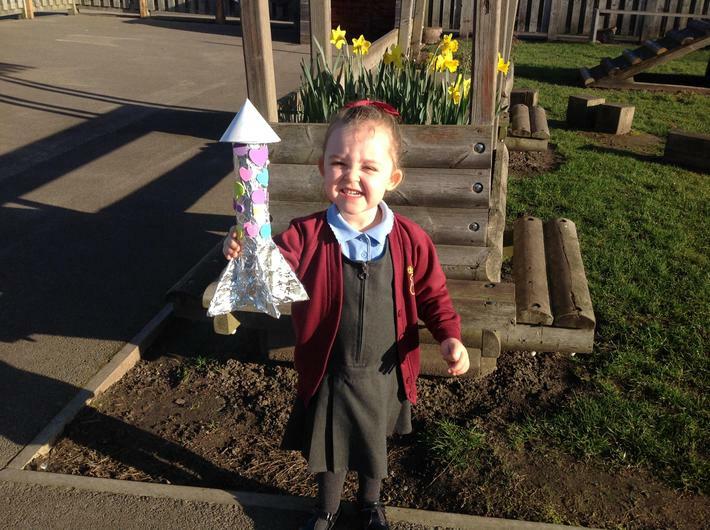 After predicting which materials would make the best parachute the children were able to make their own versions using a range of materials and do an experiment to find out which was the best after all. 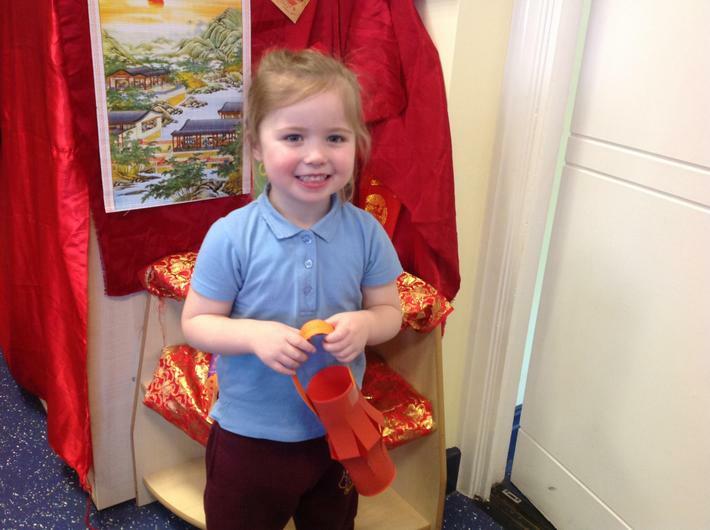 Finally to celebrate the new year we had a Chinese banquet. 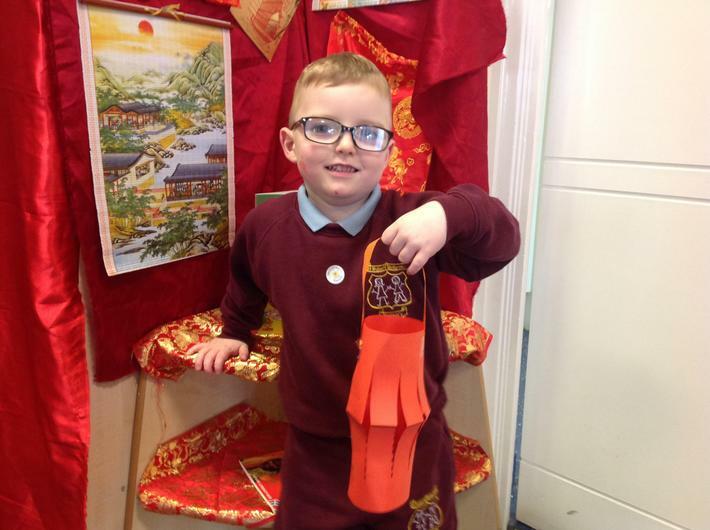 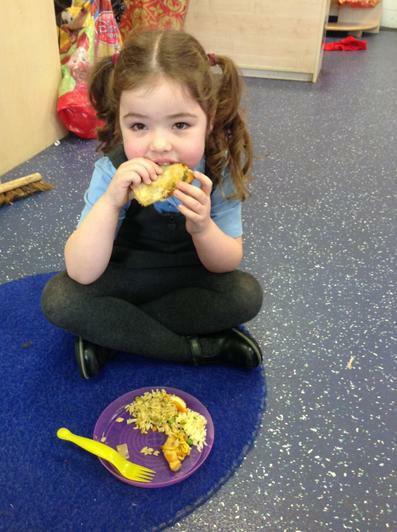 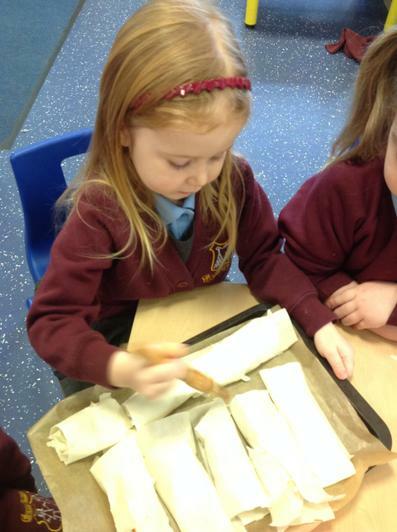 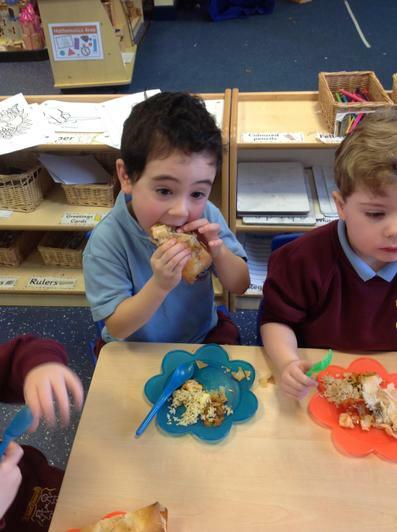 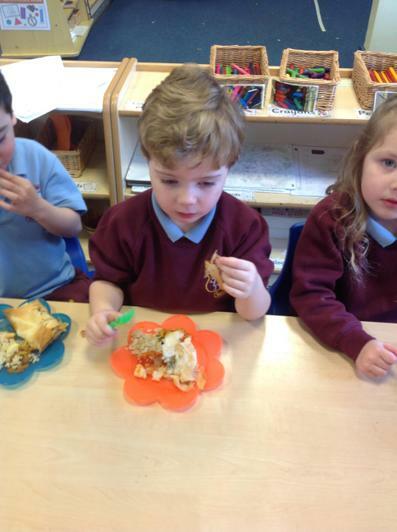 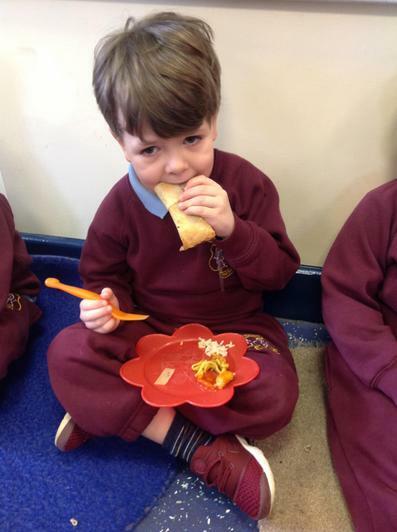 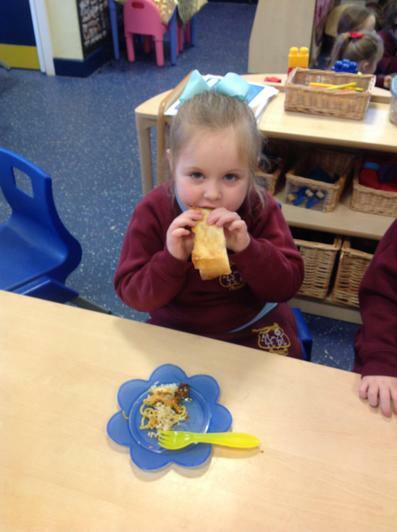 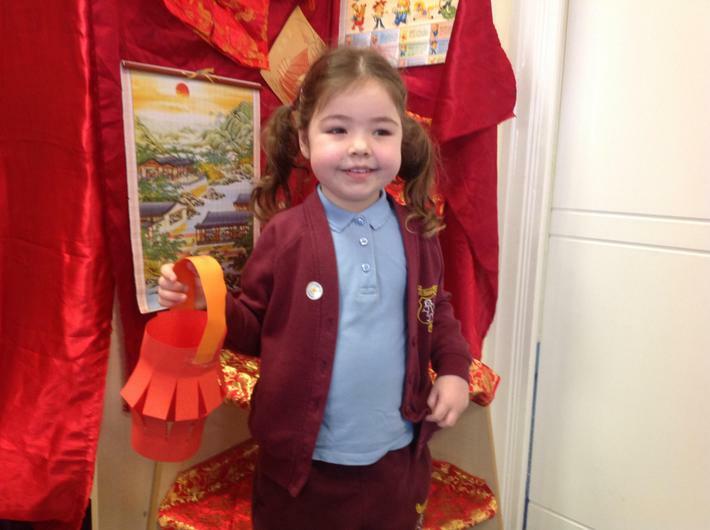 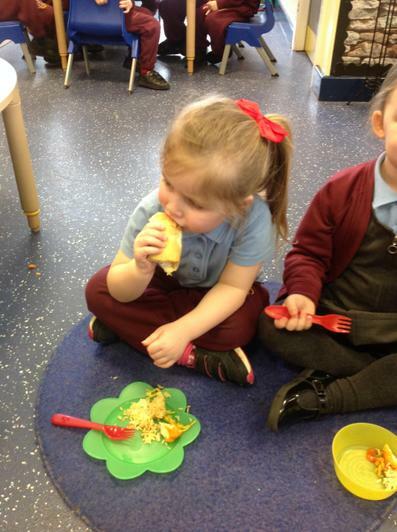 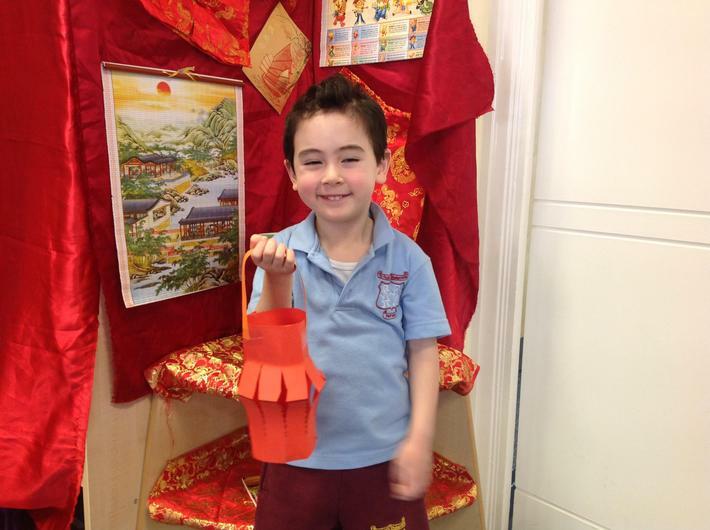 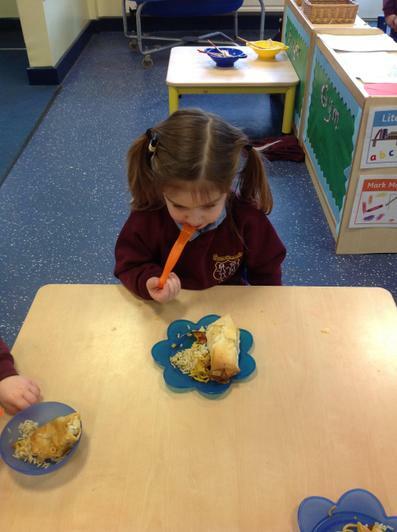 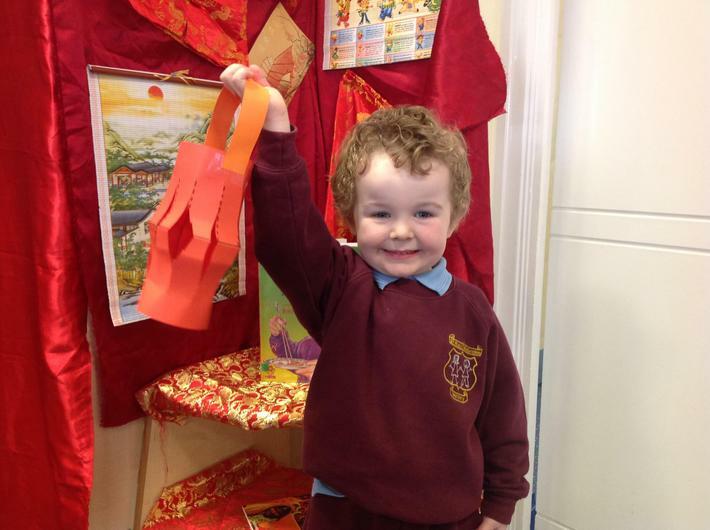 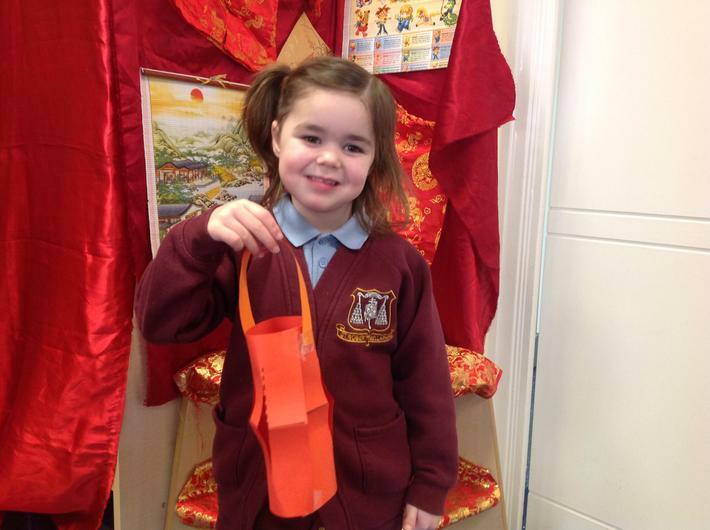 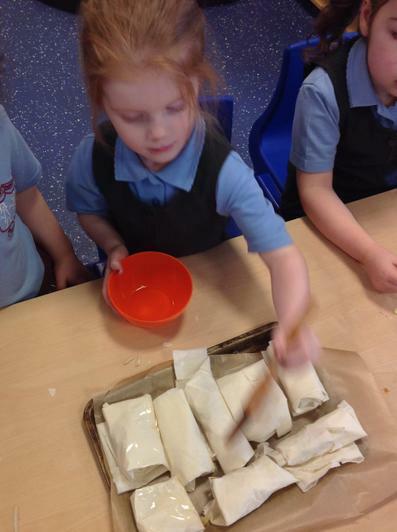 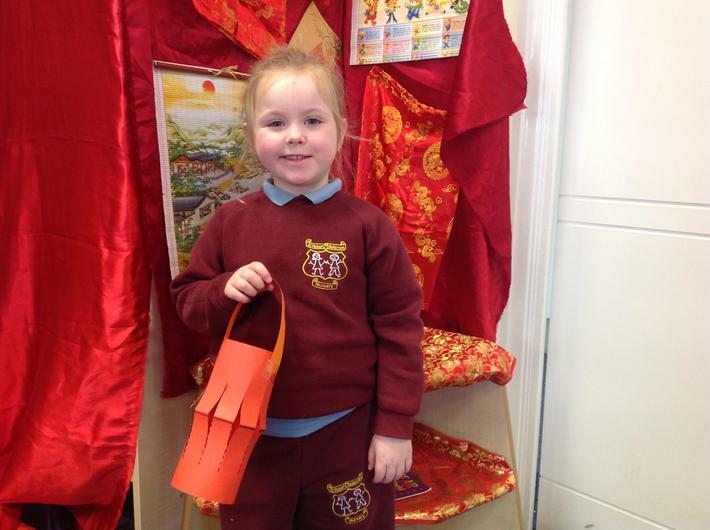 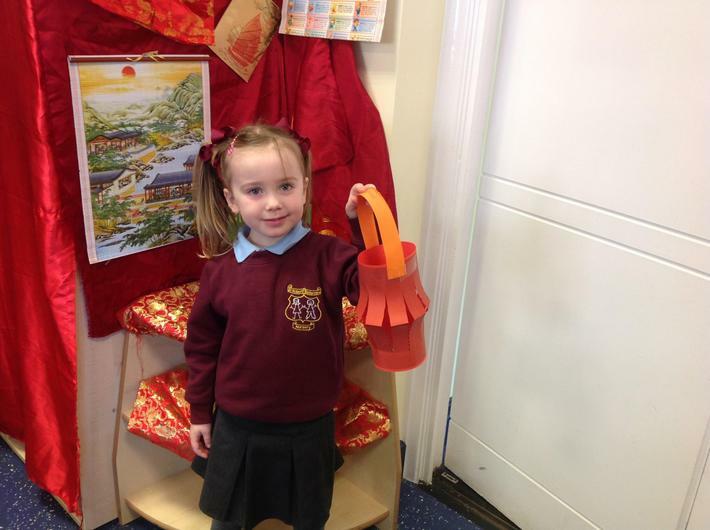 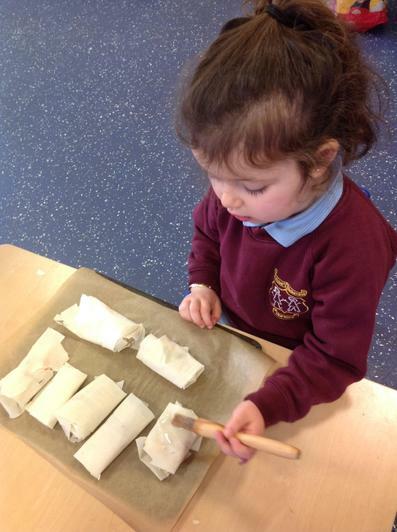 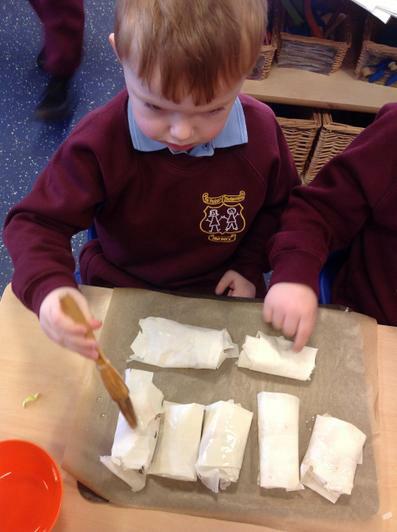 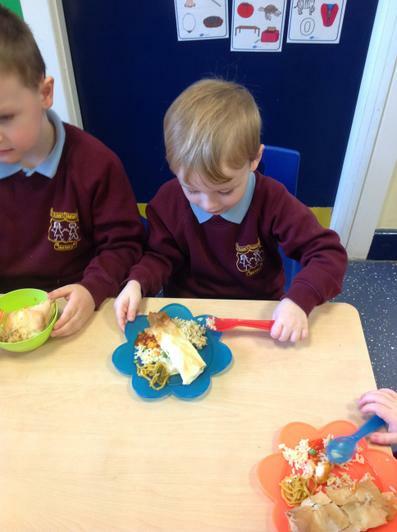 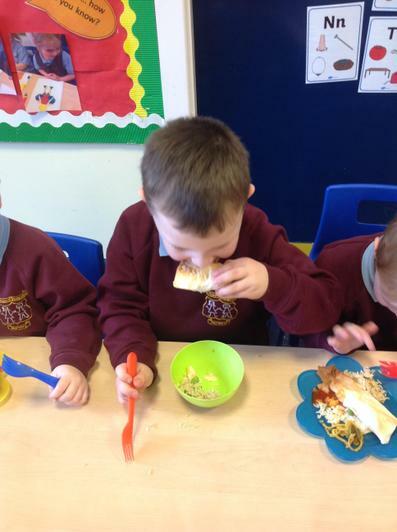 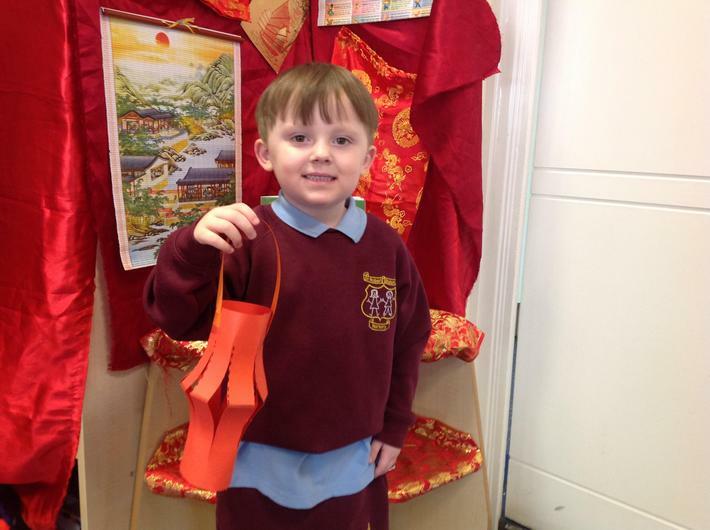 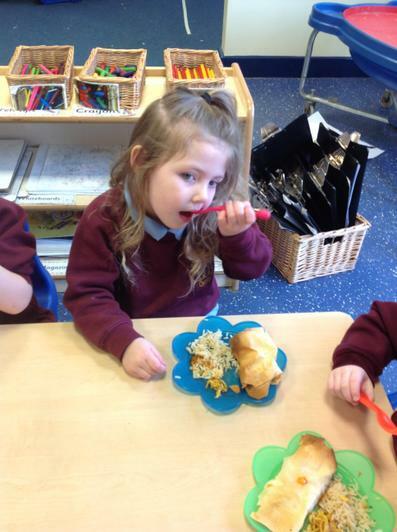 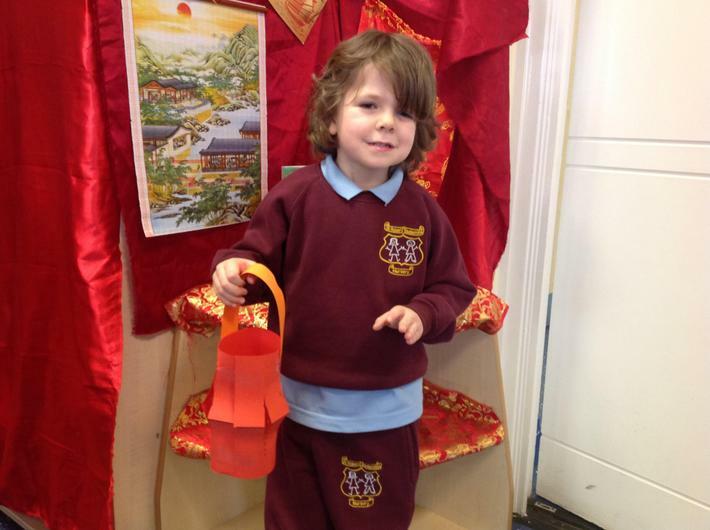 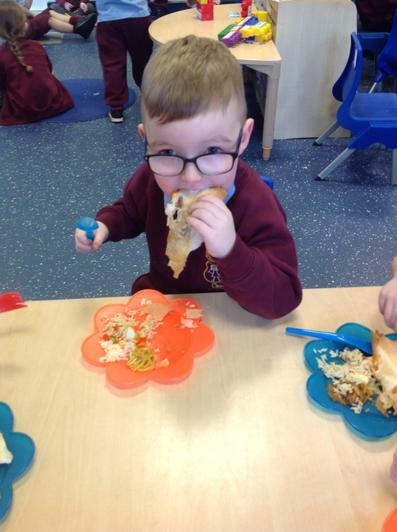 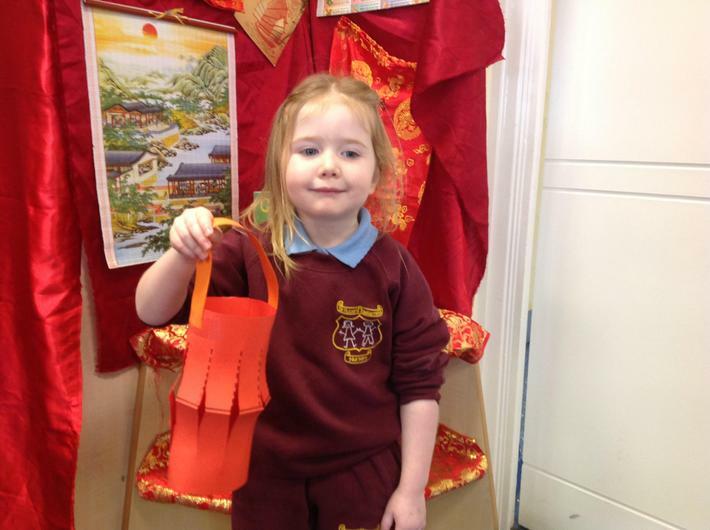 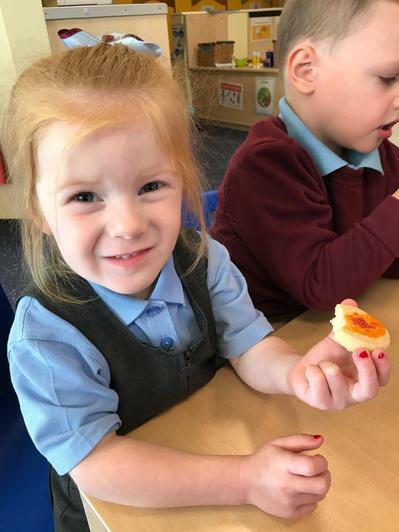 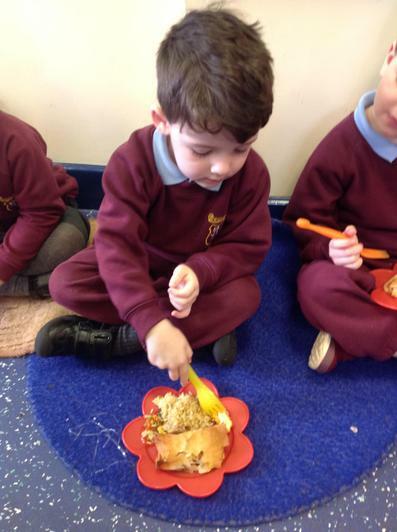 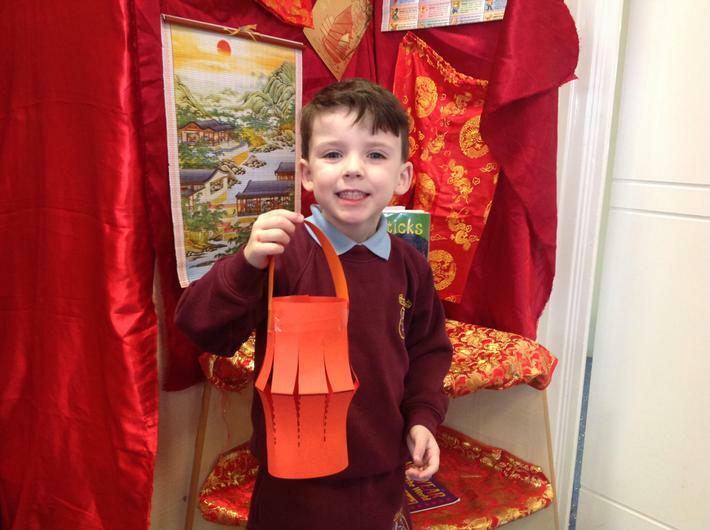 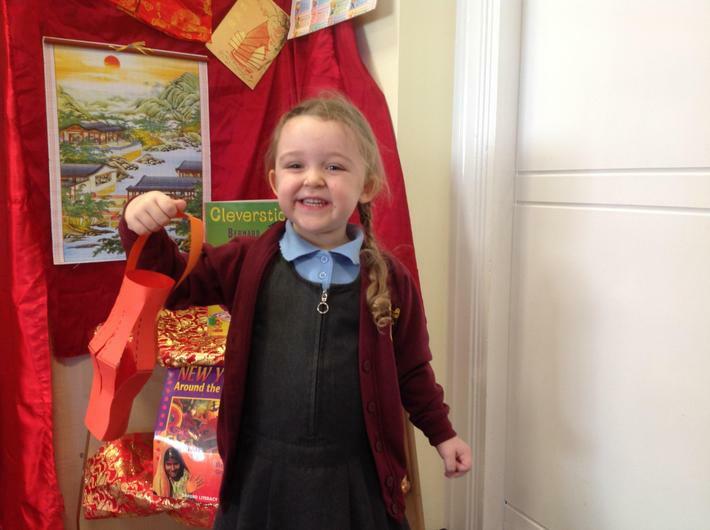 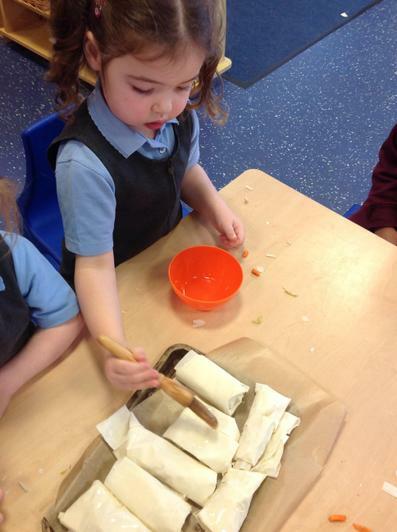 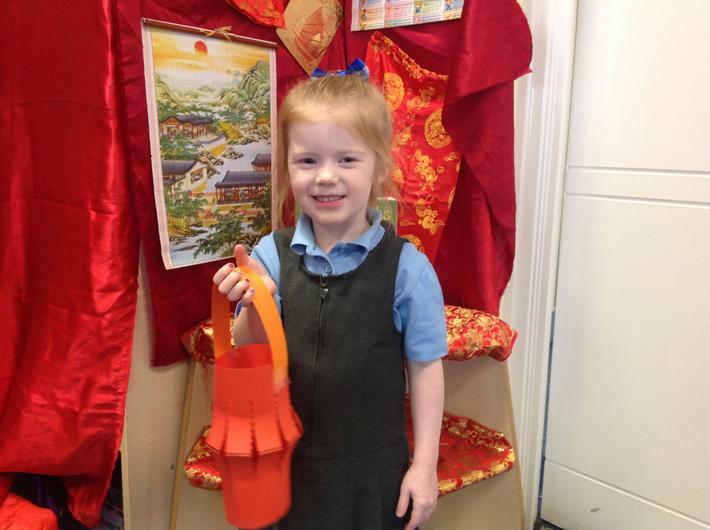 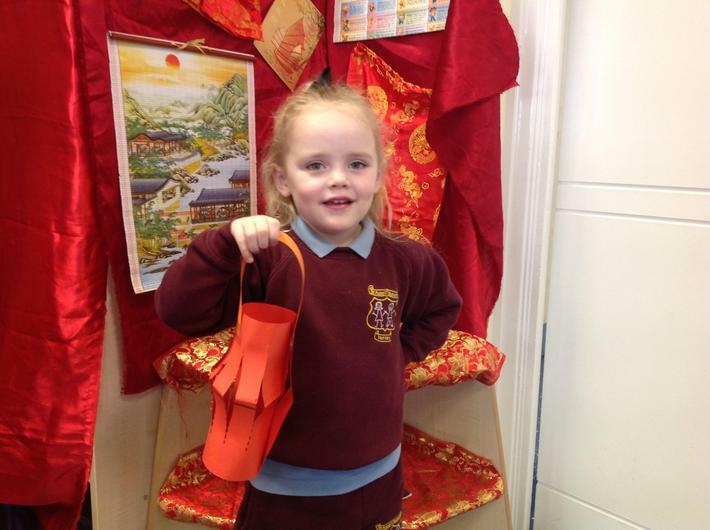 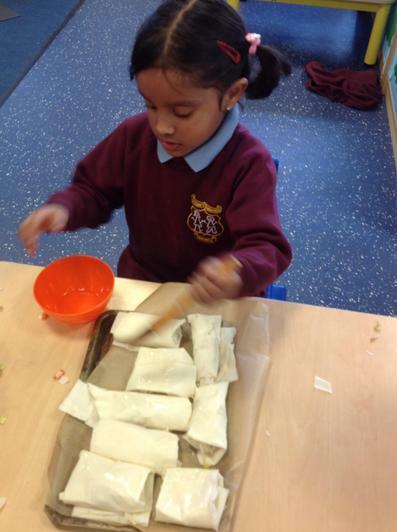 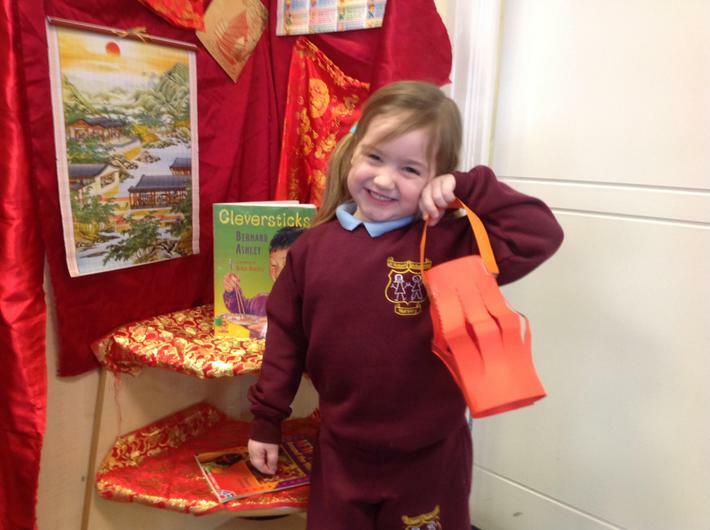 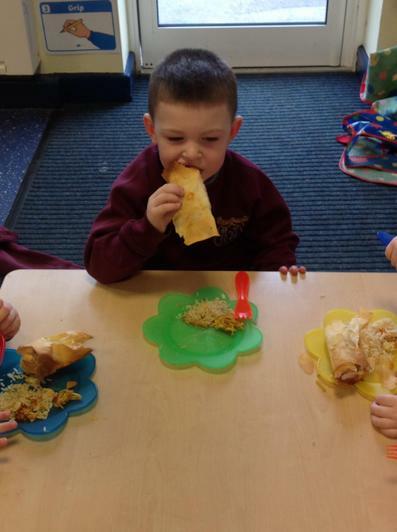 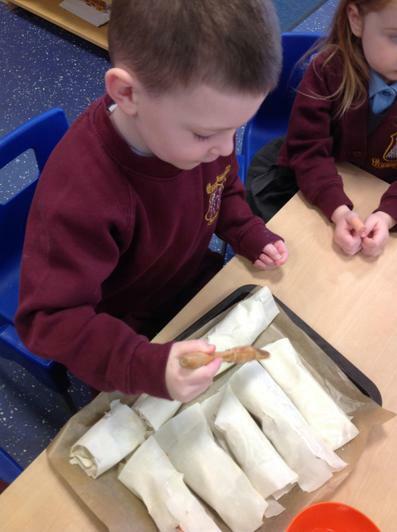 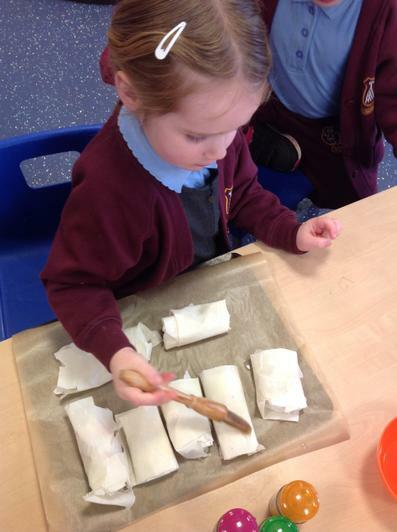 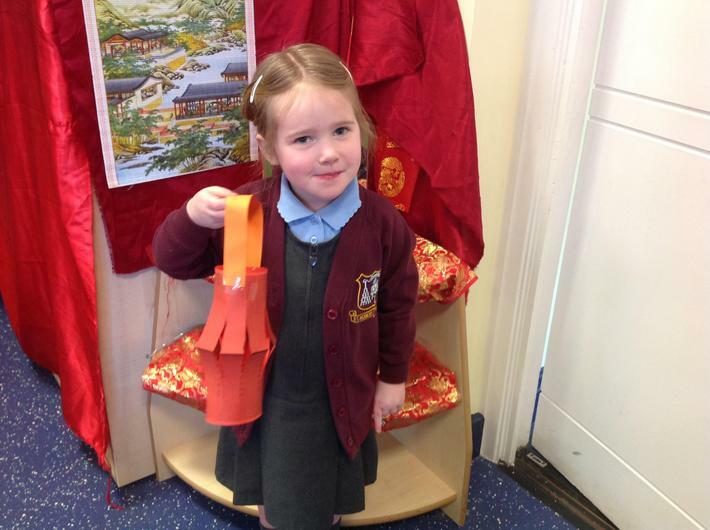 We enjoyed tasting prawn crackers, noodles, fried rice, sweet and sour chicken and we even made our very own spring rolls!! 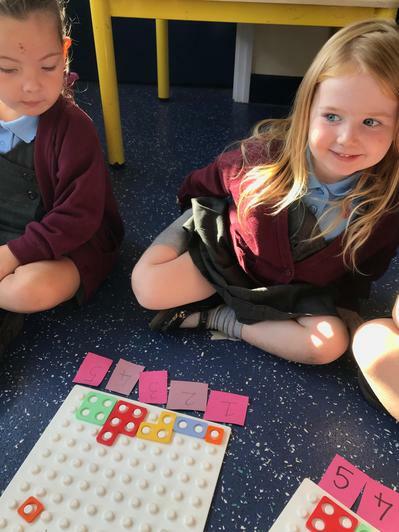 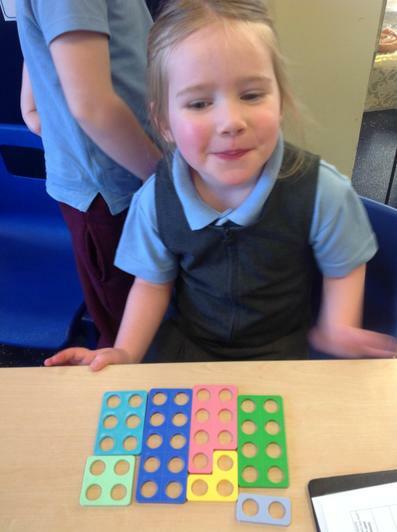 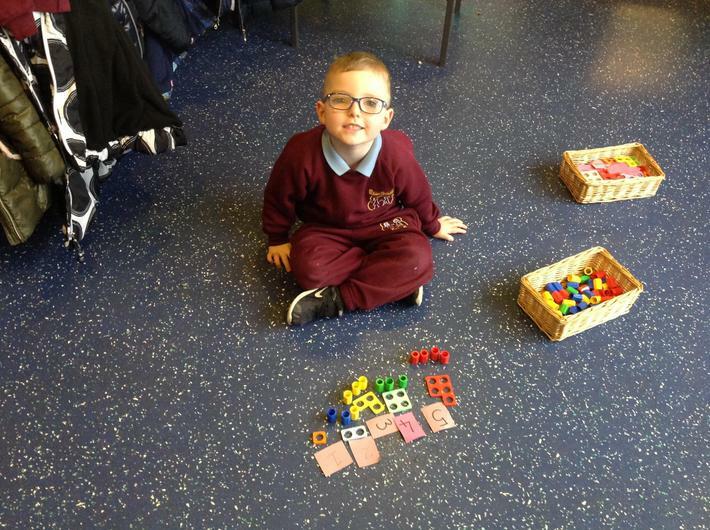 We were set a numicon challenge below to either make the 5 or 10 shape in as many different ways as we could think of to explore the many different possibilities and recognise the the same total quantity can be split into a range of groups and still be equal. 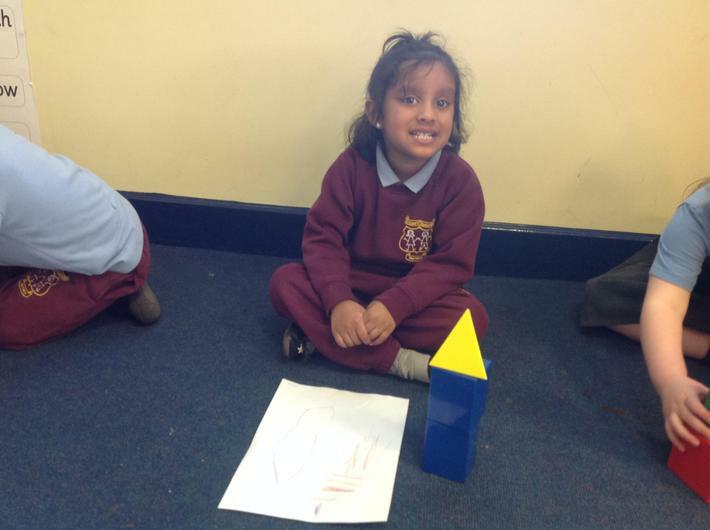 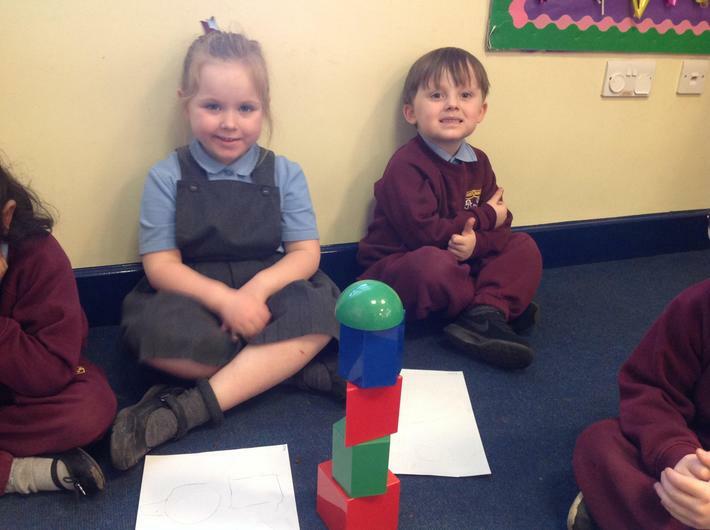 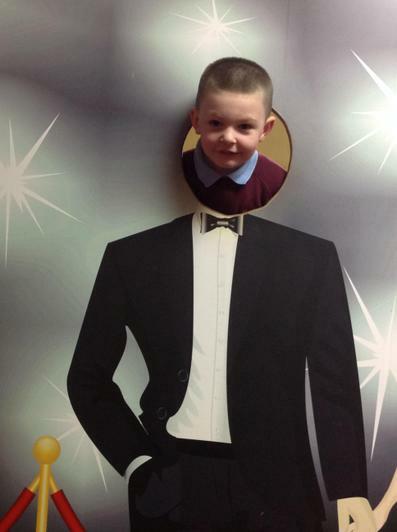 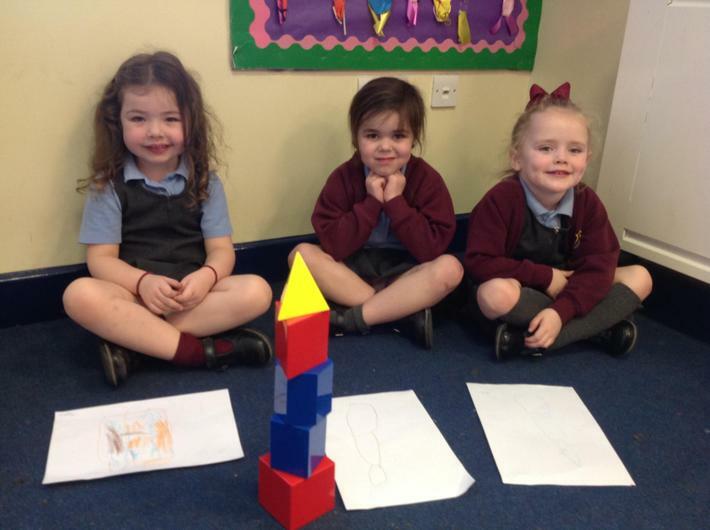 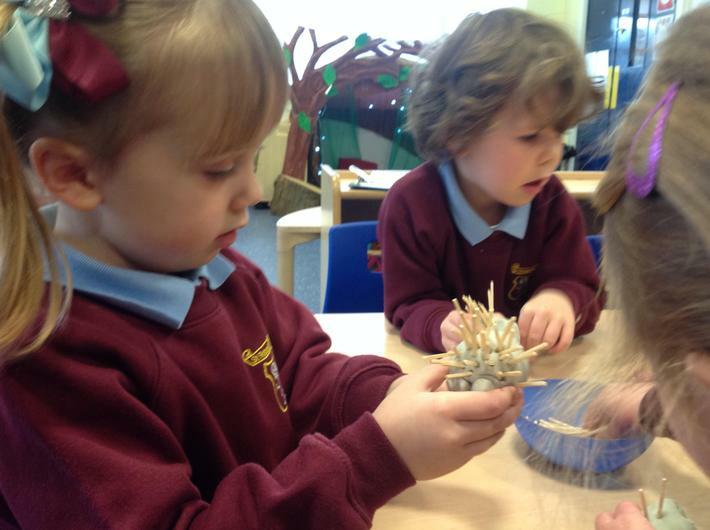 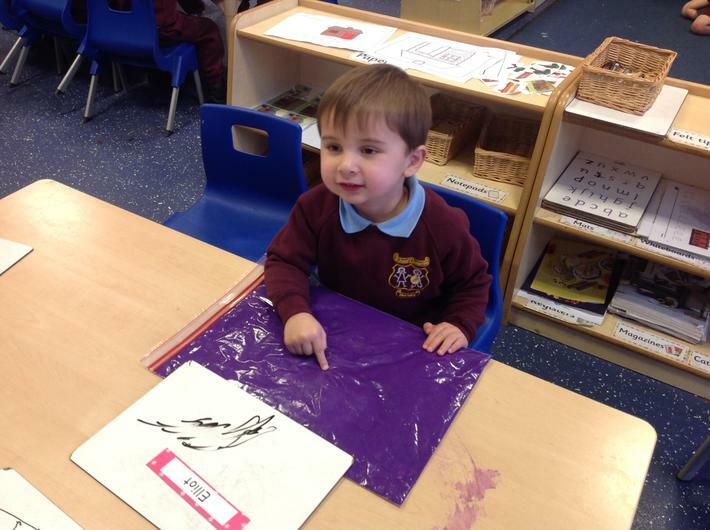 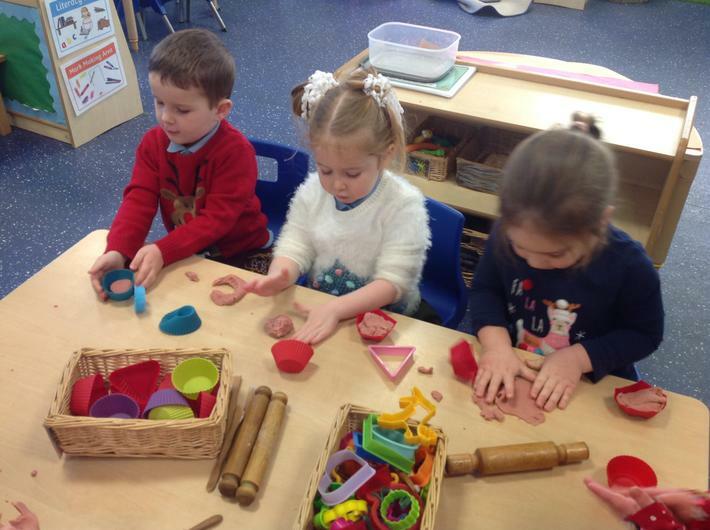 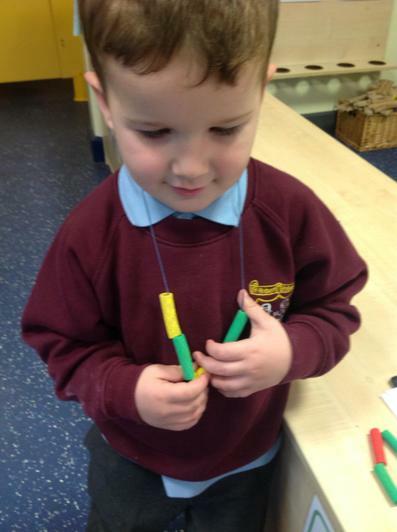 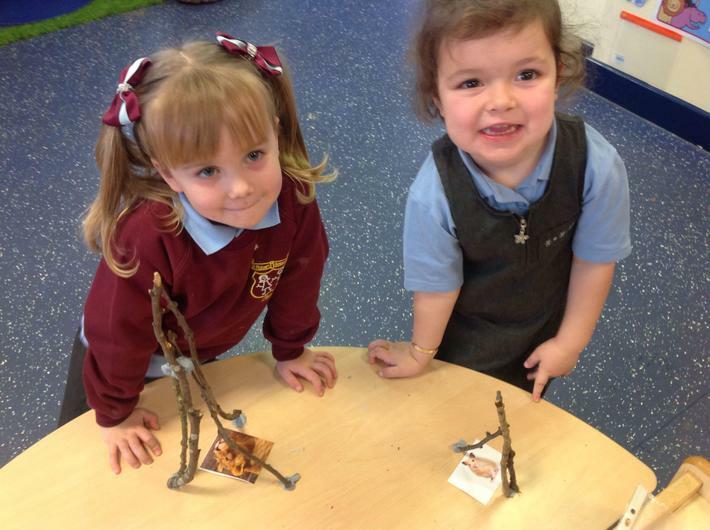 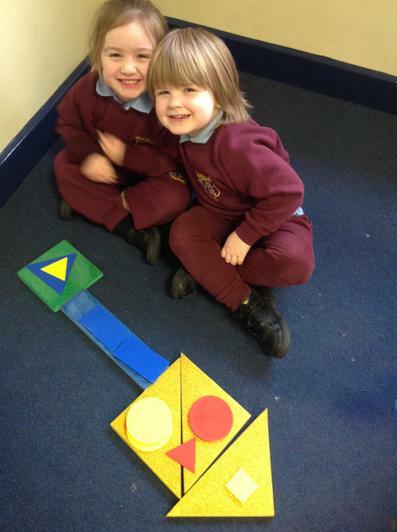 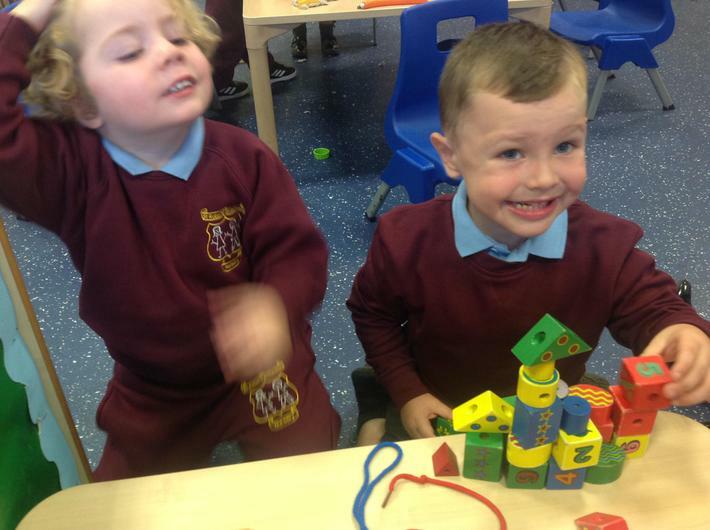 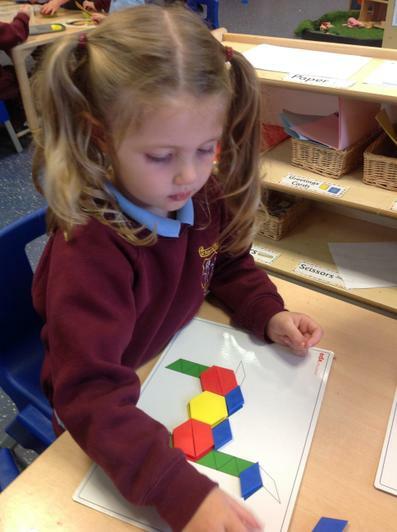 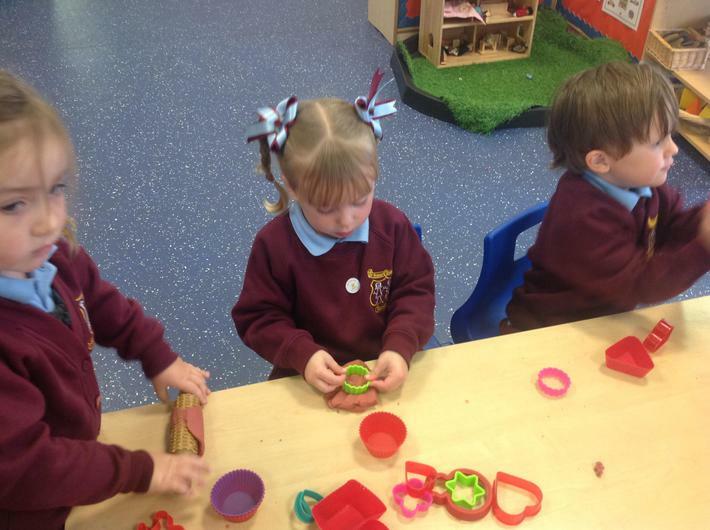 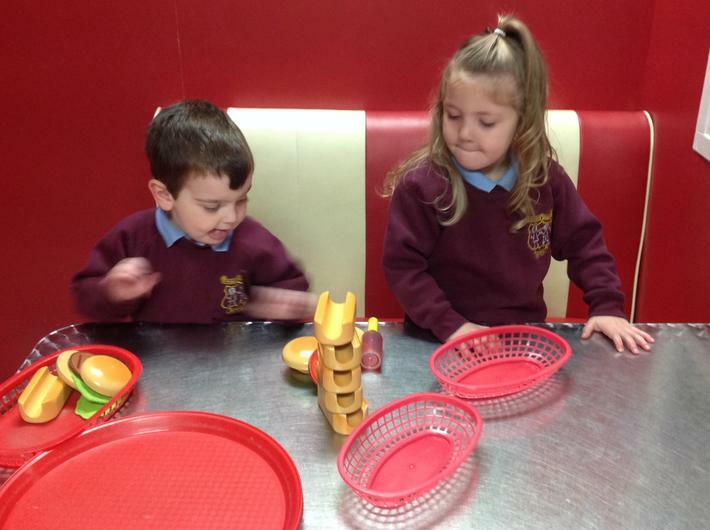 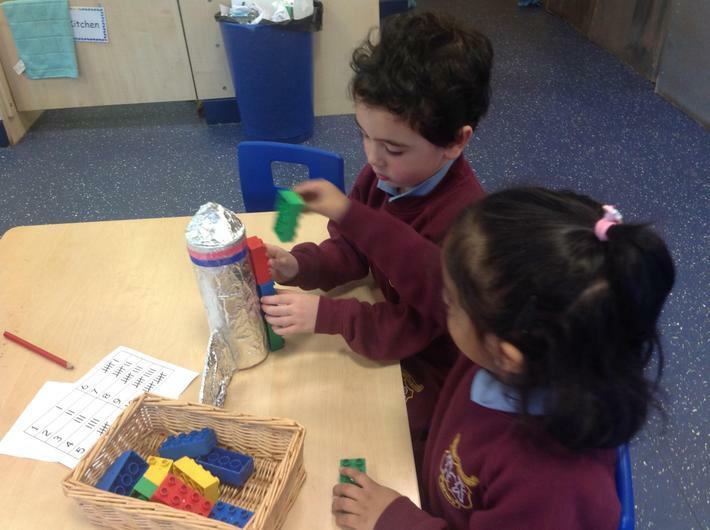 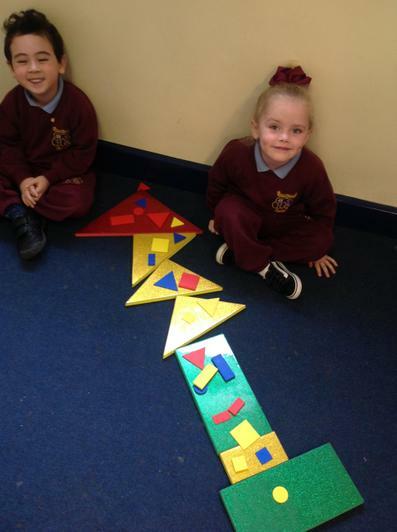 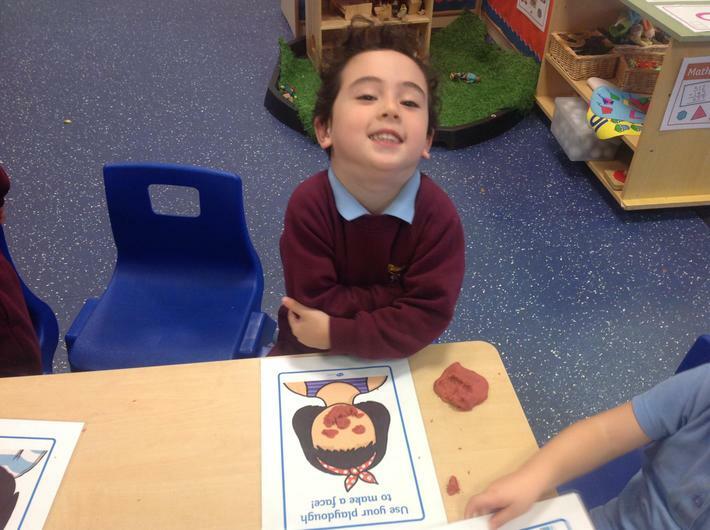 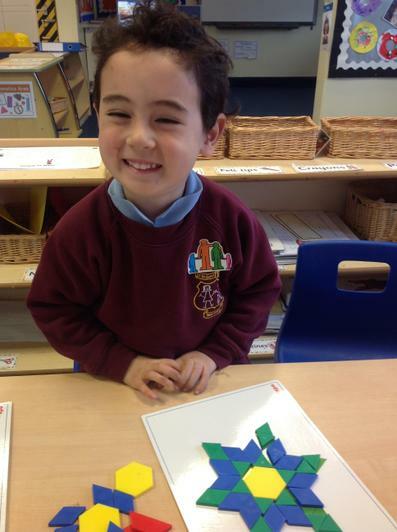 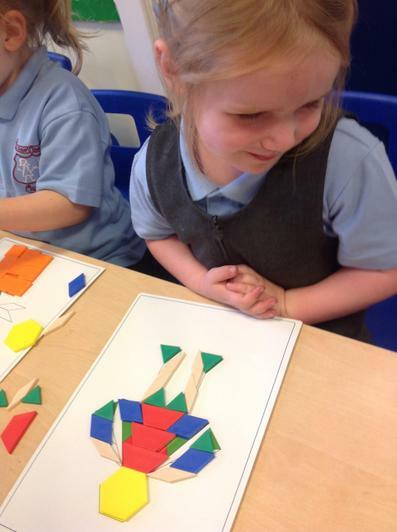 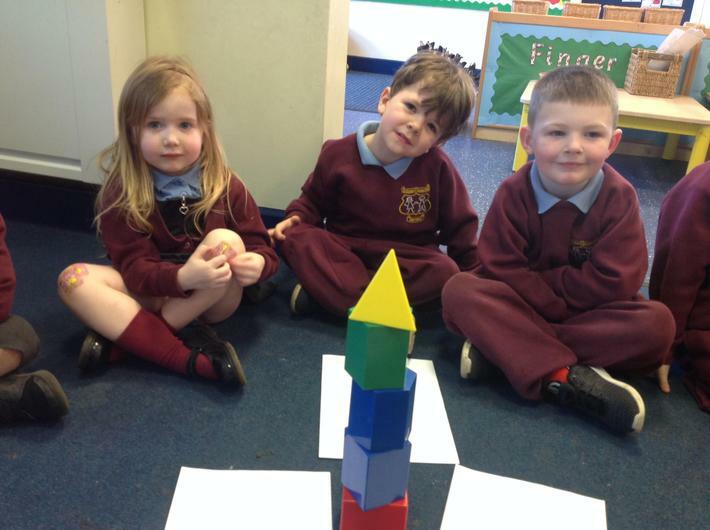 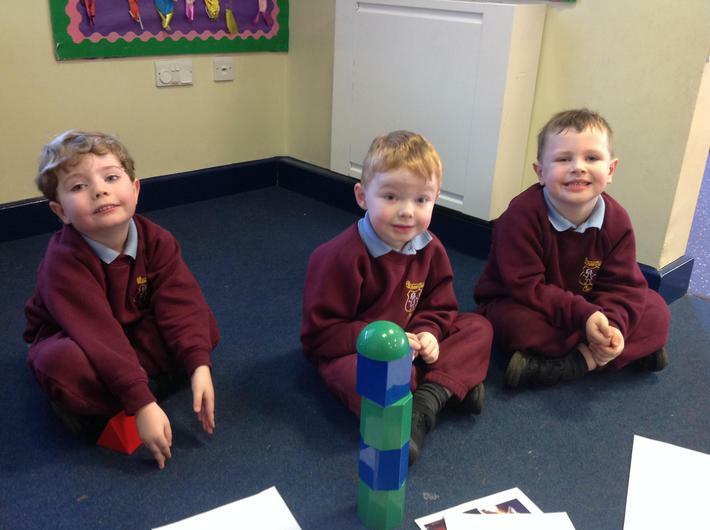 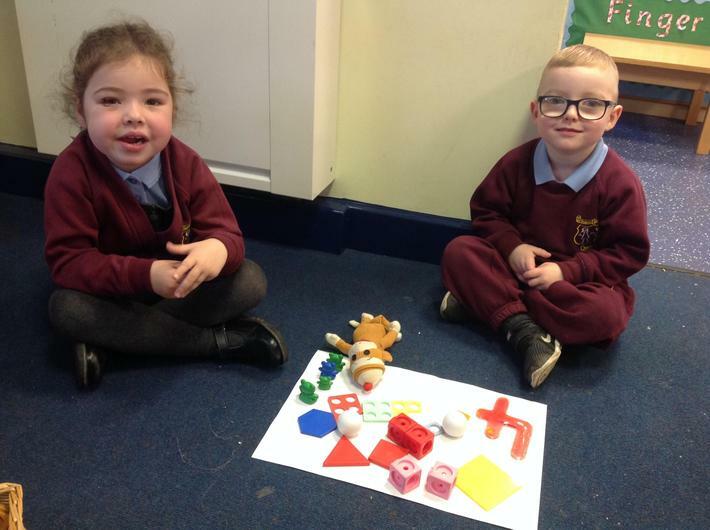 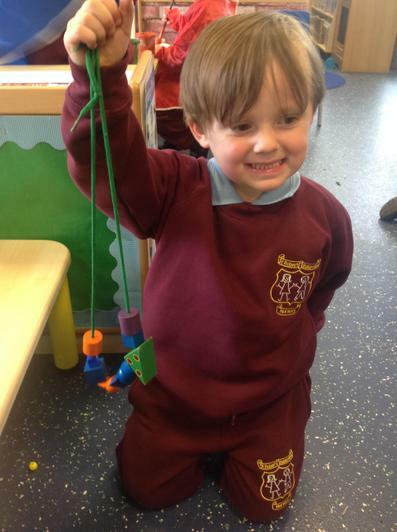 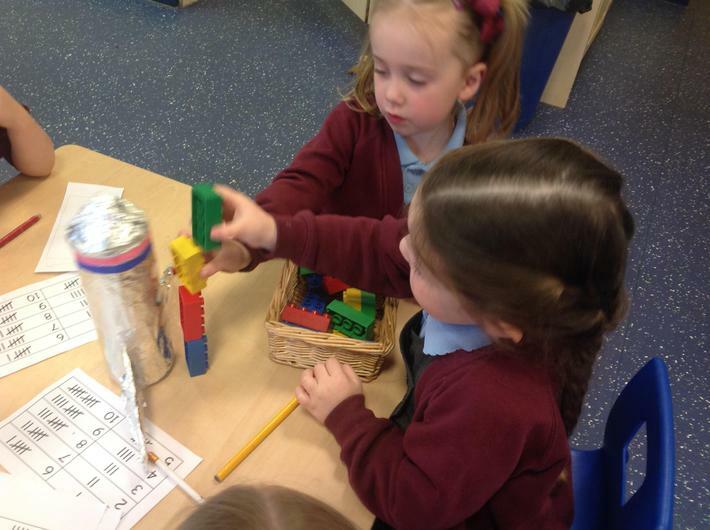 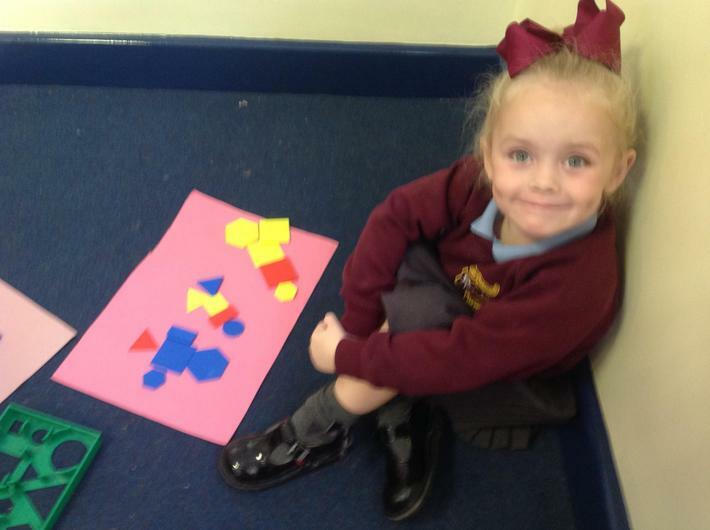 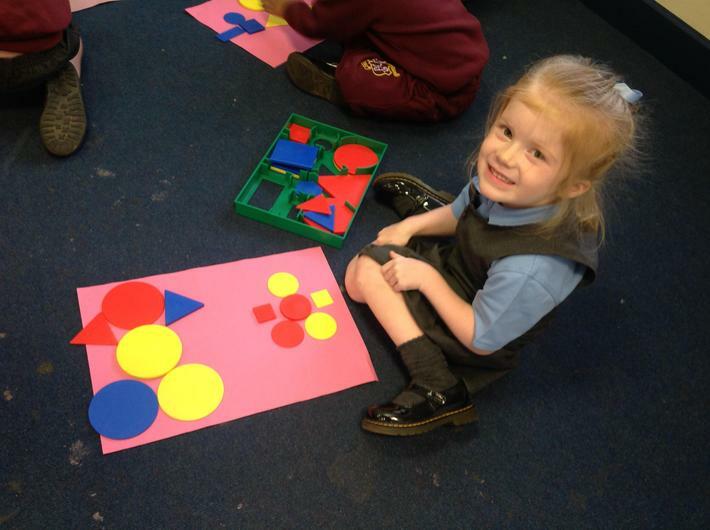 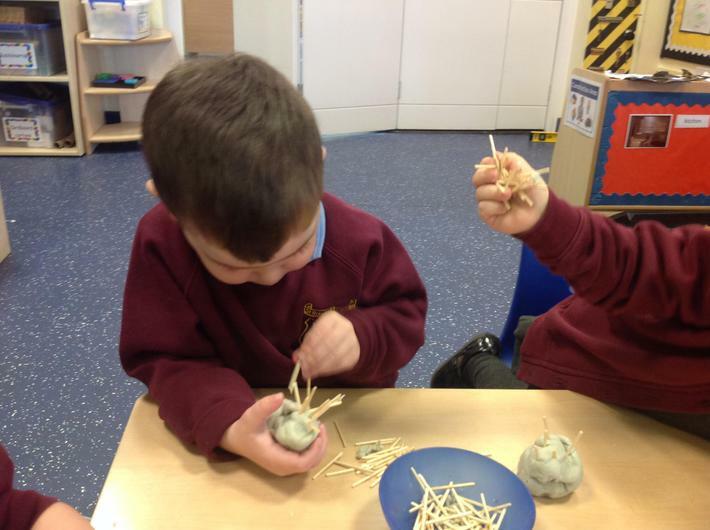 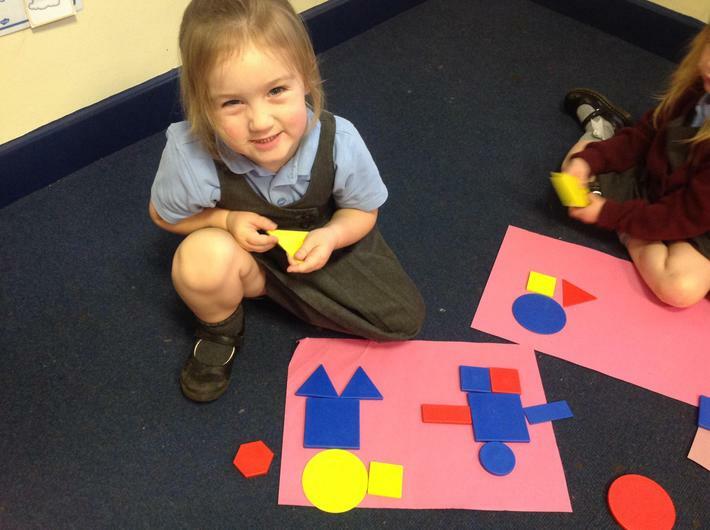 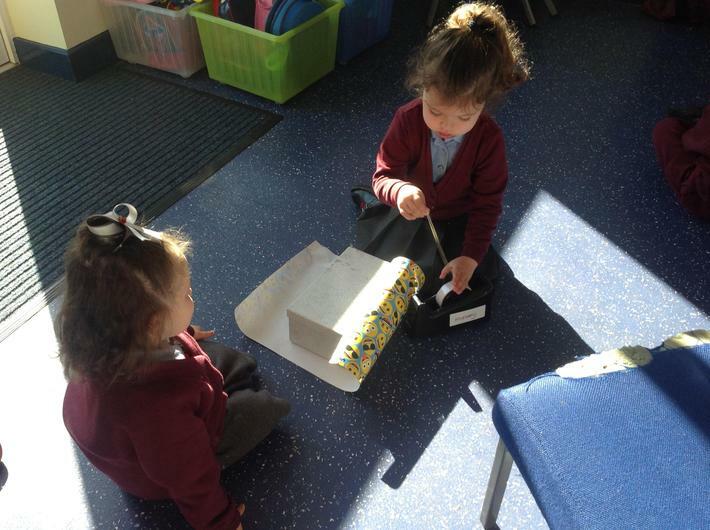 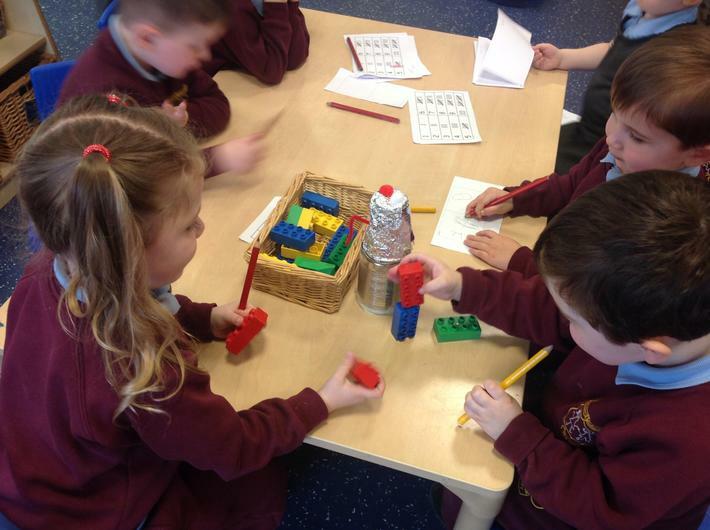 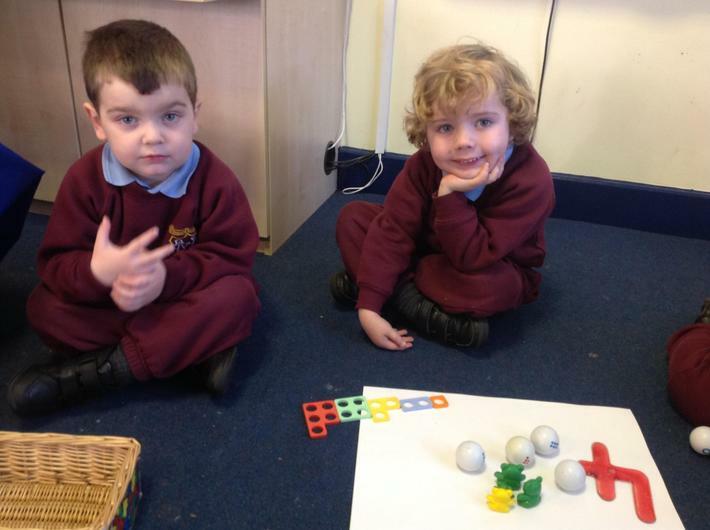 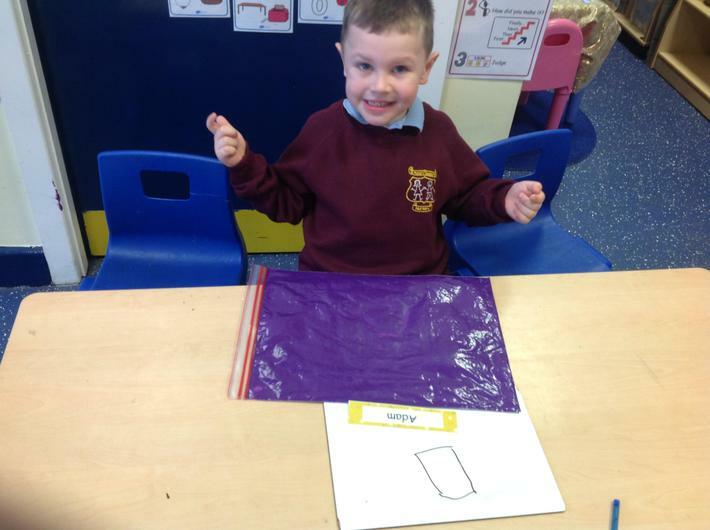 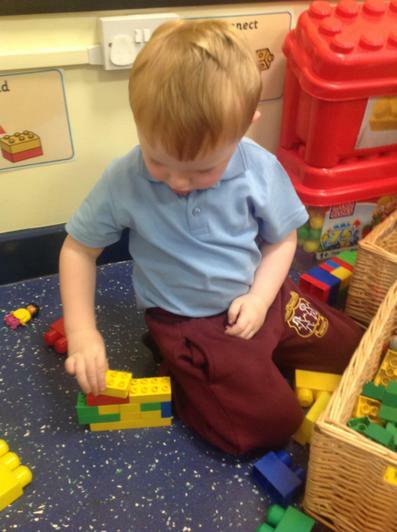 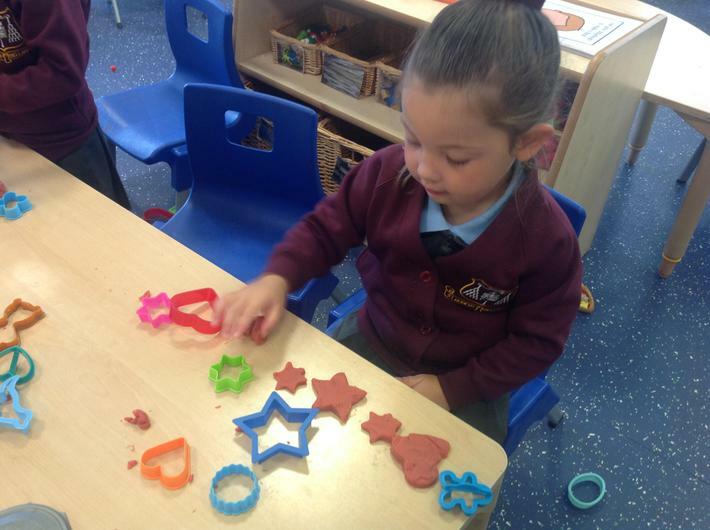 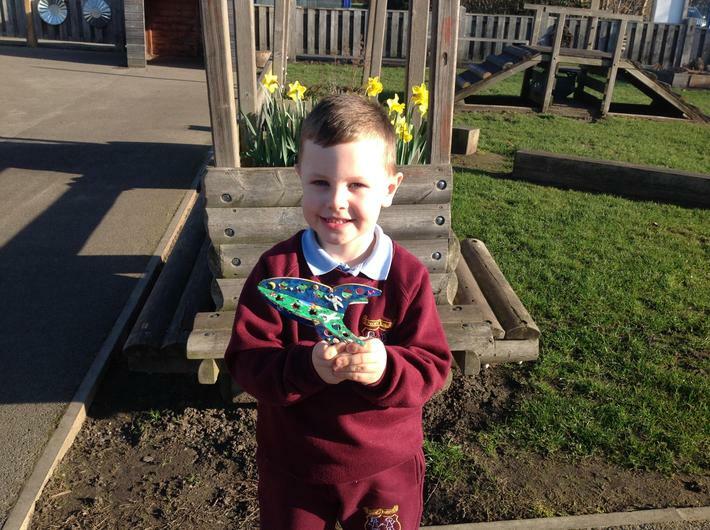 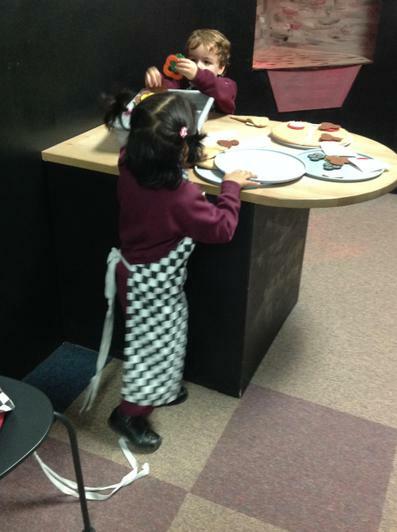 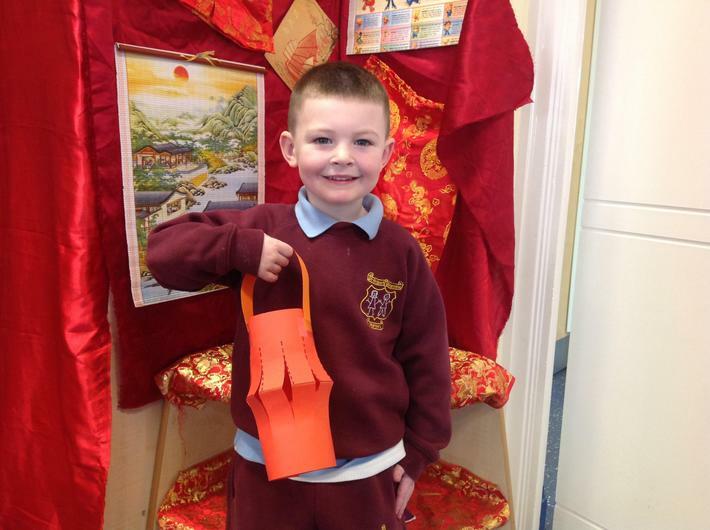 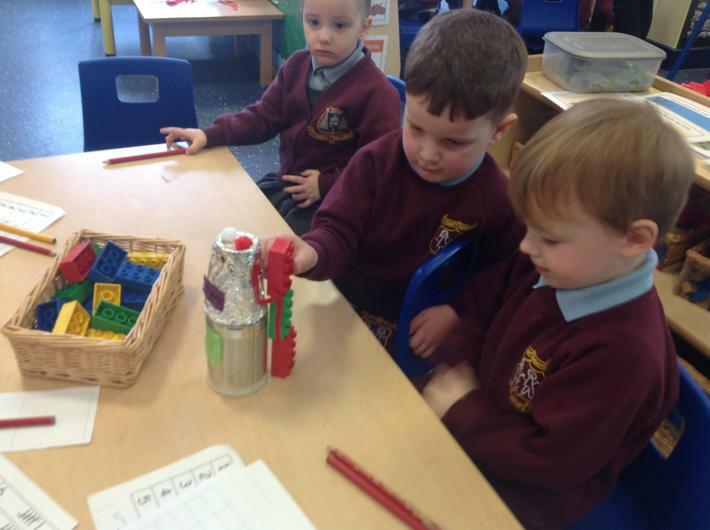 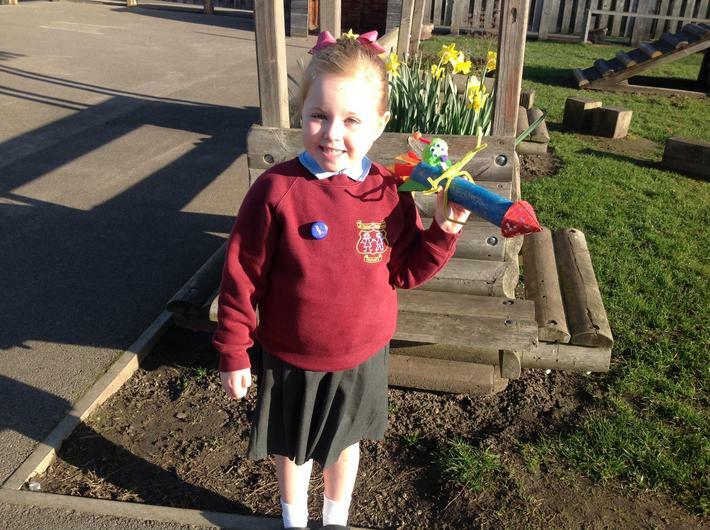 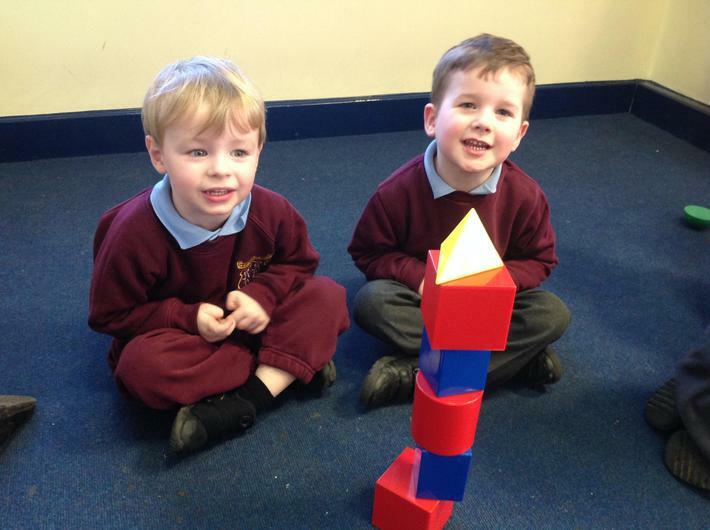 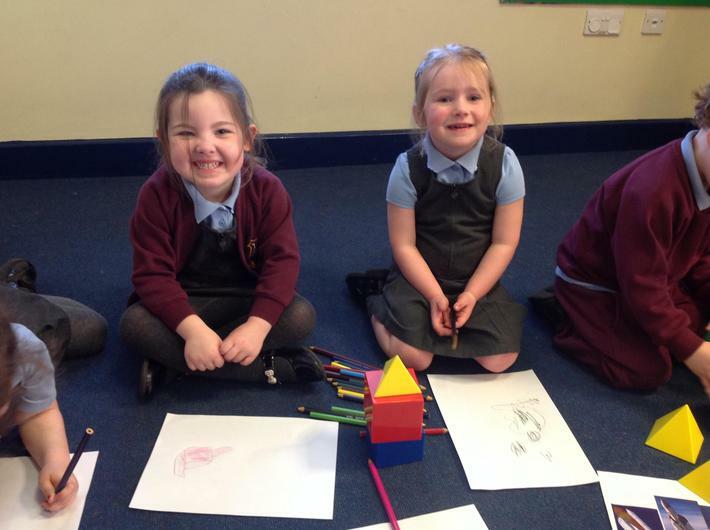 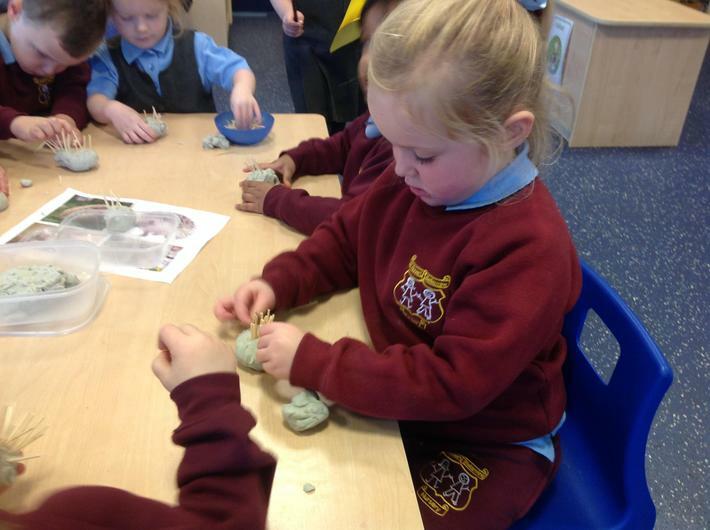 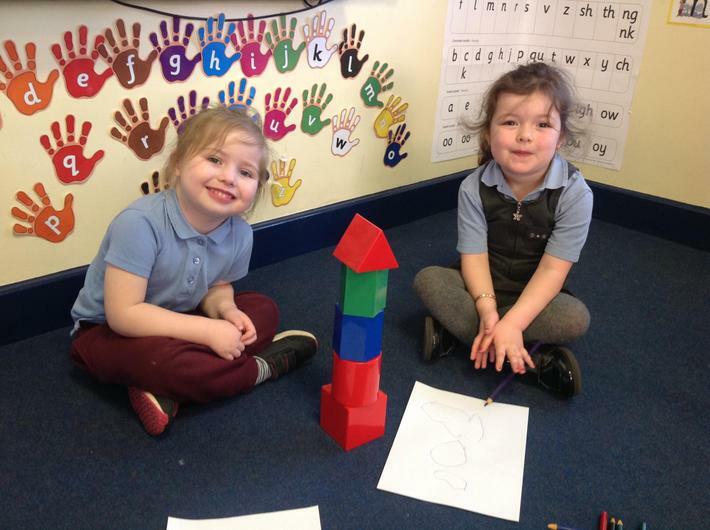 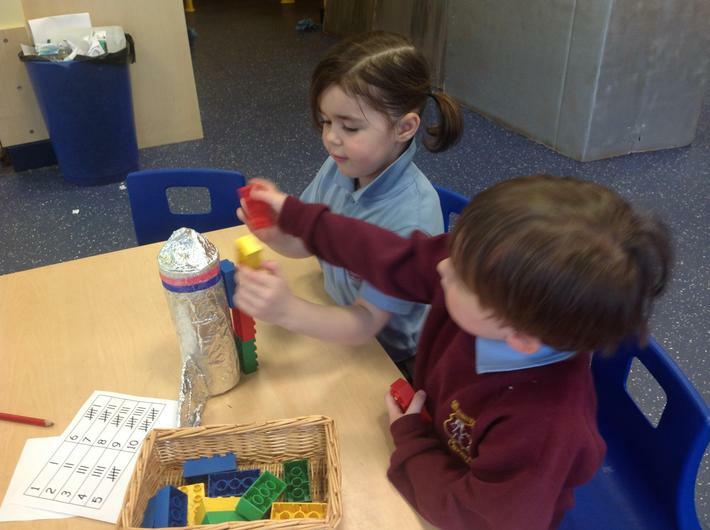 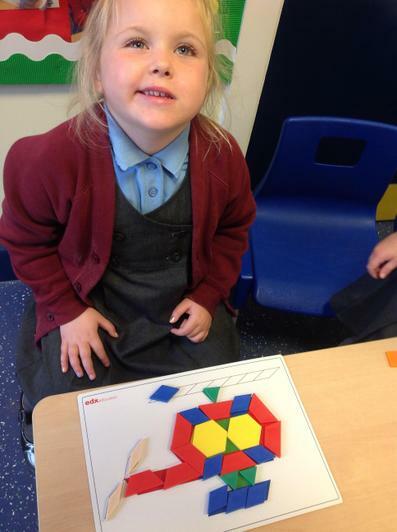 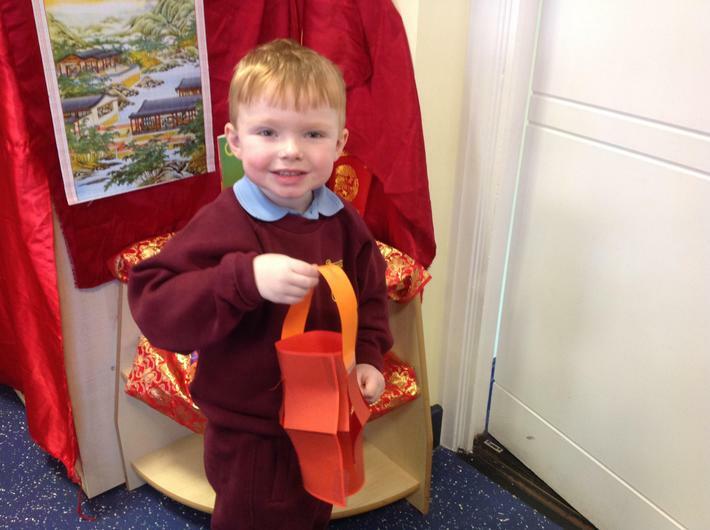 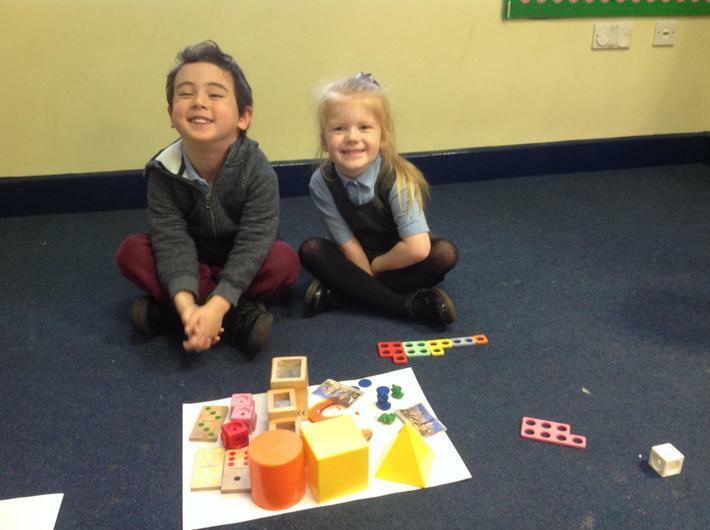 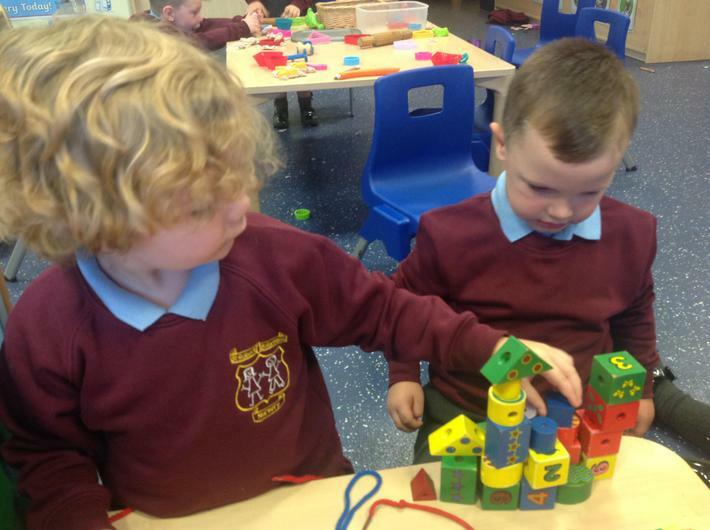 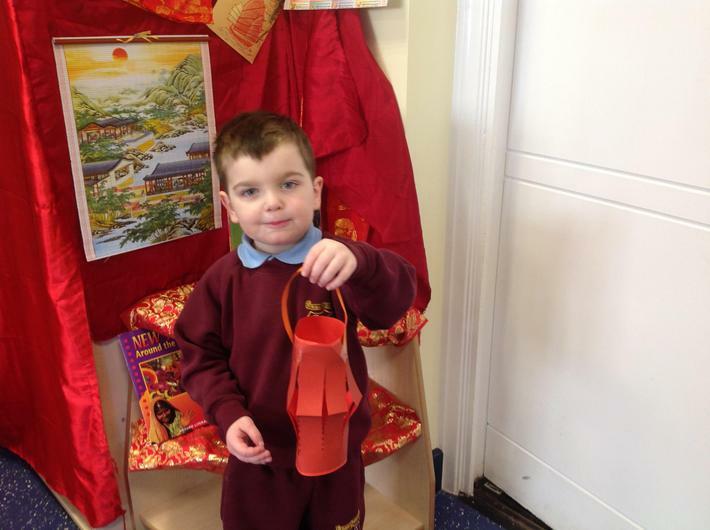 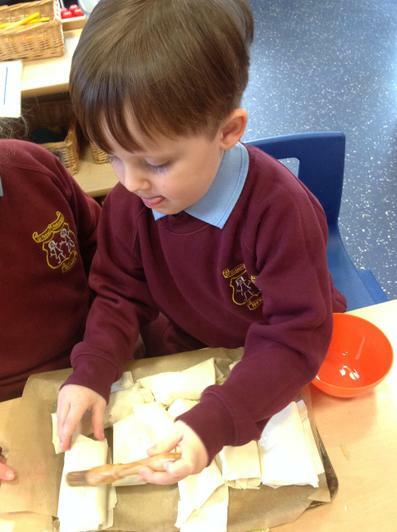 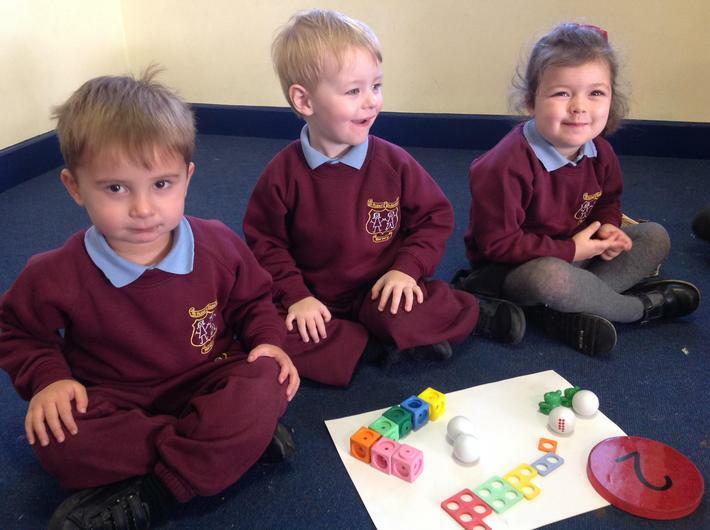 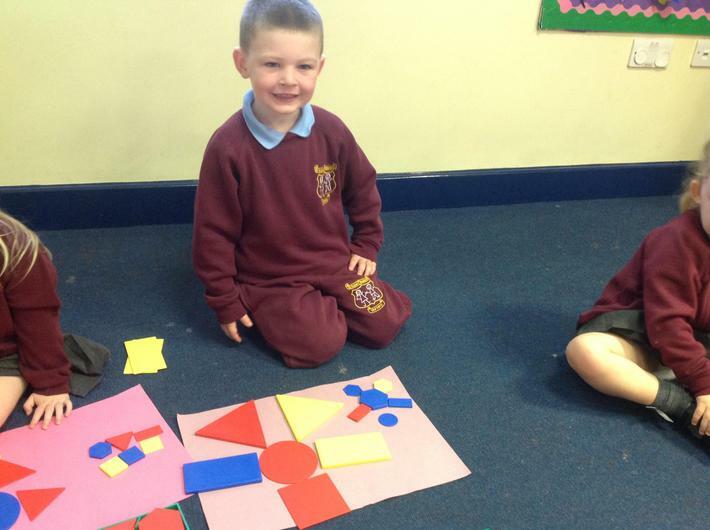 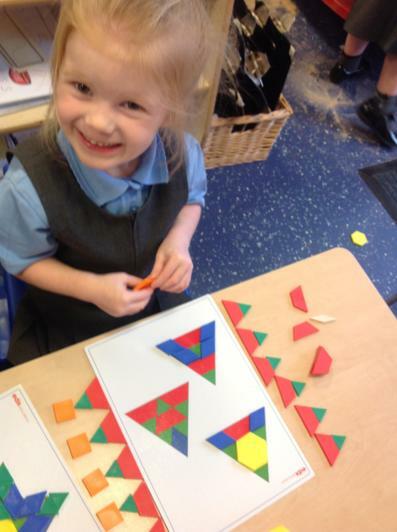 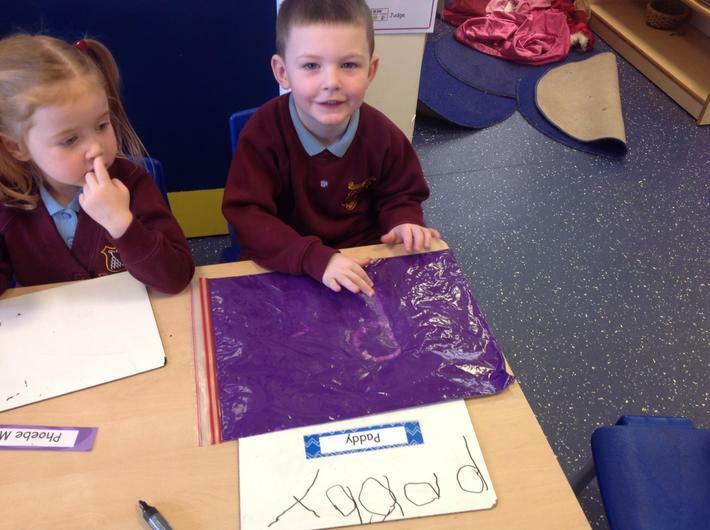 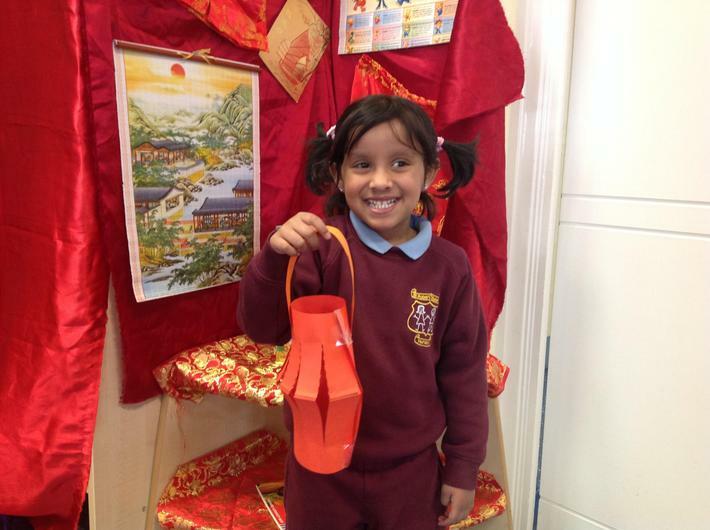 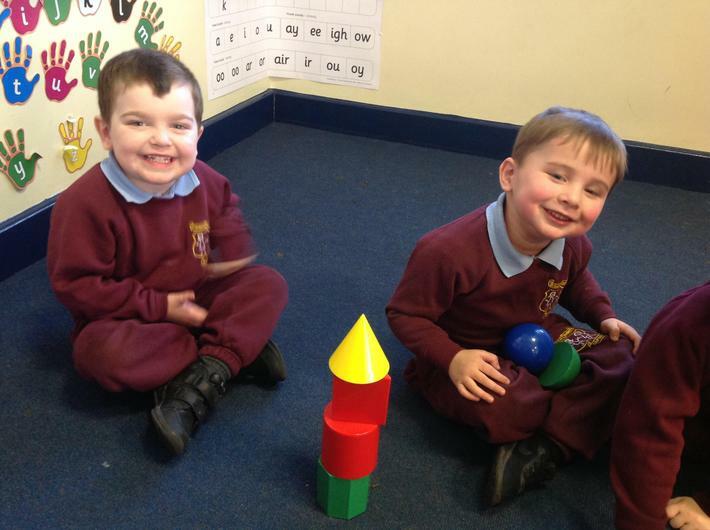 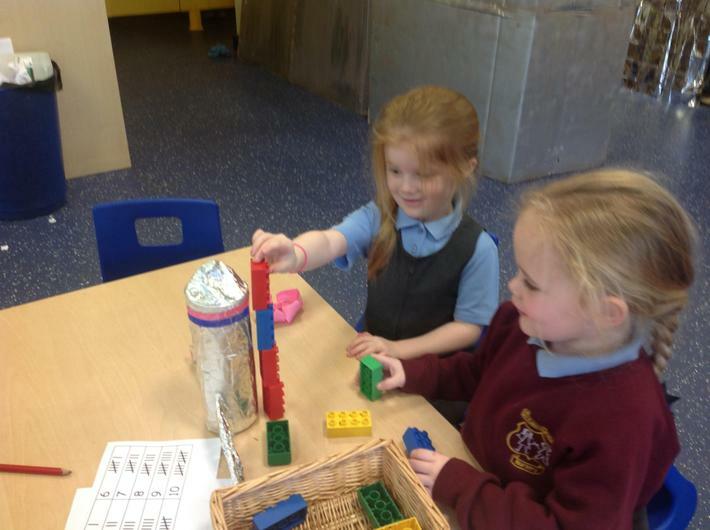 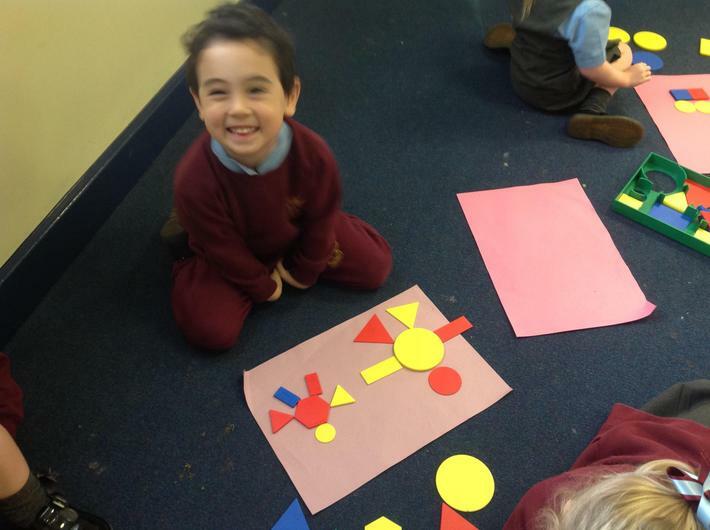 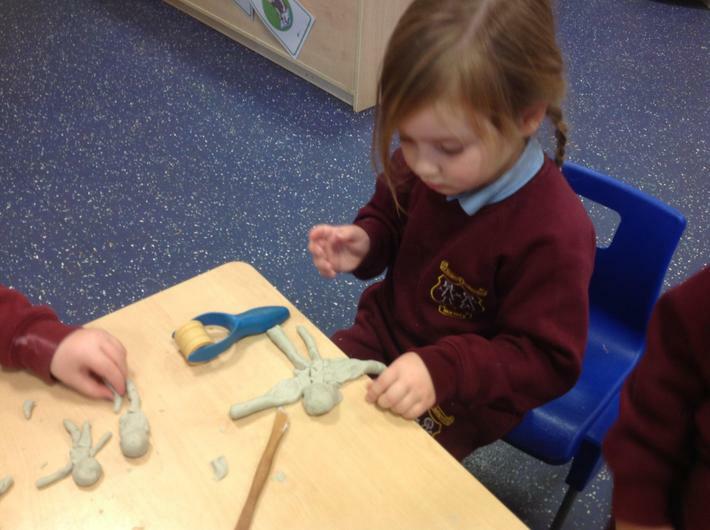 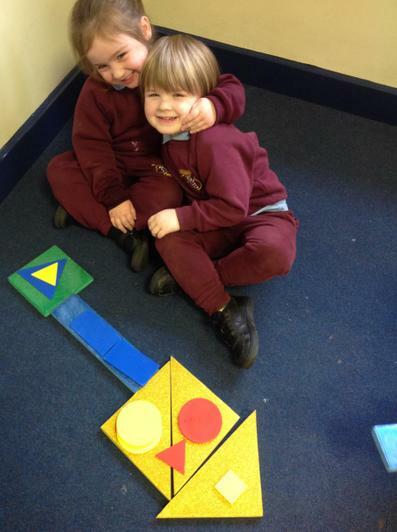 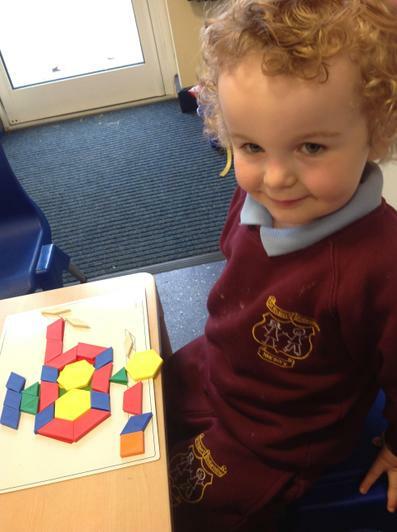 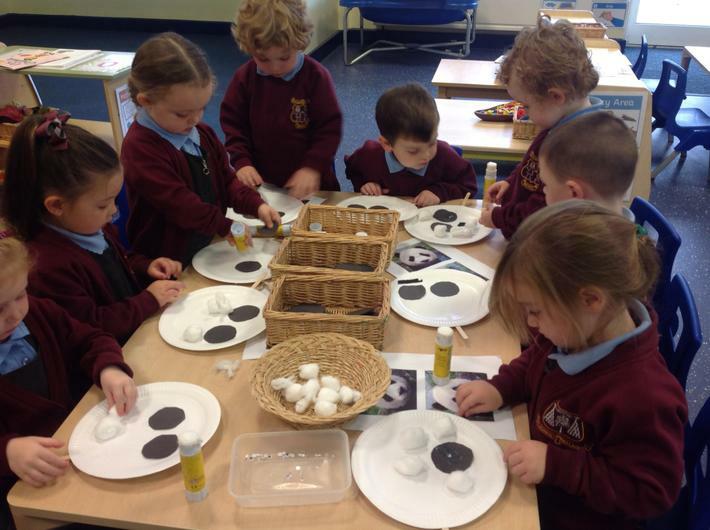 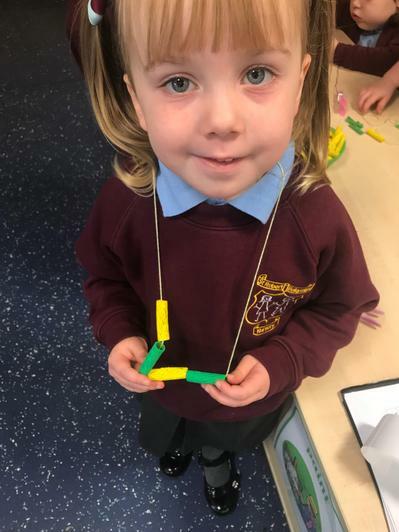 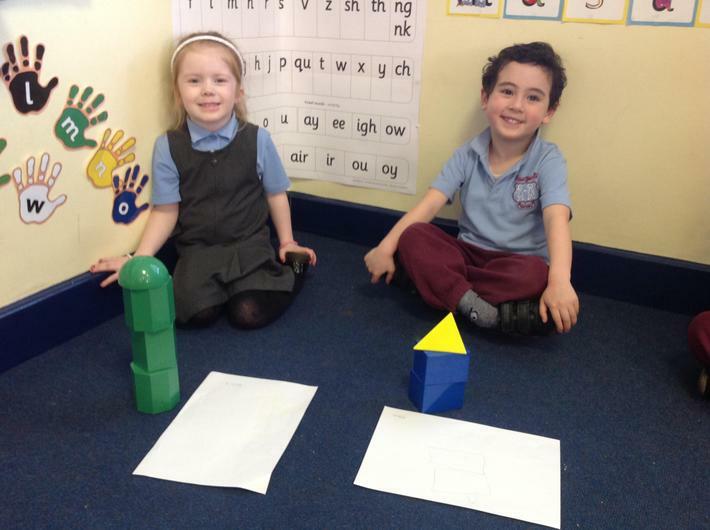 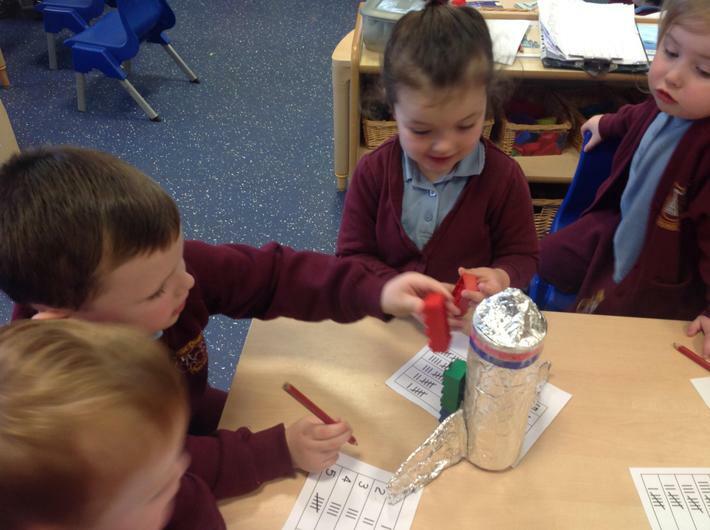 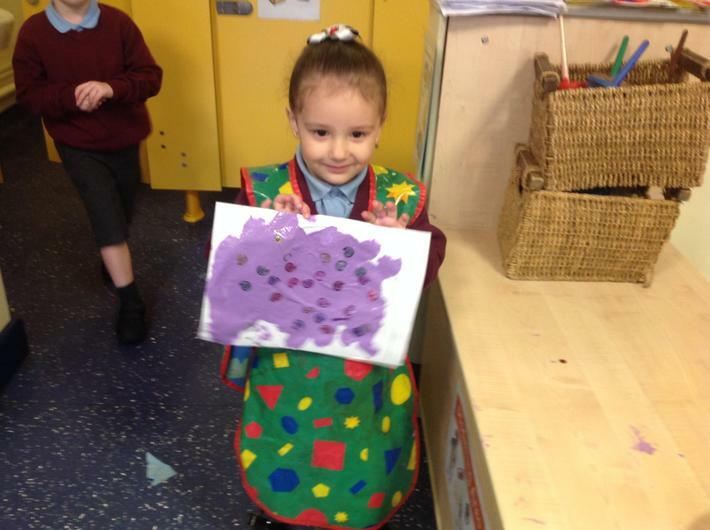 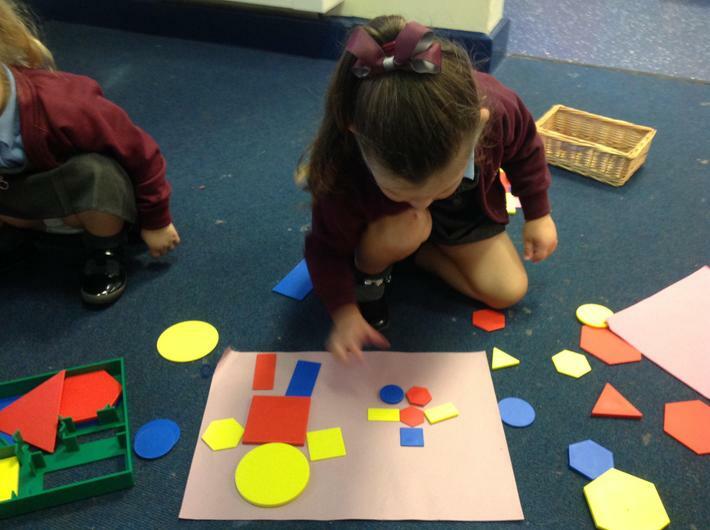 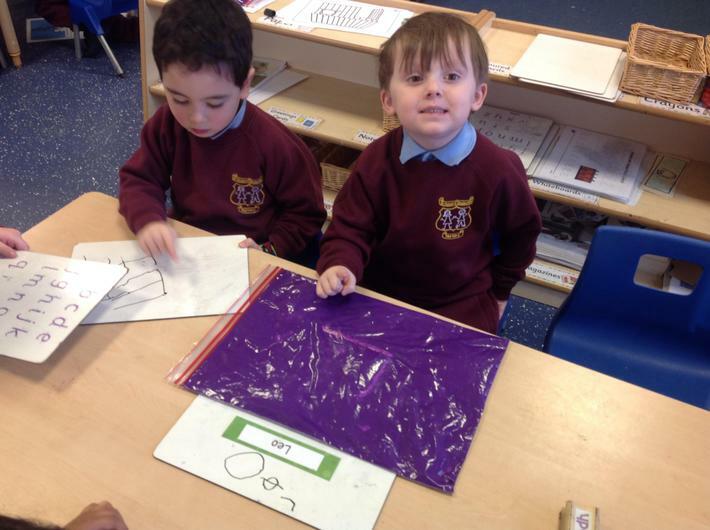 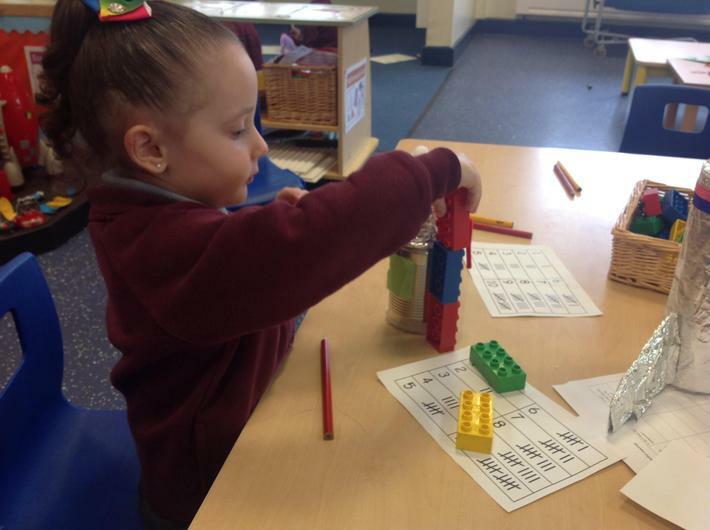 The class have been learning lots about 3D shapes and their properties. 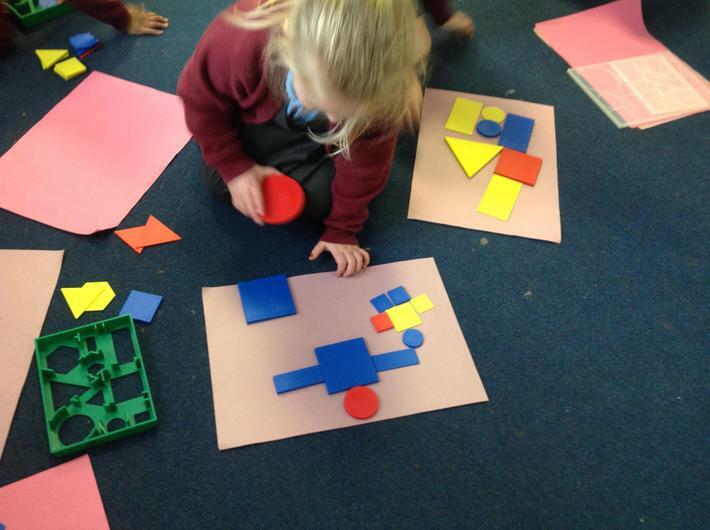 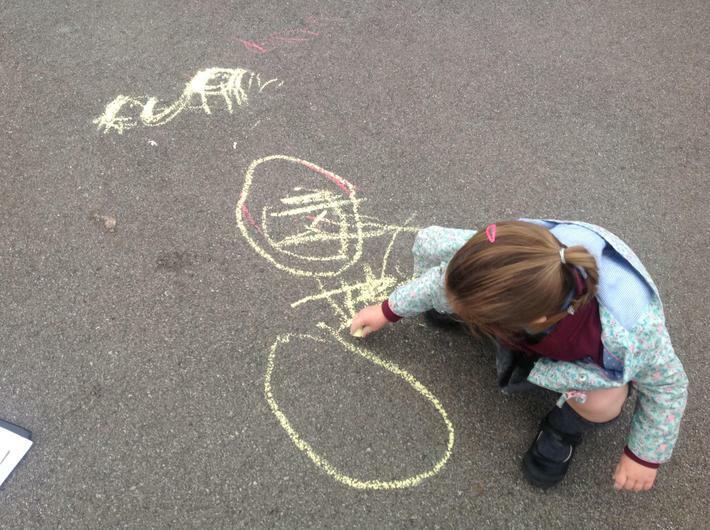 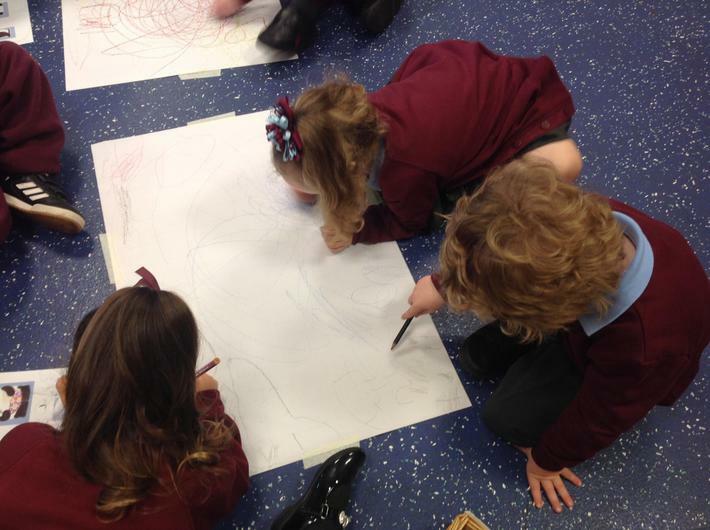 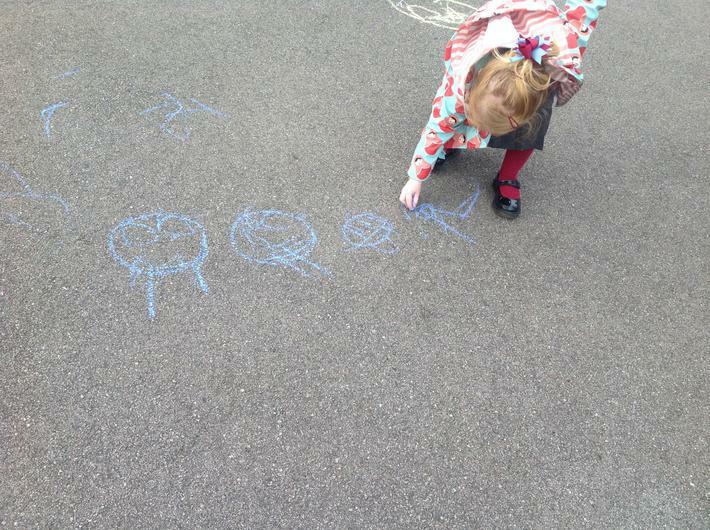 As they explored each shape they gained confidence in using language of corners, faces, sides, curved and straight. 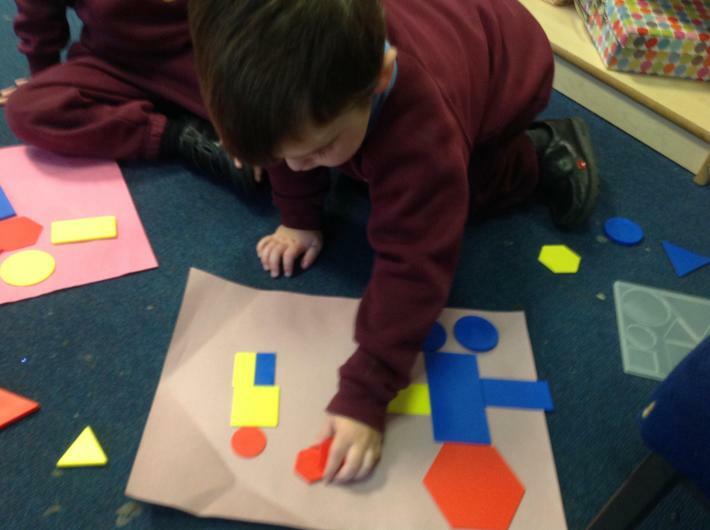 They then began to reason about whether they thought the shapes would or would not roll based on these properties. 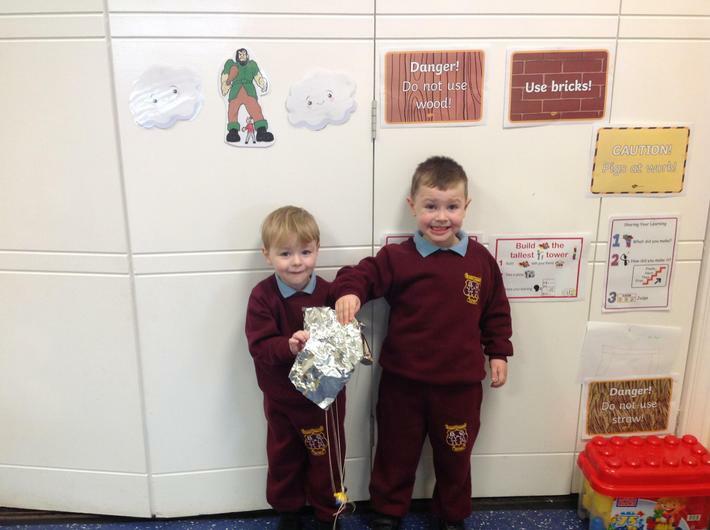 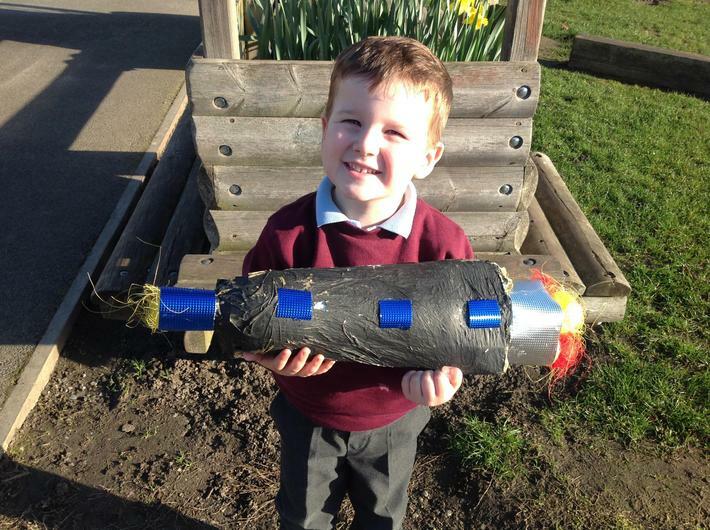 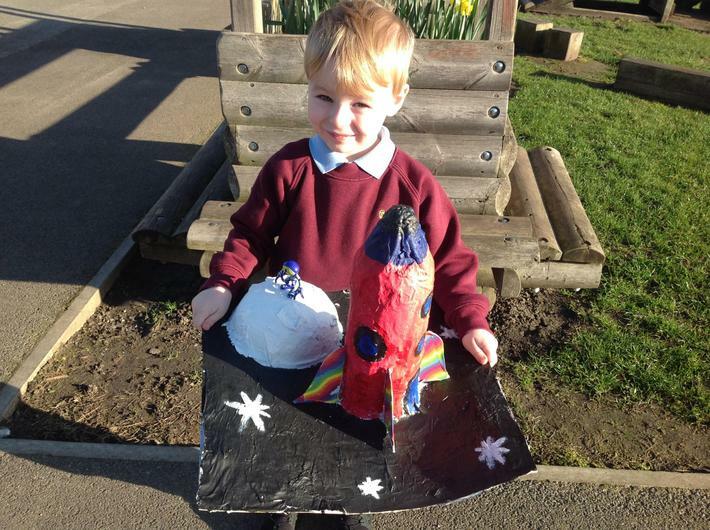 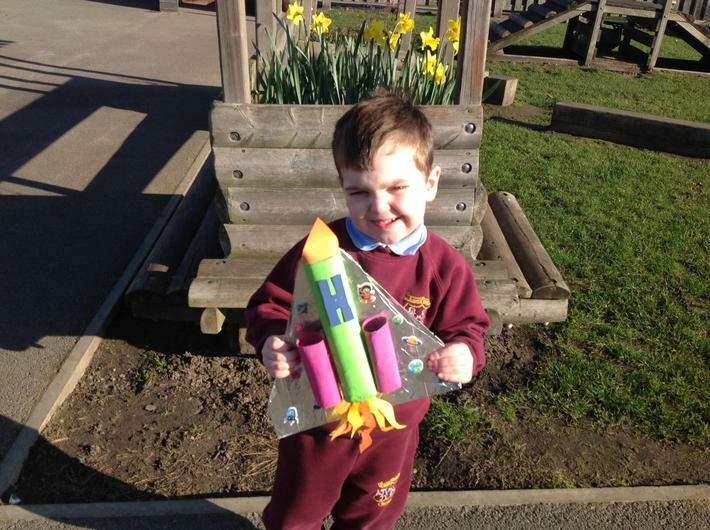 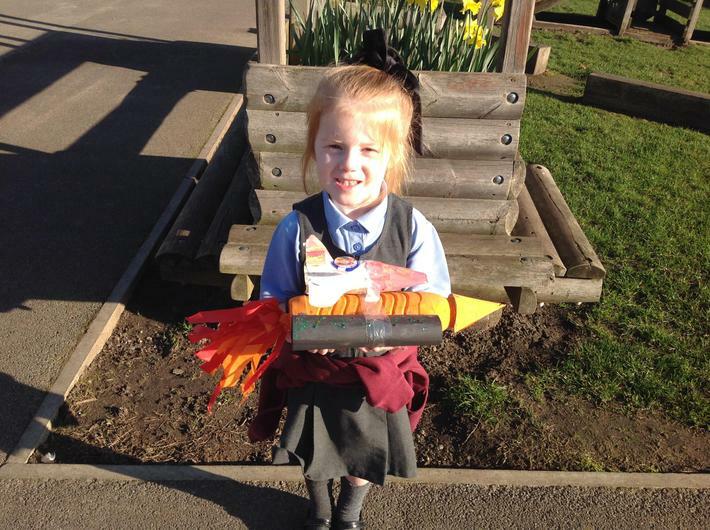 Afterwards they built a 3D rocket and drew their designs. 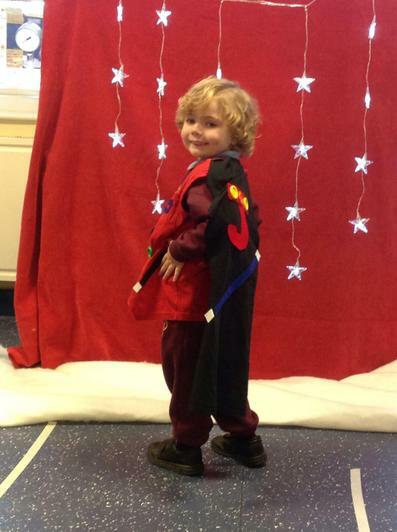 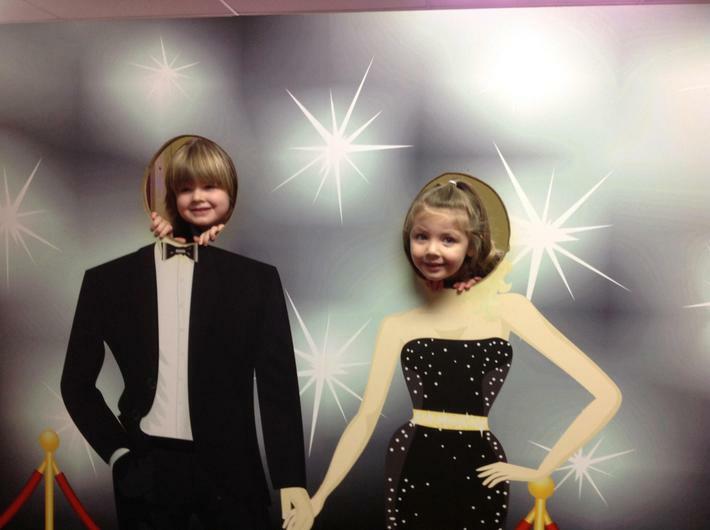 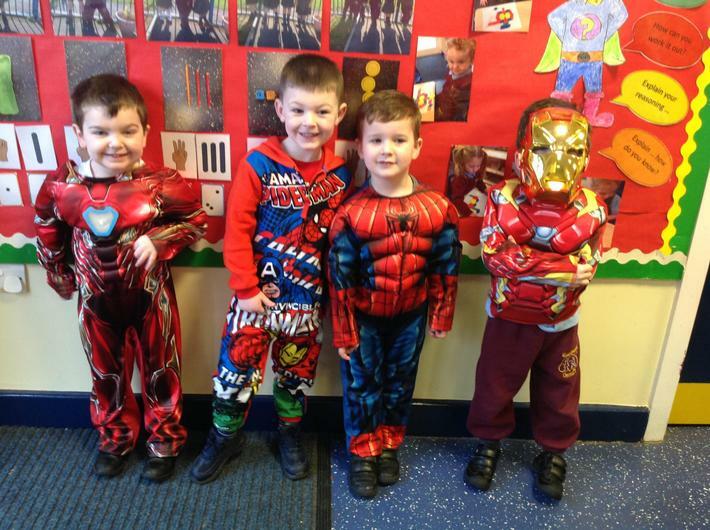 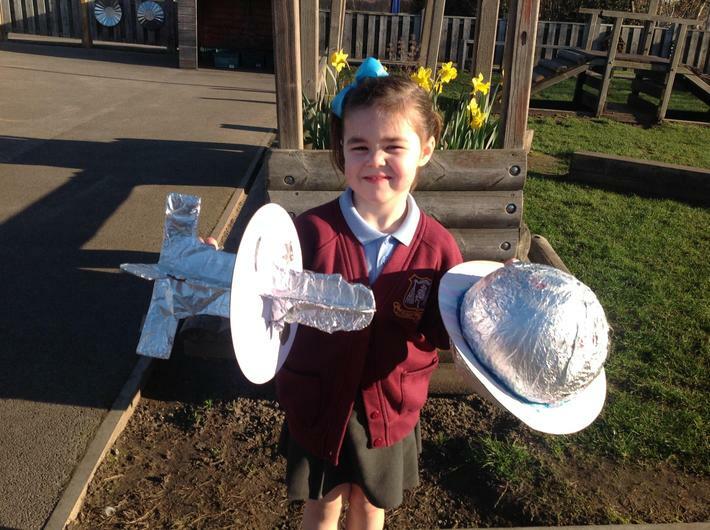 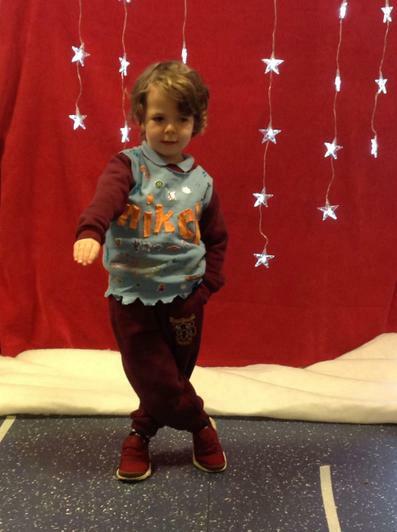 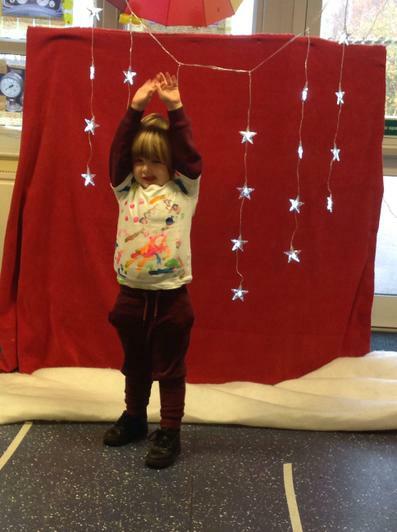 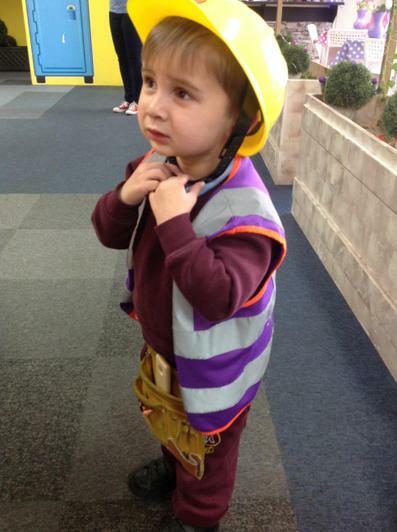 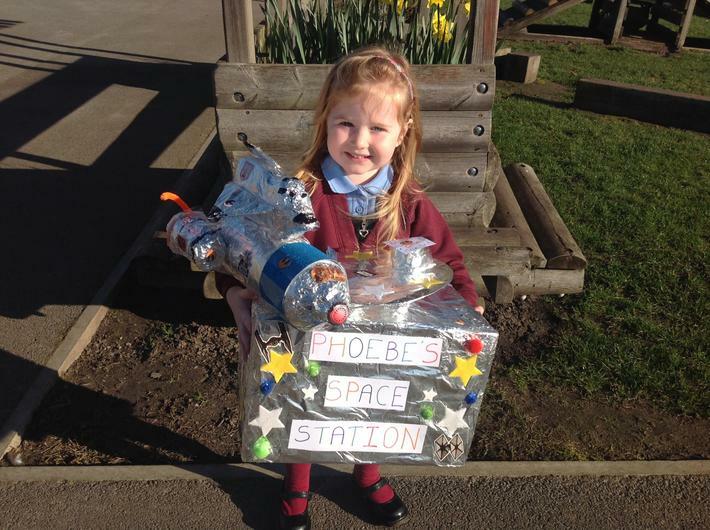 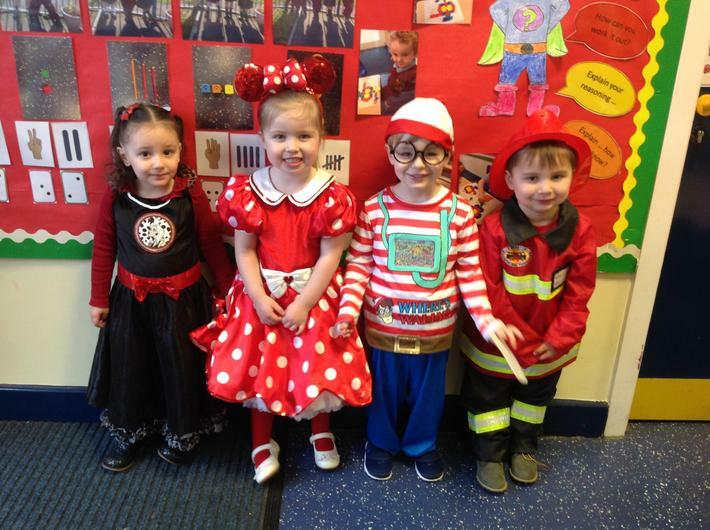 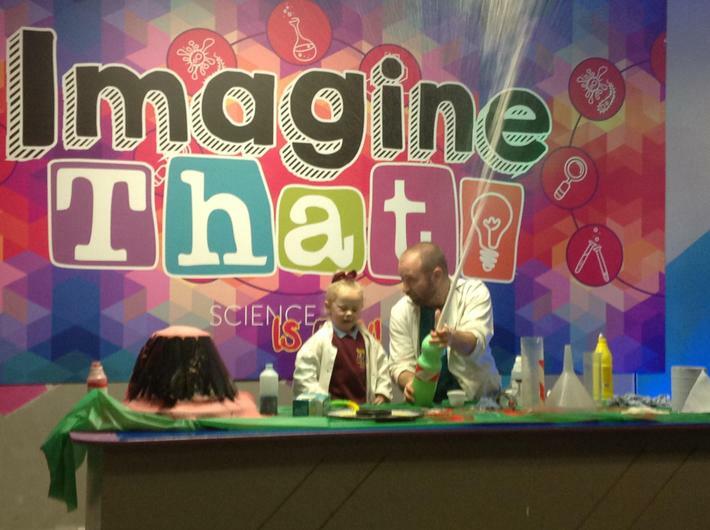 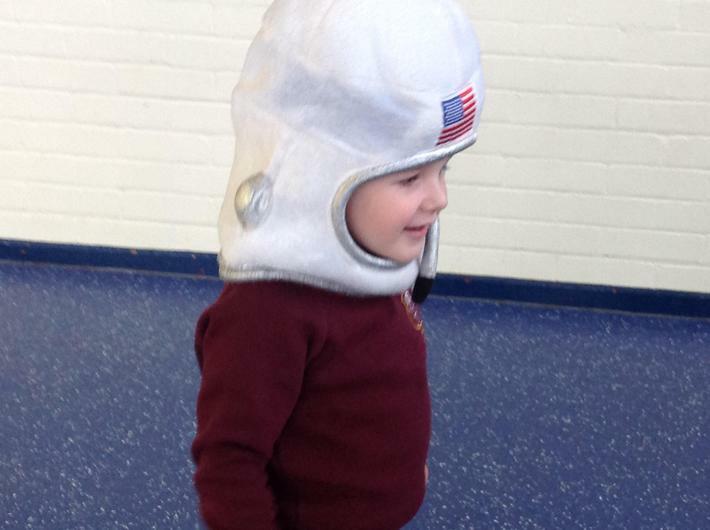 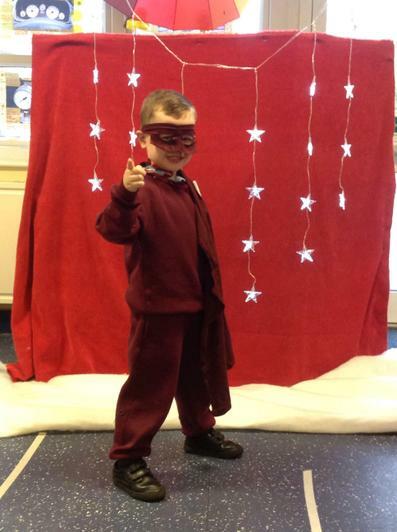 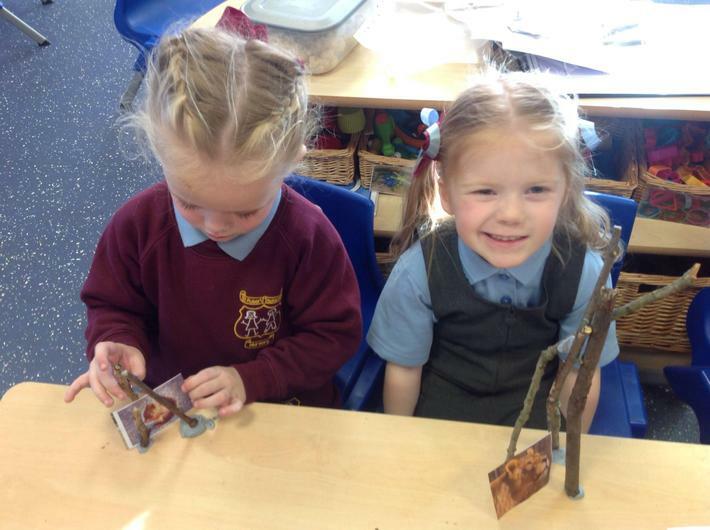 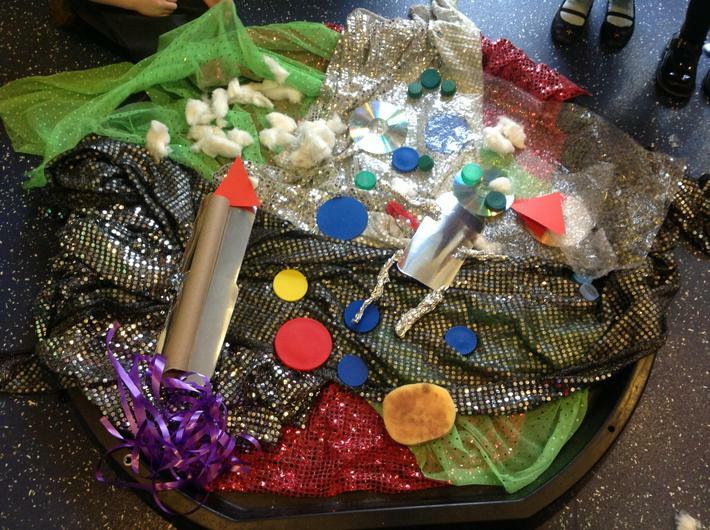 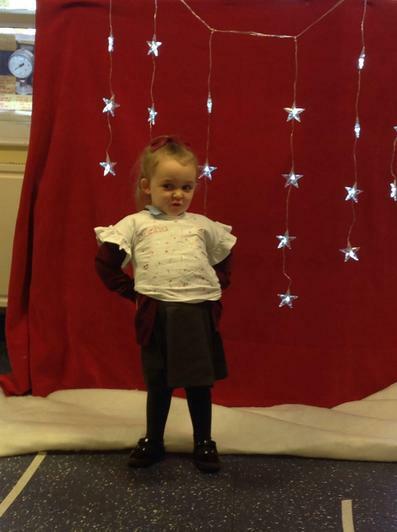 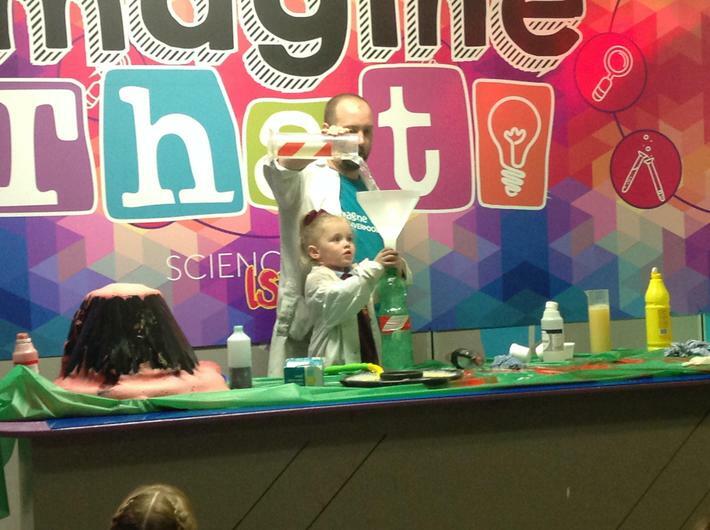 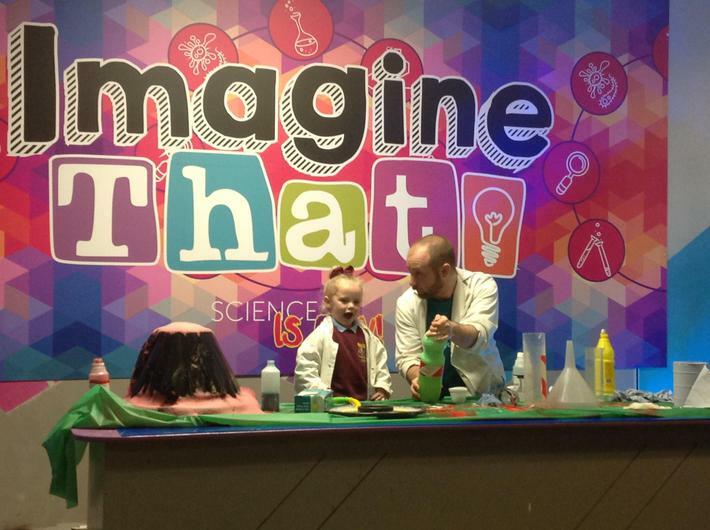 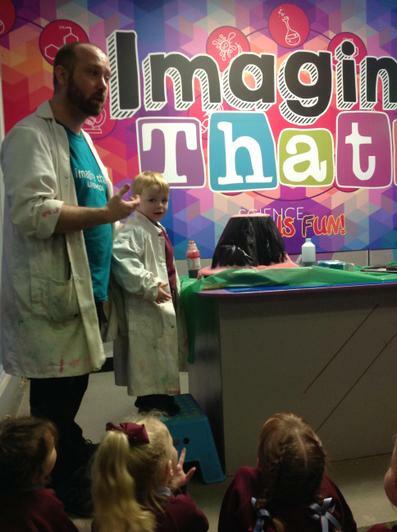 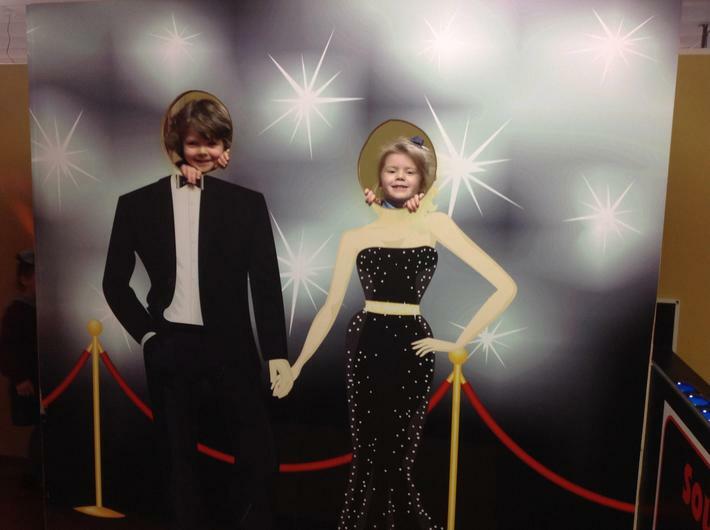 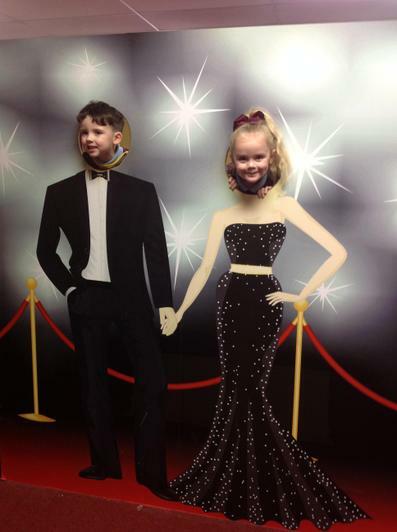 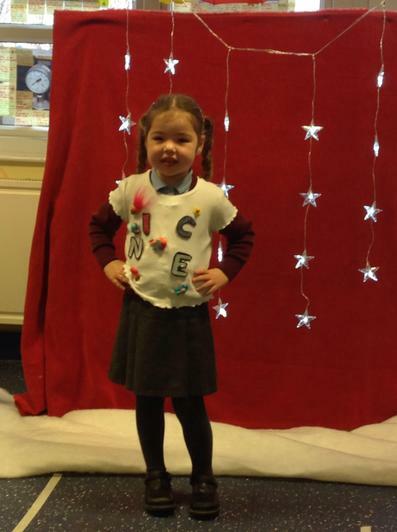 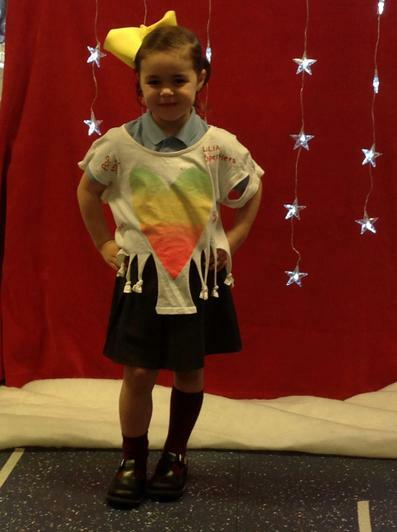 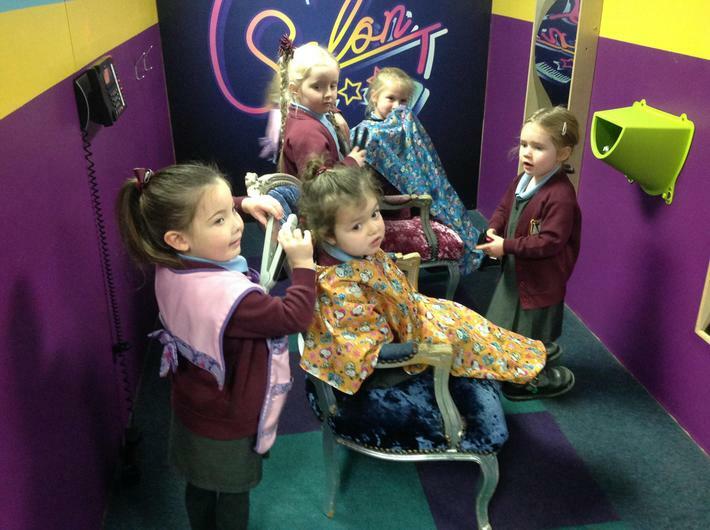 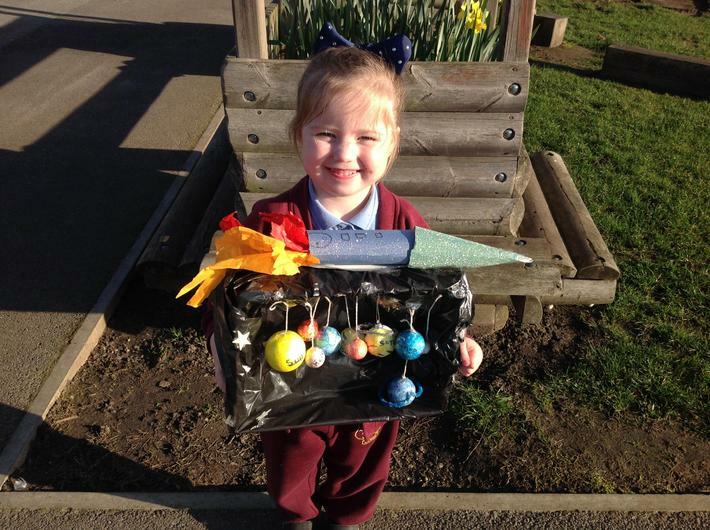 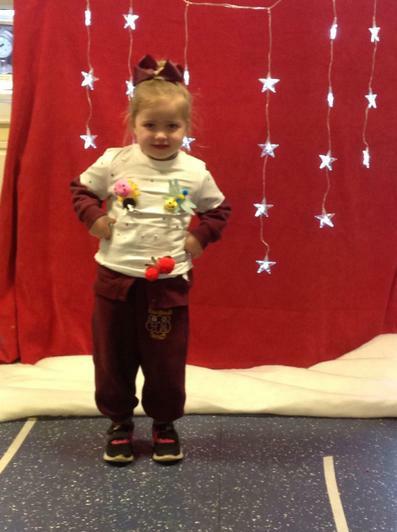 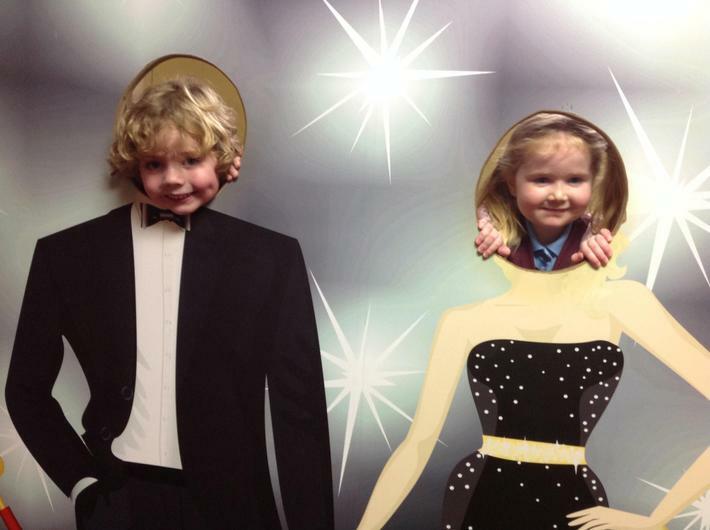 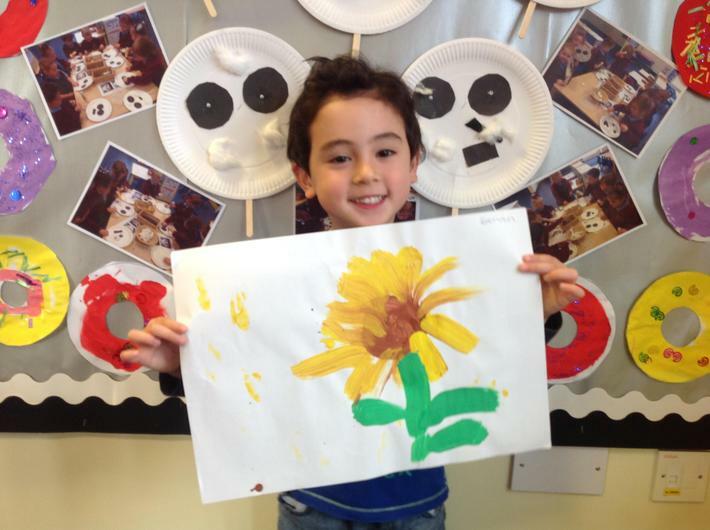 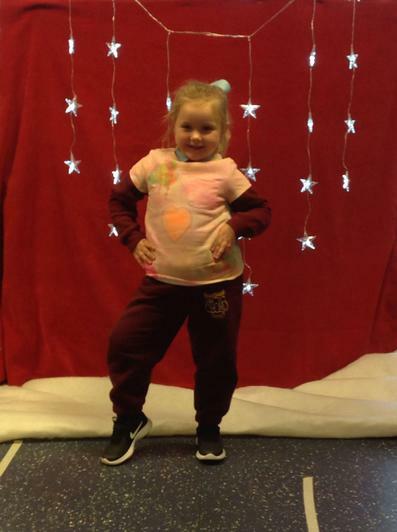 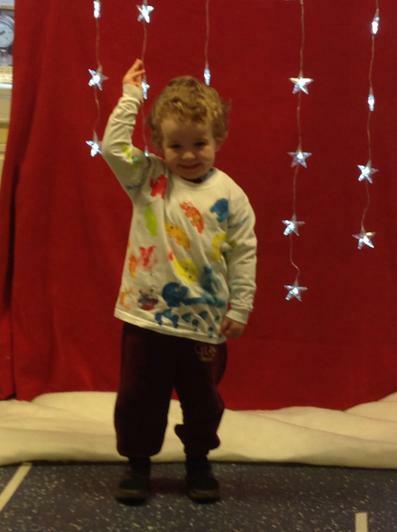 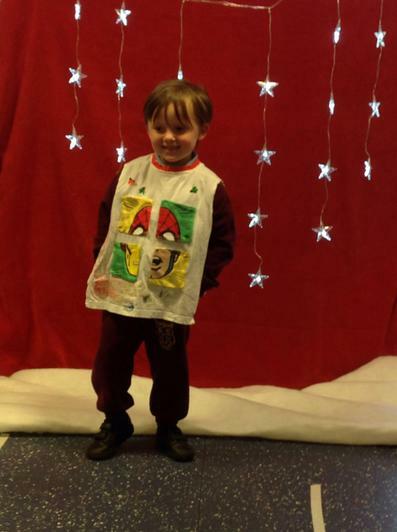 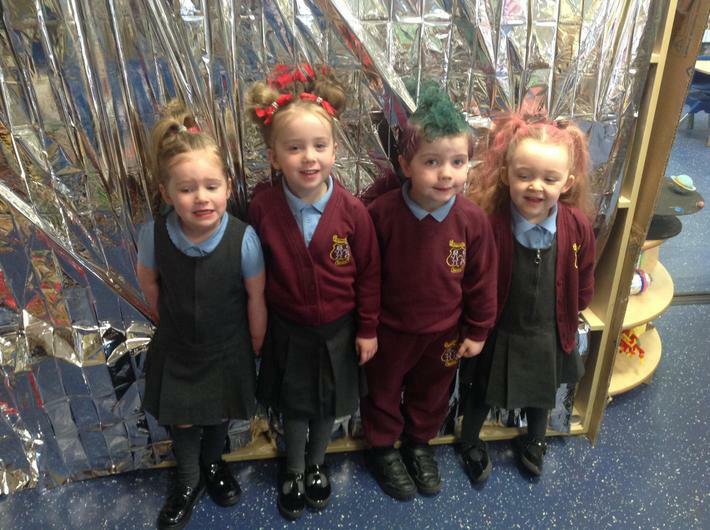 A huge thank you to everyone who helped at home to create such an amazing array of fantastically creative models! 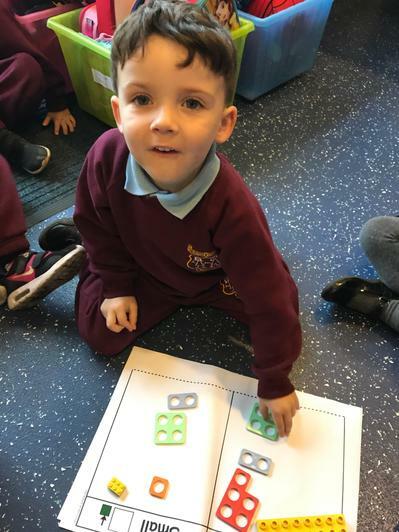 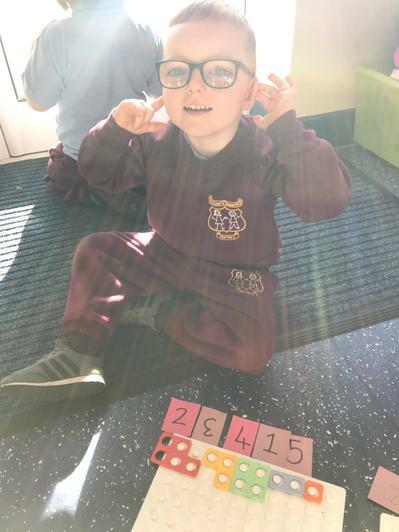 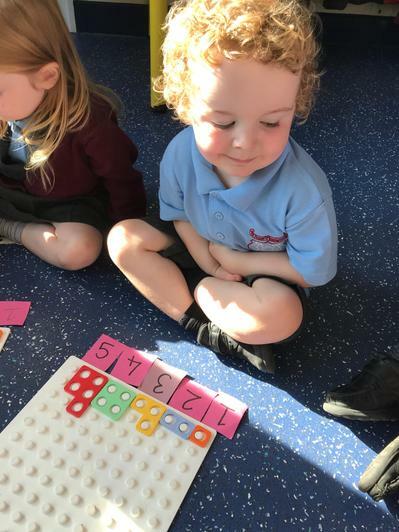 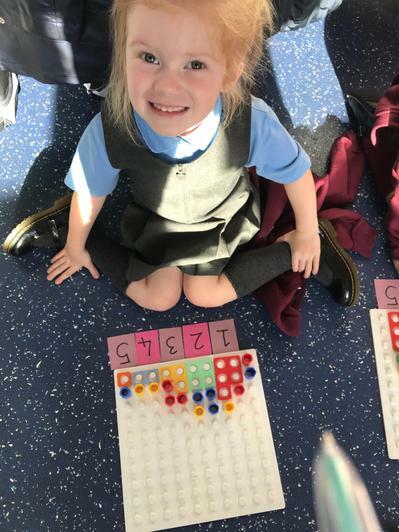 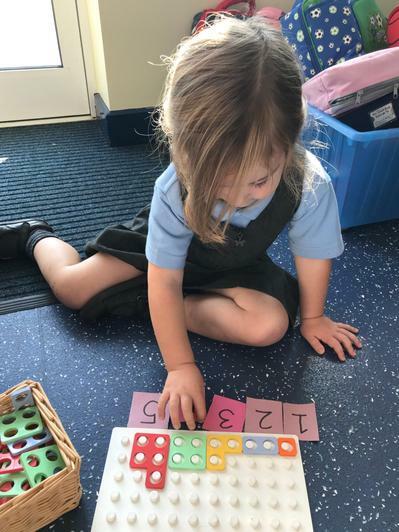 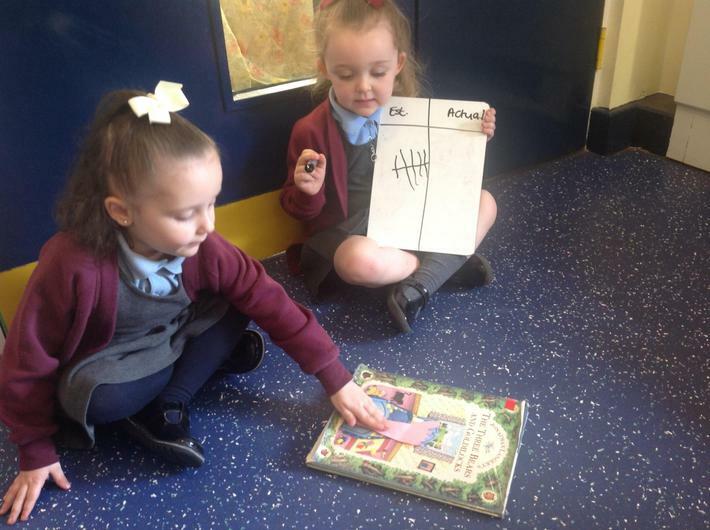 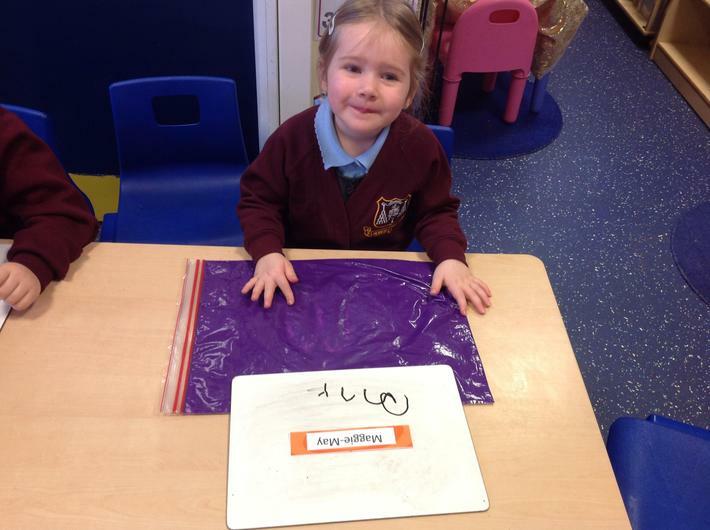 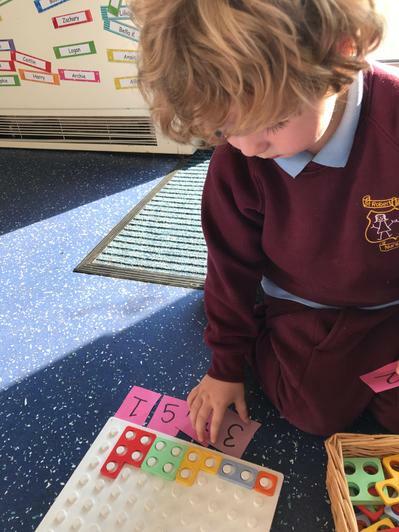 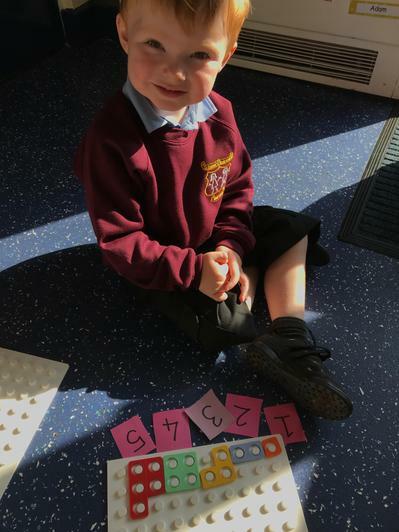 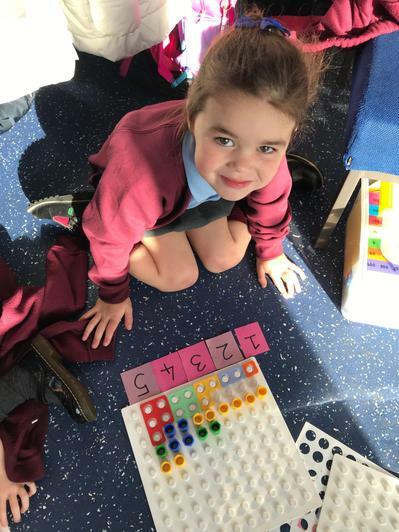 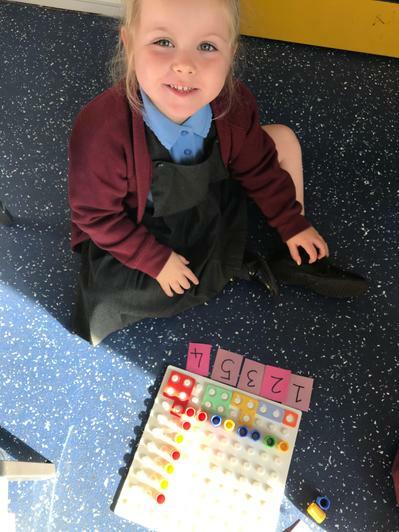 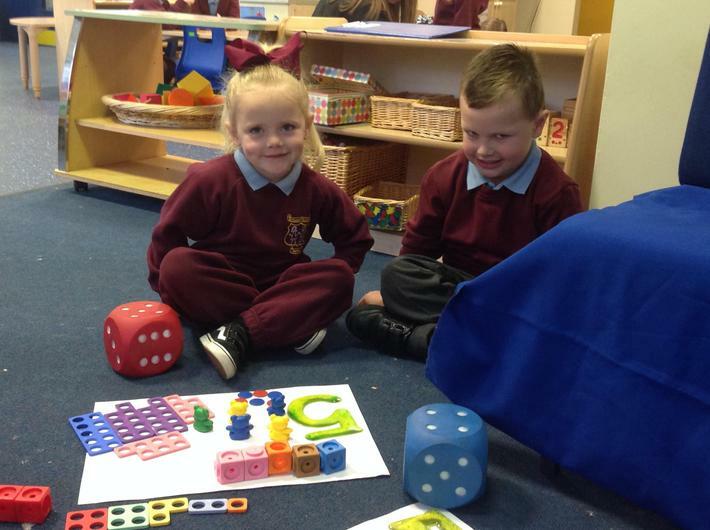 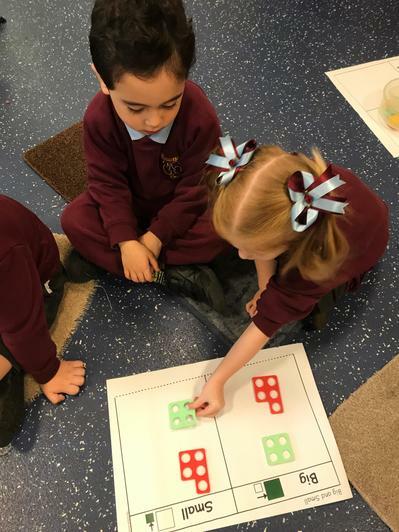 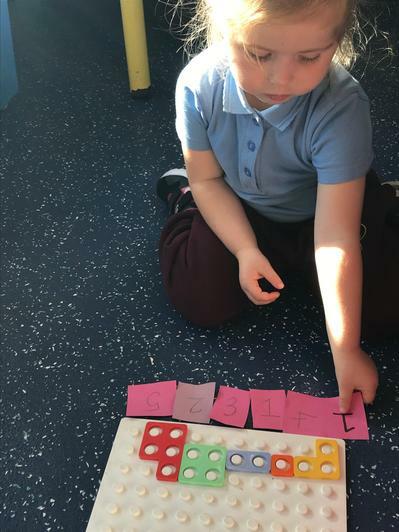 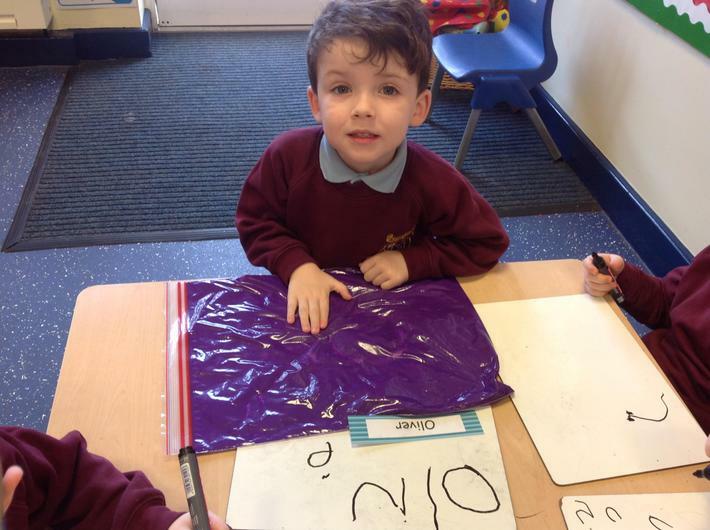 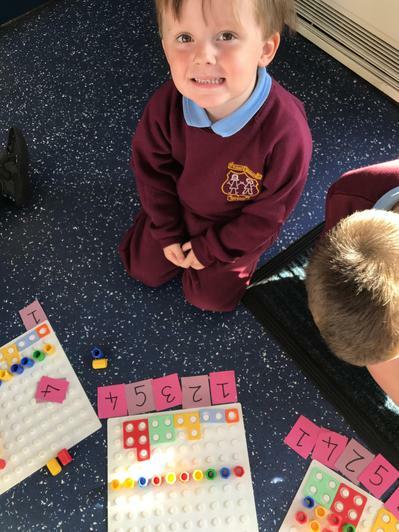 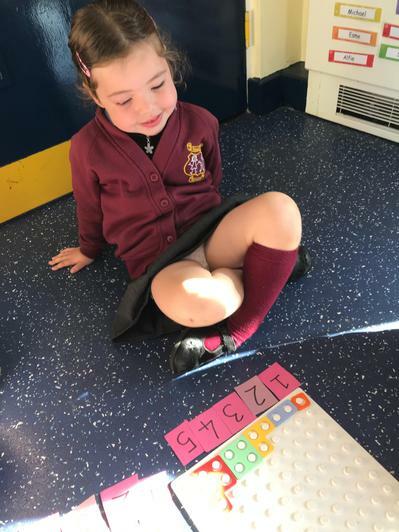 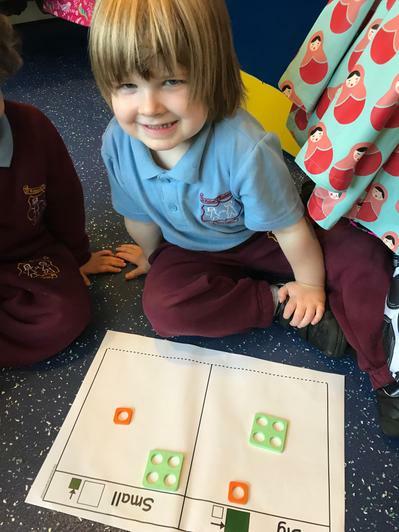 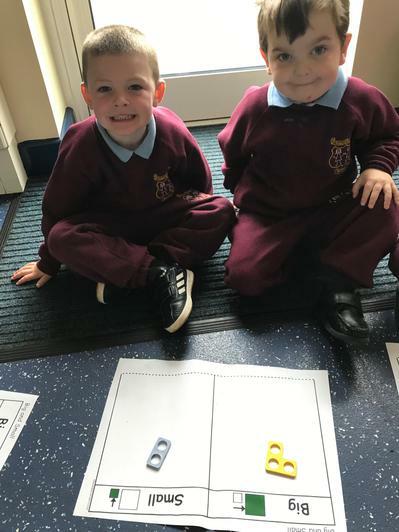 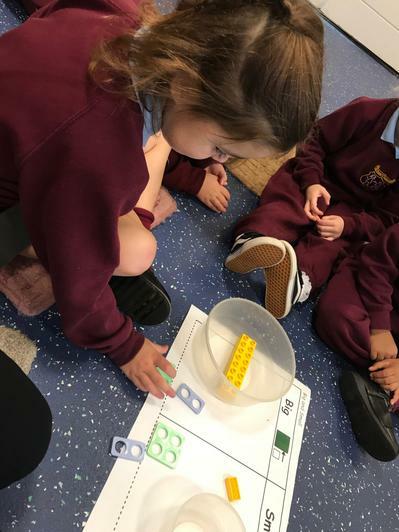 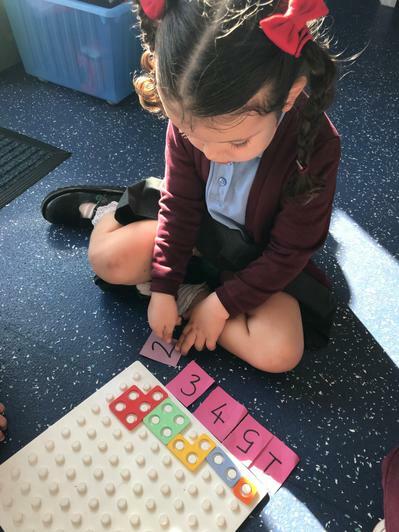 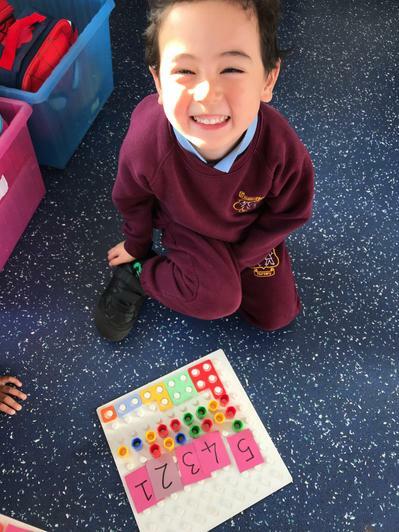 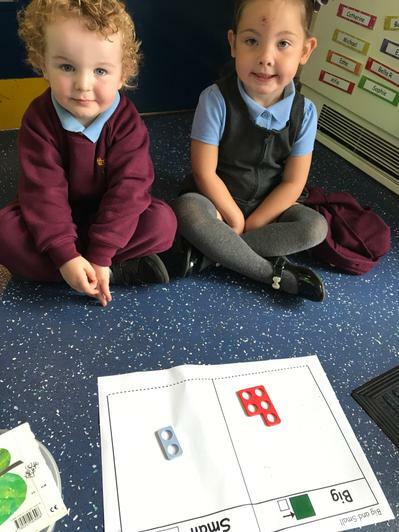 Throughout the year we have been exploring the use of tallies, pictures and numerical representations to record numbers 1-10 in different forms. 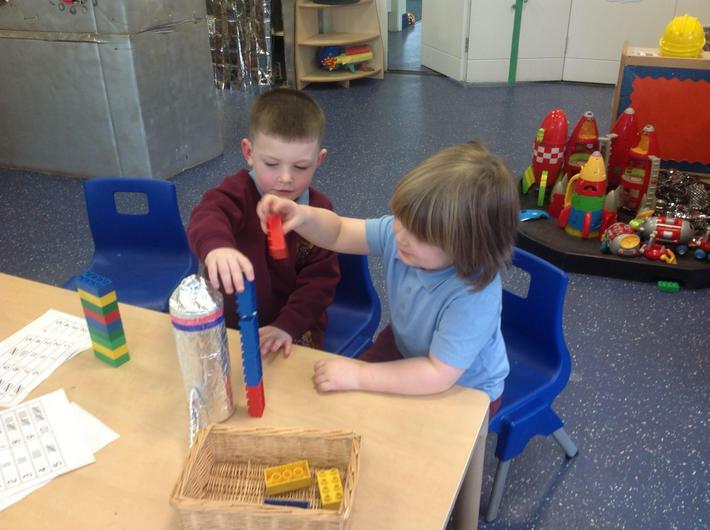 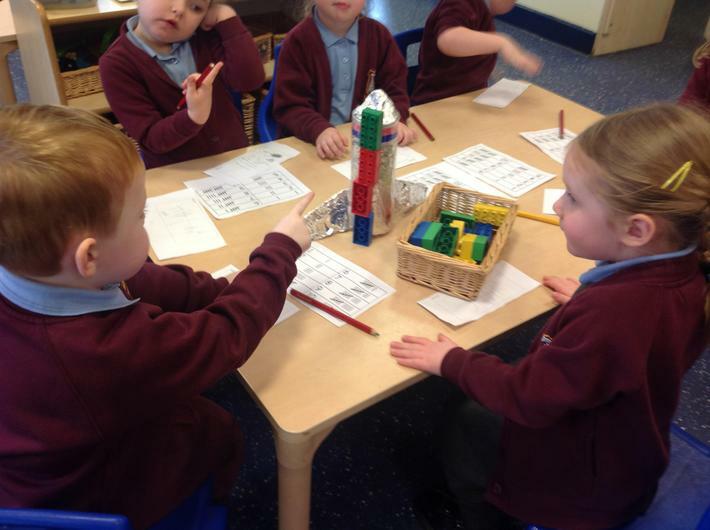 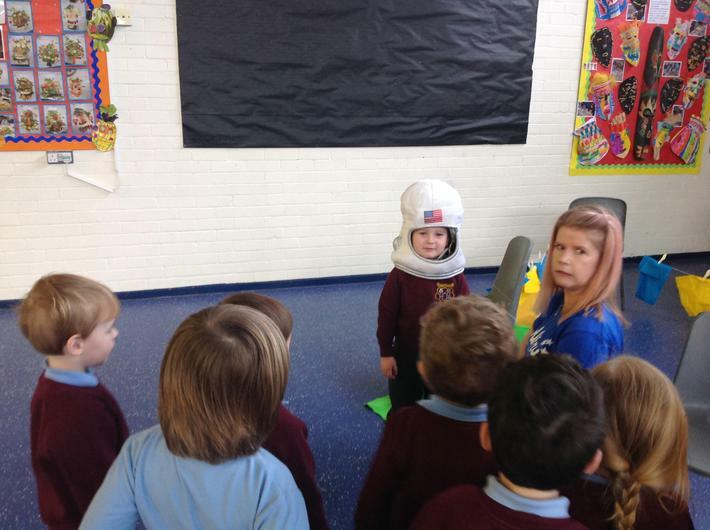 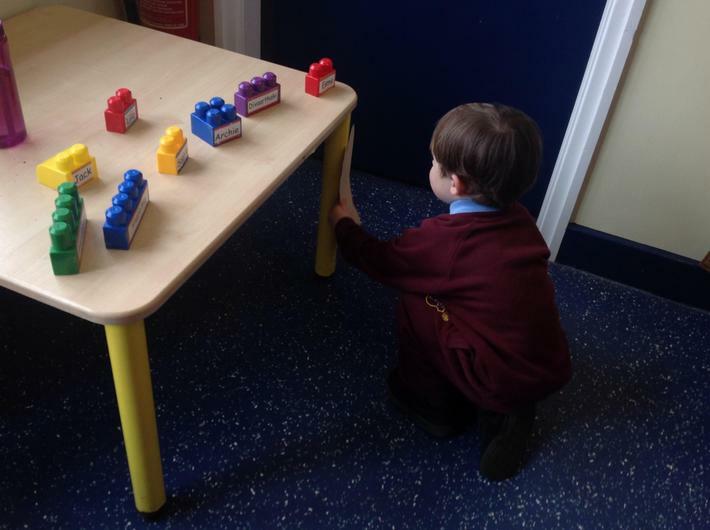 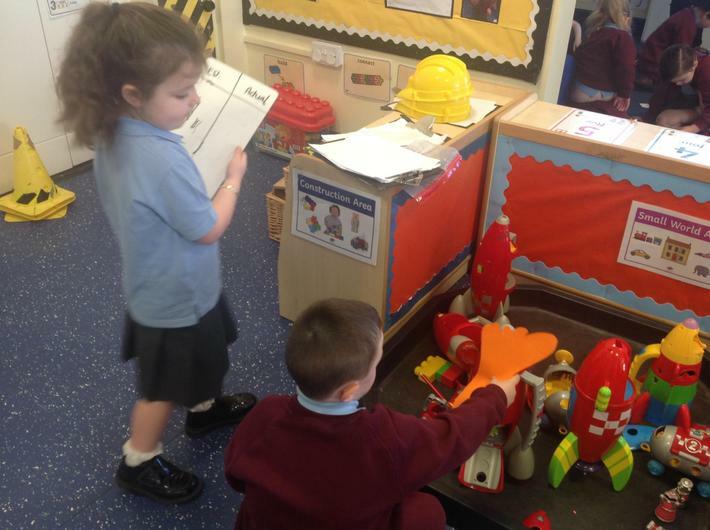 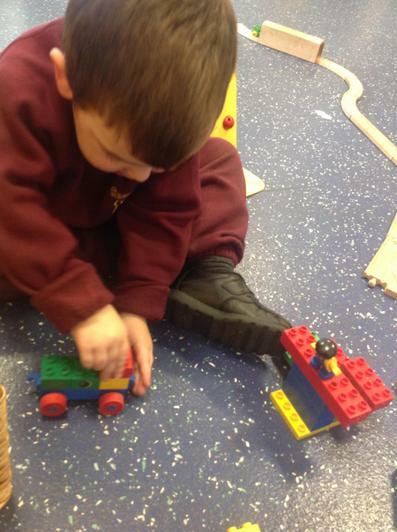 To apply this skill the children were challenged in this week's estimation station to estimate and then measure the height of a space rocket using lego blocks. 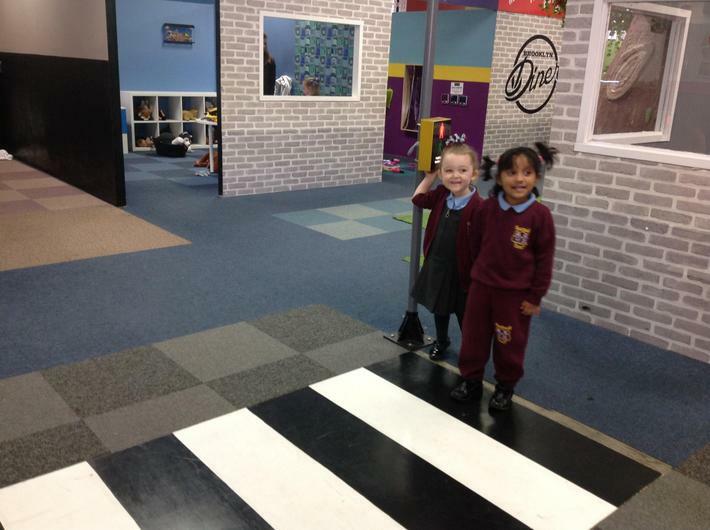 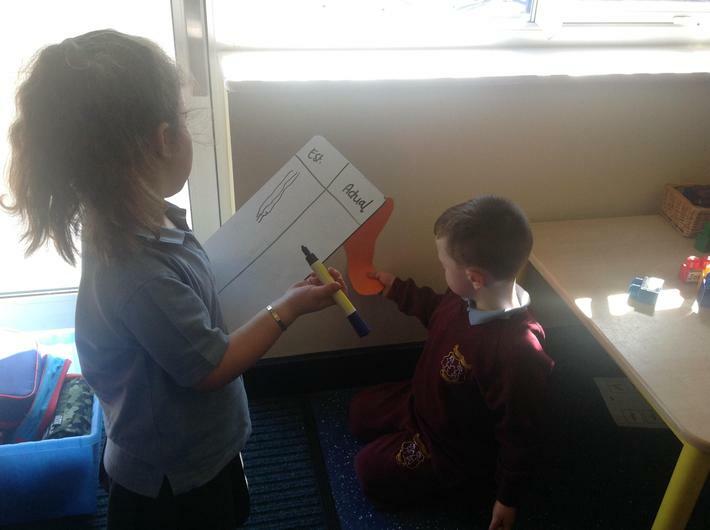 After measuring with accuracy the children recorded the actual height in two ways and compared the range in values from the estimation to the actual value by using language of more or less. 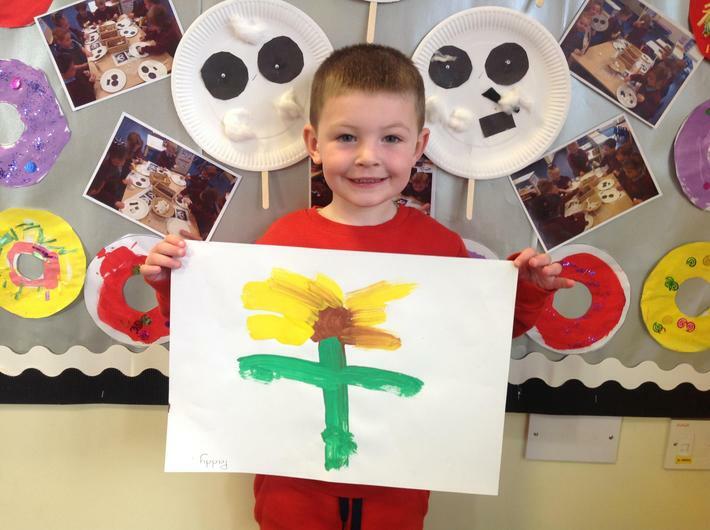 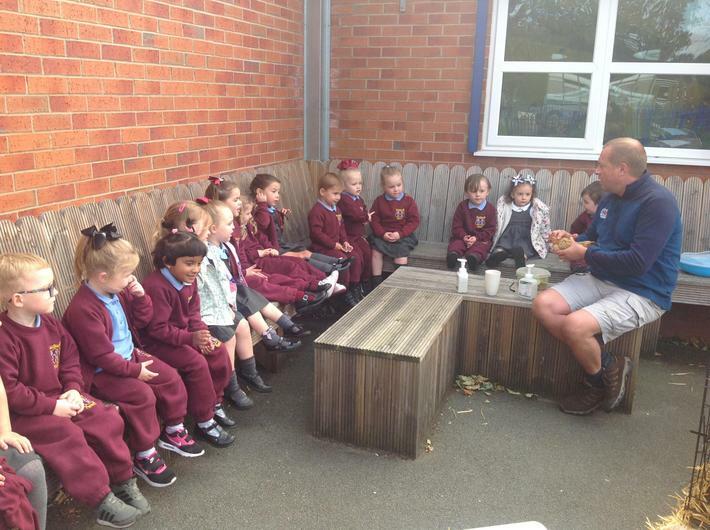 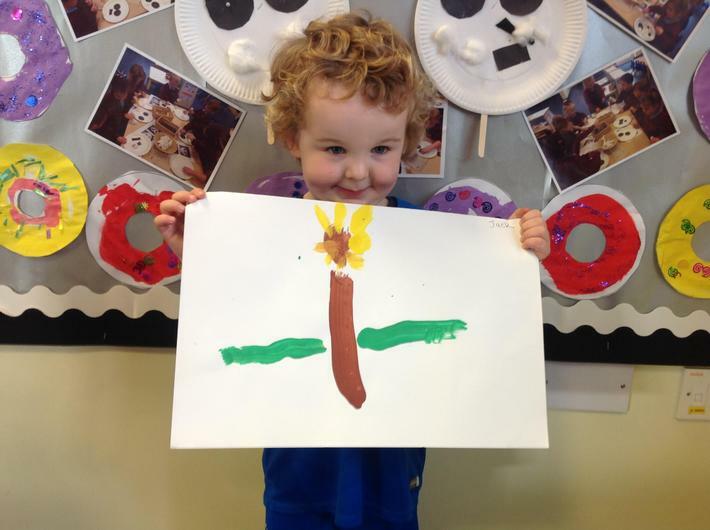 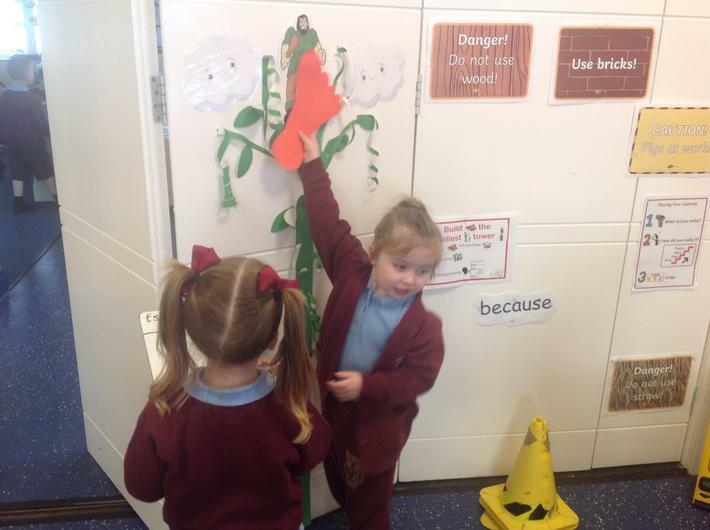 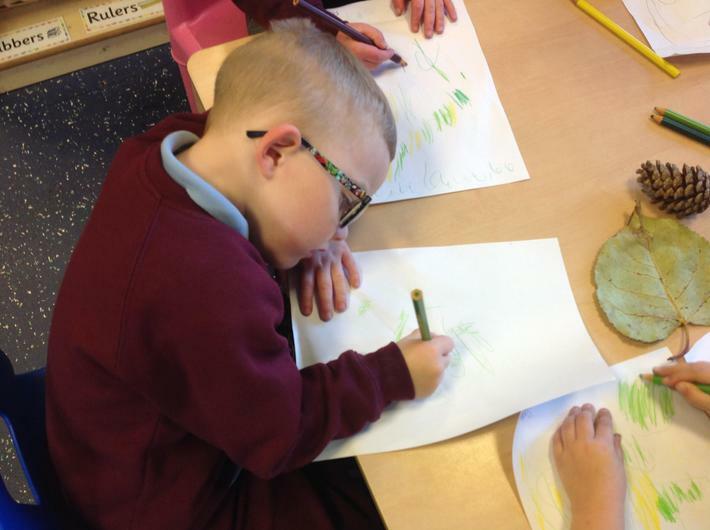 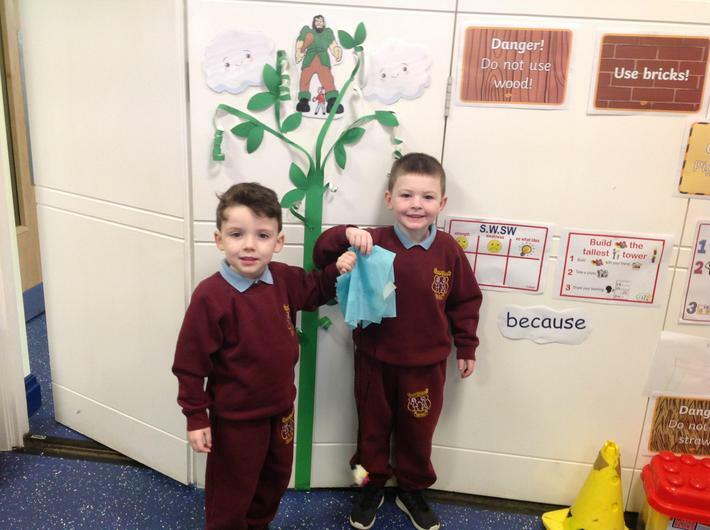 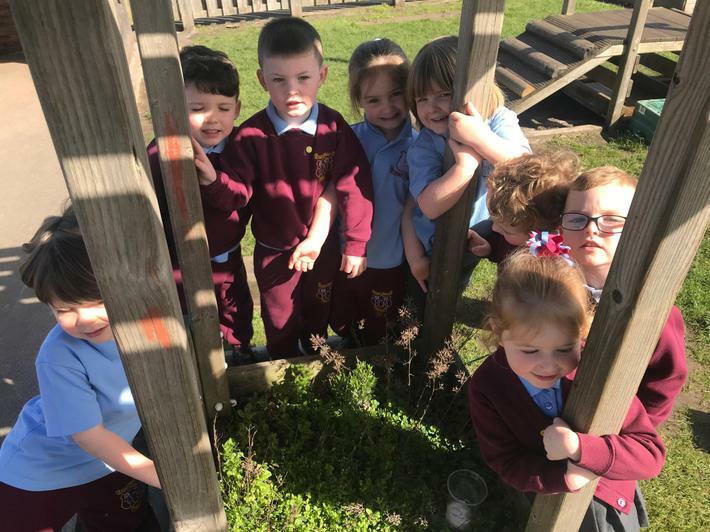 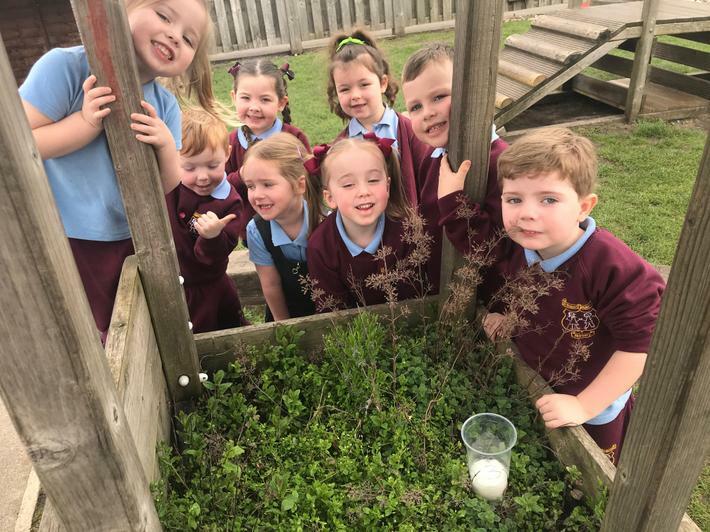 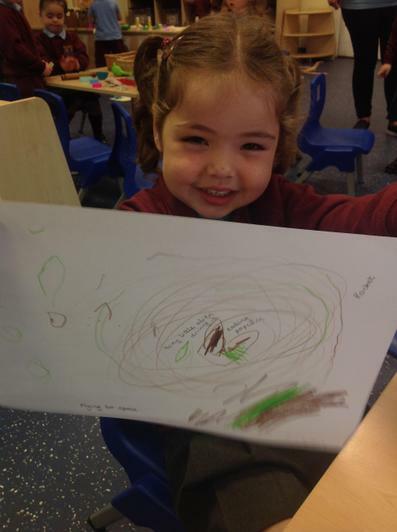 Through exploring the book 'Jack and the Beanstalk' as part of our learning topic 'Growing' we have been investigating how plants grow. 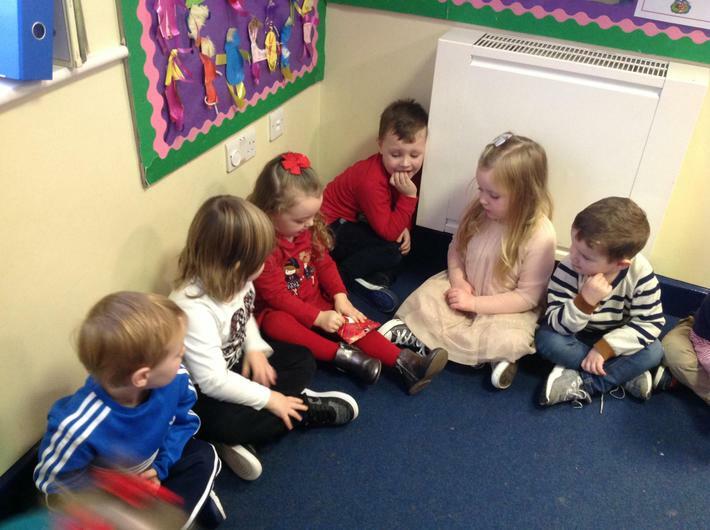 We have talked about their needs and also their life cycles. 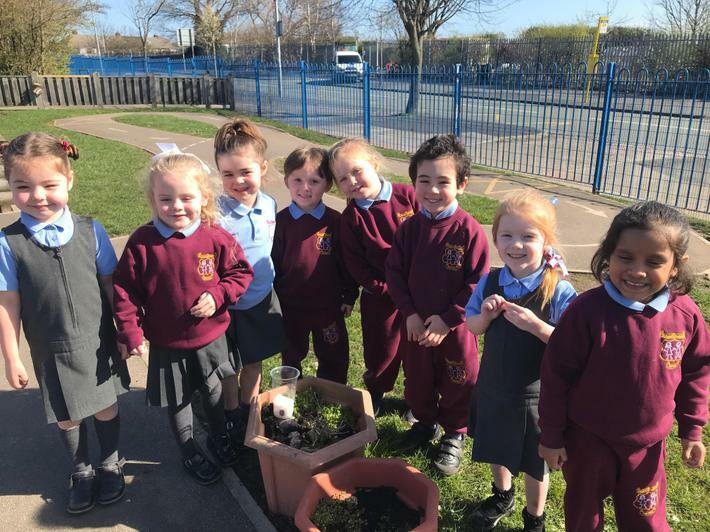 From this we planted our own broad beans and reasoned about the best location for these beans to thrive, now we just have to wait and see what happens next! 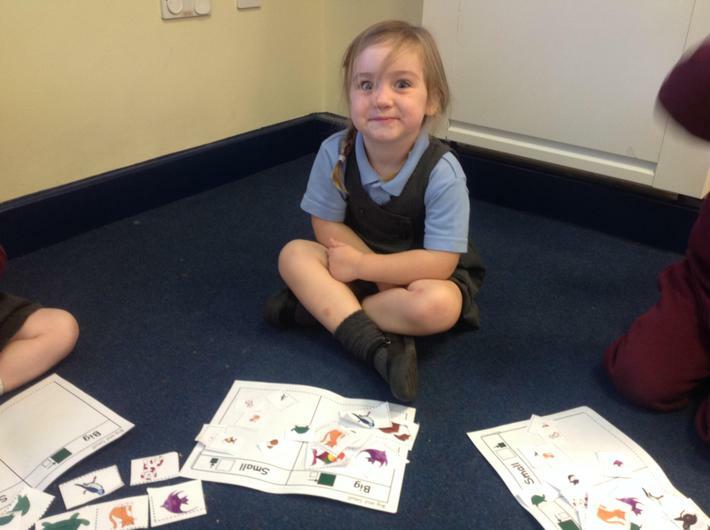 We have also been sequencing the story and began to use time language to order the events. 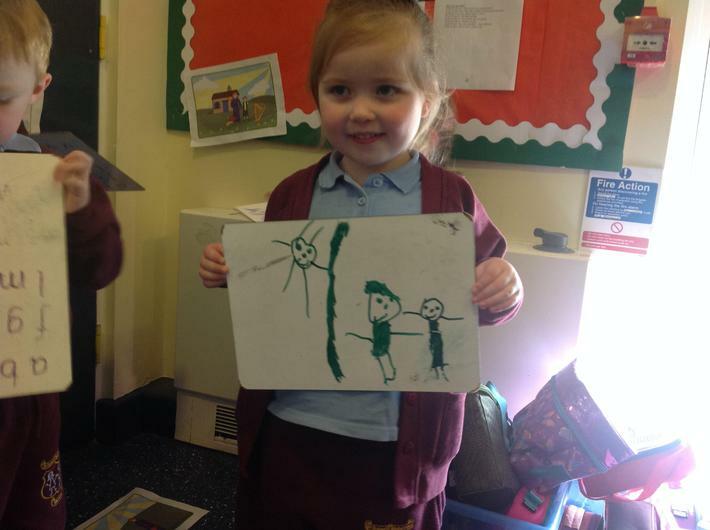 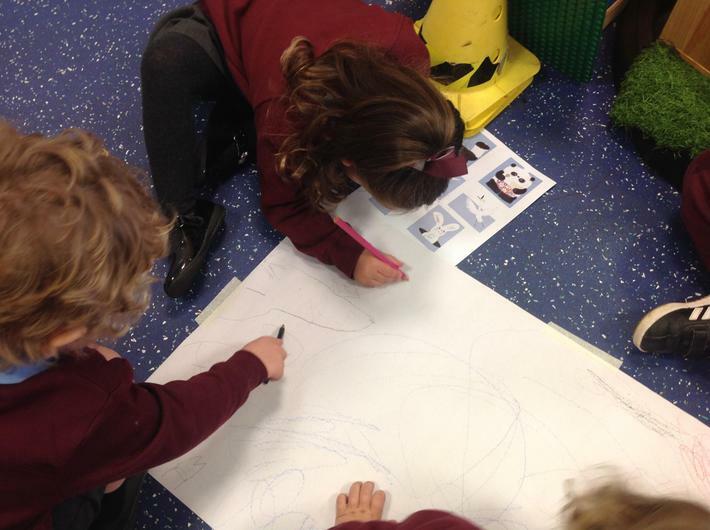 To bring the story to life we even drew the different characters and scenes to make a group story board! 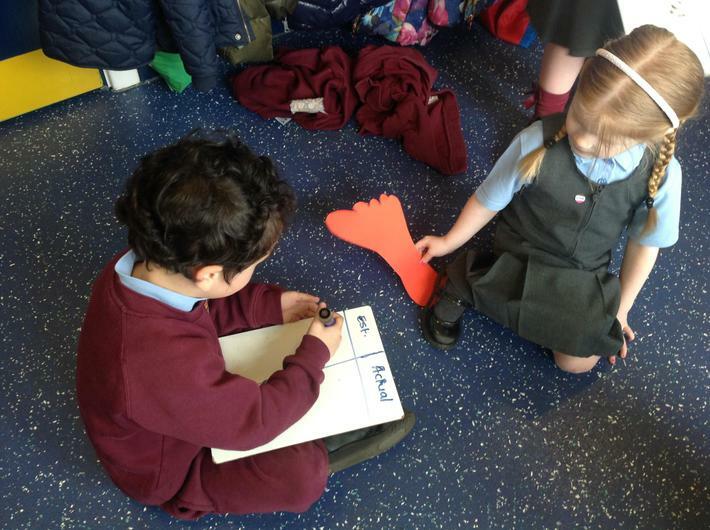 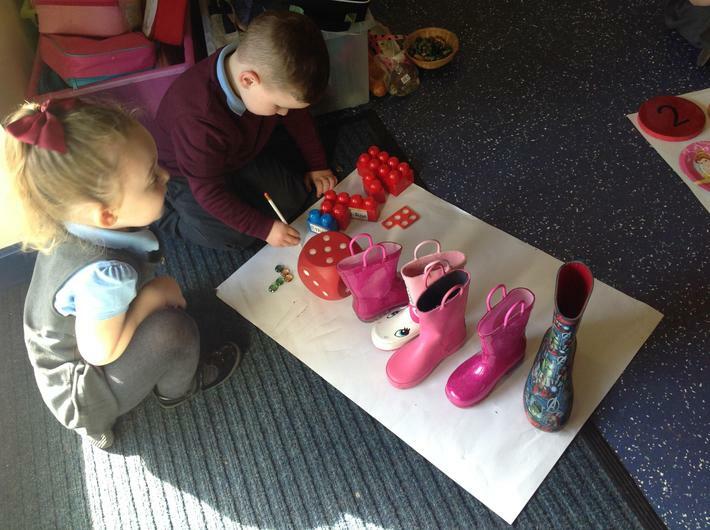 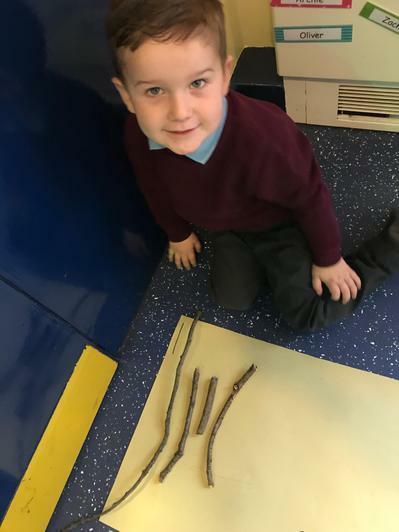 Within our maths we used Jack's and the Giant's footprints as measuring tools to develop our measuring skills and estimations. 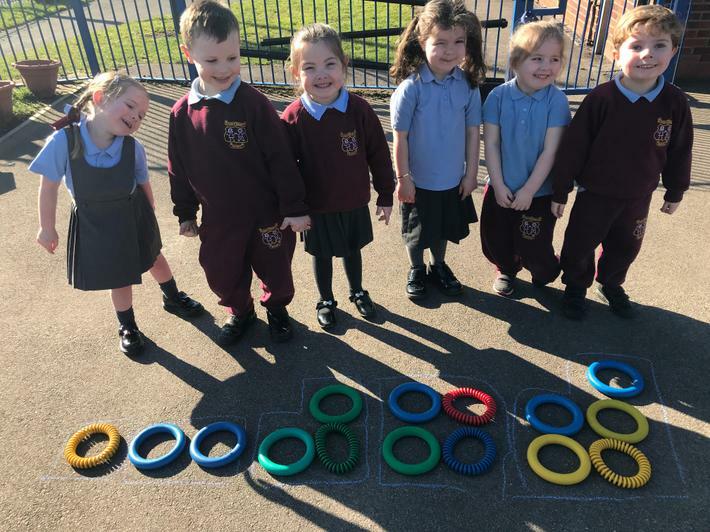 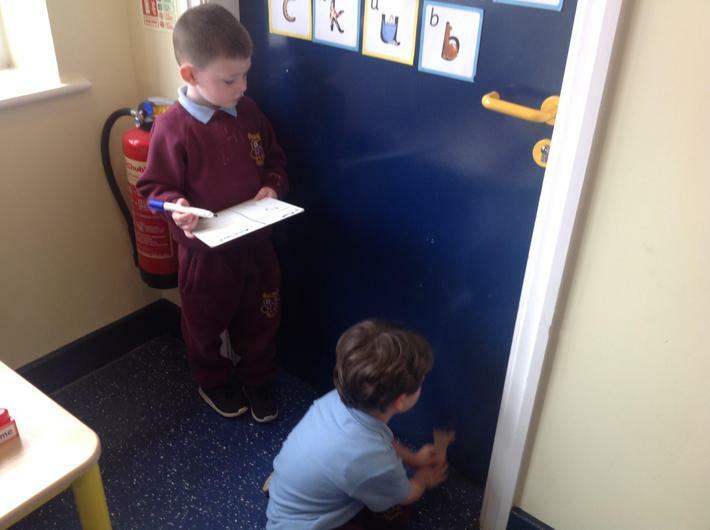 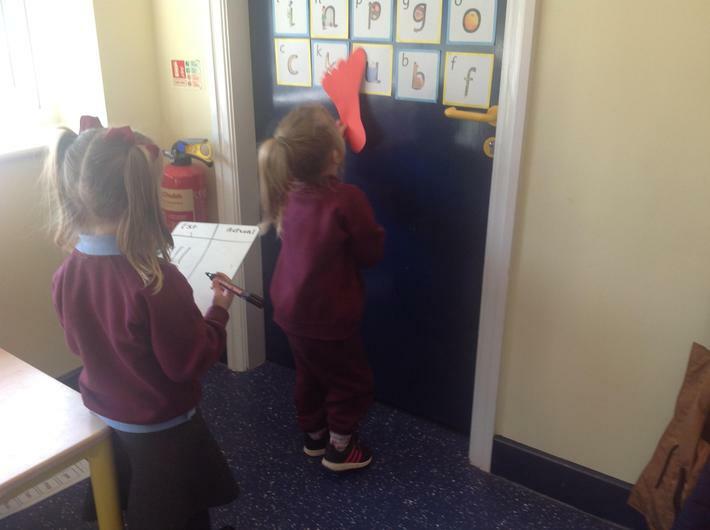 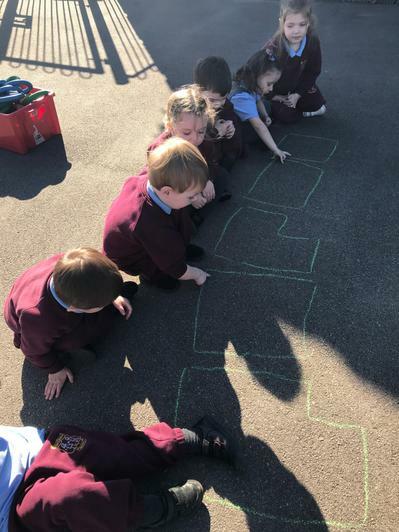 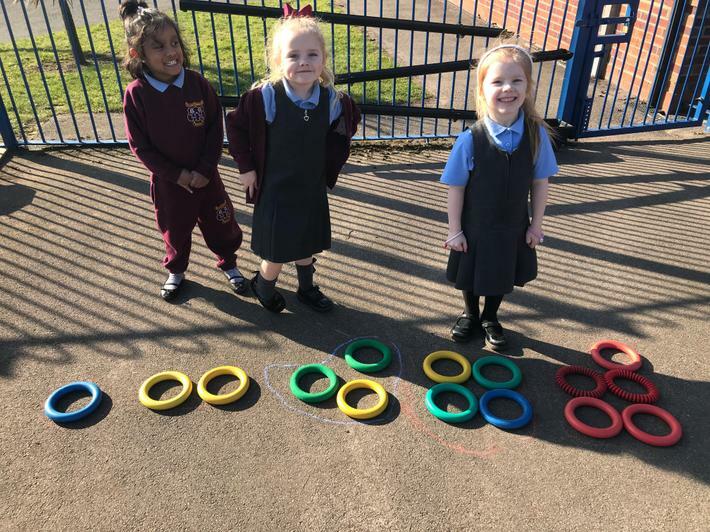 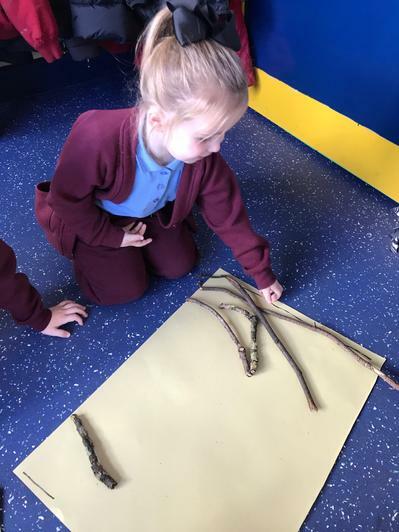 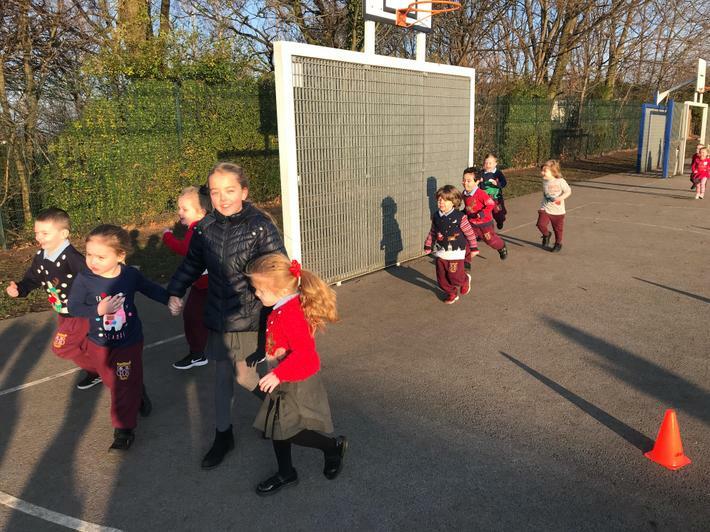 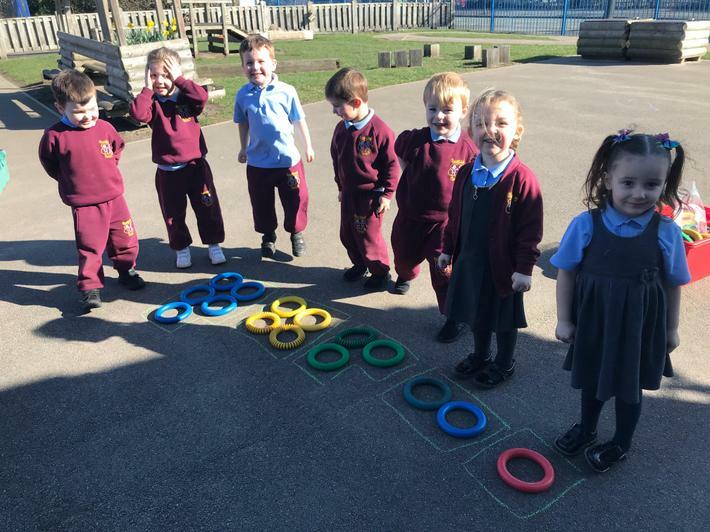 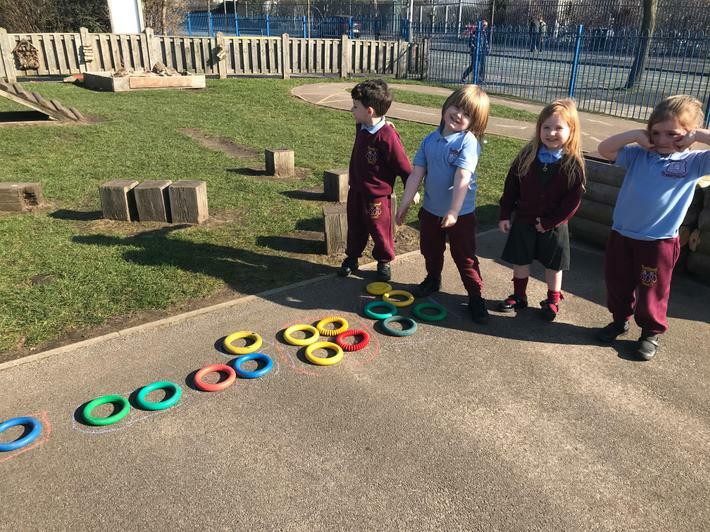 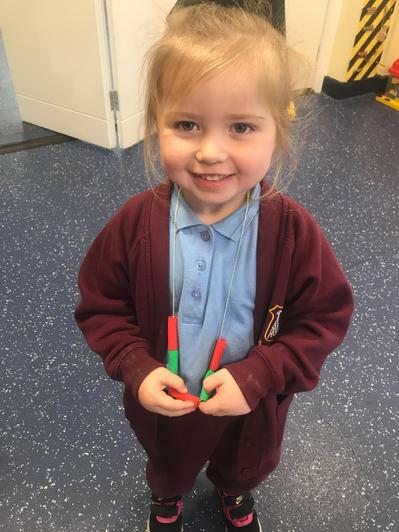 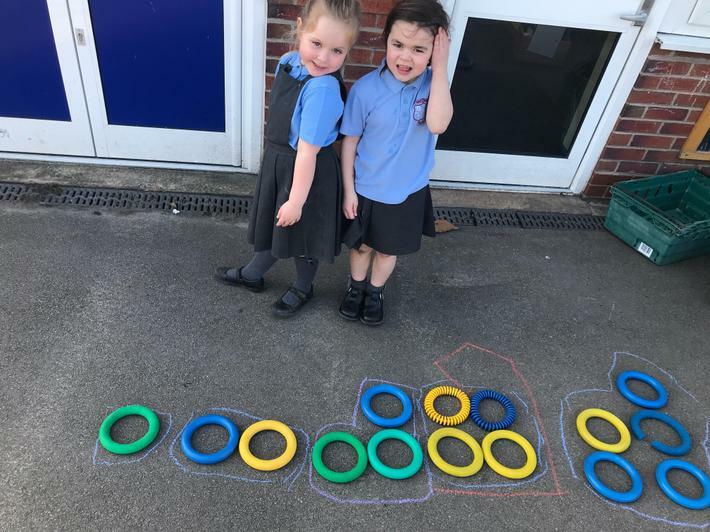 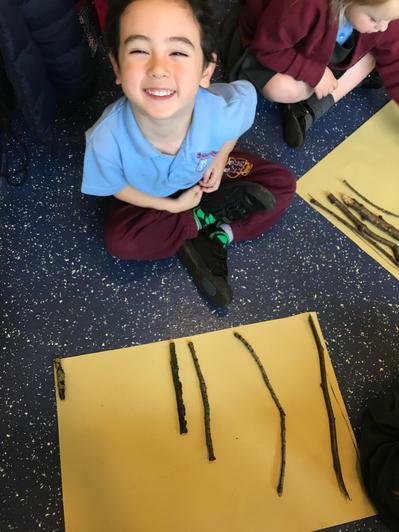 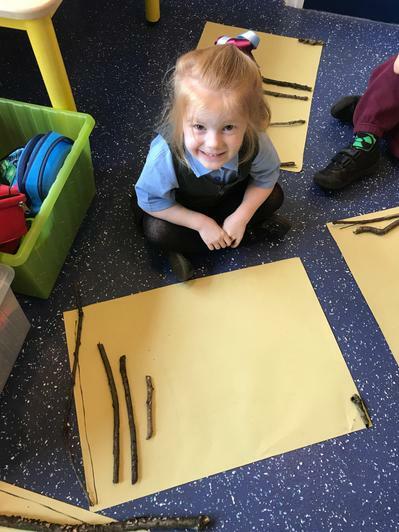 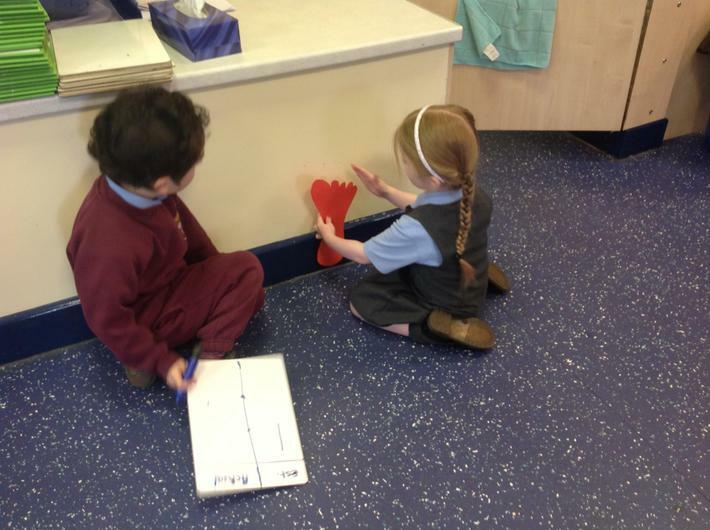 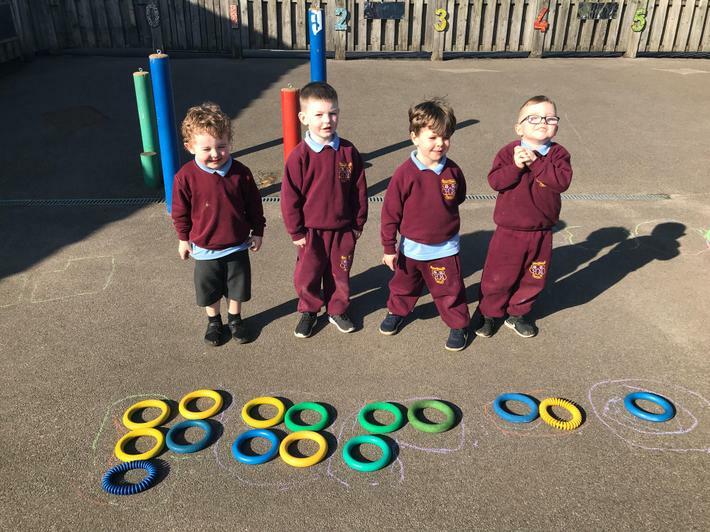 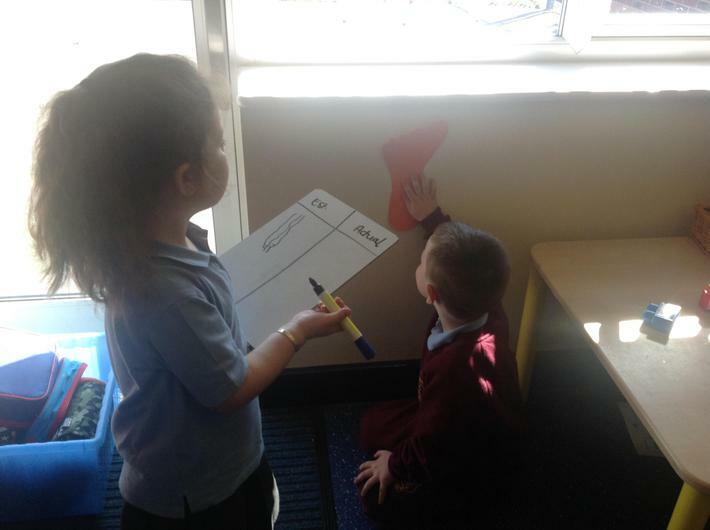 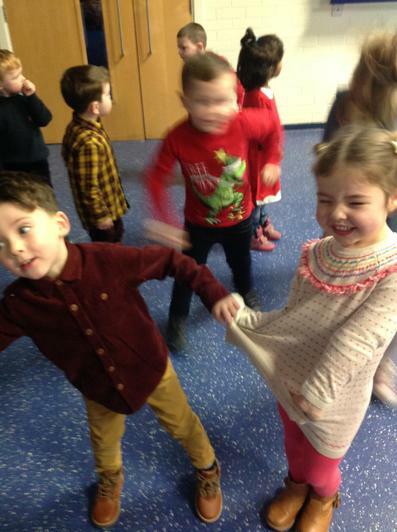 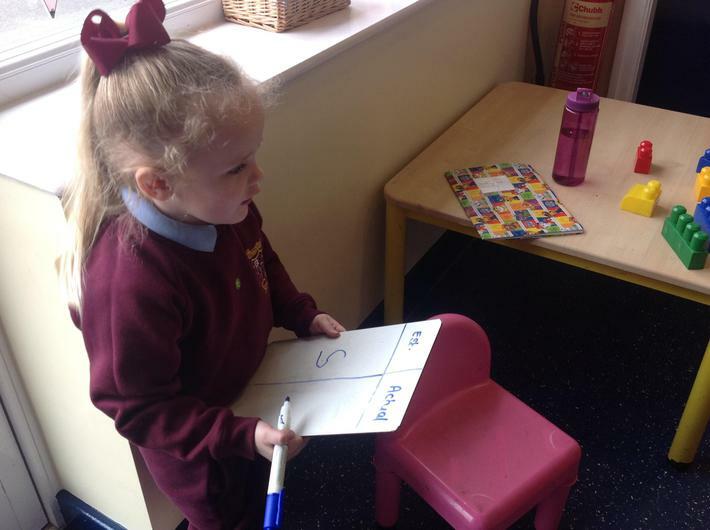 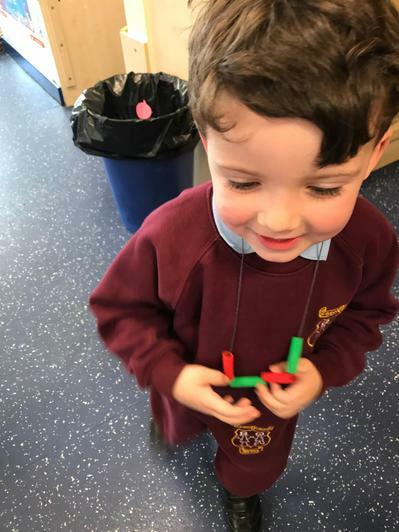 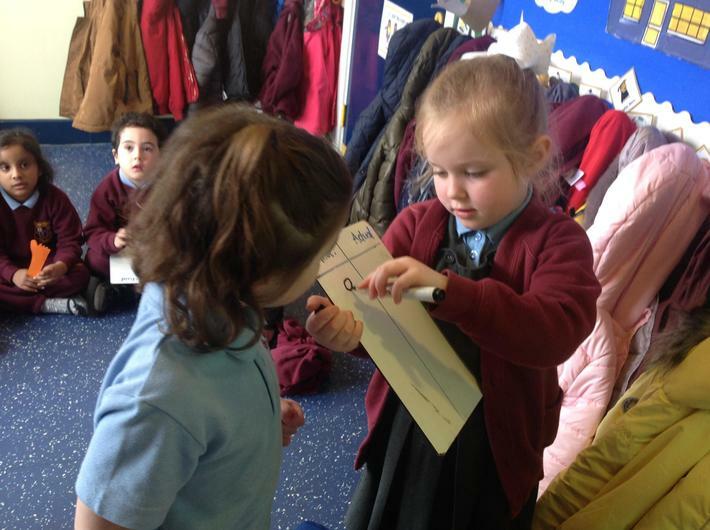 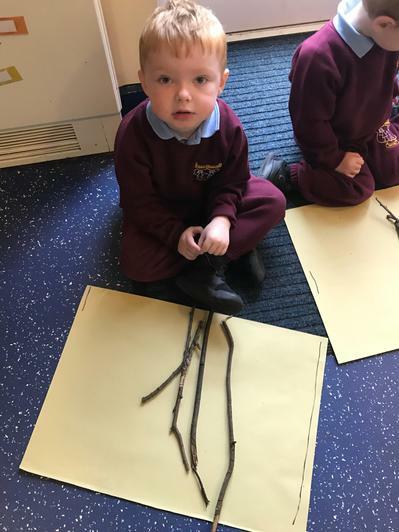 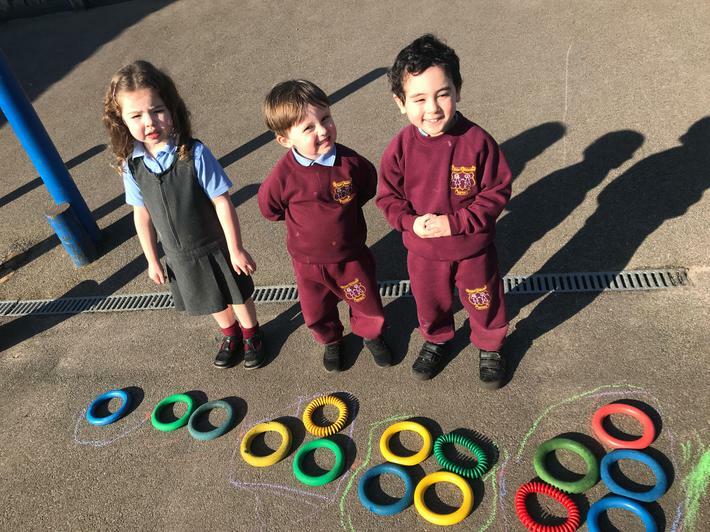 First we estimated in partners how many footprints long or high we thought an object was and then we measured accurately using the footprints, we even learnt we could use our hands to keep track of the footprints. 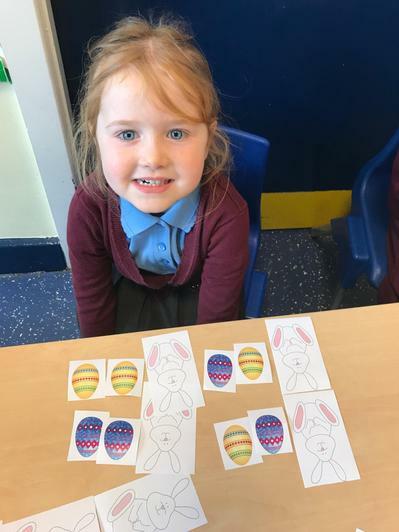 For the problem the Easter bunny was allowed 2 eggs as a special treat and there were 2 different colours of eggs (yellow and blue). 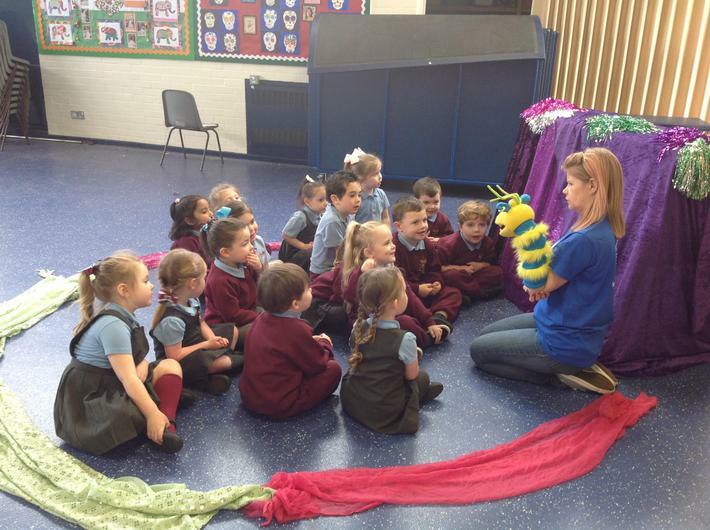 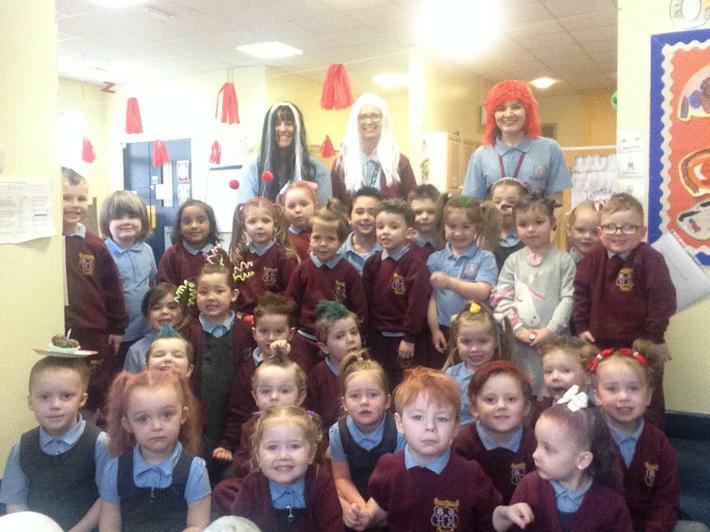 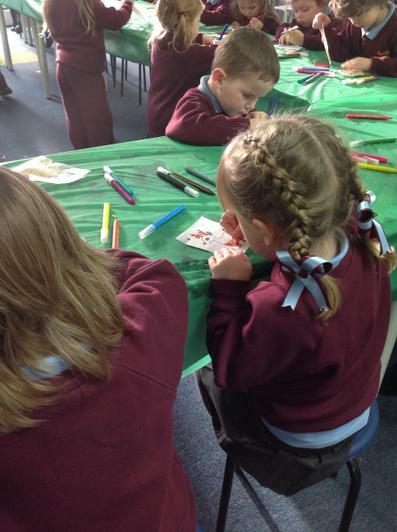 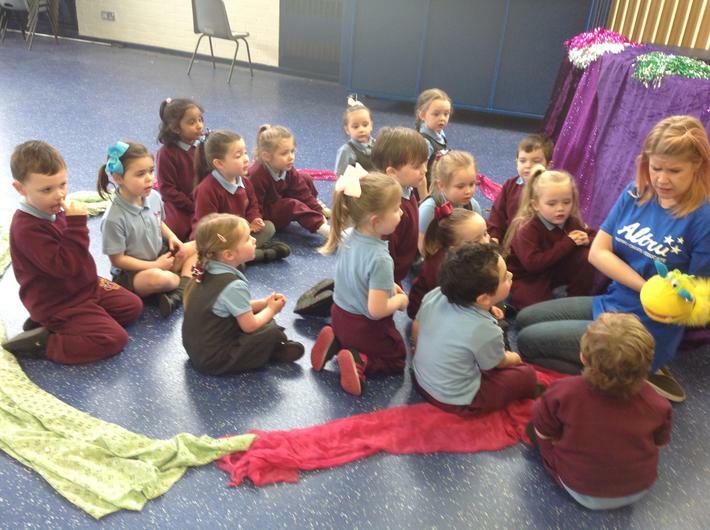 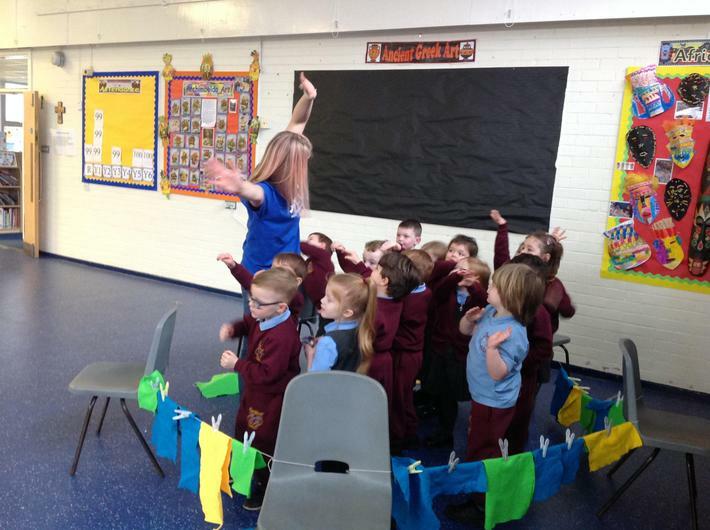 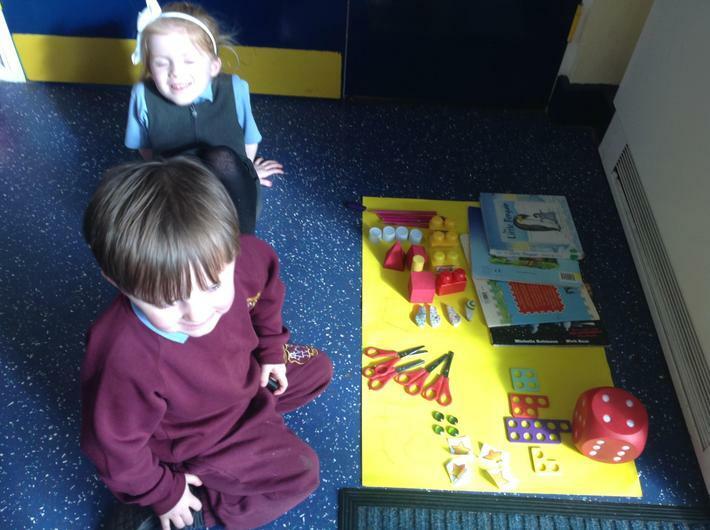 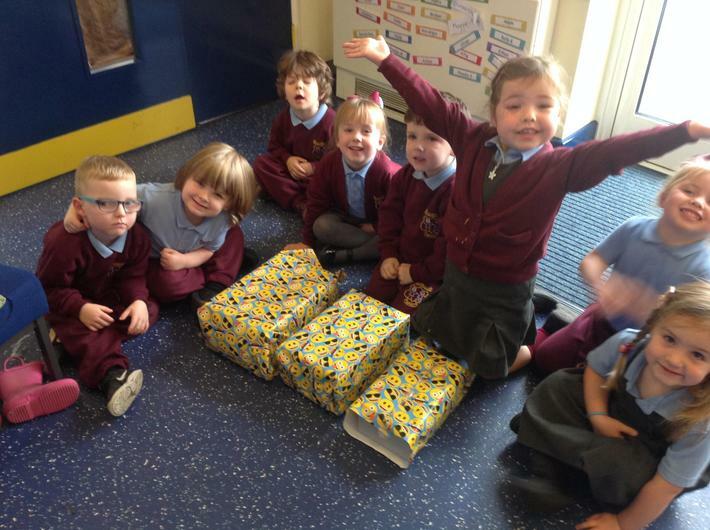 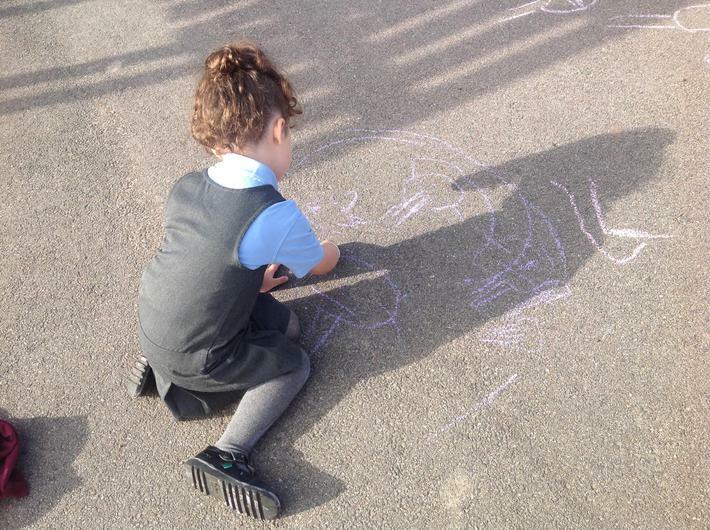 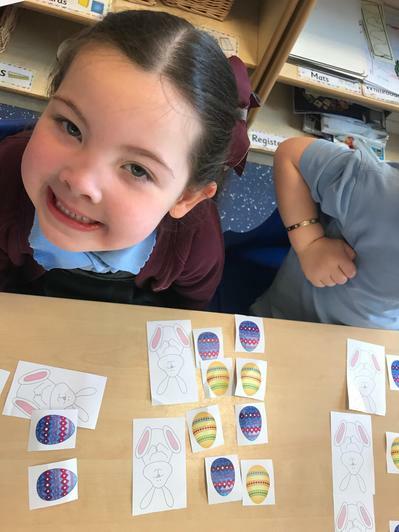 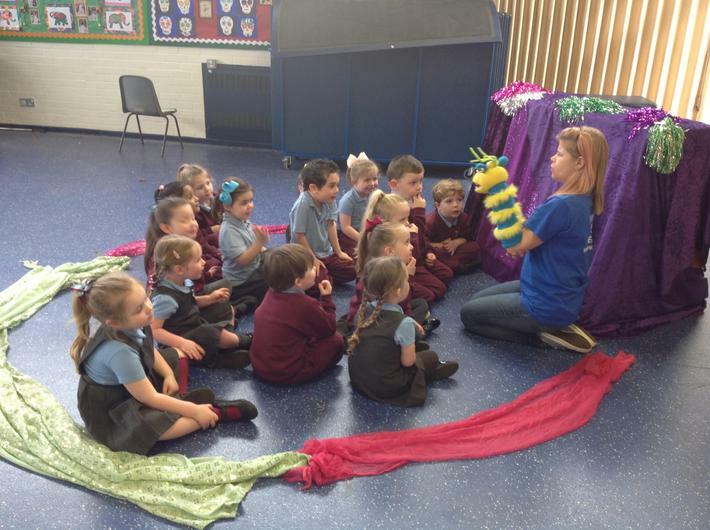 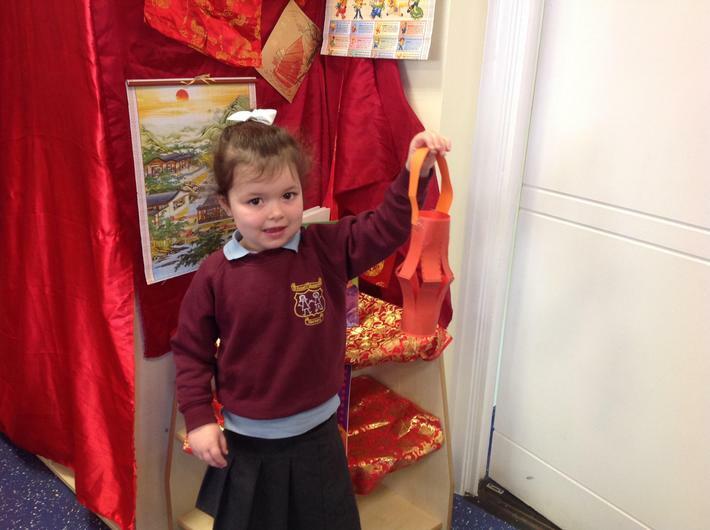 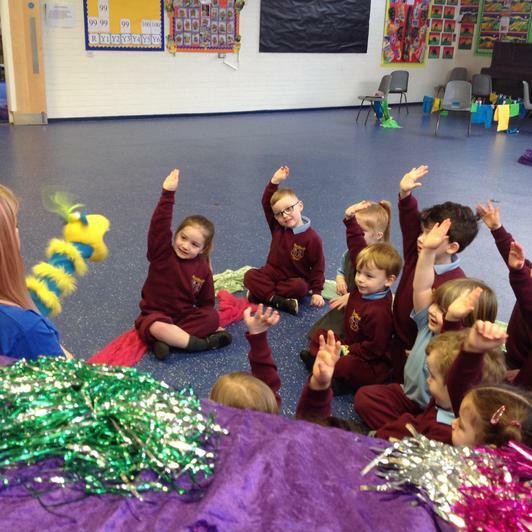 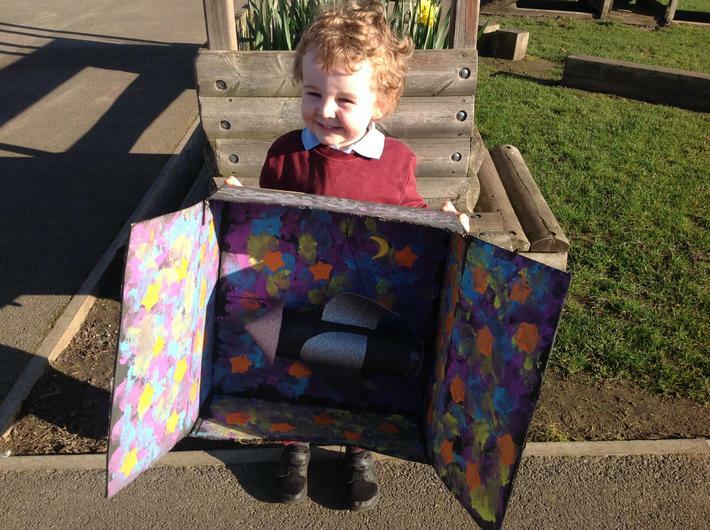 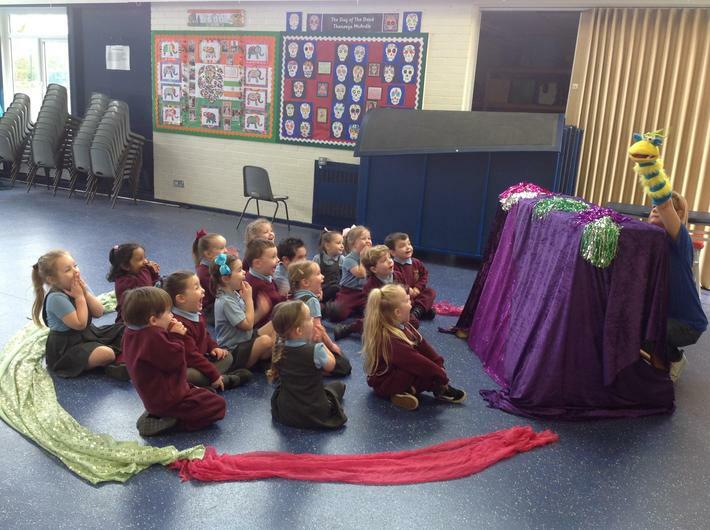 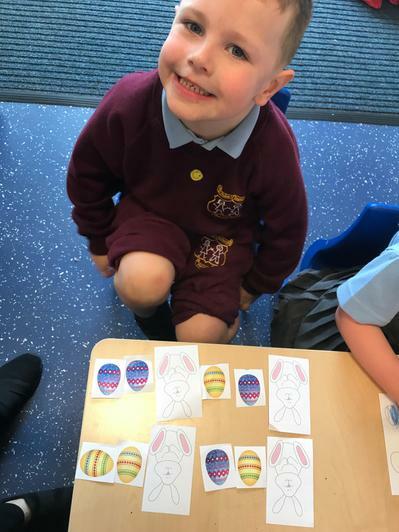 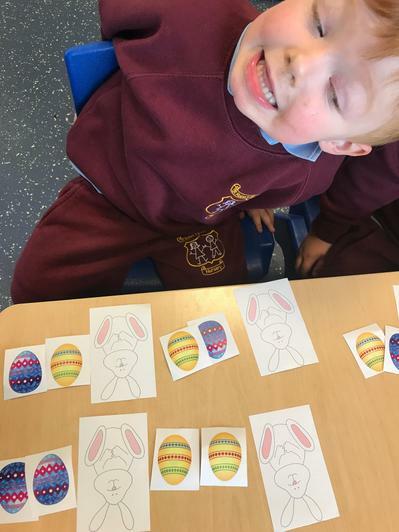 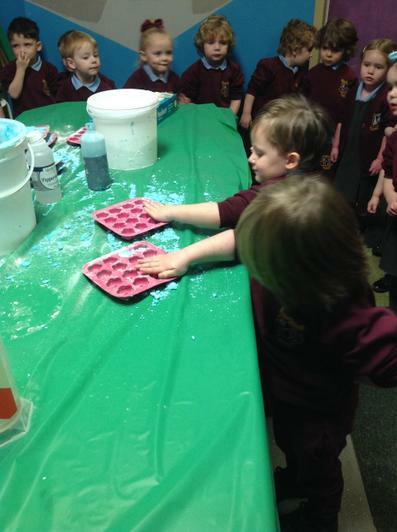 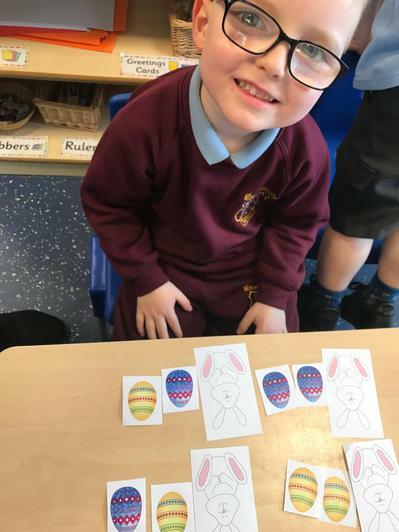 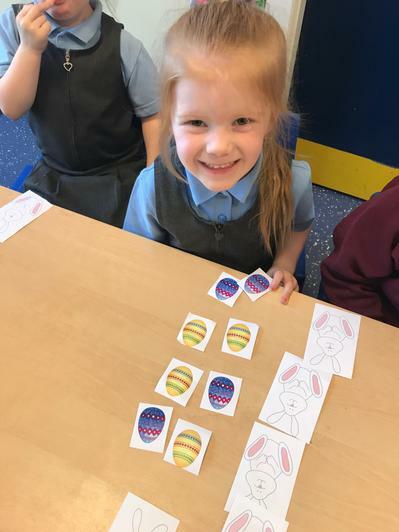 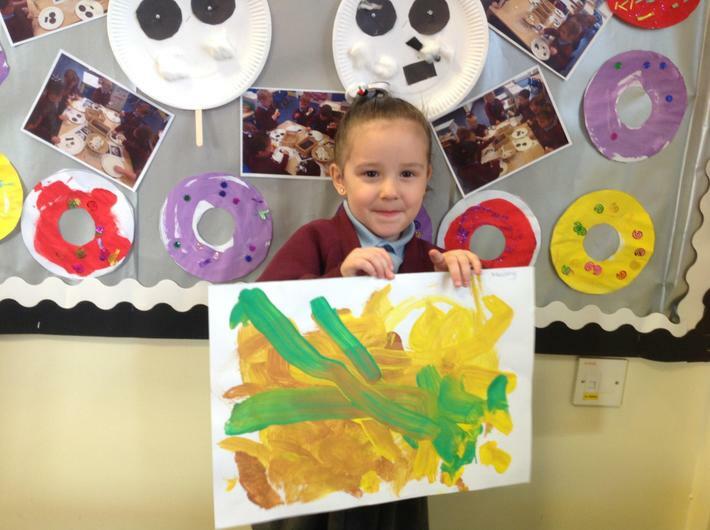 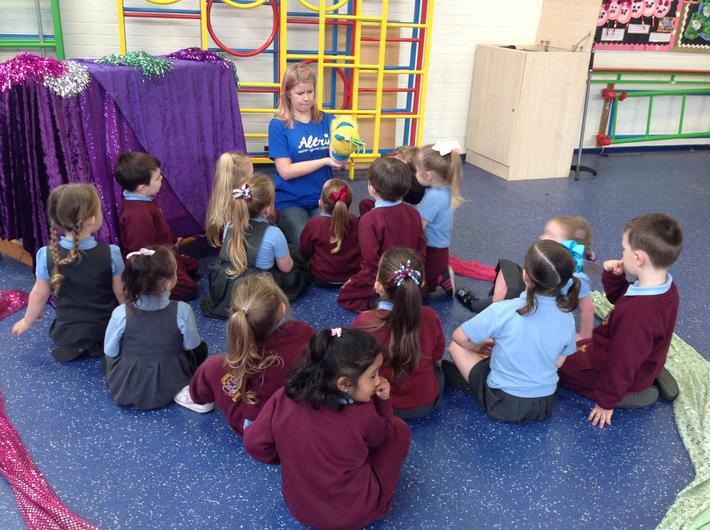 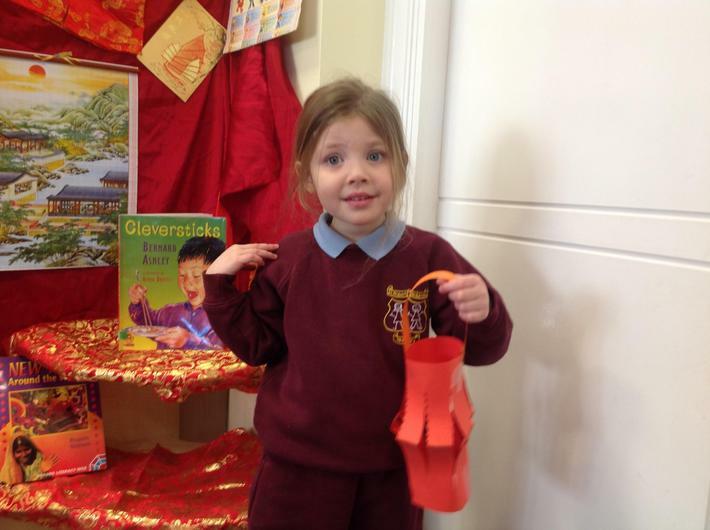 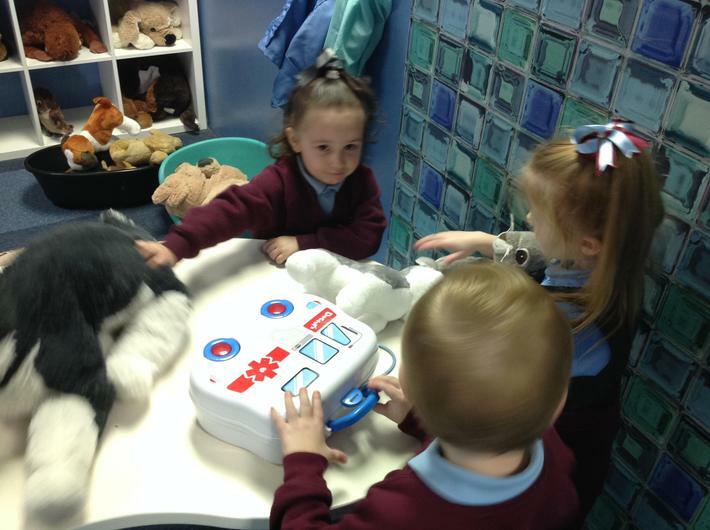 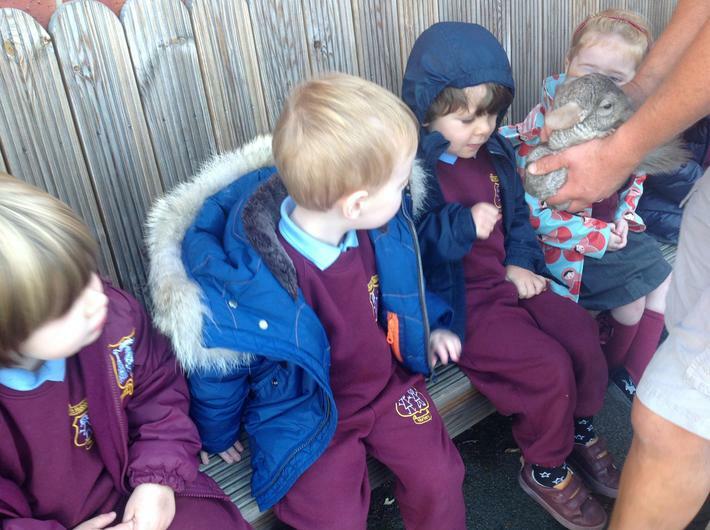 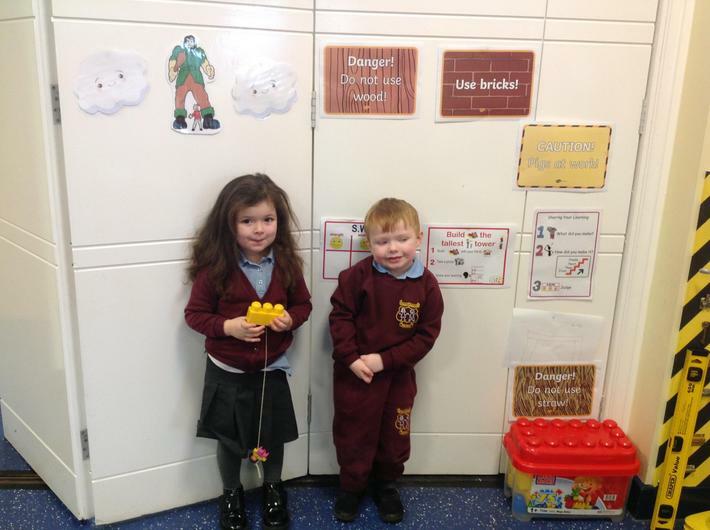 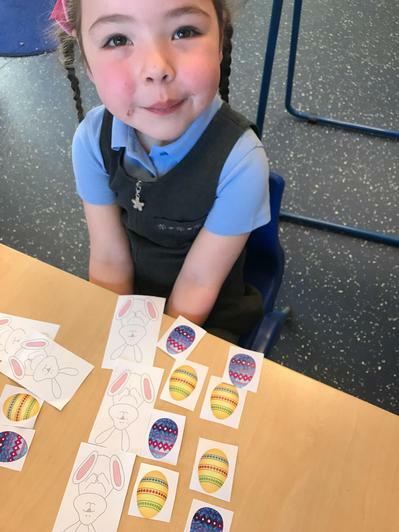 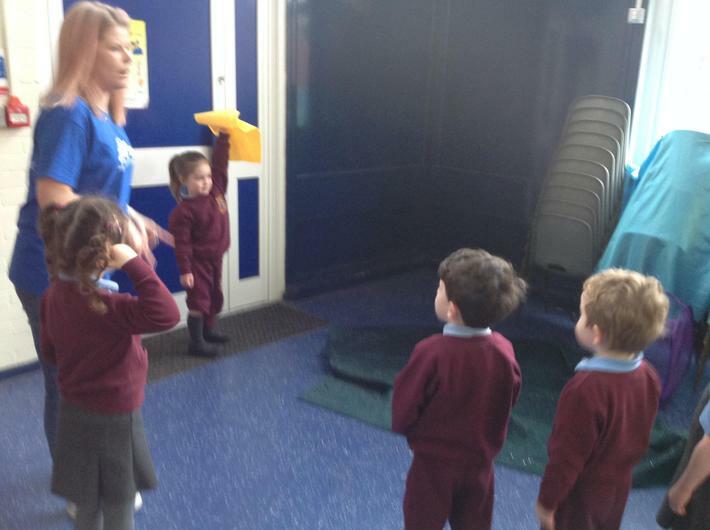 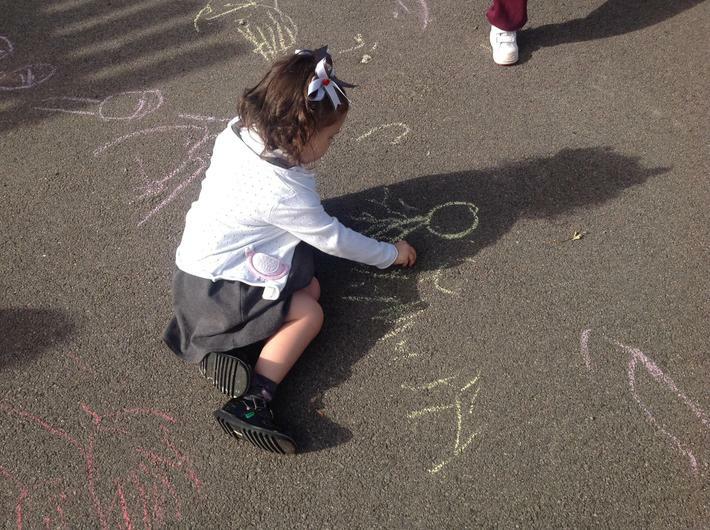 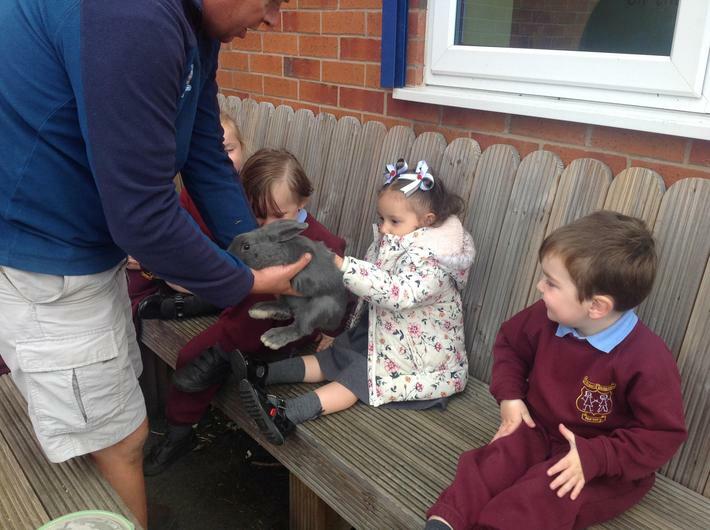 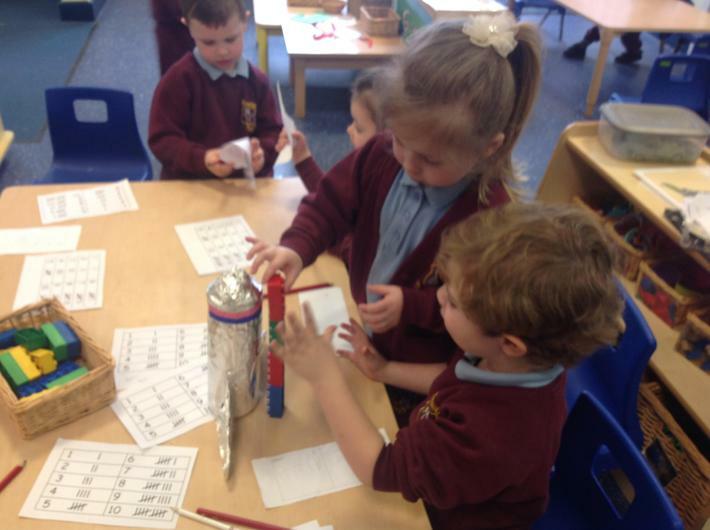 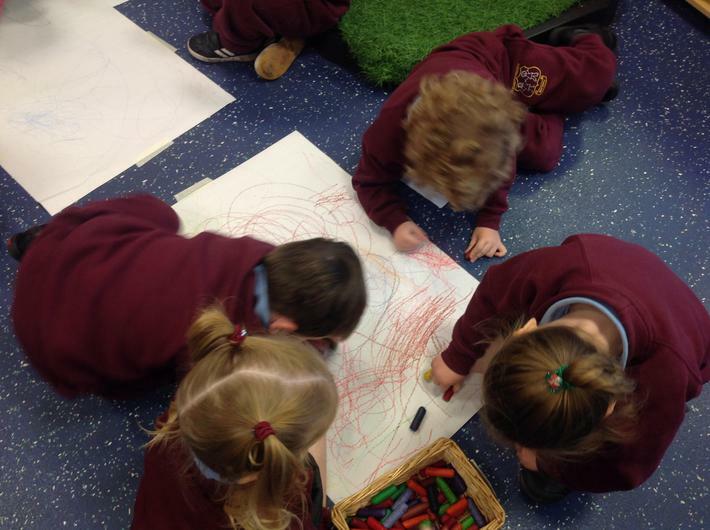 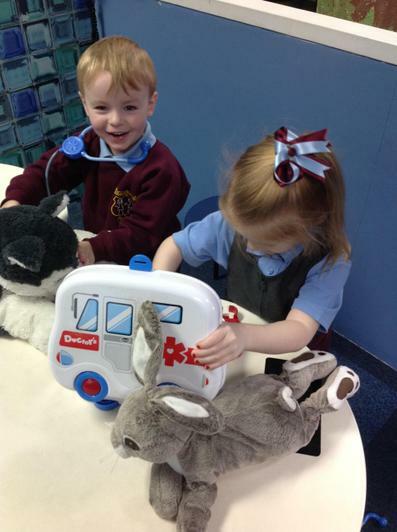 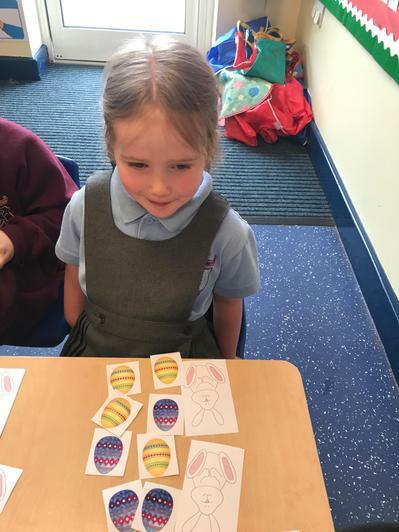 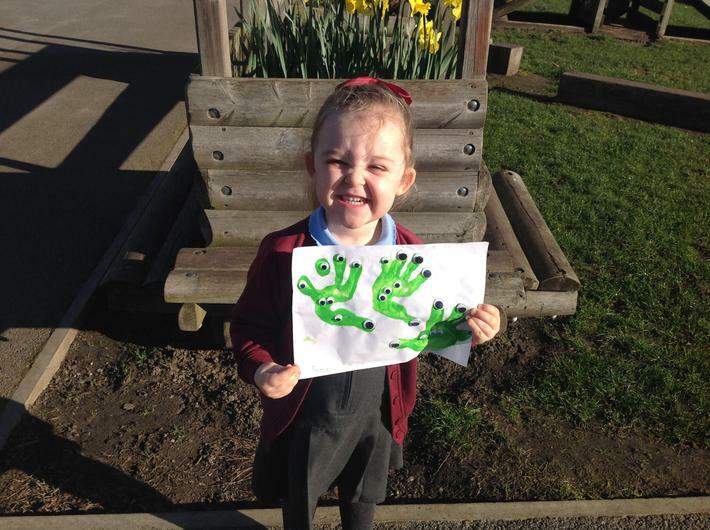 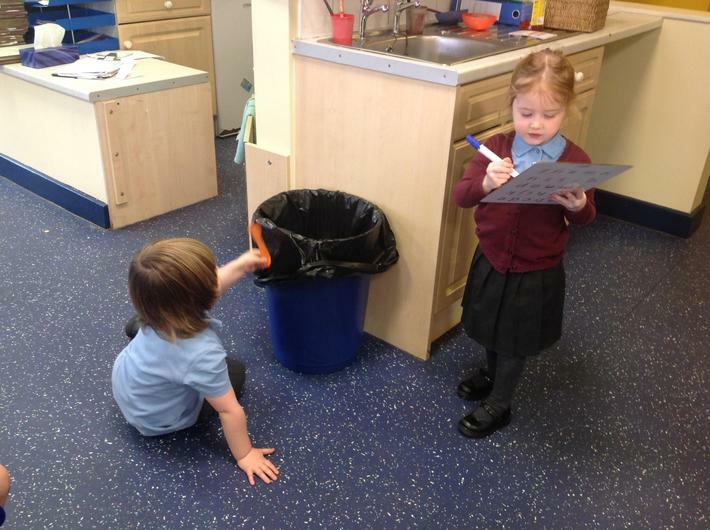 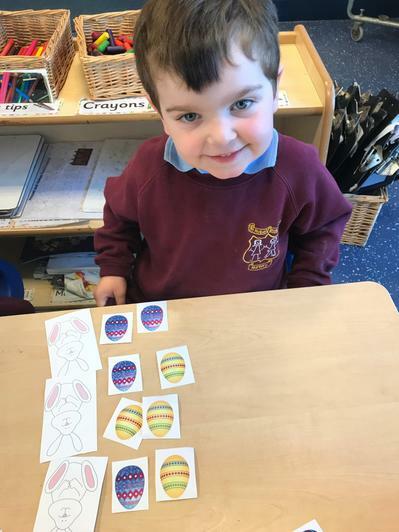 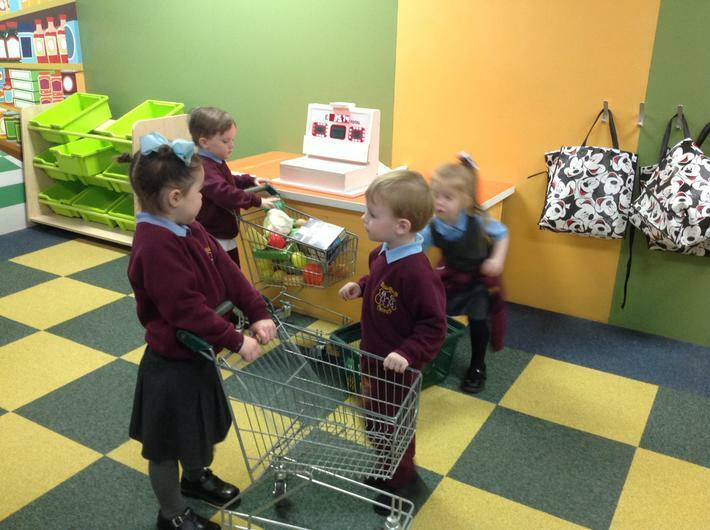 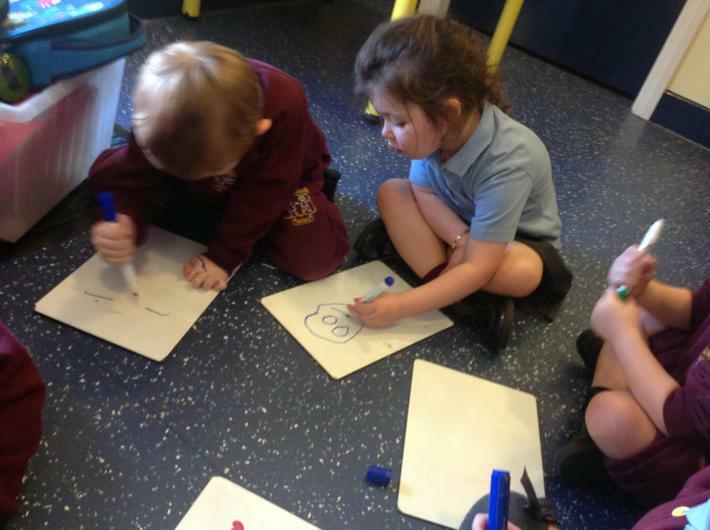 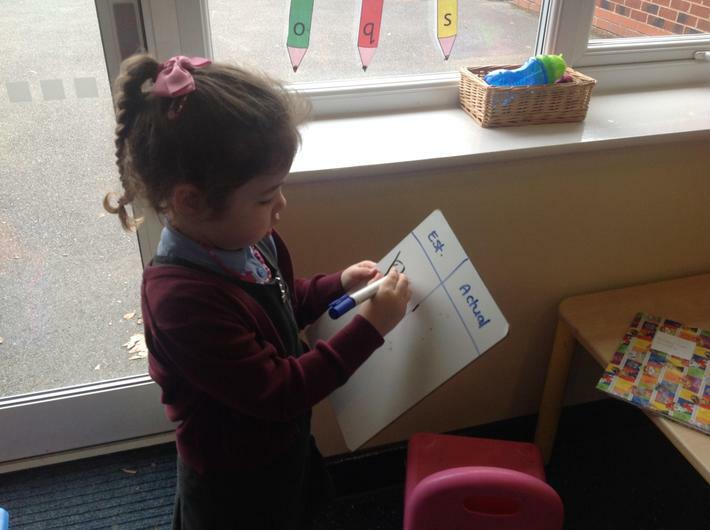 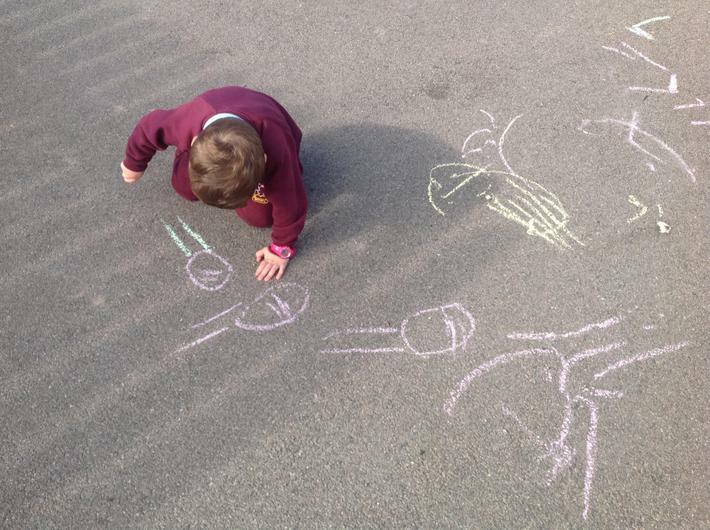 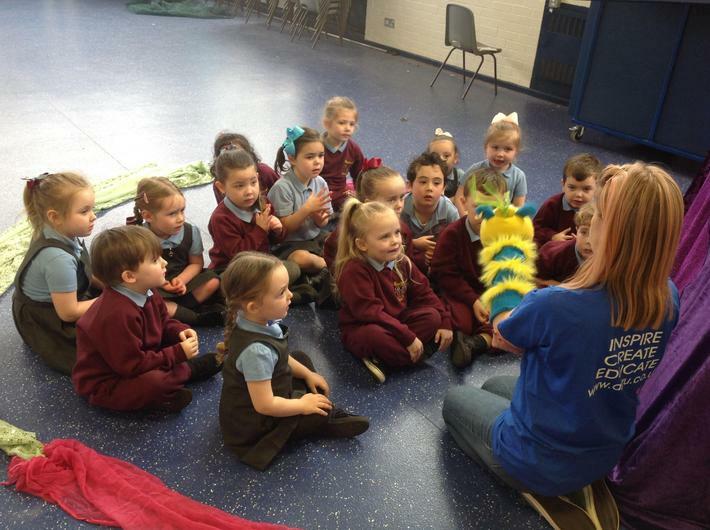 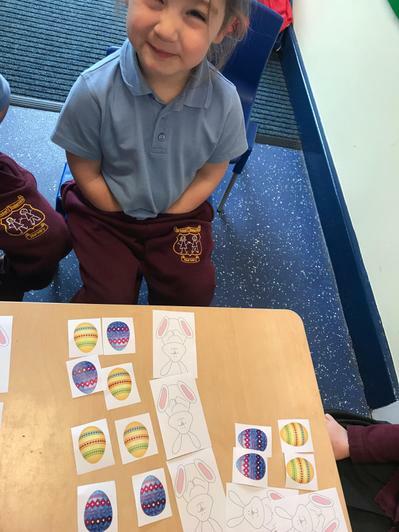 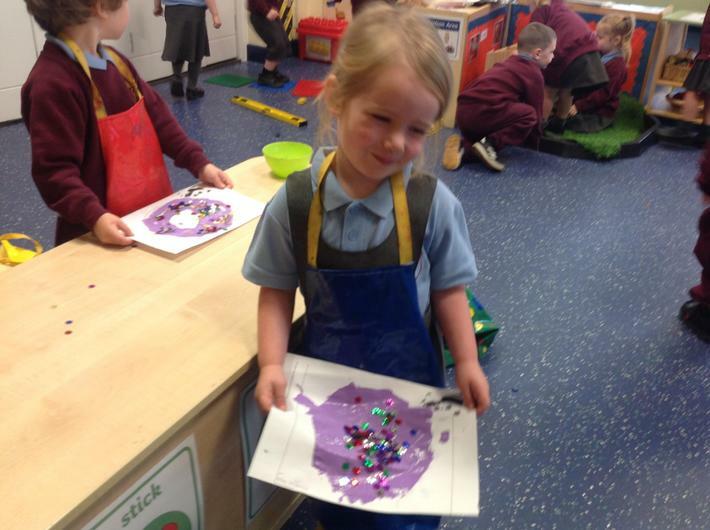 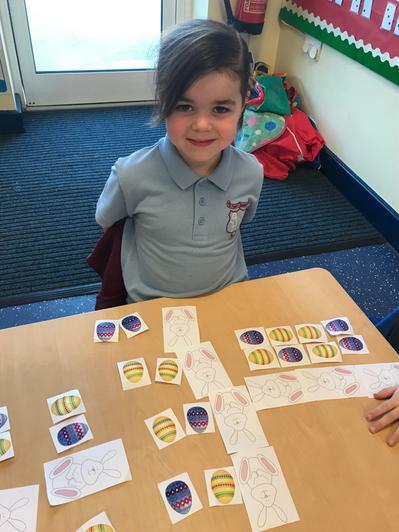 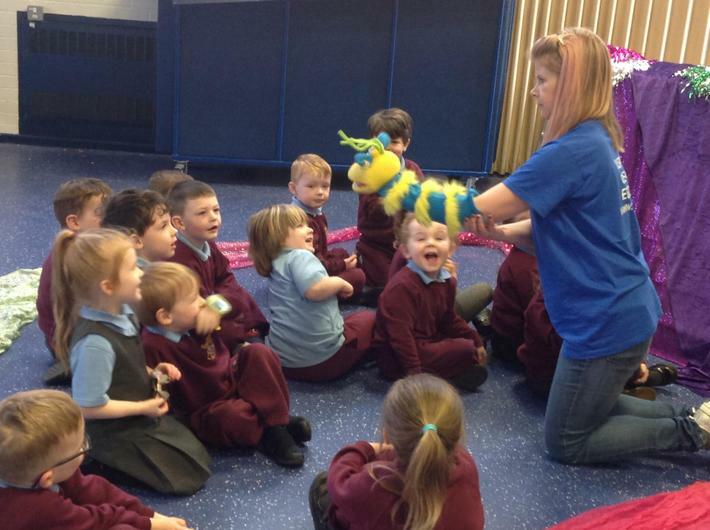 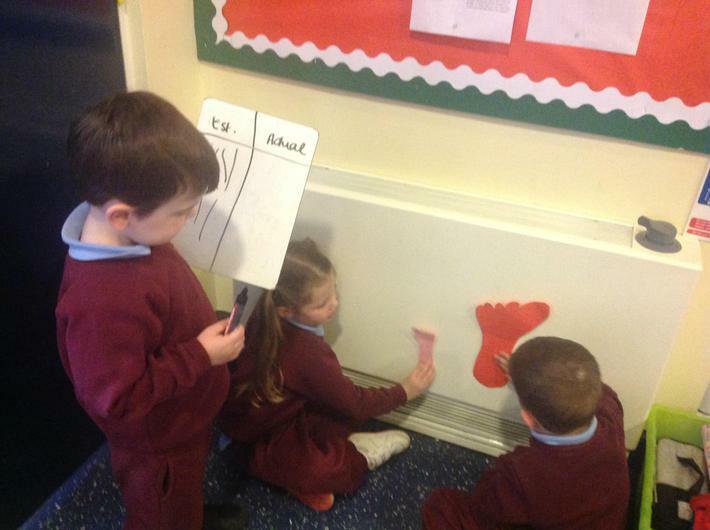 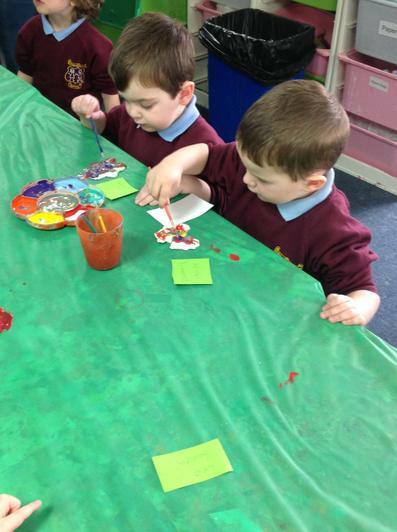 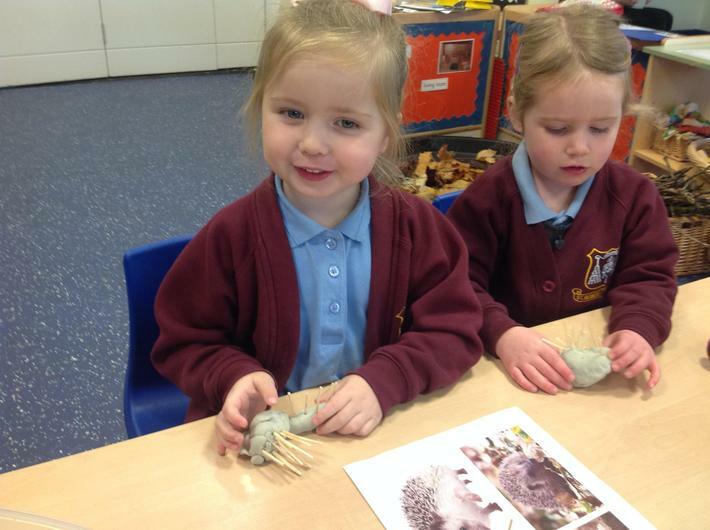 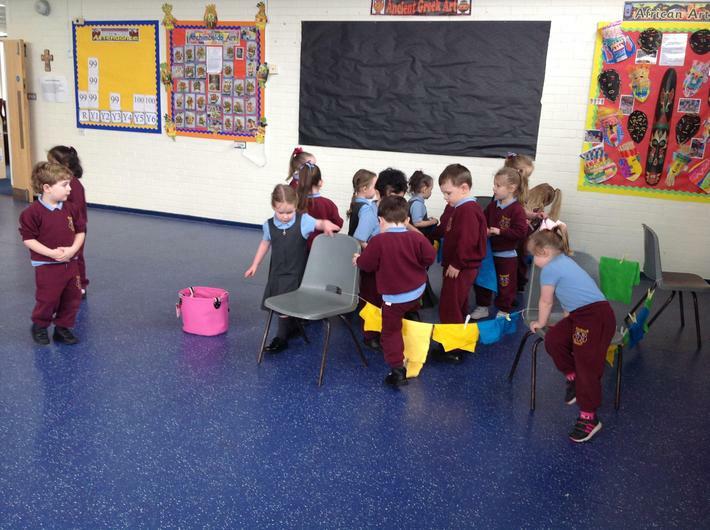 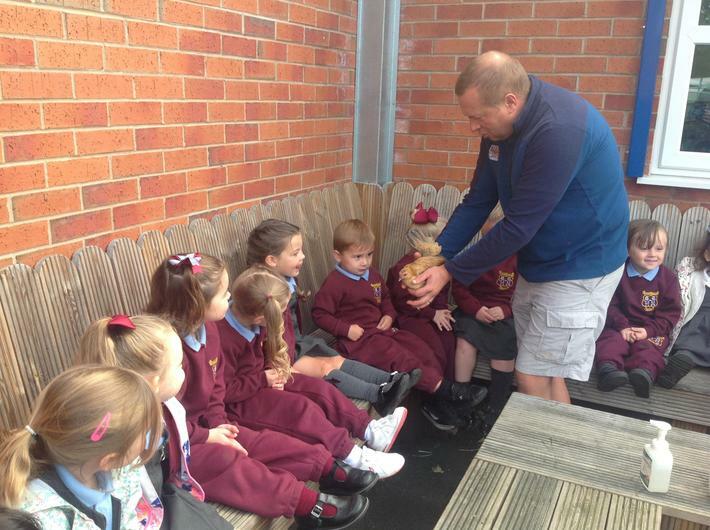 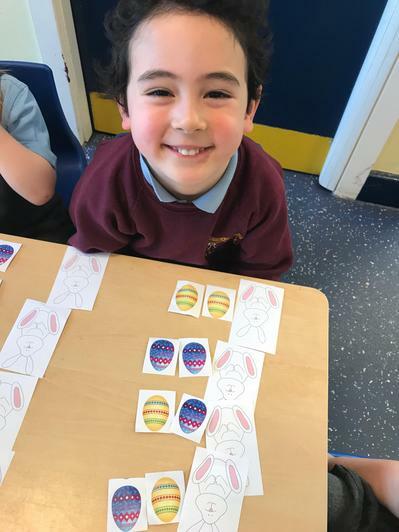 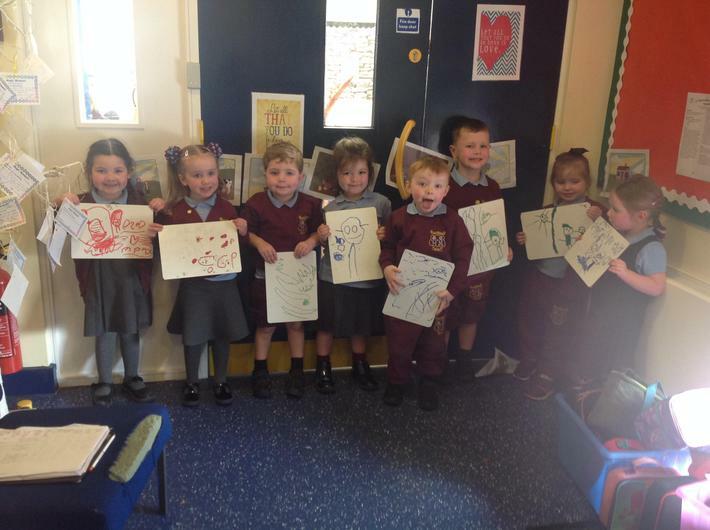 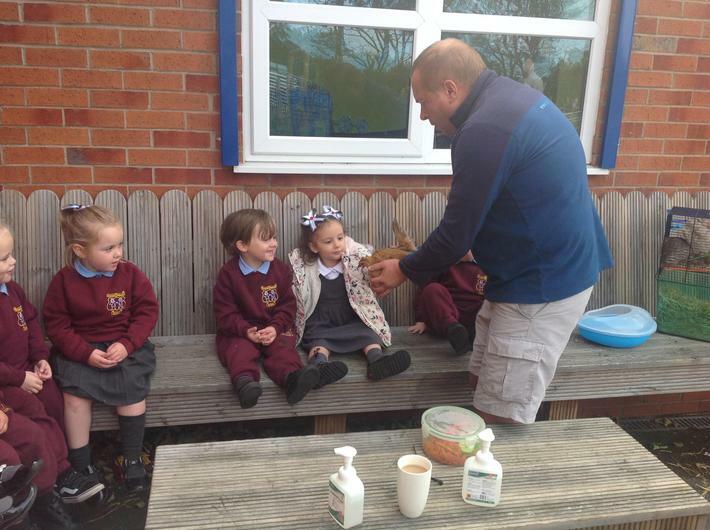 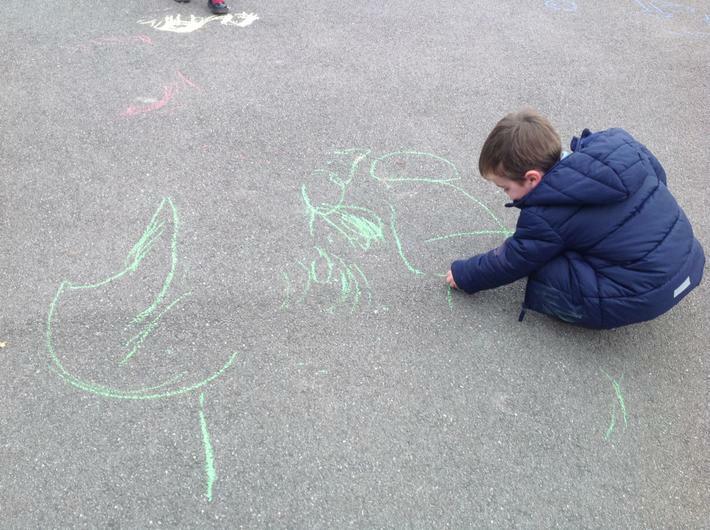 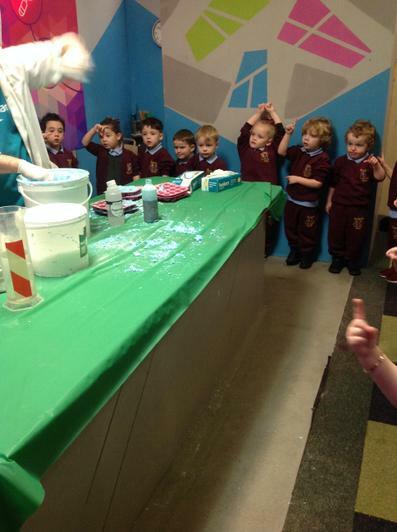 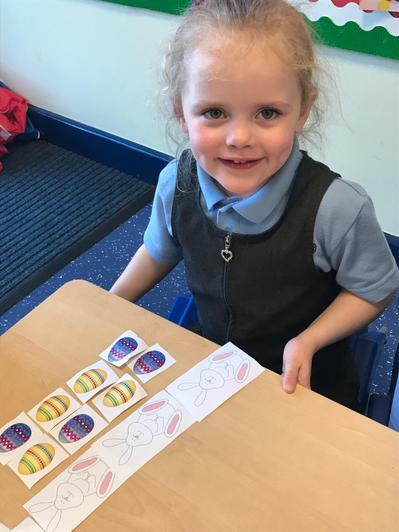 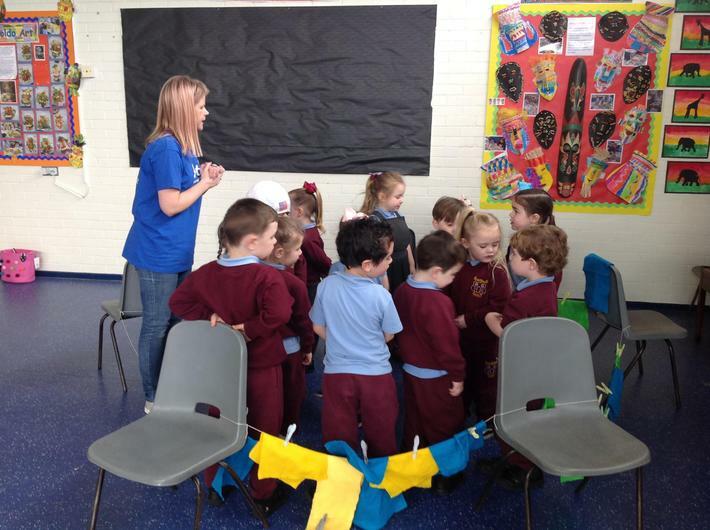 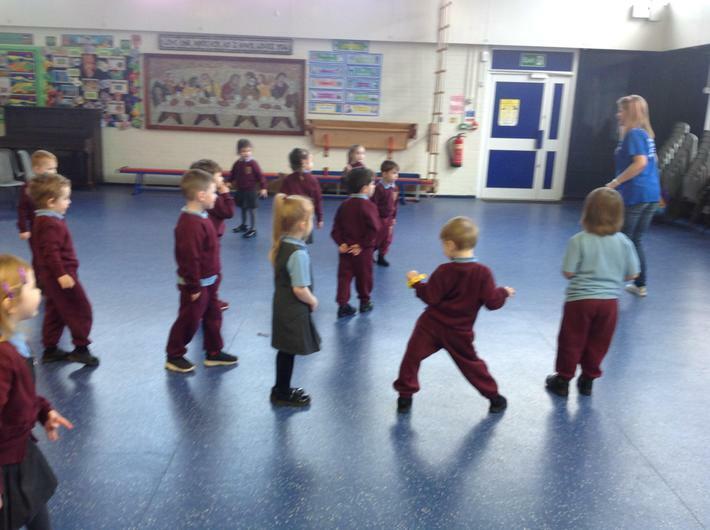 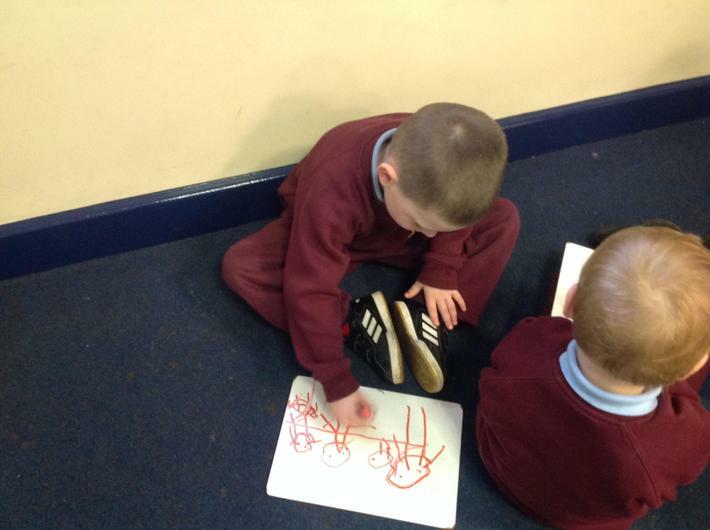 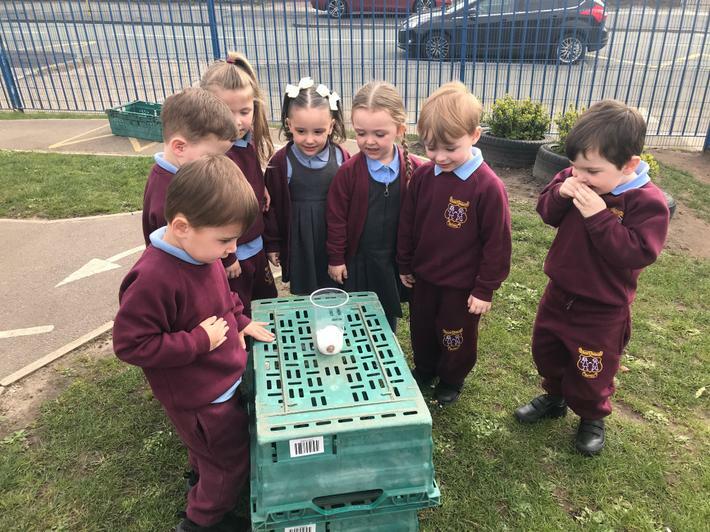 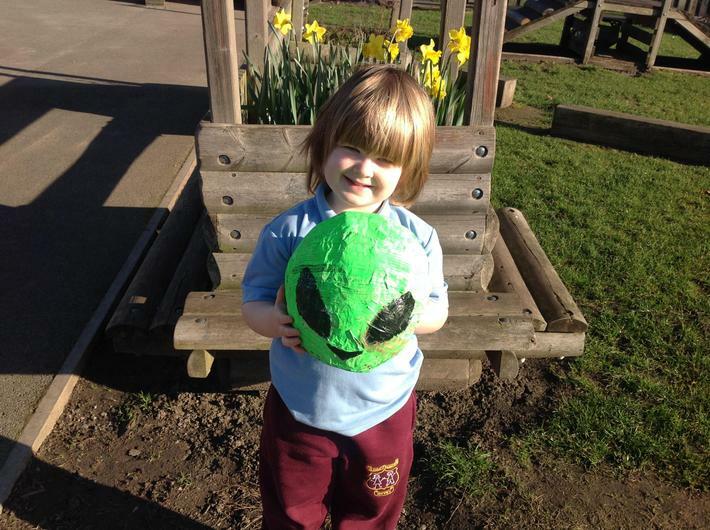 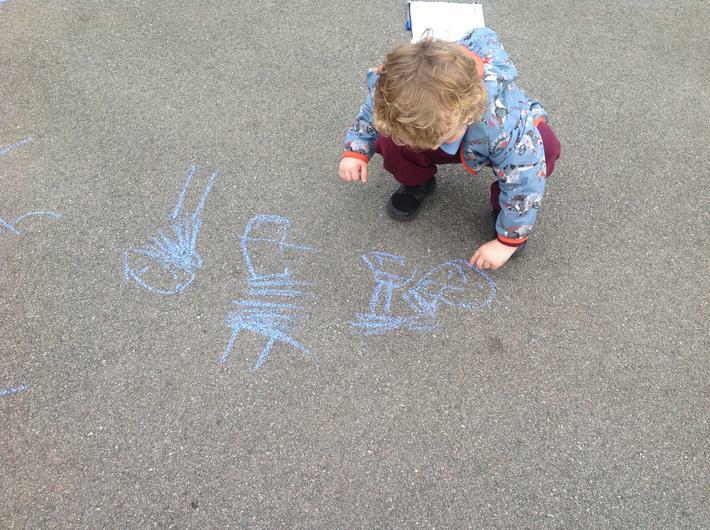 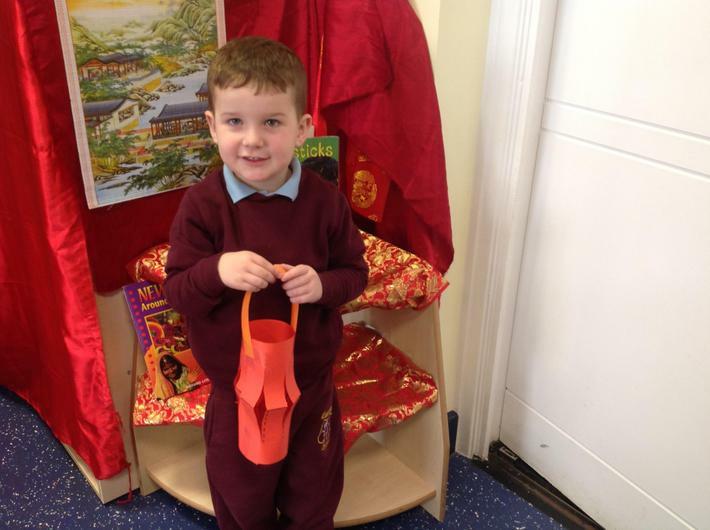 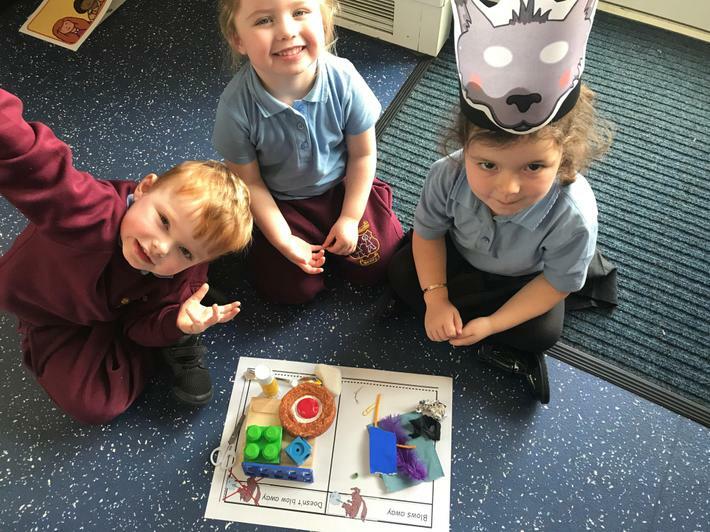 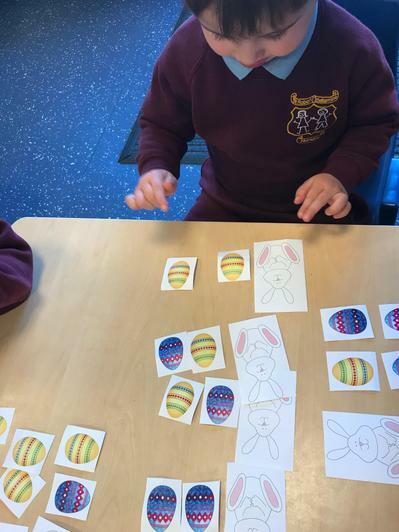 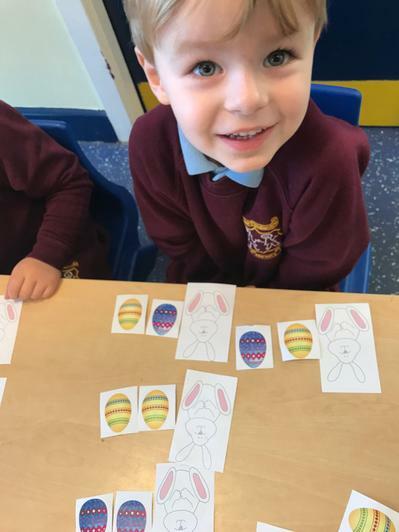 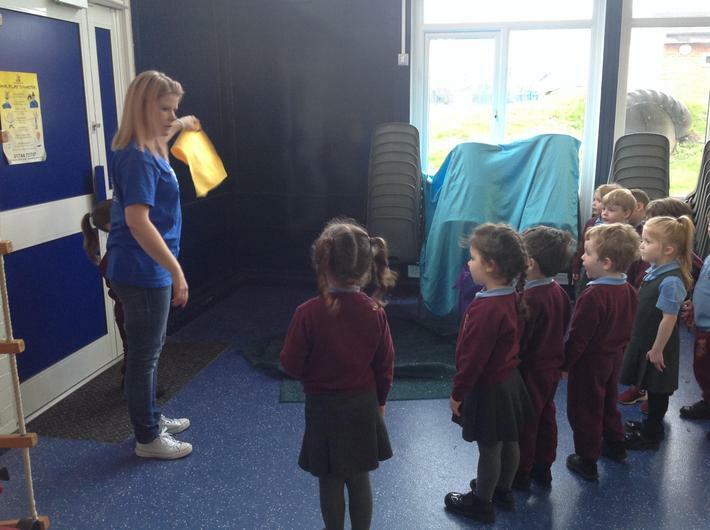 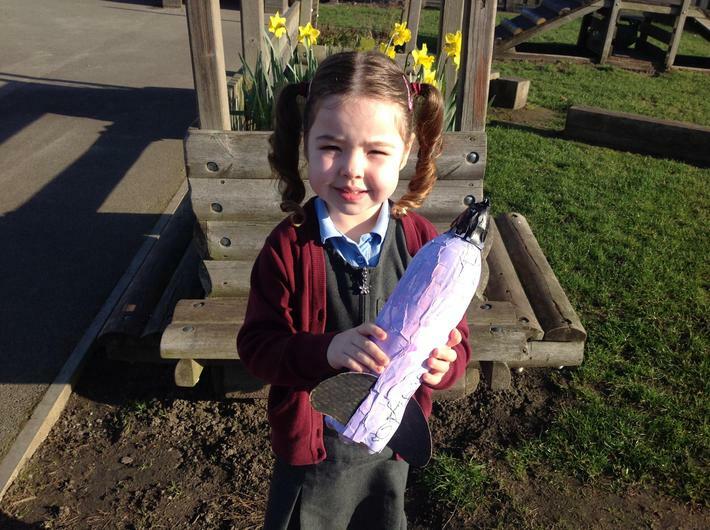 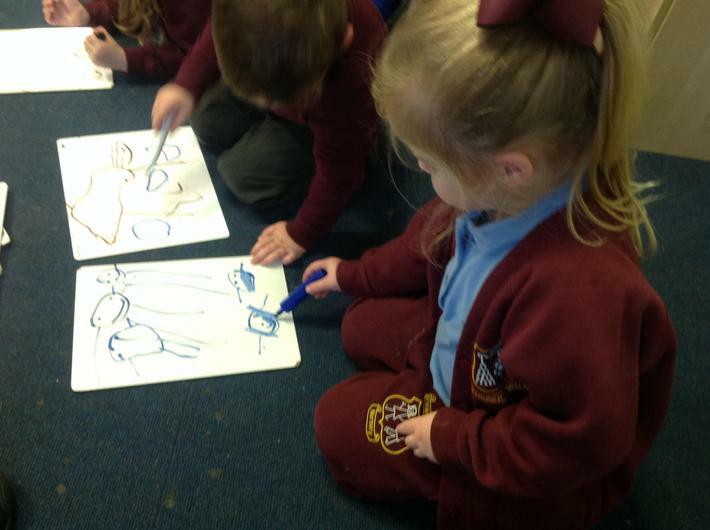 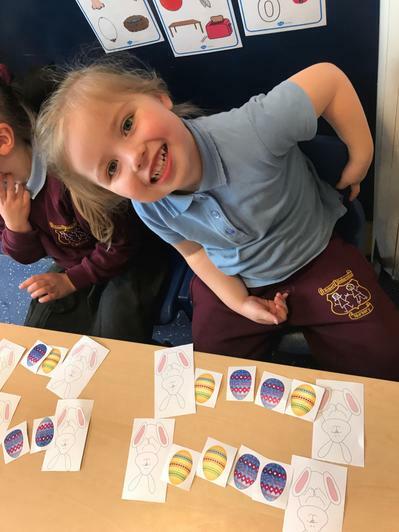 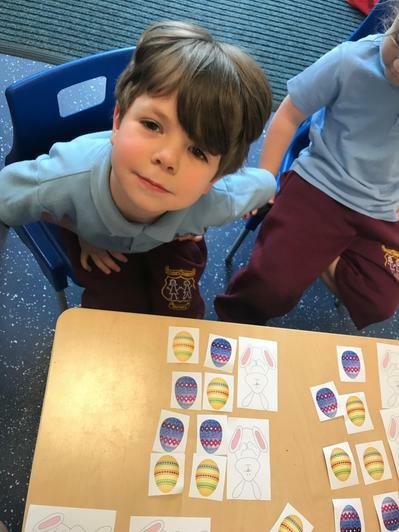 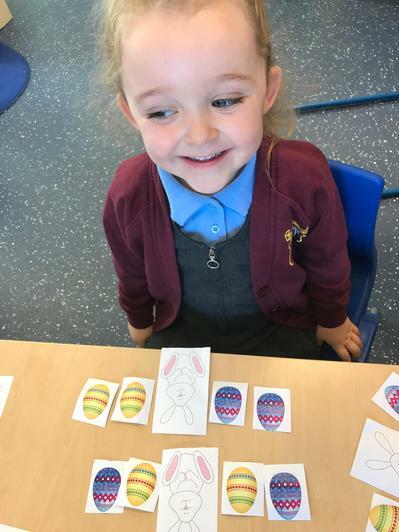 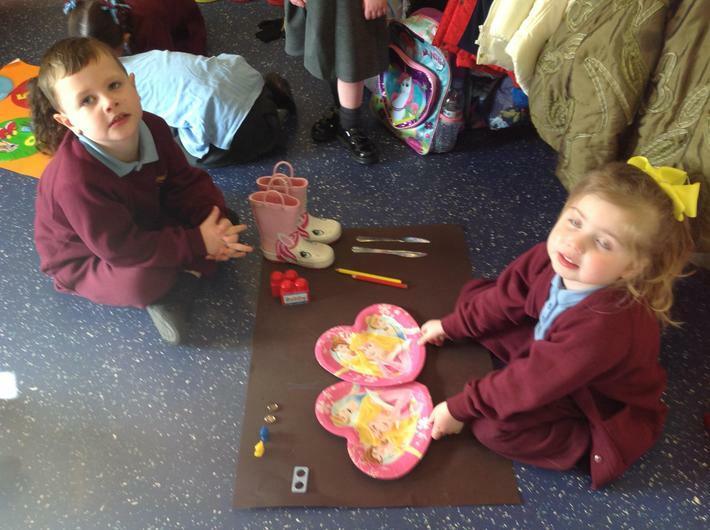 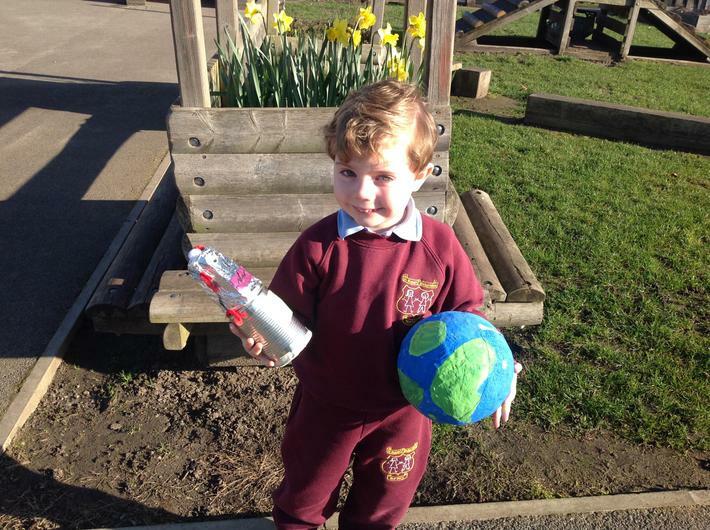 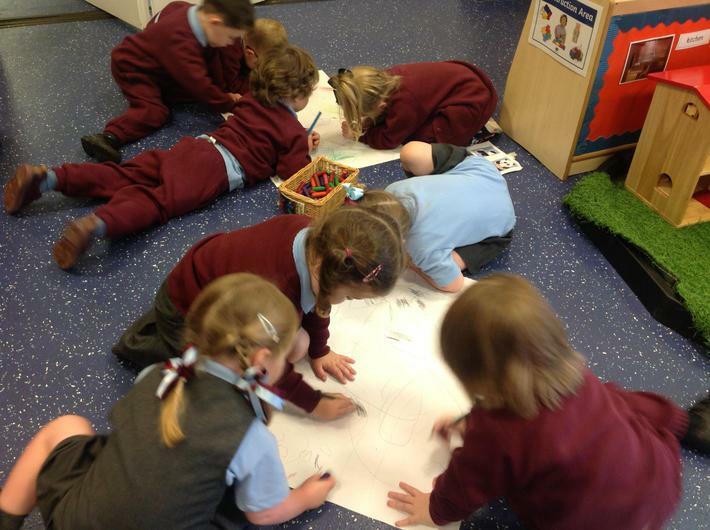 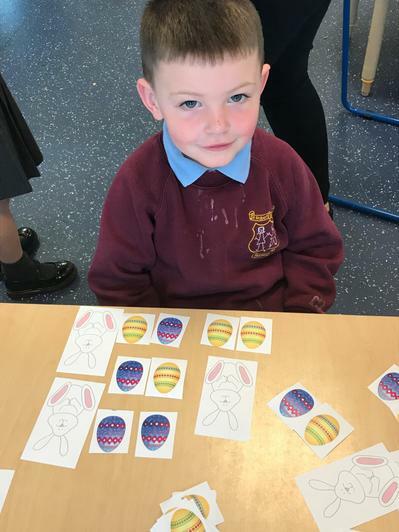 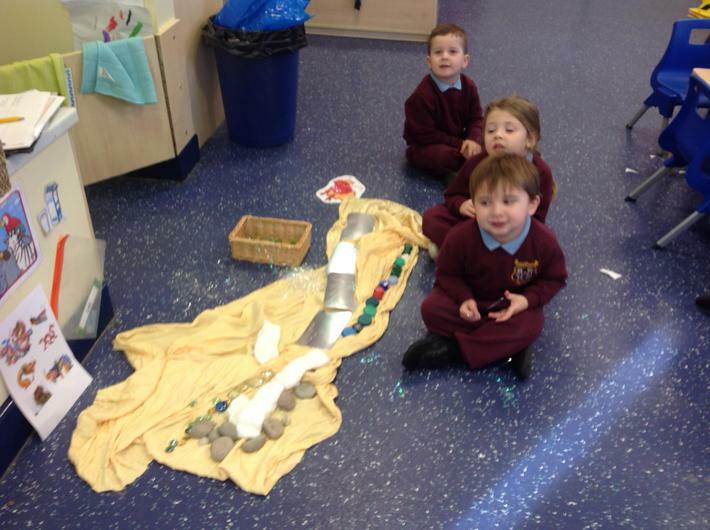 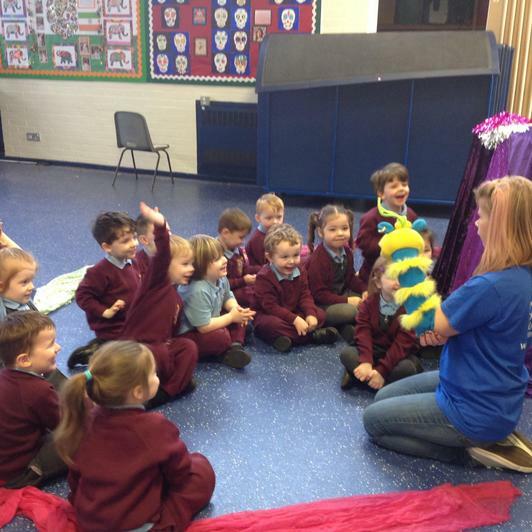 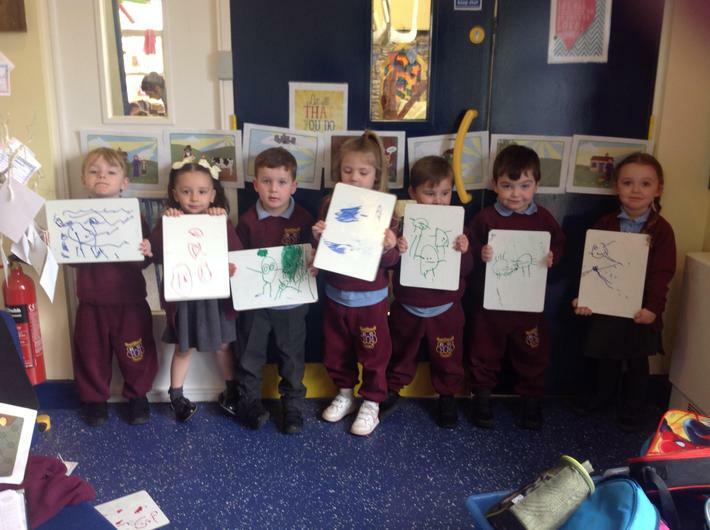 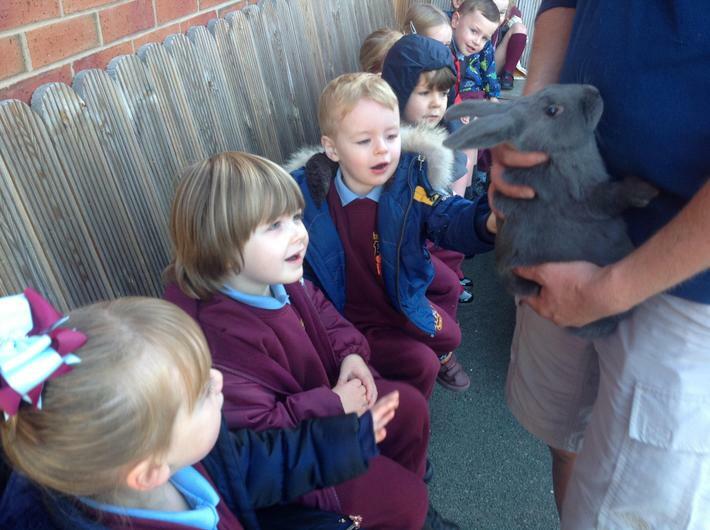 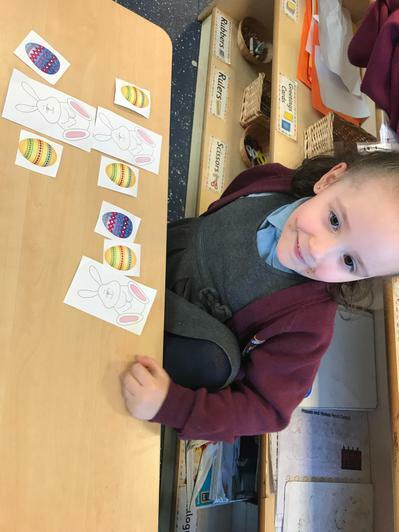 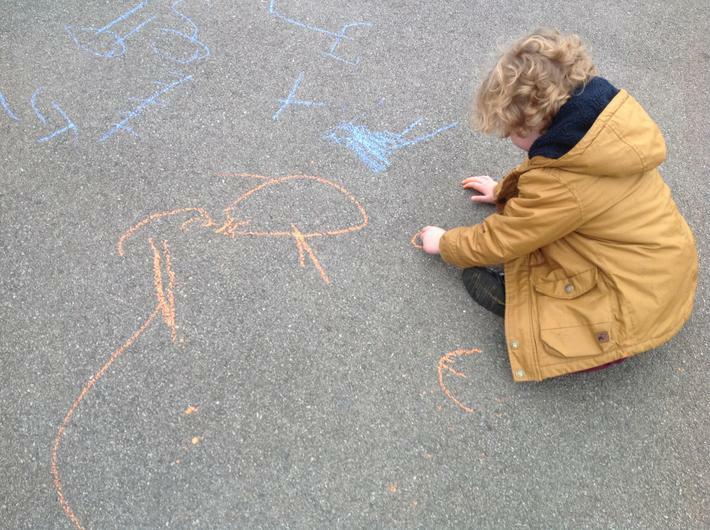 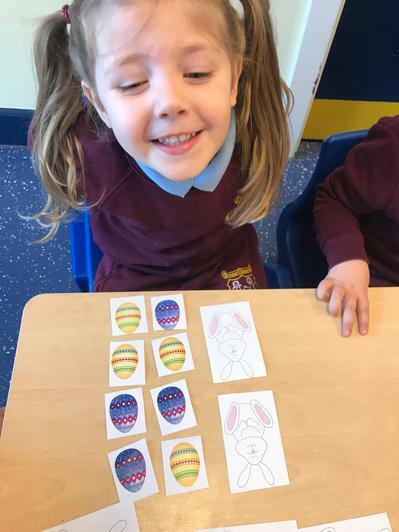 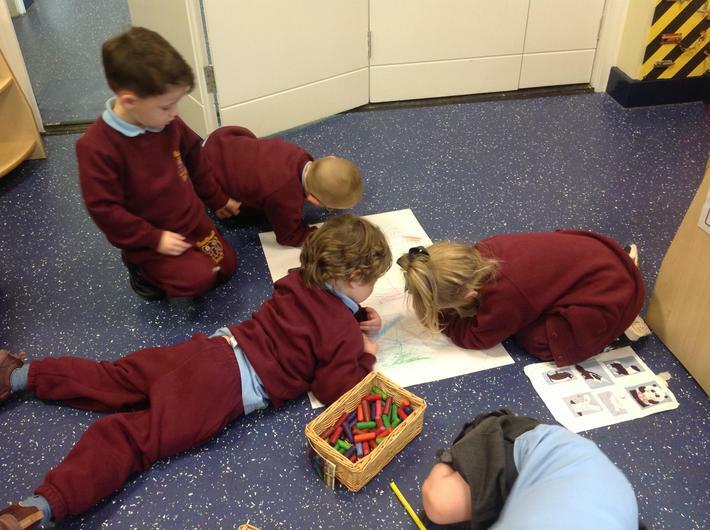 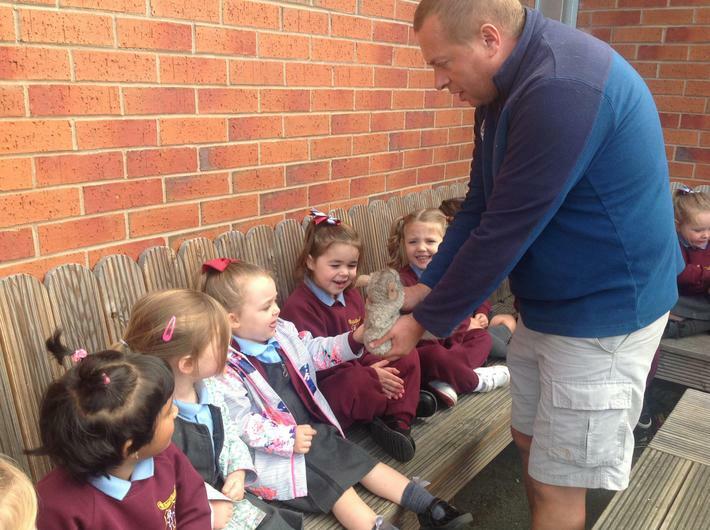 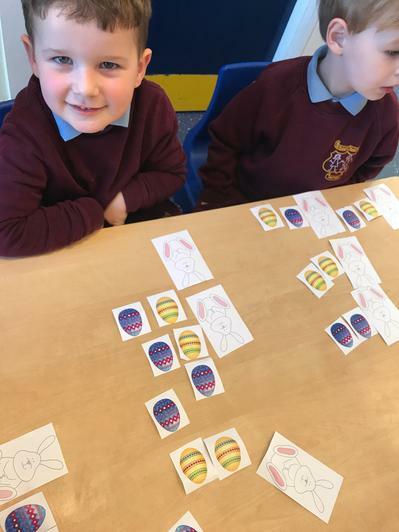 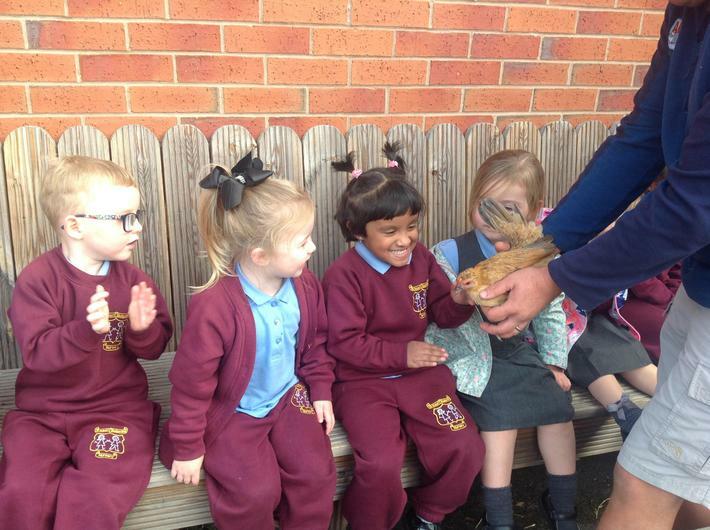 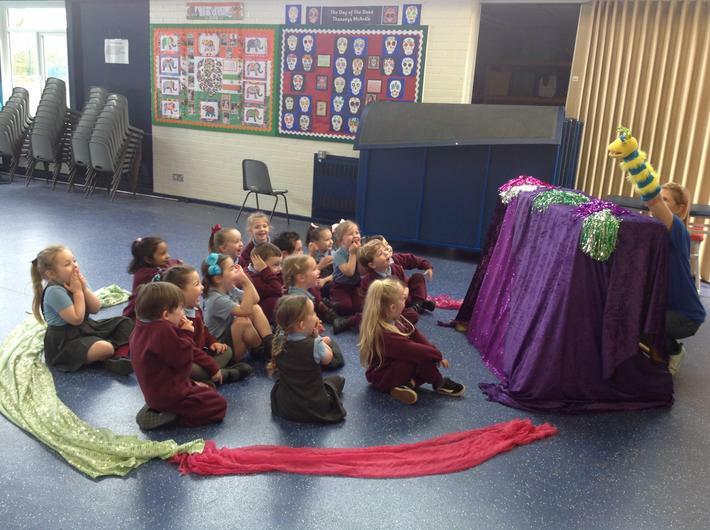 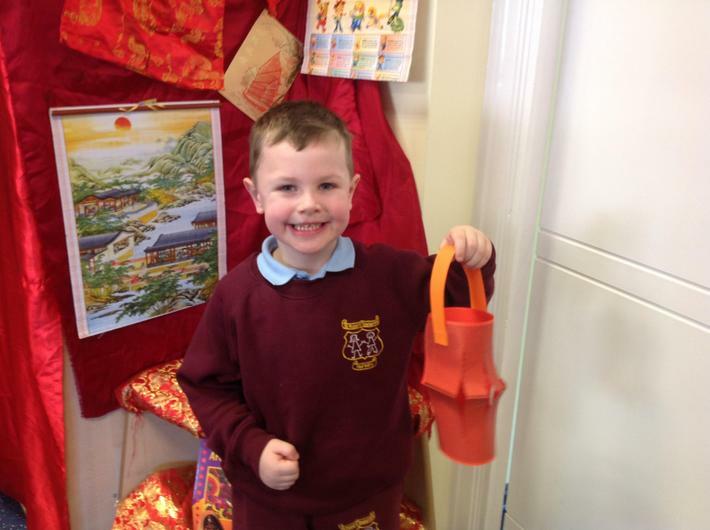 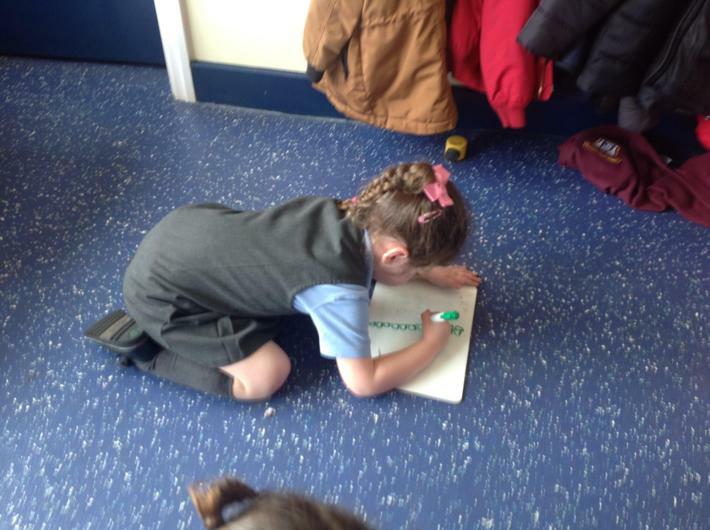 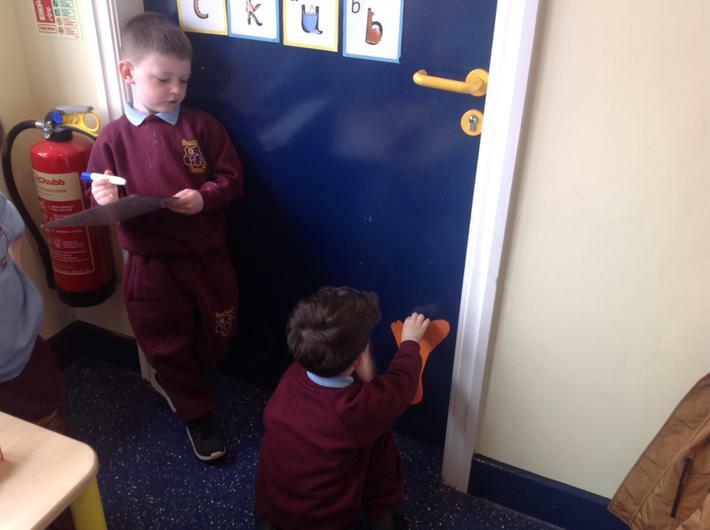 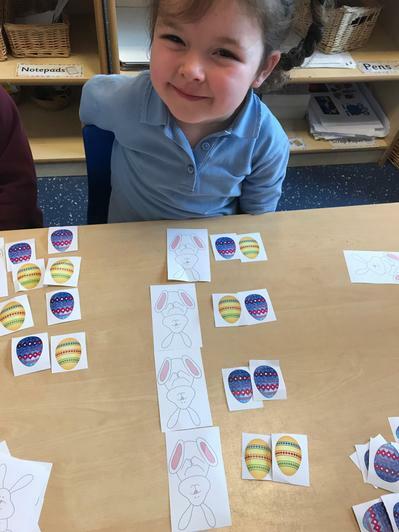 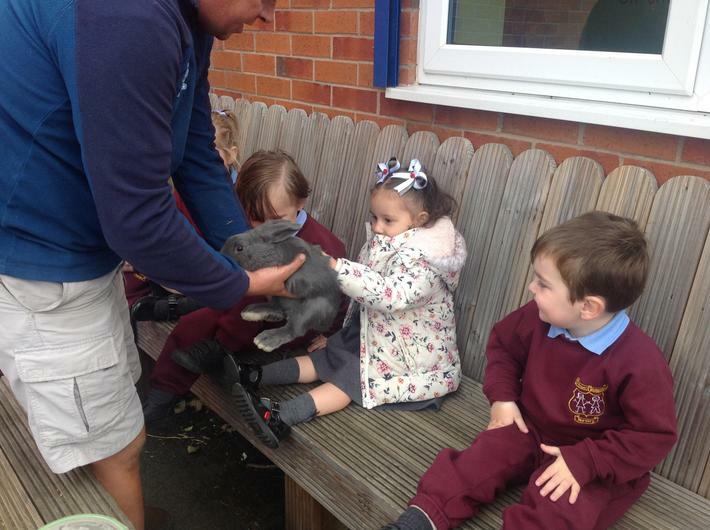 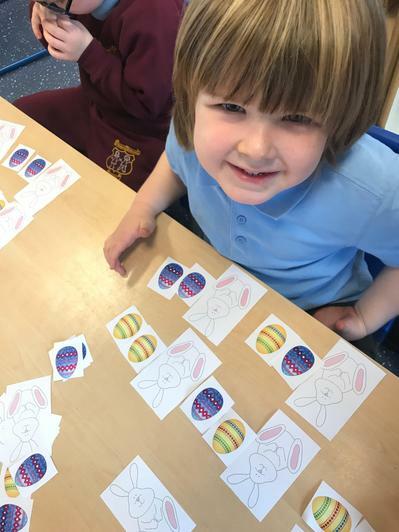 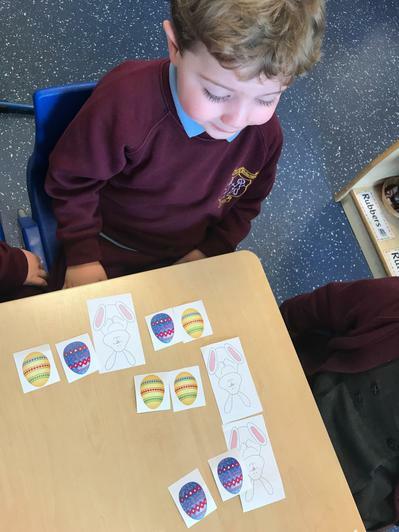 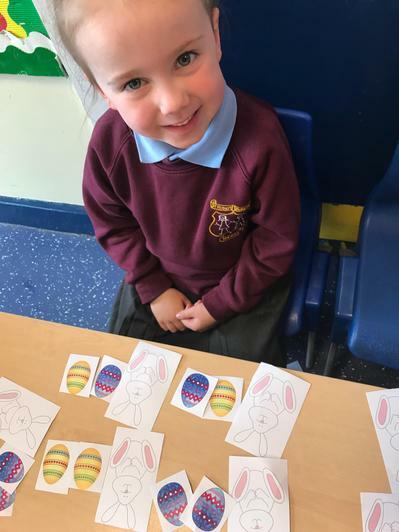 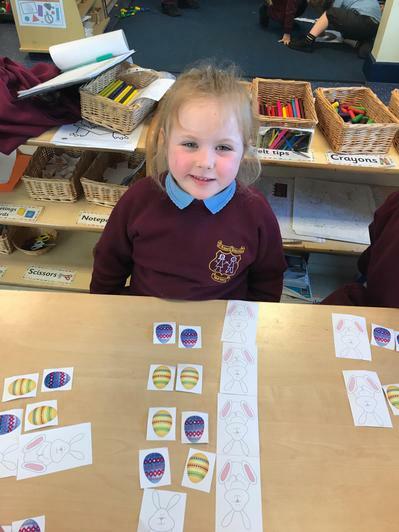 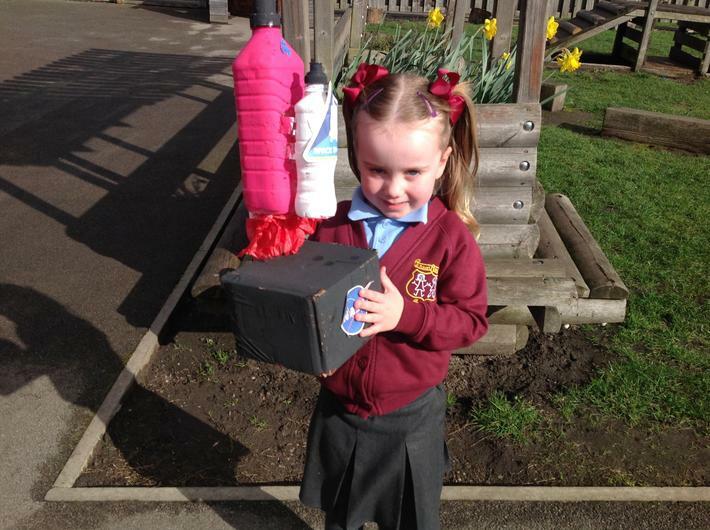 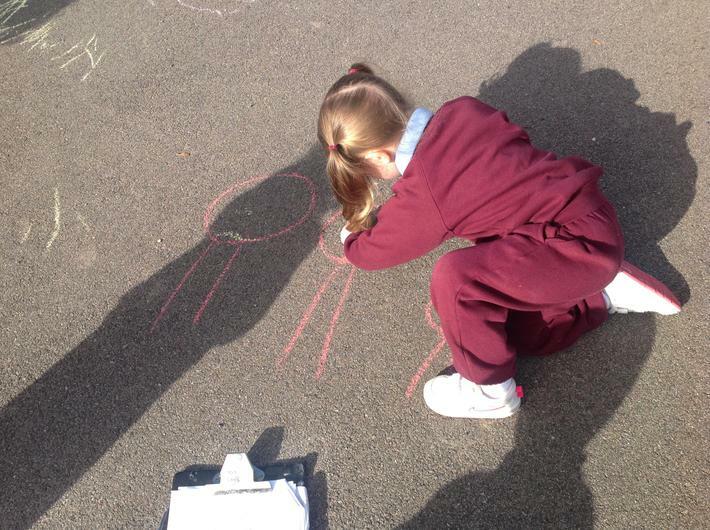 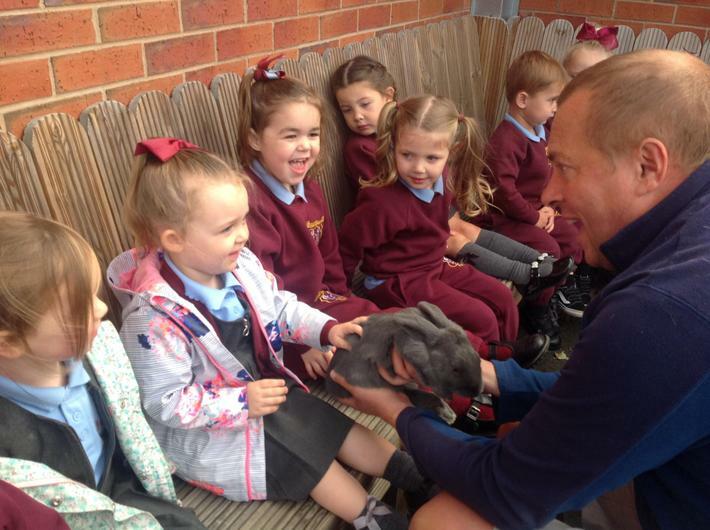 The children were challenged to find all the different possibilities for the Easter bunny.